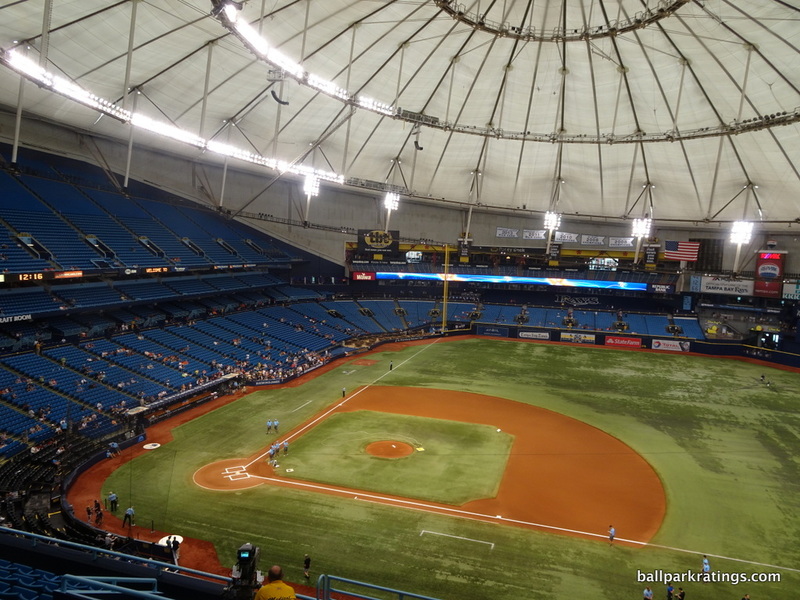 I am not going to do full, in-depth reviews for the three non-ballpark ballparks, if you will, Tropicana Field, Rogers Centre, and the Oakland Coliseum. 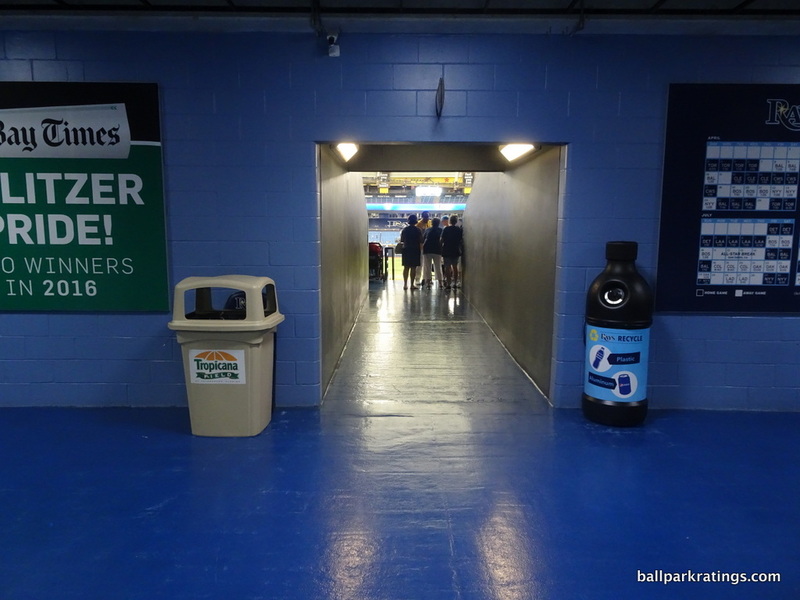 It’s a waste of time to compare these three to the post-1991 ballparks, so the tone is different here. 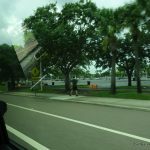 The following pages are in the format of a photo essay, where I give my brief thoughts. 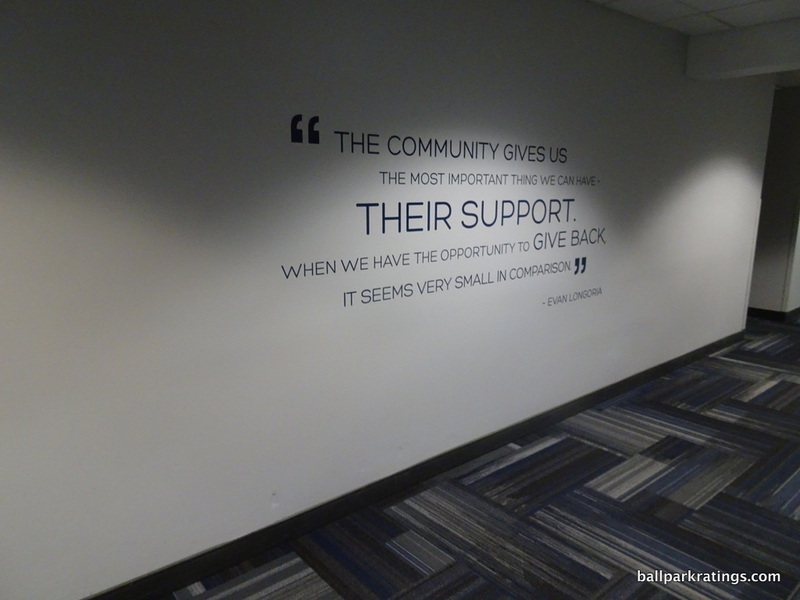 I also included a small blurb below. 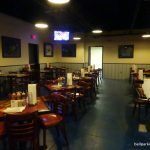 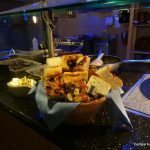 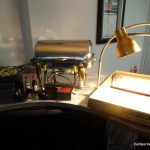 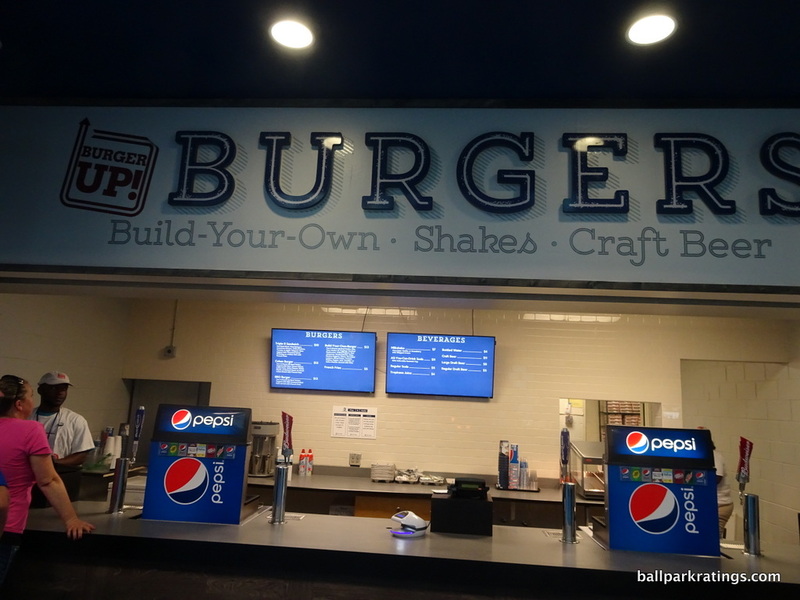 It’s not done in the same vein as the long, researched, comprehensive reviews. 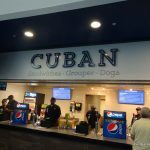 Enjoy this in the spirit in which it’s offered. 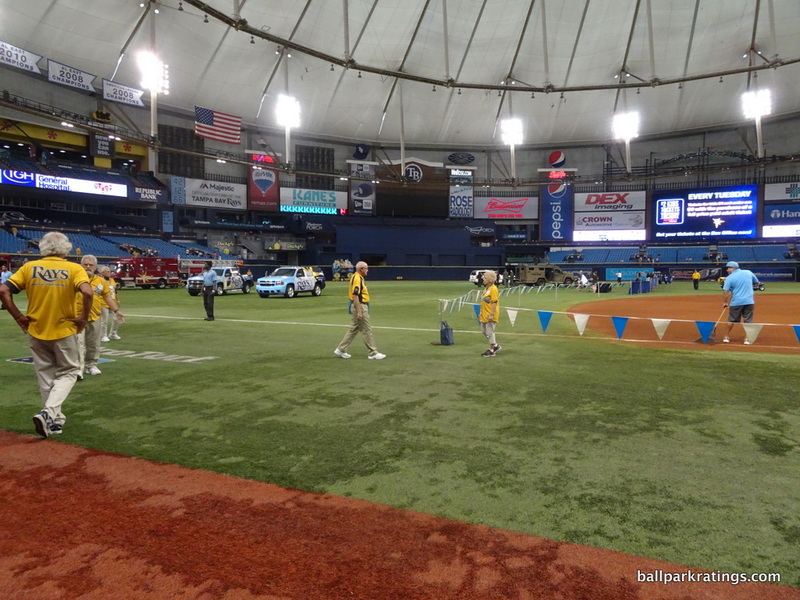 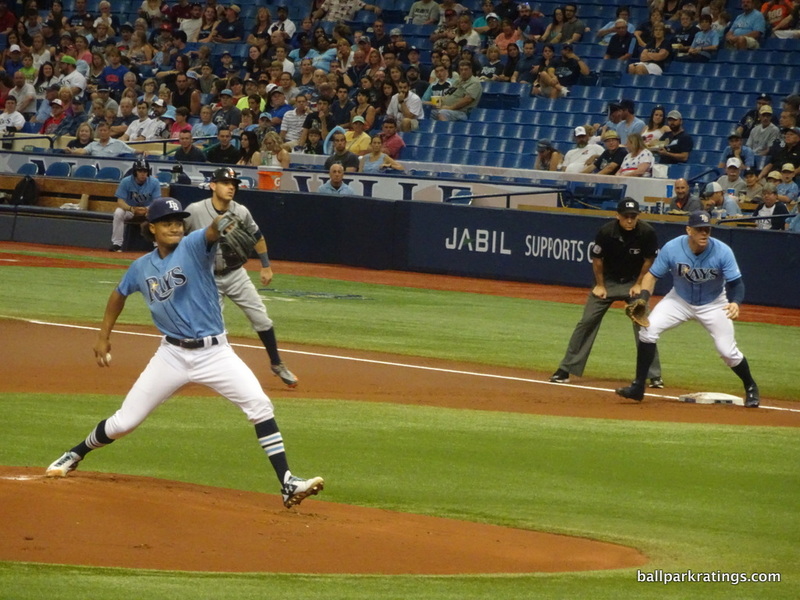 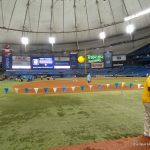 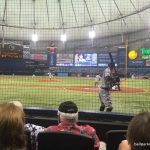 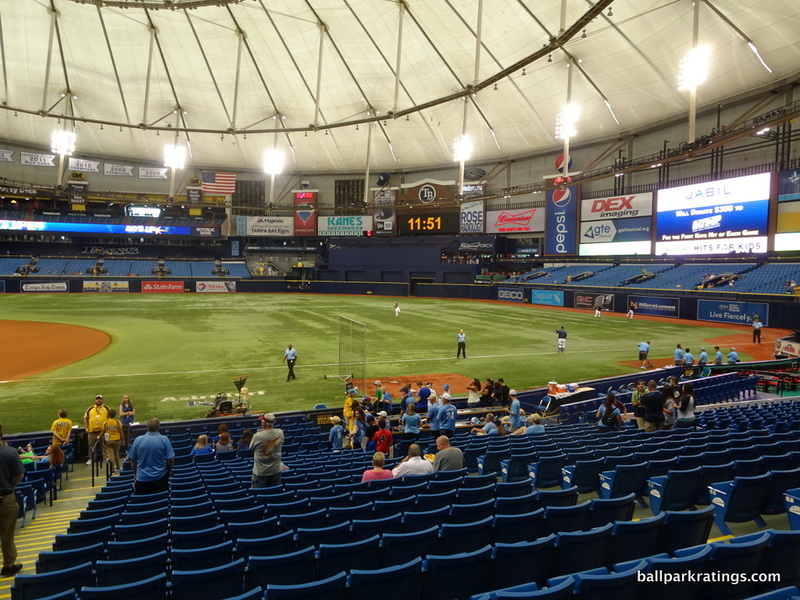 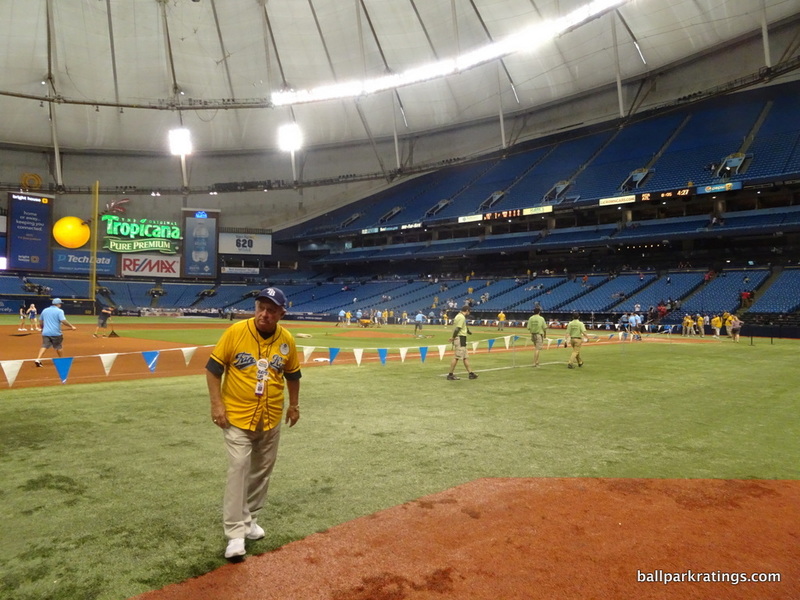 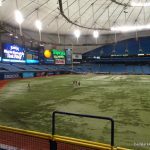 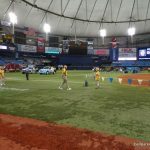 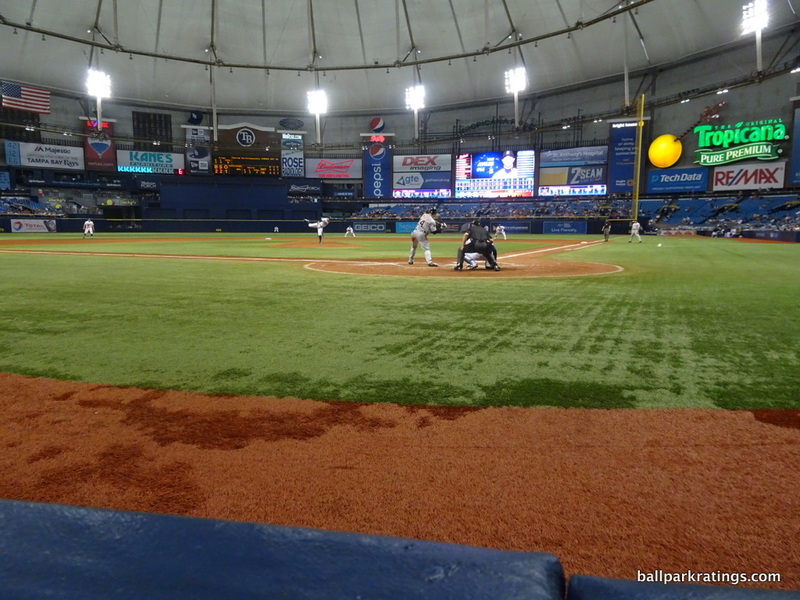 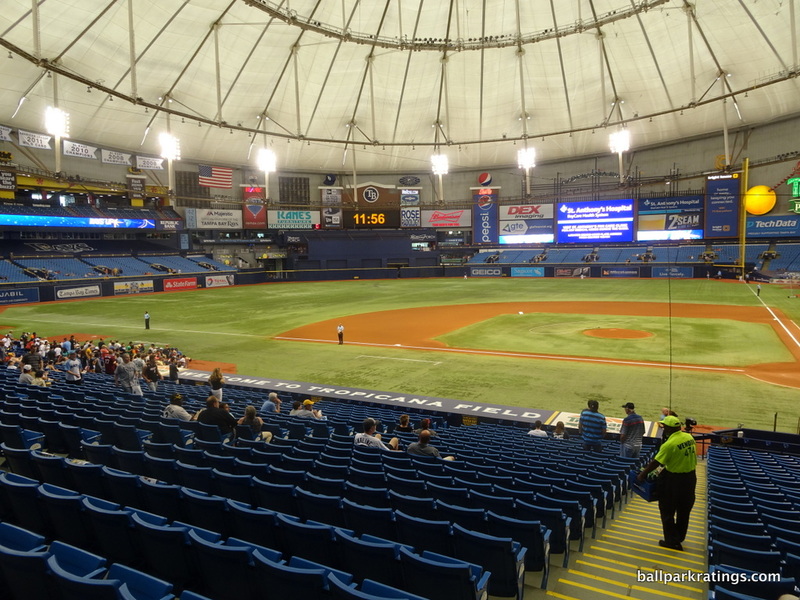 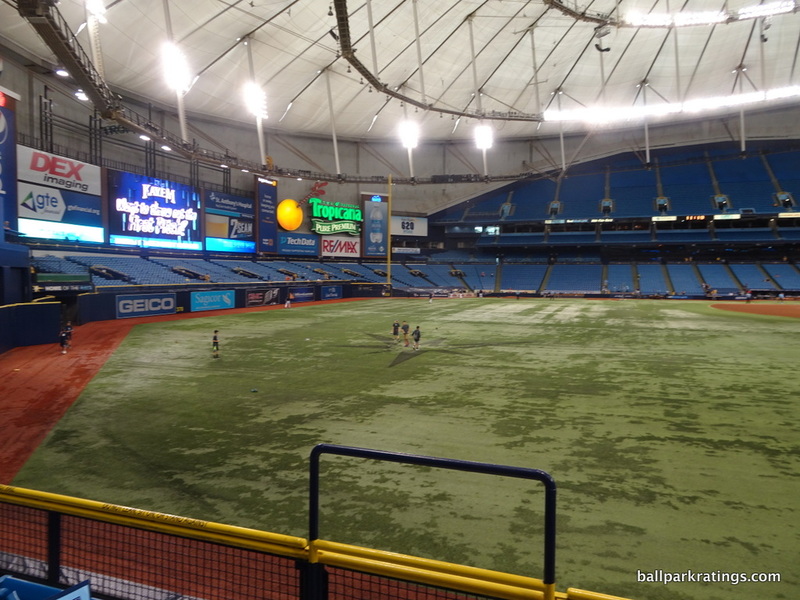 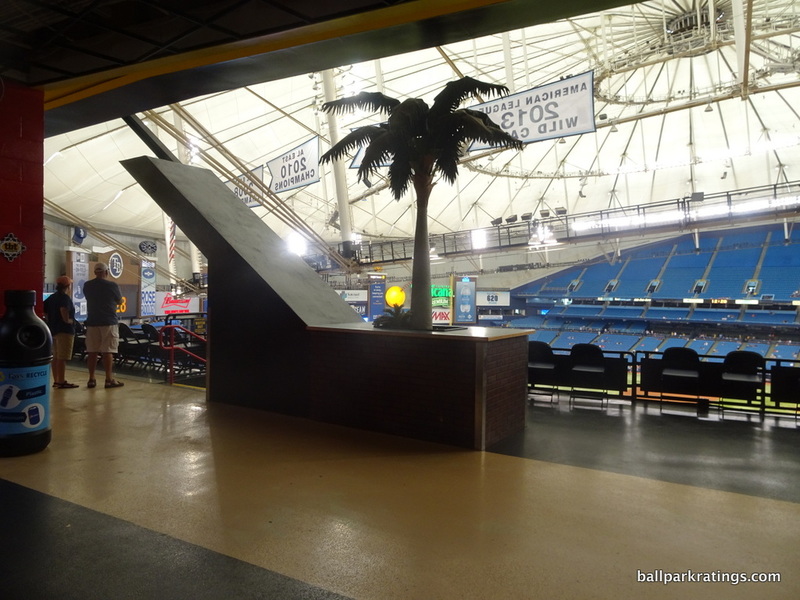 Despite obvious shortcomings in setting, aesthetics, and functionality which put it near the very bottom of baseball, I had fun at Tropicana Field. 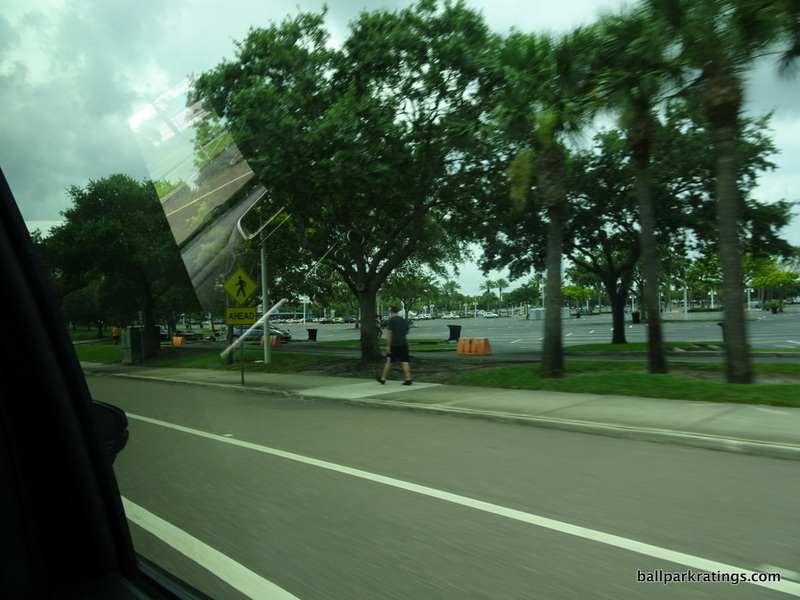 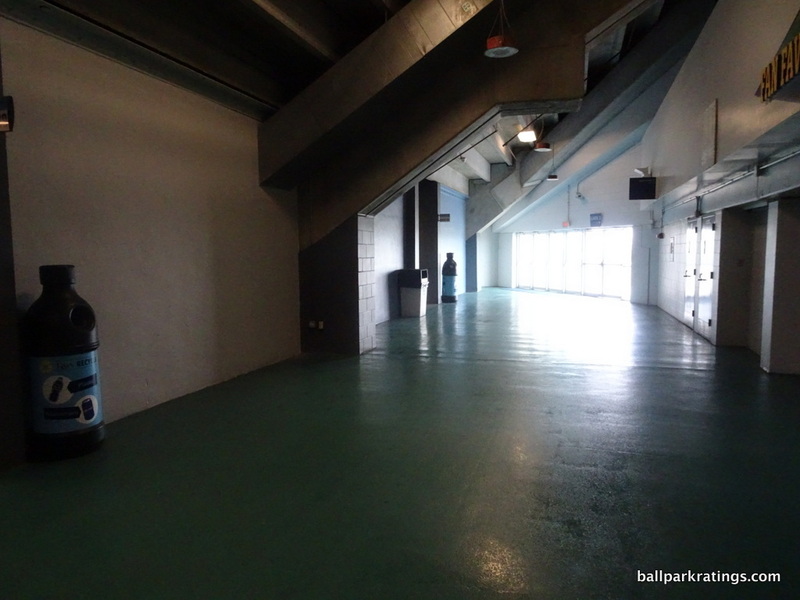 And if you’re a ballpark trekker who likes to arrive two hours before the game and take plenty of pictures, you will too. 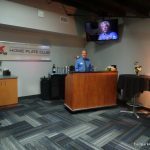 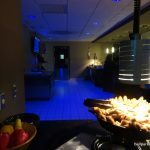 The ushers, supervisors, and even management will take notice, and ensure you have a memorable time. 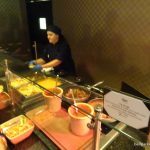 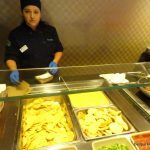 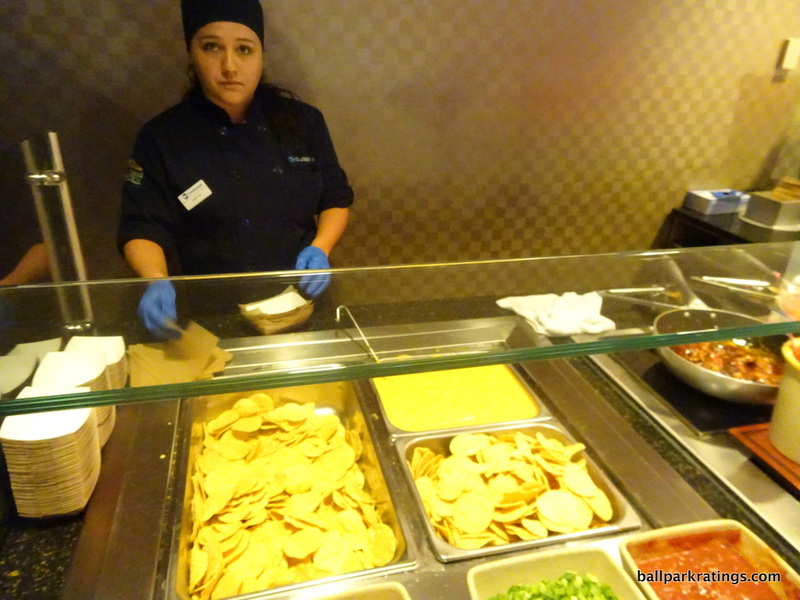 I don’t include customer service in these comprehensive analyses, because it’s so anecdotal. 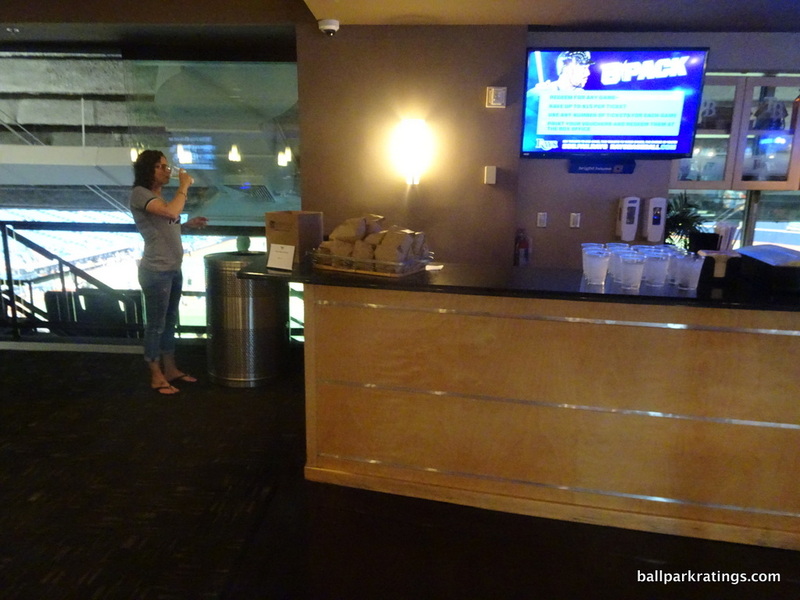 I don’t get the sense this is just anecdotal. 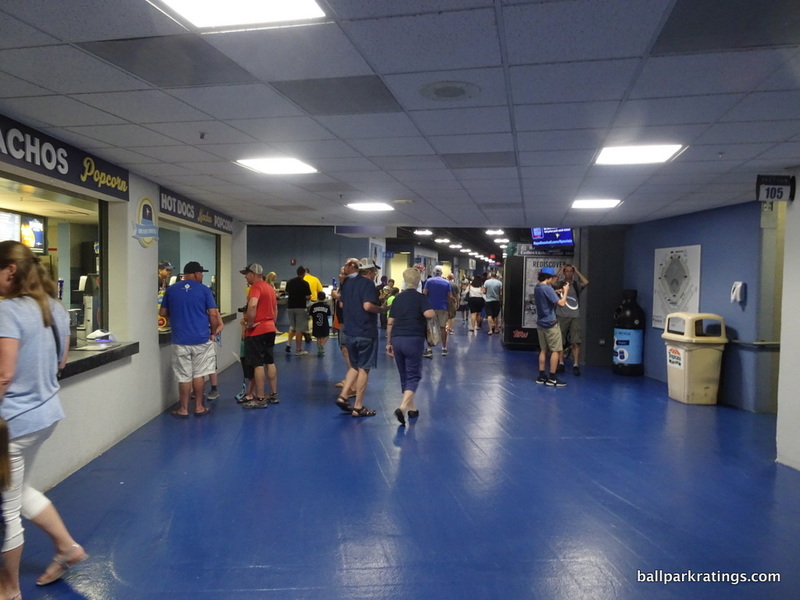 They don’t get a lot of fans arriving two hours before the game to document their ballpark for a website, so they are genuinely interested and excited to see someone taking pictures. 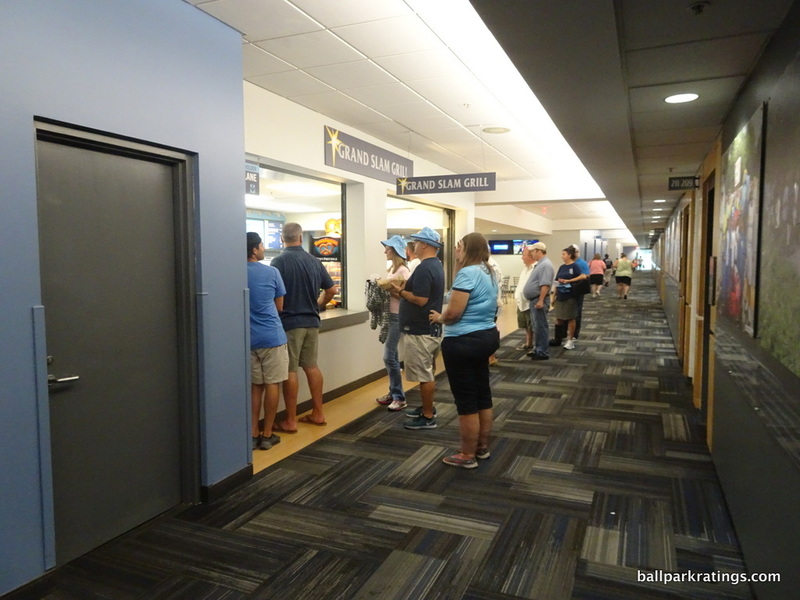 I’ll admit this is partially due to my tickets in the Home Plate Club on the first day, but this does absolutely nothing to diminish the noteworthiness of the experience. 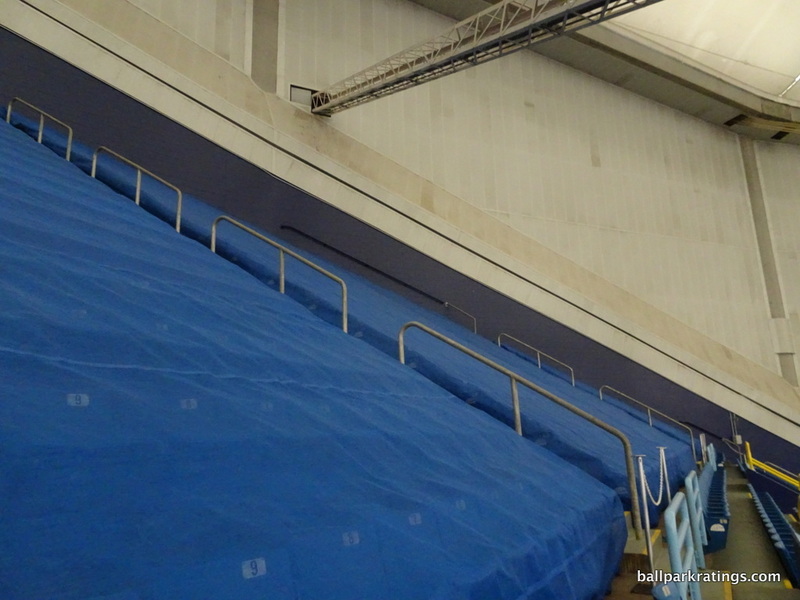 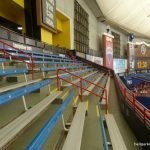 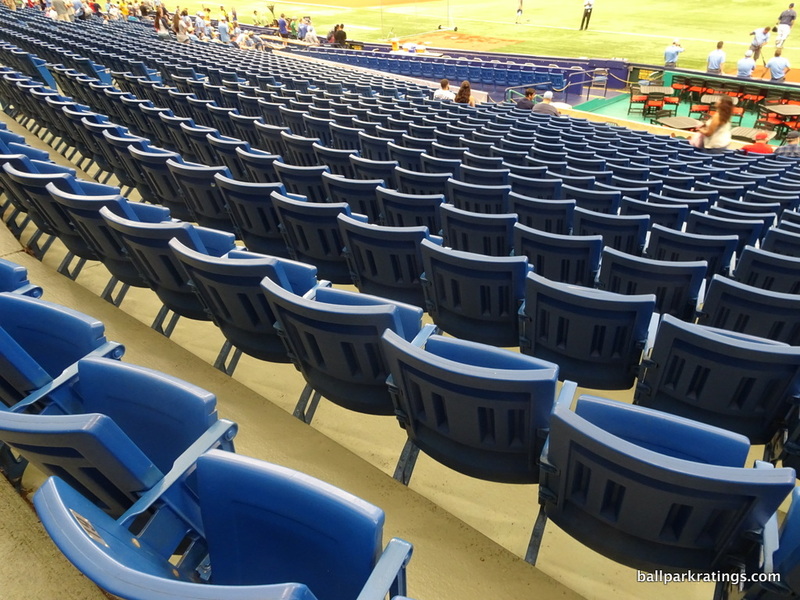 I often sit in these sections, and I haven’t experienced anything like this. 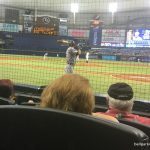 I don’t mention this website unless asked, and I was asked early on here. 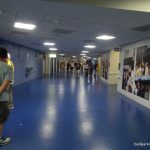 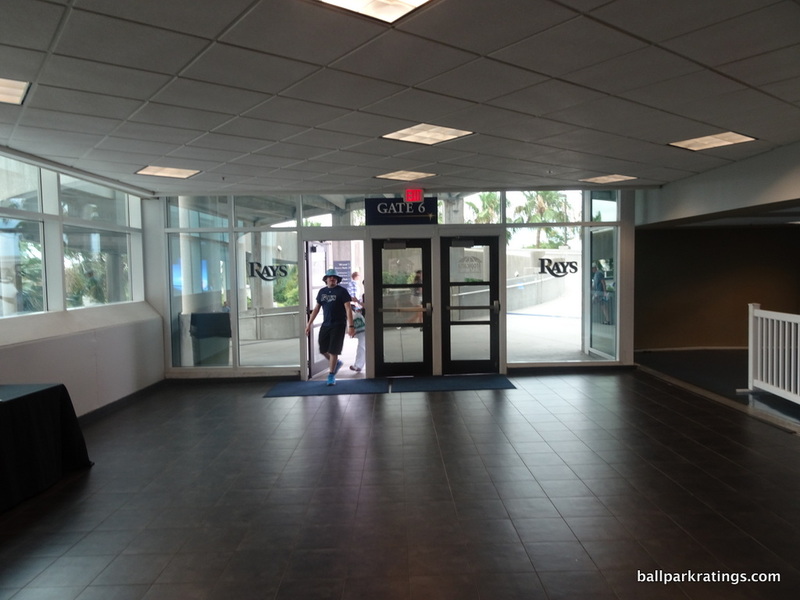 Only a handful of fans arrived at the club entrance this early, so I stuck out. 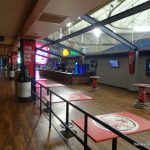 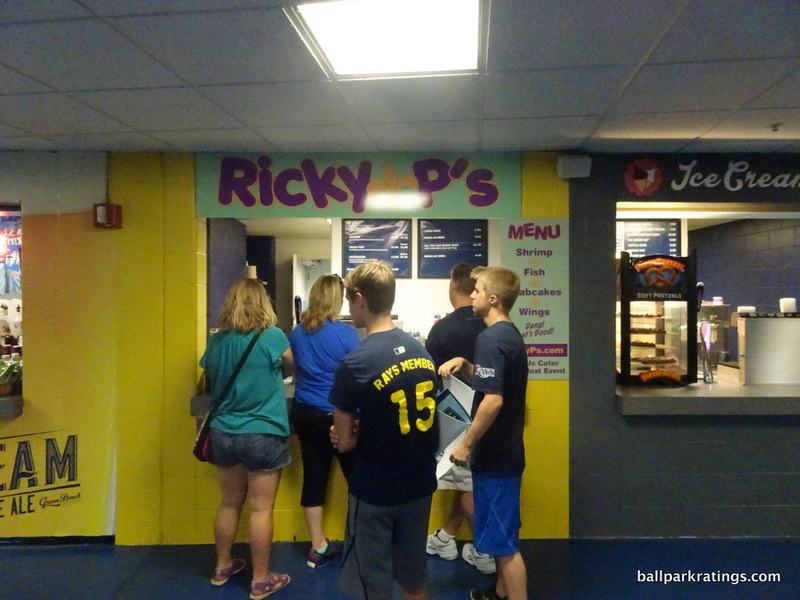 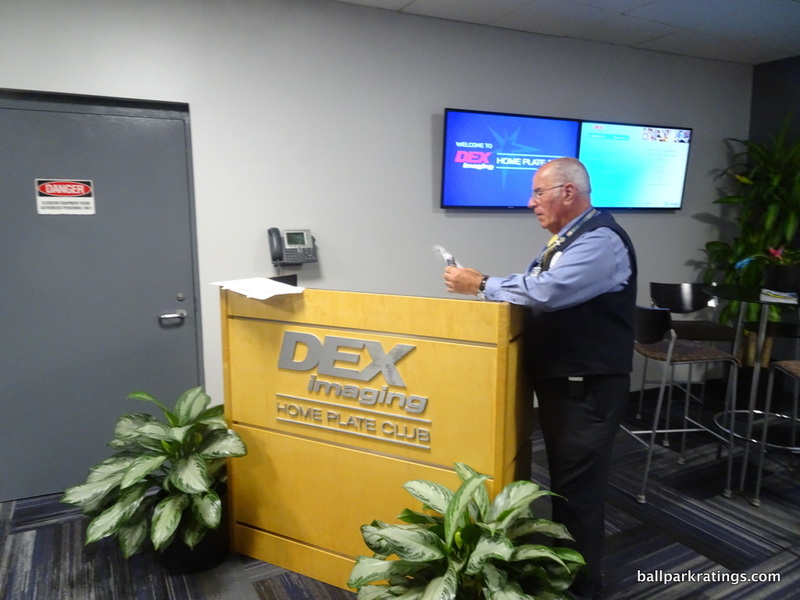 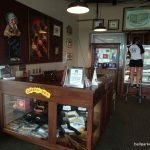 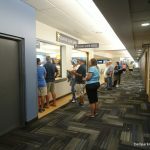 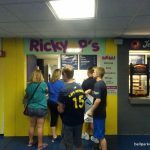 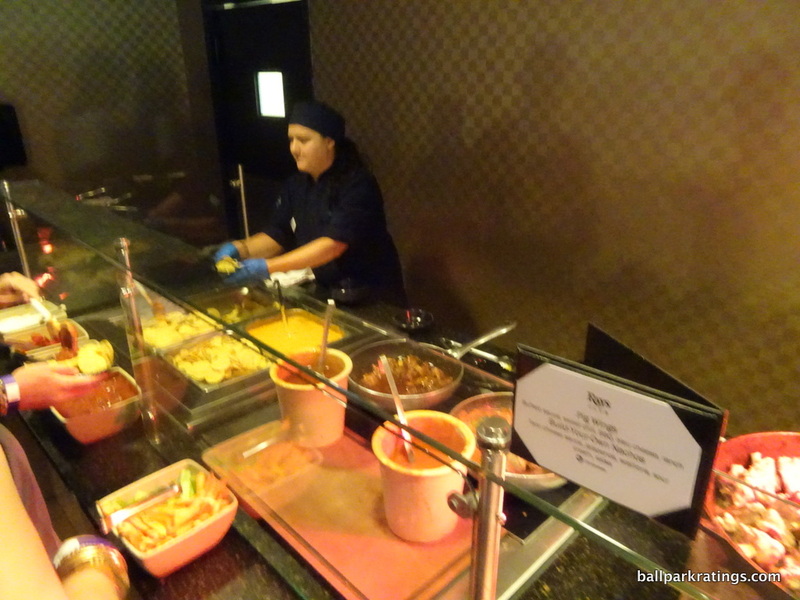 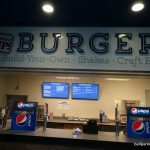 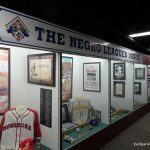 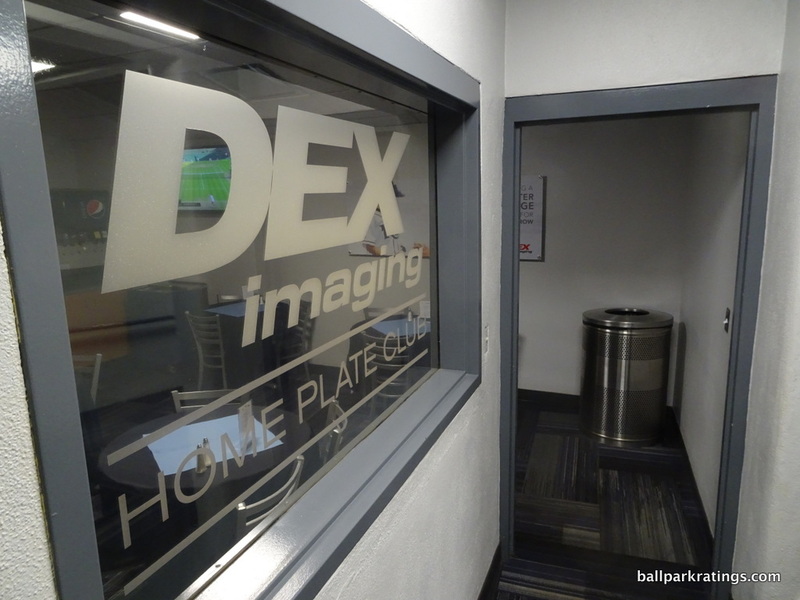 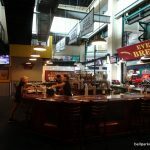 No less than half a dozen ballpark employees described their favorite parts of the ballpark and how I should go about exploring it. 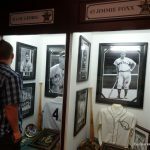 They were all honestly interested in my website and what they could do to make my experience a memorable one. 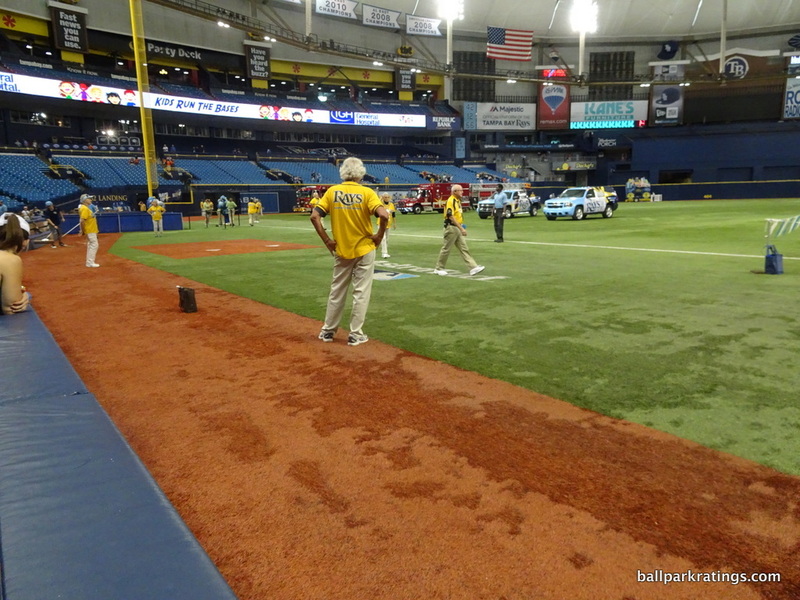 Art, the usher you might see on TV behind home plate, was especially proactive and personable. 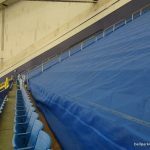 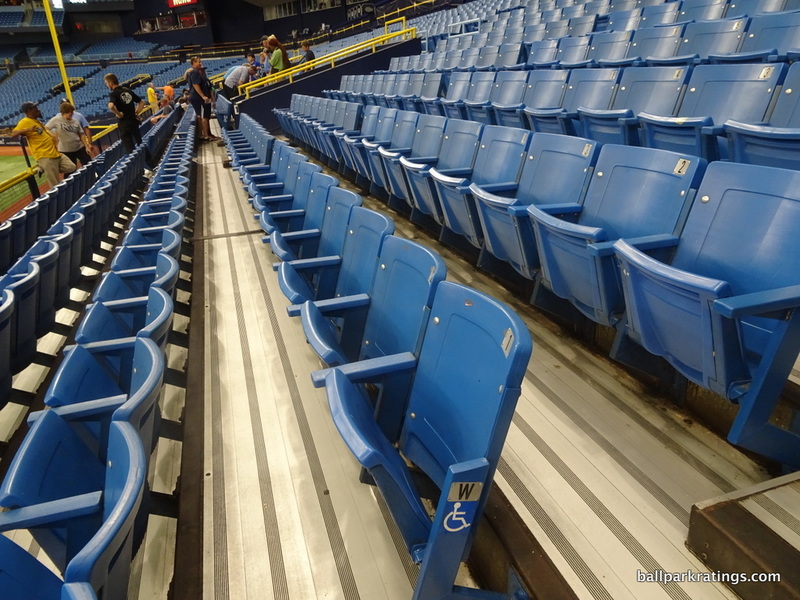 While I got the sense some other club season ticket holders were getting pissy (to be frank), he insisted we a take a seat in the very front row. 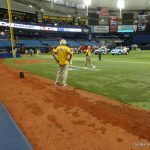 He made it a point that I meet the manager of premium services, Craig Champagne, and another director of ballpark operations. 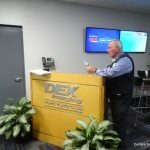 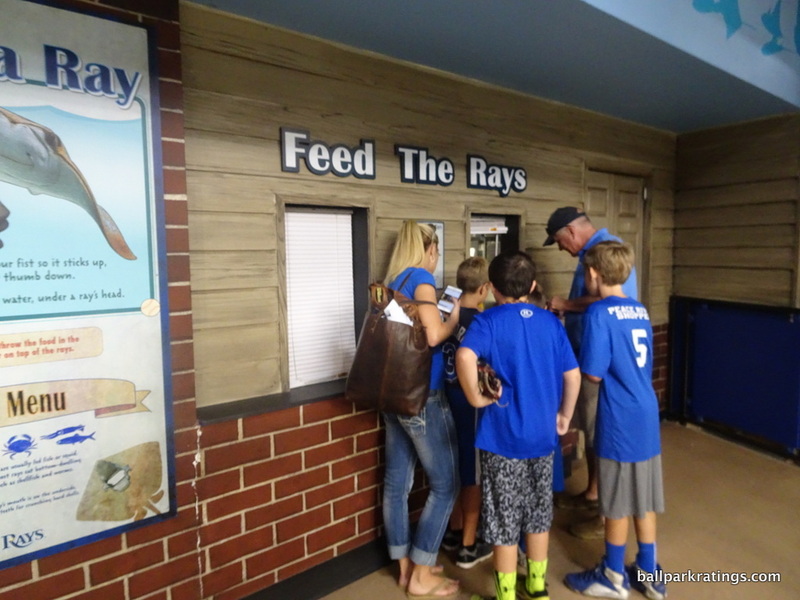 This was the friendliest and most proactive staff I’ve ever encountered in the big leagues. 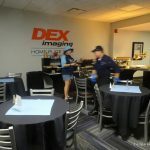 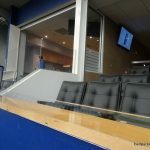 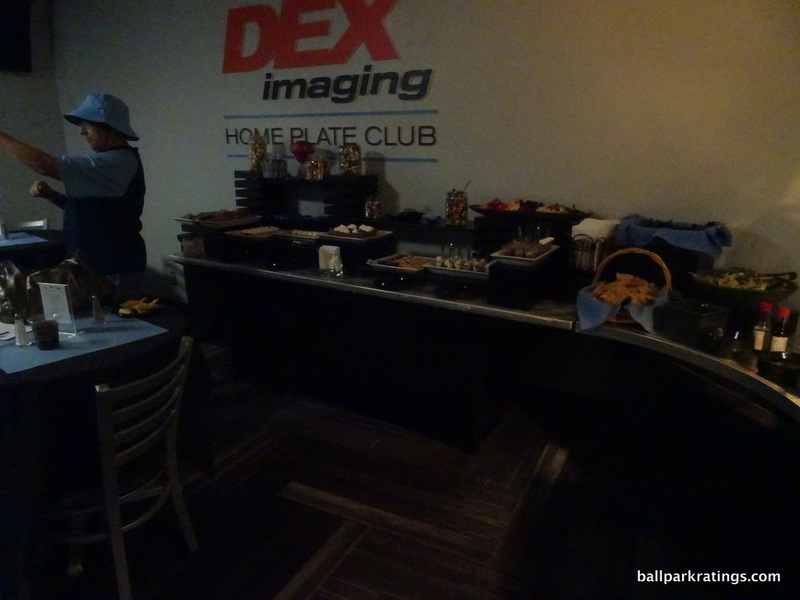 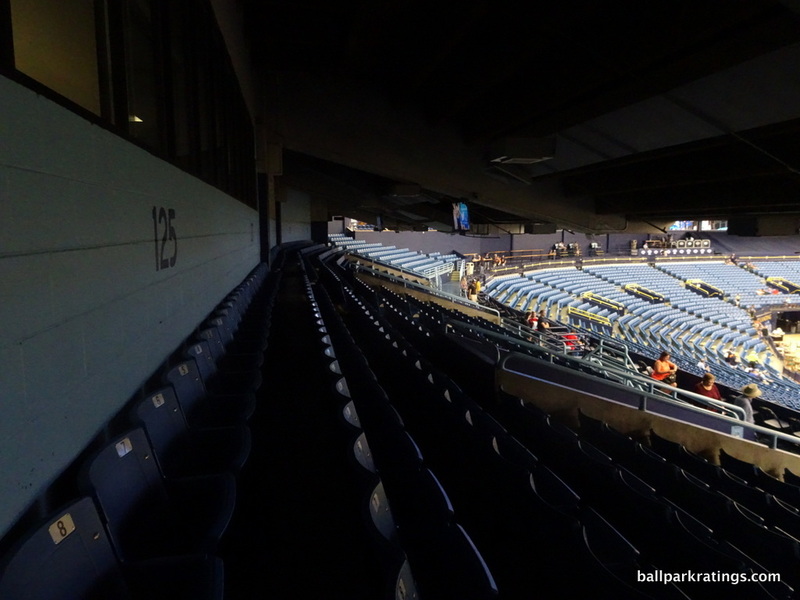 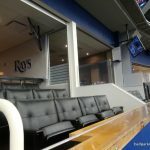 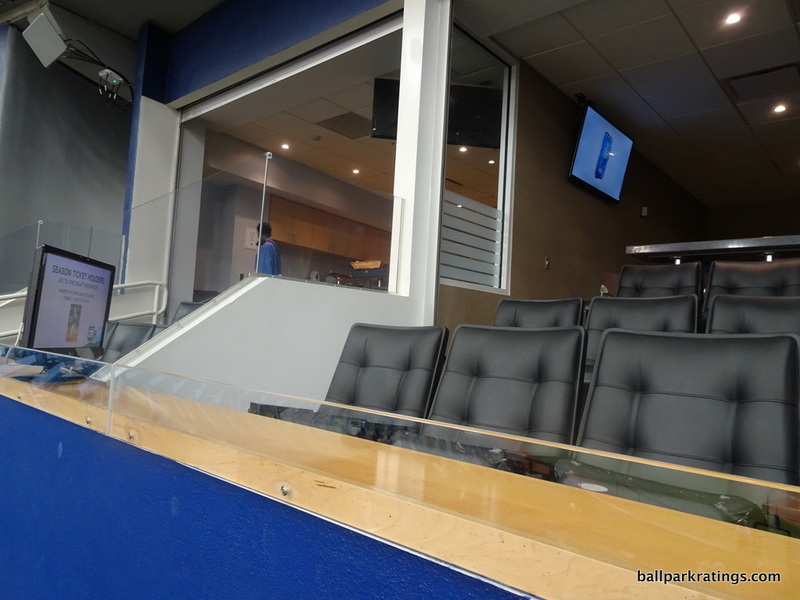 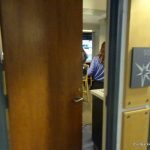 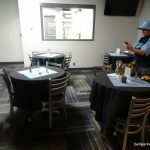 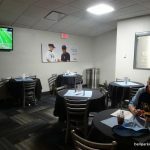 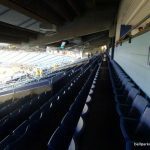 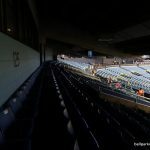 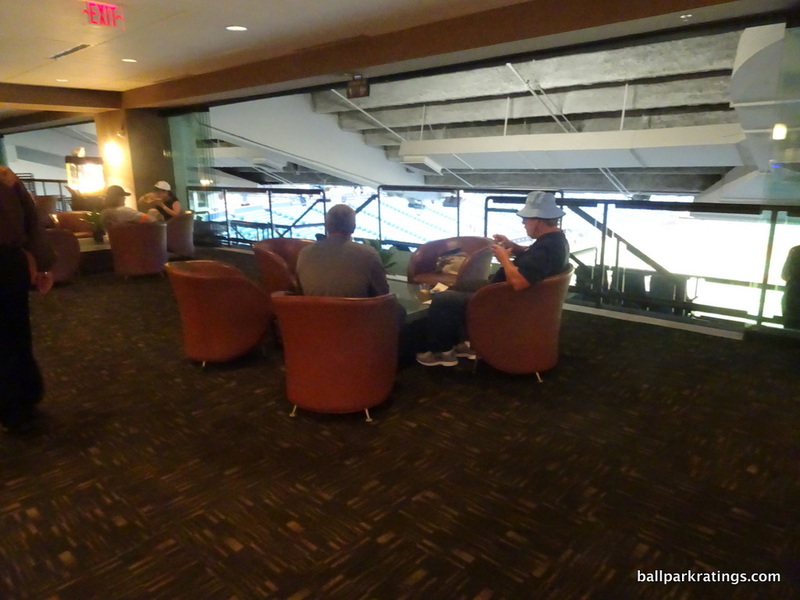 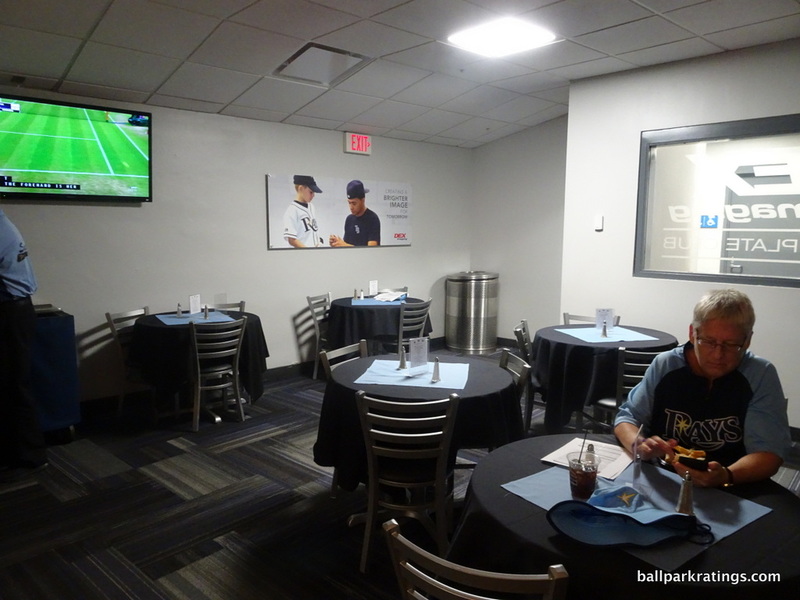 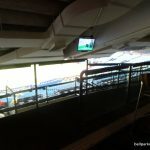 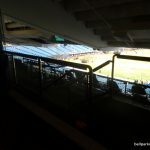 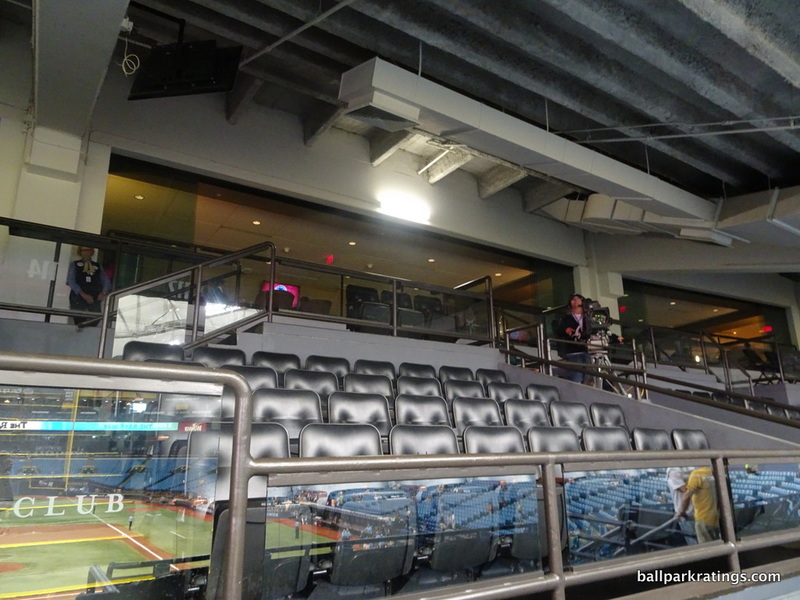 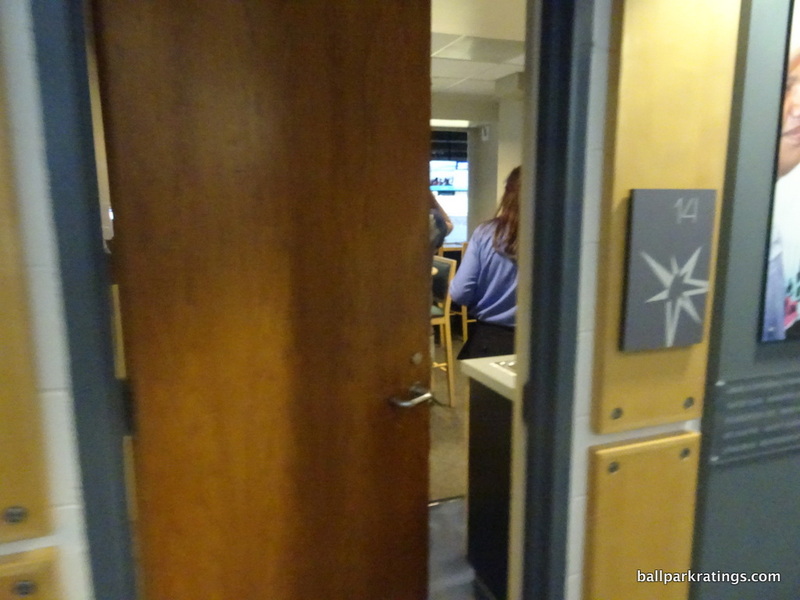 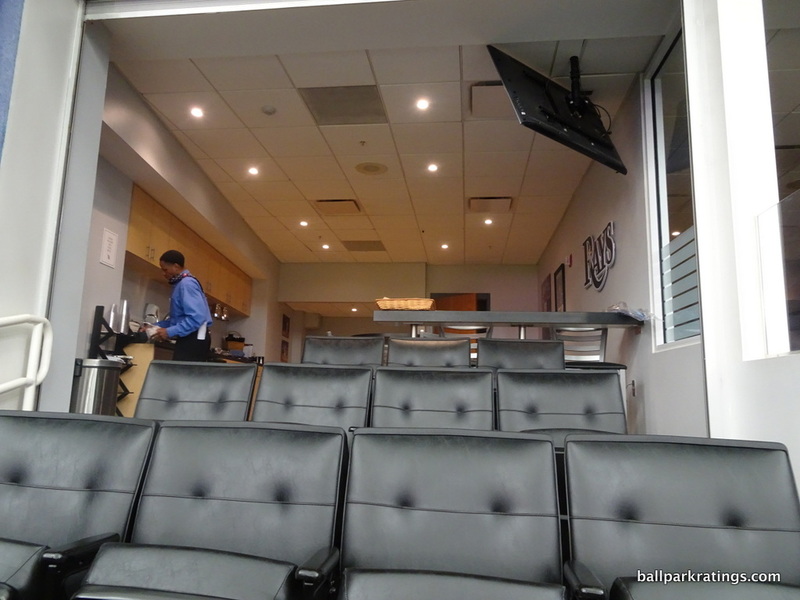 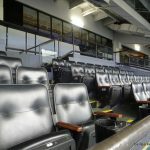 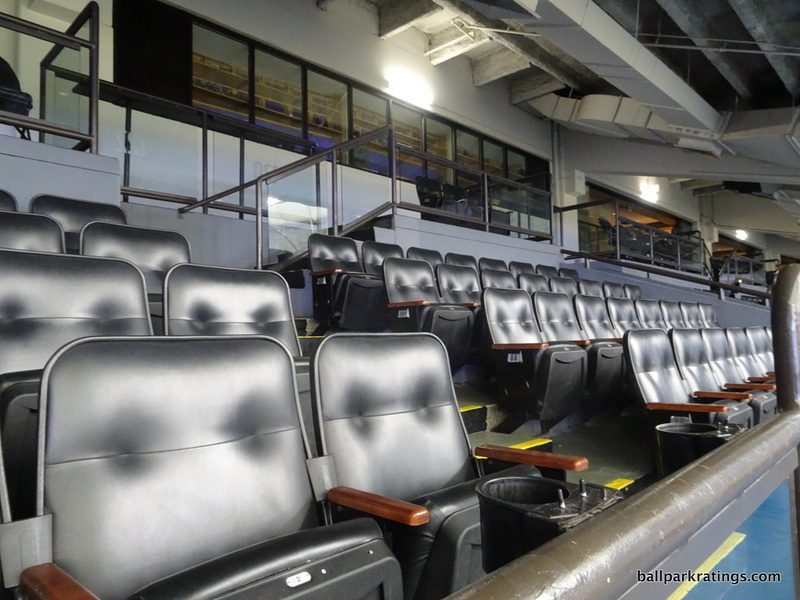 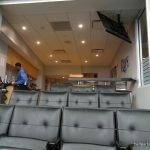 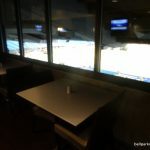 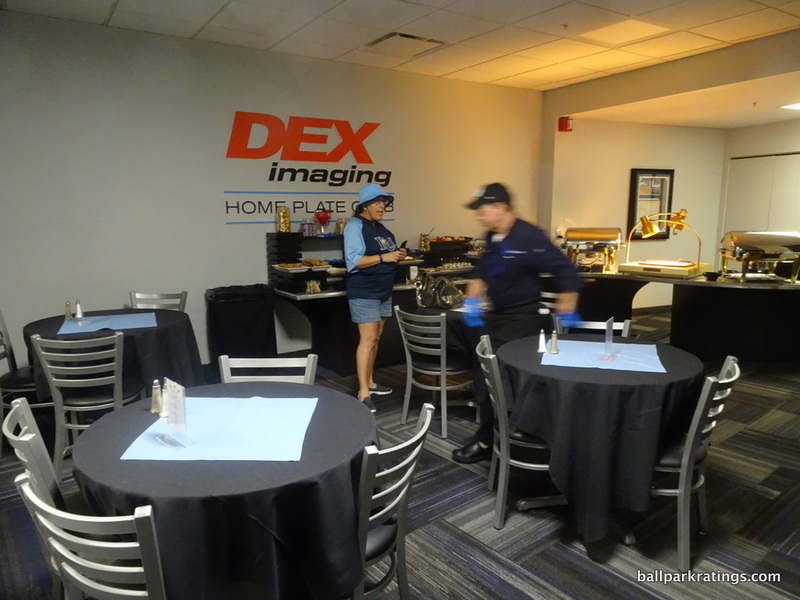 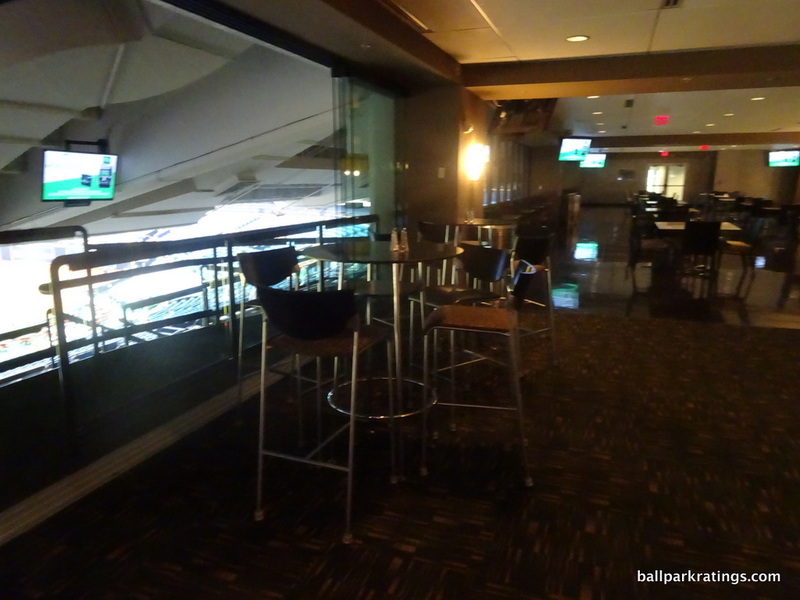 And to the extent that this was just a function of the seats I had, can you imagine anything similar happening in other such seats across the majors, like the Legends Suite at Yankee Stadium? 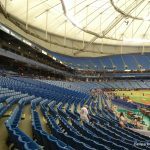 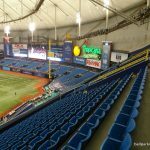 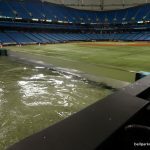 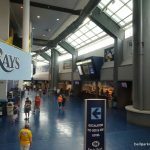 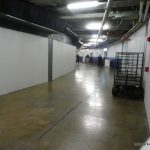 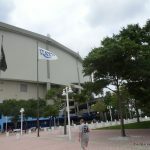 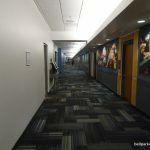 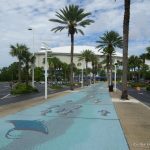 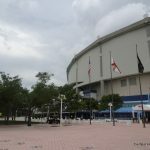 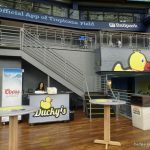 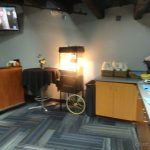 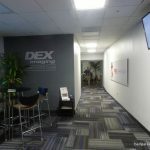 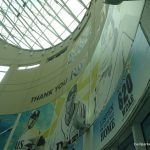 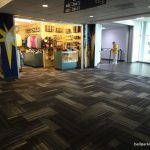 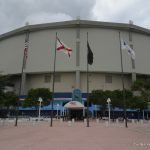 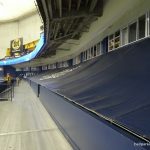 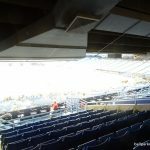 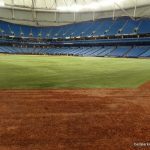 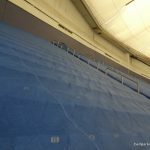 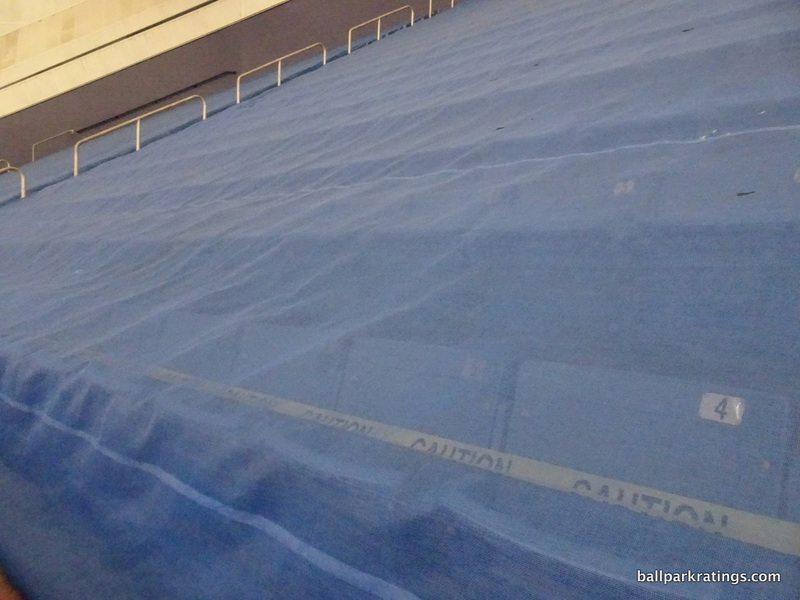 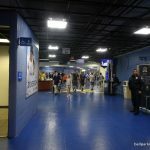 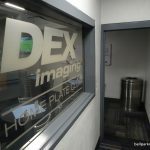 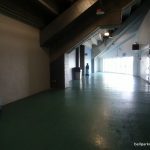 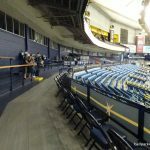 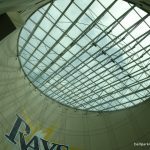 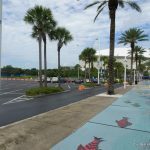 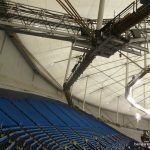 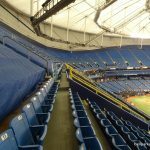 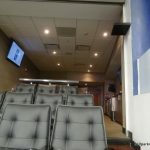 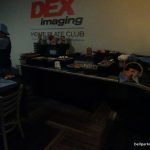 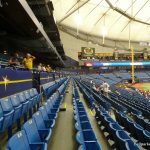 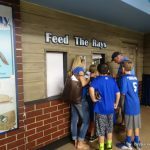 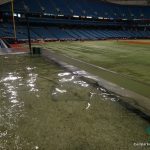 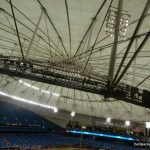 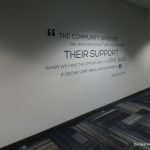 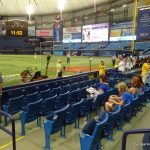 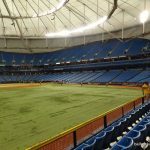 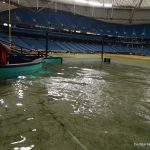 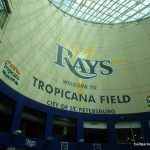 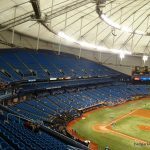 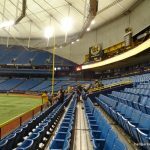 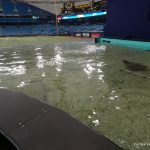 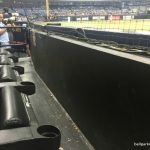 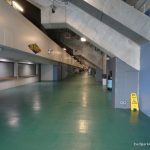 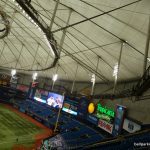 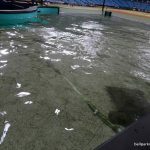 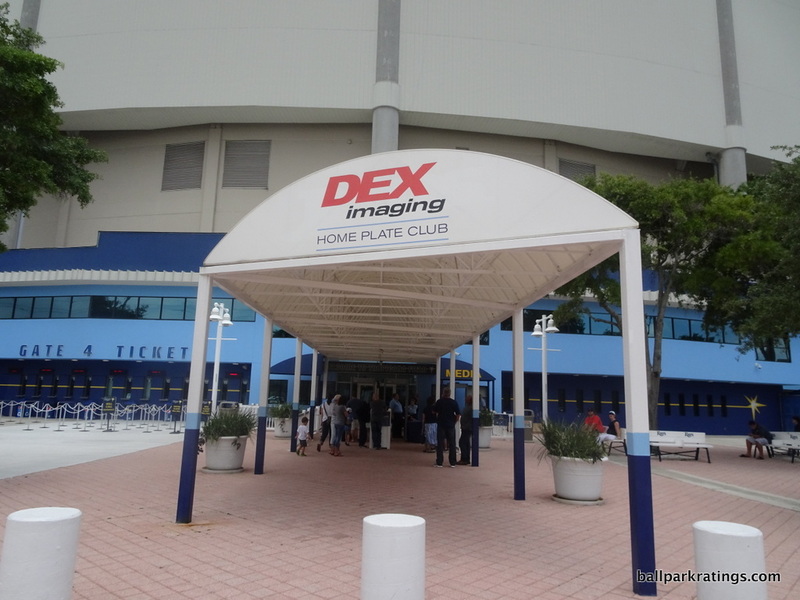 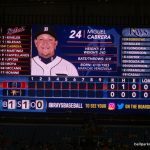 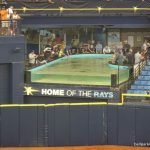 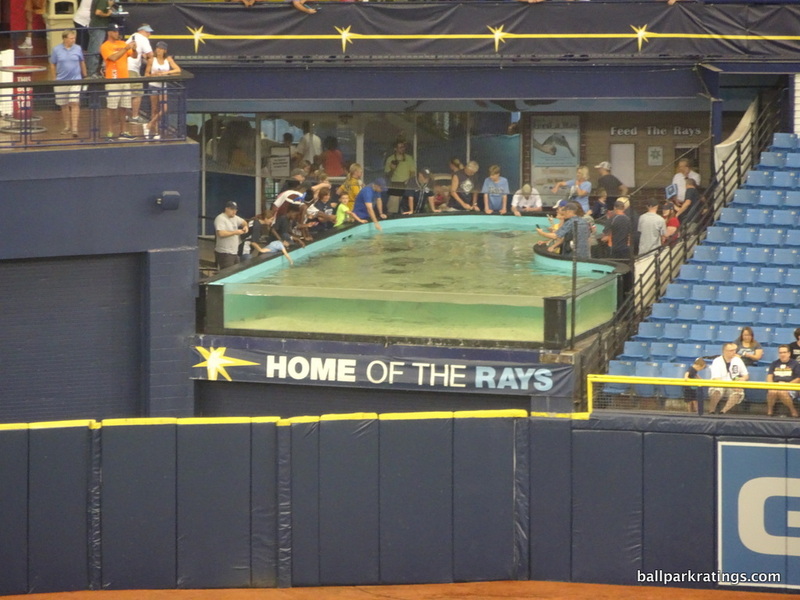 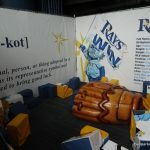 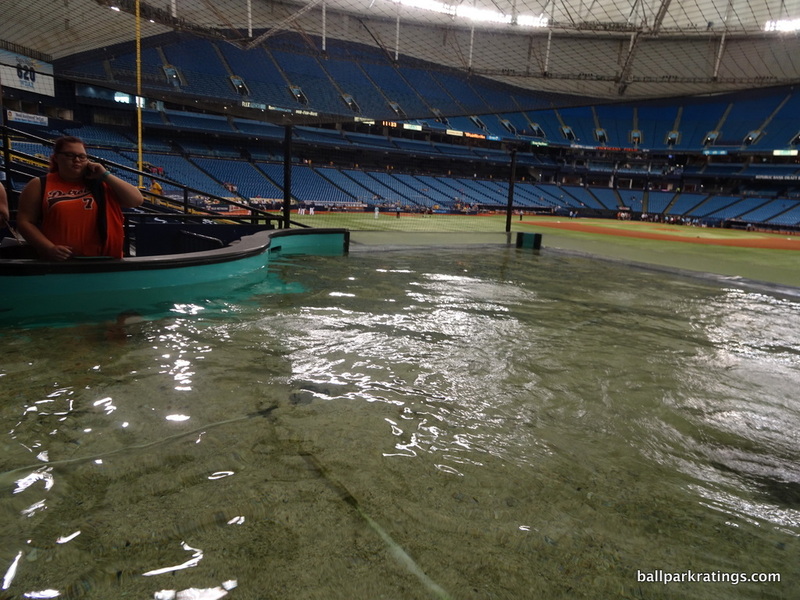 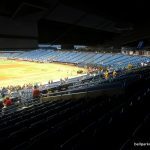 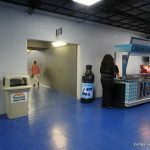 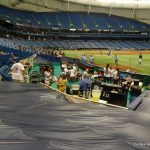 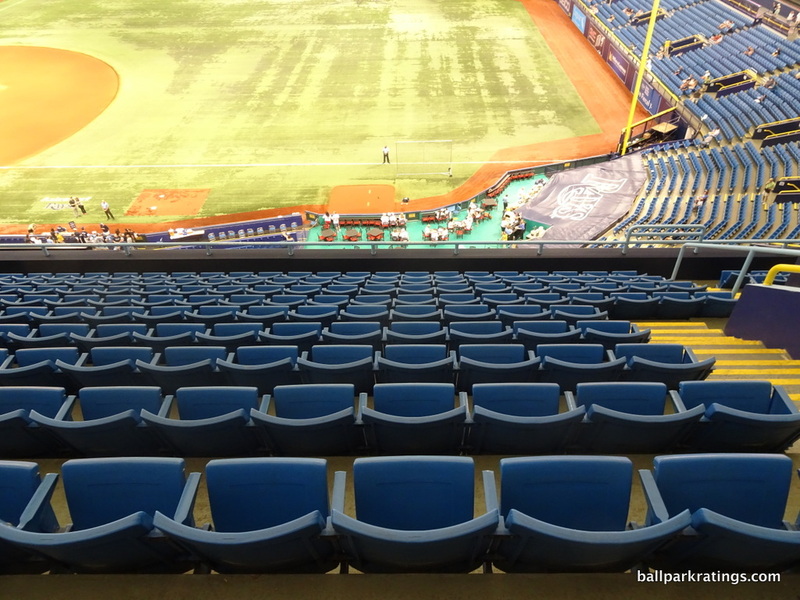 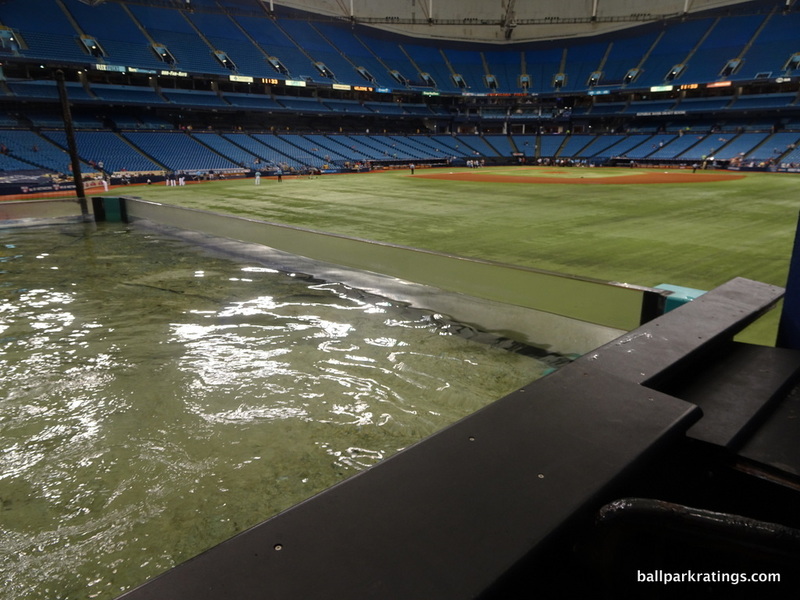 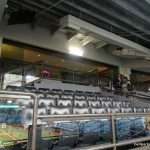 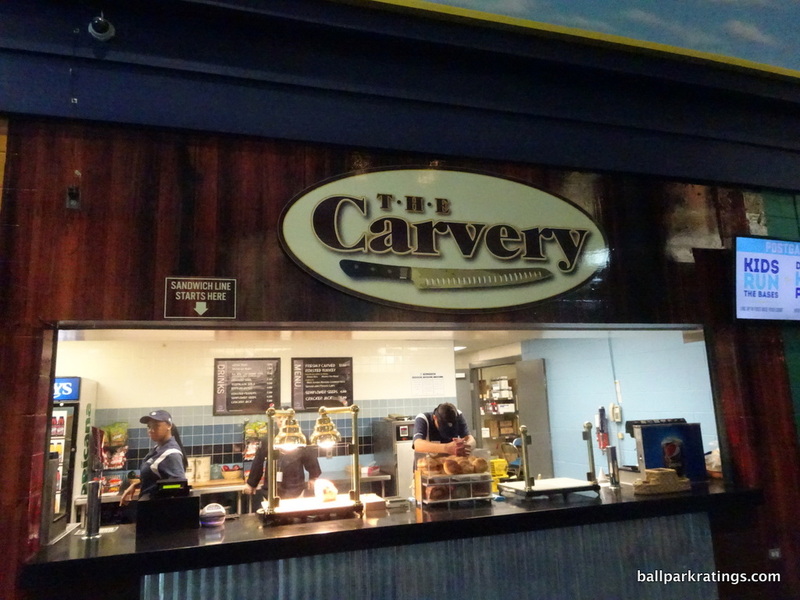 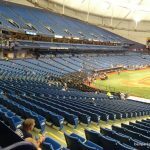 The Rays are clearly interested in projecting an image of a ballpark that cares about the fans, no matter how it looks. 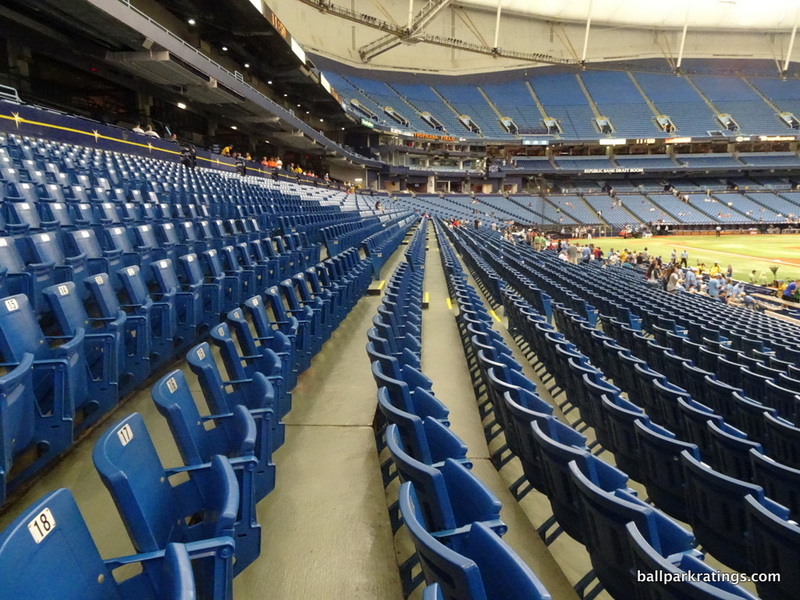 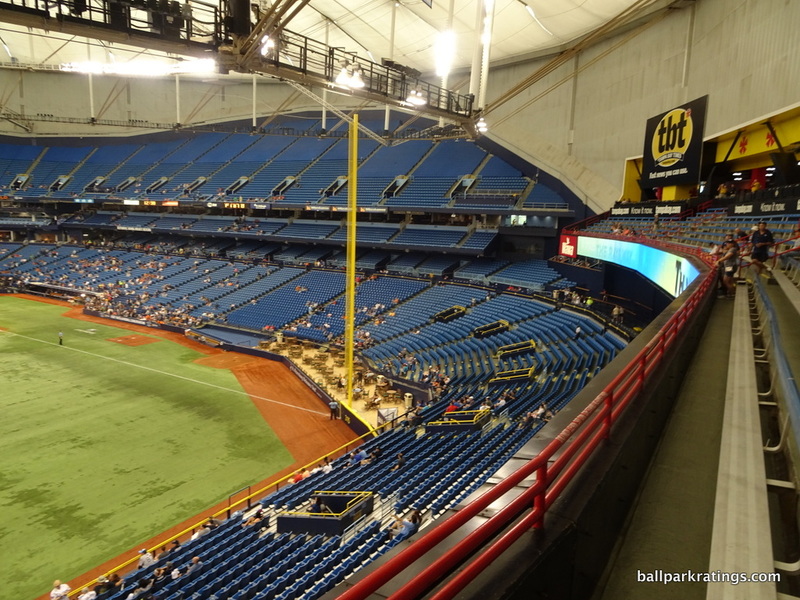 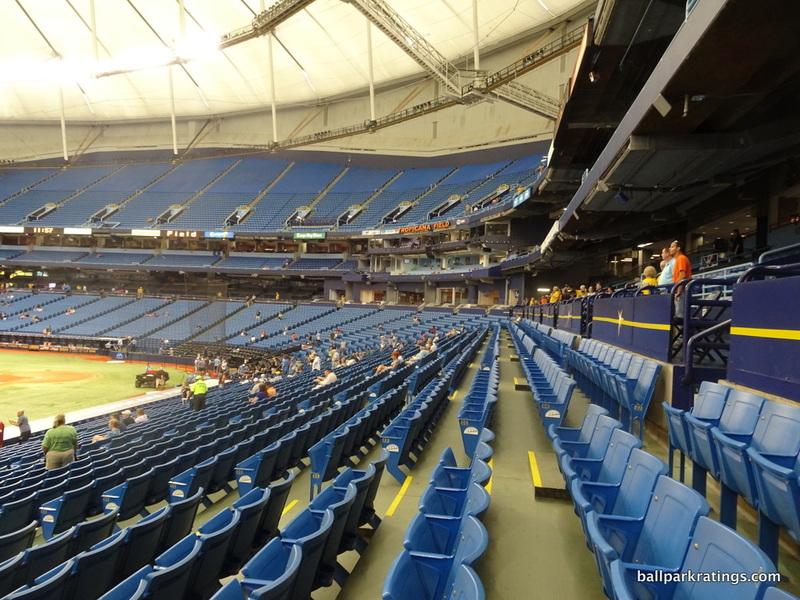 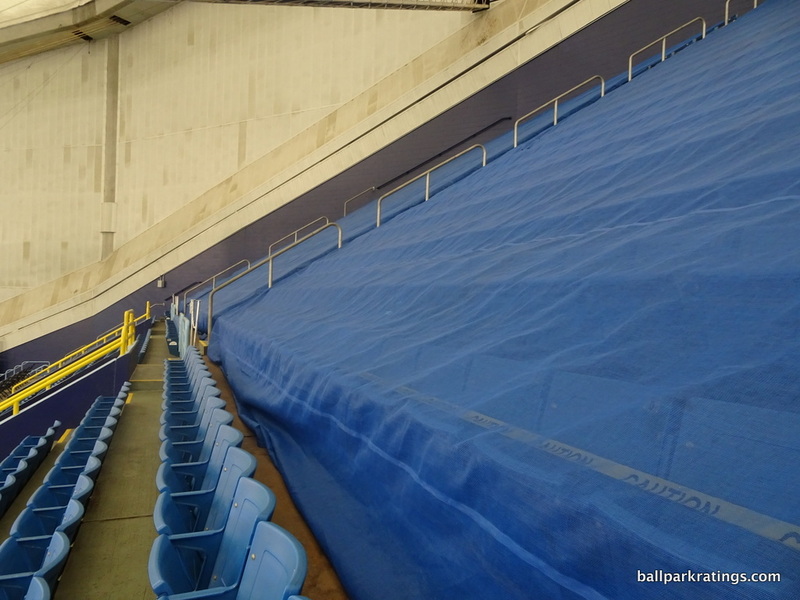 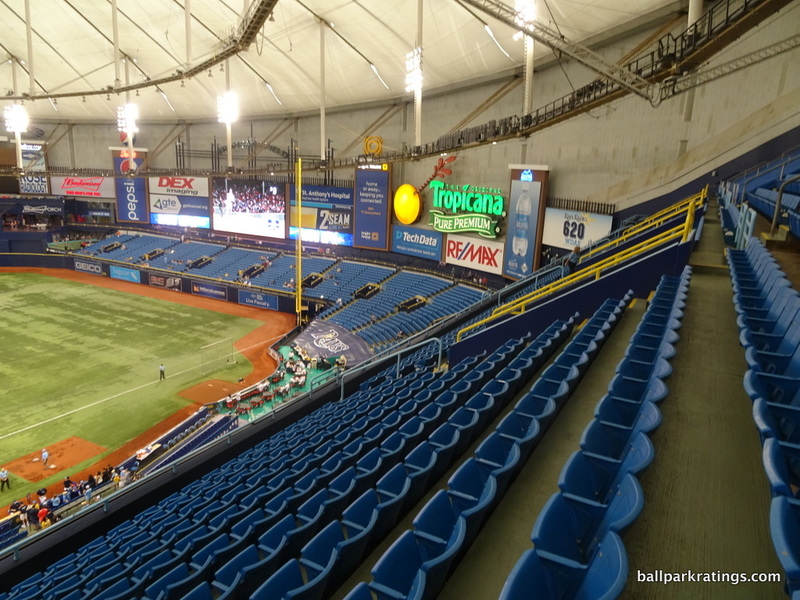 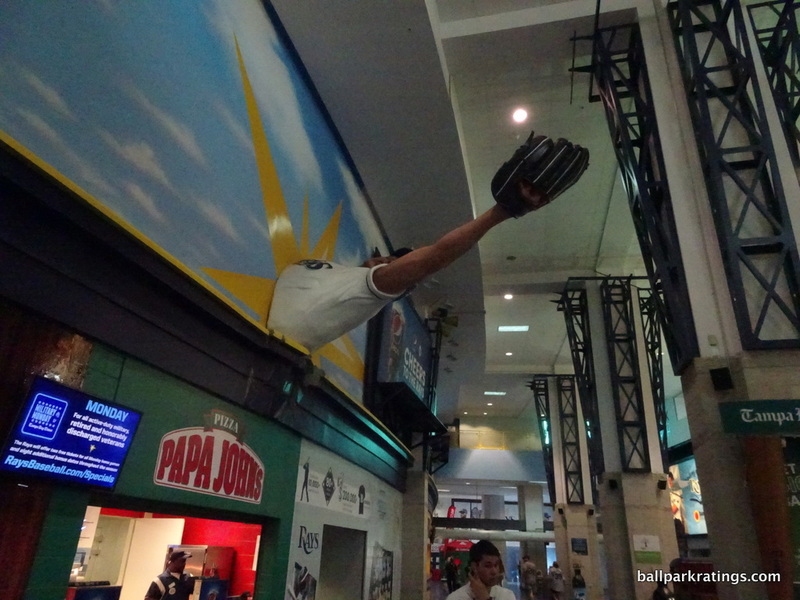 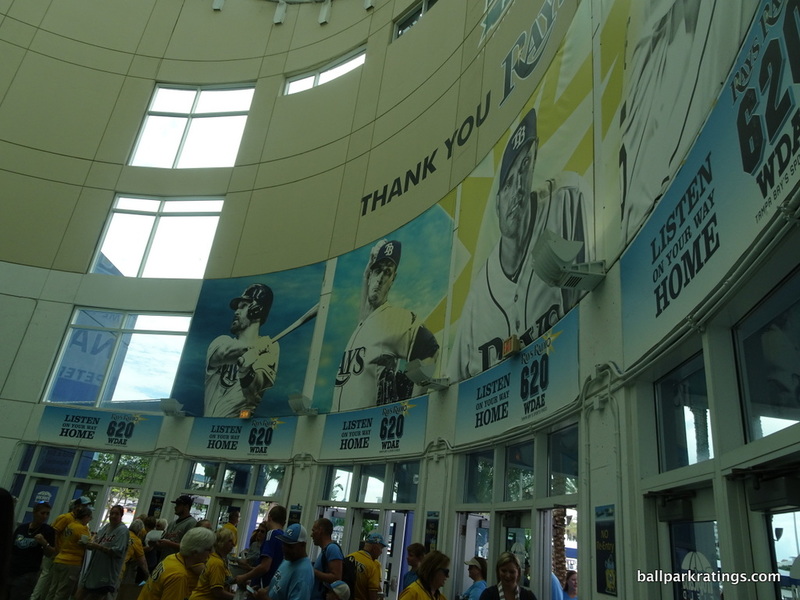 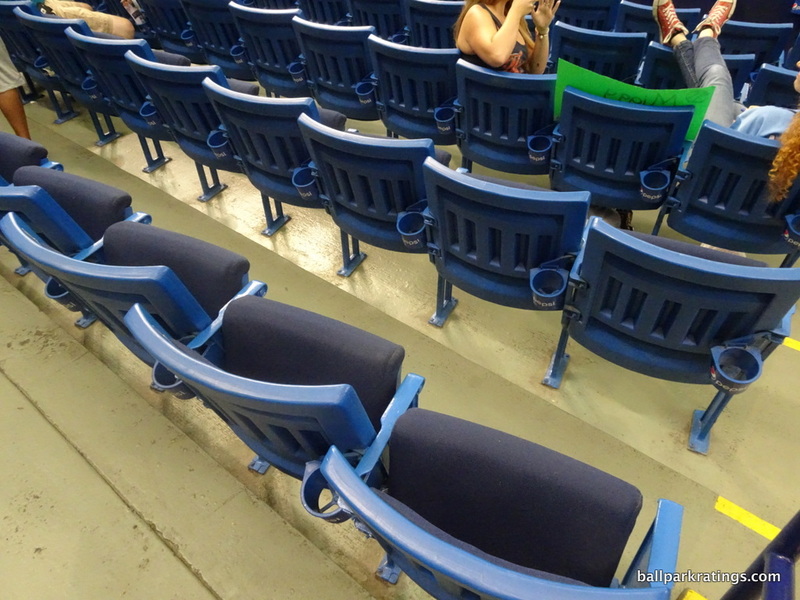 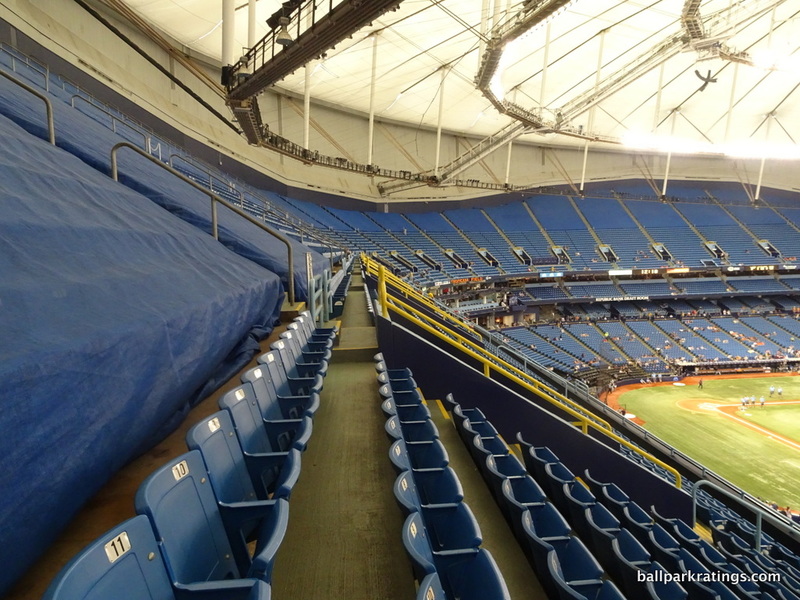 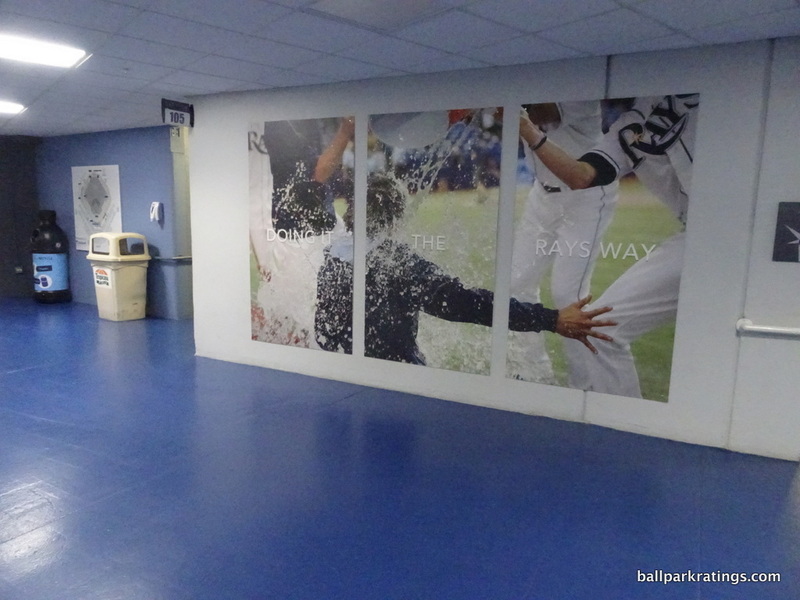 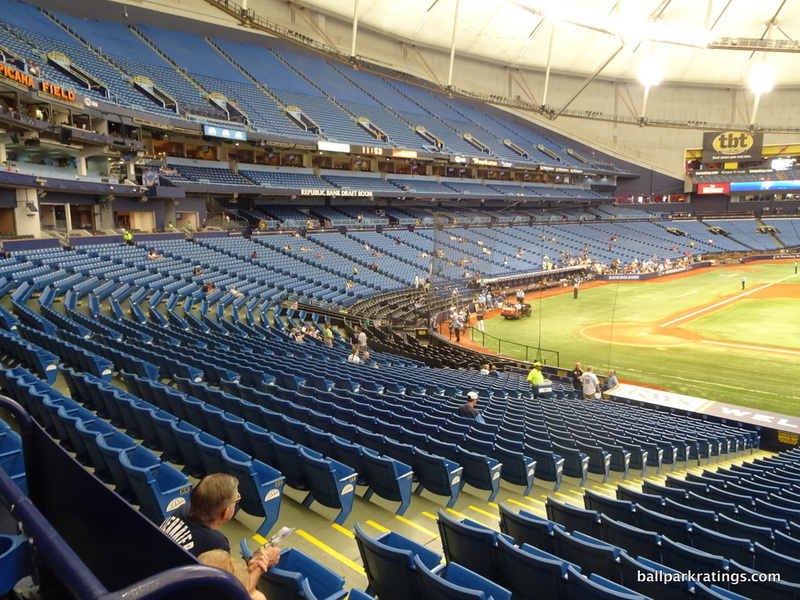 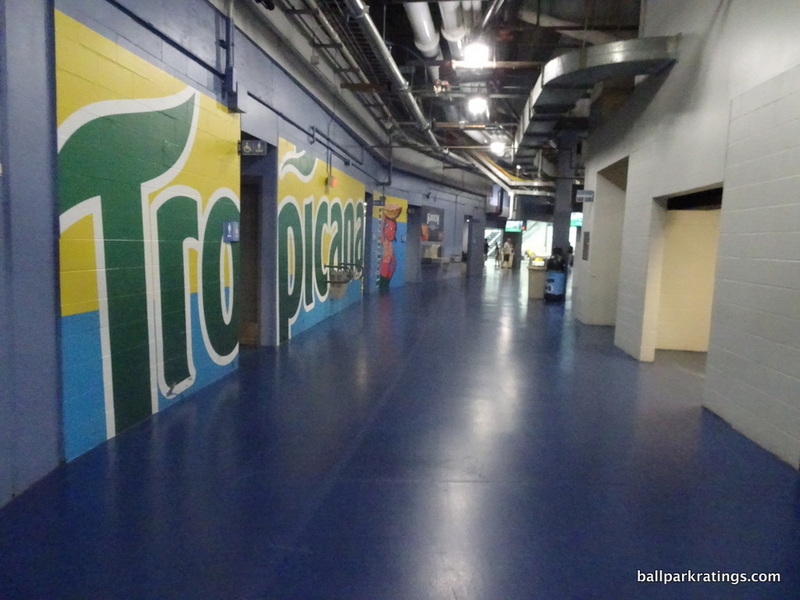 Tropicana Field has the worst interior aesthetics in baseball, for obvious reasons. 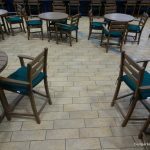 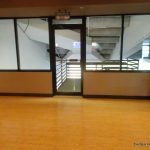 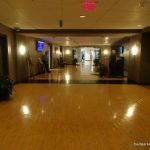 It’s near the bottom in overall aesthetics, functionality, and setting too, but the respectable amenities are worth noting. 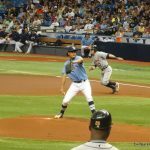 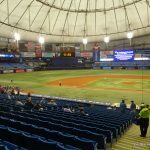 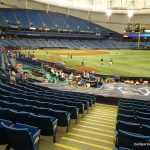 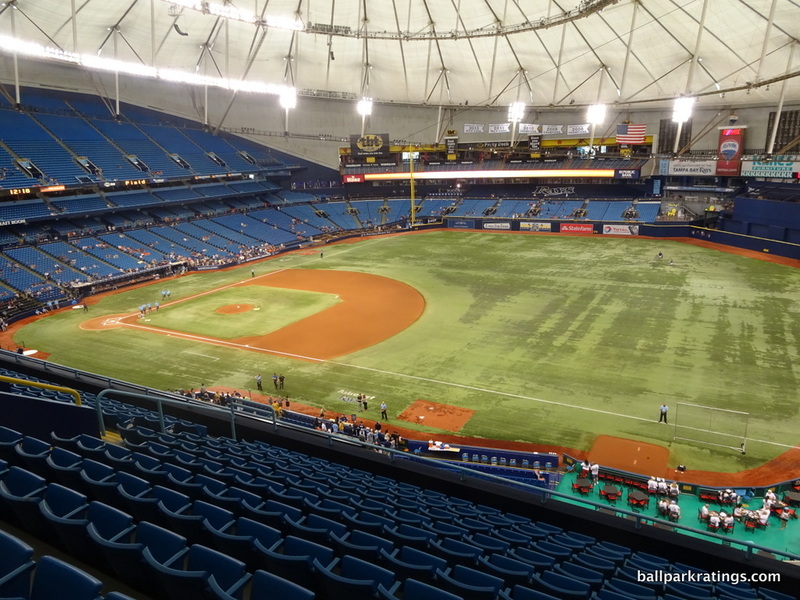 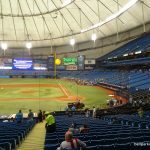 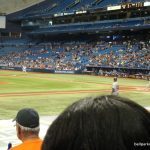 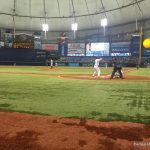 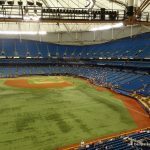 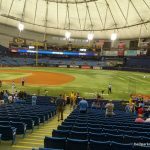 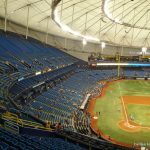 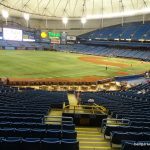 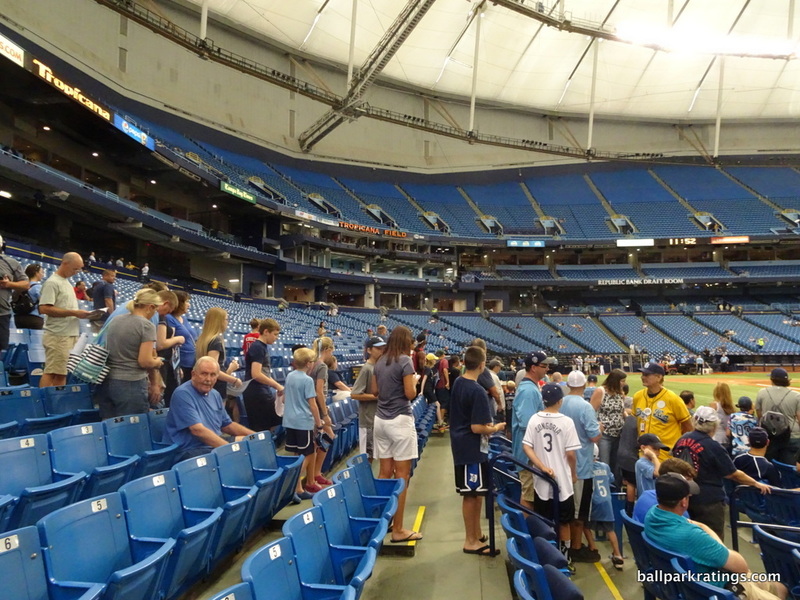 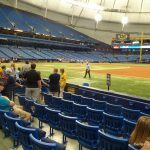 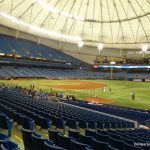 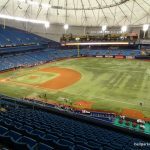 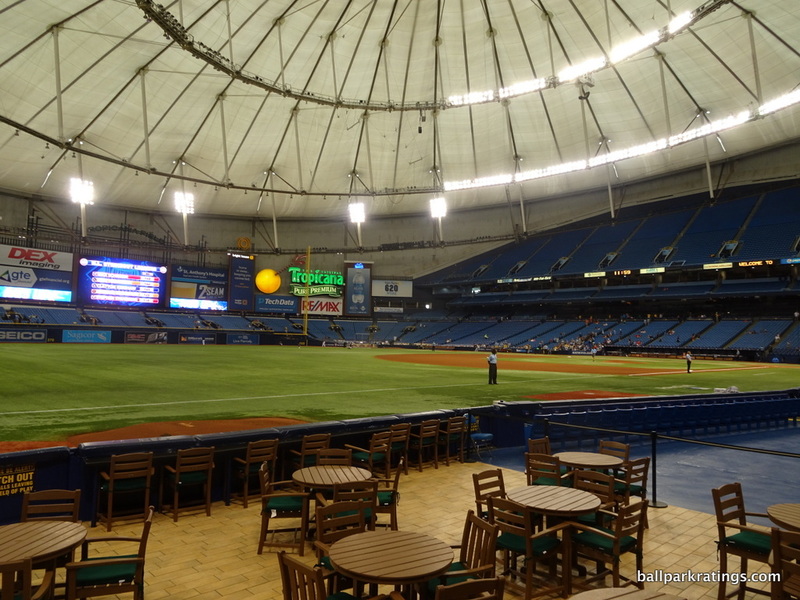 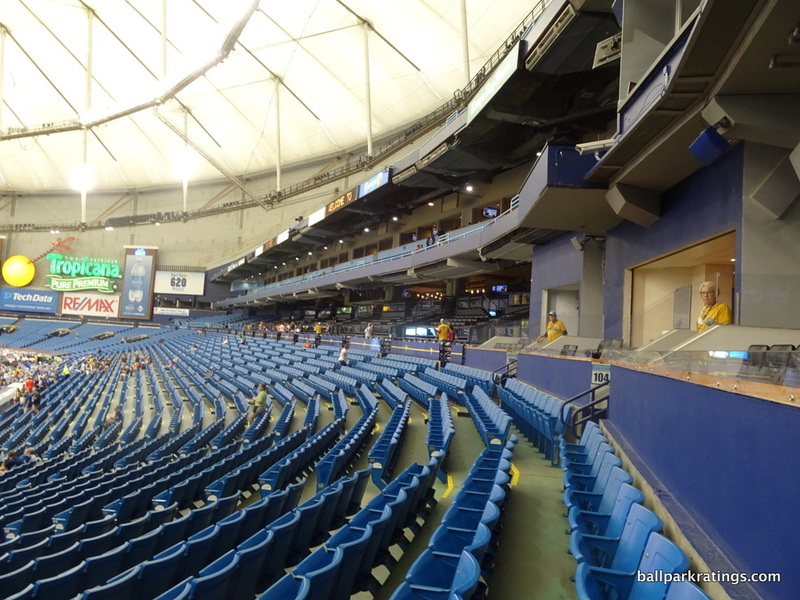 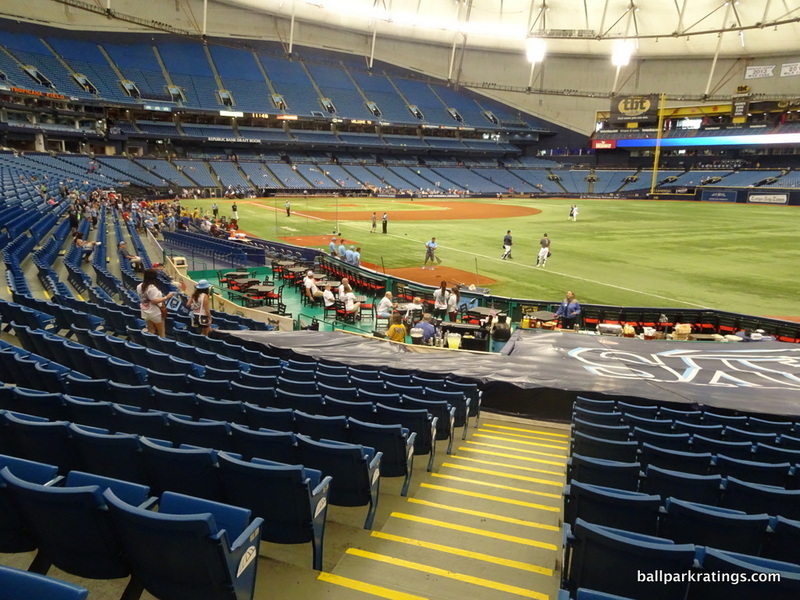 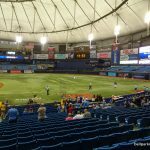 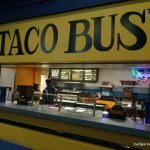 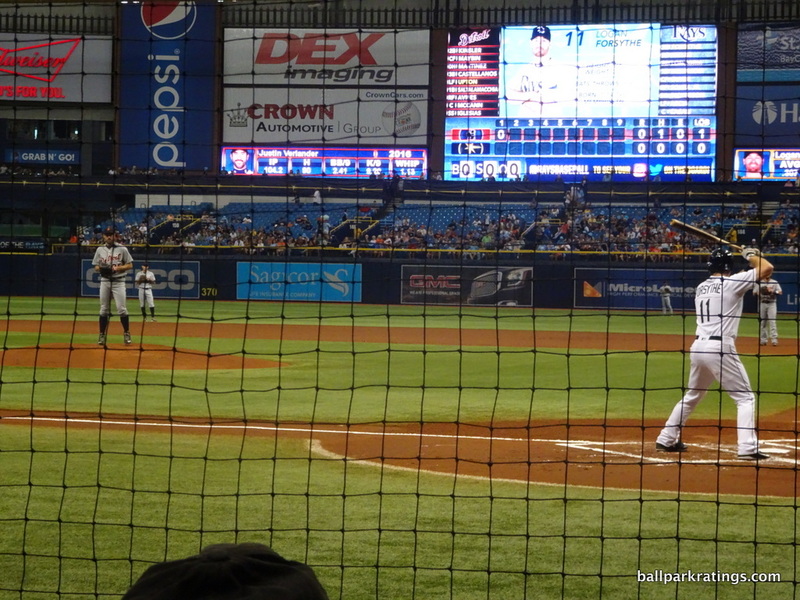 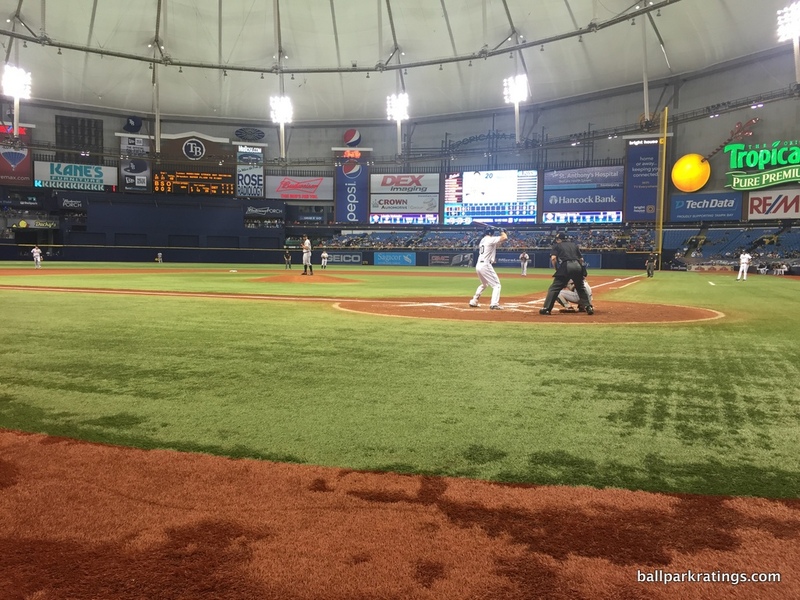 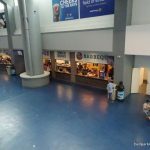 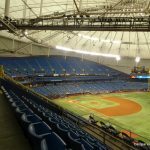 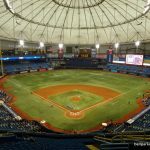 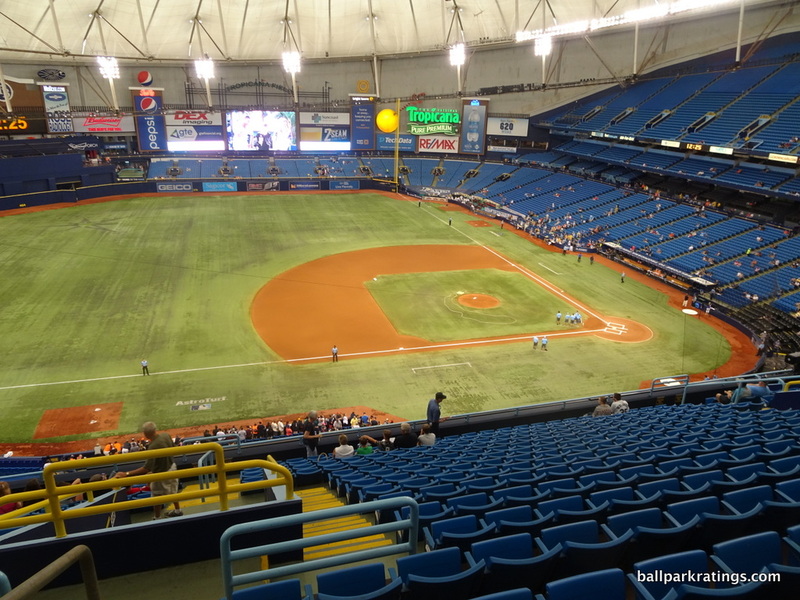 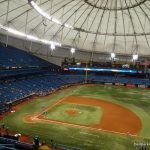 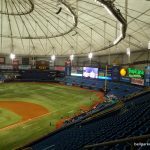 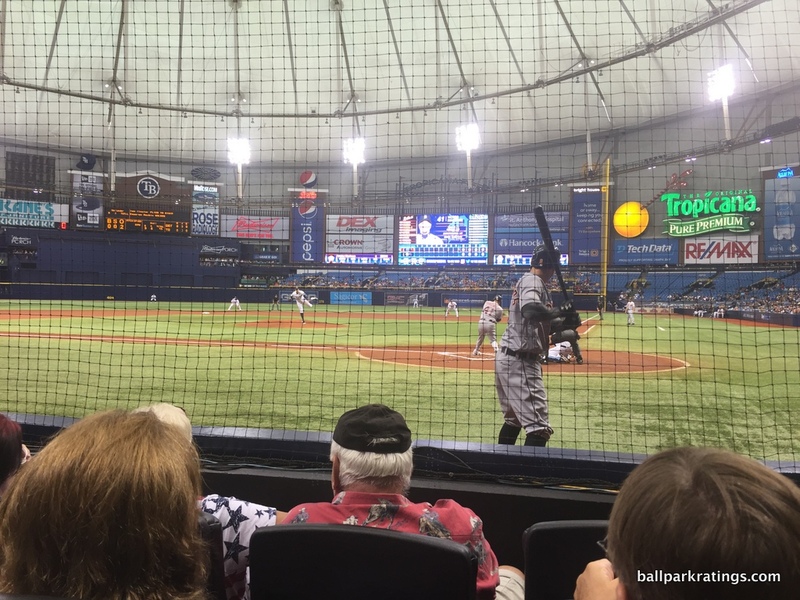 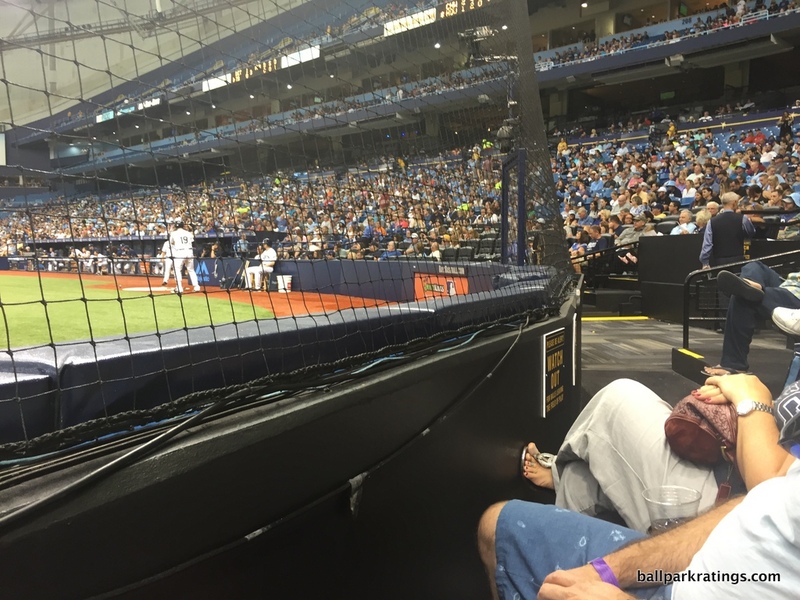 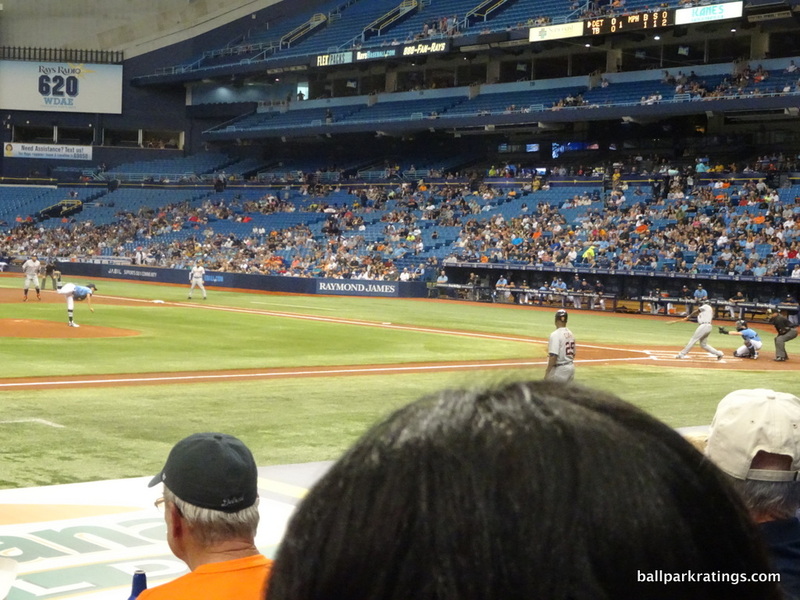 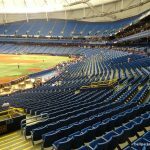 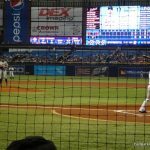 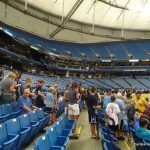 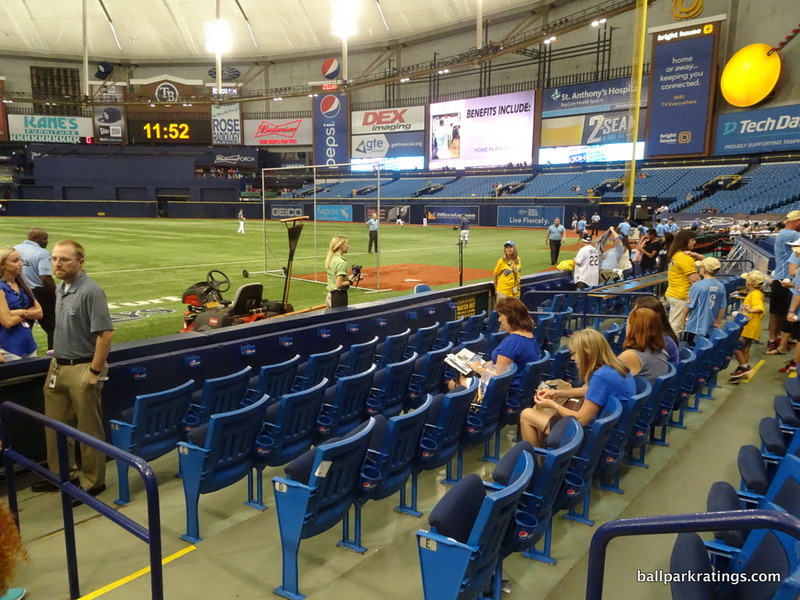 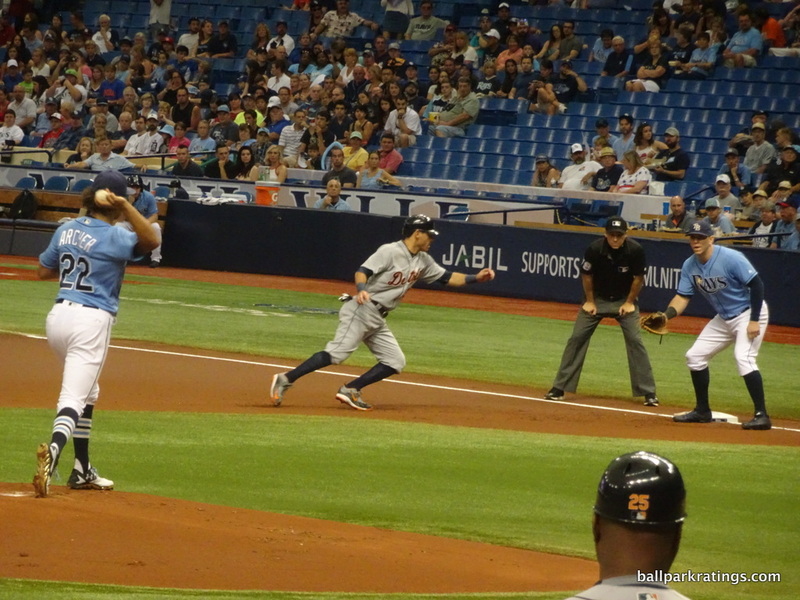 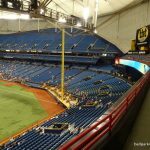 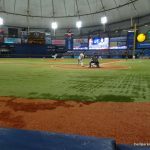 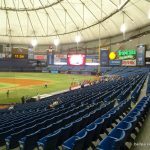 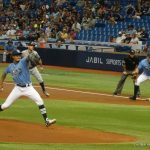 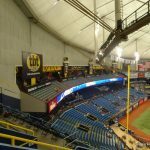 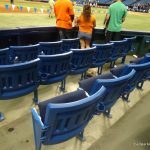 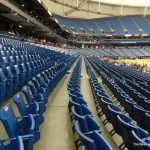 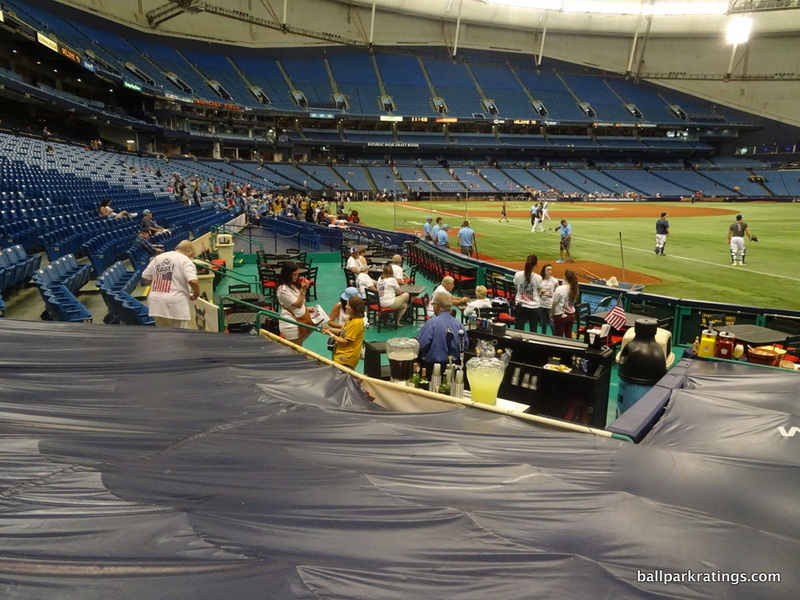 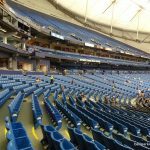 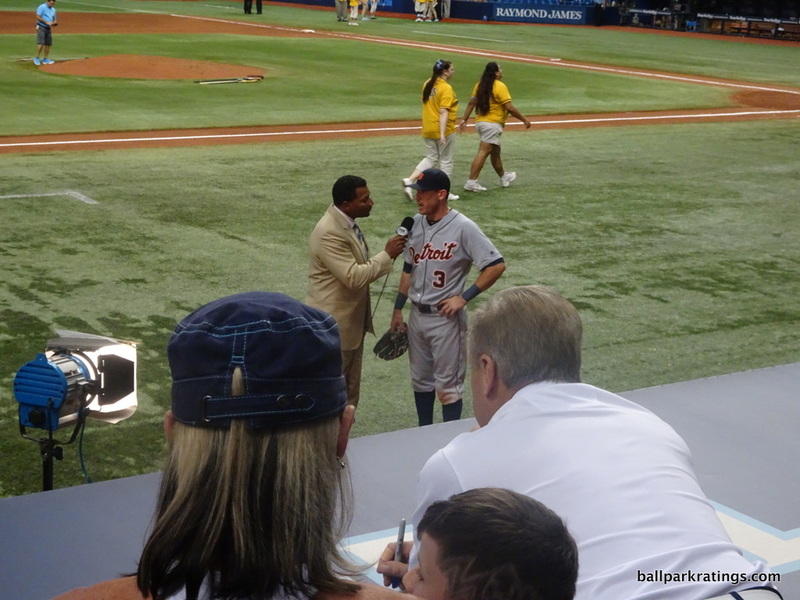 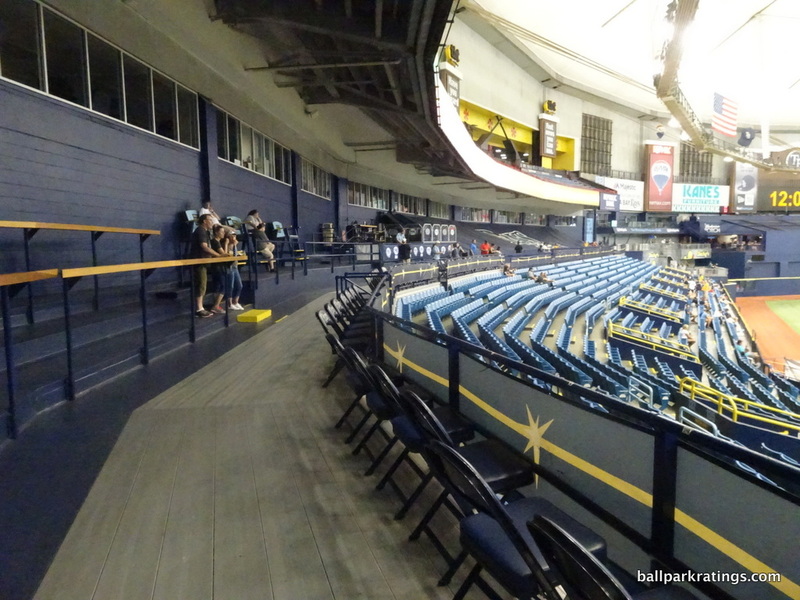 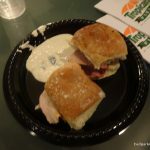 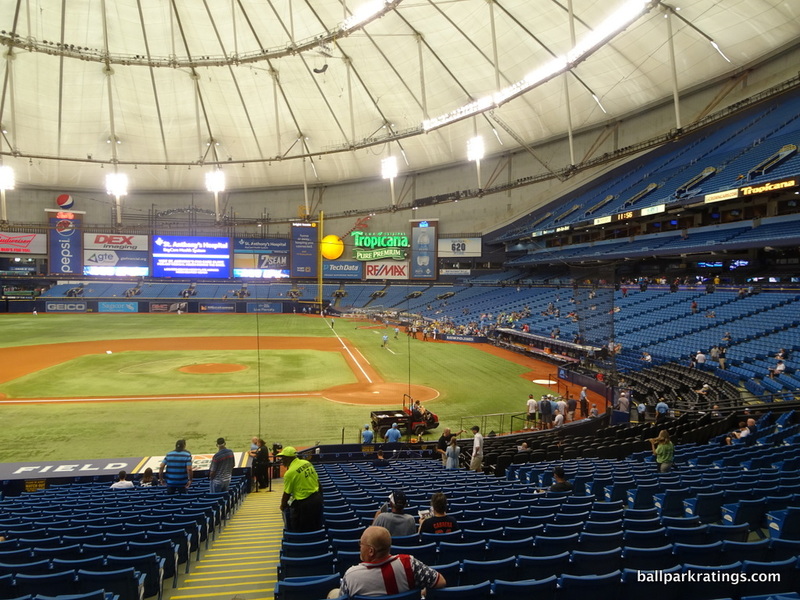 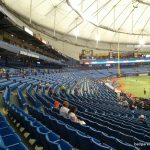 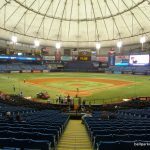 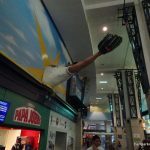 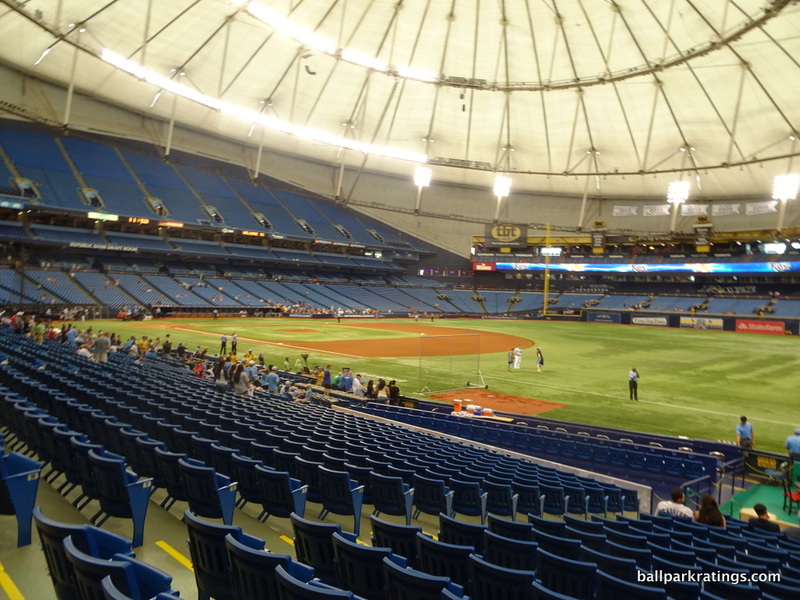 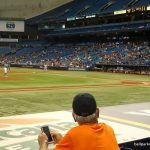 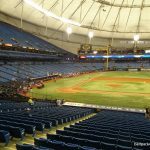 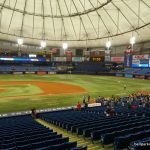 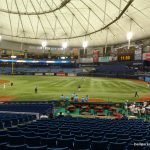 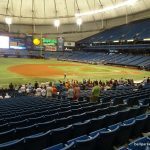 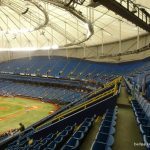 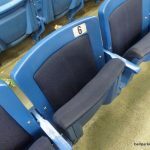 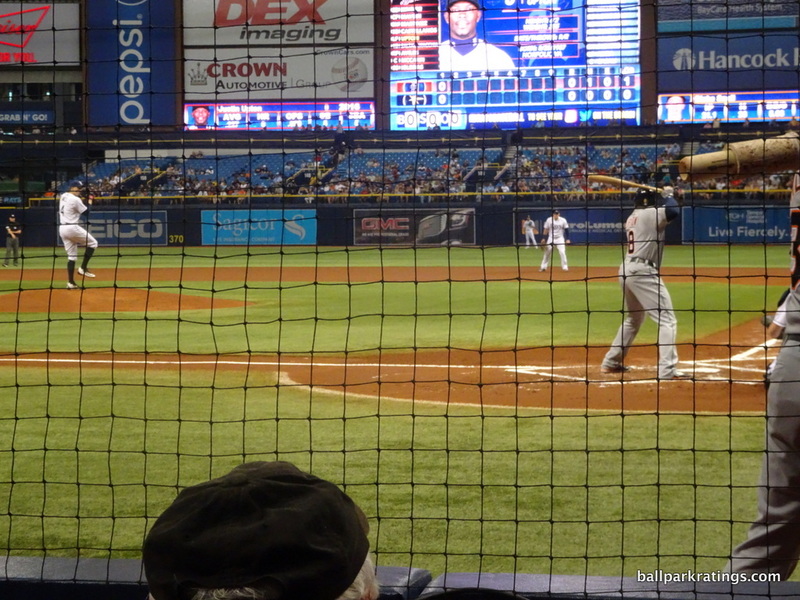 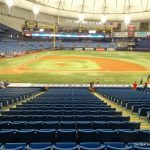 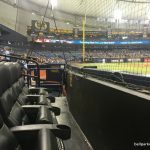 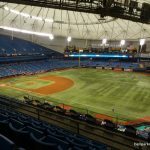 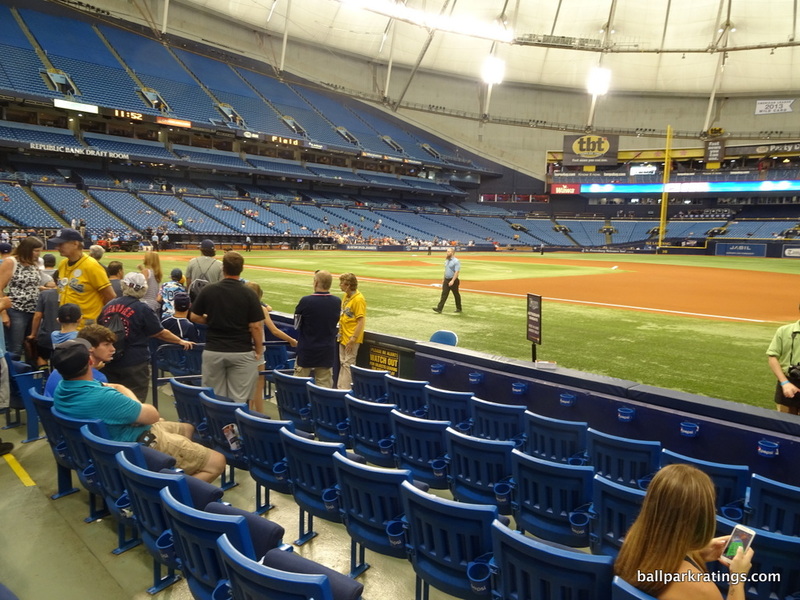 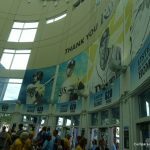 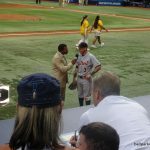 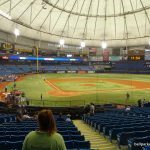 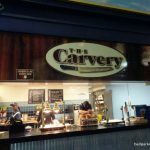 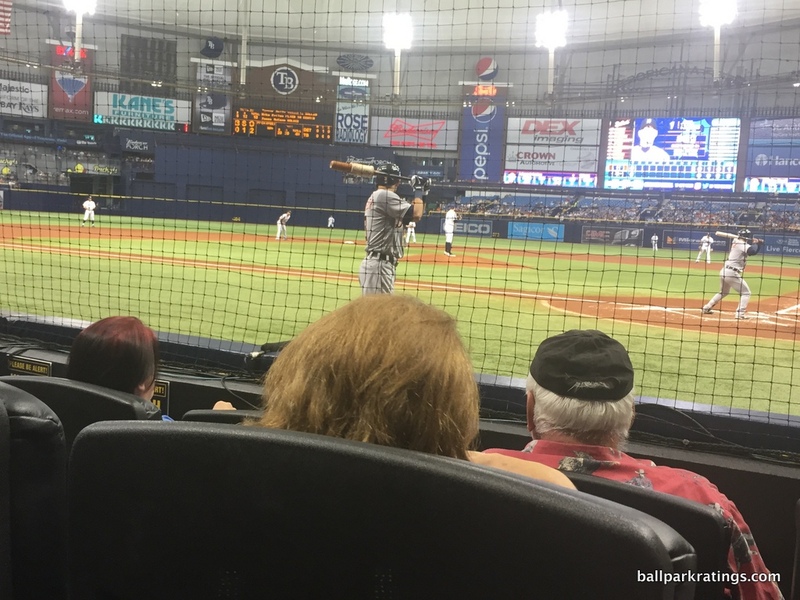 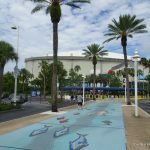 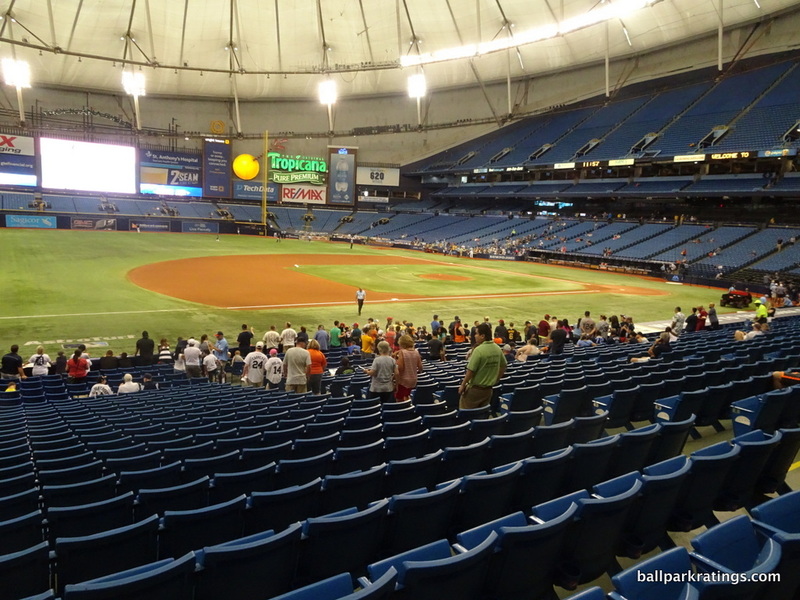 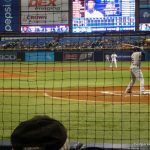 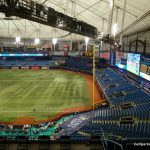 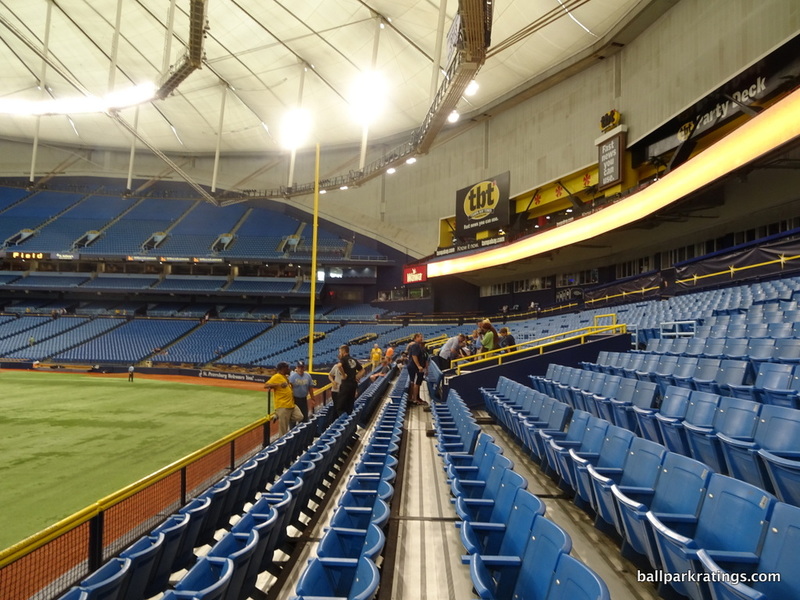 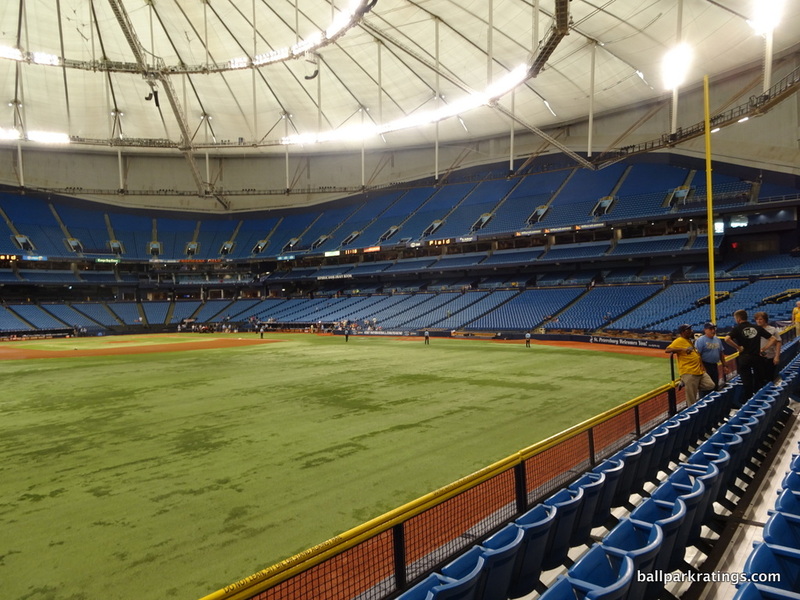 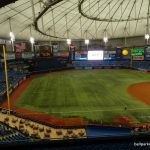 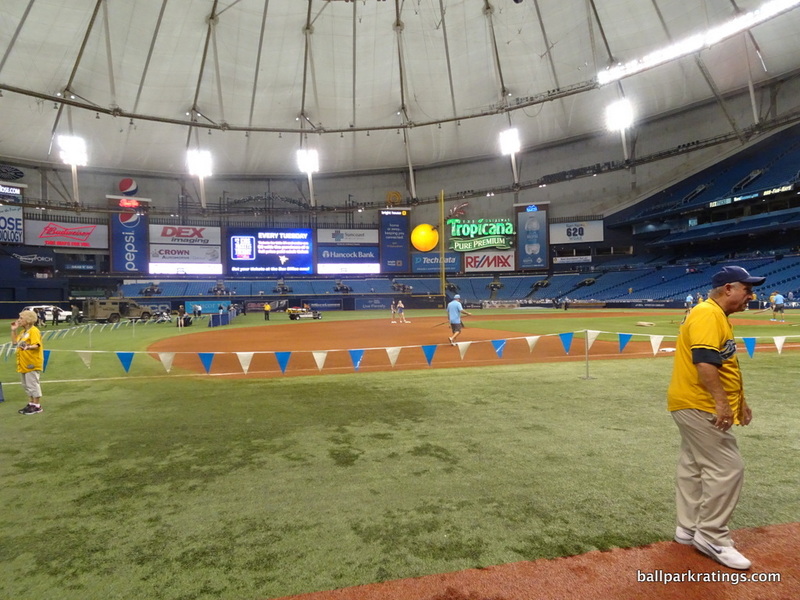 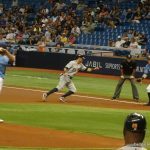 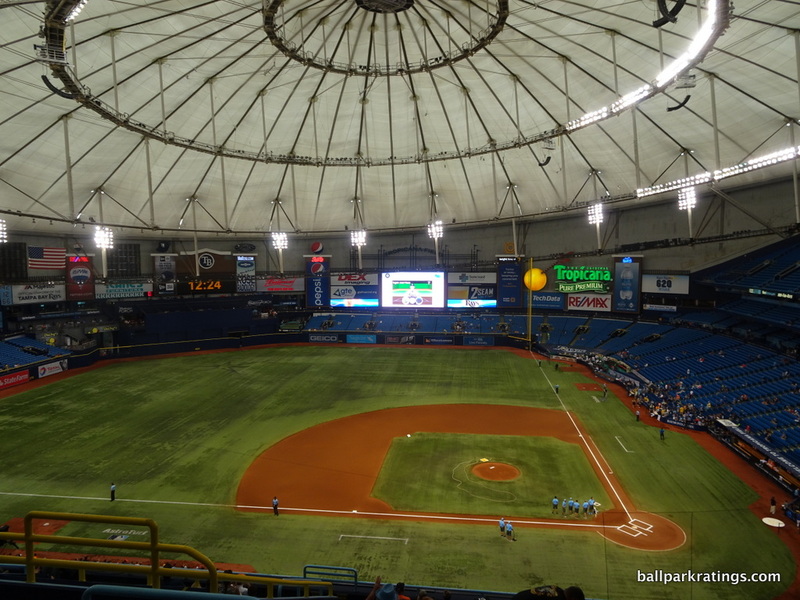 Tropicana Field is one of the three worst ballparks in baseball, as expected, but it has redeeming qualities. 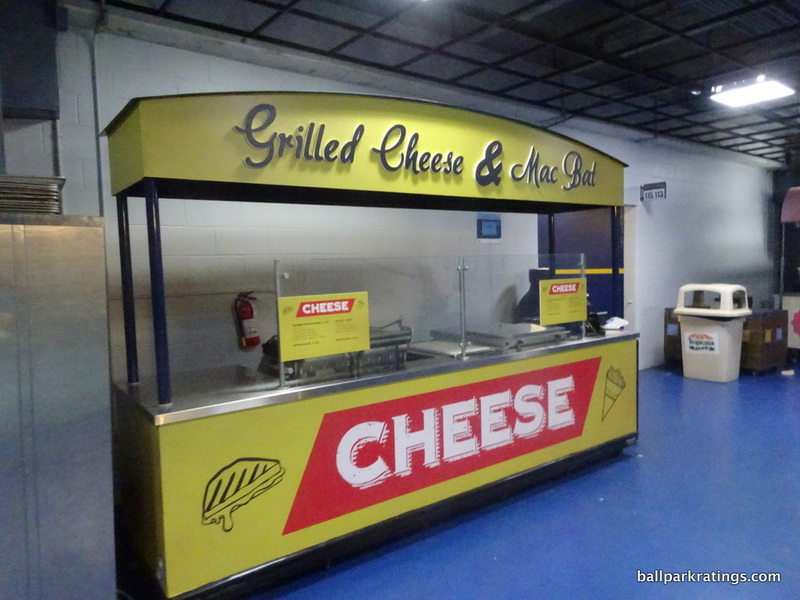 It’s clearly better than the Oakland Coliseum, which I’m not sure is as expected for most people. 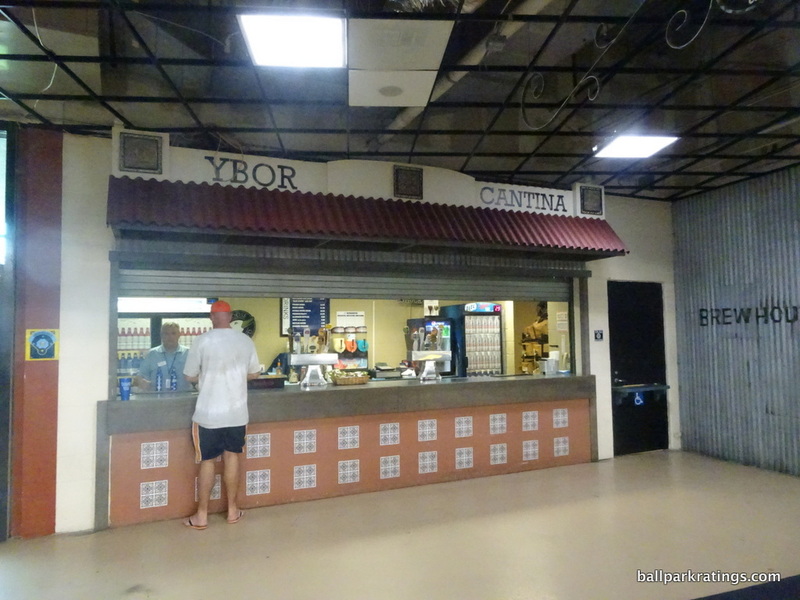 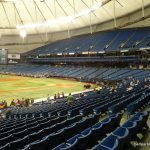 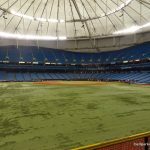 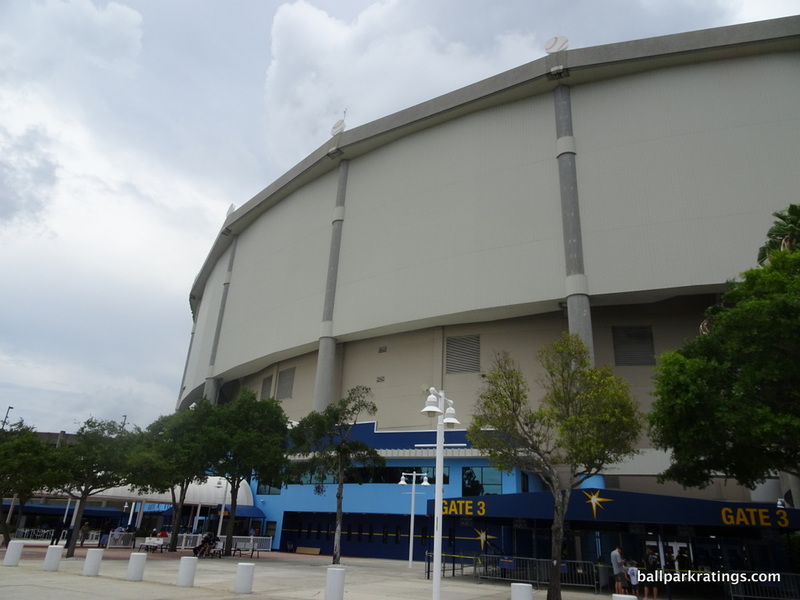 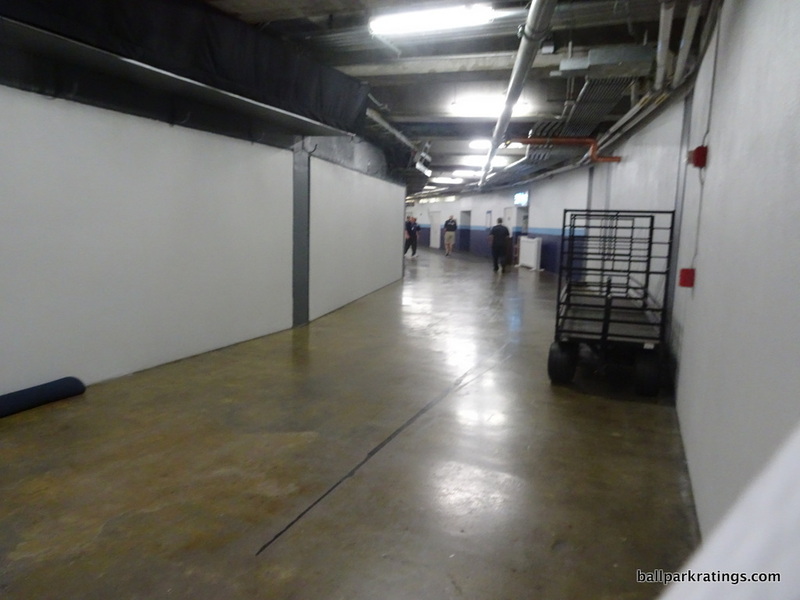 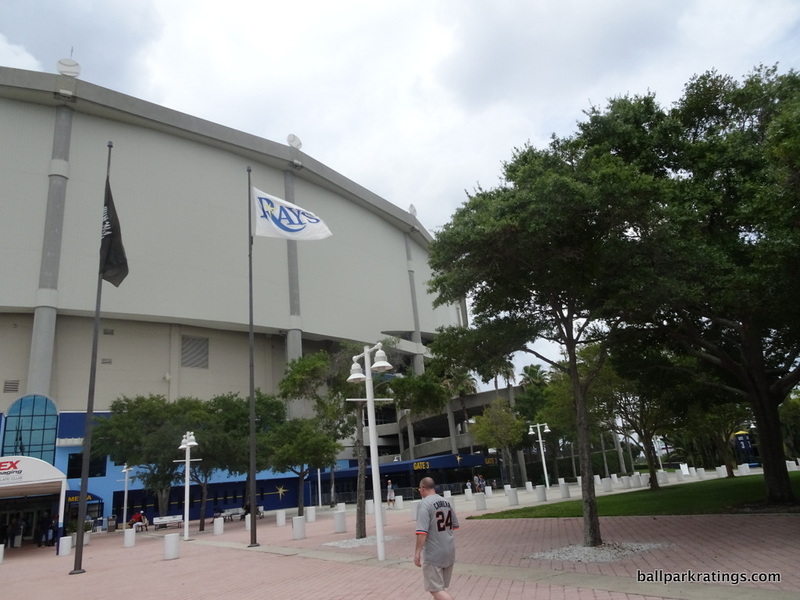 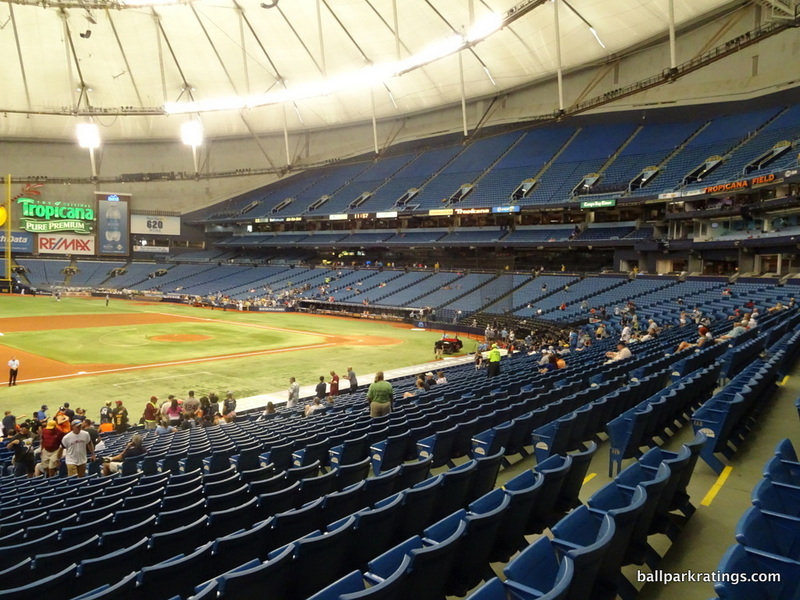 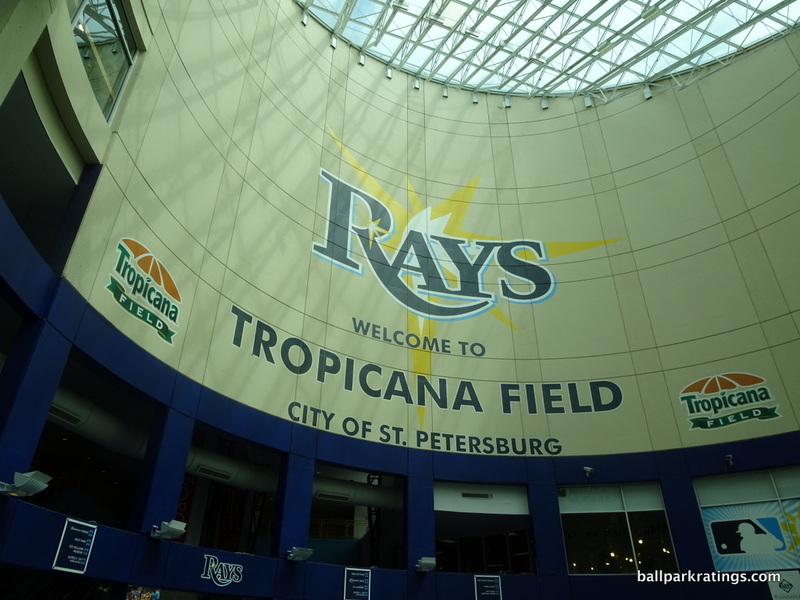 It should be, as Tropicana Field is now a baseball-only facility unlike the former. 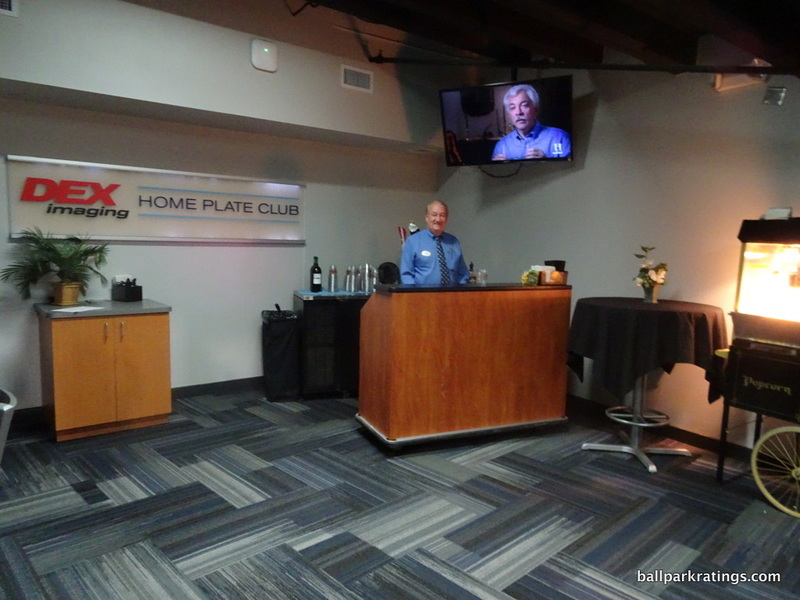 The positive energy isn’t limited to the staff in the Home Plate Club. 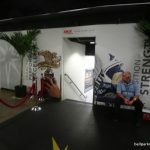 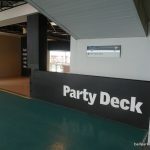 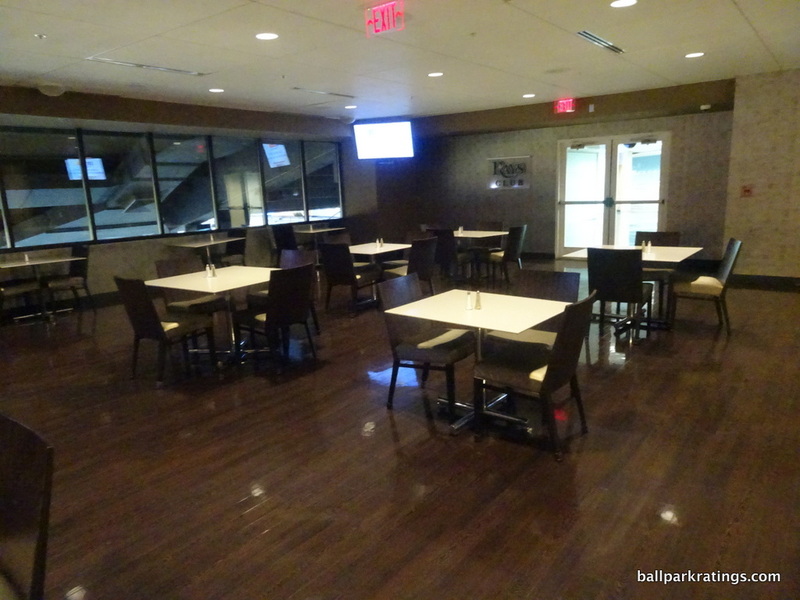 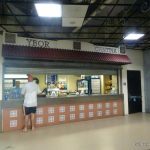 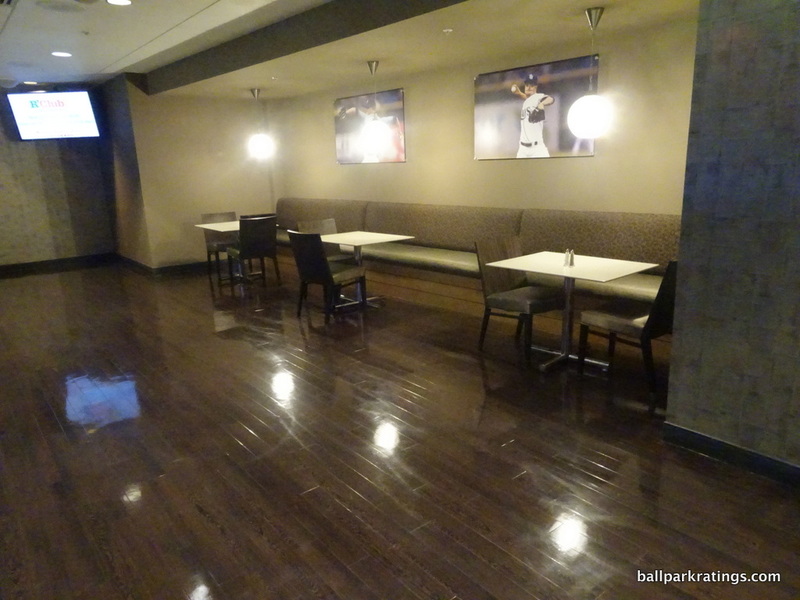 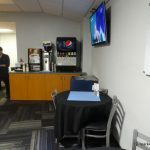 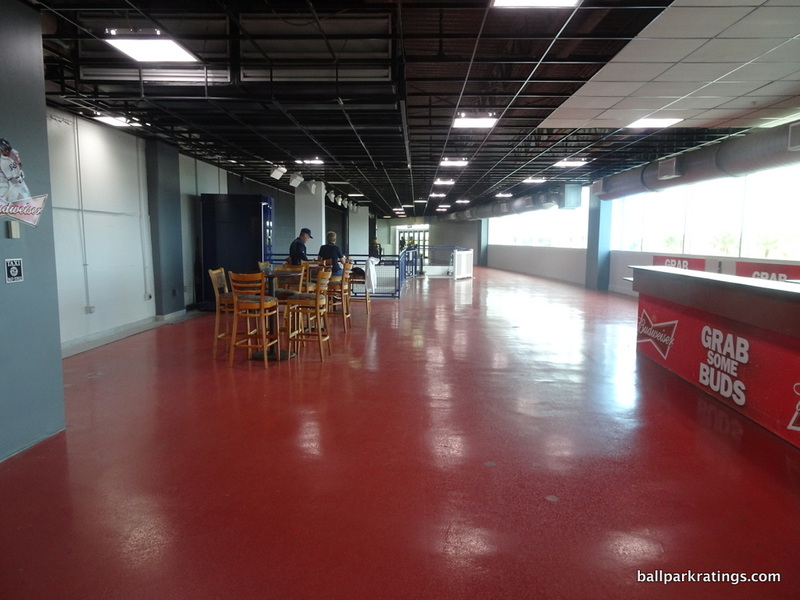 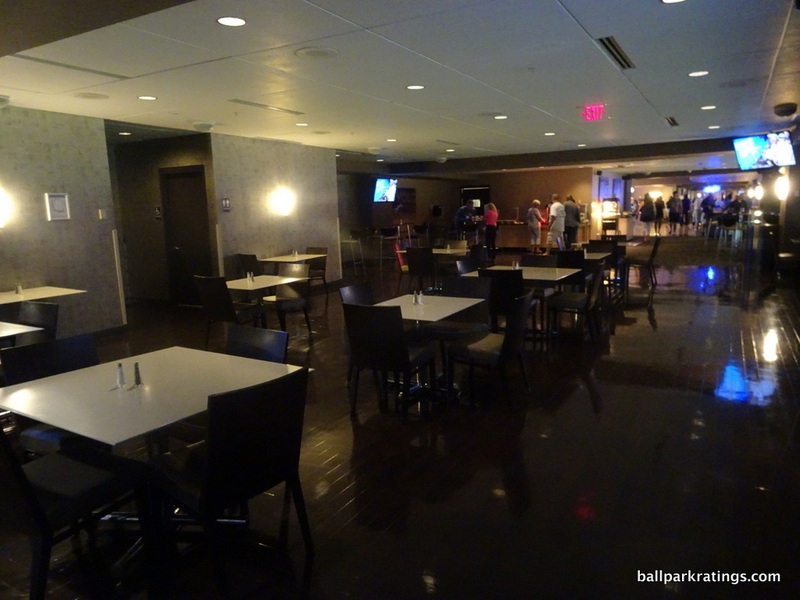 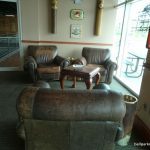 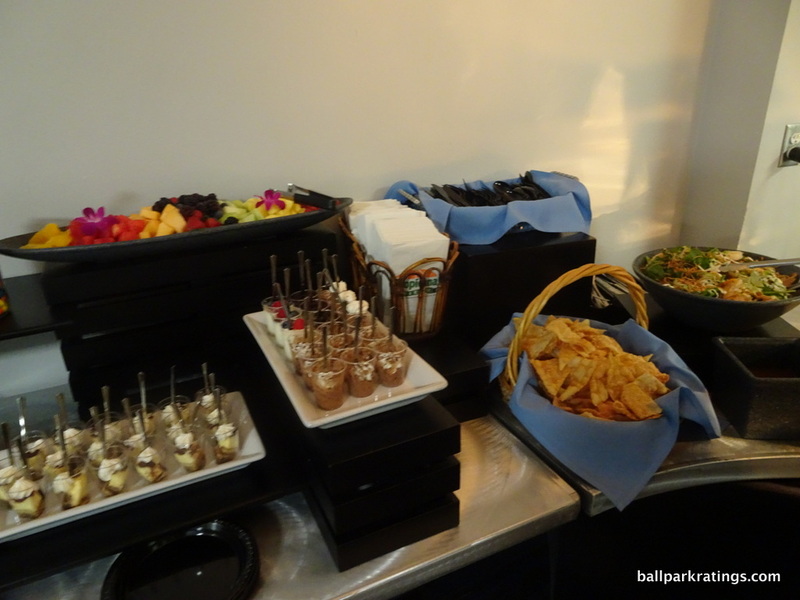 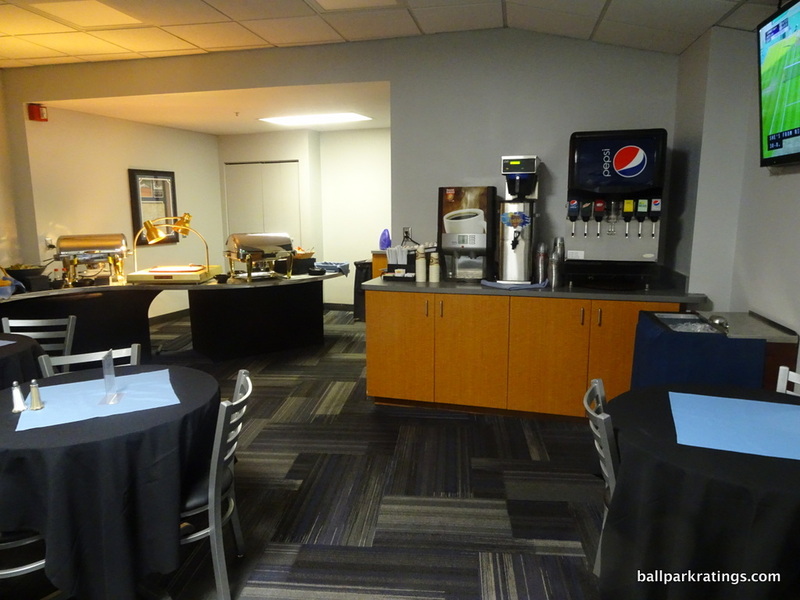 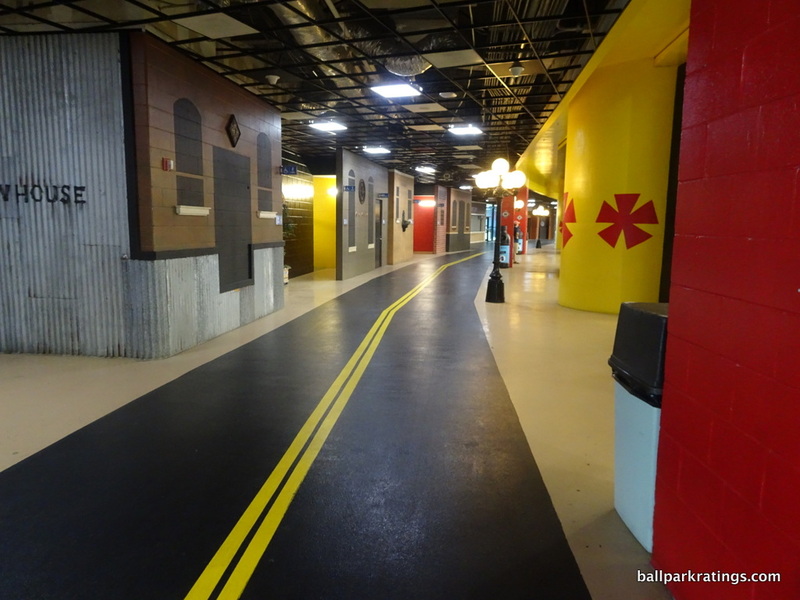 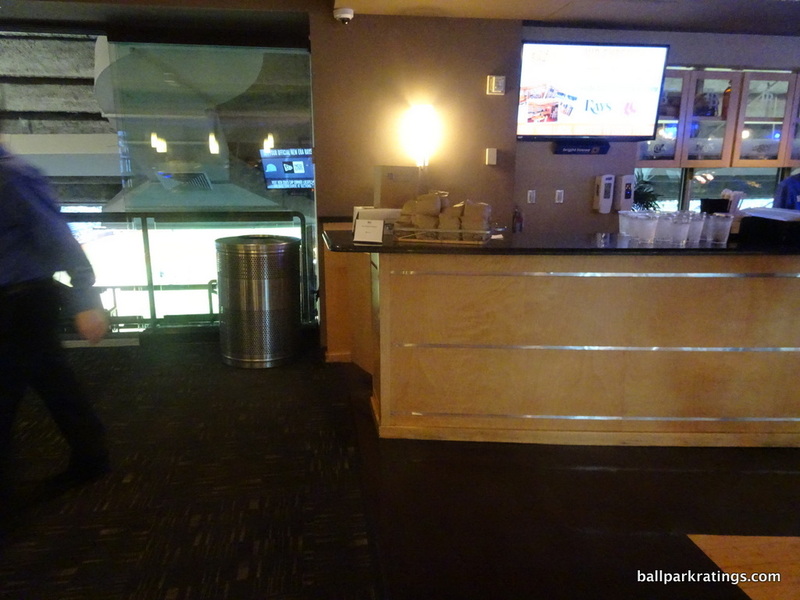 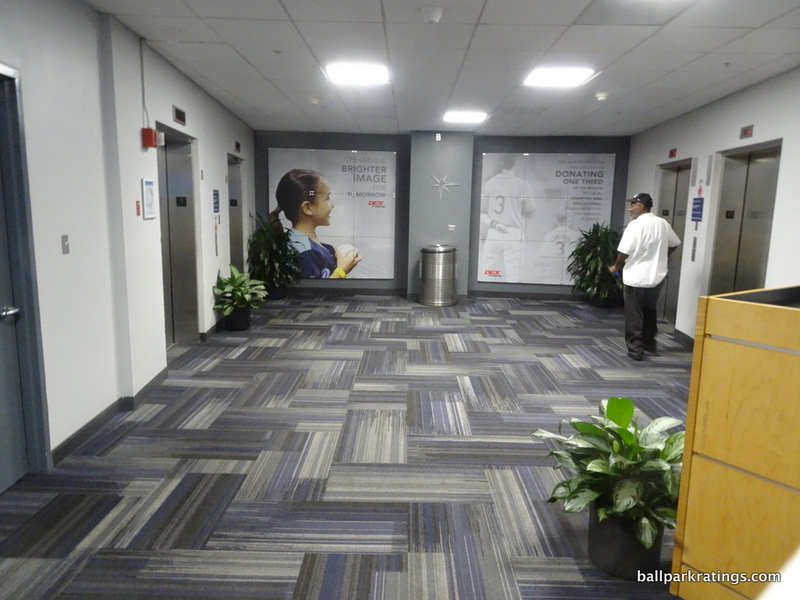 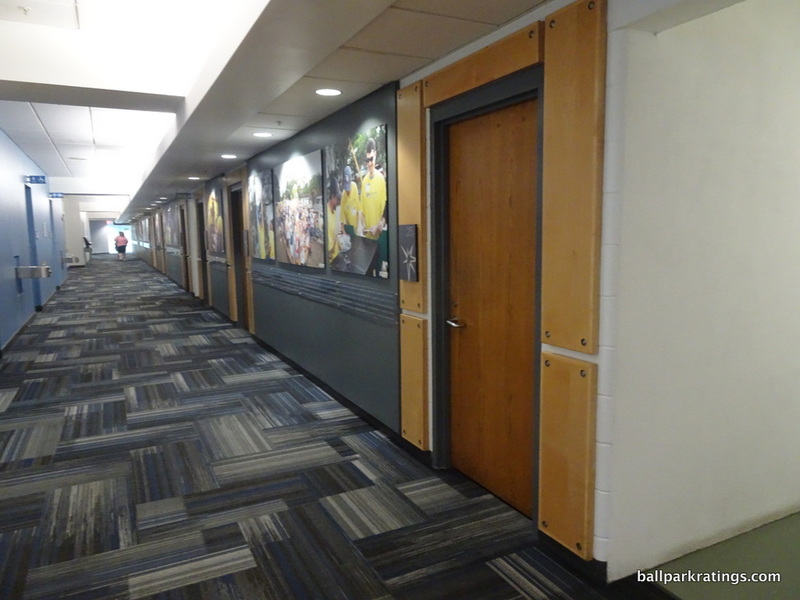 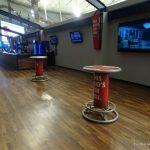 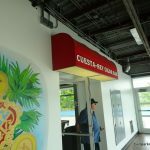 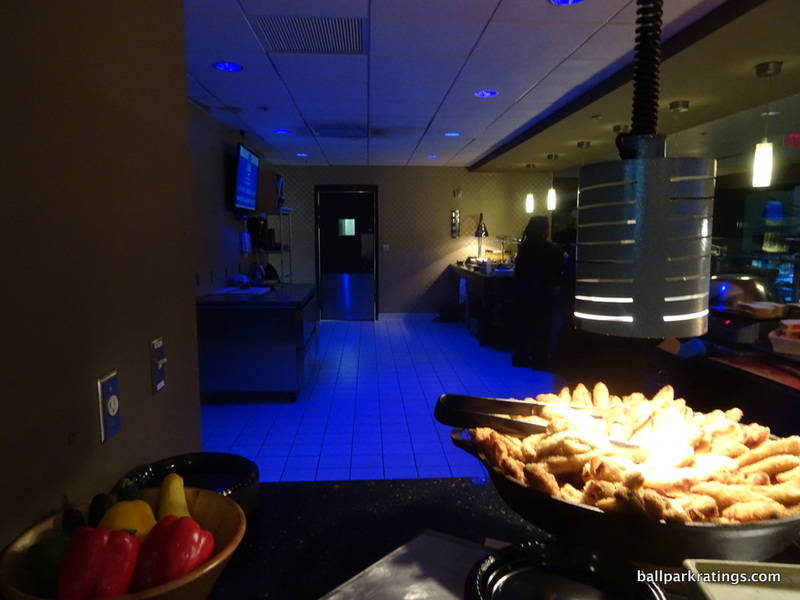 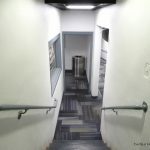 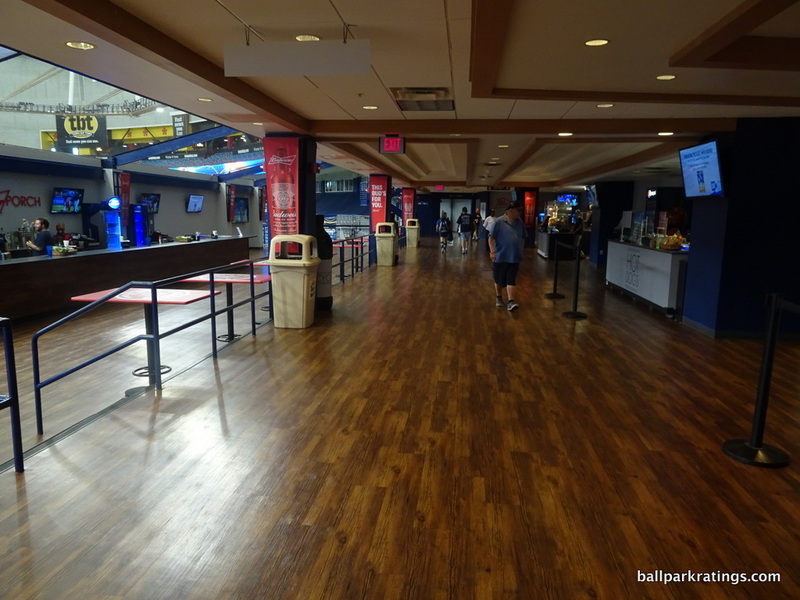 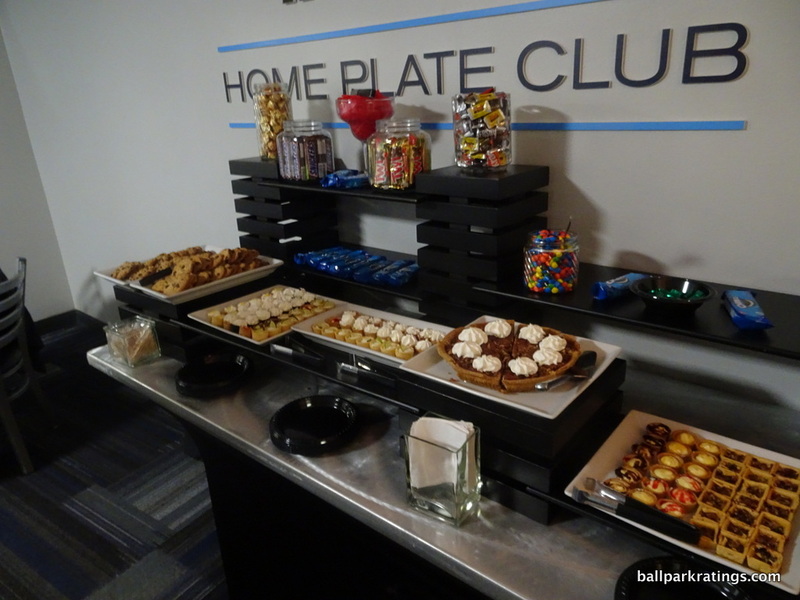 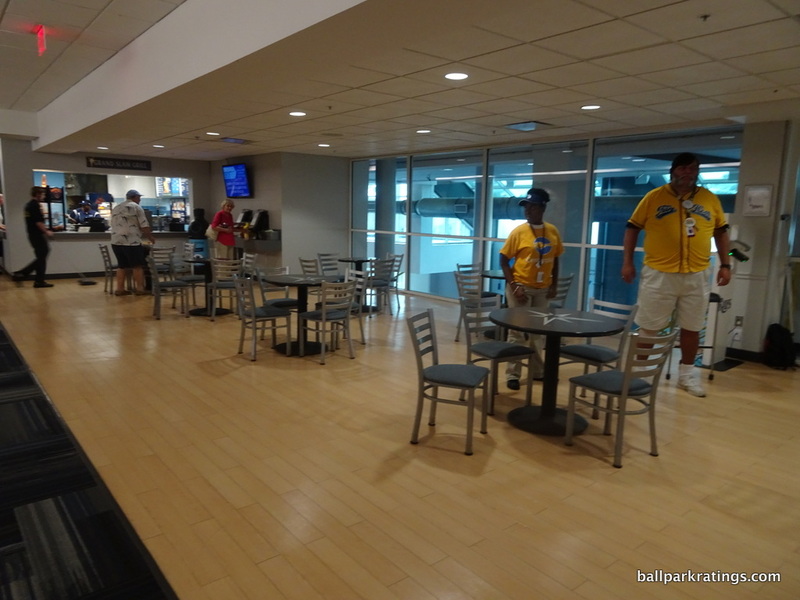 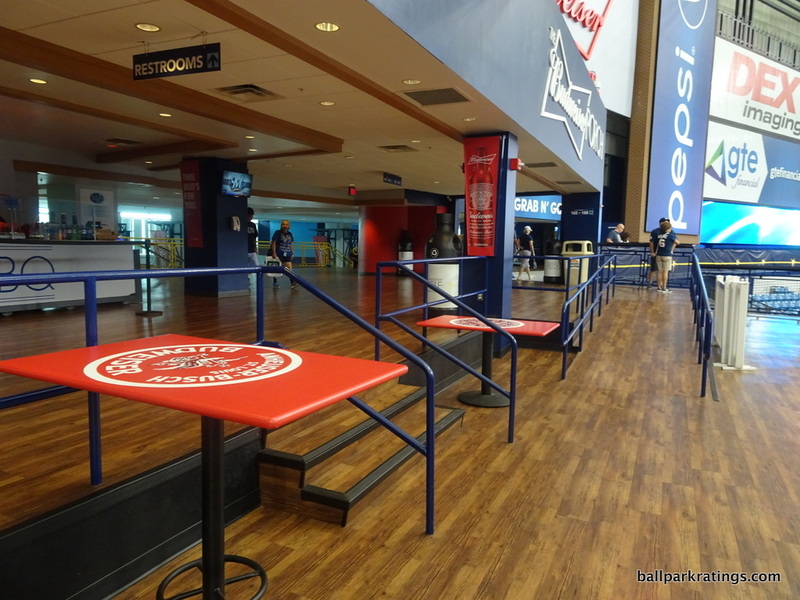 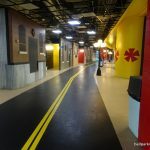 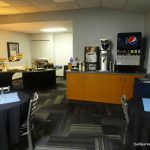 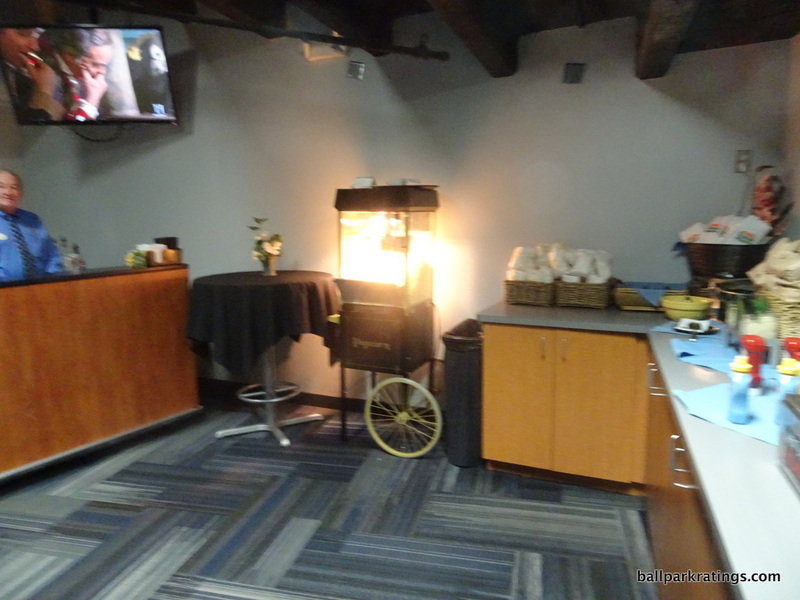 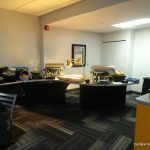 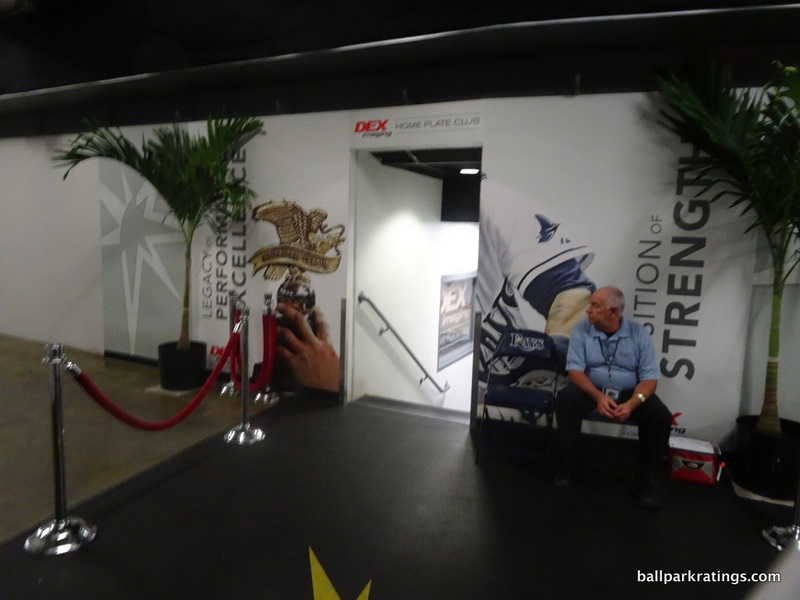 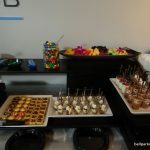 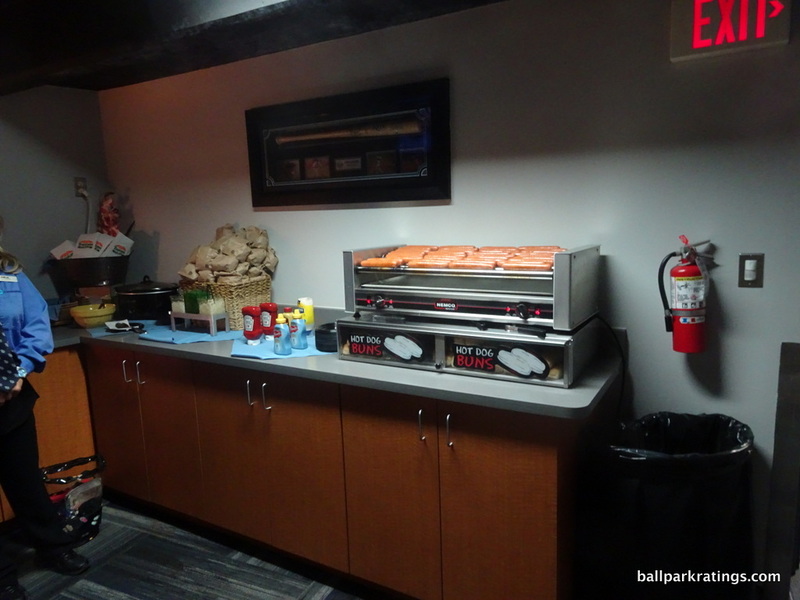 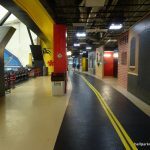 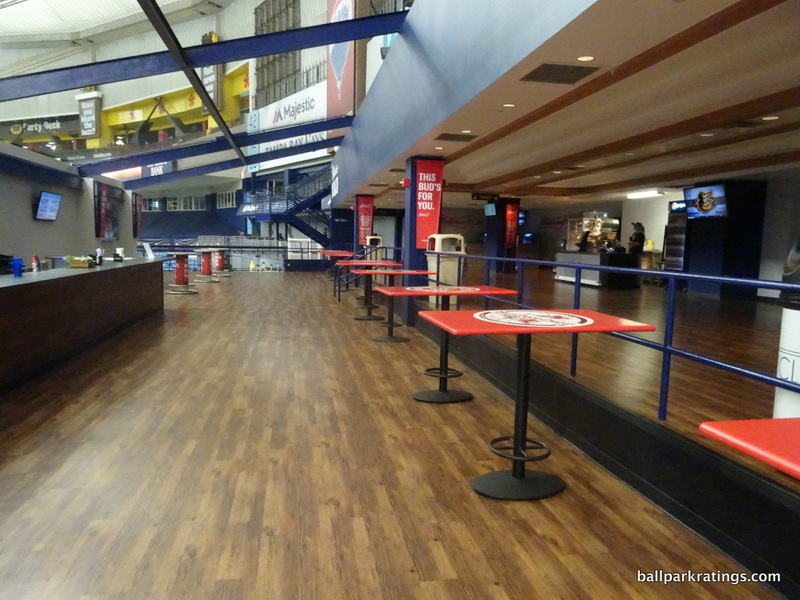 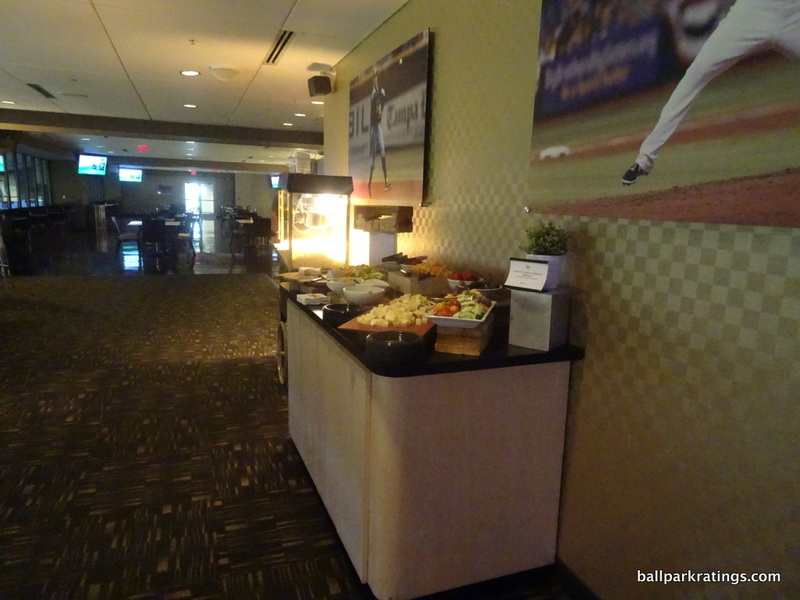 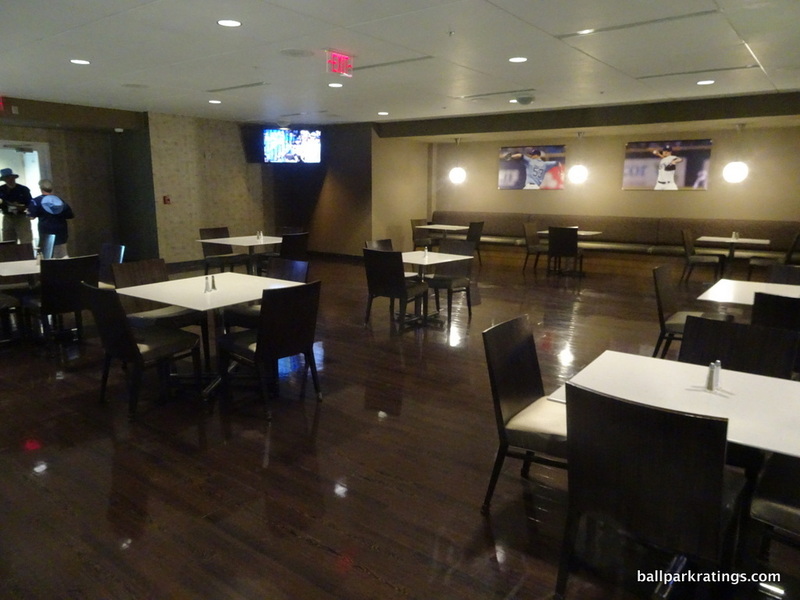 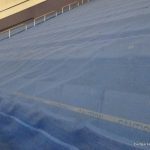 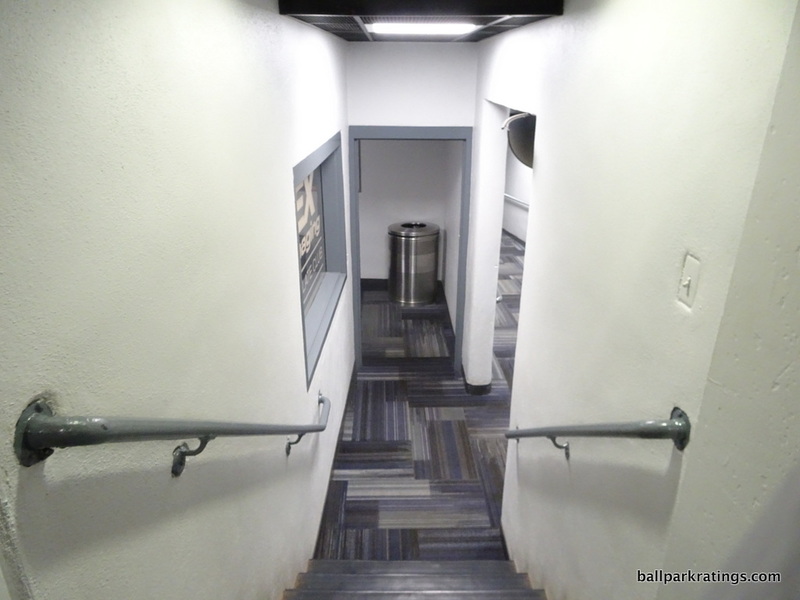 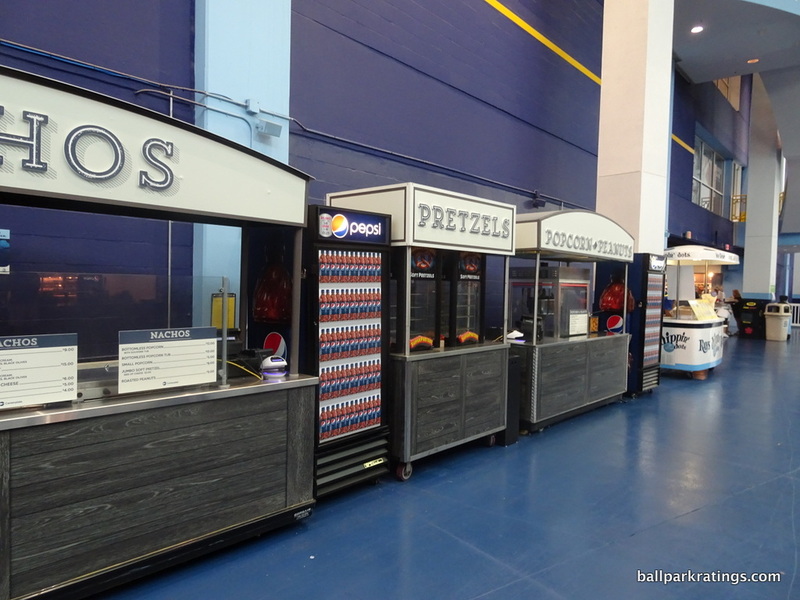 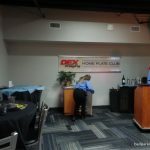 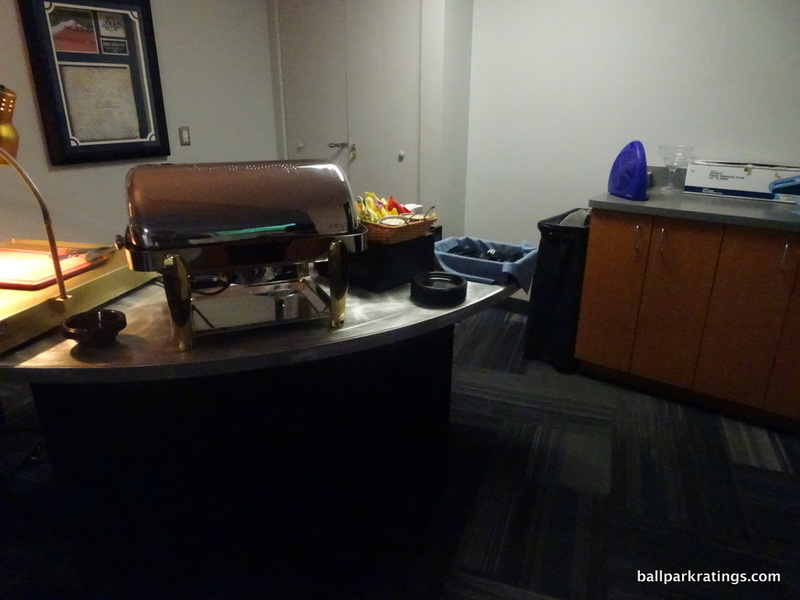 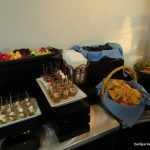 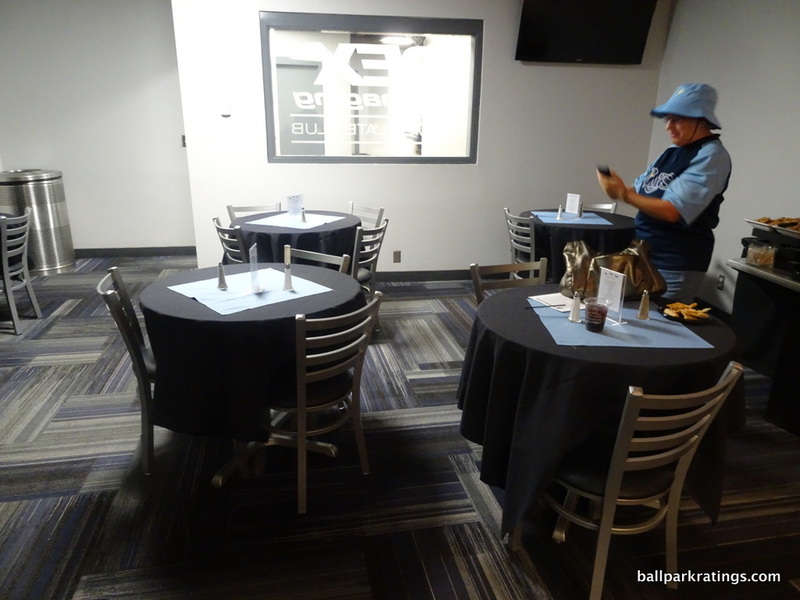 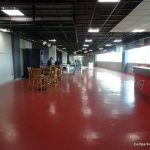 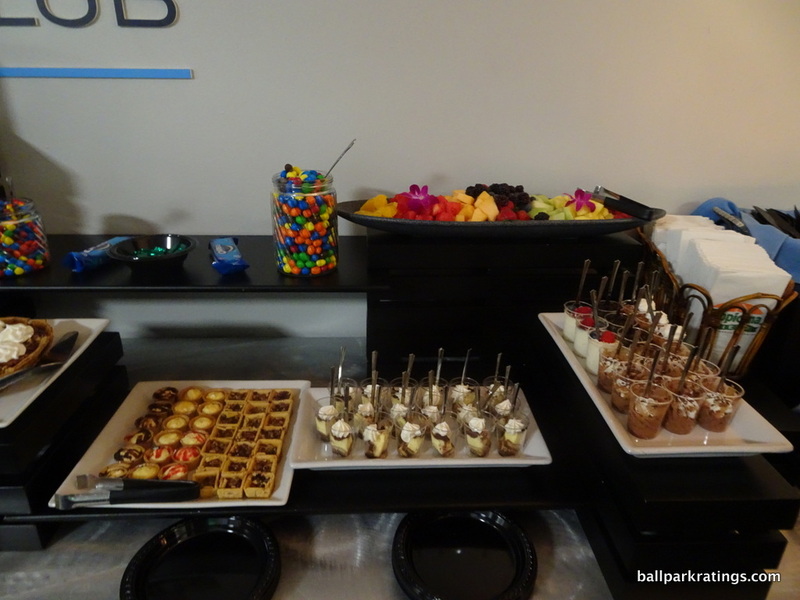 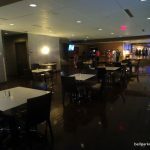 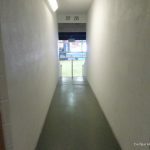 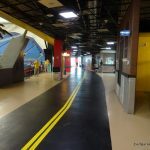 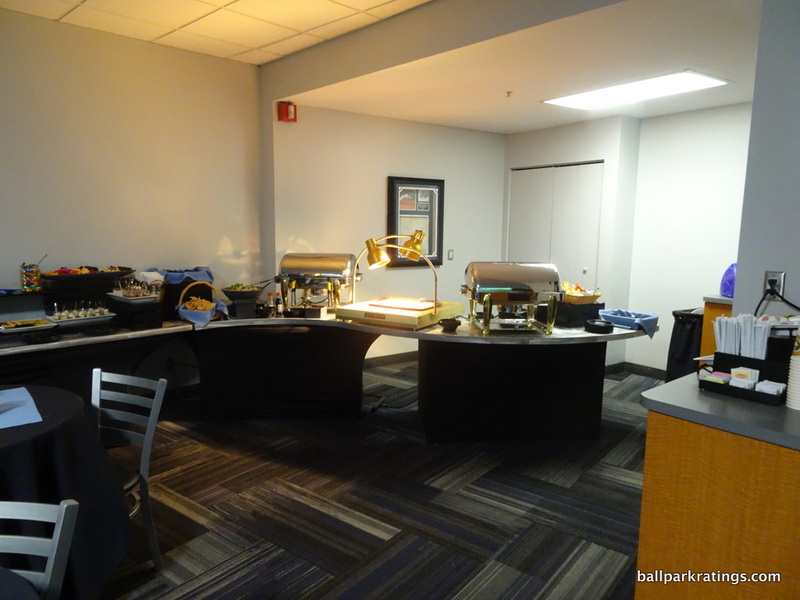 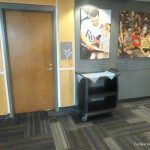 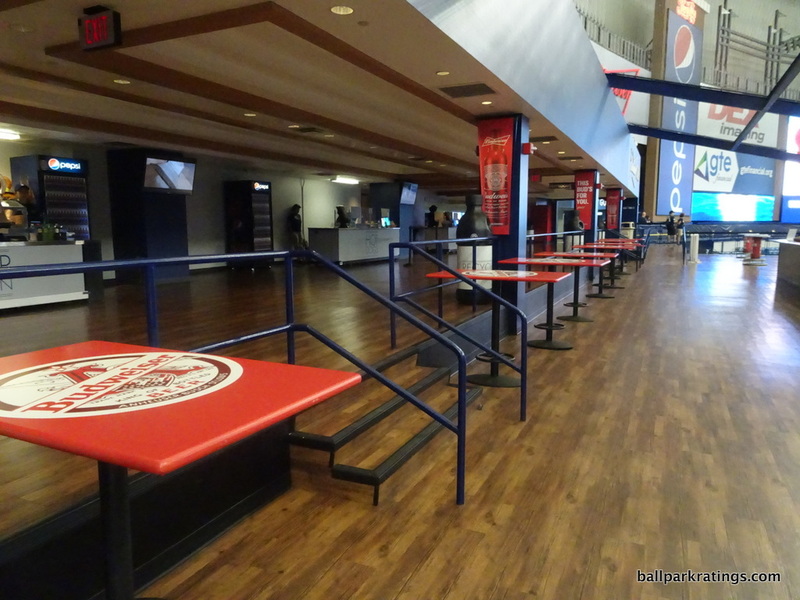 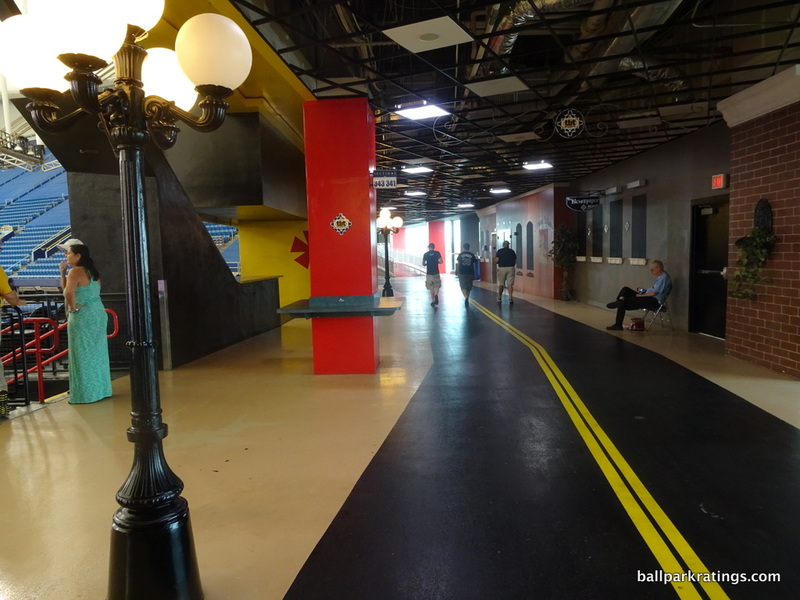 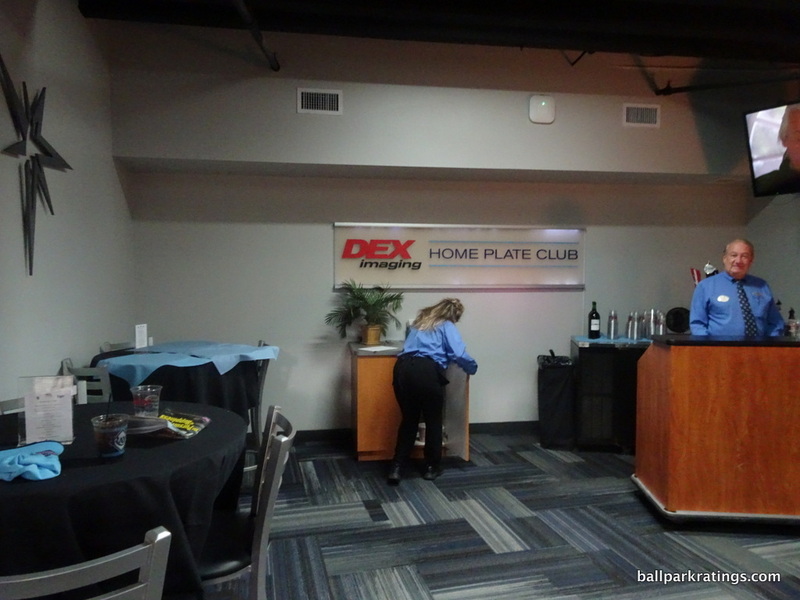 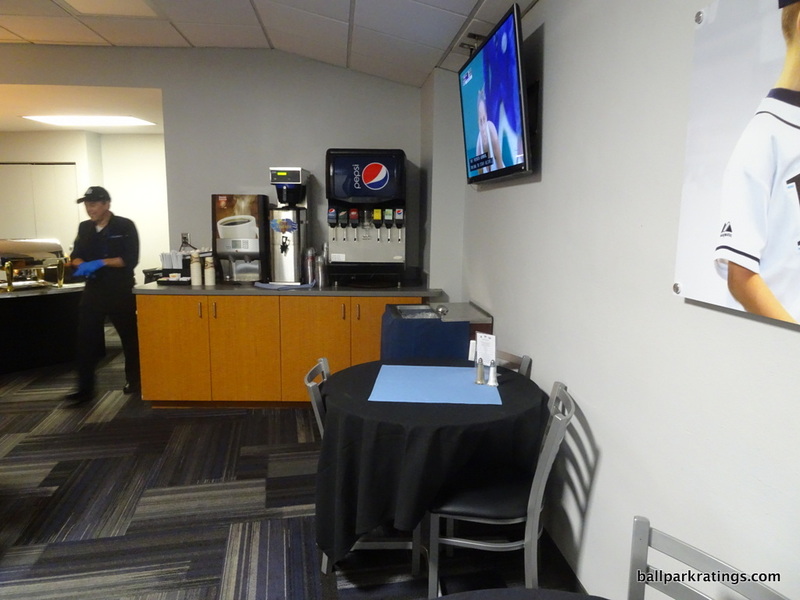 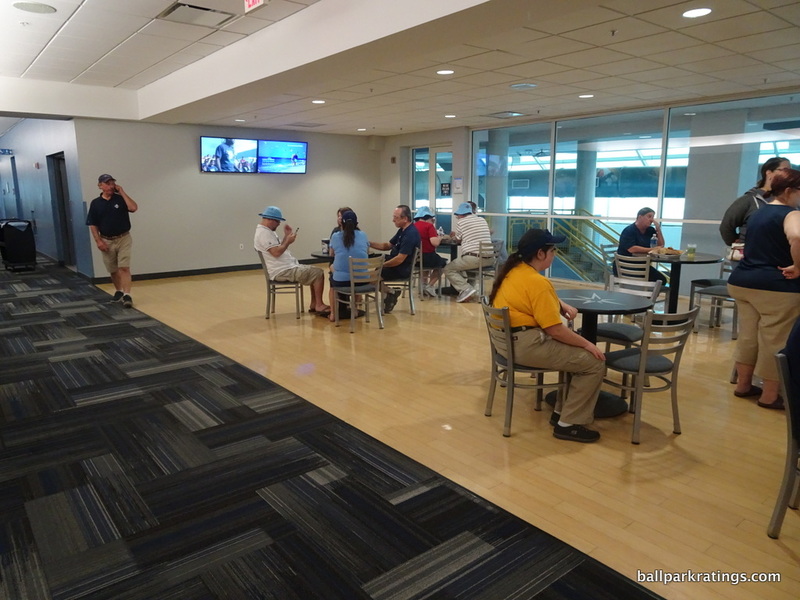 In fact, the amenities start in places accessible to all fans. 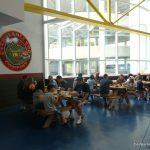 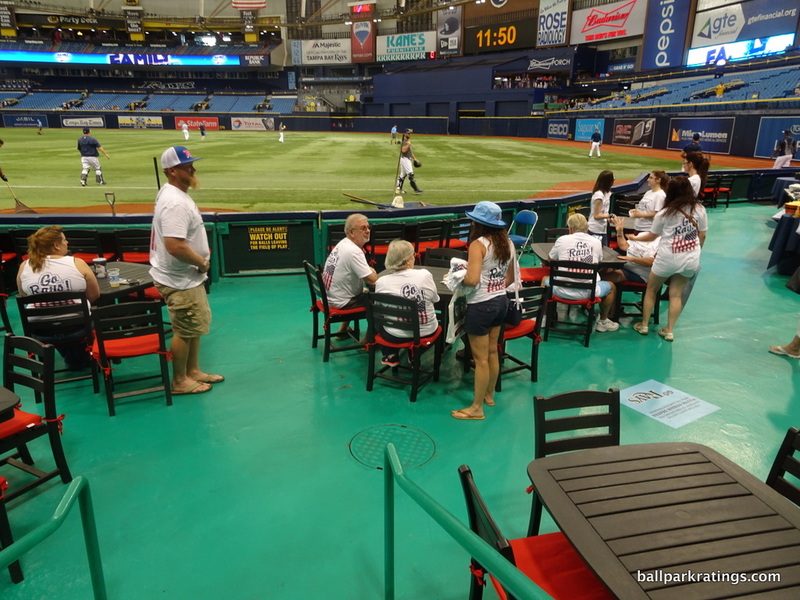 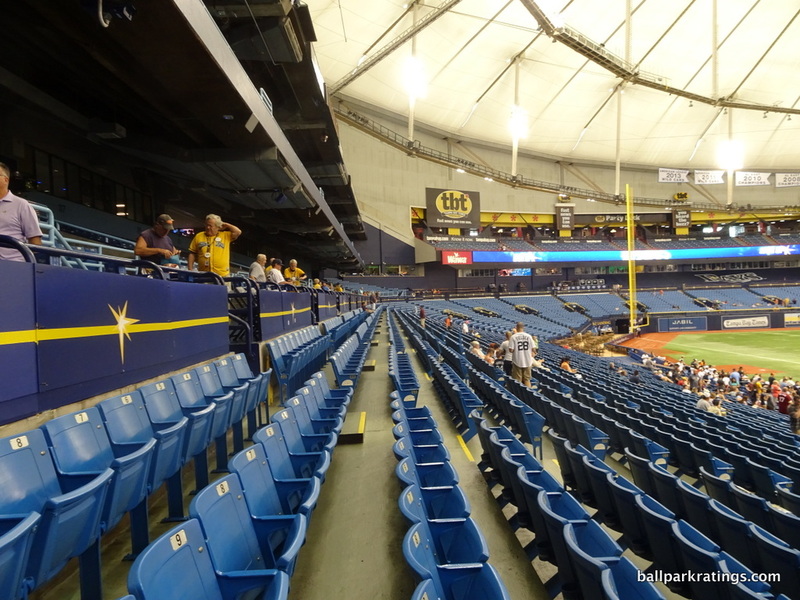 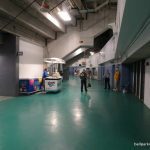 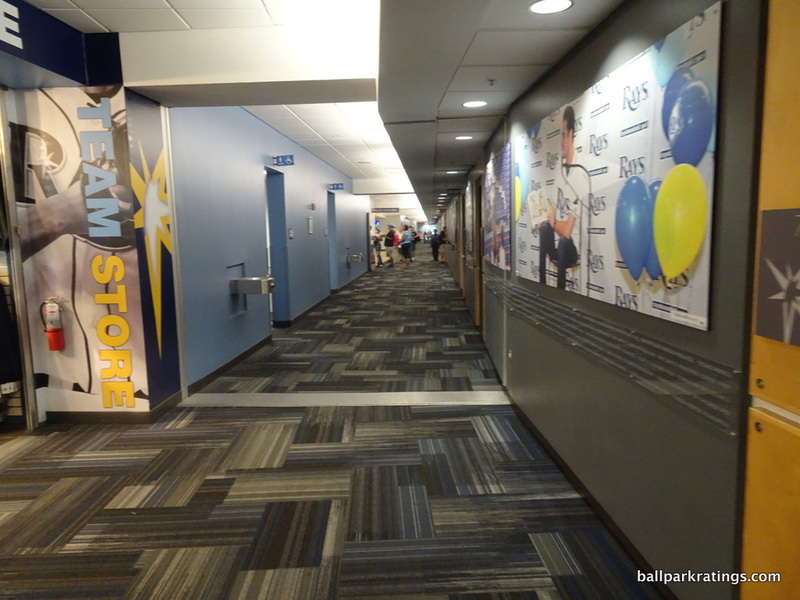 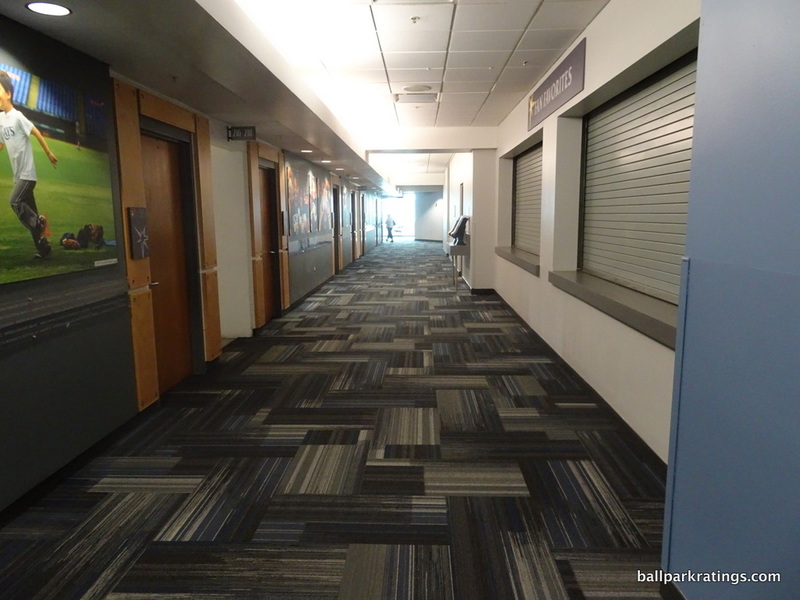 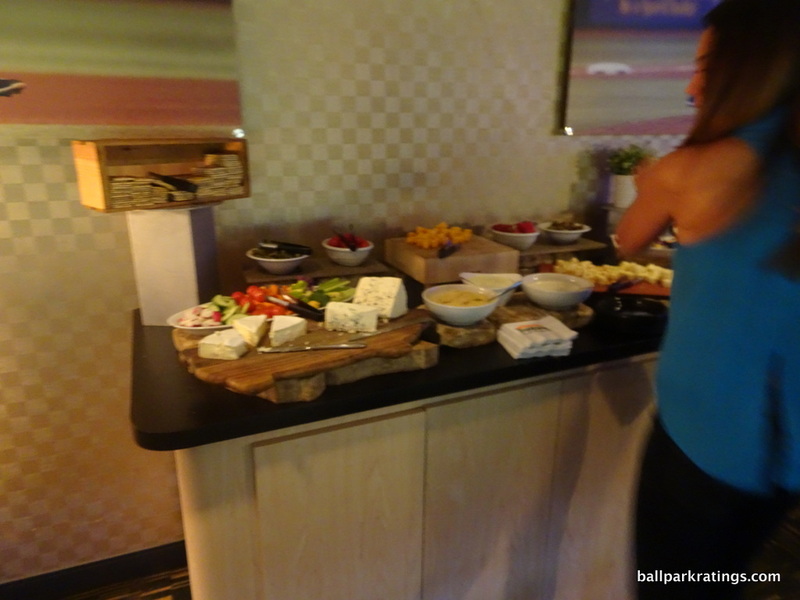 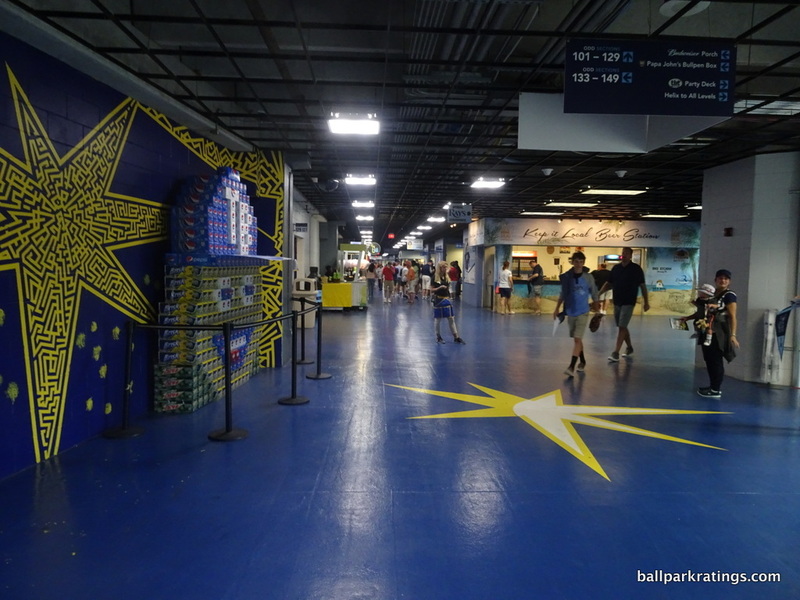 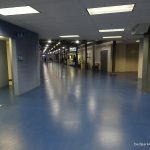 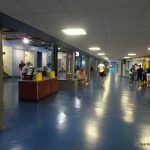 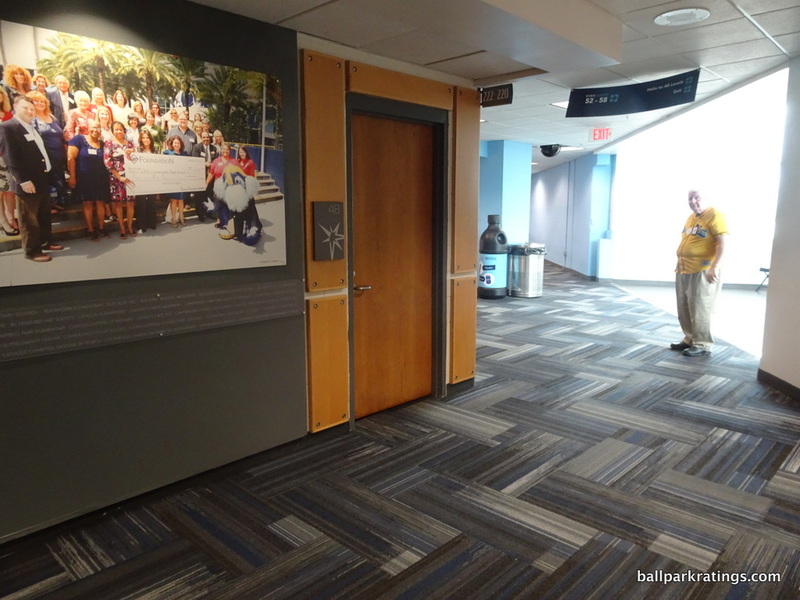 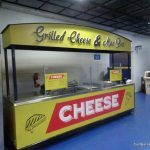 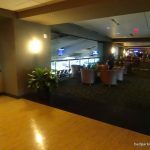 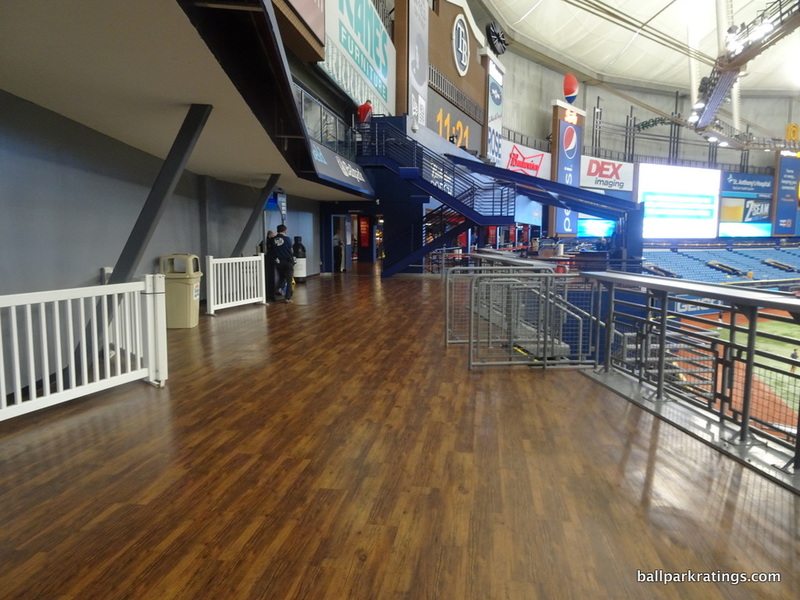 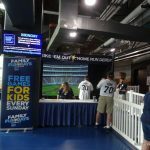 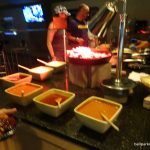 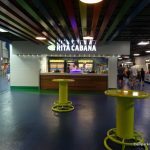 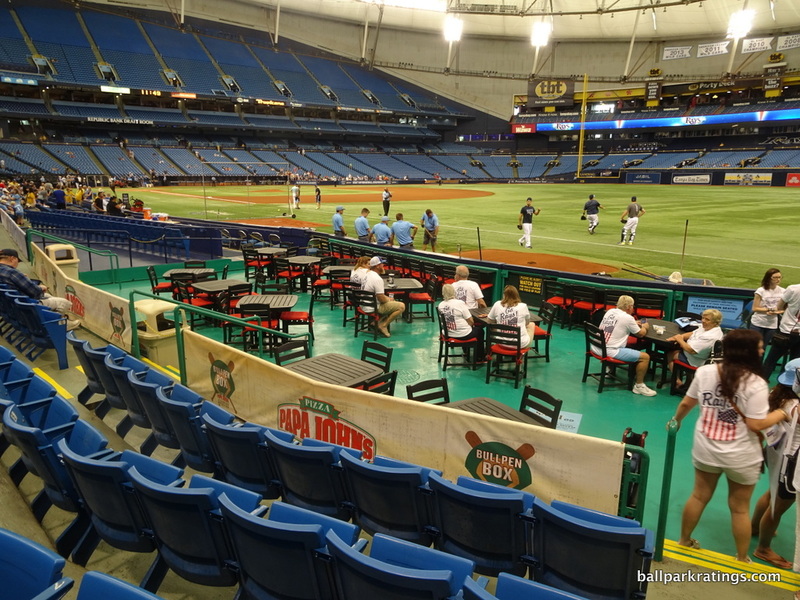 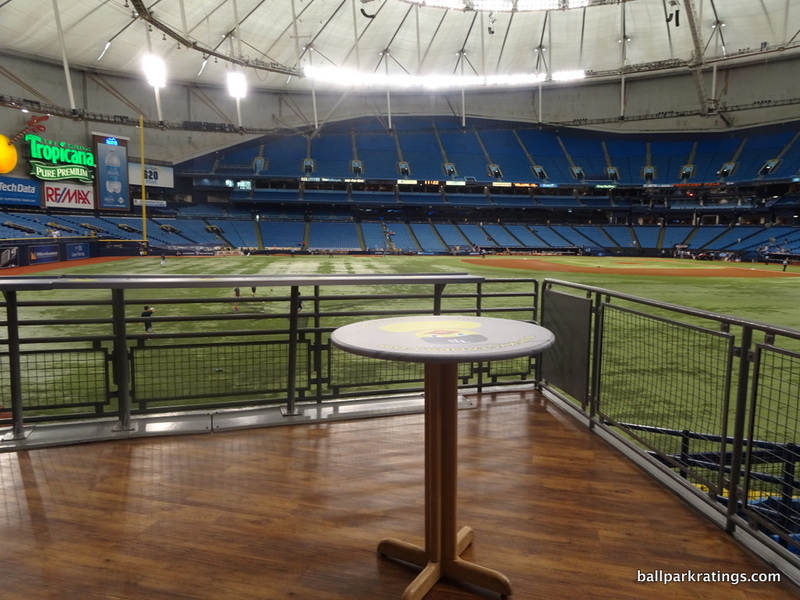 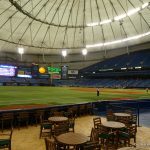 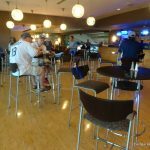 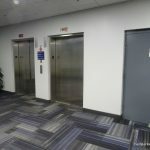 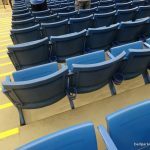 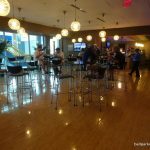 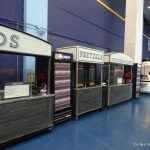 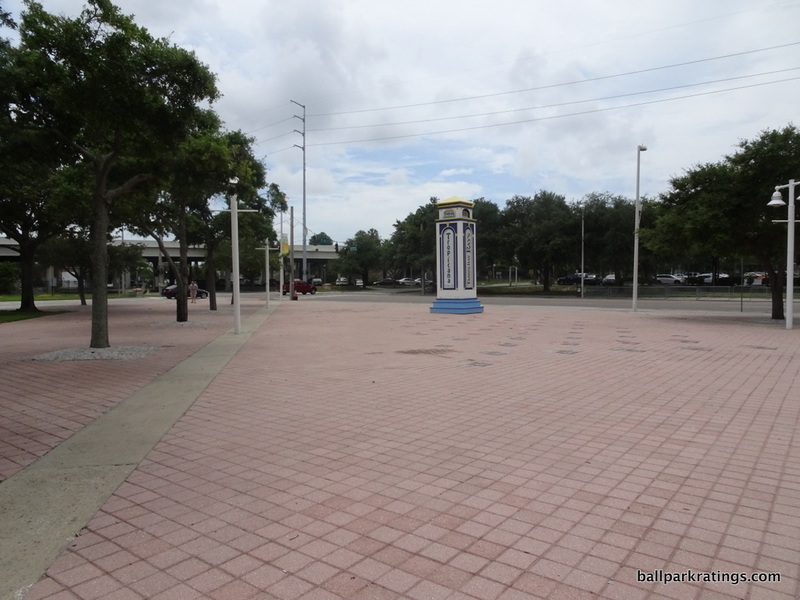 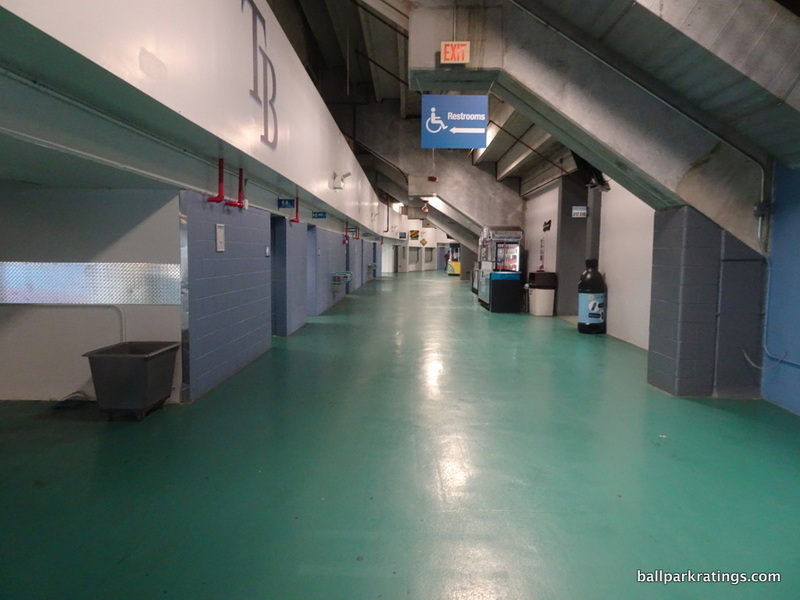 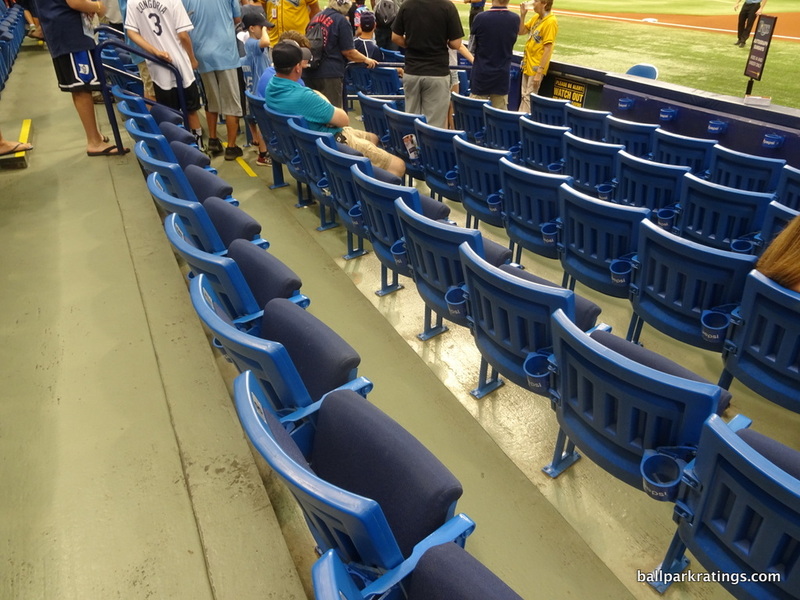 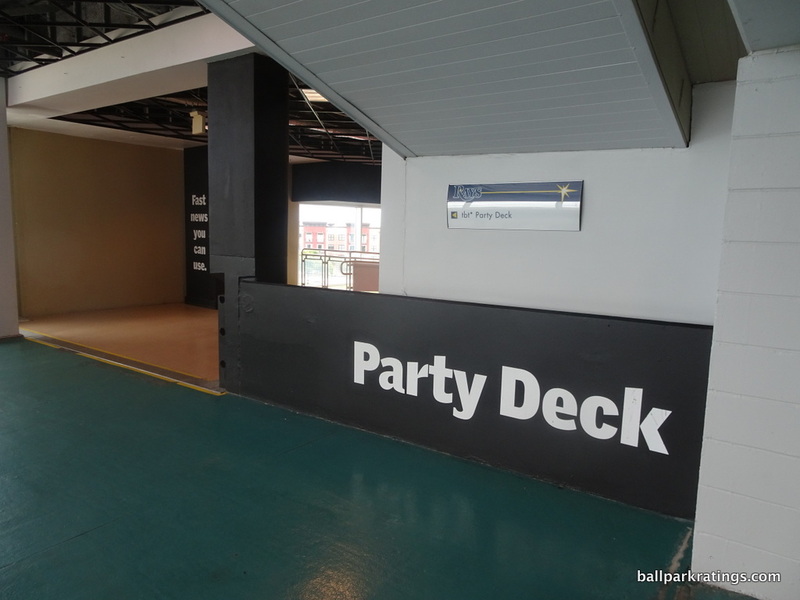 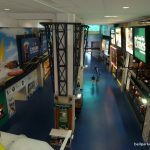 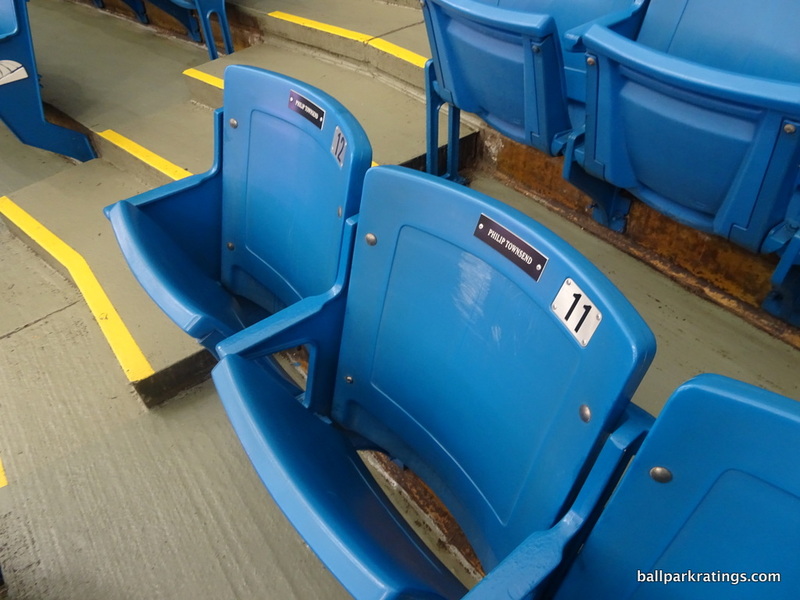 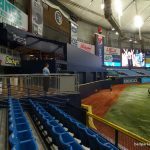 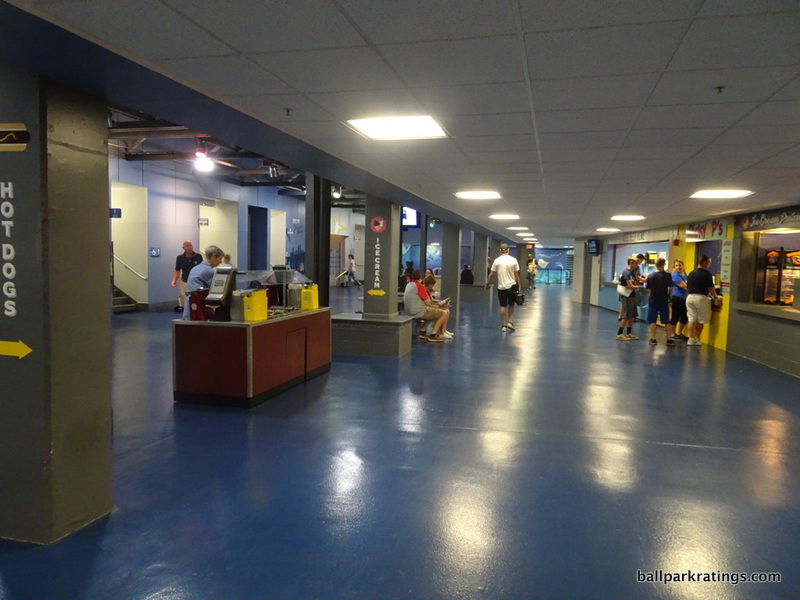 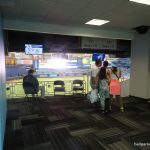 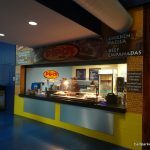 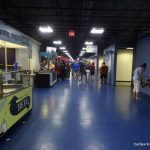 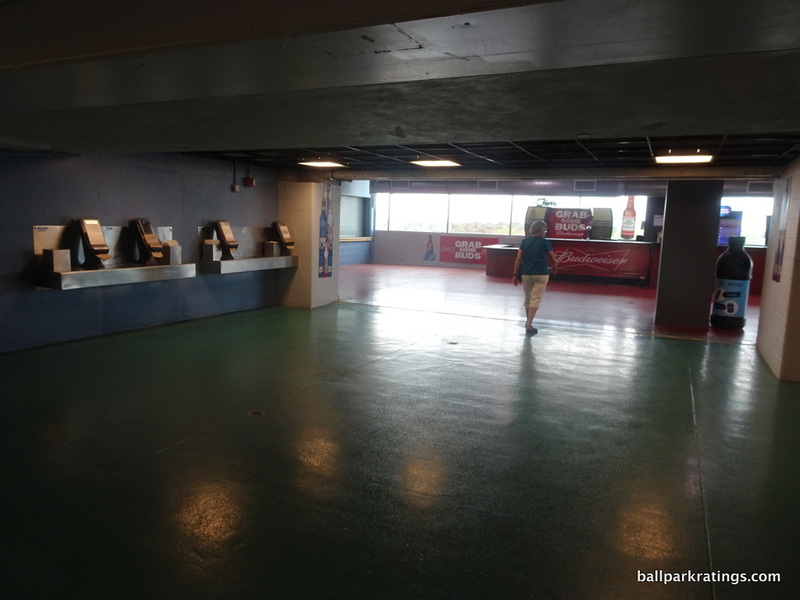 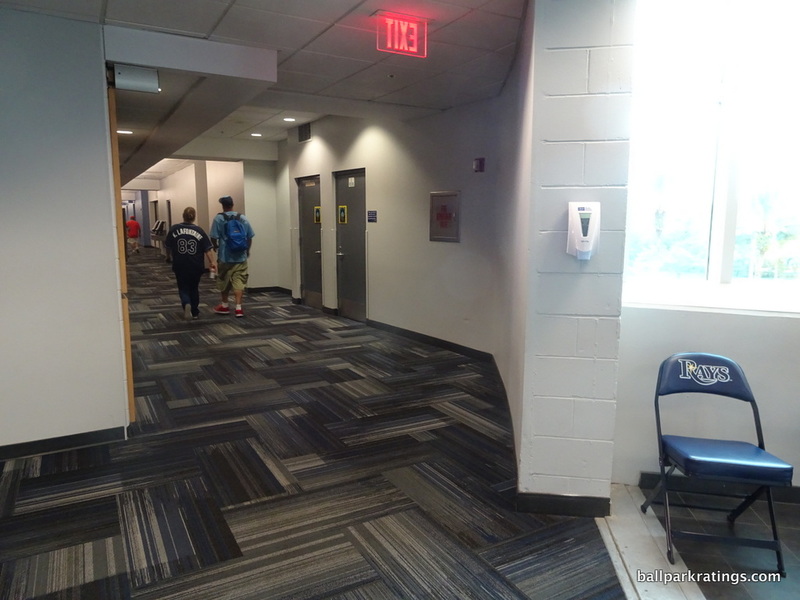 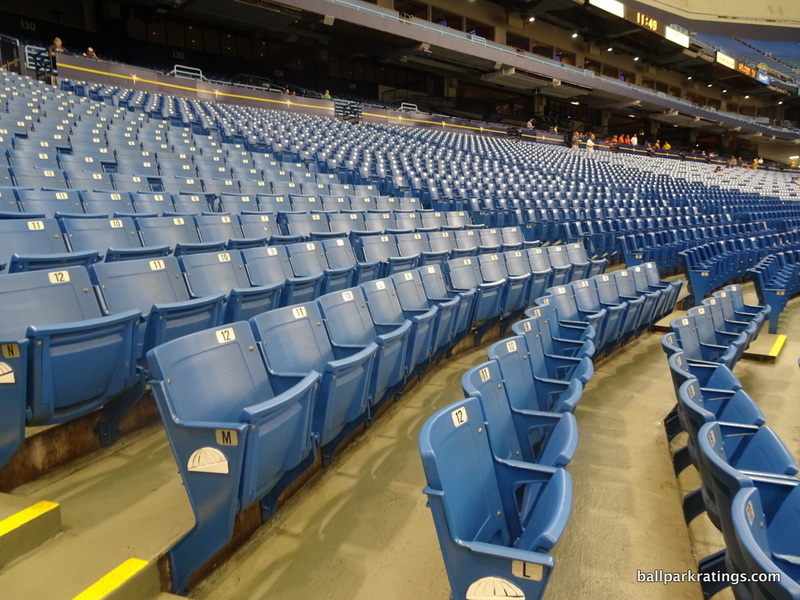 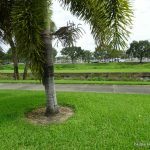 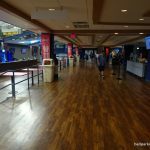 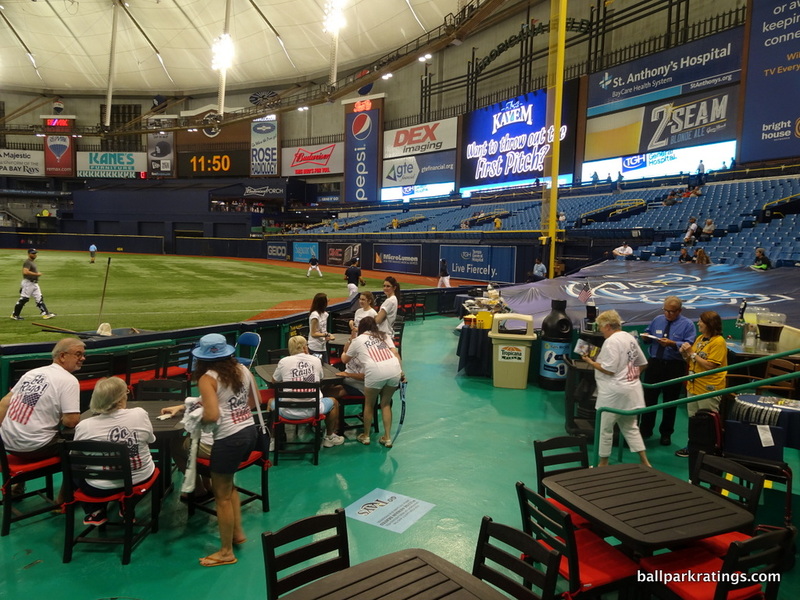 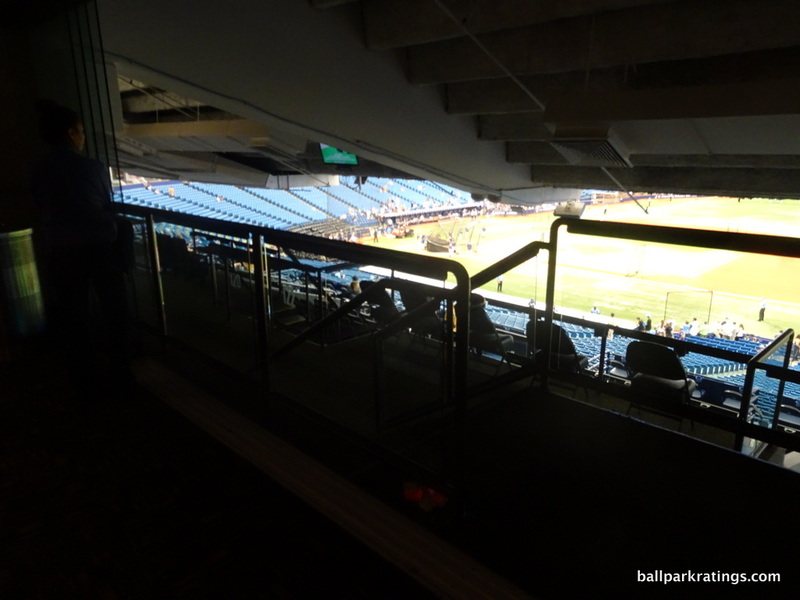 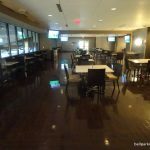 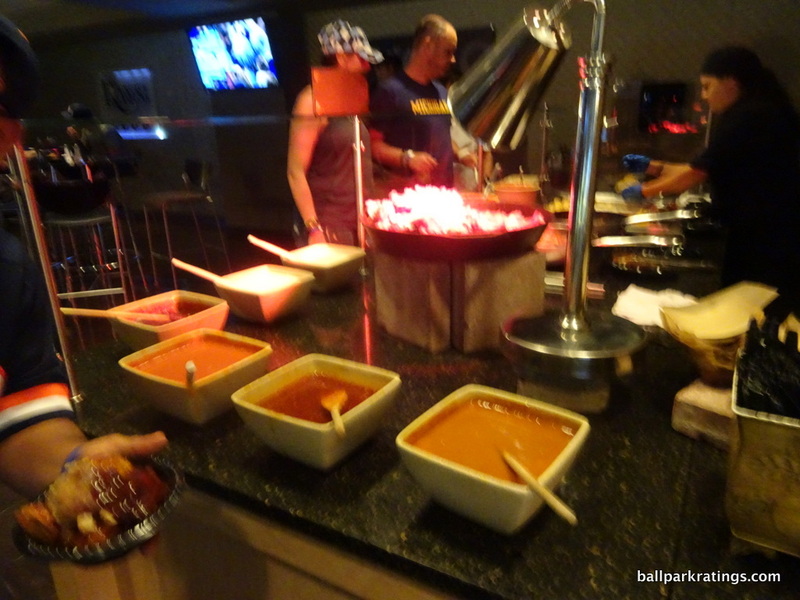 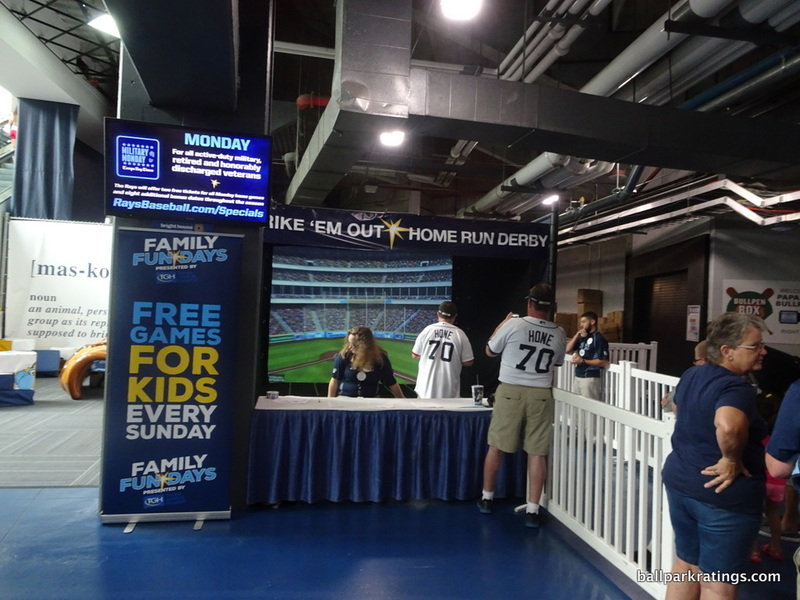 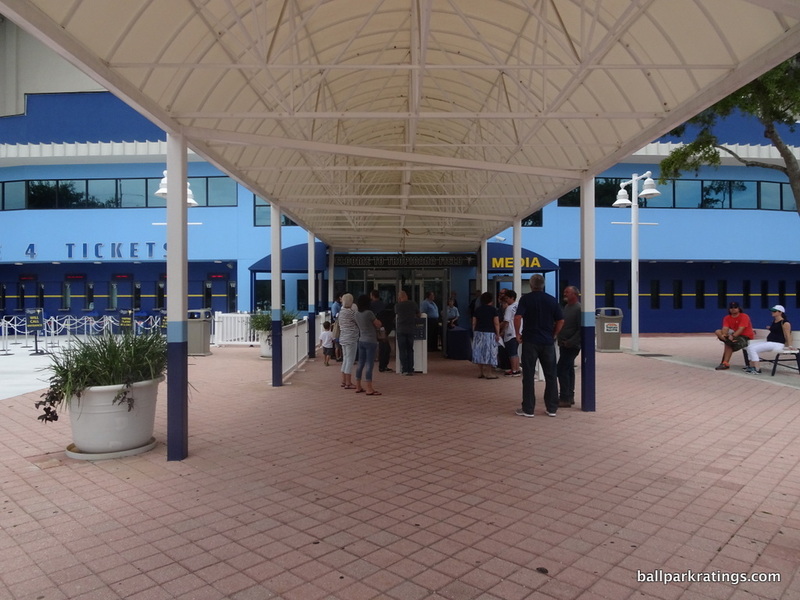 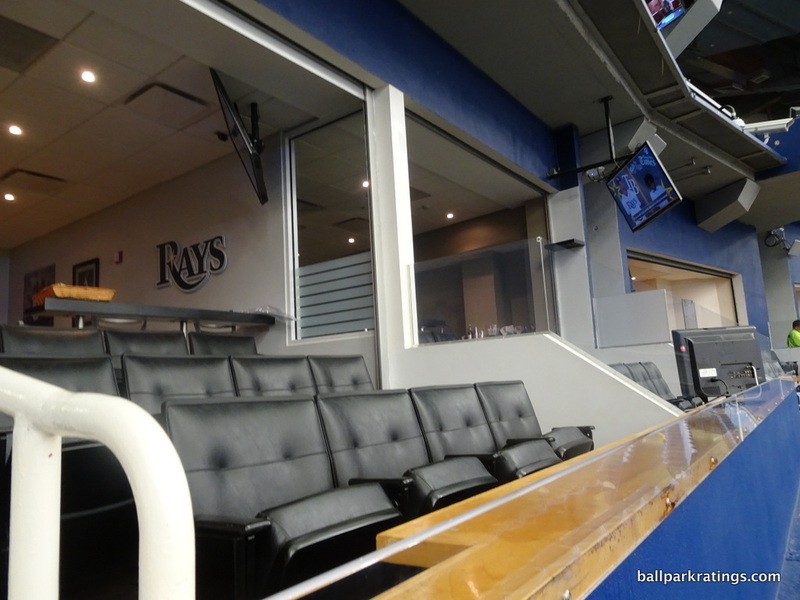 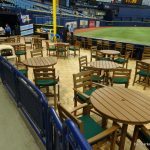 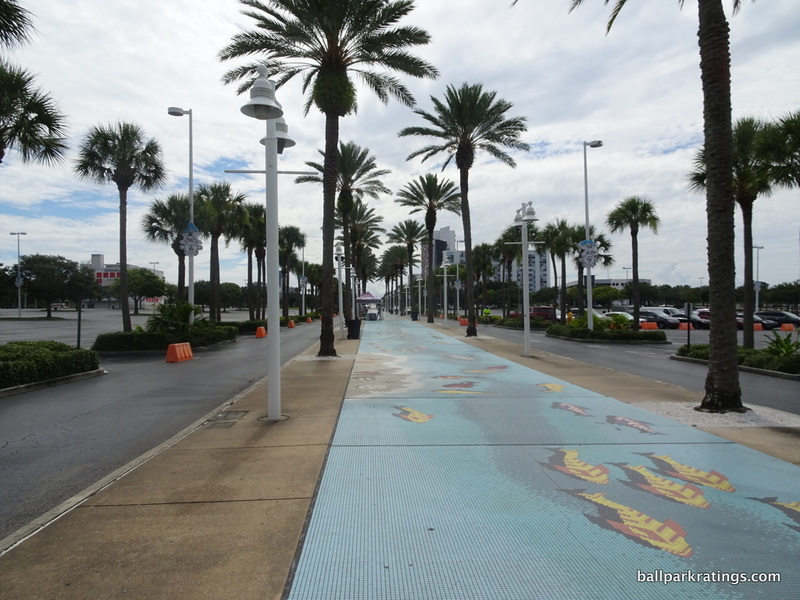 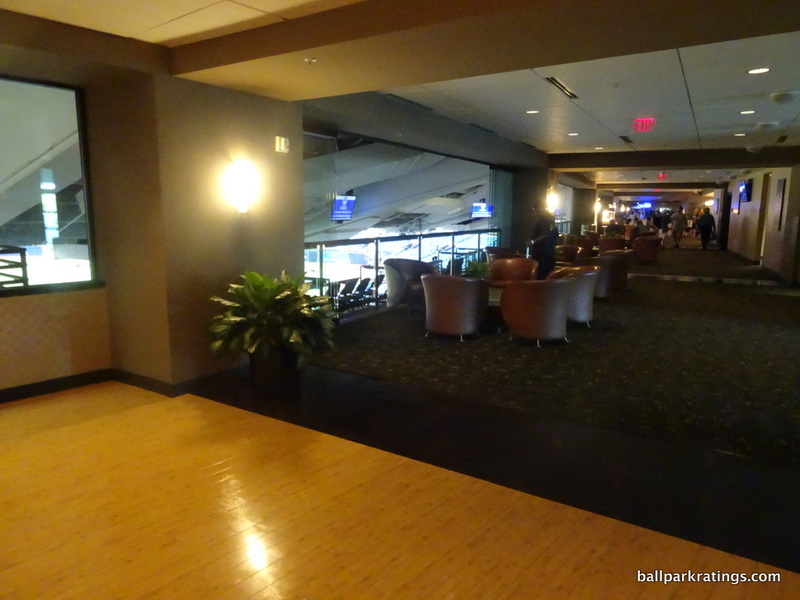 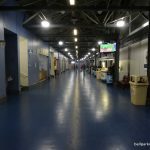 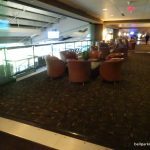 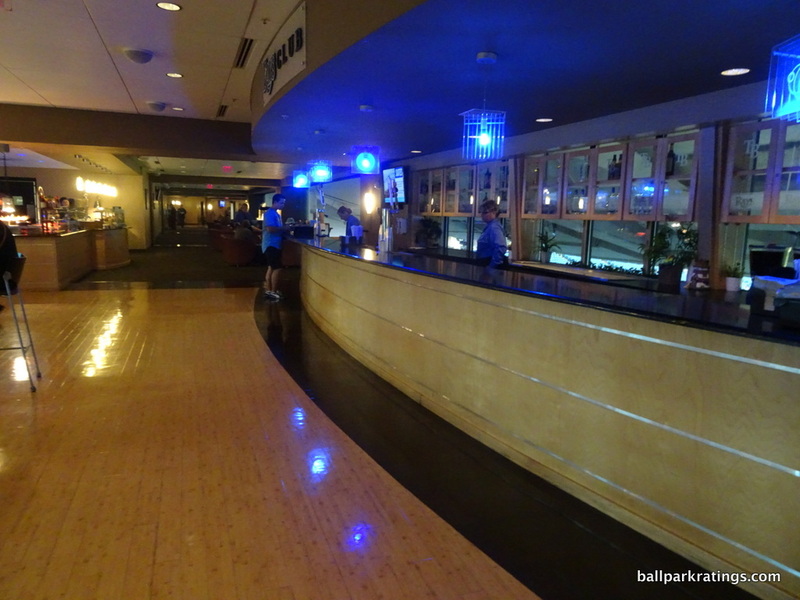 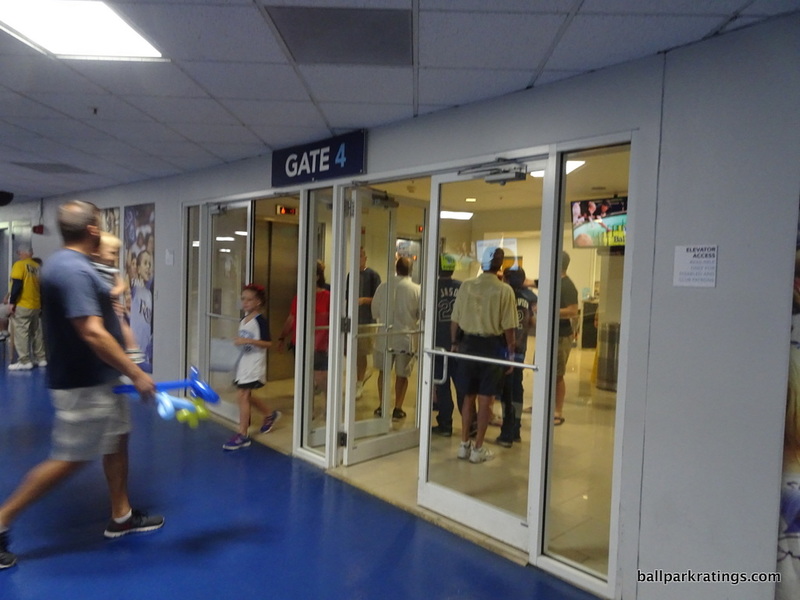 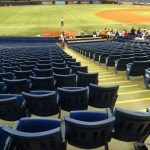 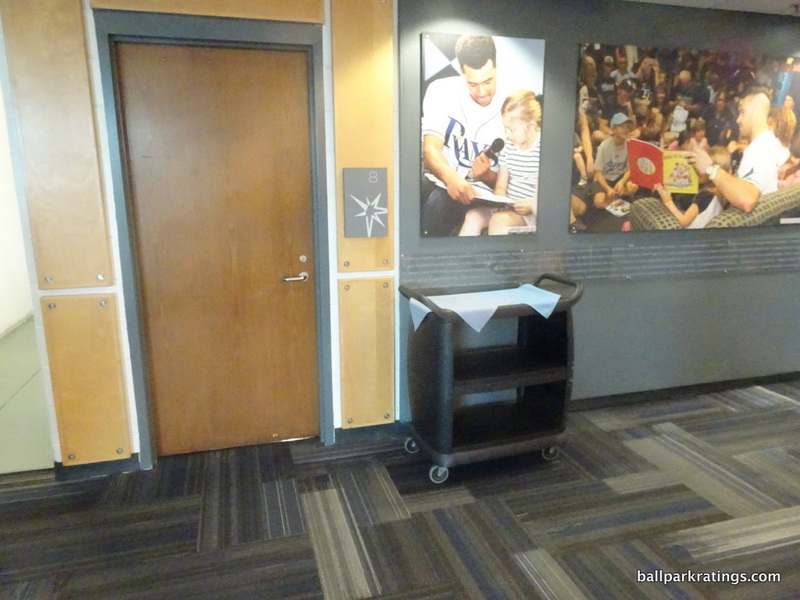 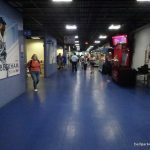 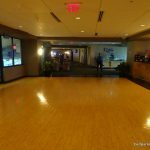 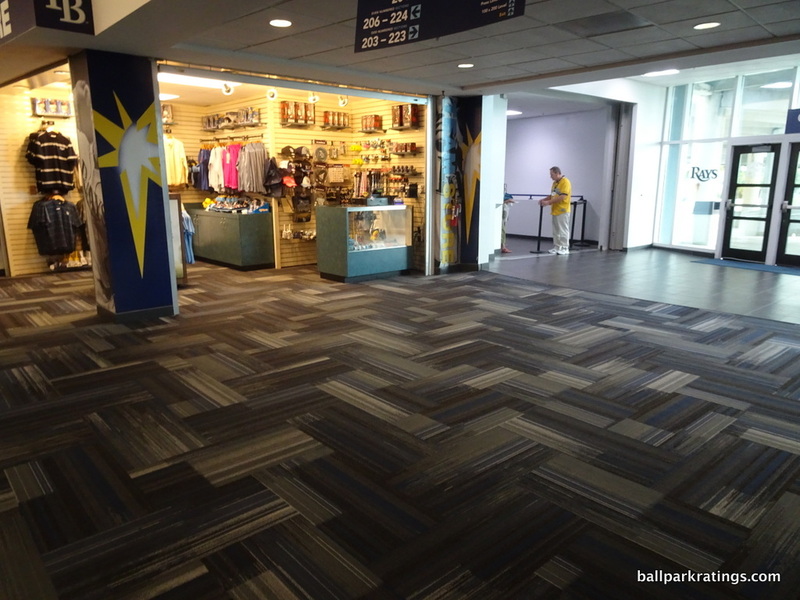 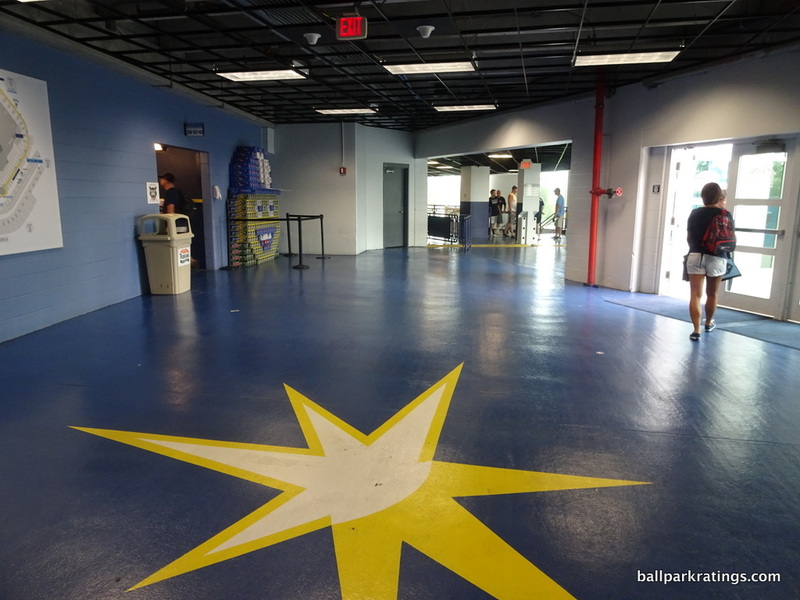 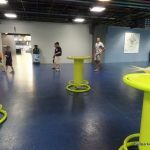 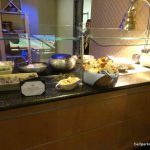 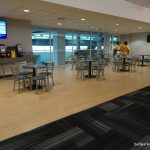 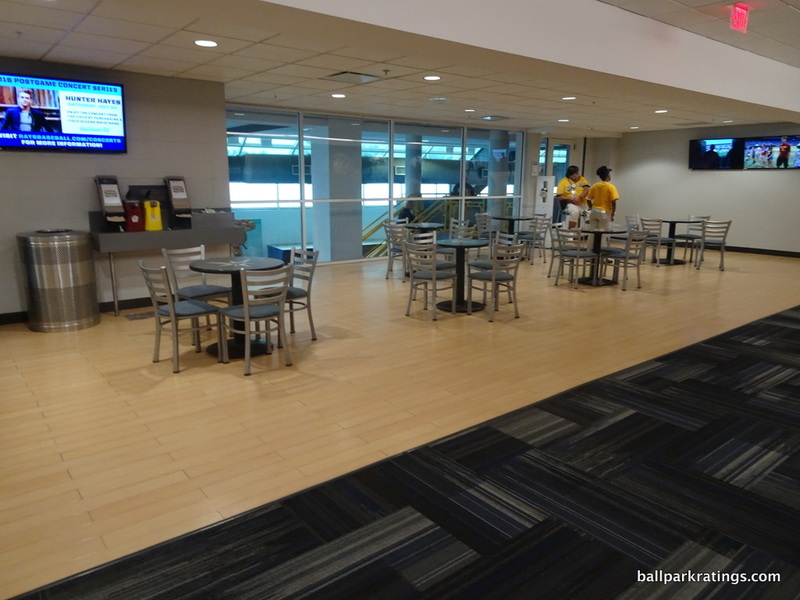 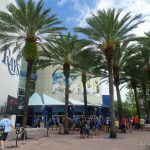 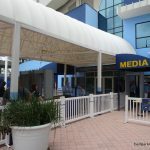 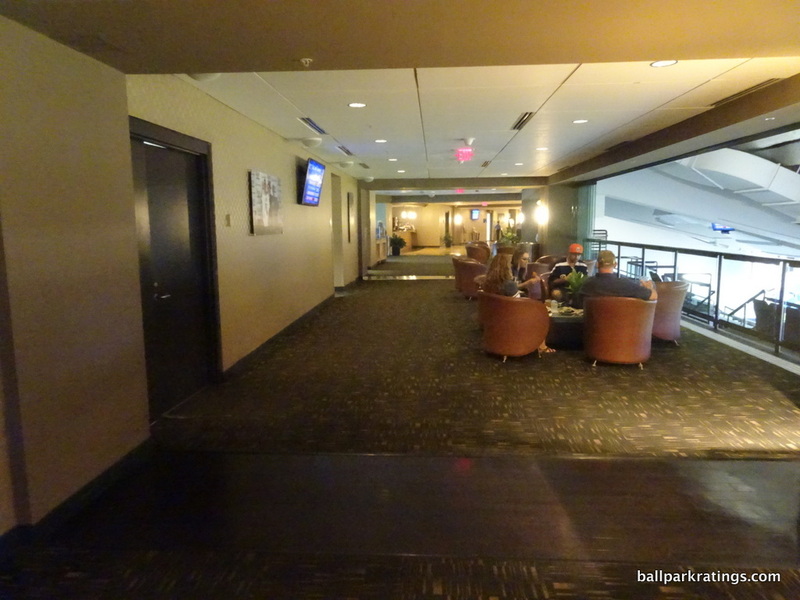 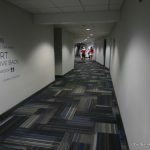 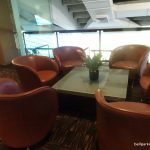 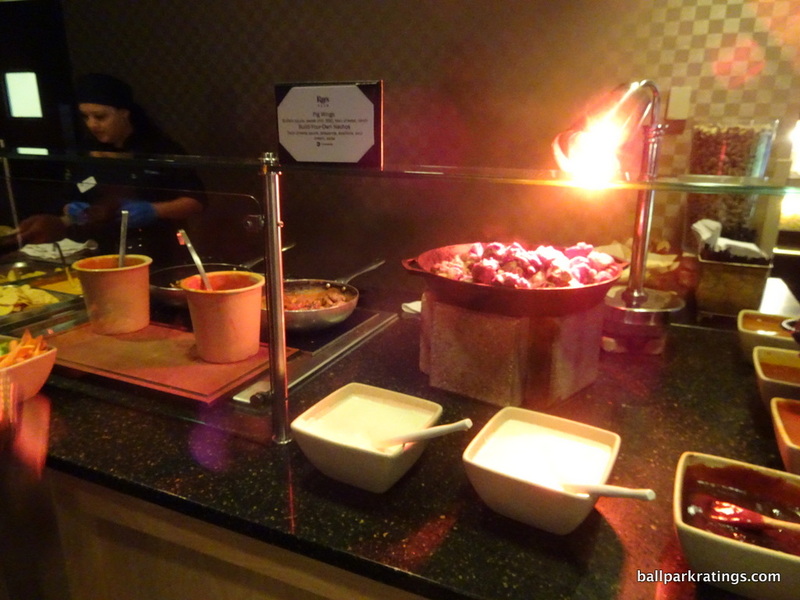 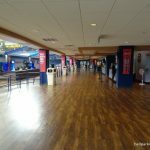 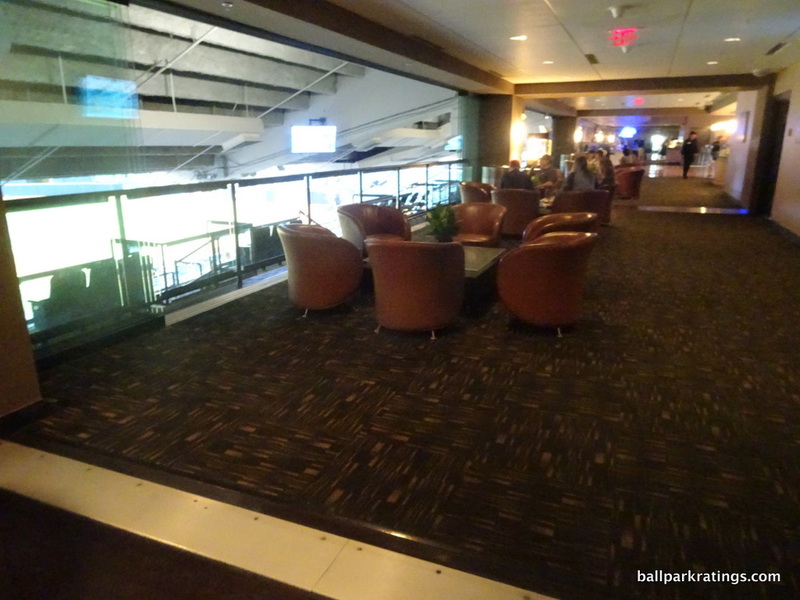 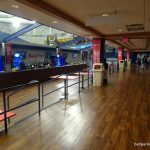 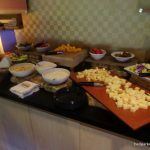 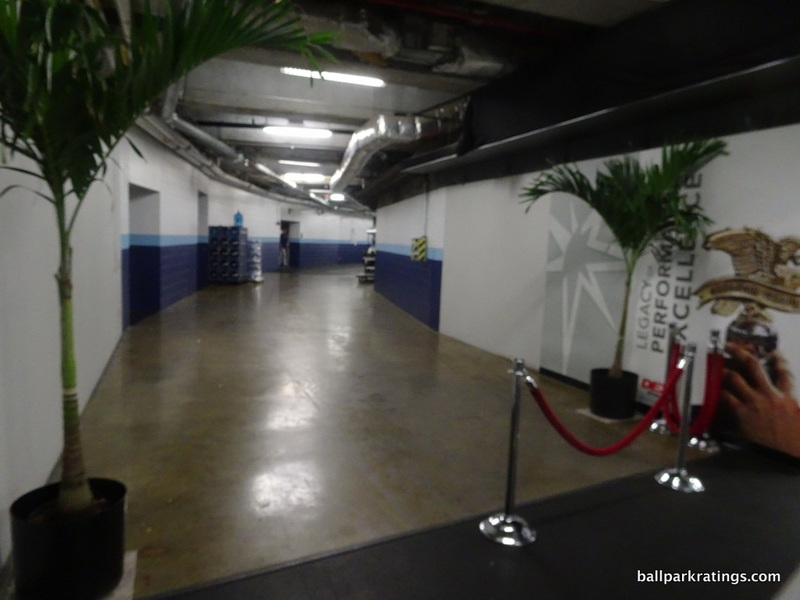 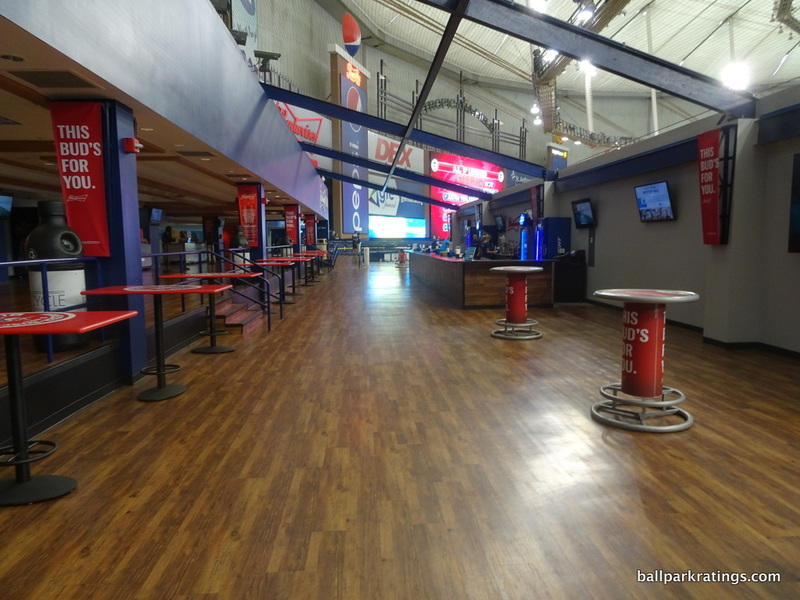 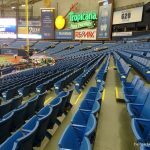 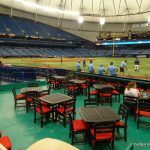 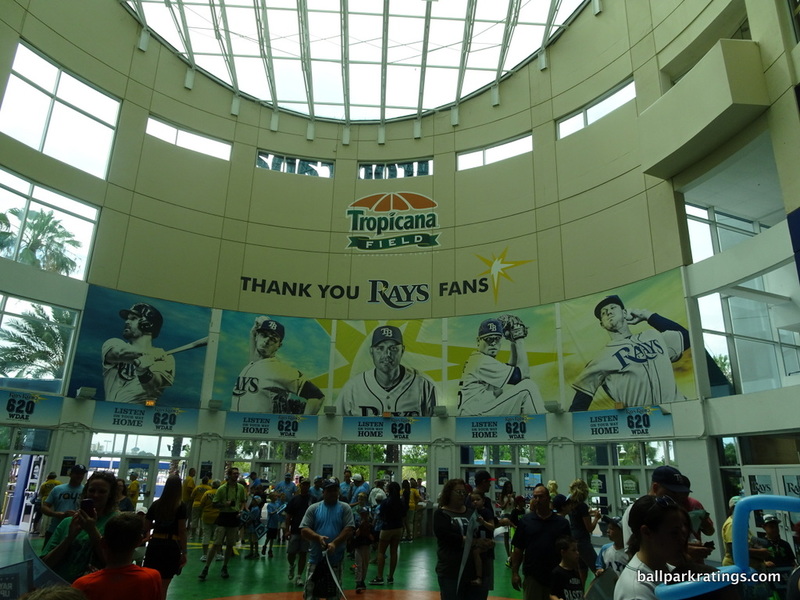 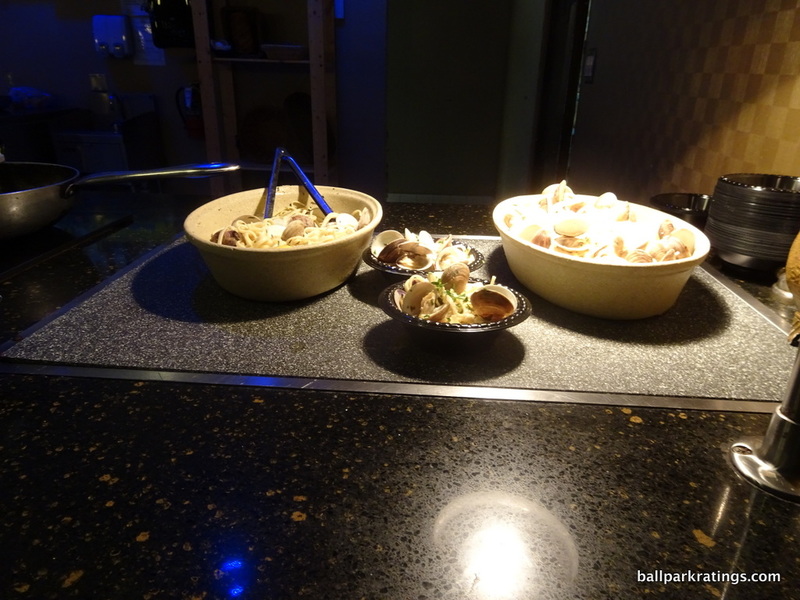 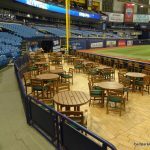 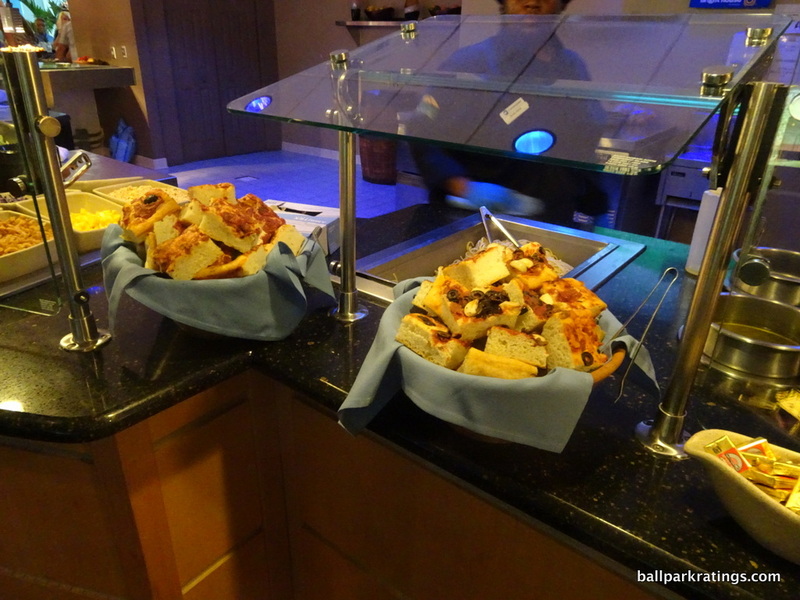 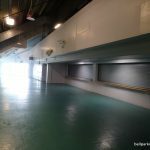 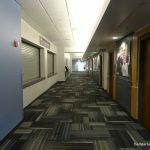 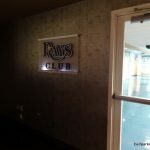 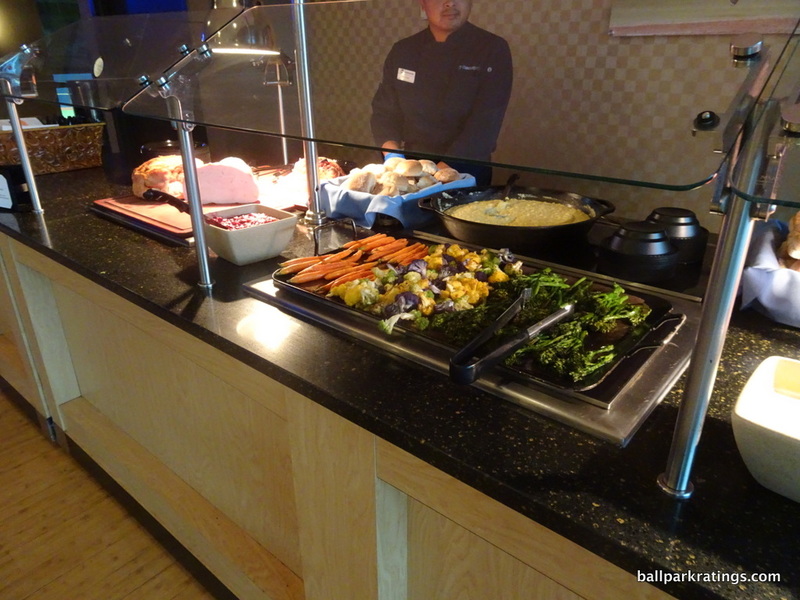 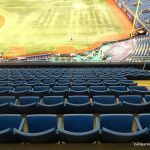 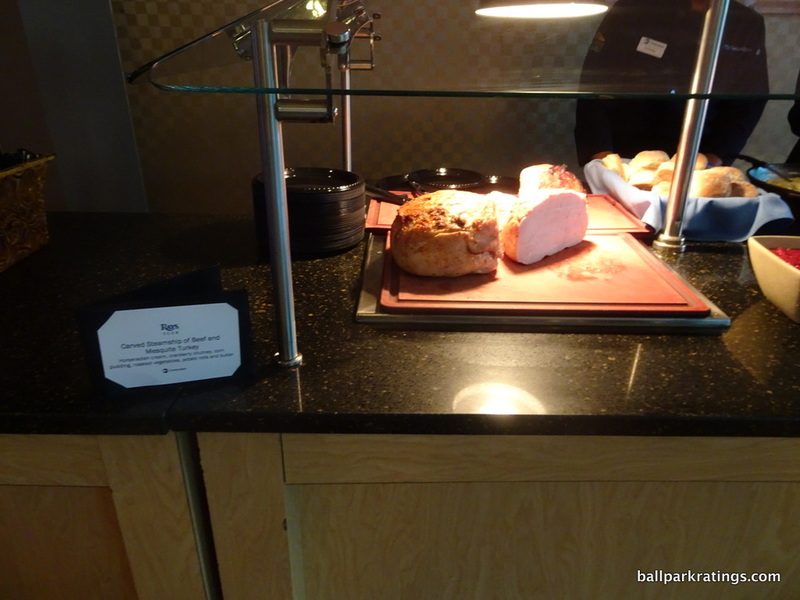 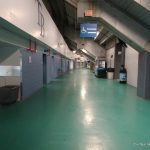 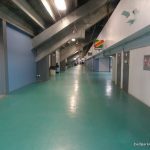 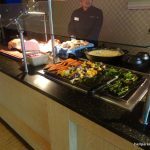 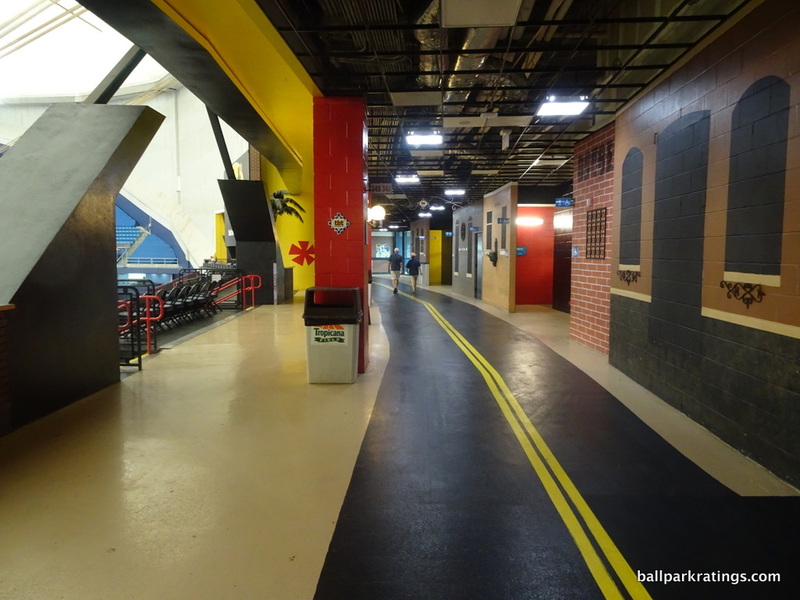 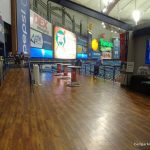 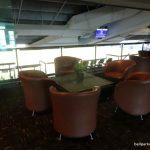 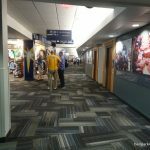 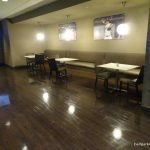 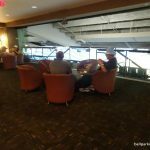 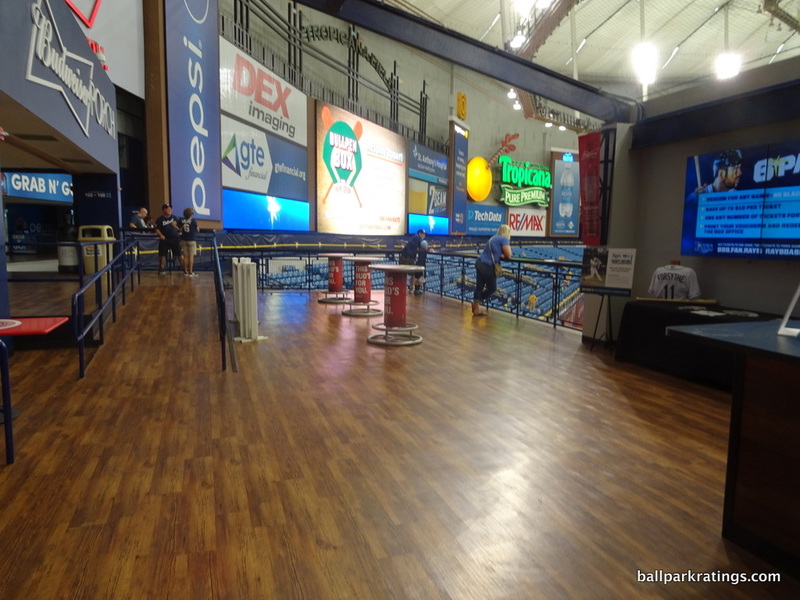 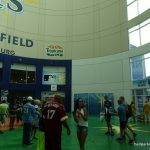 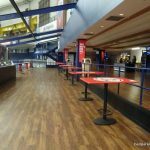 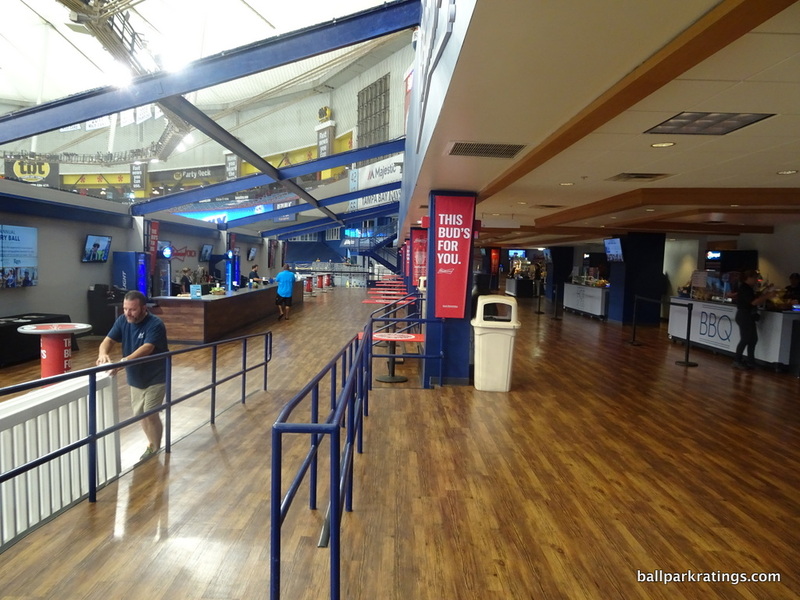 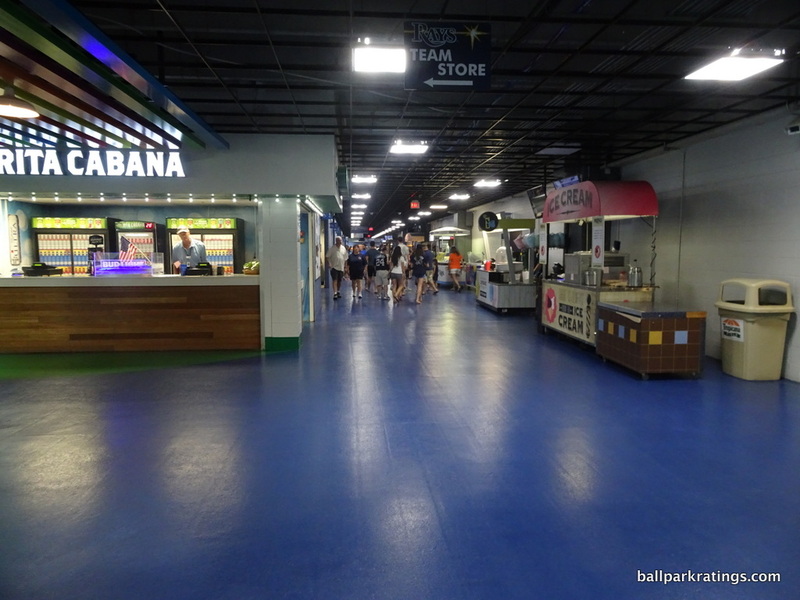 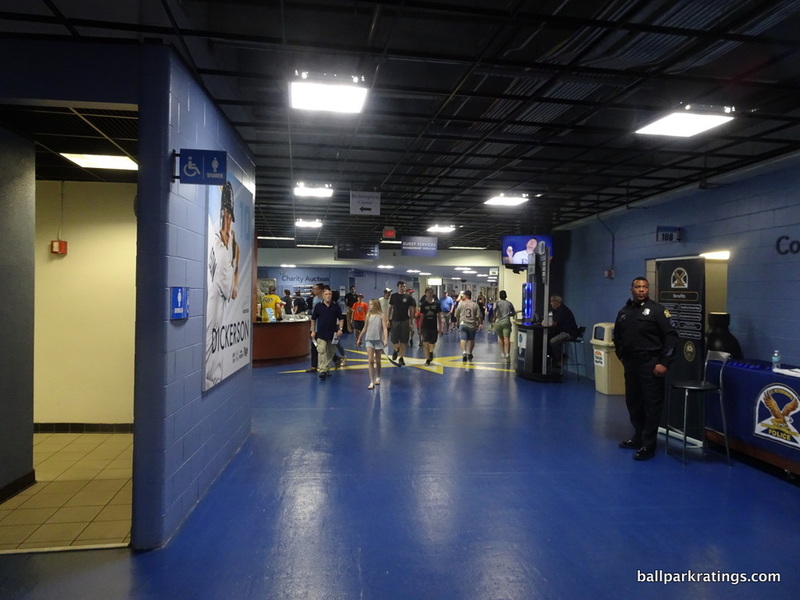 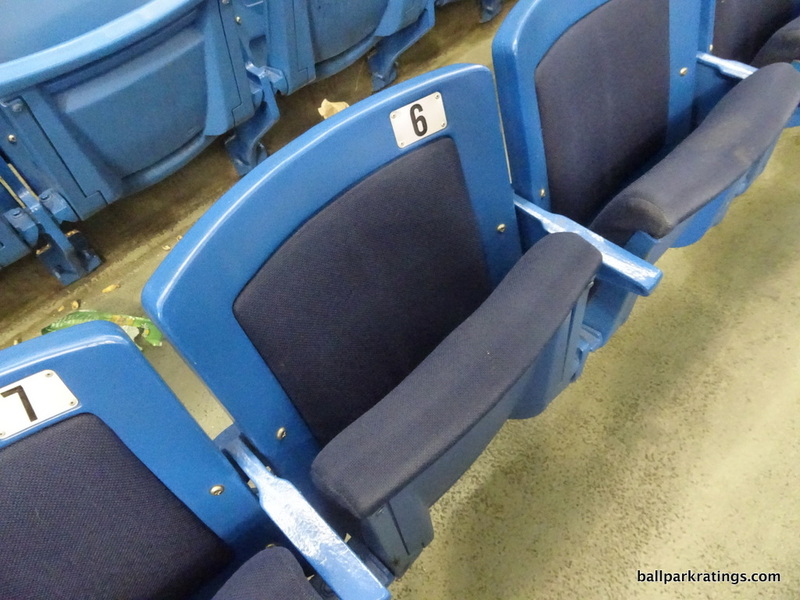 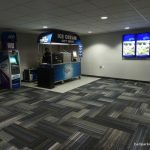 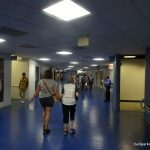 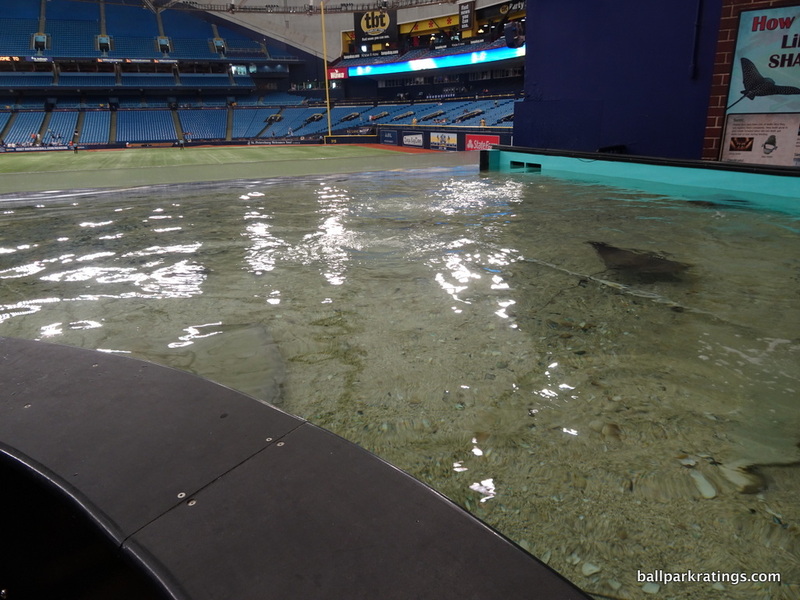 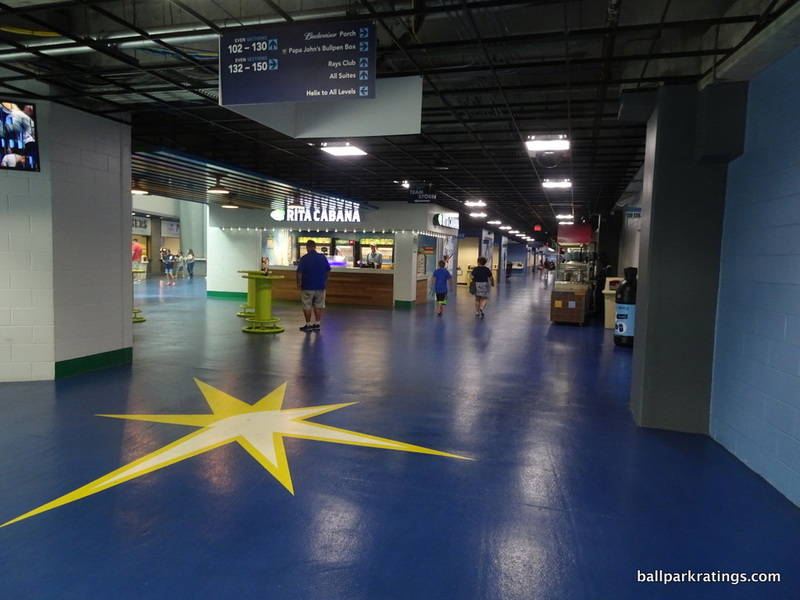 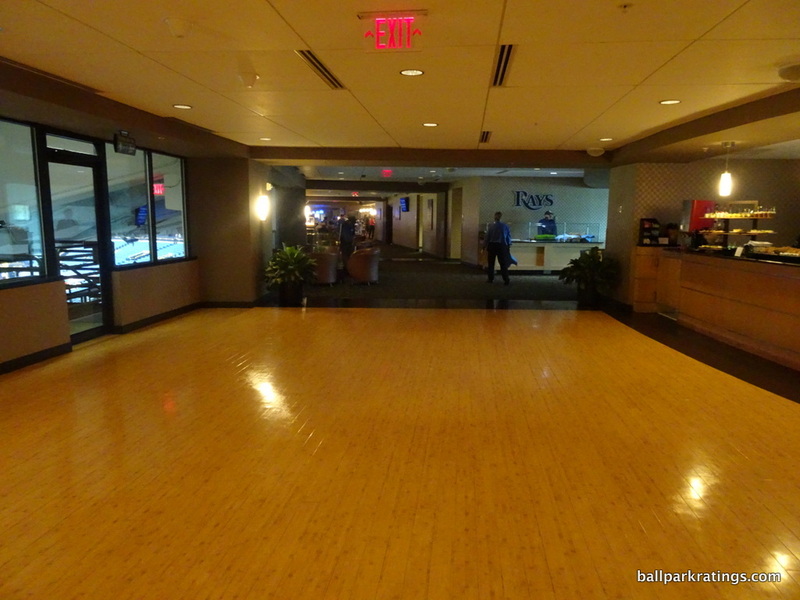 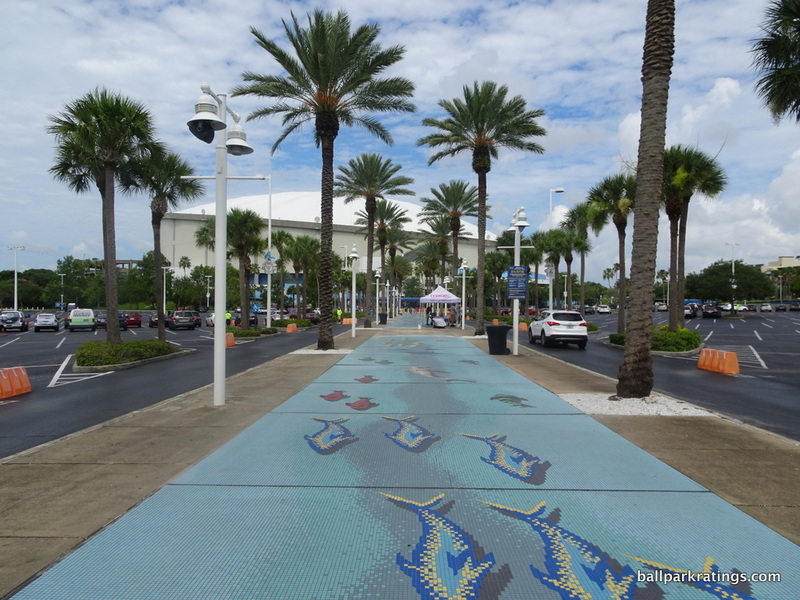 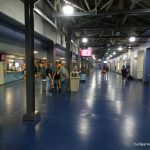 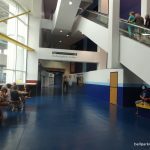 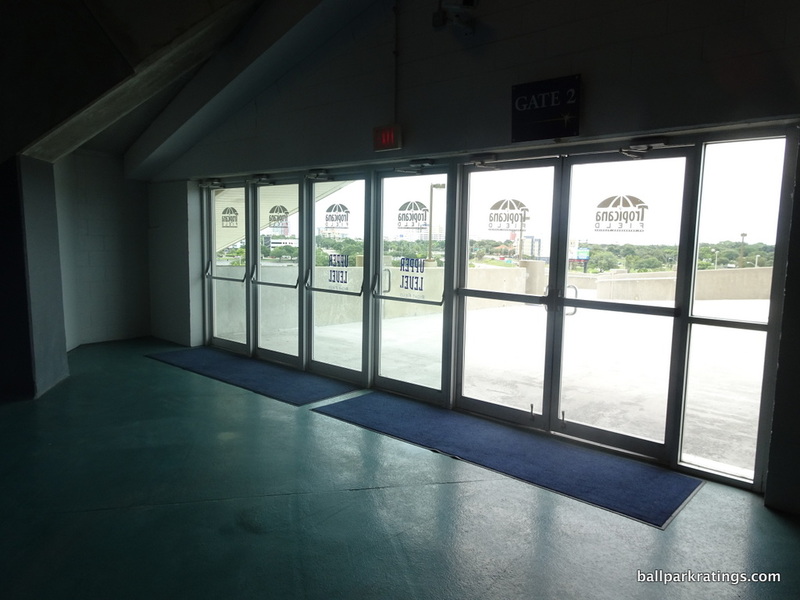 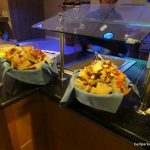 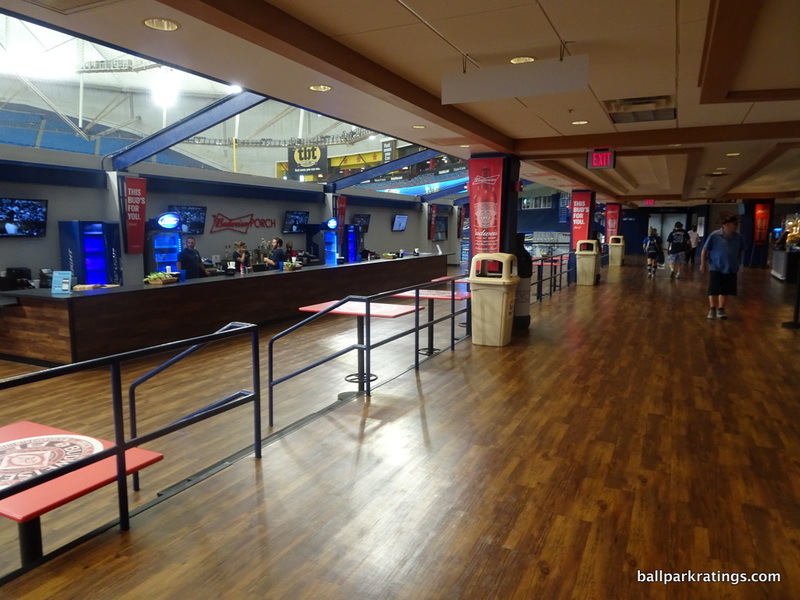 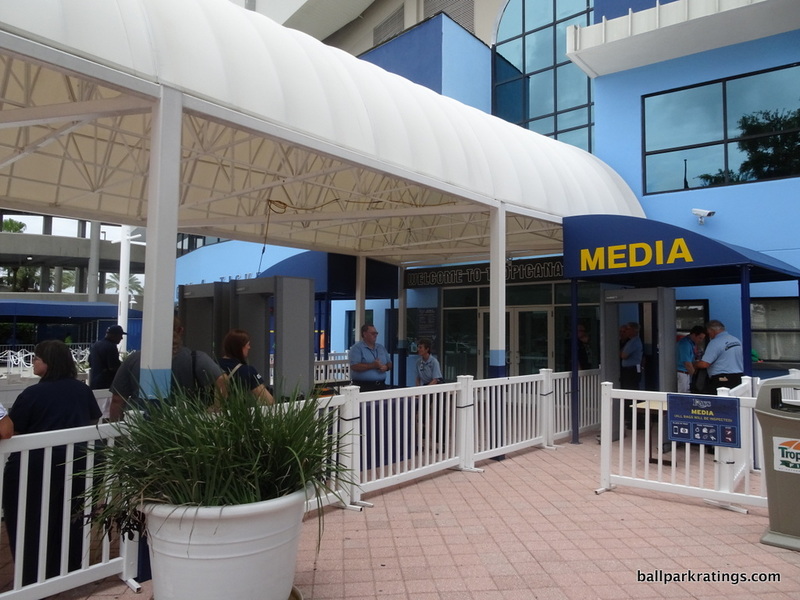 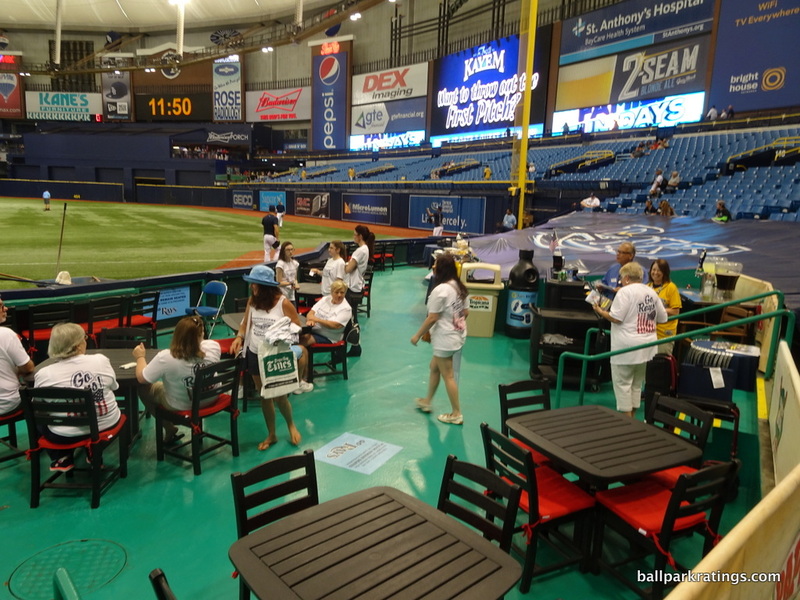 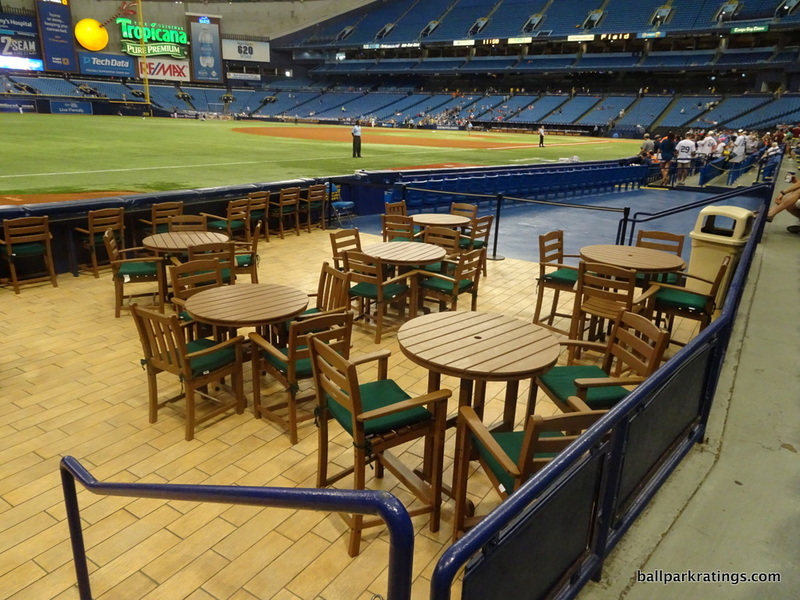 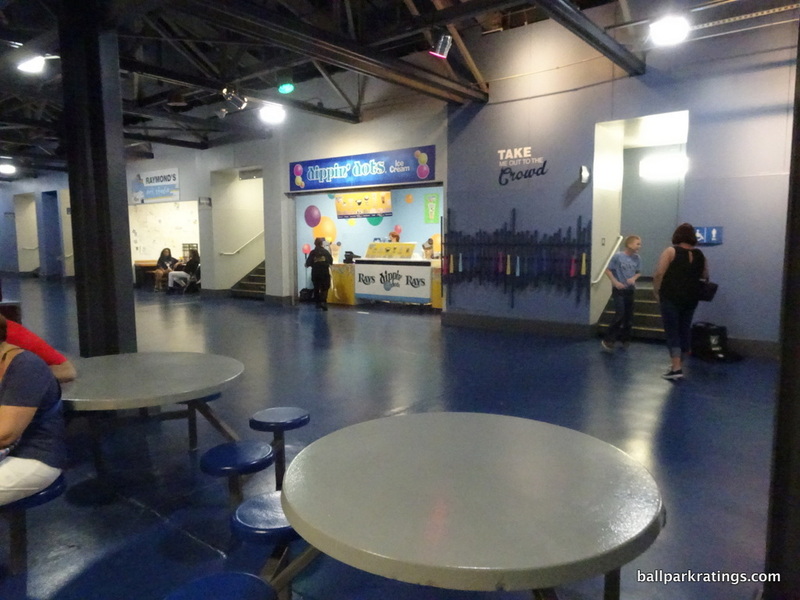 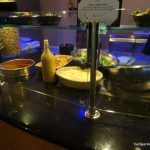 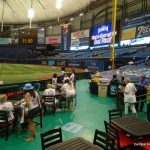 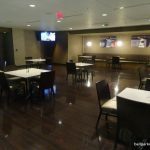 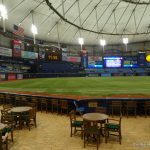 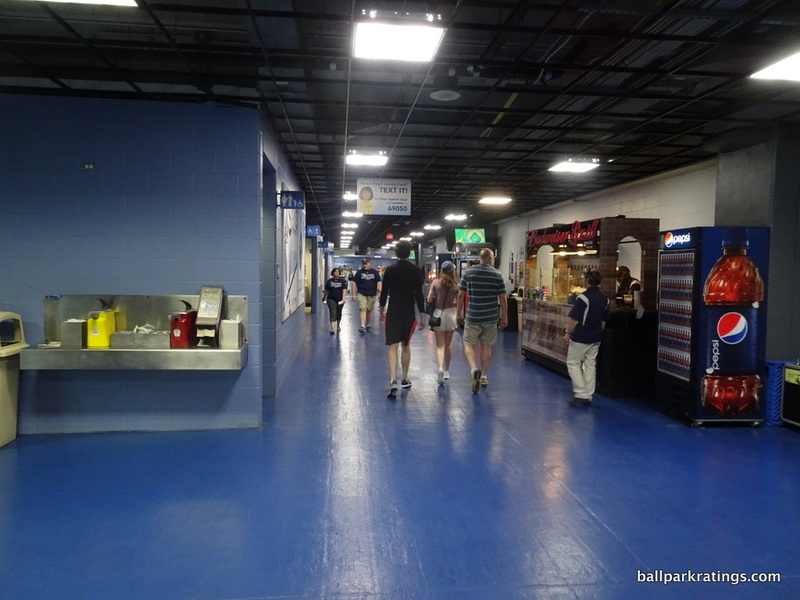 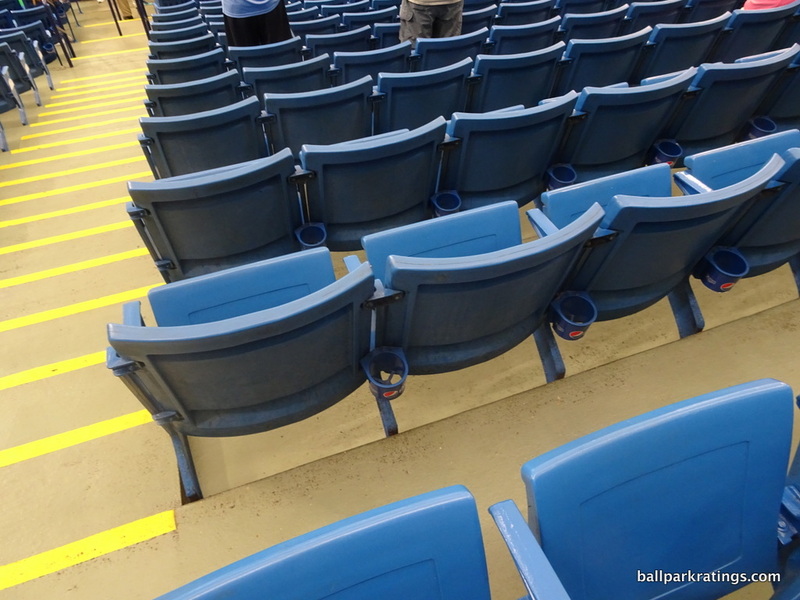 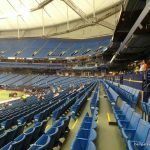 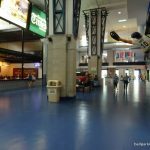 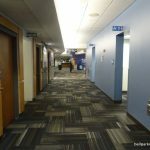 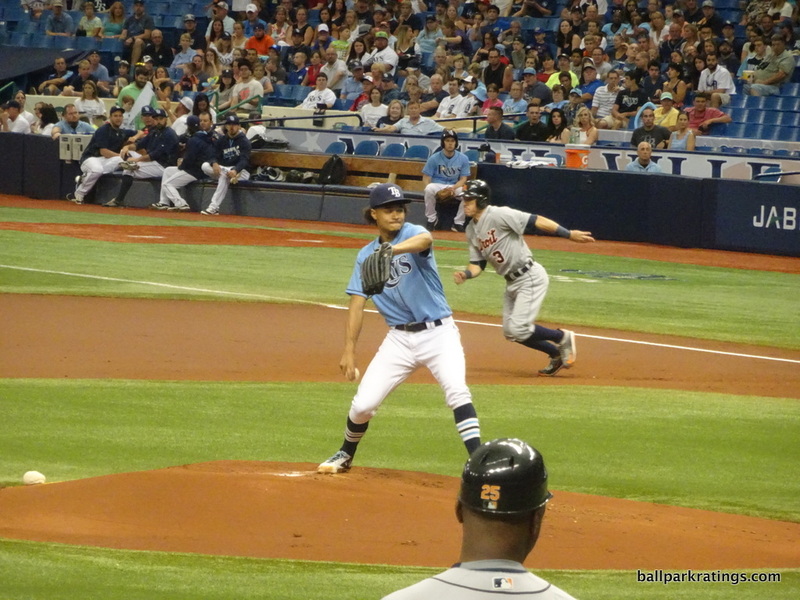 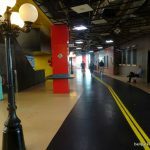 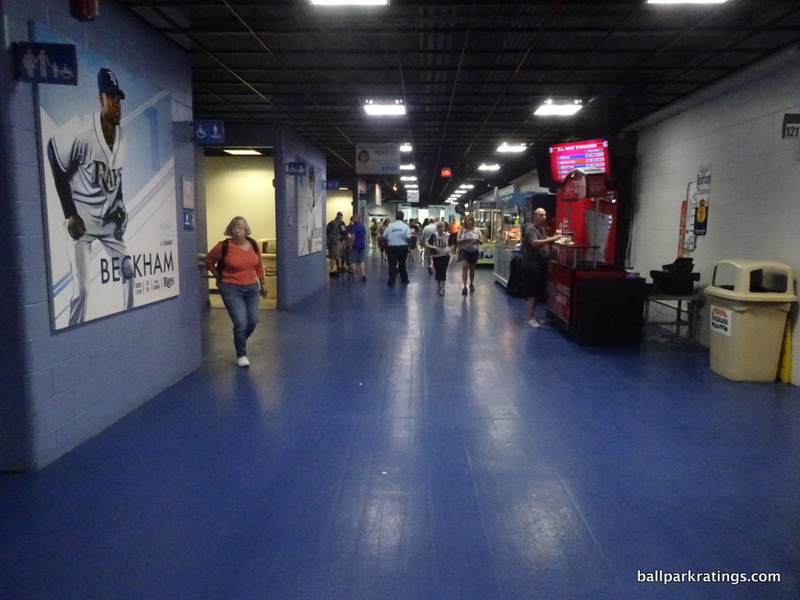 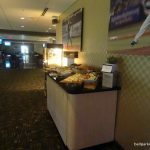 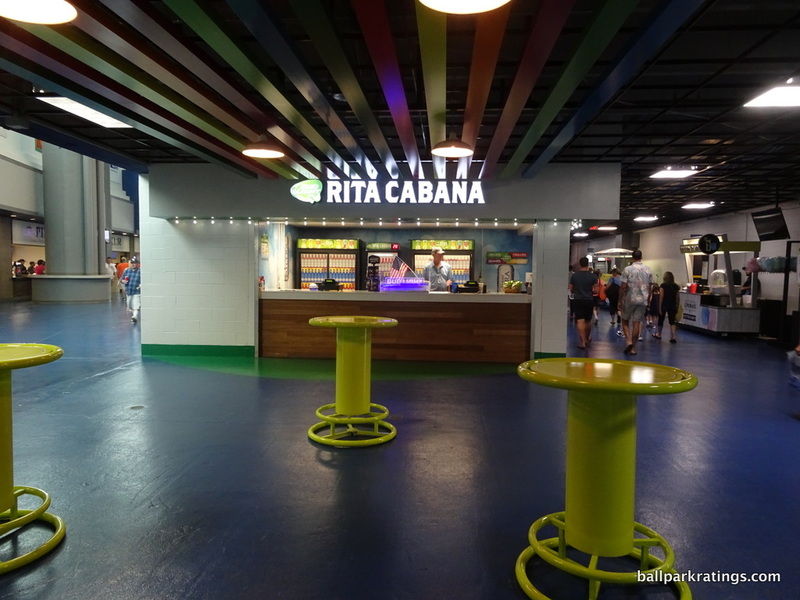 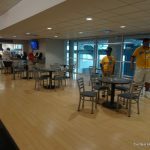 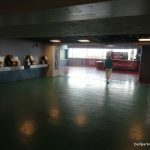 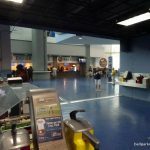 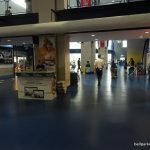 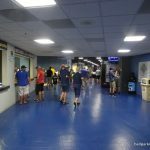 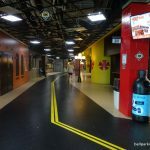 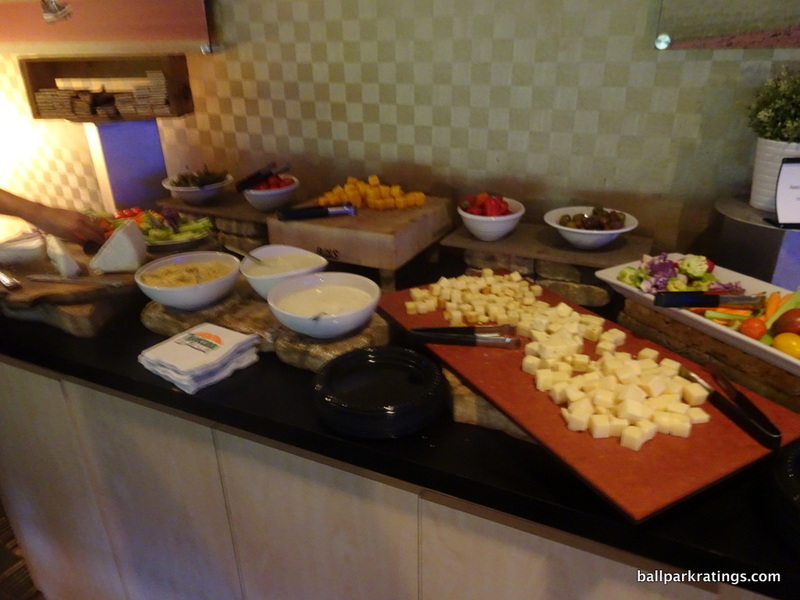 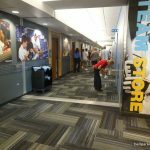 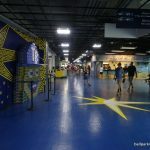 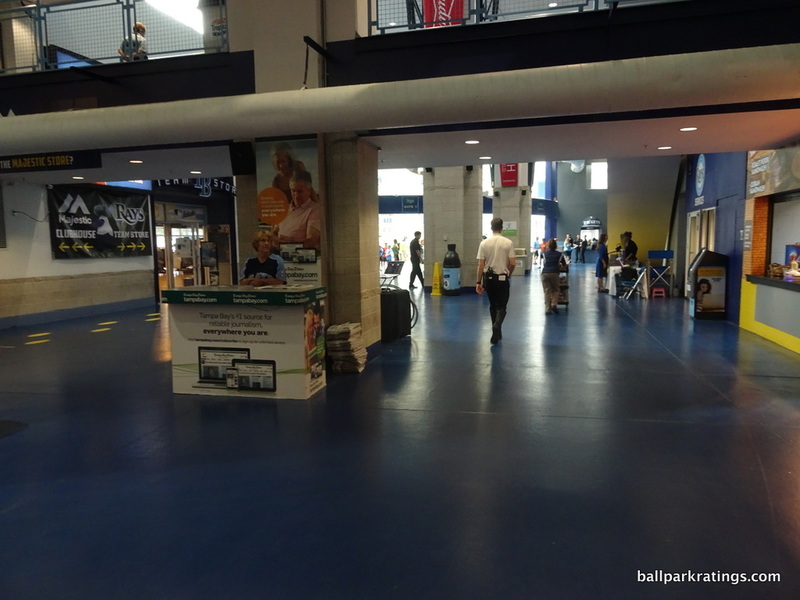 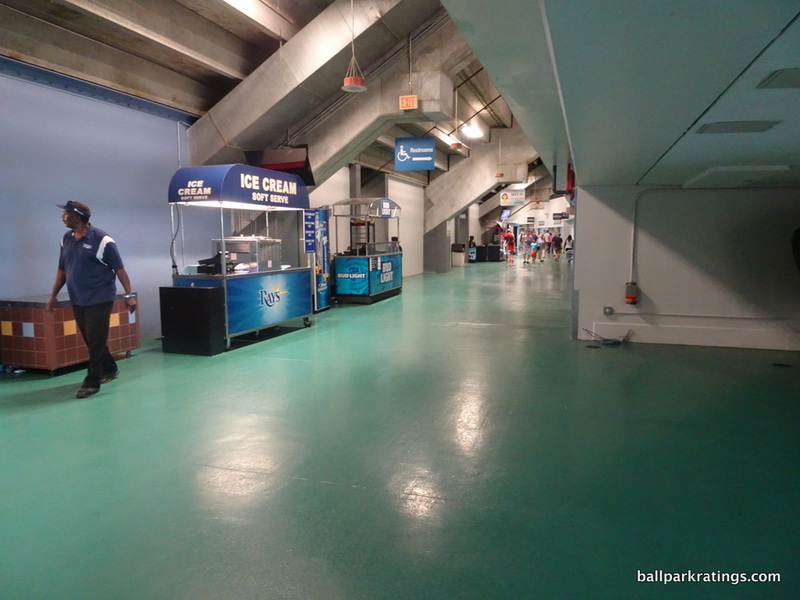 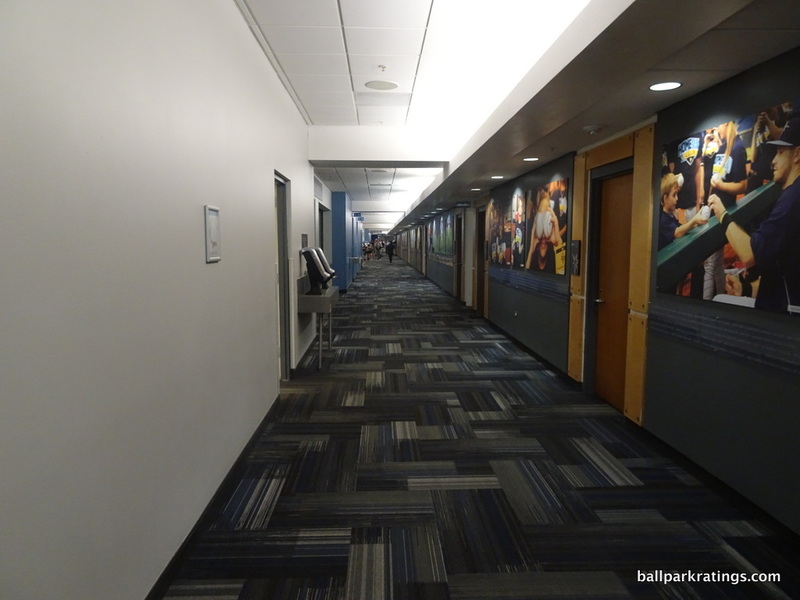 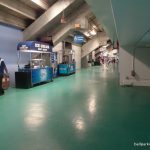 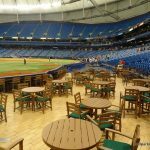 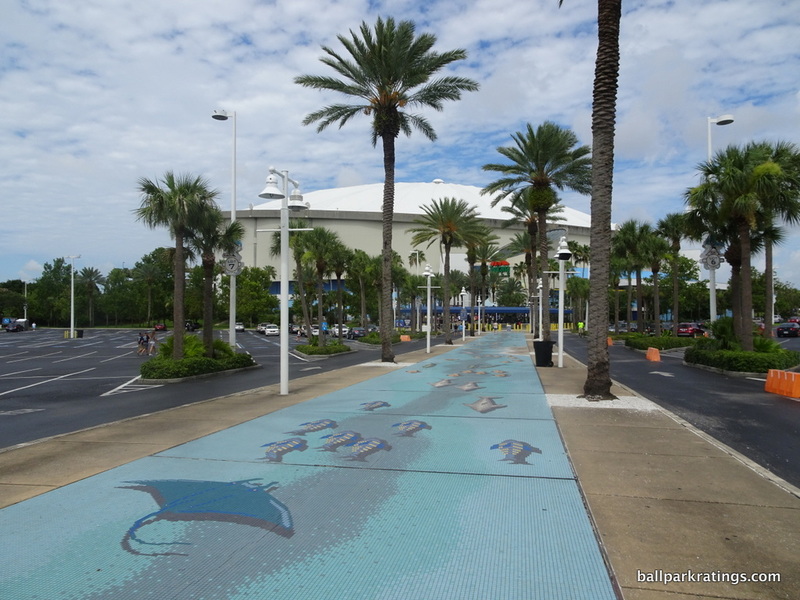 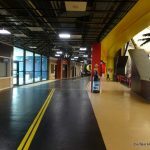 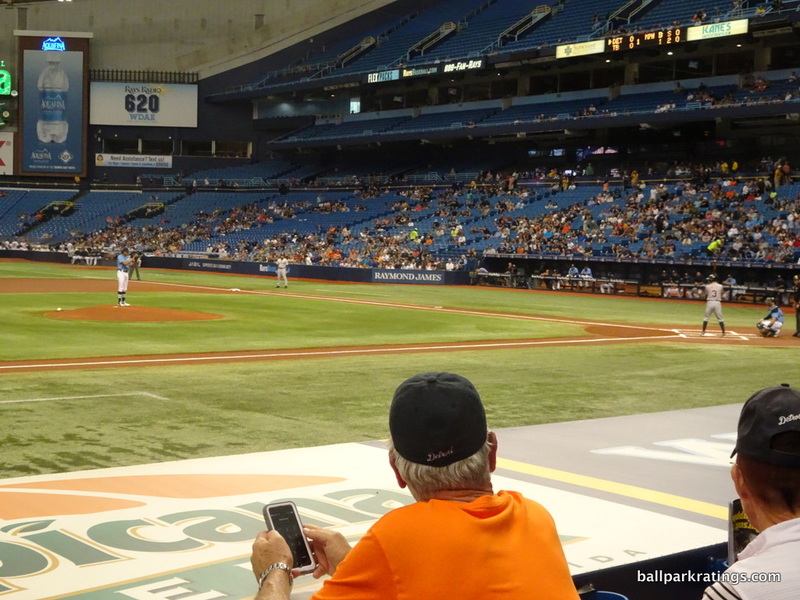 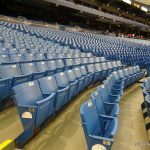 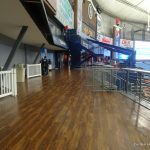 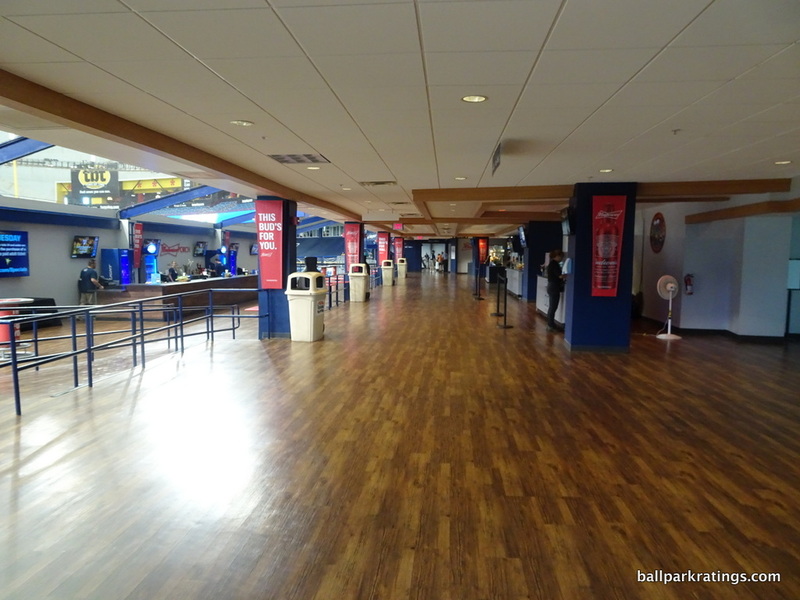 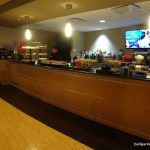 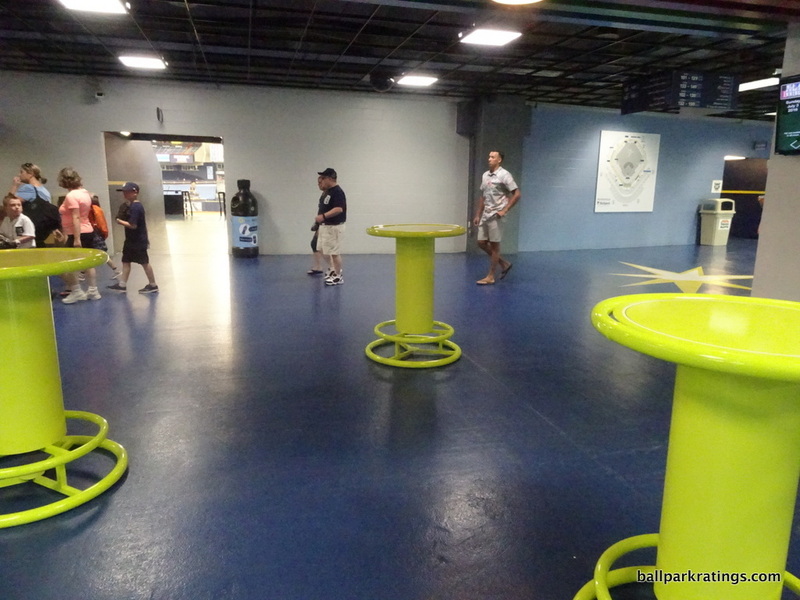 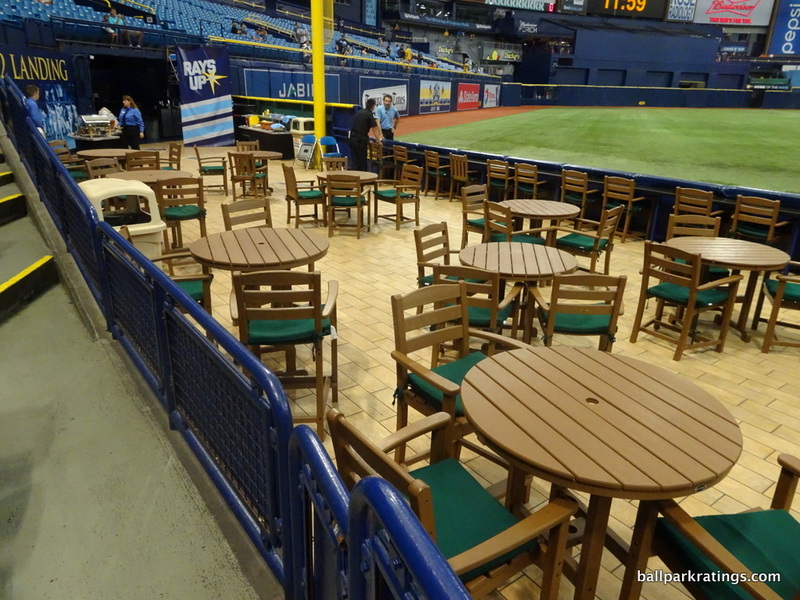 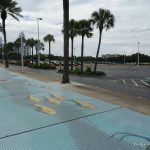 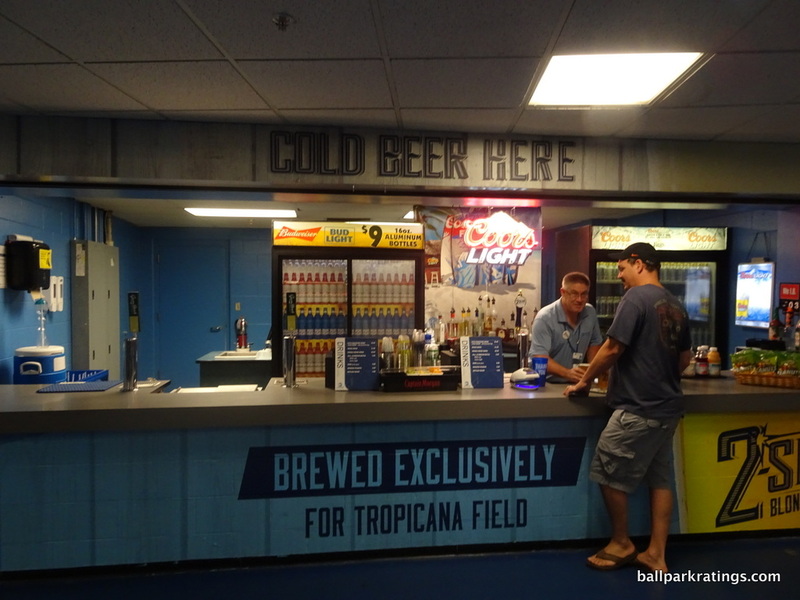 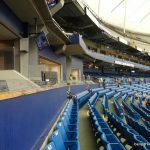 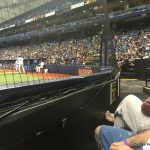 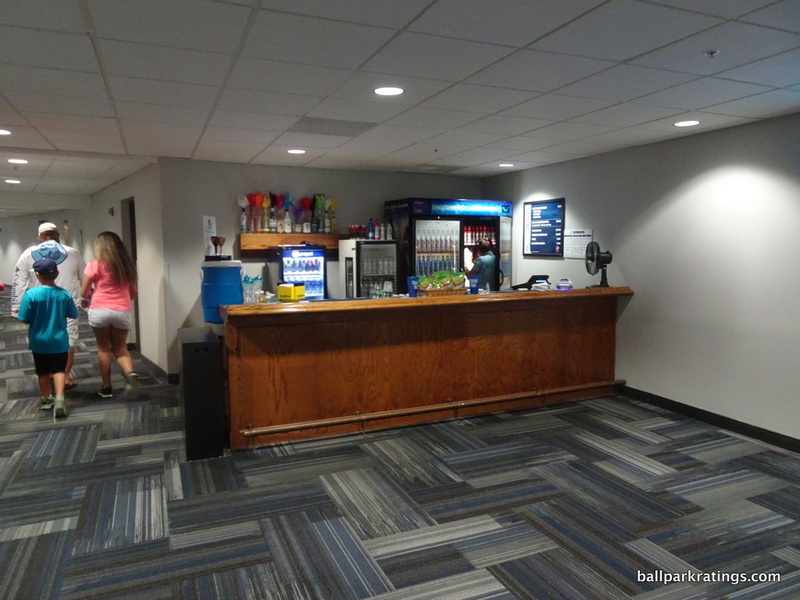 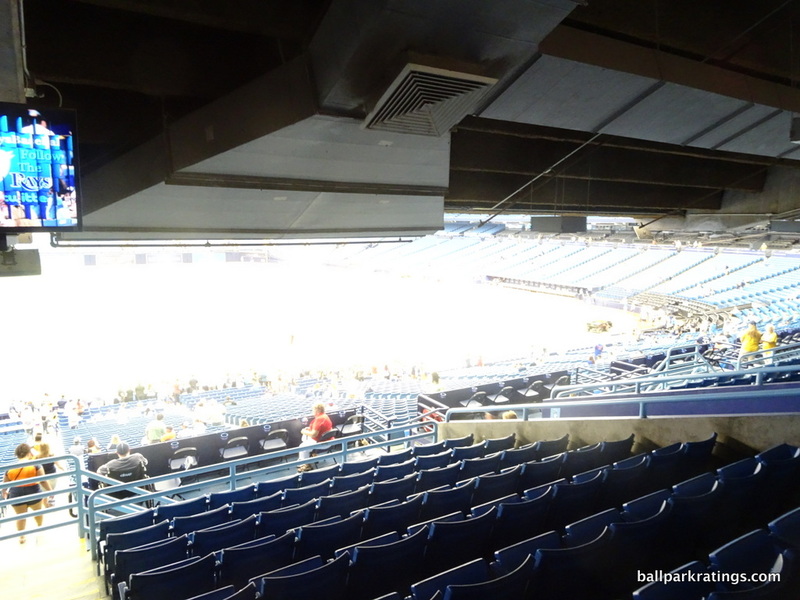 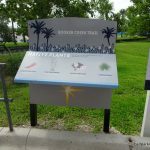 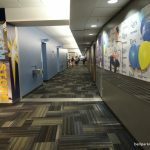 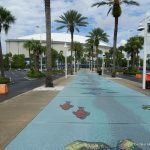 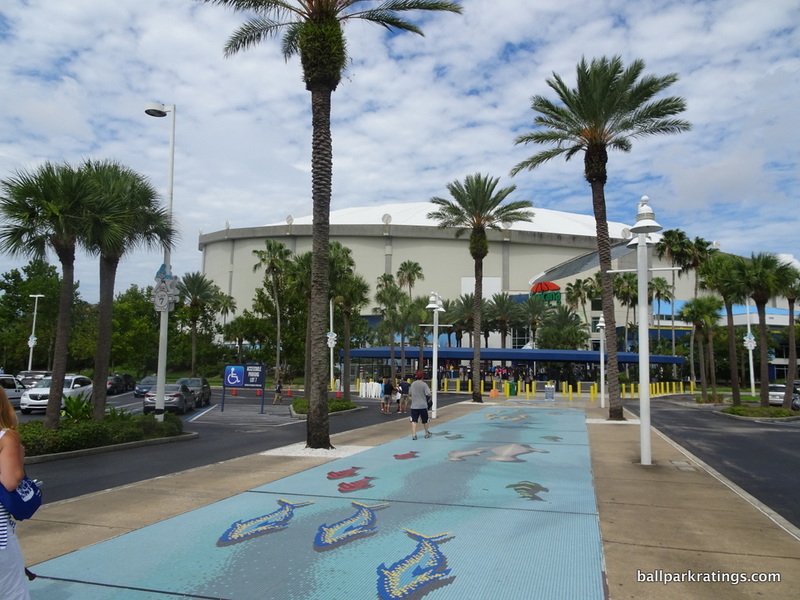 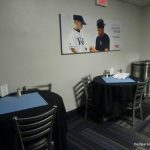 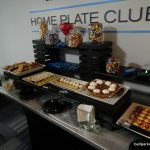 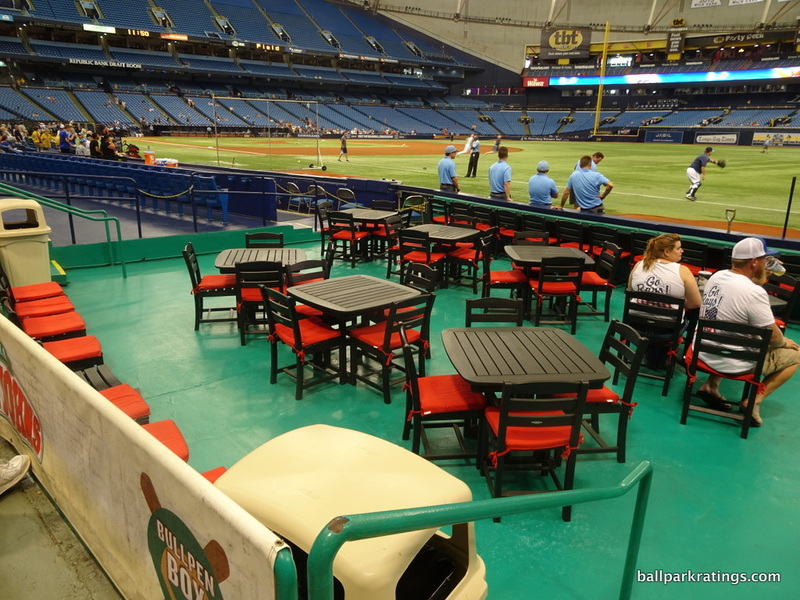 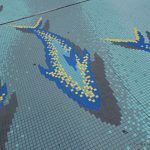 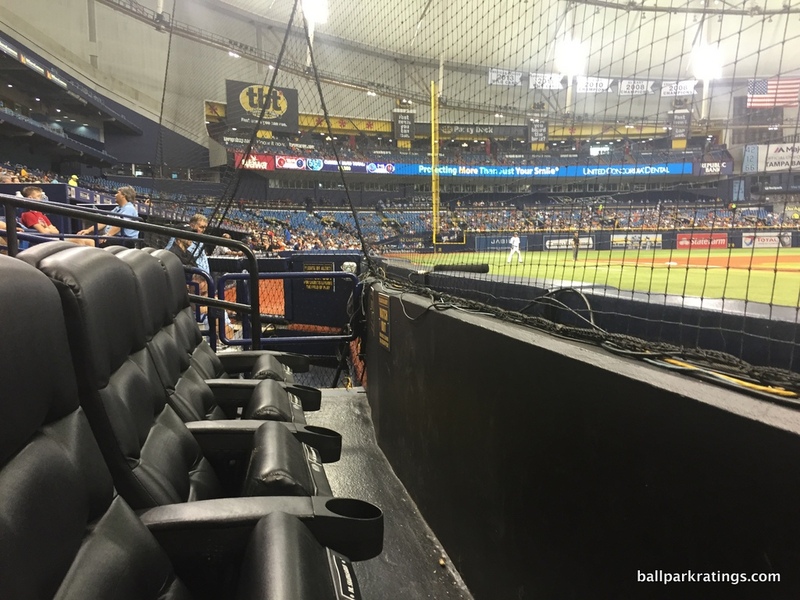 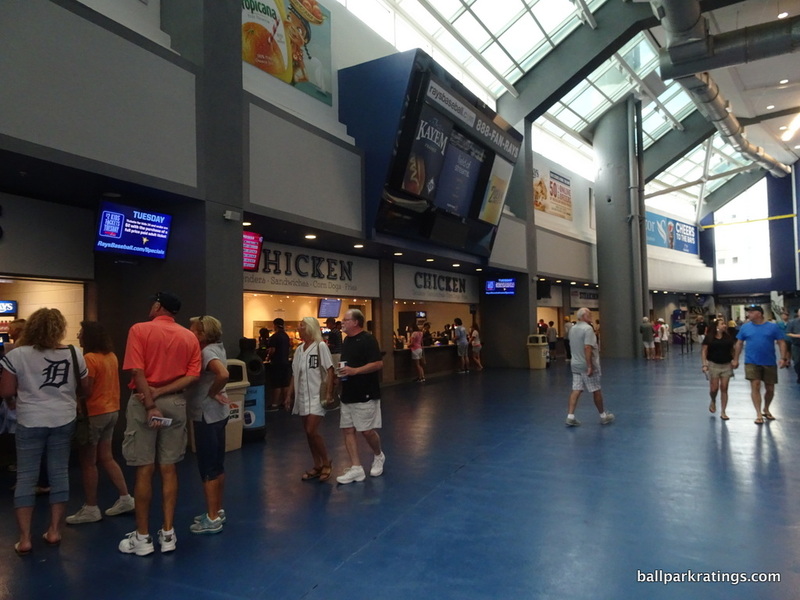 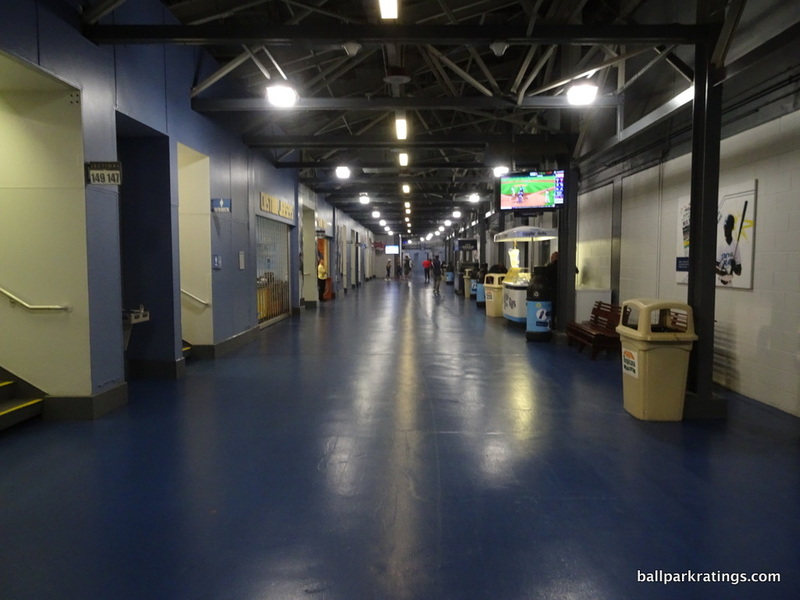 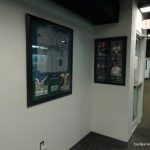 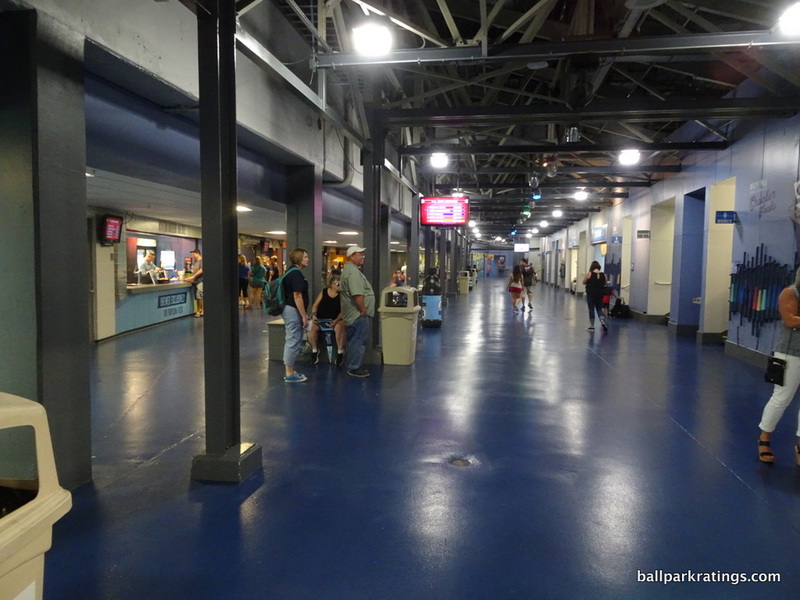 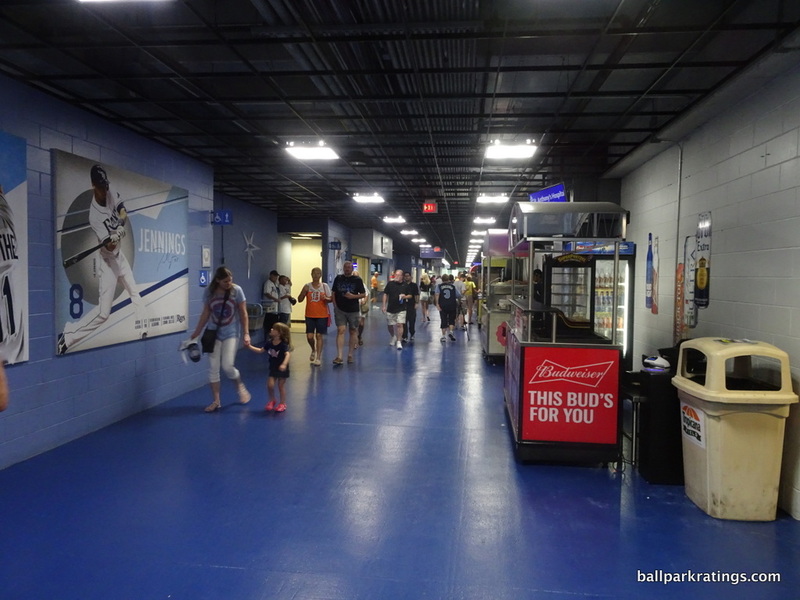 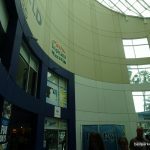 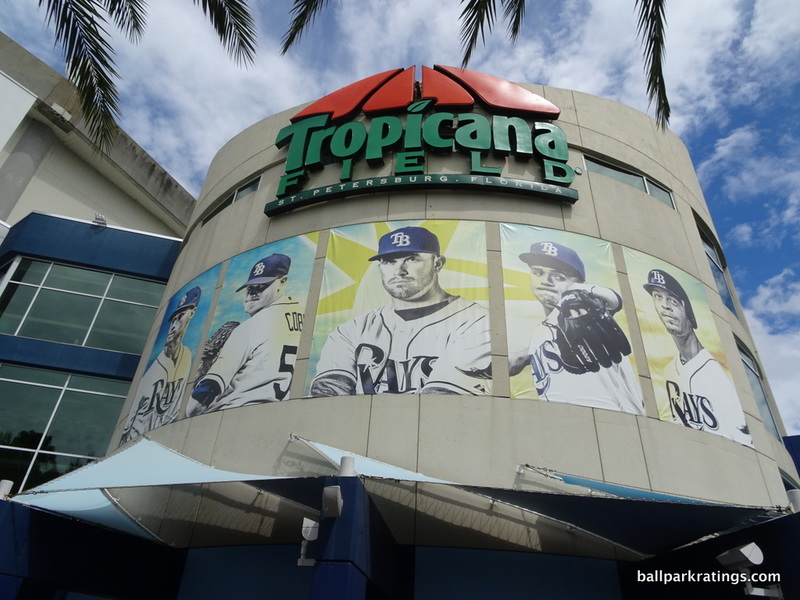 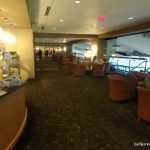 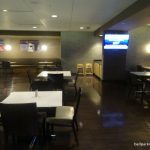 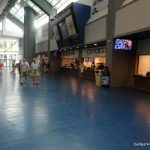 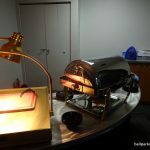 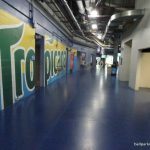 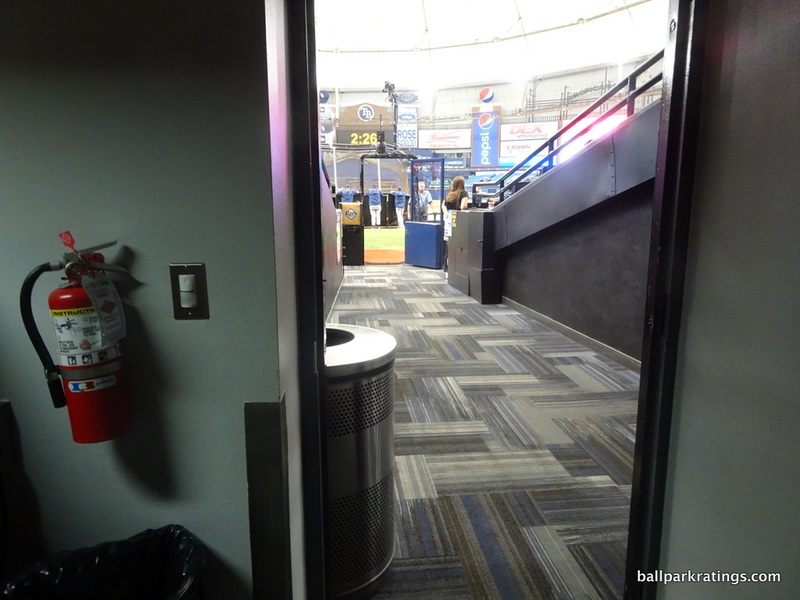 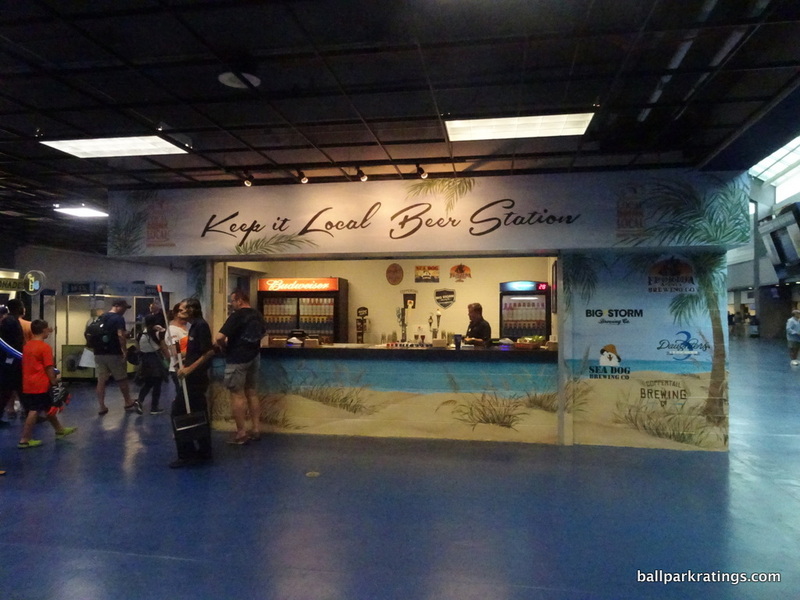 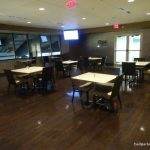 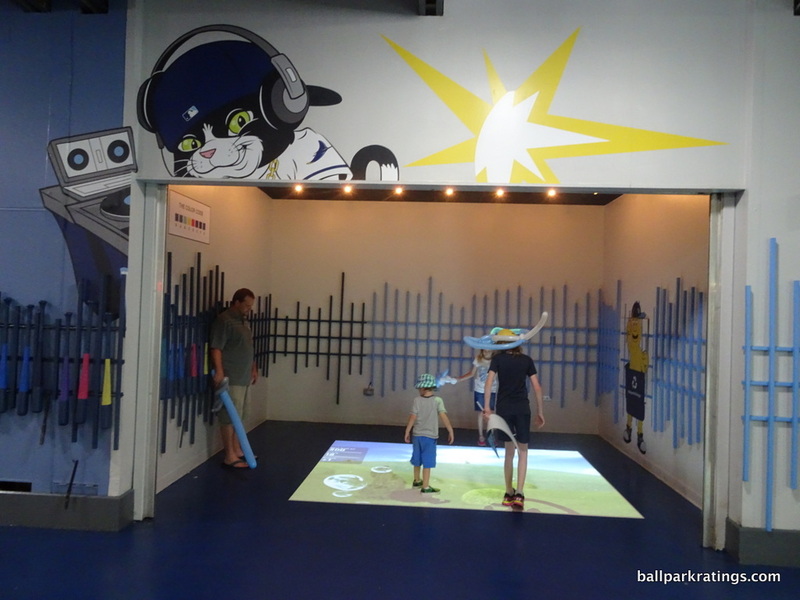 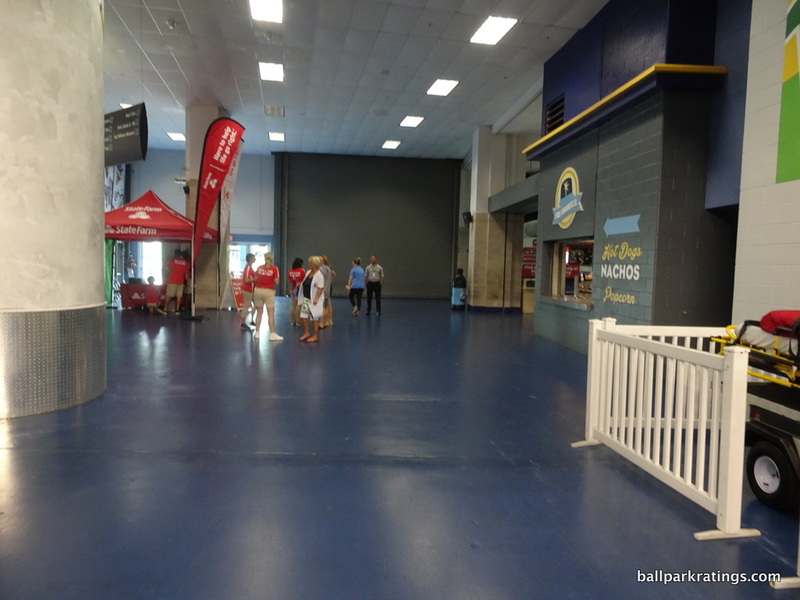 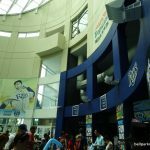 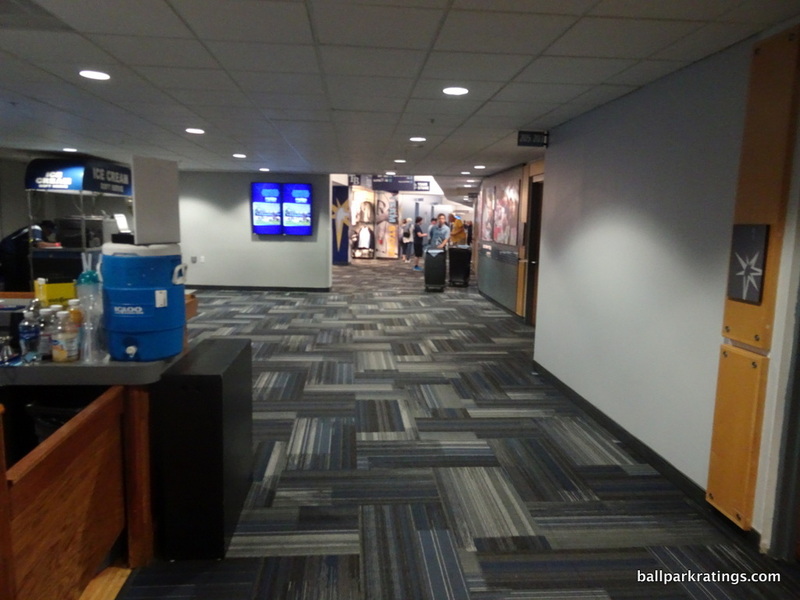 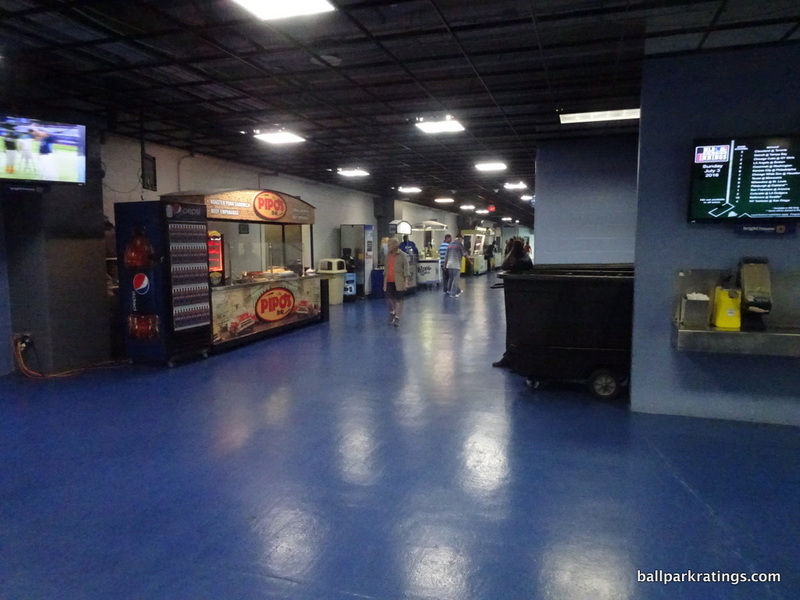 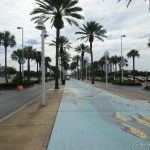 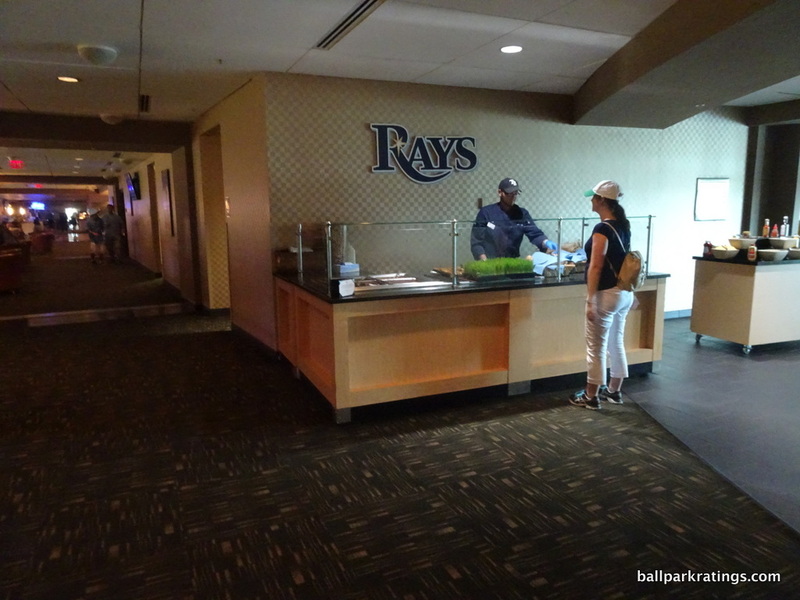 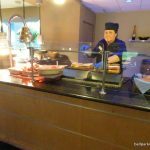 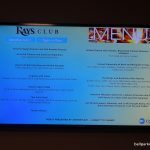 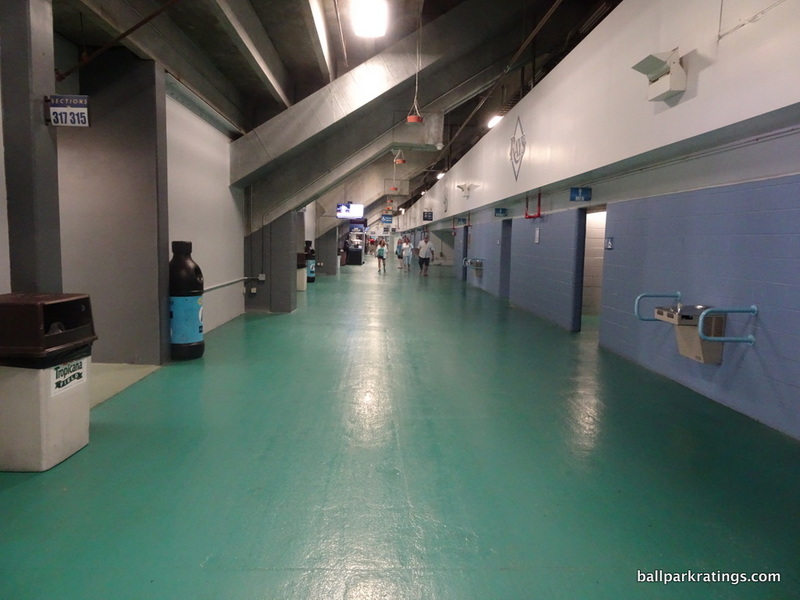 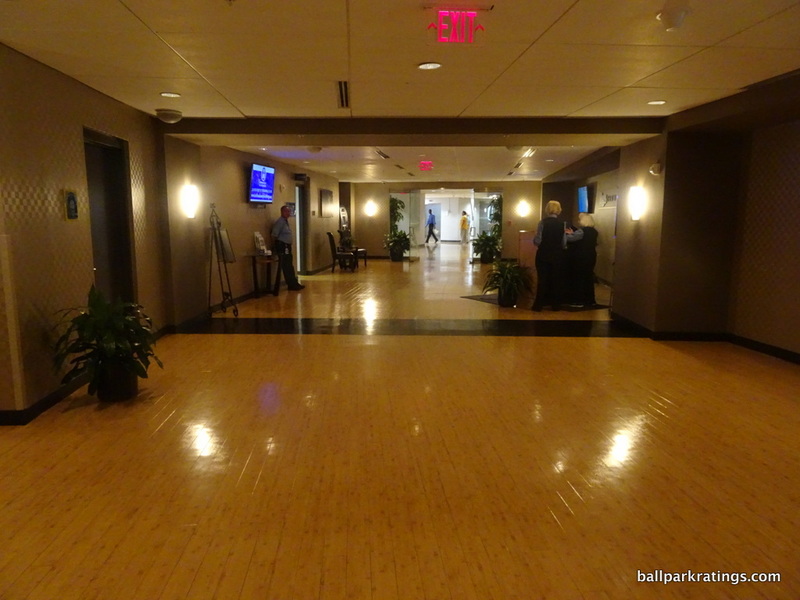 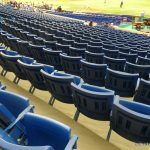 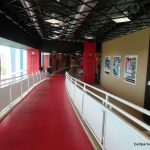 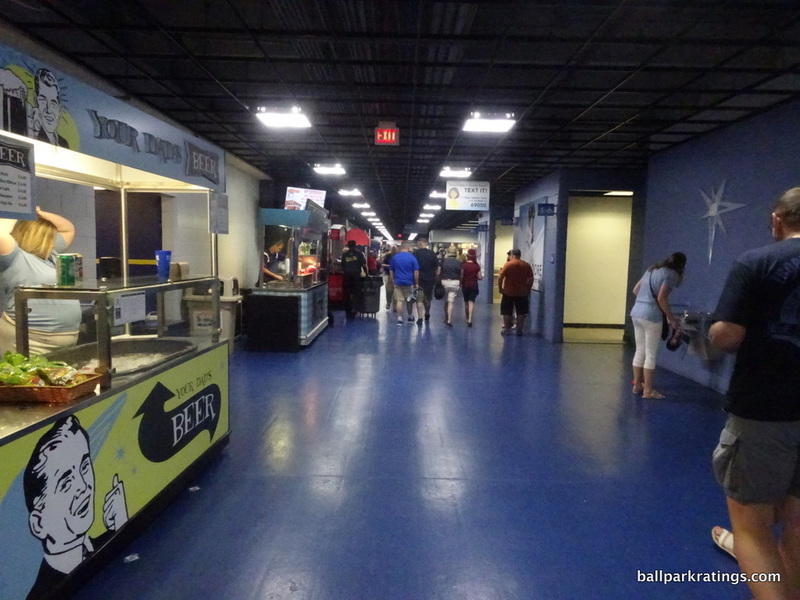 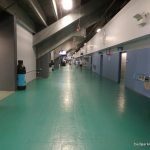 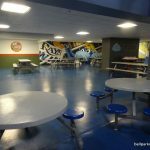 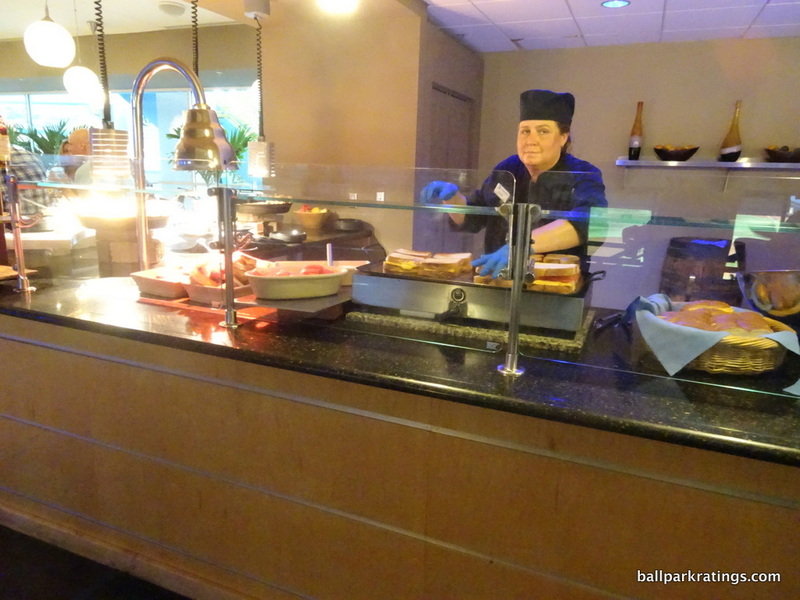 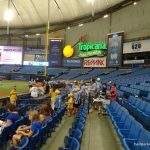 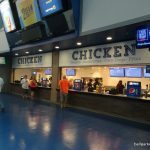 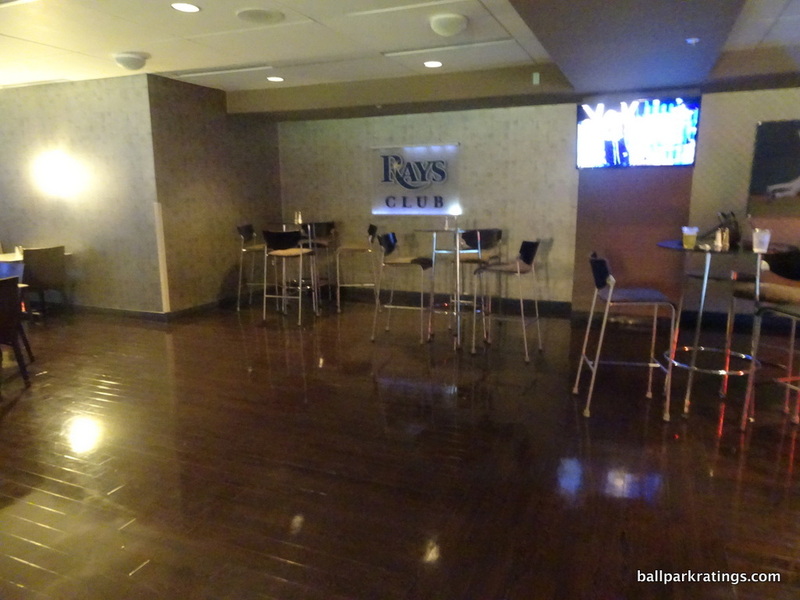 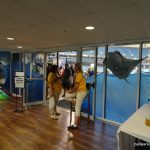 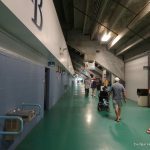 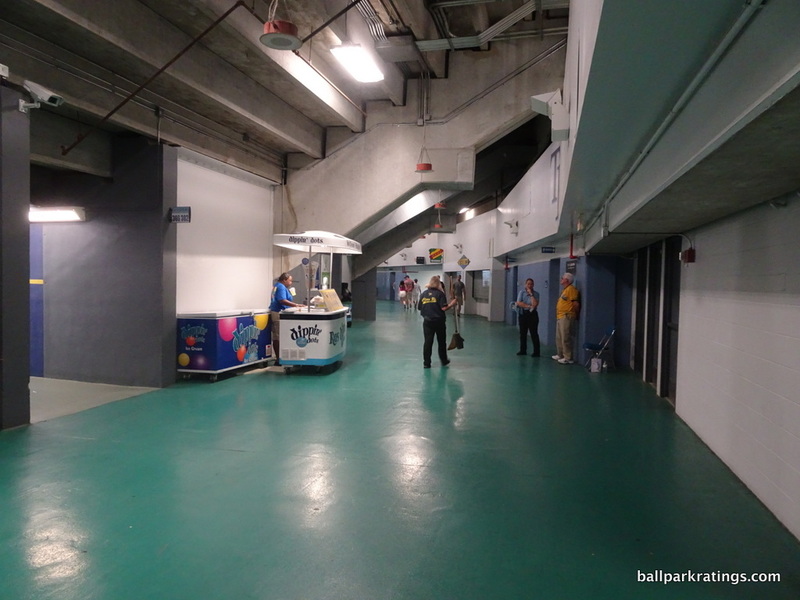 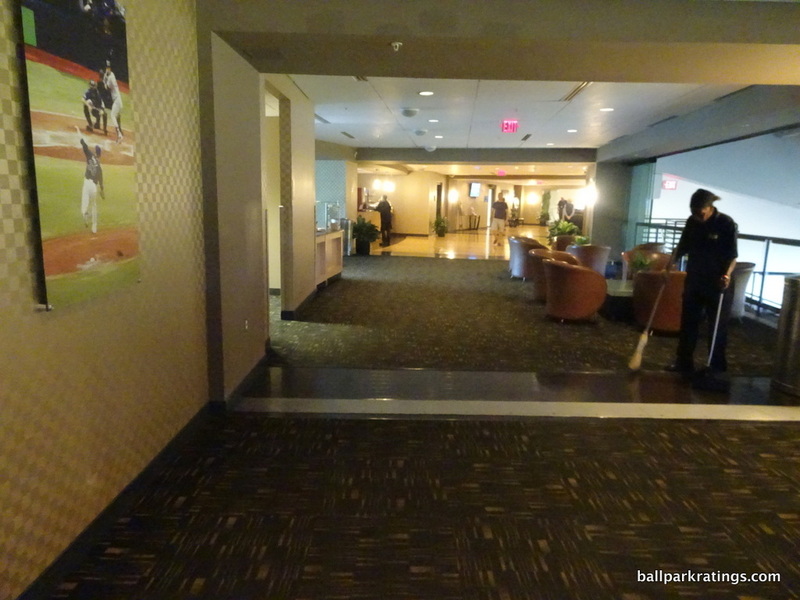 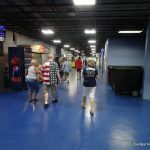 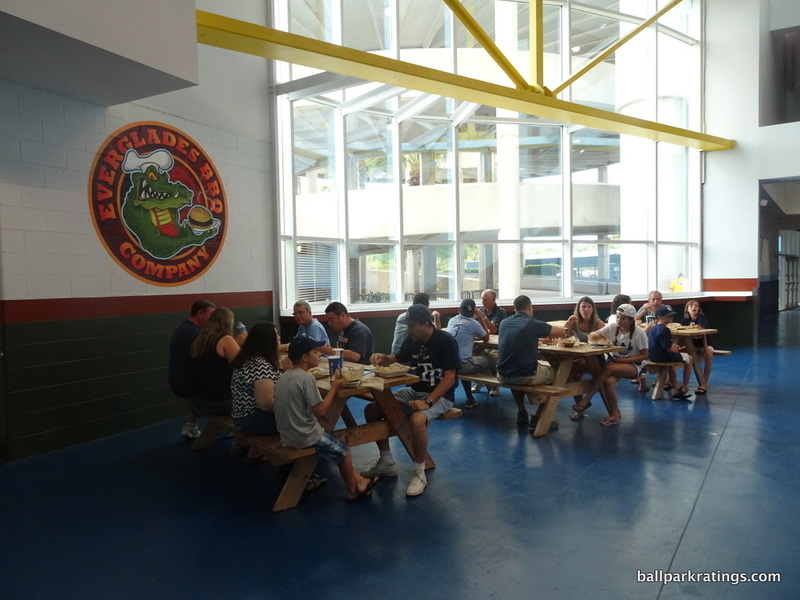 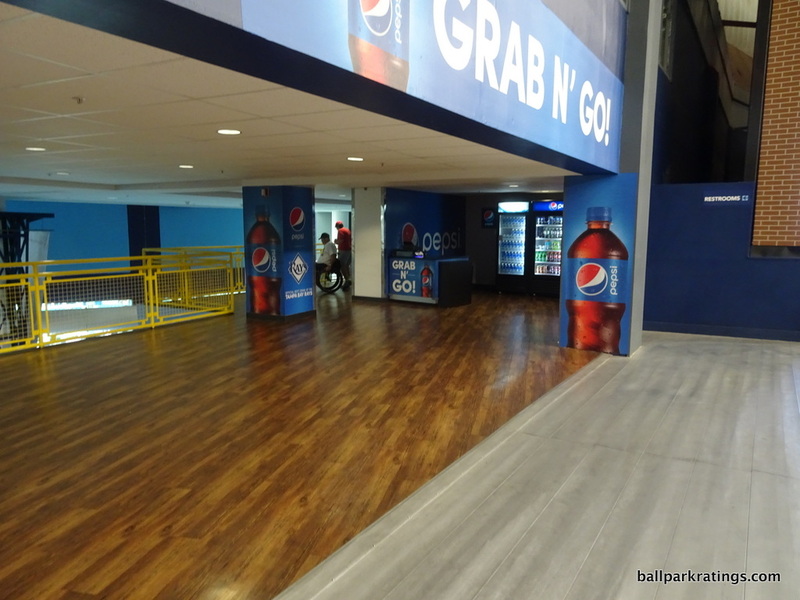 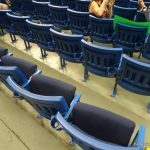 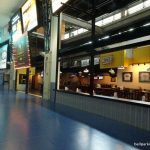 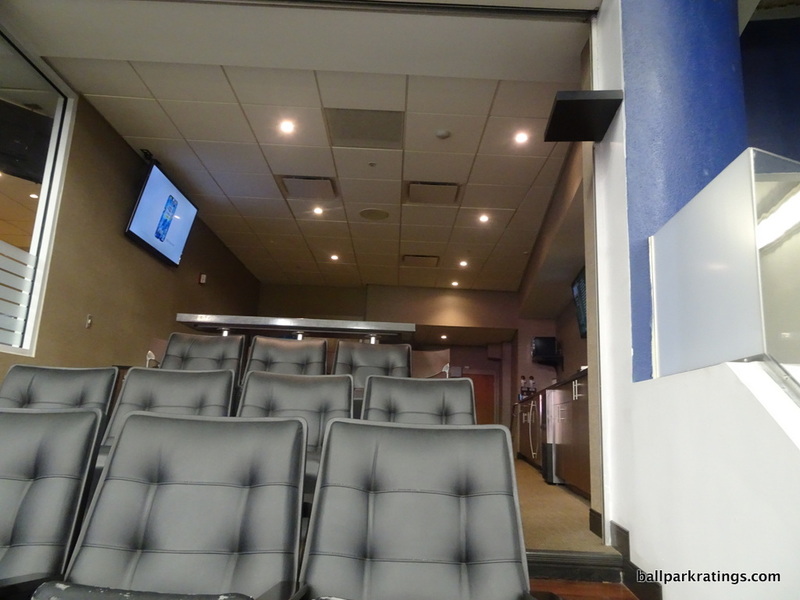 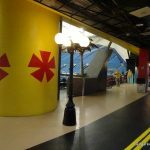 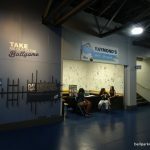 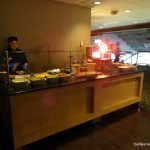 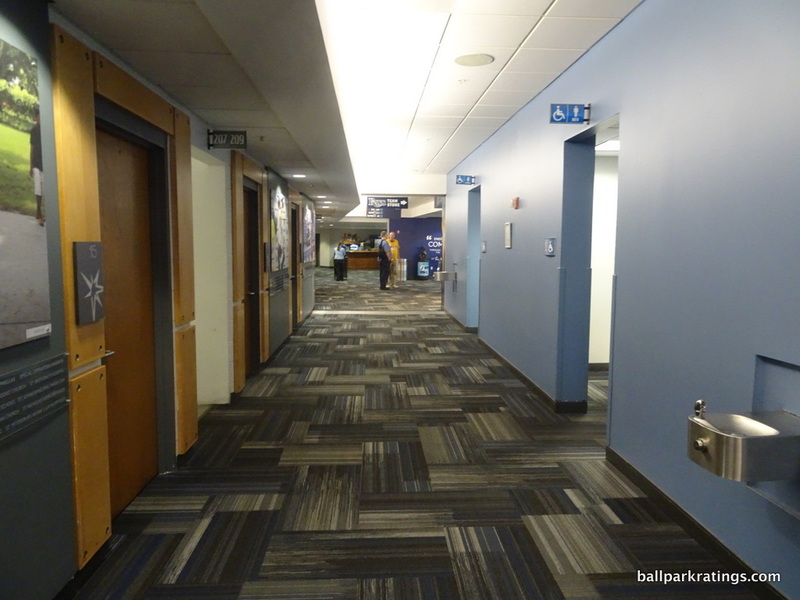 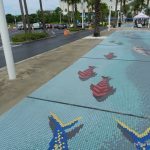 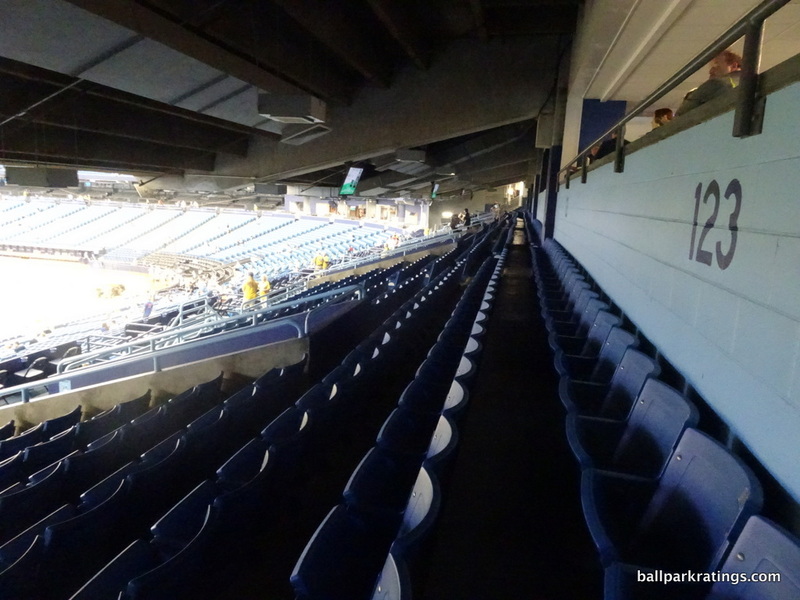 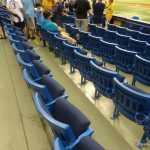 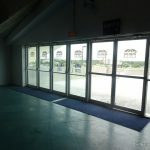 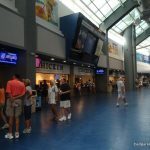 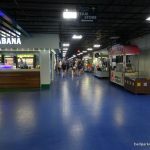 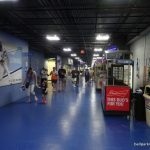 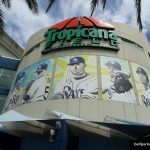 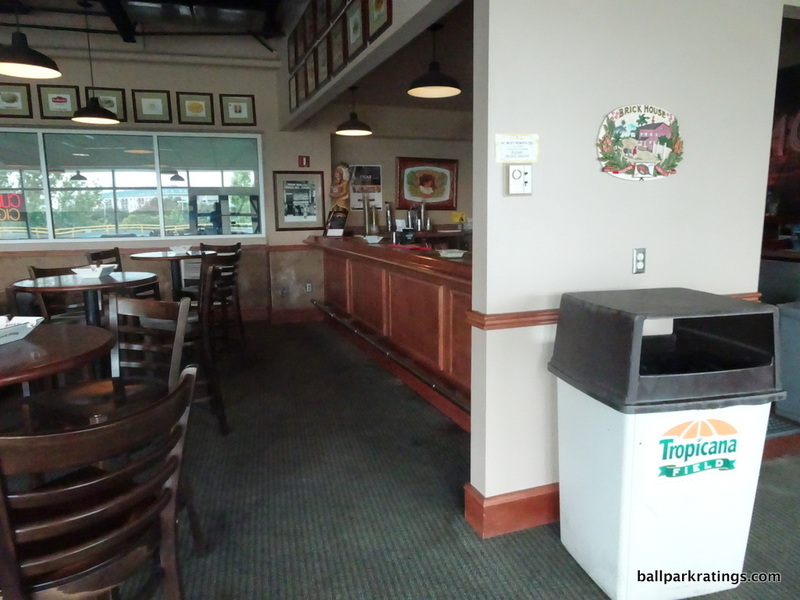 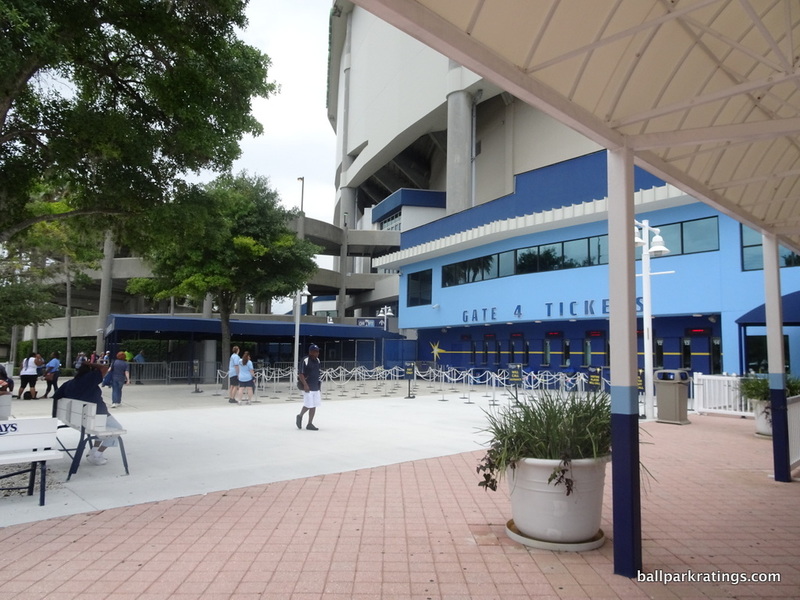 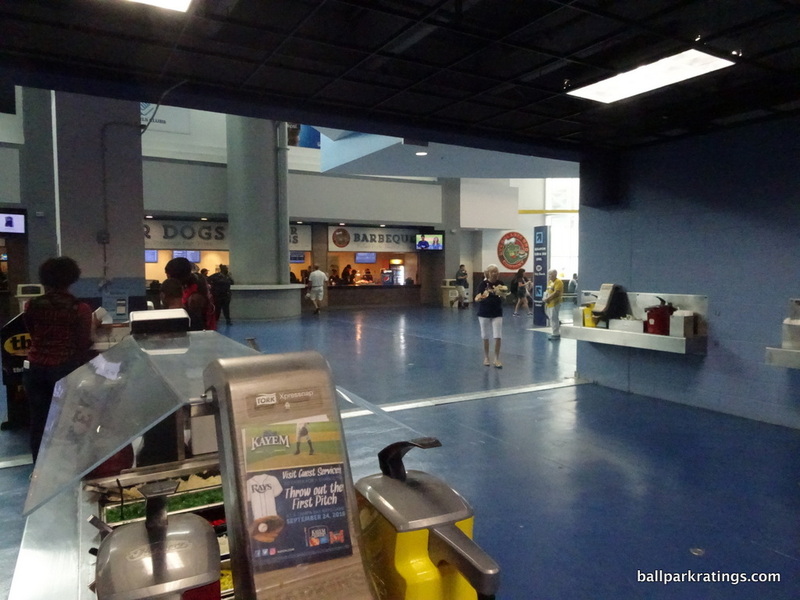 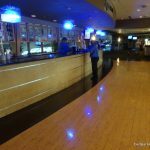 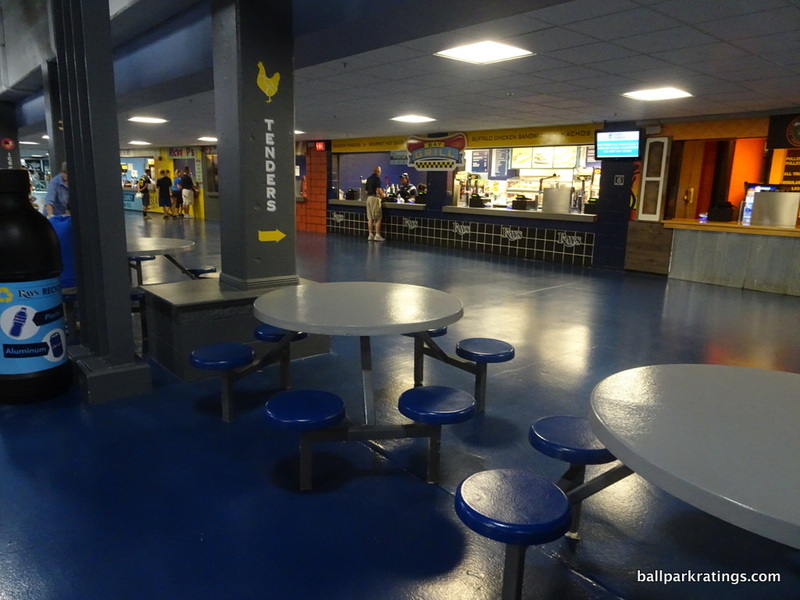 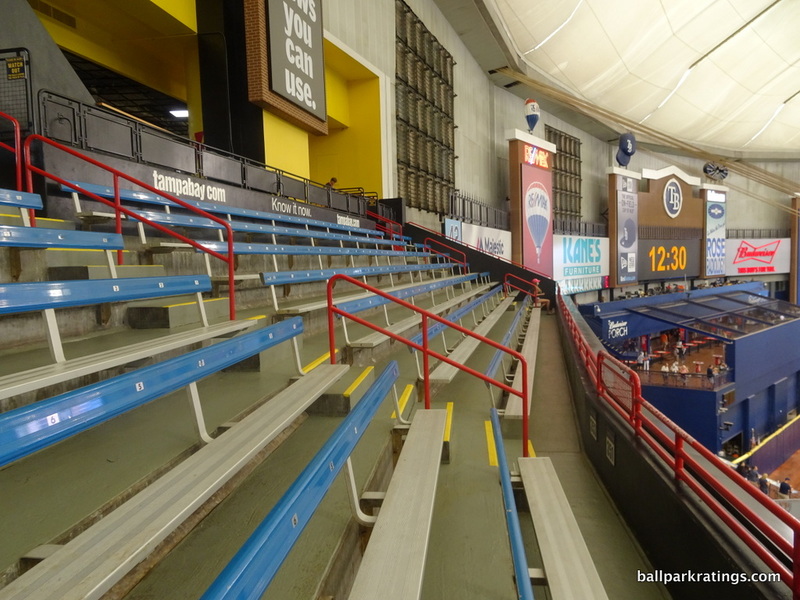 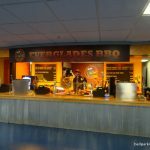 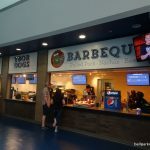 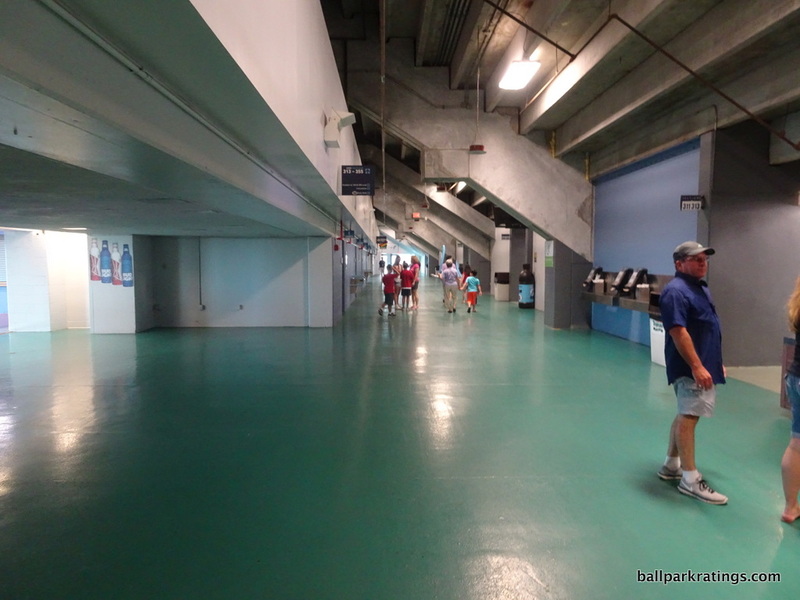 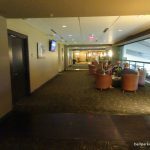 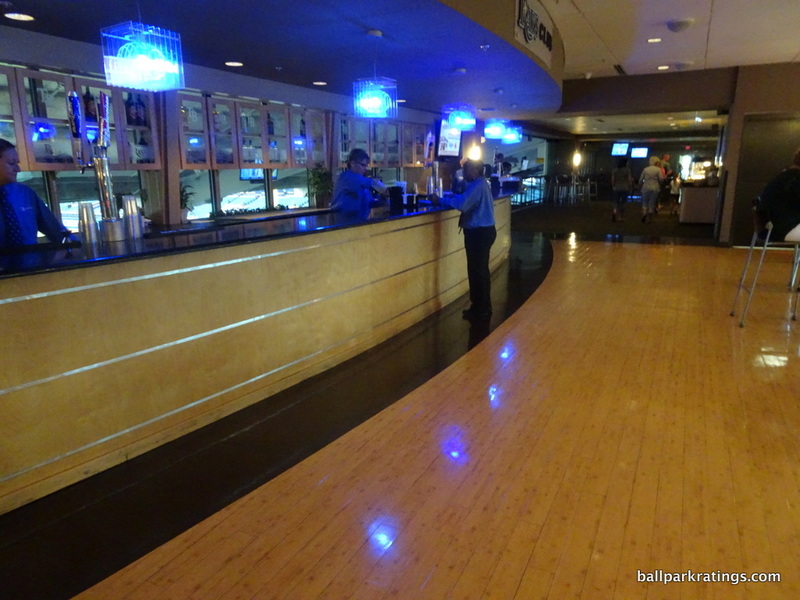 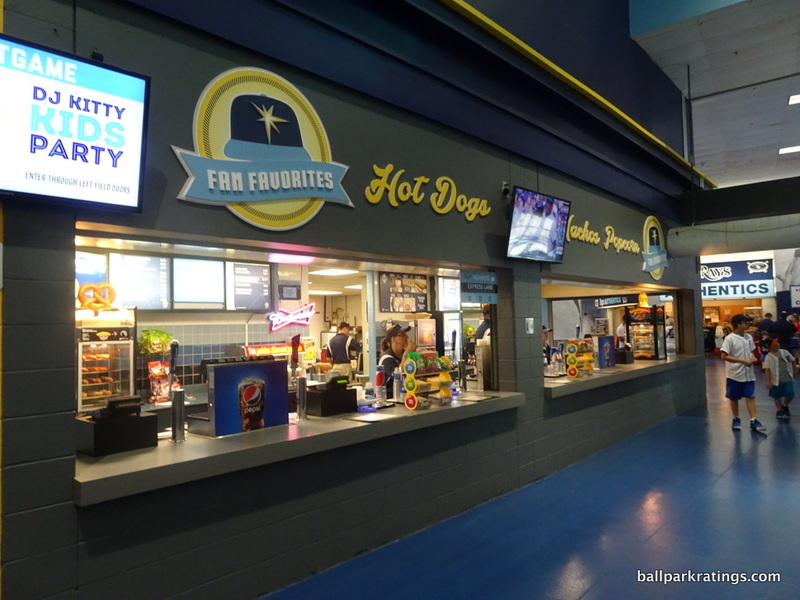 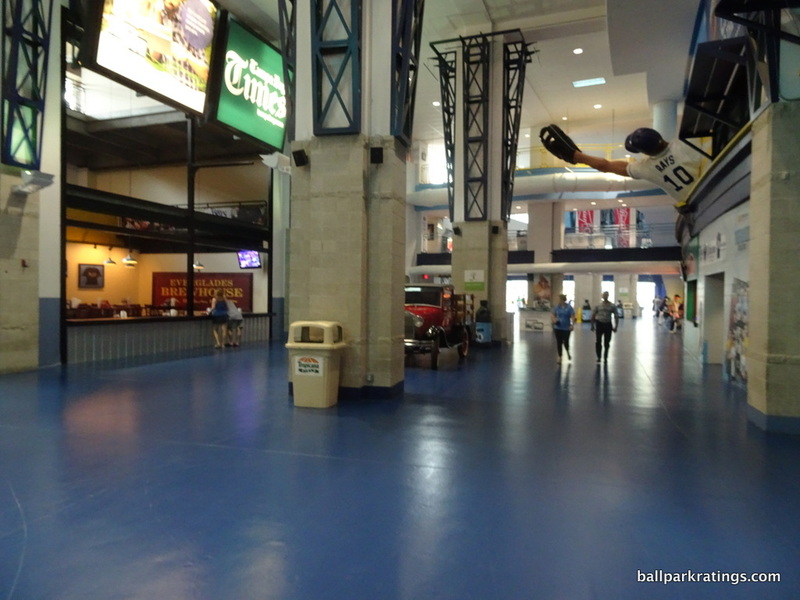 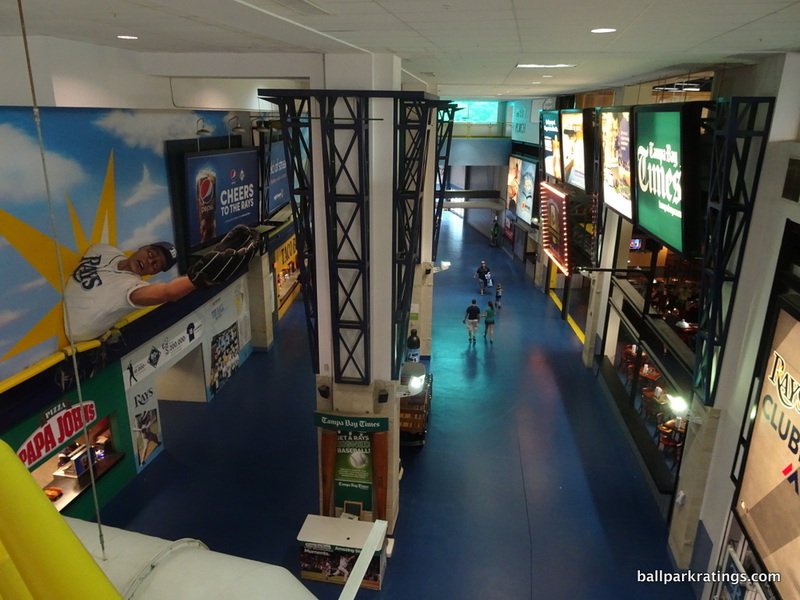 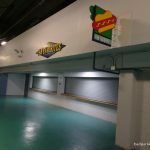 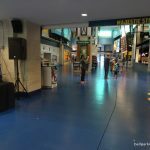 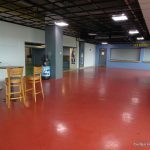 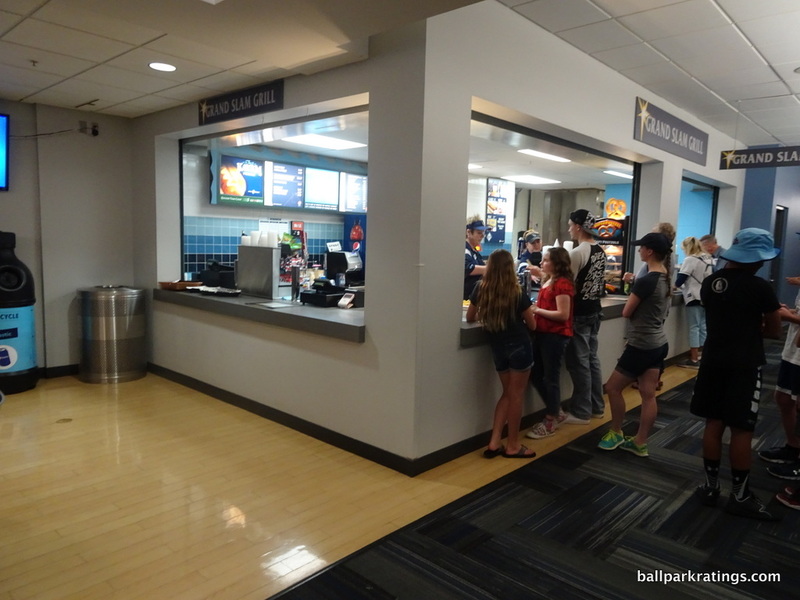 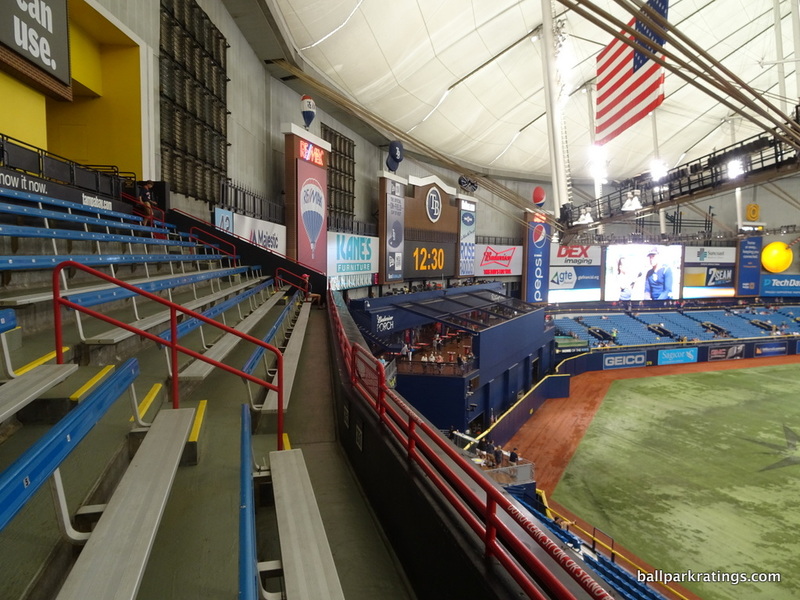 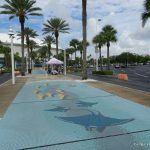 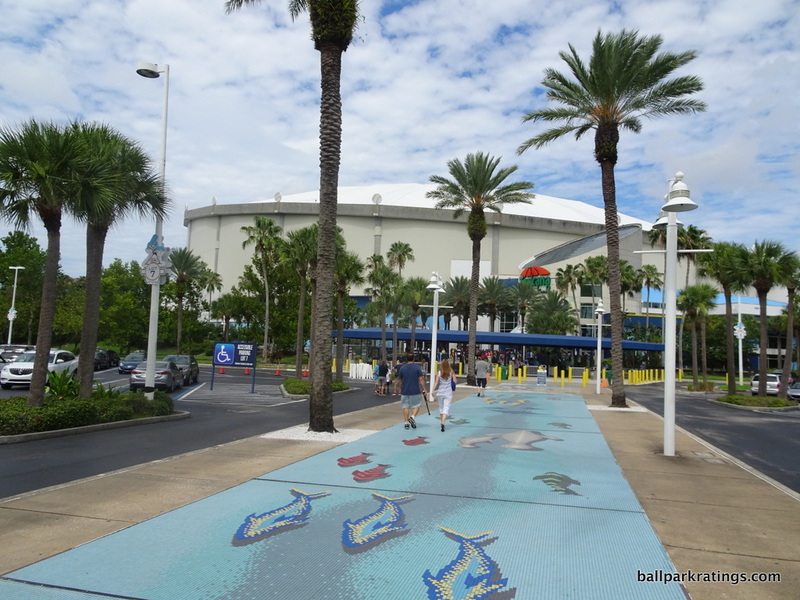 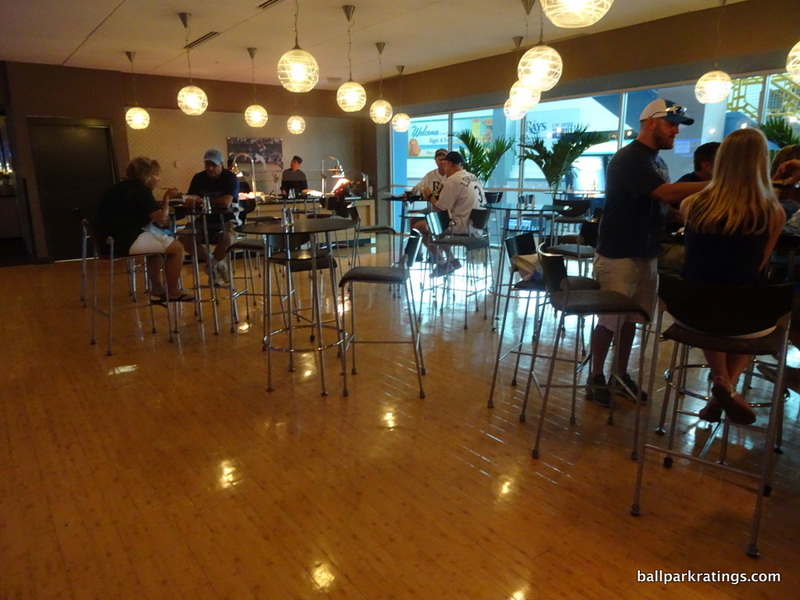 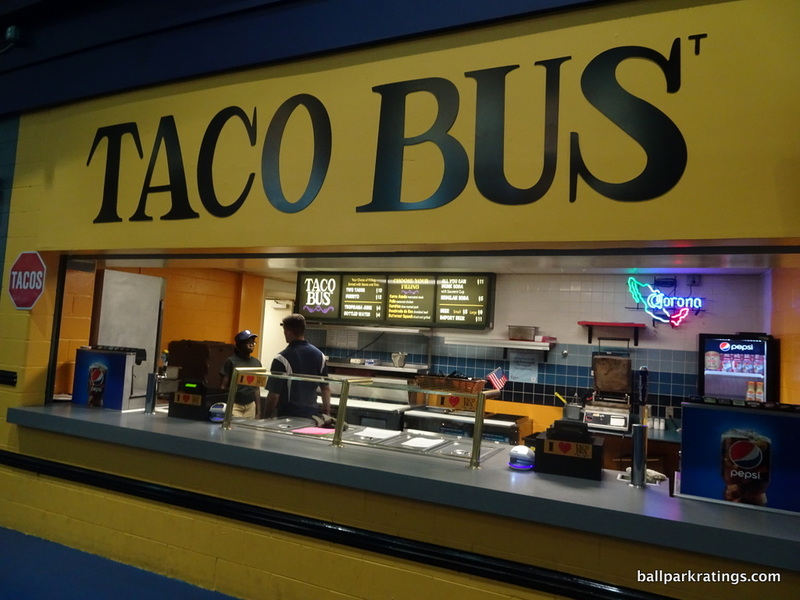 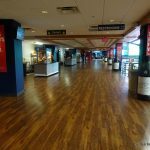 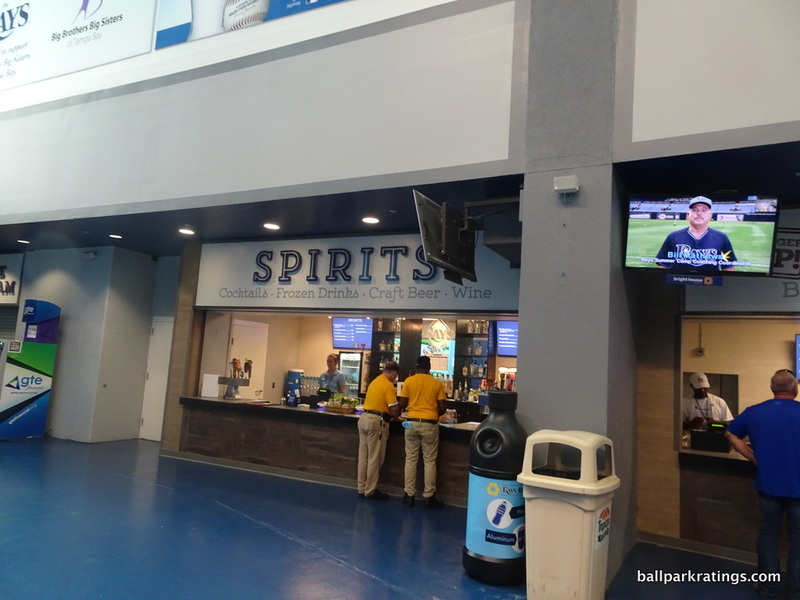 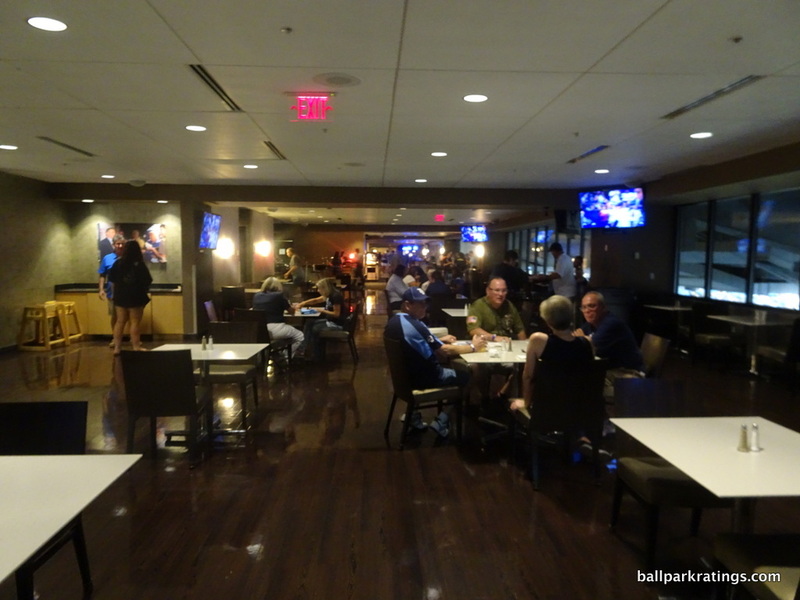 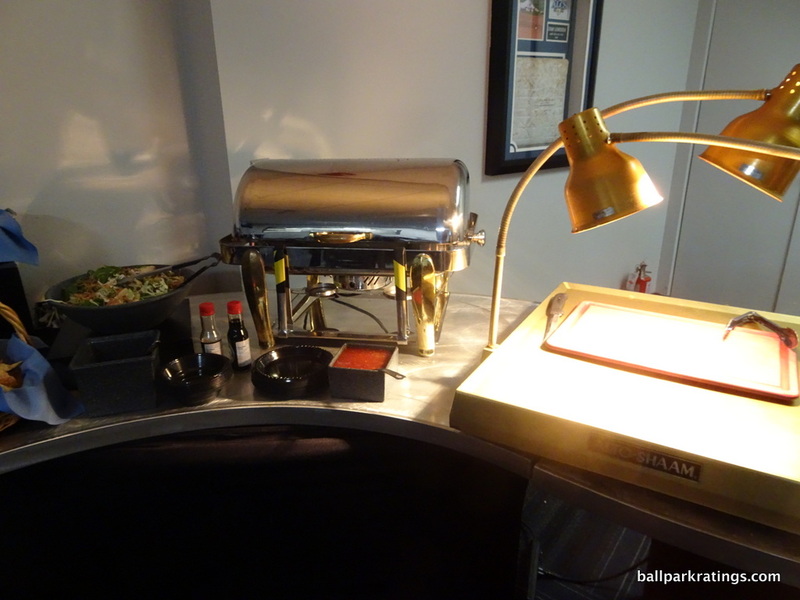 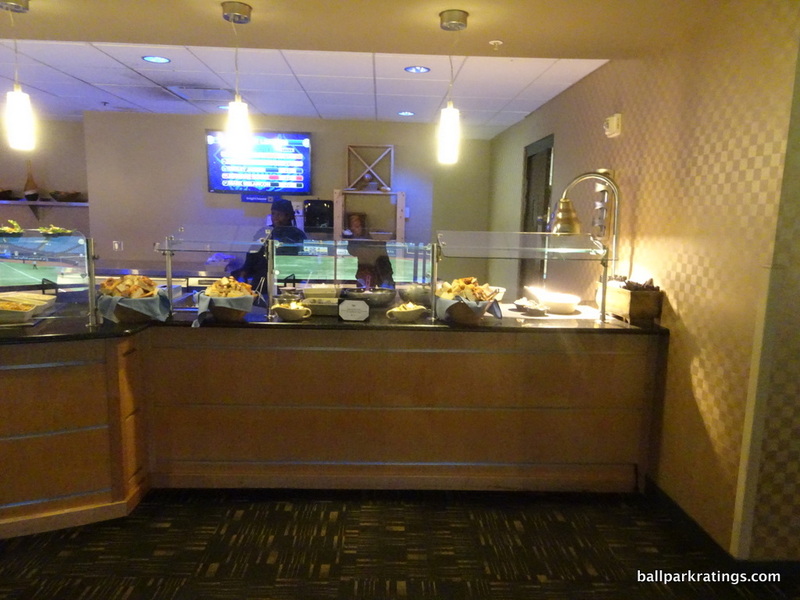 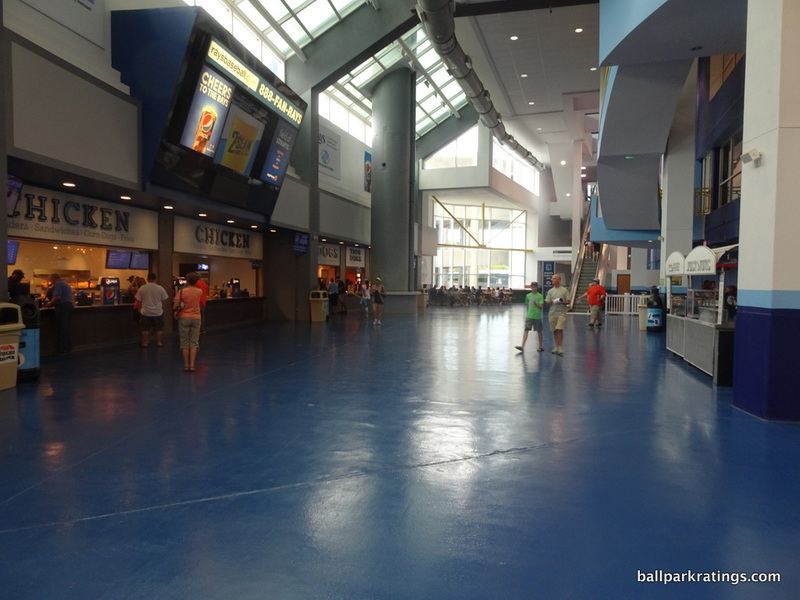 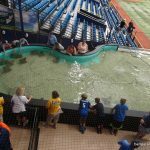 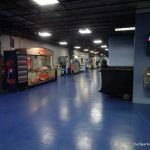 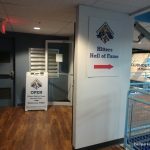 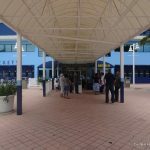 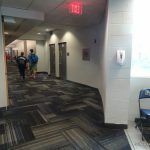 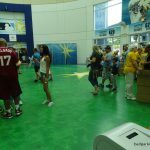 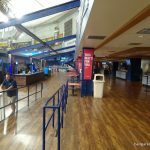 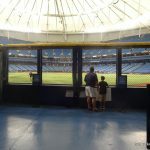 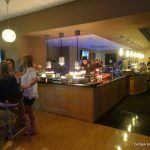 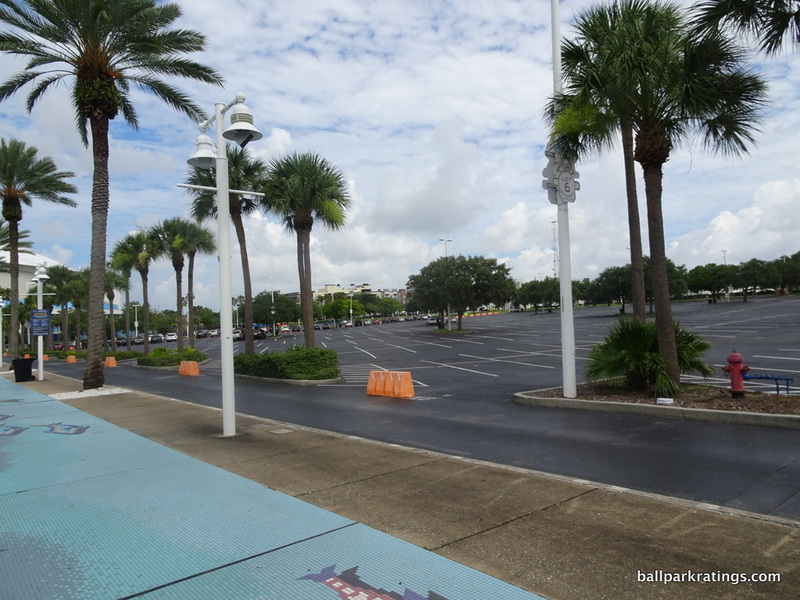 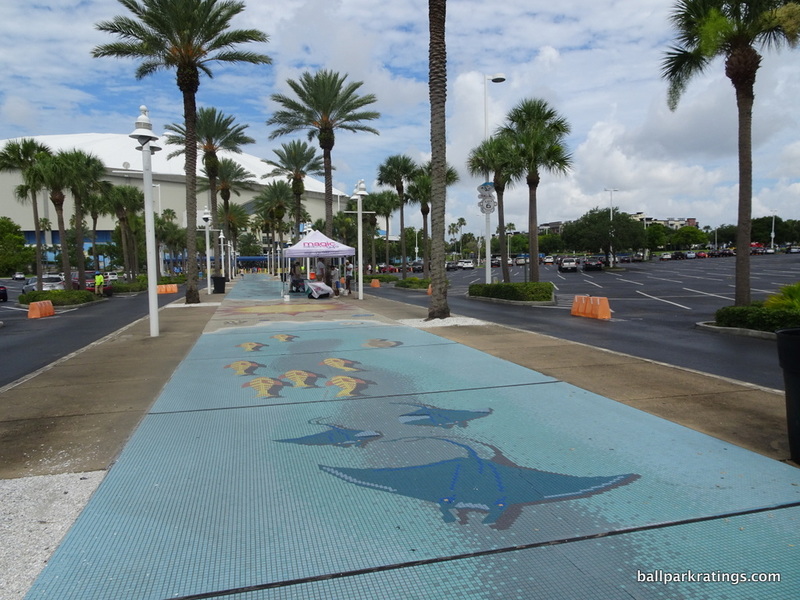 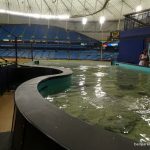 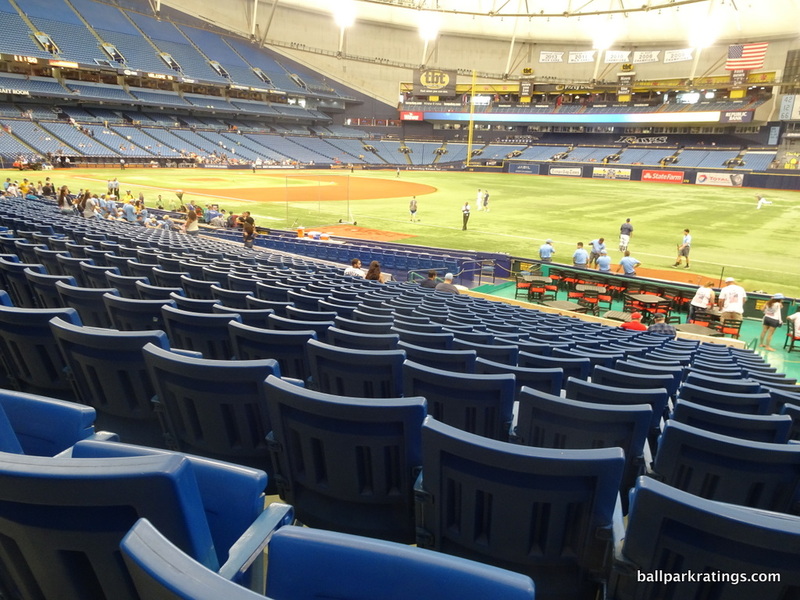 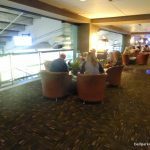 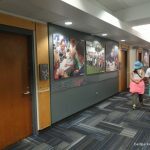 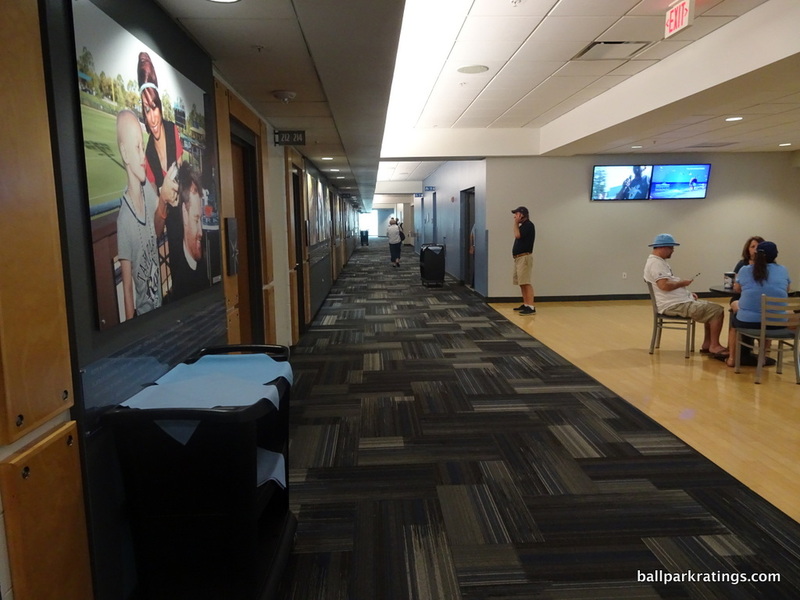 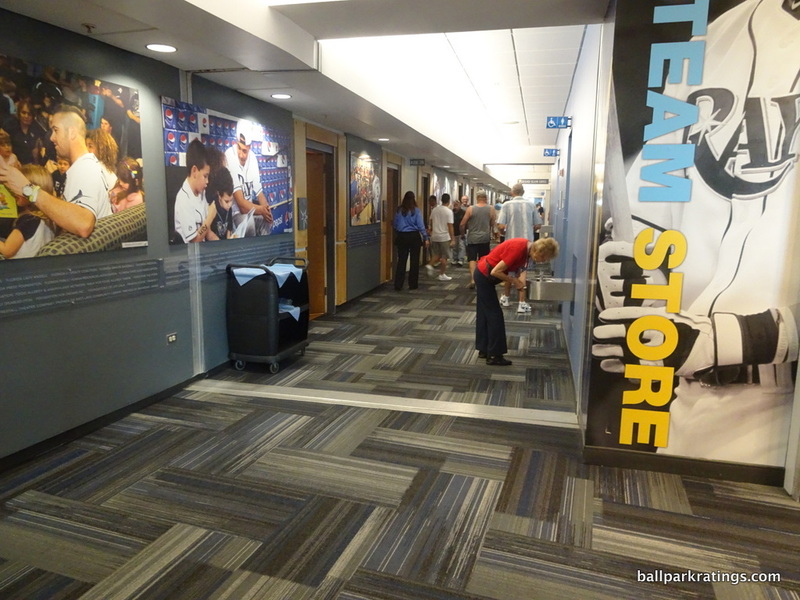 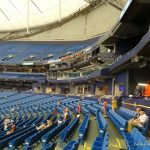 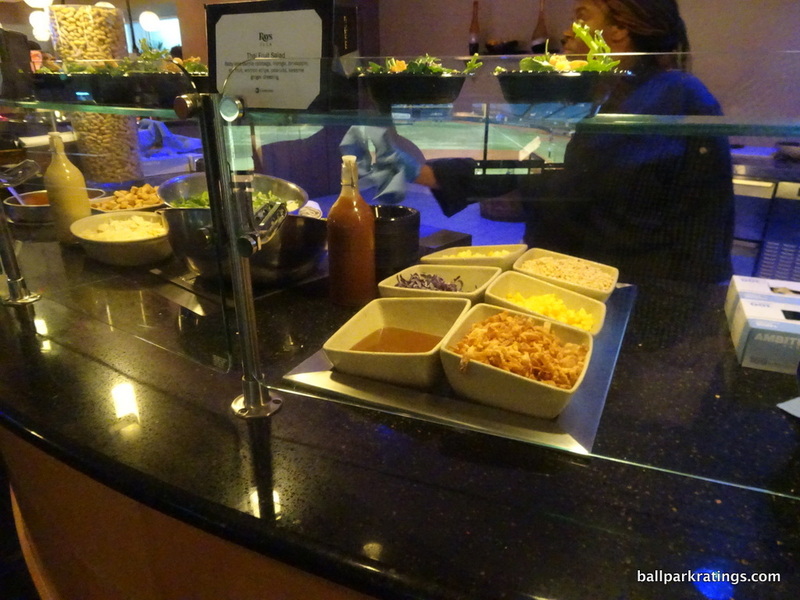 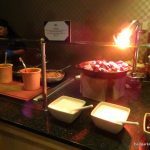 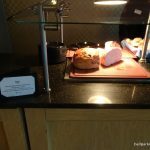 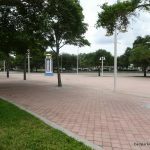 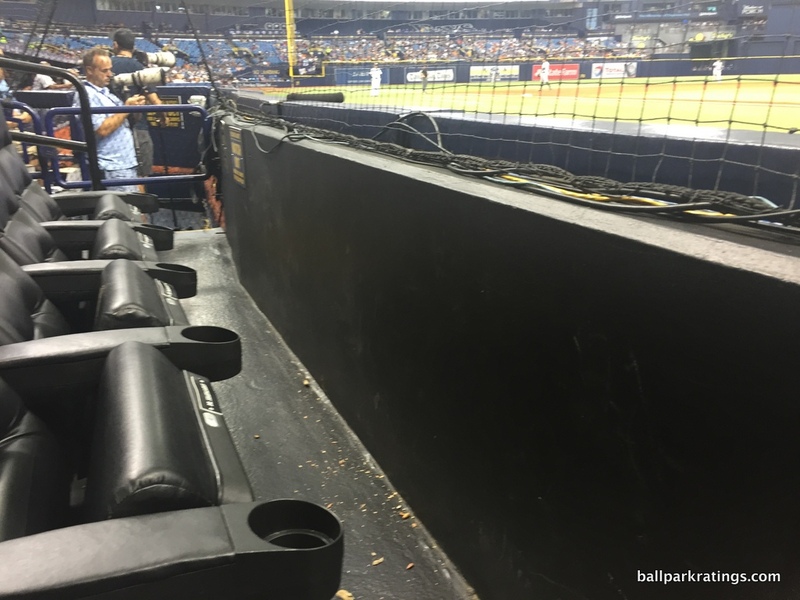 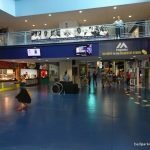 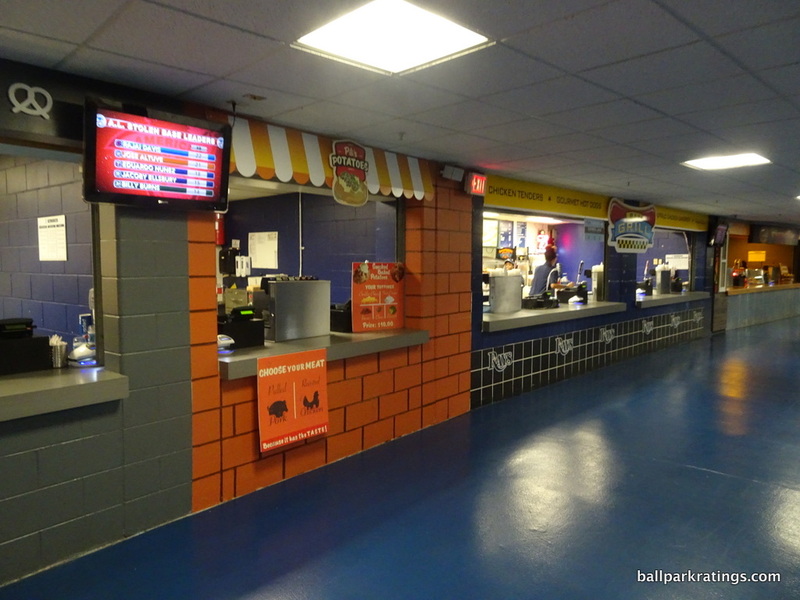 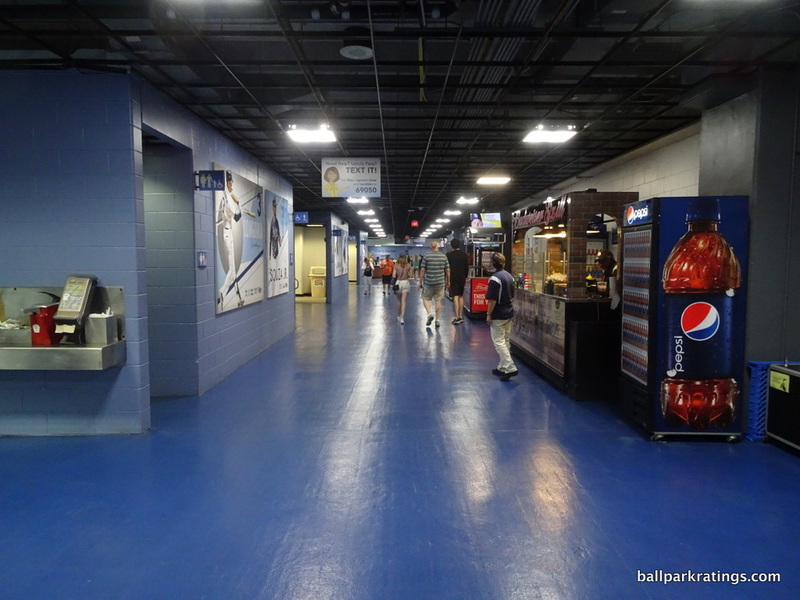 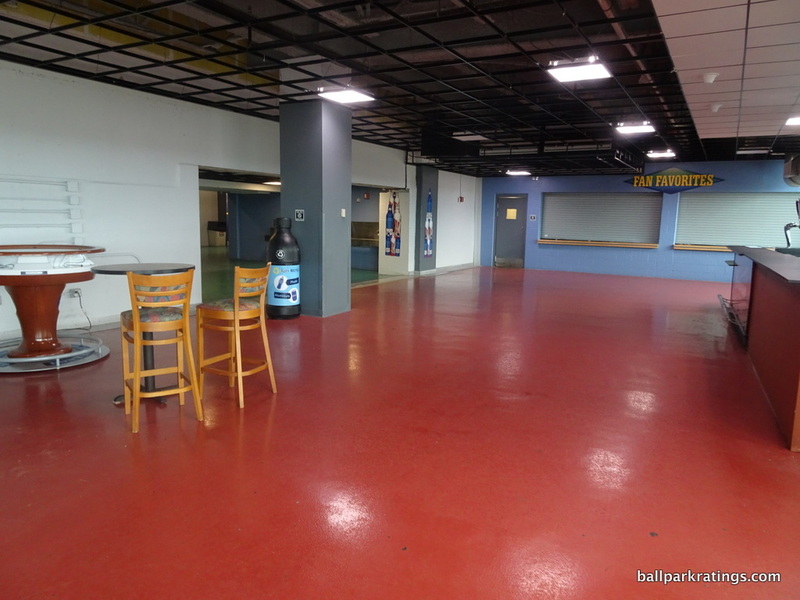 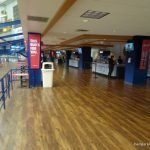 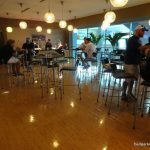 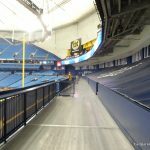 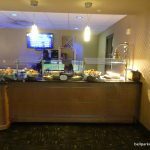 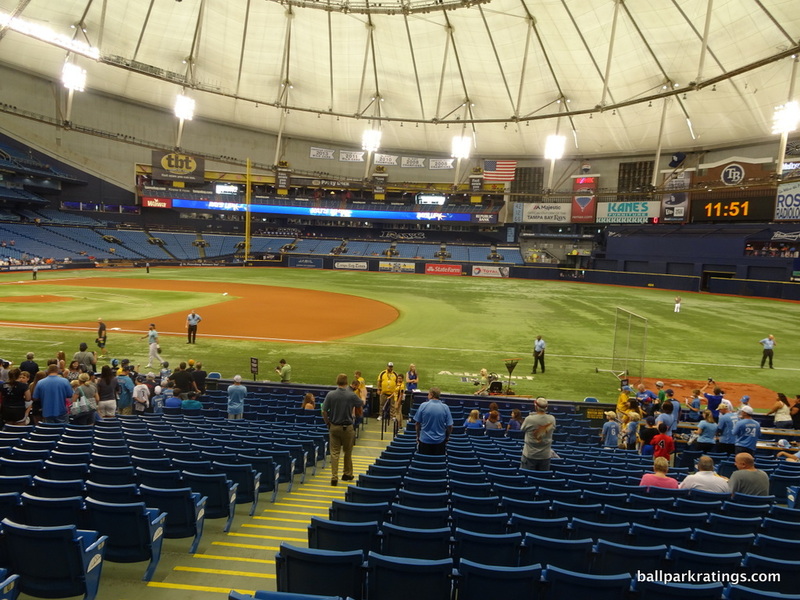 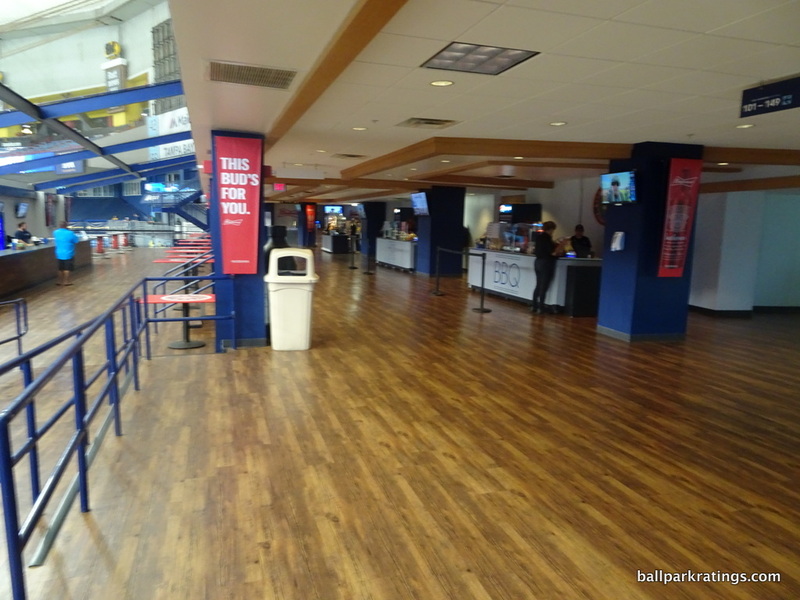 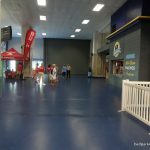 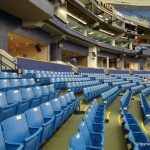 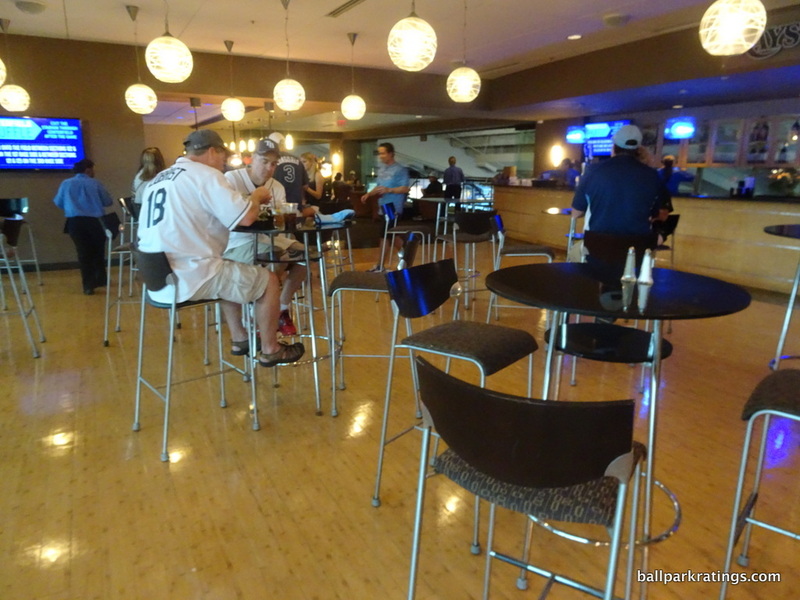 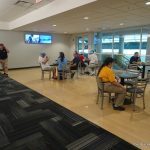 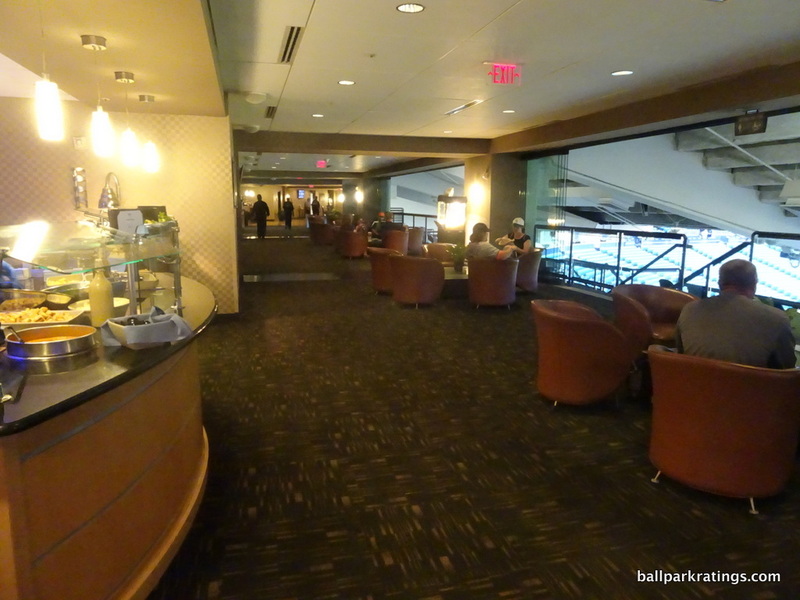 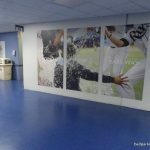 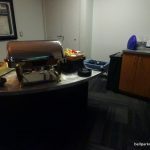 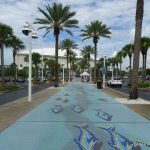 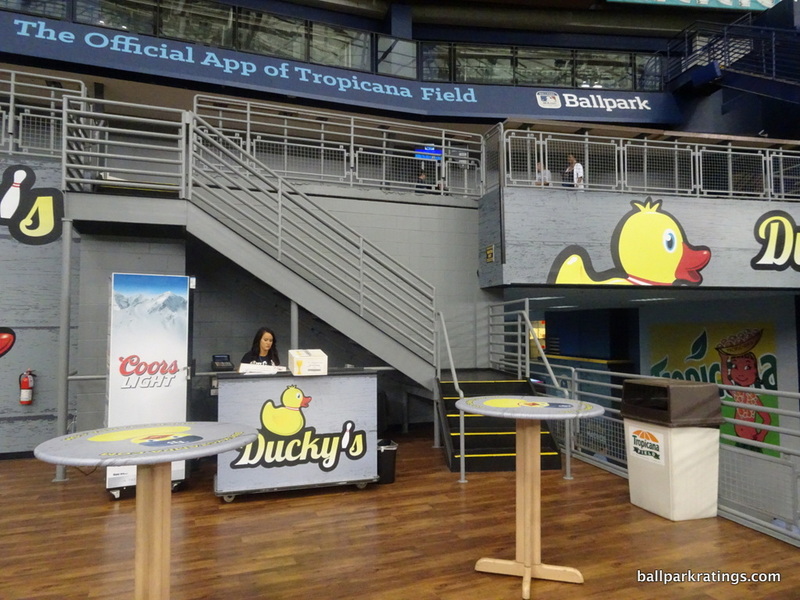 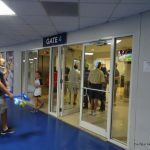 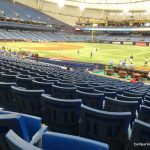 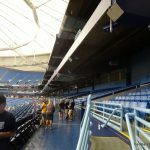 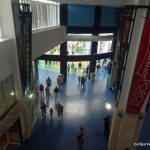 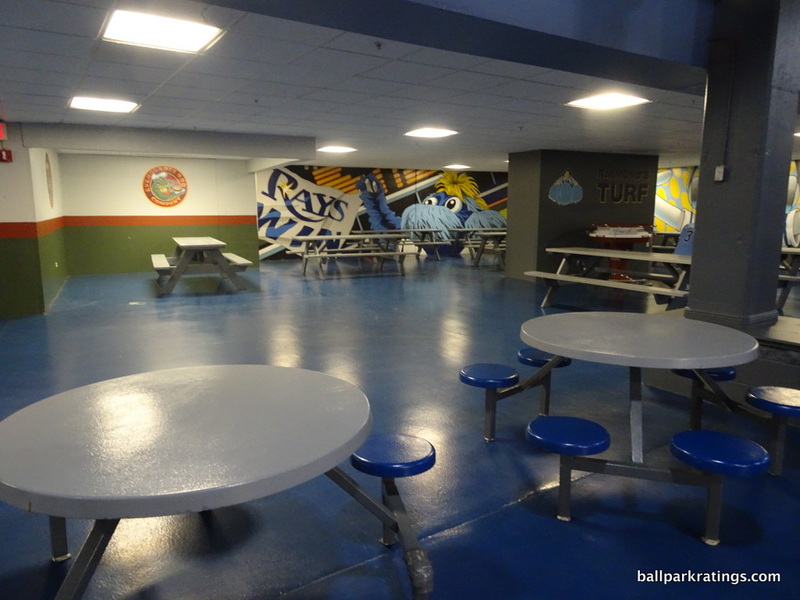 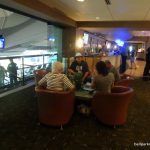 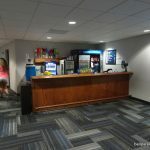 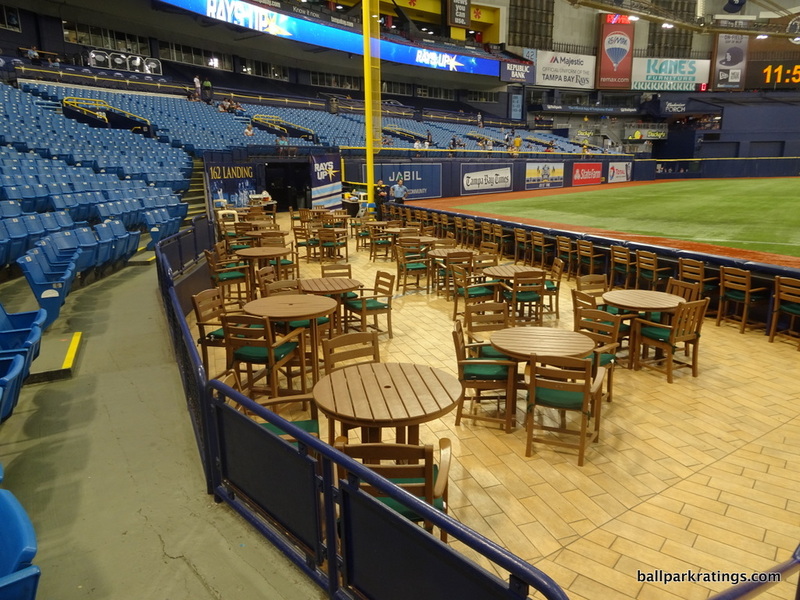 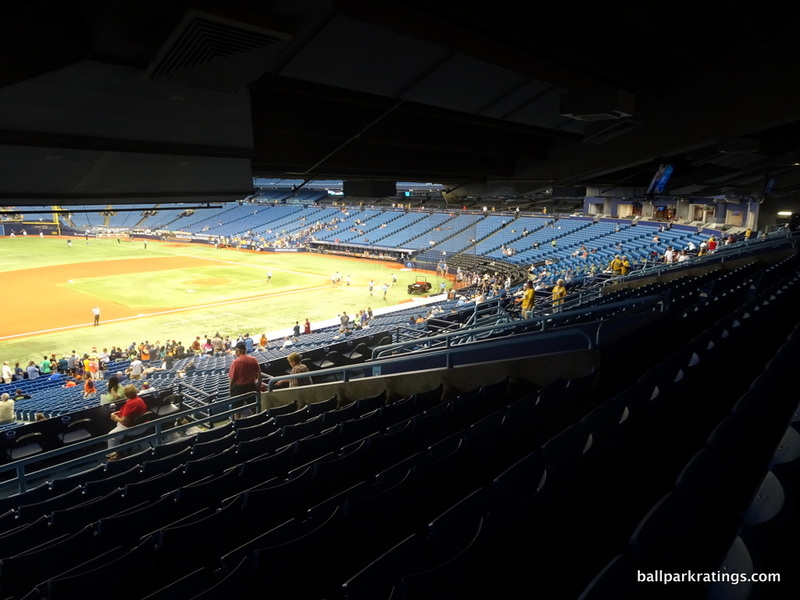 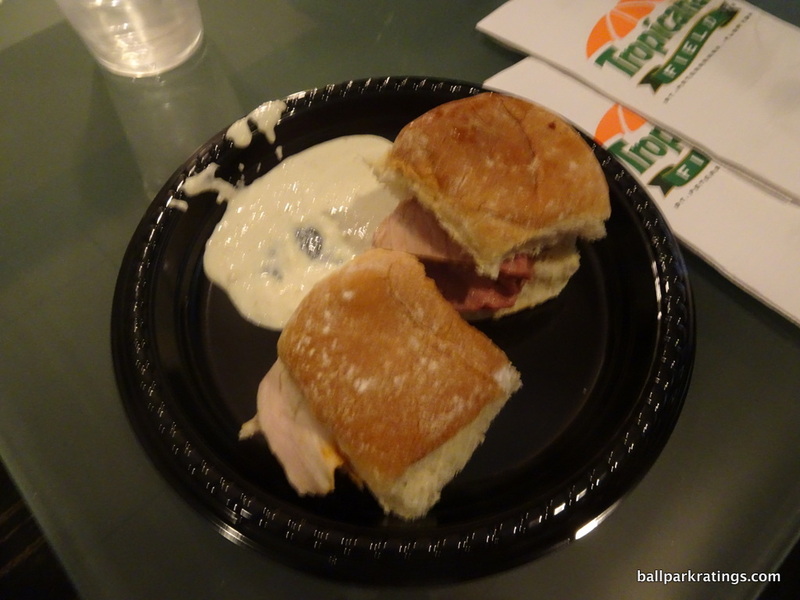 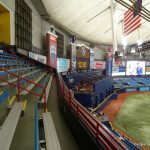 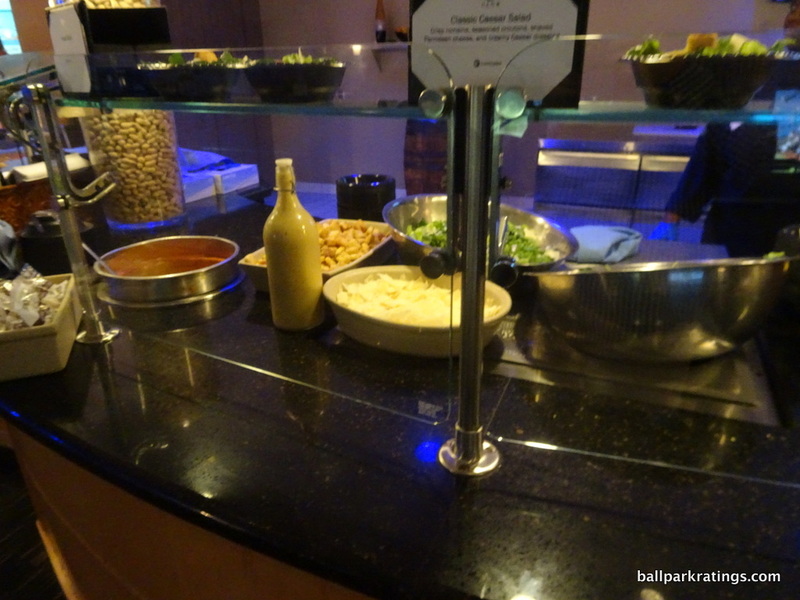 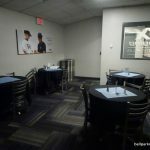 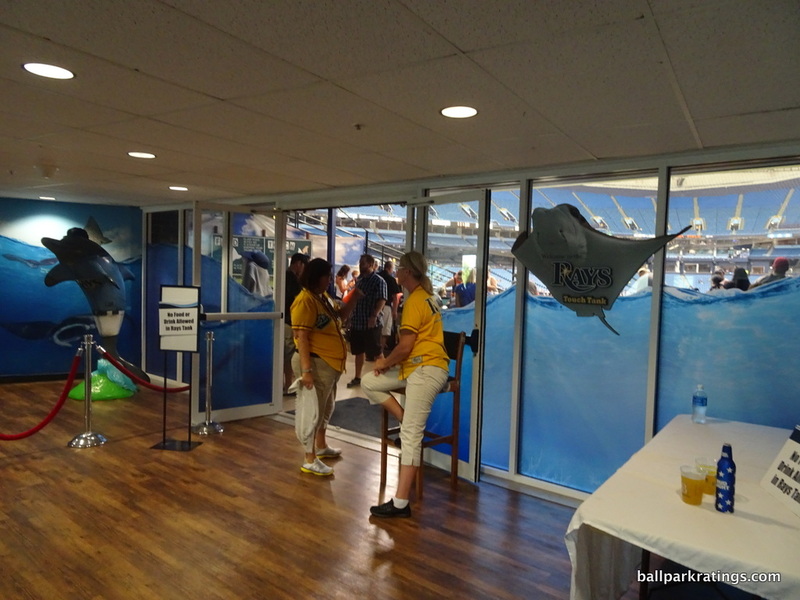 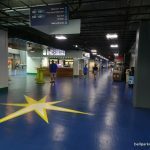 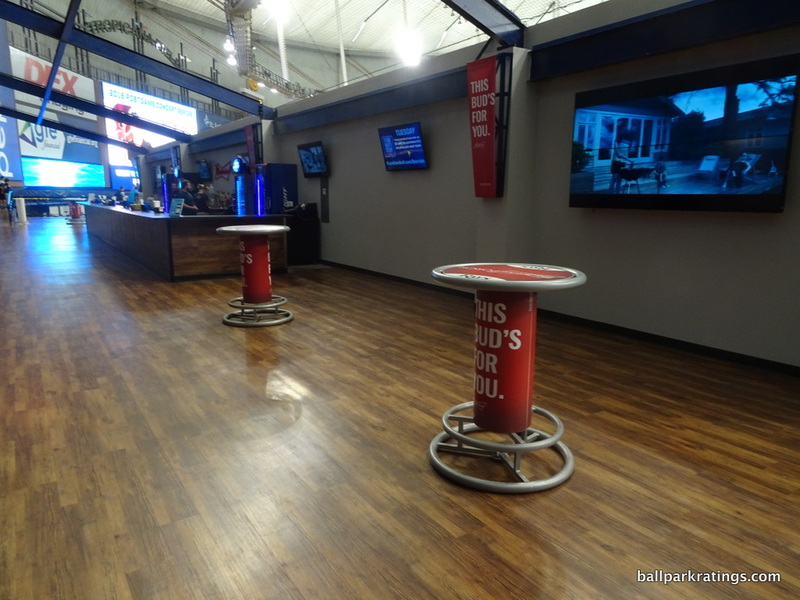 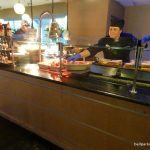 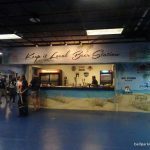 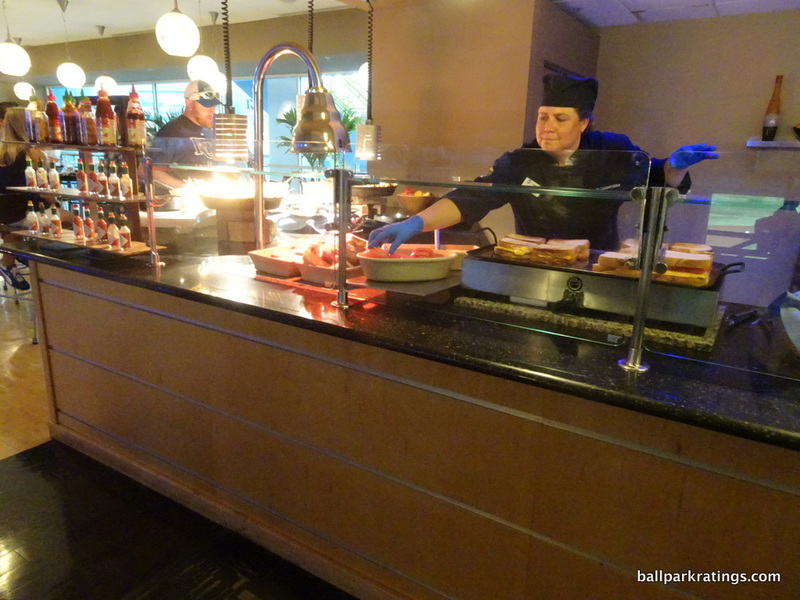 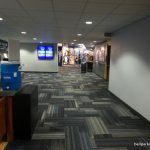 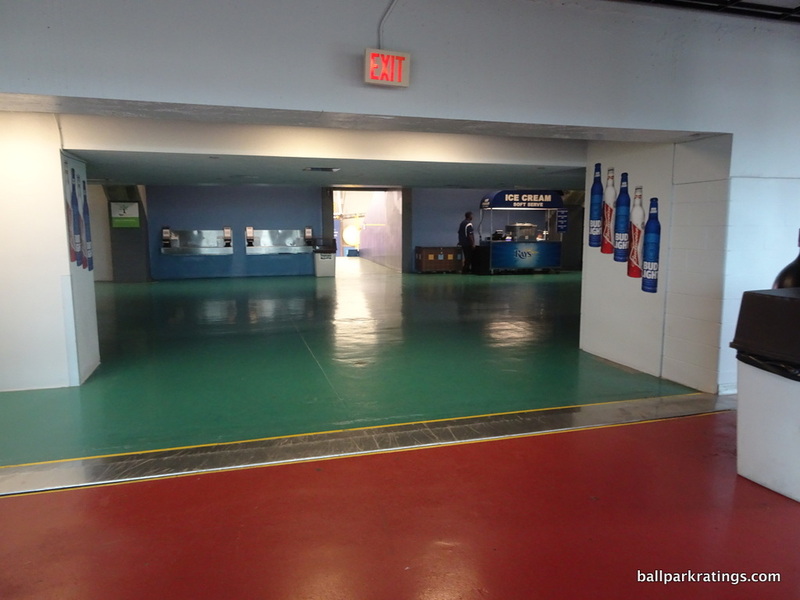 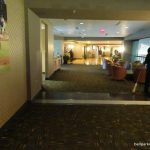 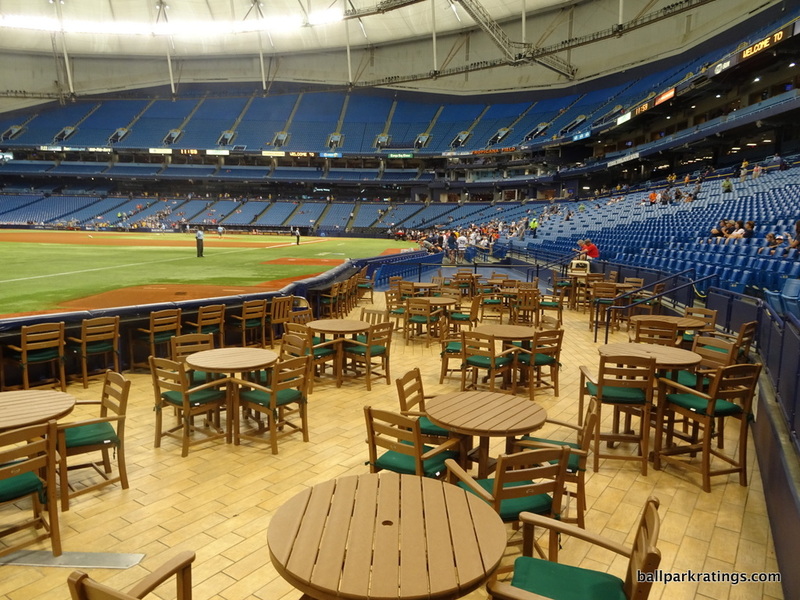 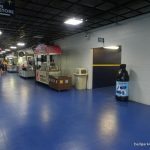 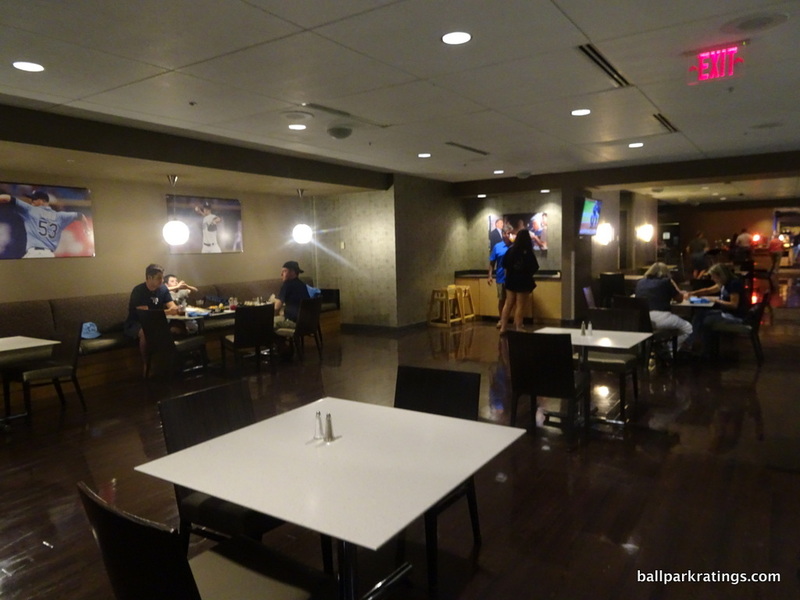 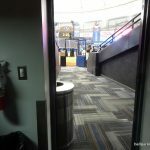 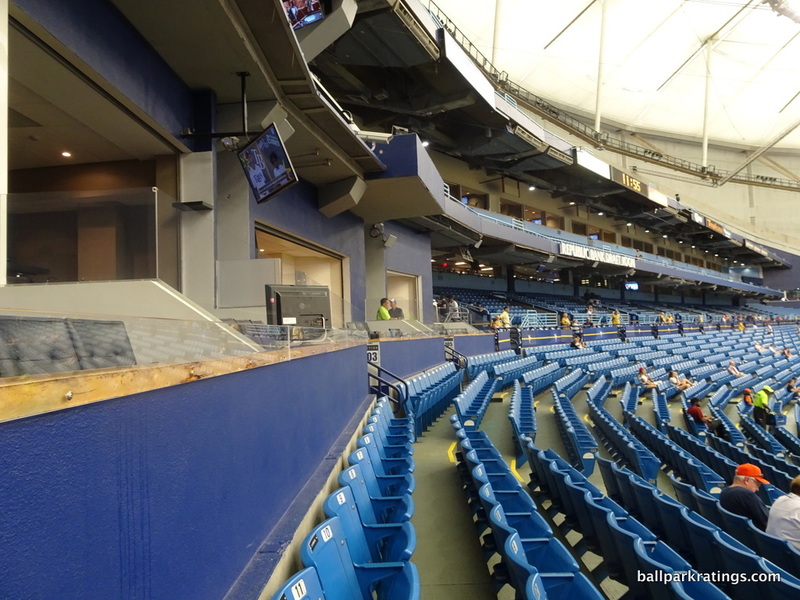 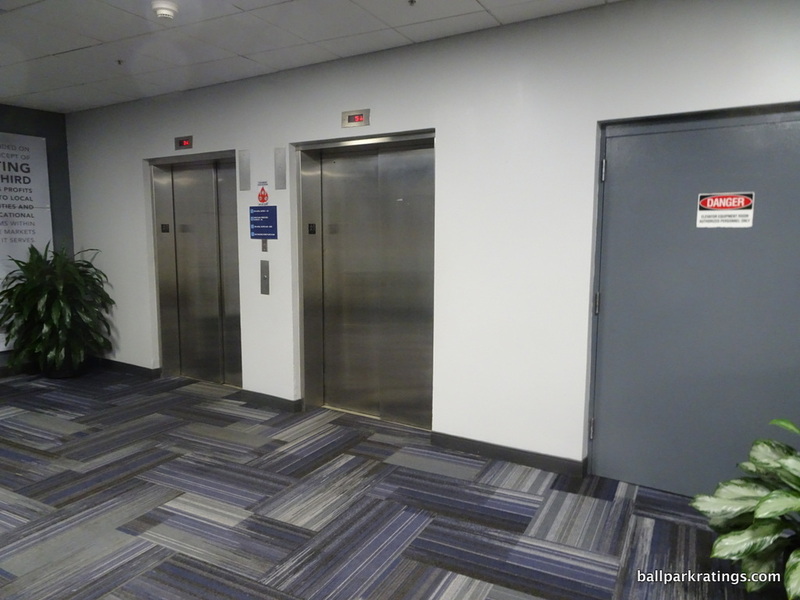 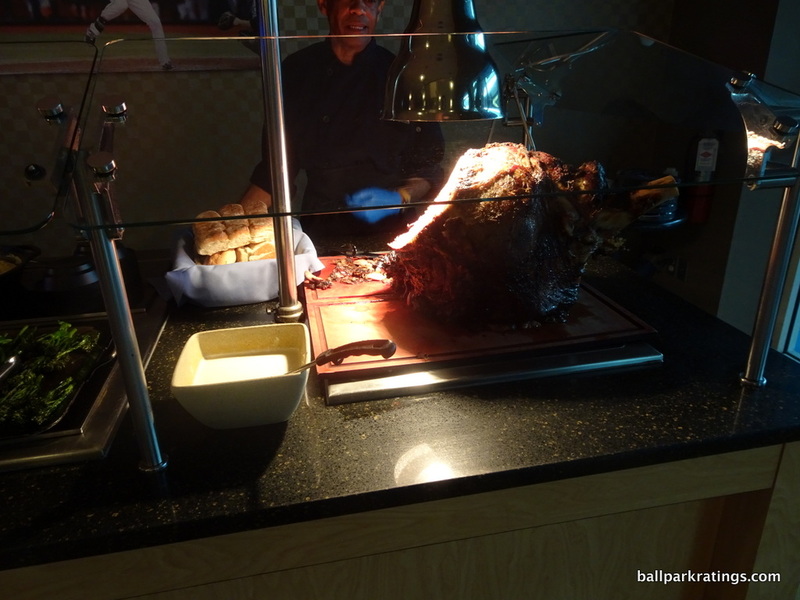 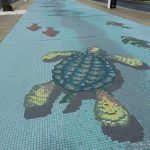 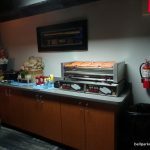 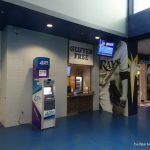 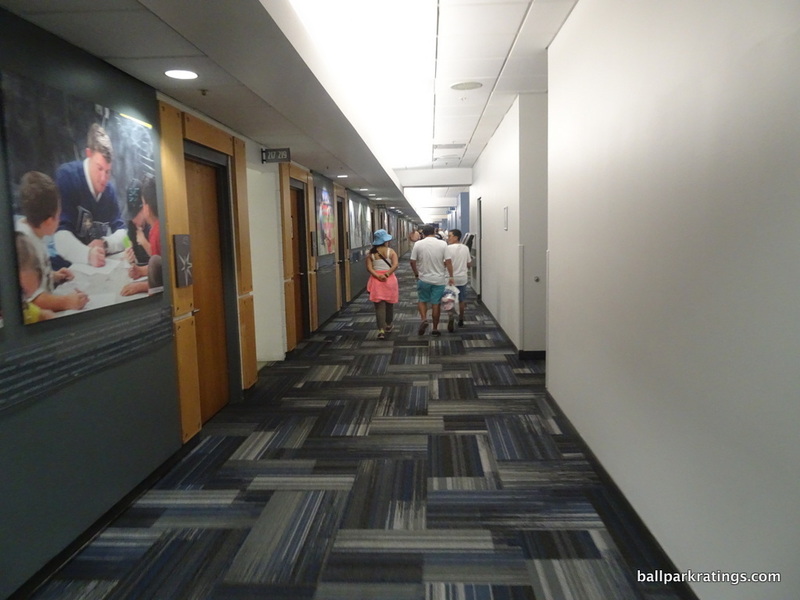 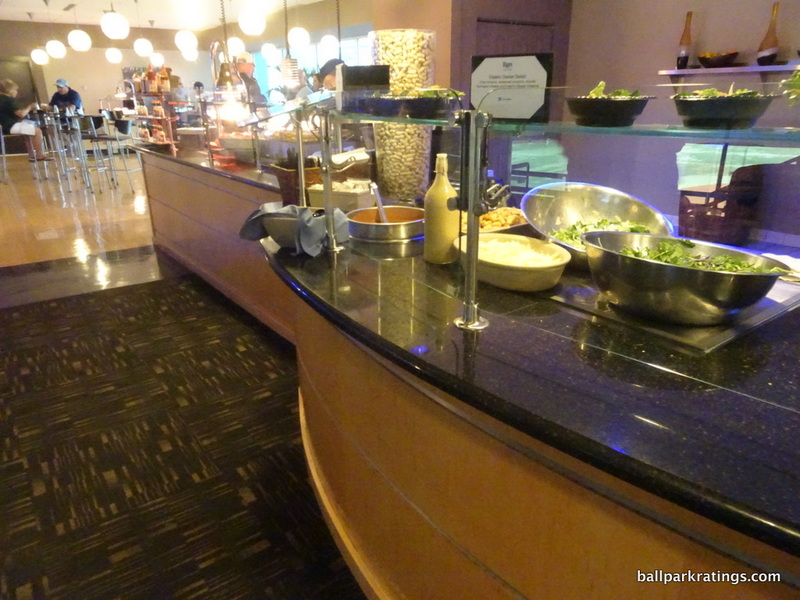 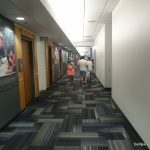 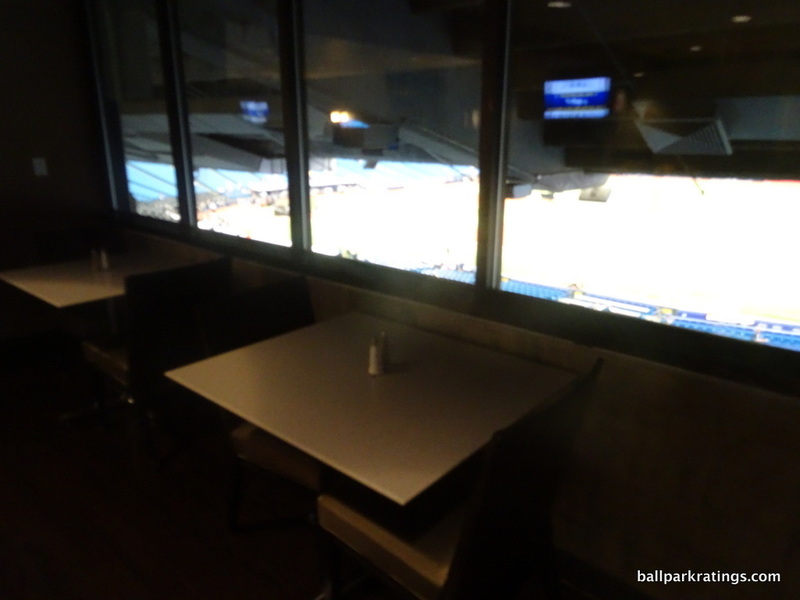 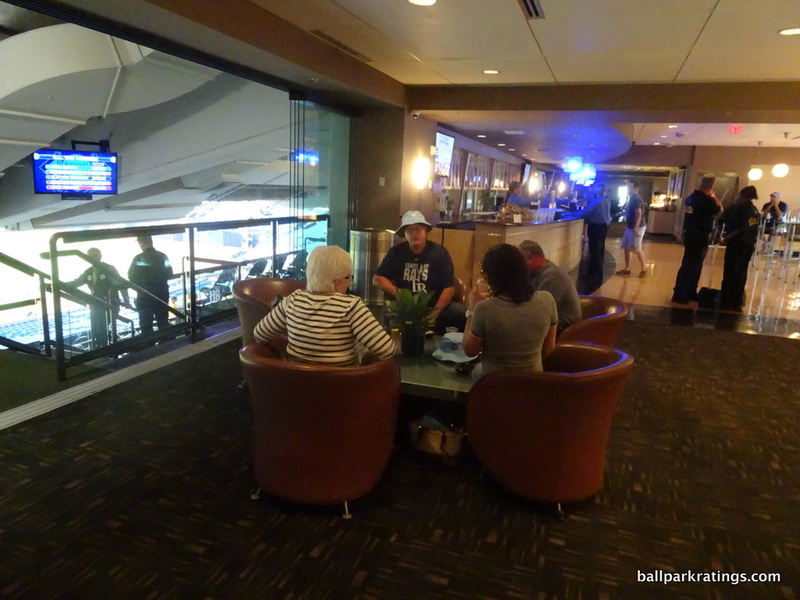 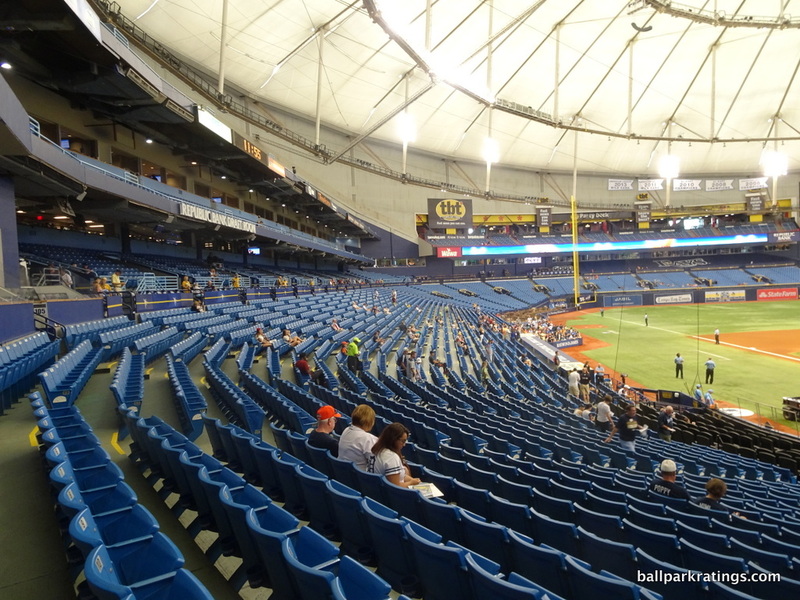 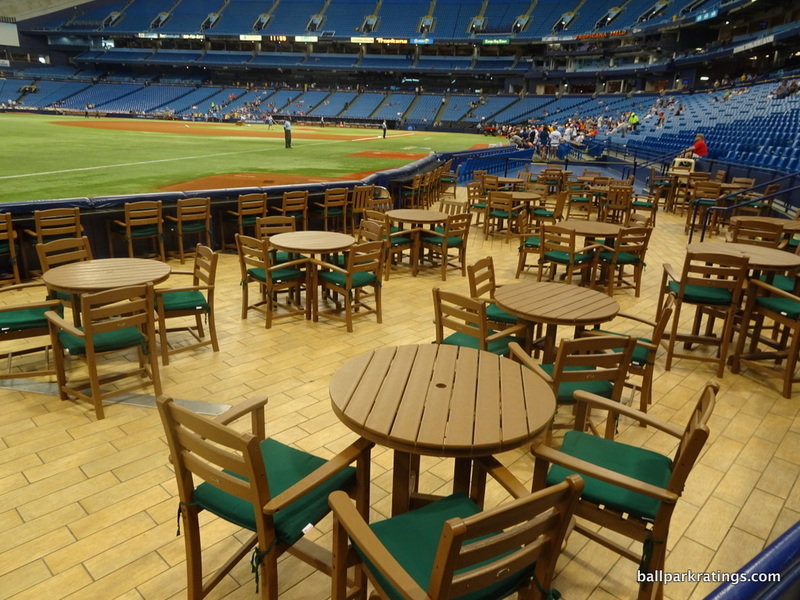 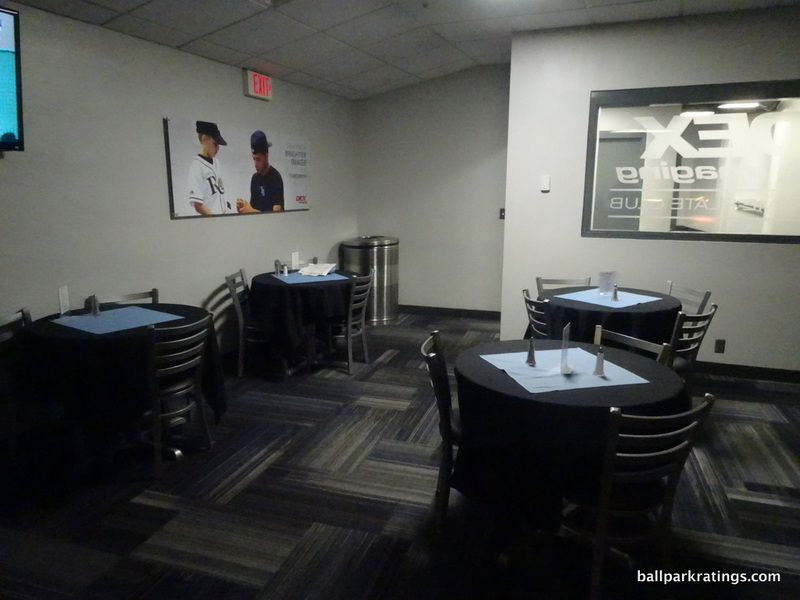 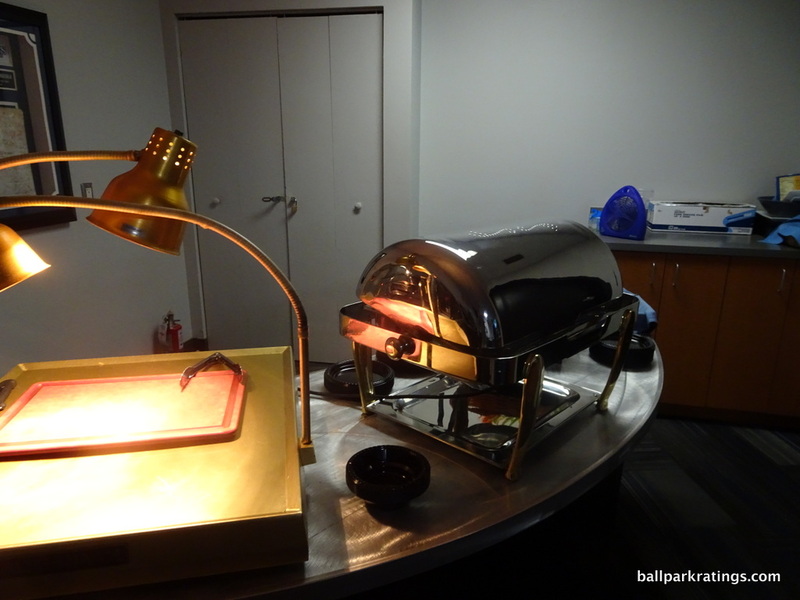 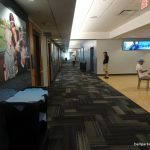 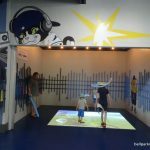 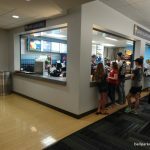 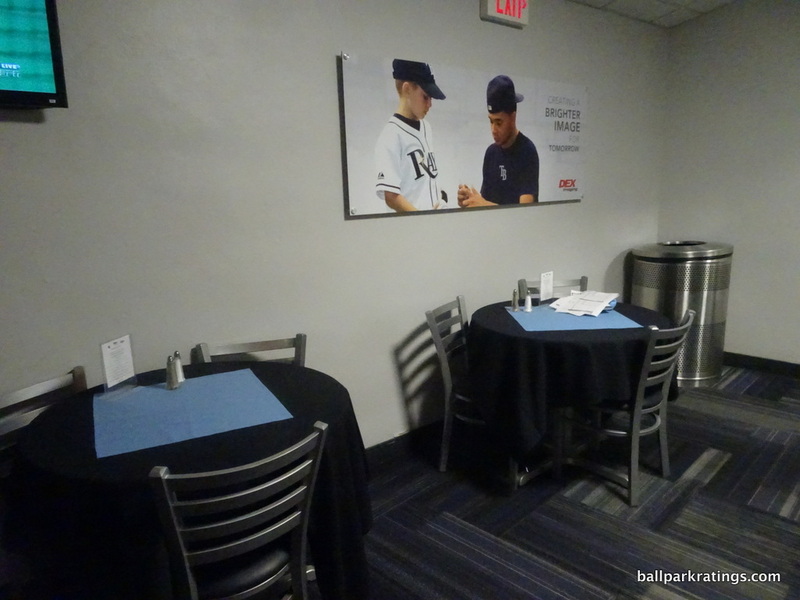 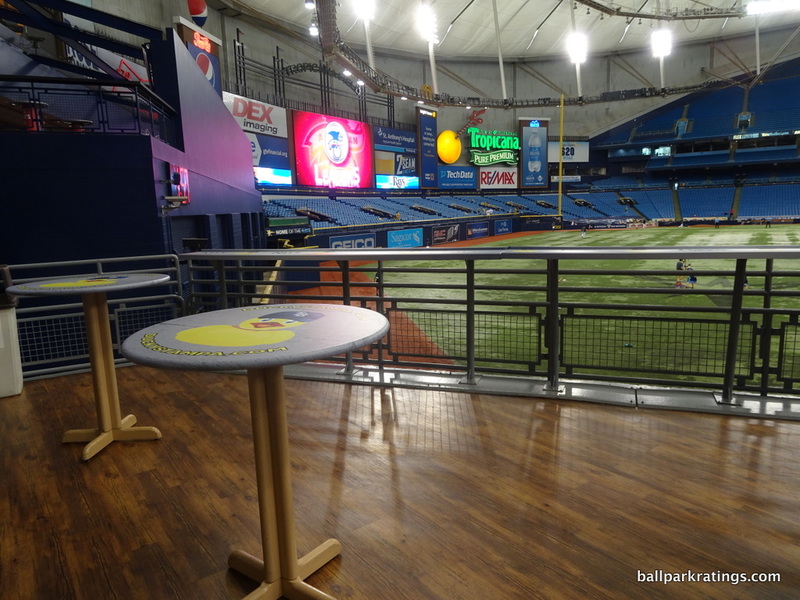 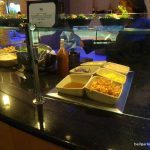 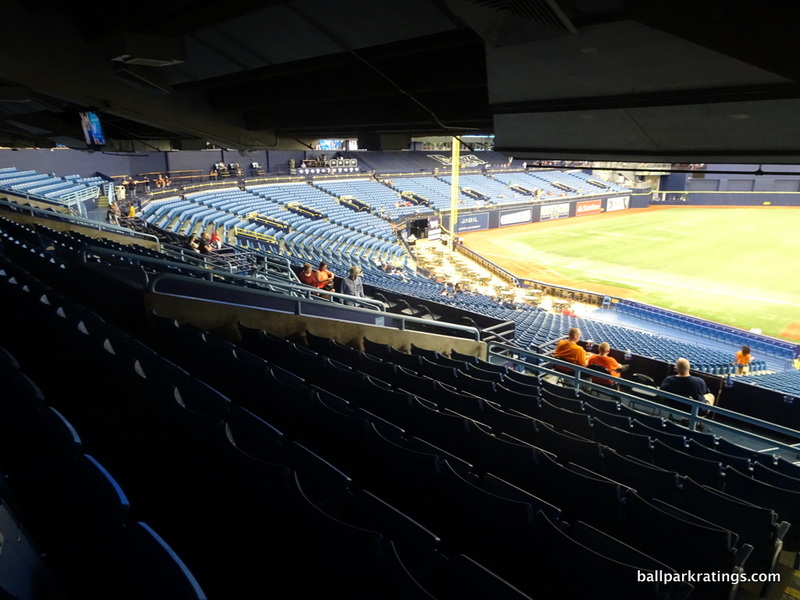 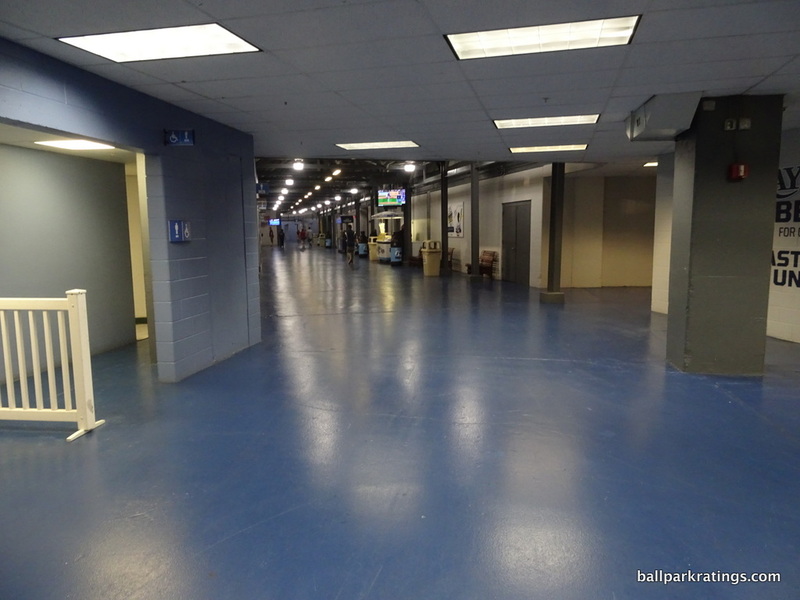 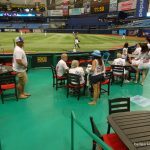 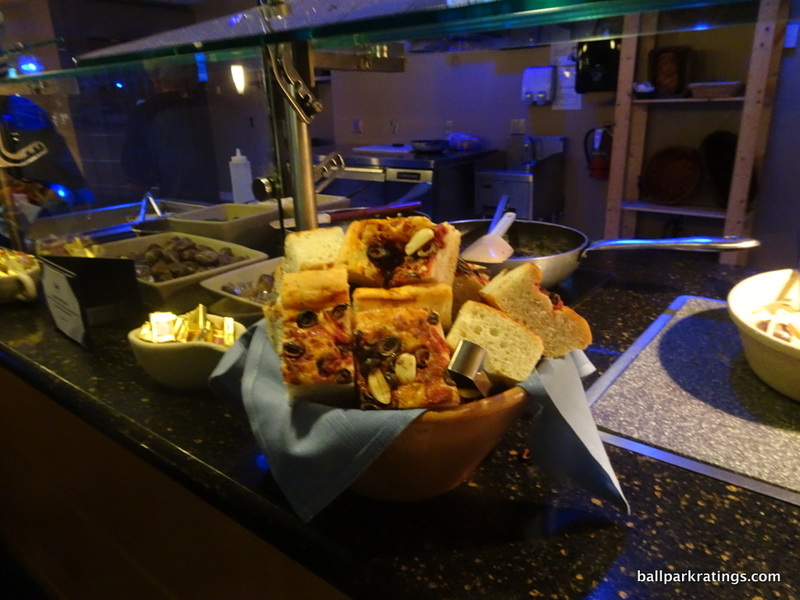 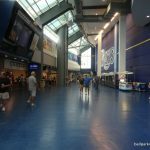 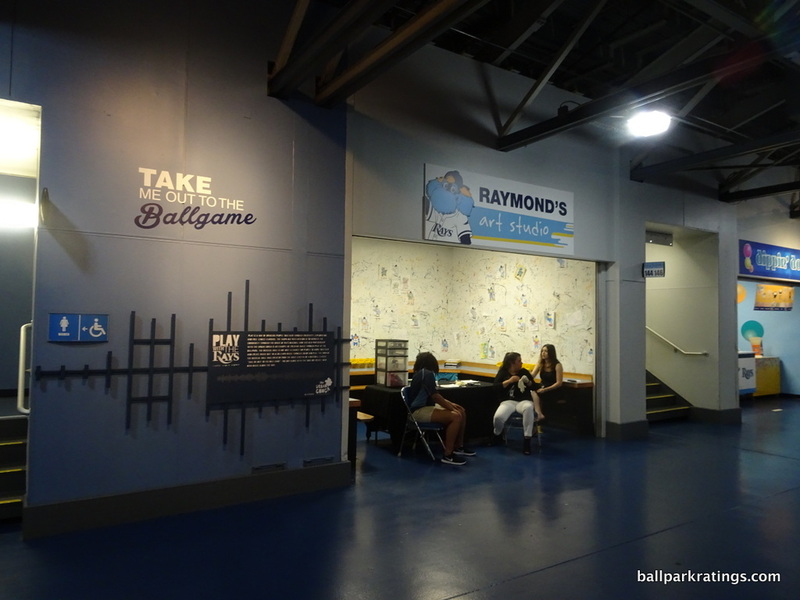 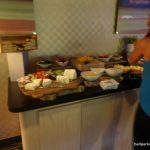 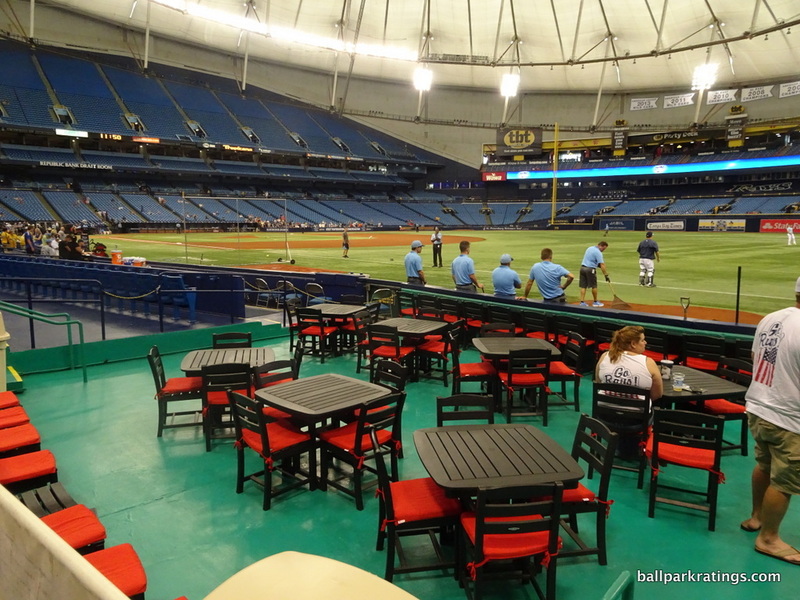 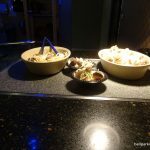 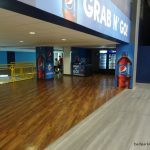 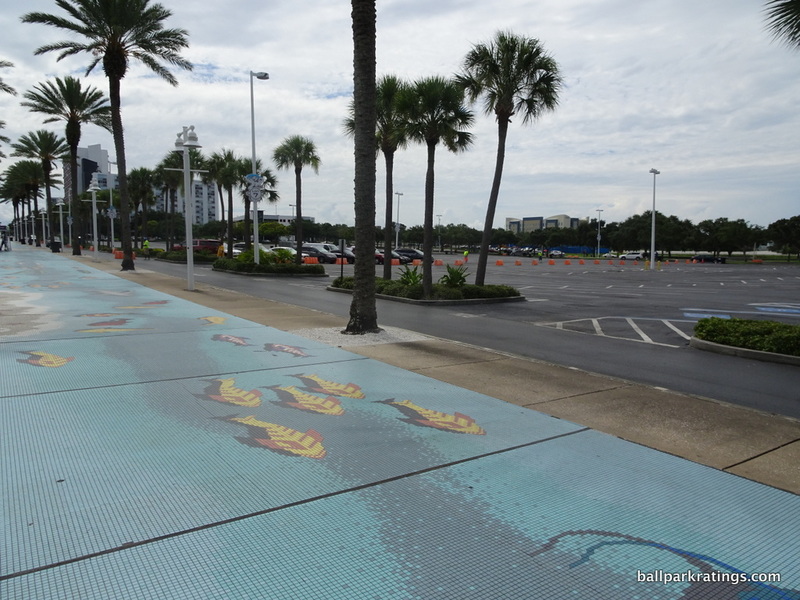 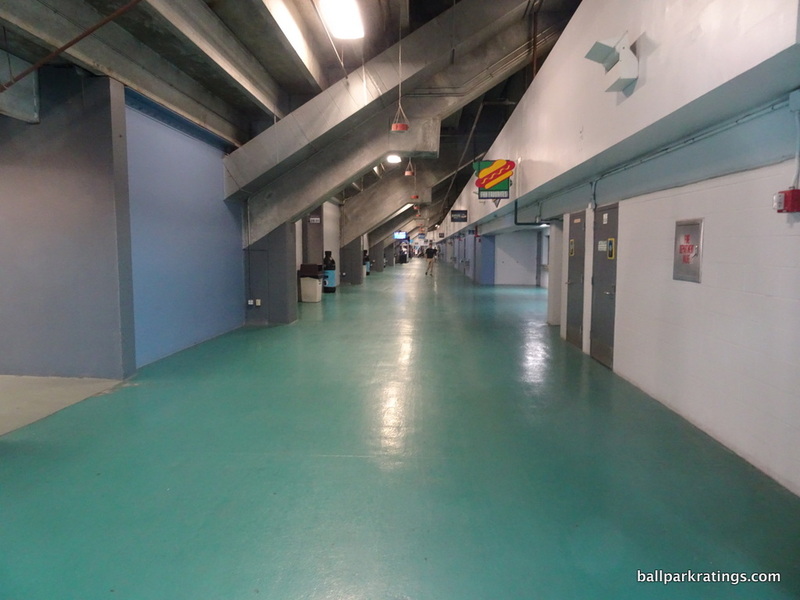 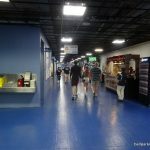 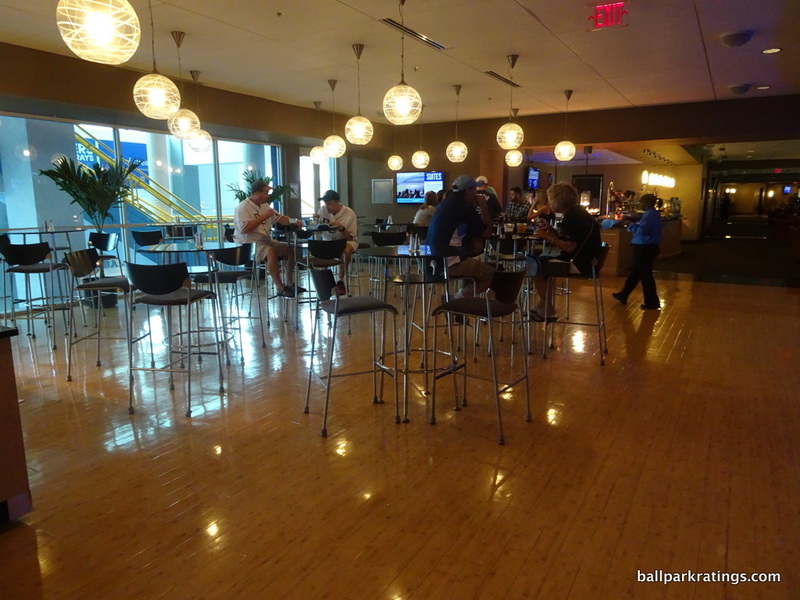 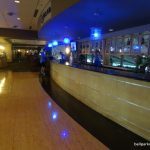 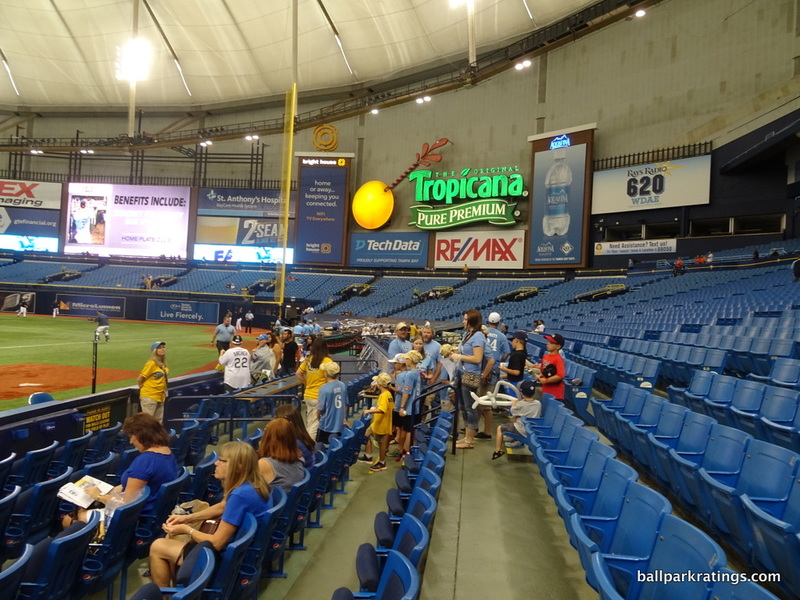 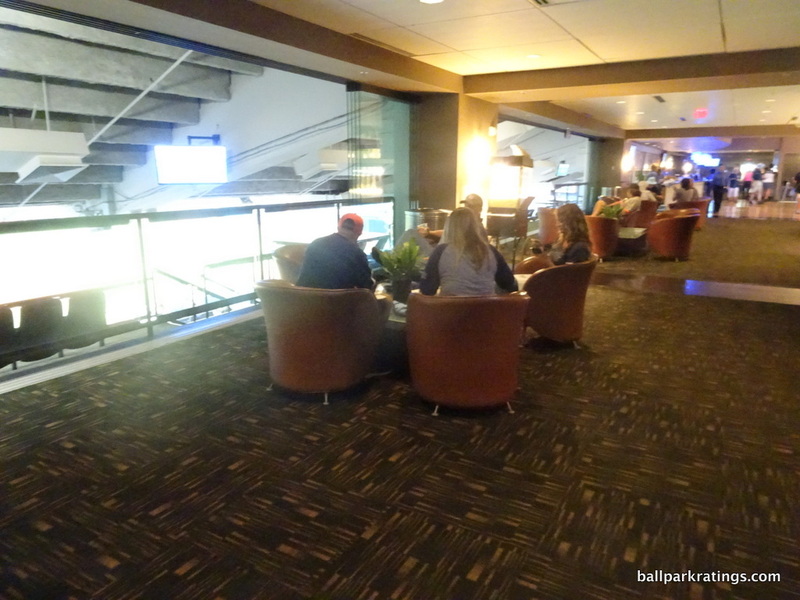 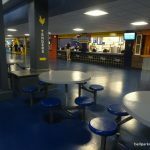 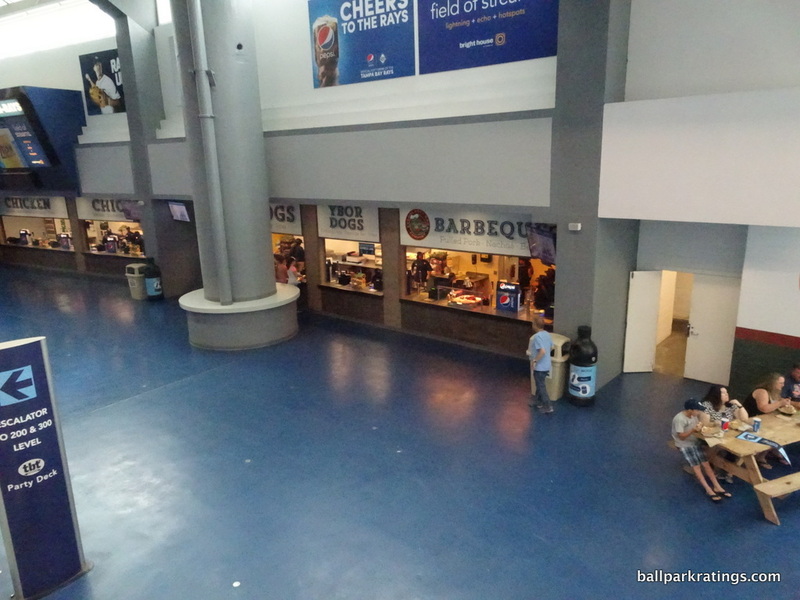 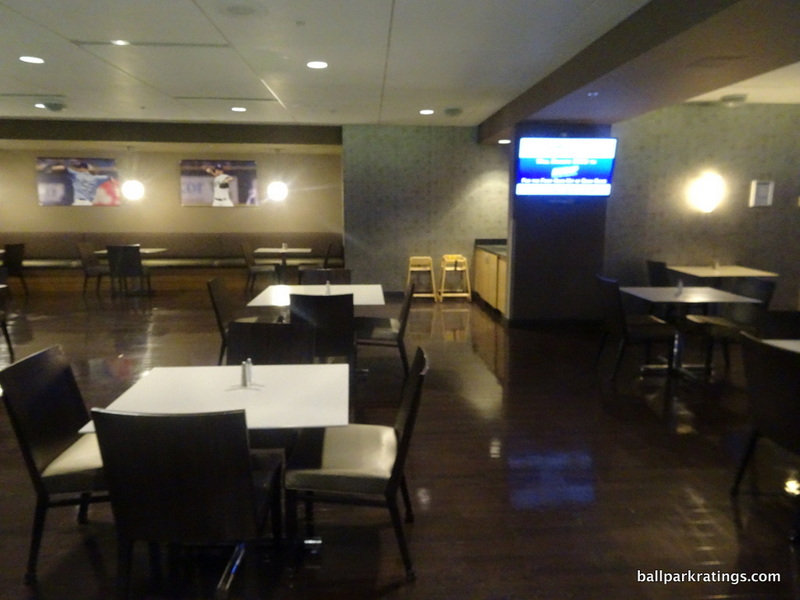 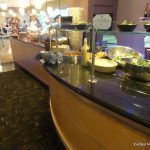 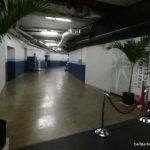 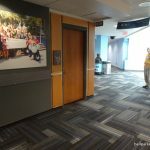 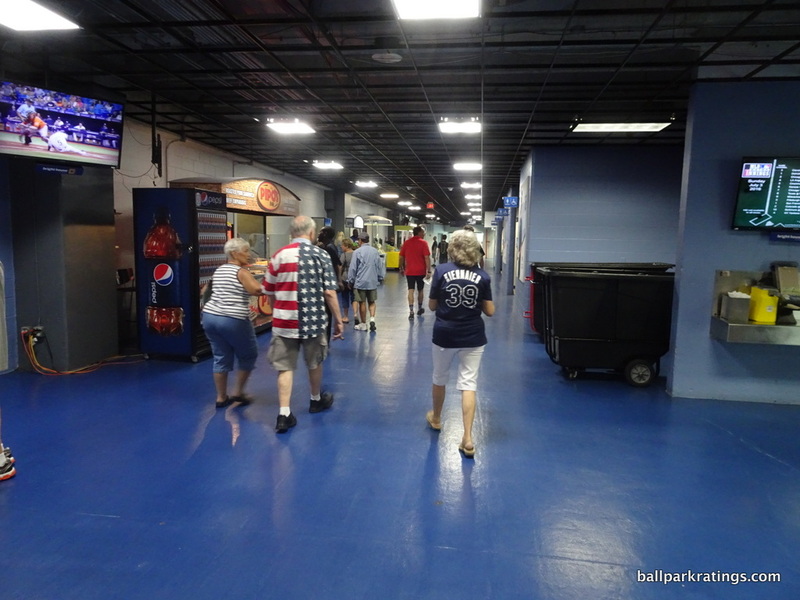 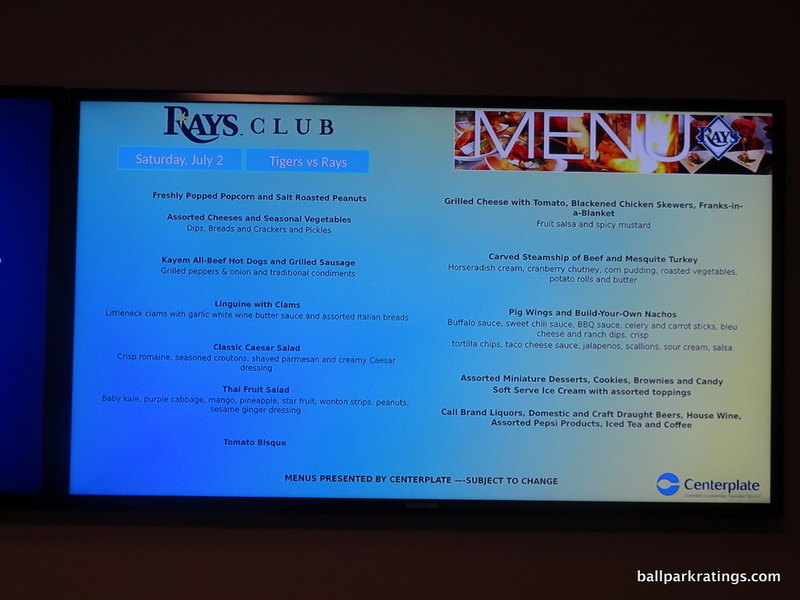 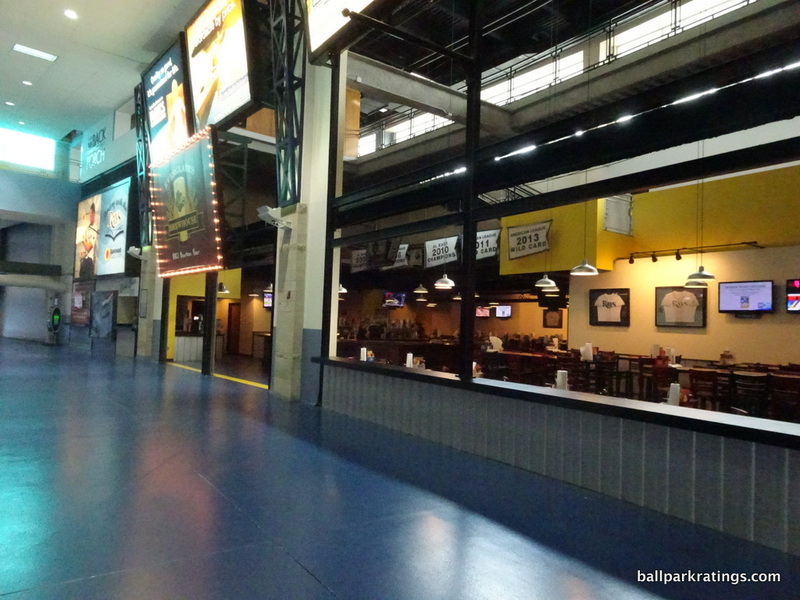 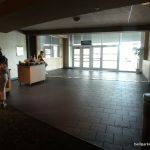 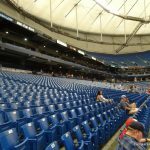 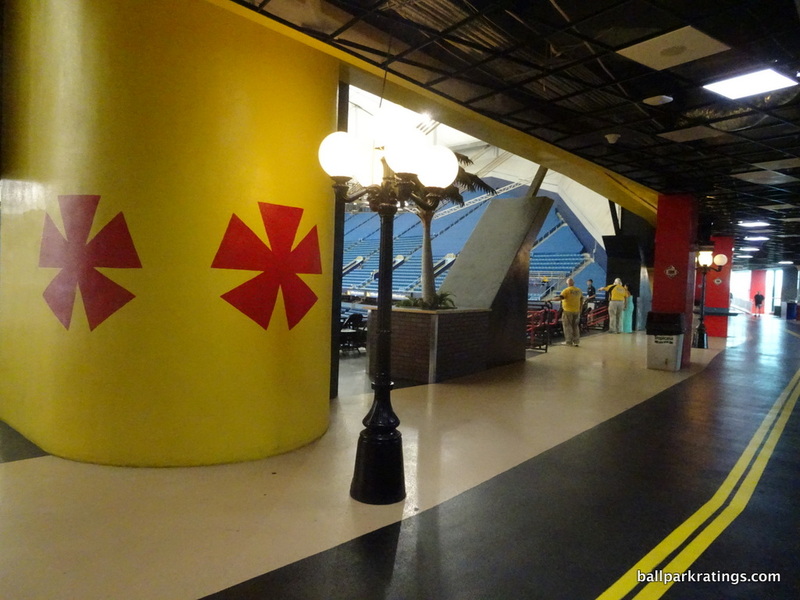 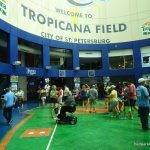 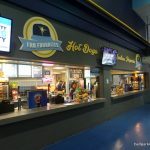 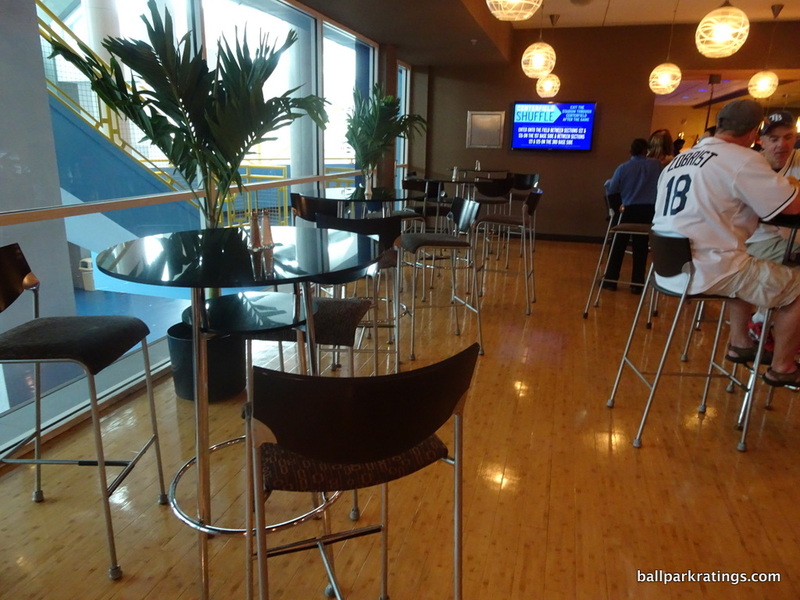 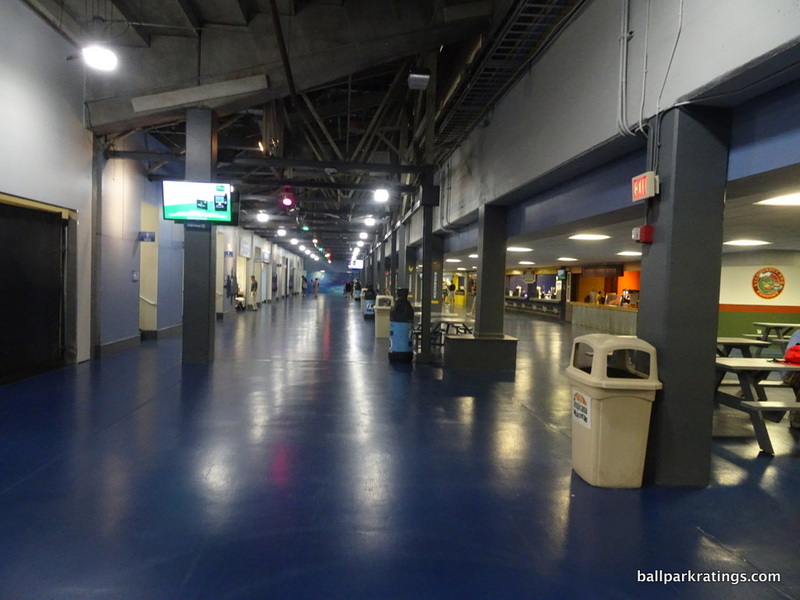 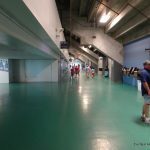 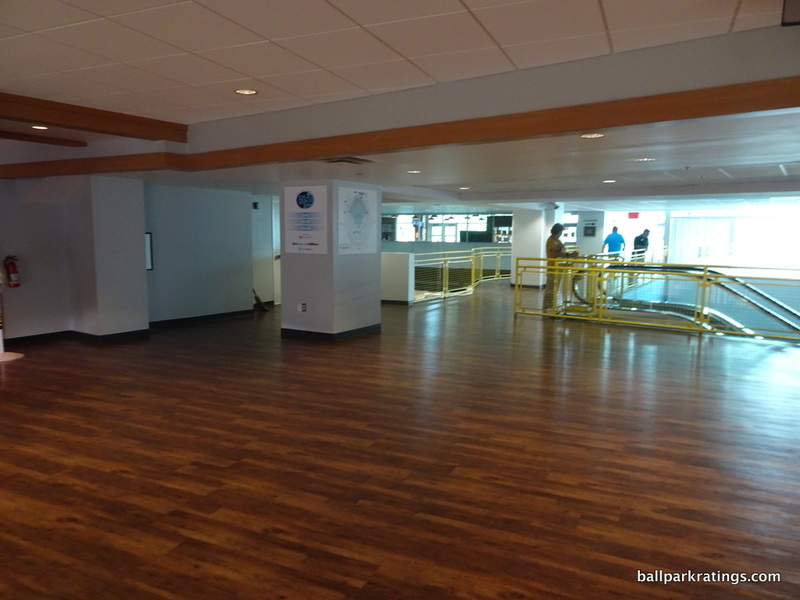 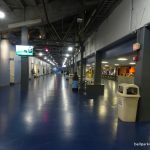 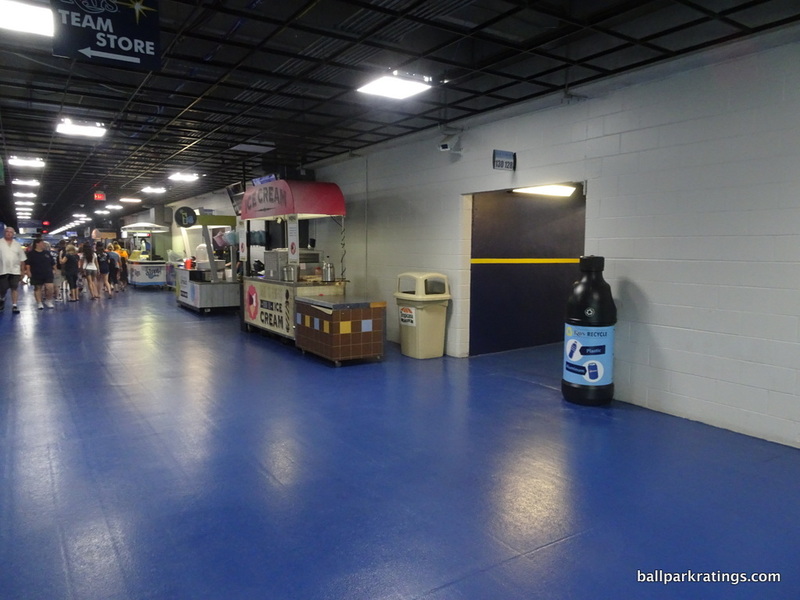 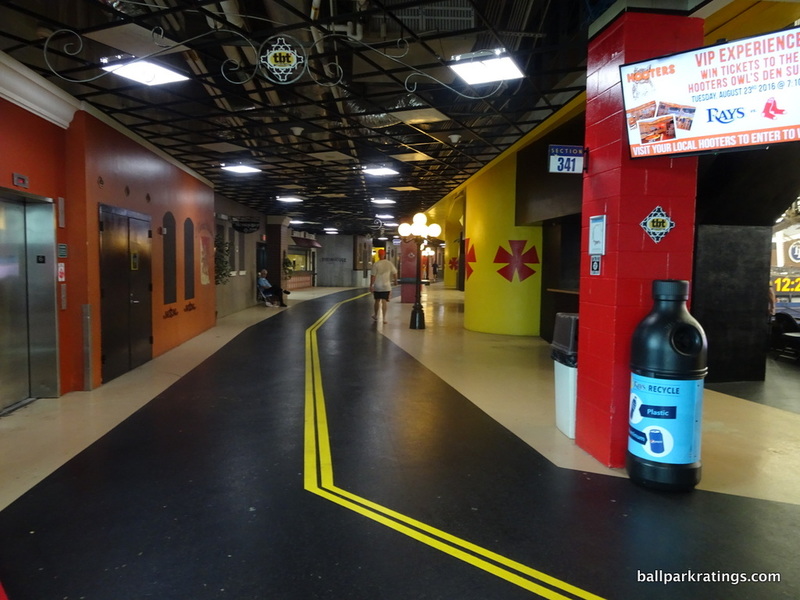 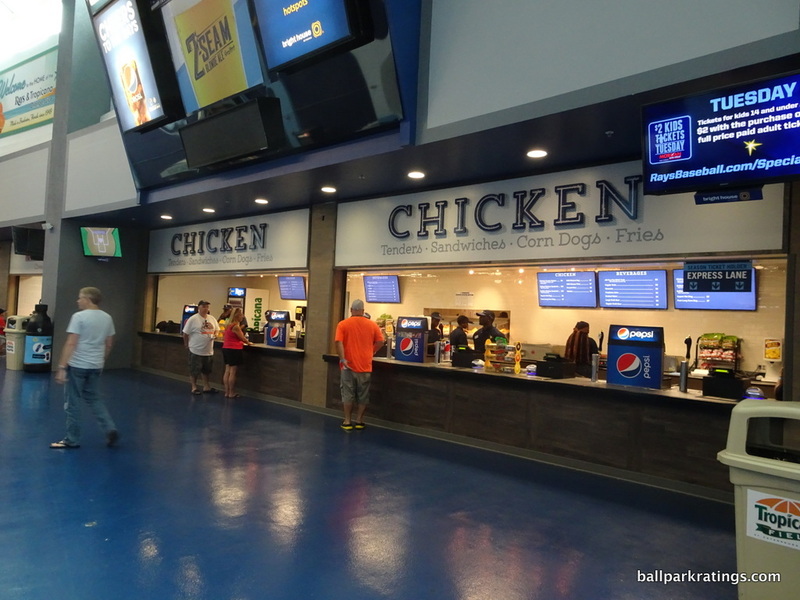 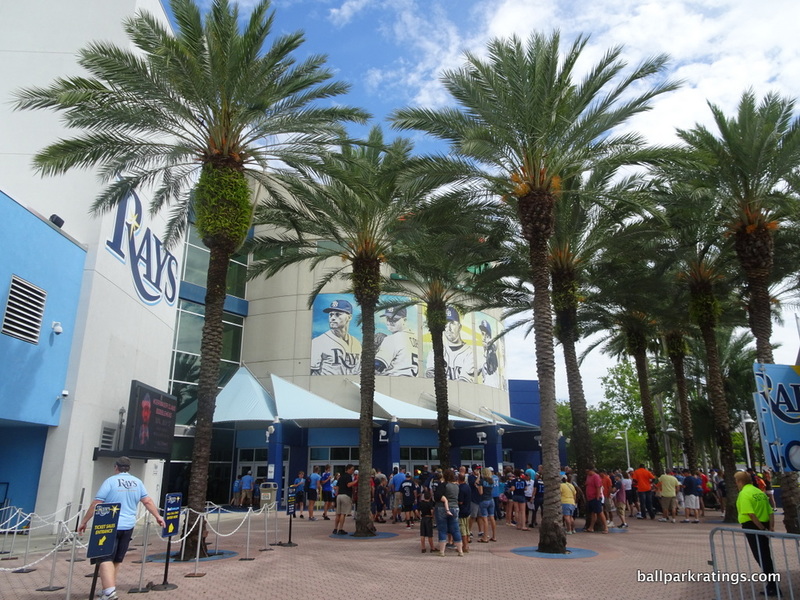 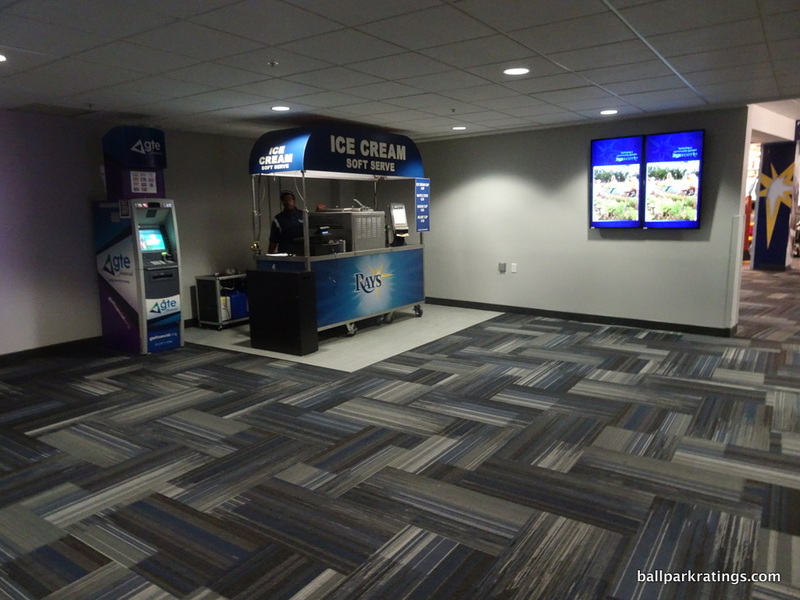 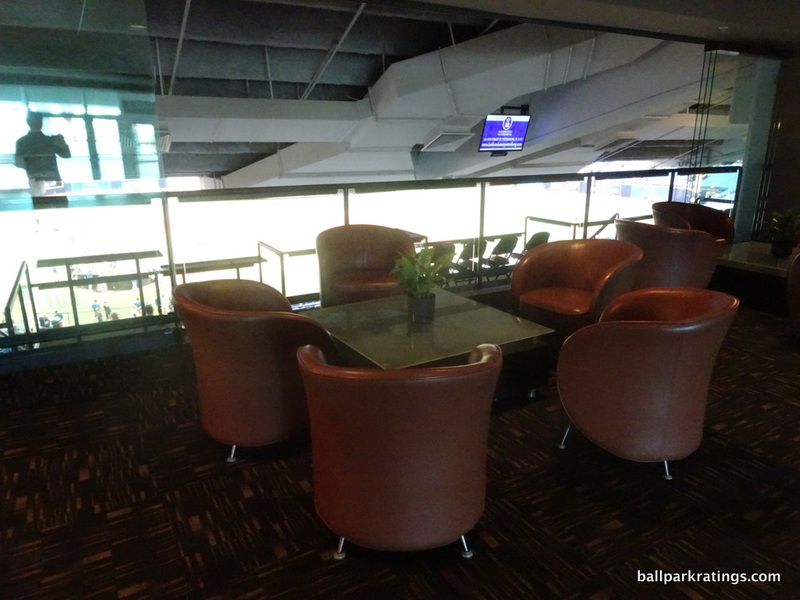 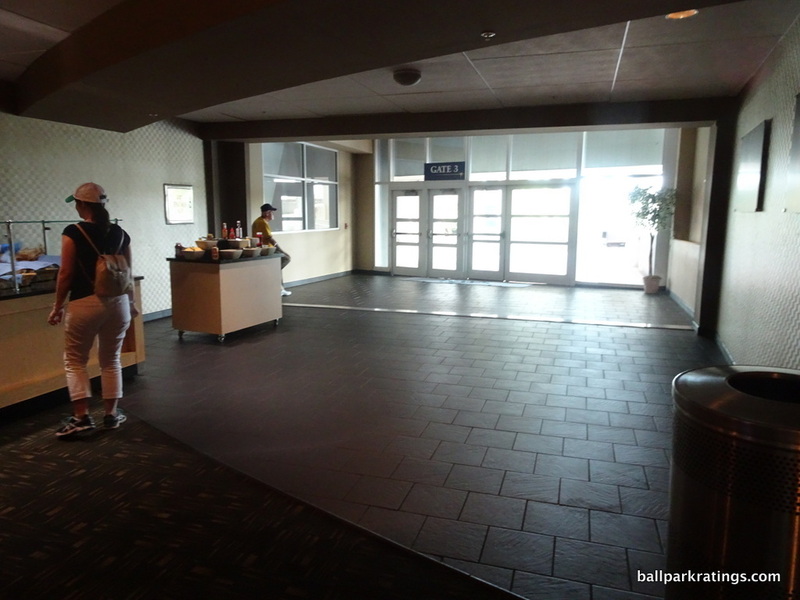 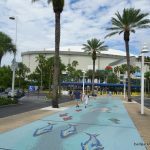 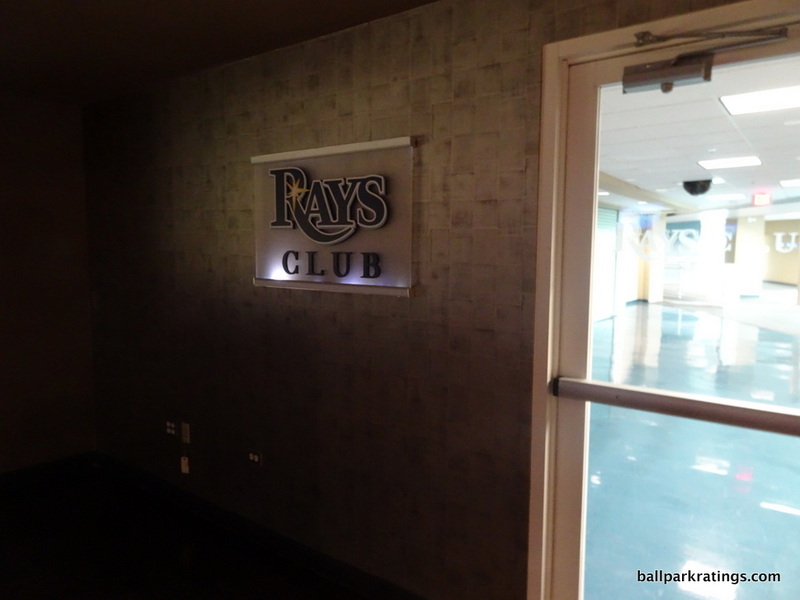 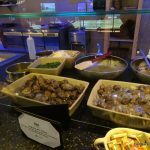 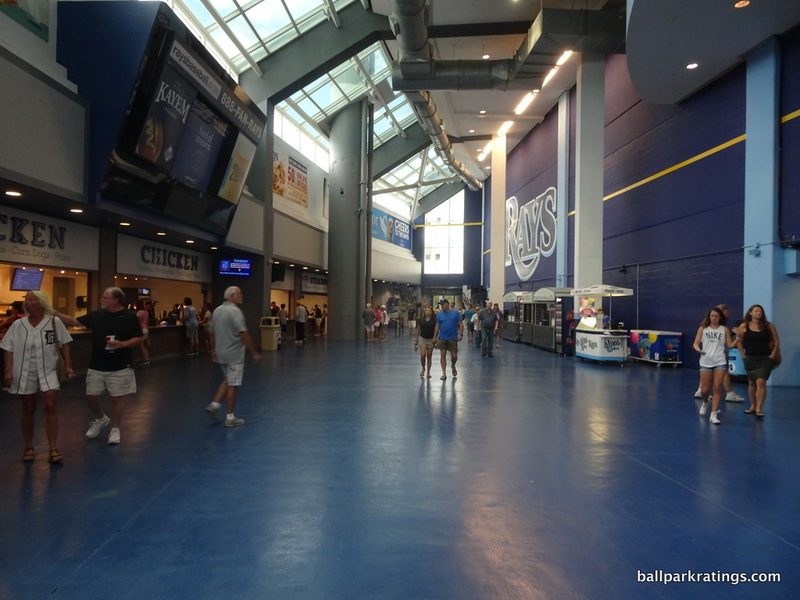 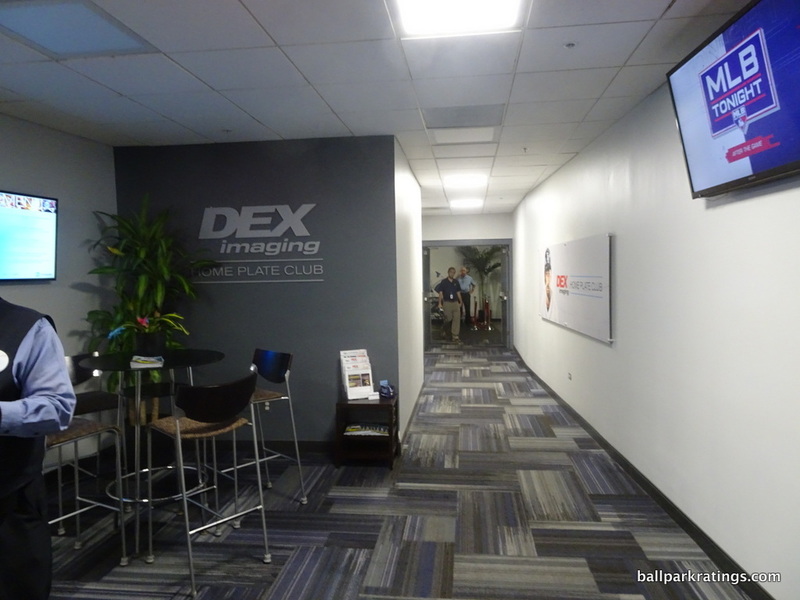 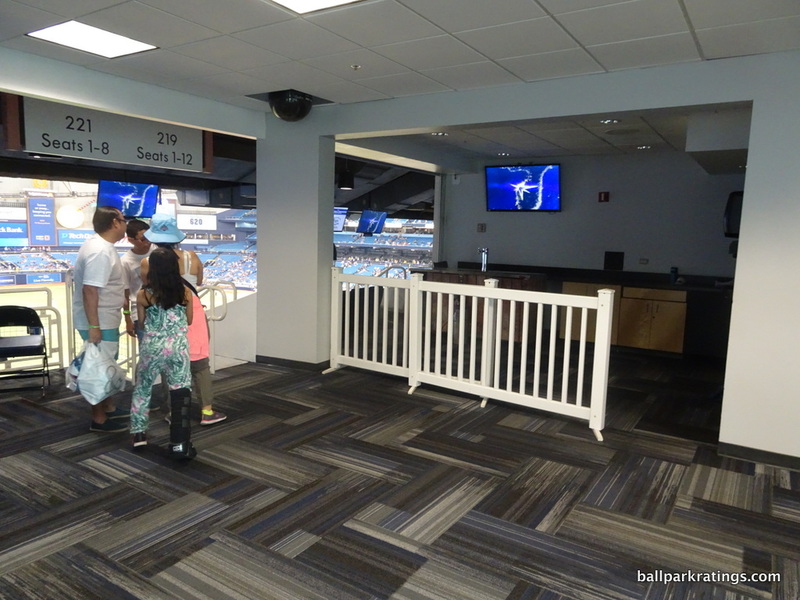 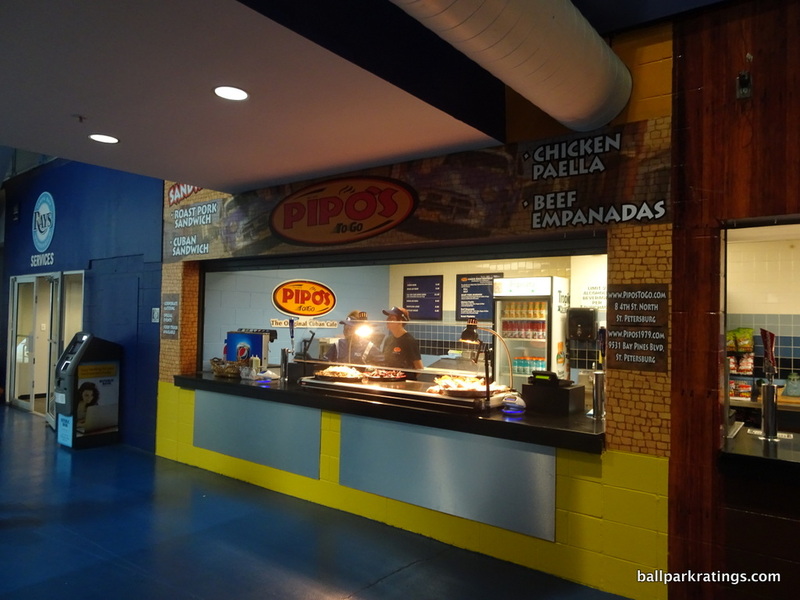 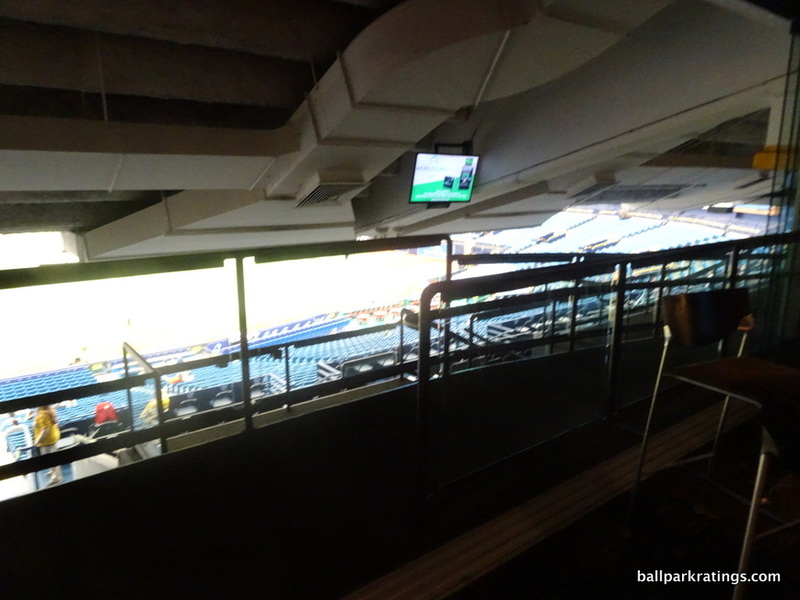 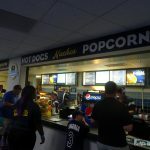 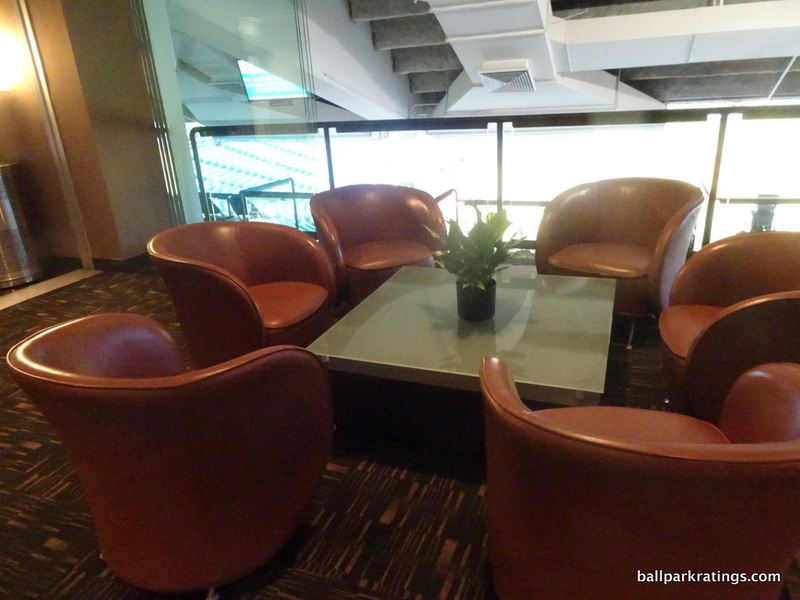 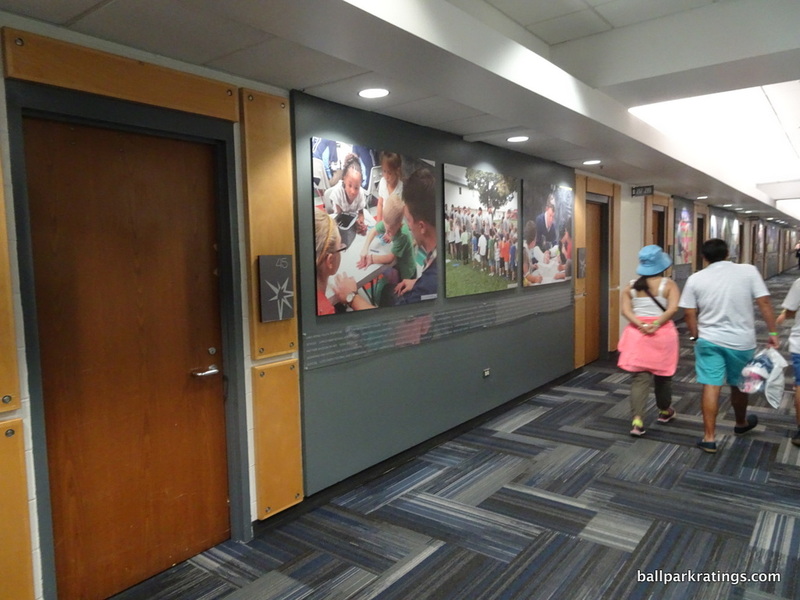 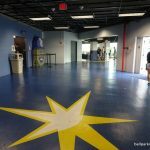 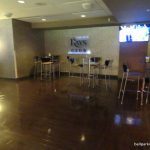 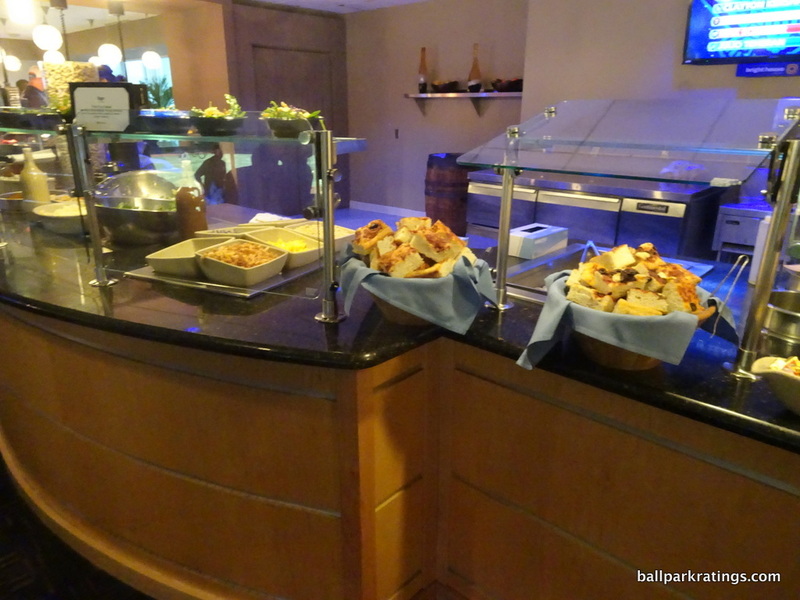 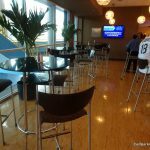 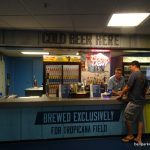 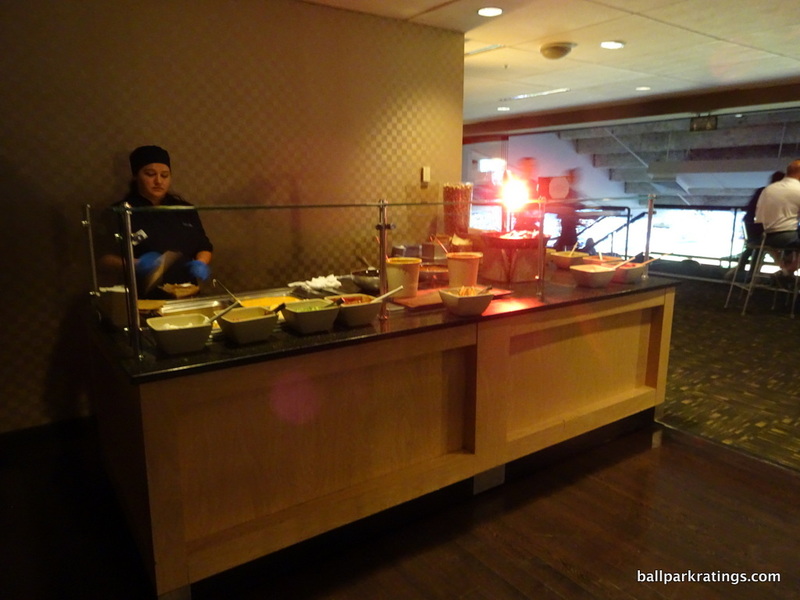 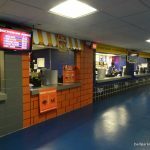 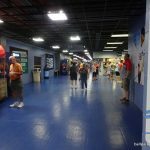 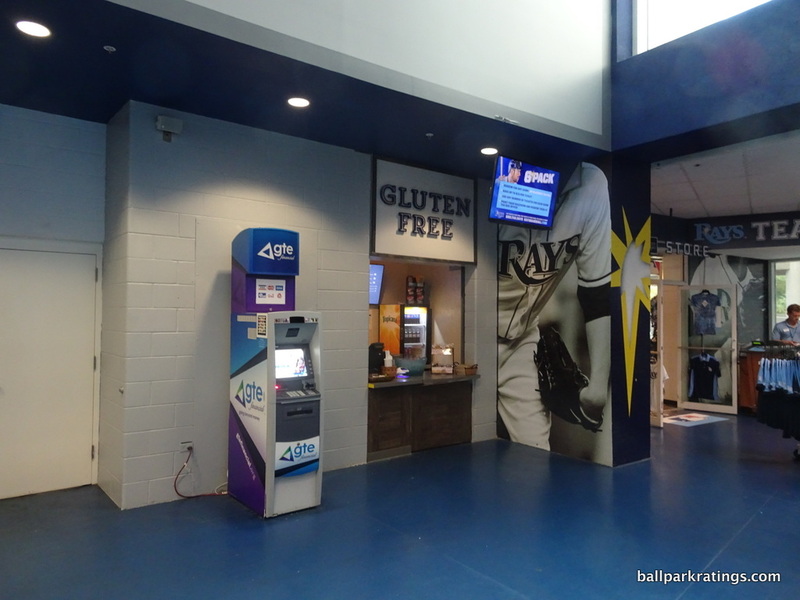 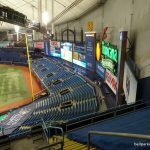 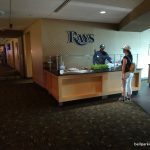 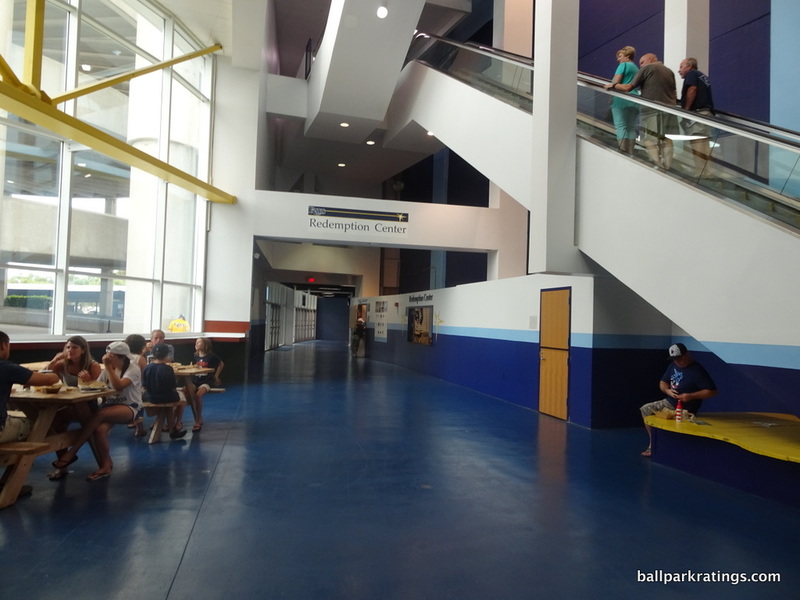 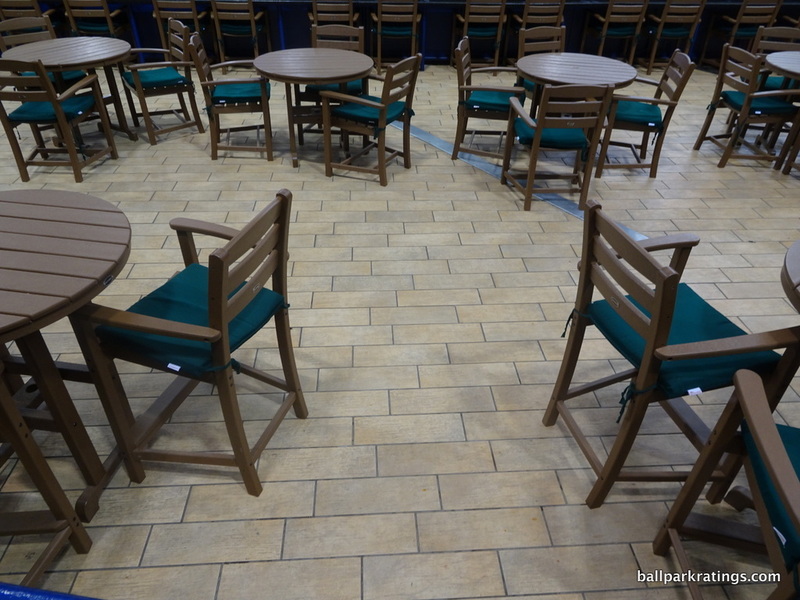 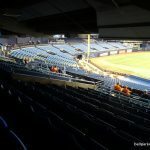 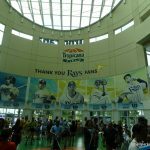 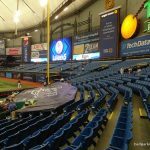 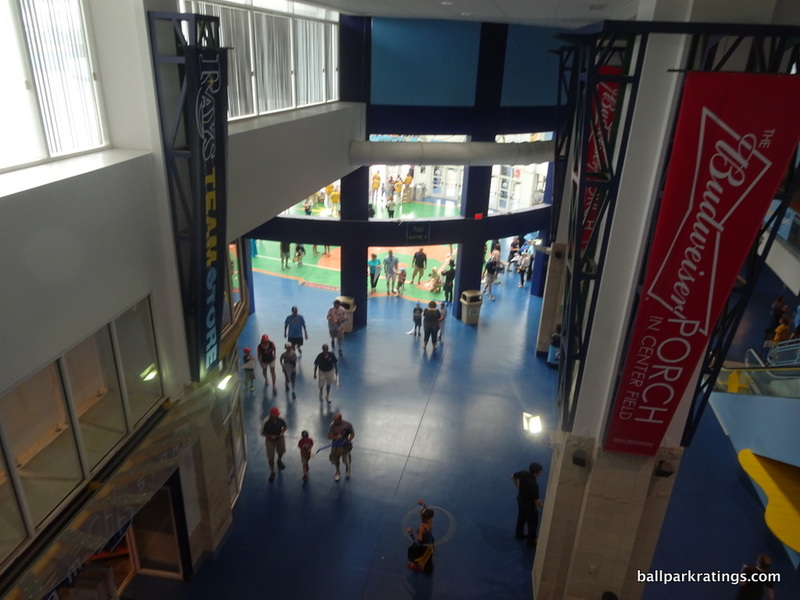 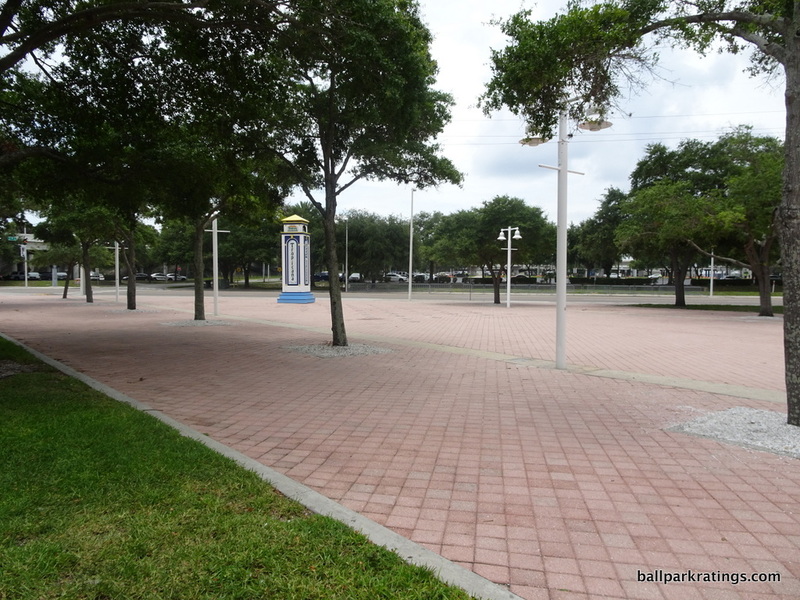 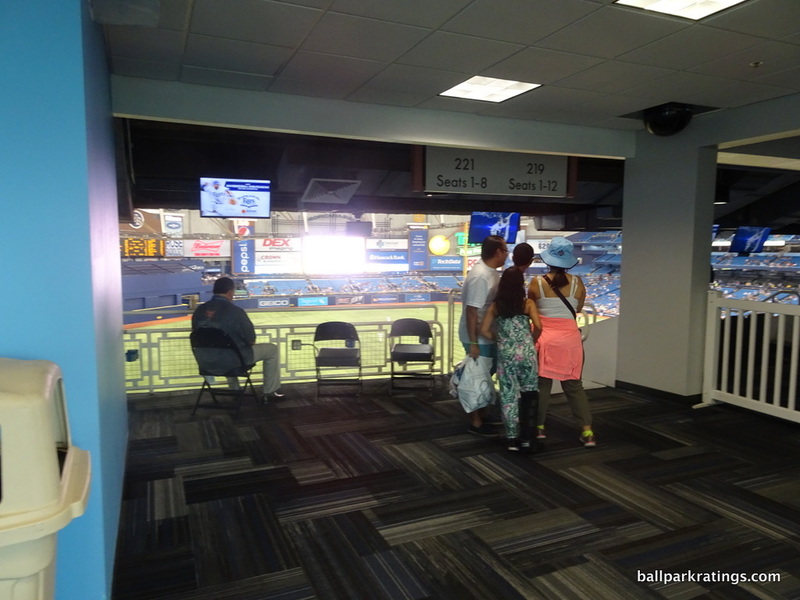 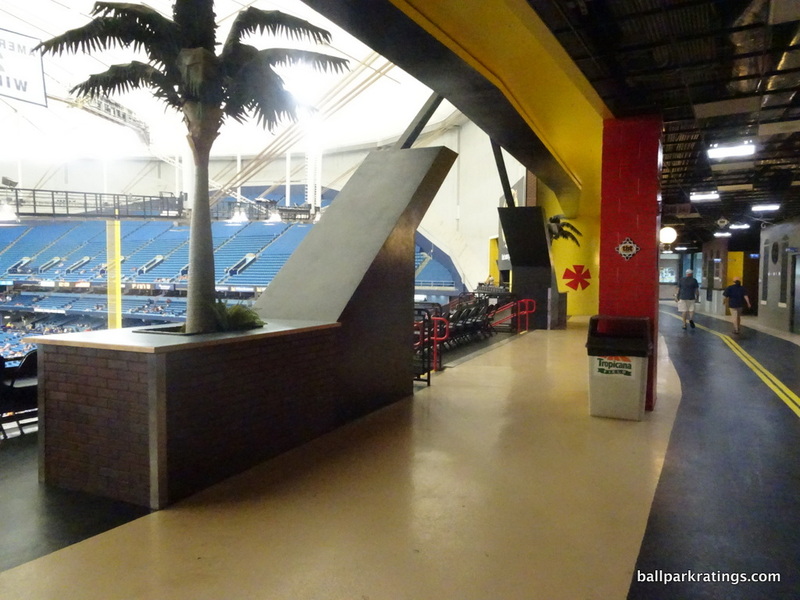 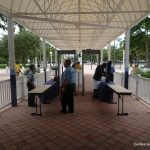 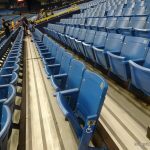 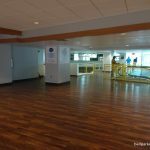 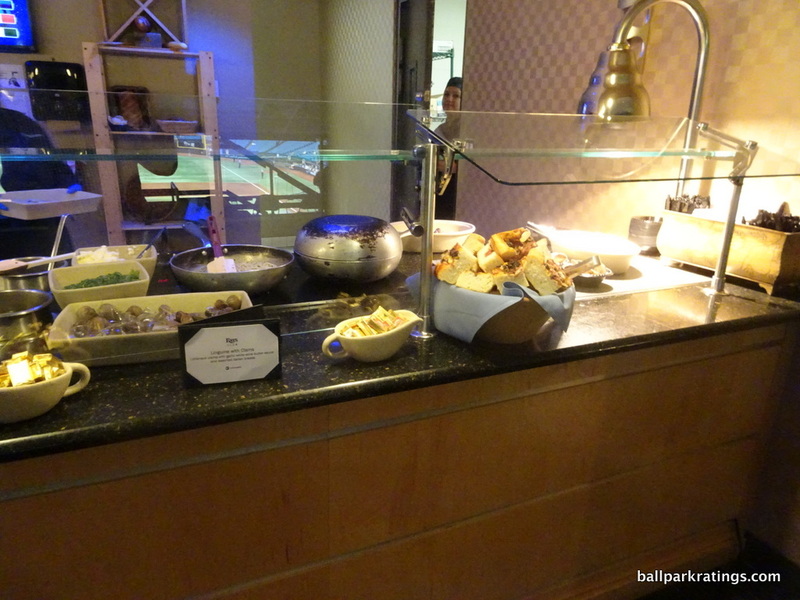 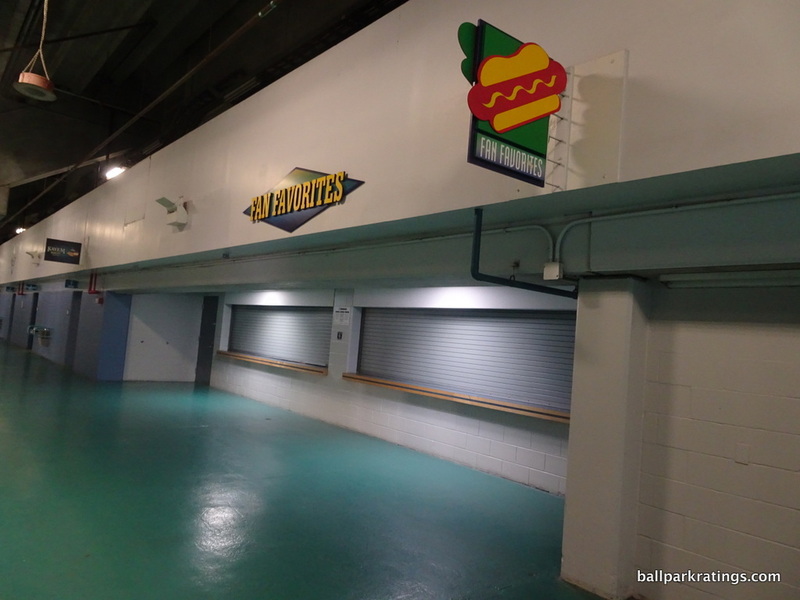 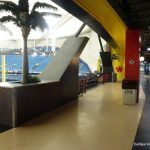 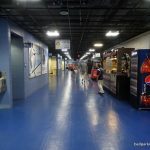 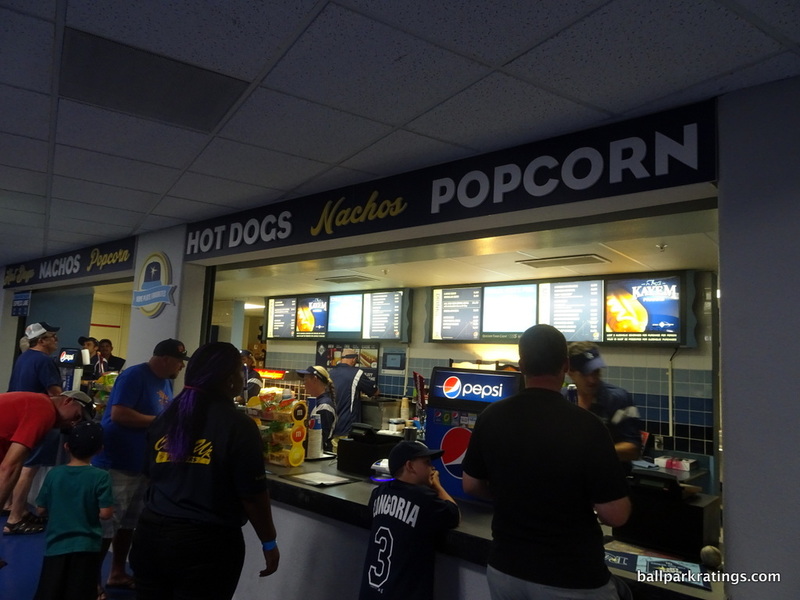 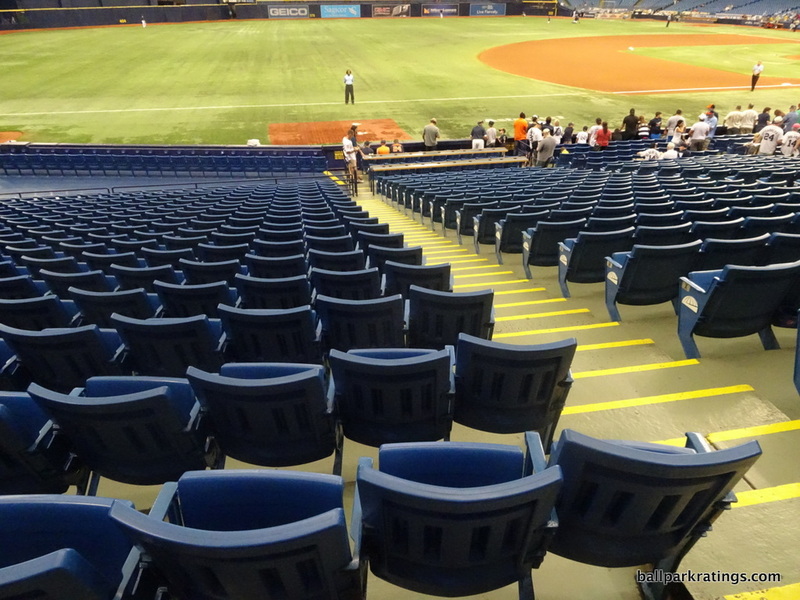 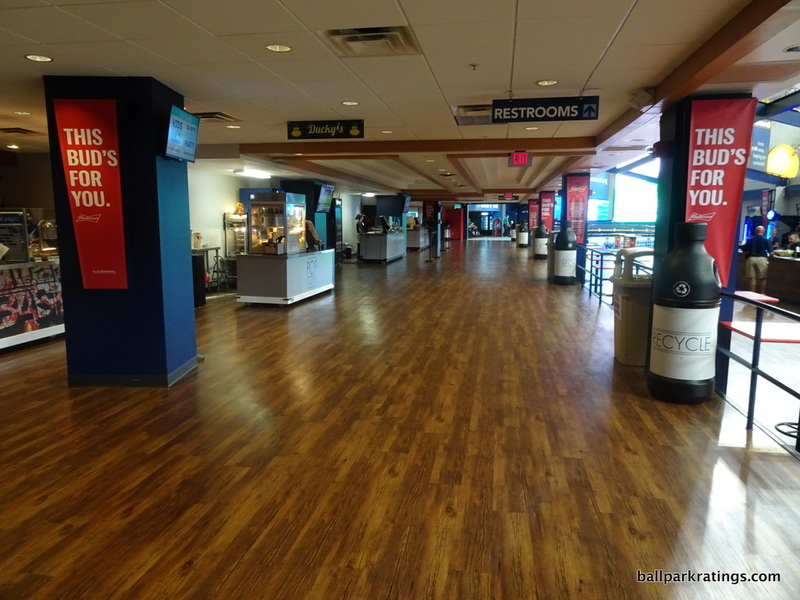 Tropicana Field is often mentioned in the same breath as Rogers Centre and the Oakland Coliseum, as it should be, but the amenities are far superior at Tropicana, more resembling the retro parks of the last 25 years. 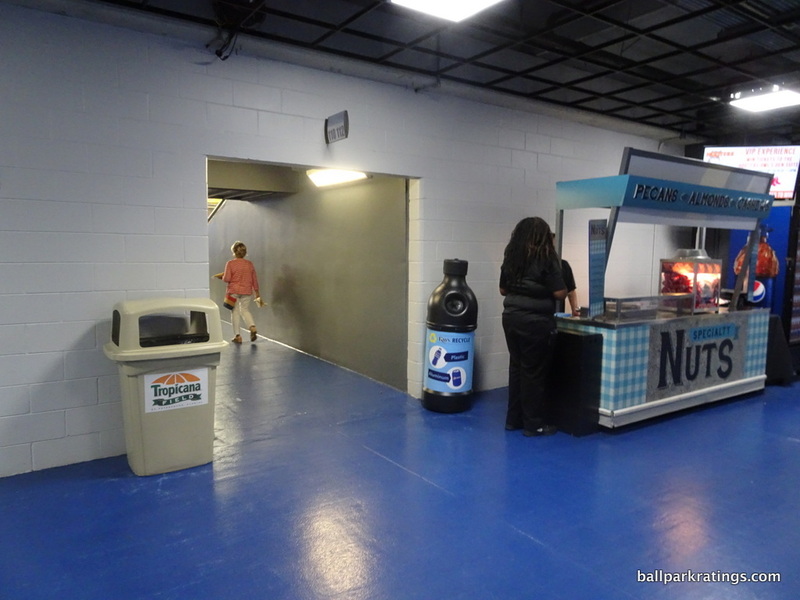 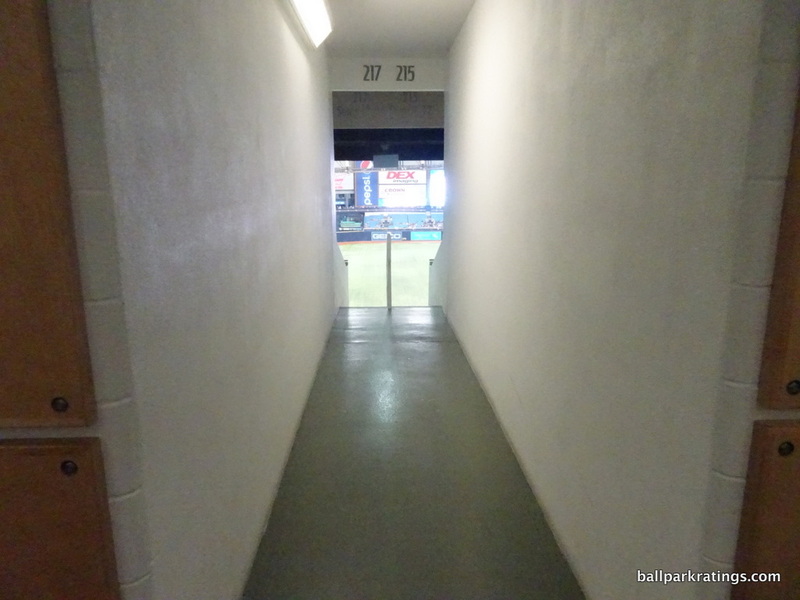 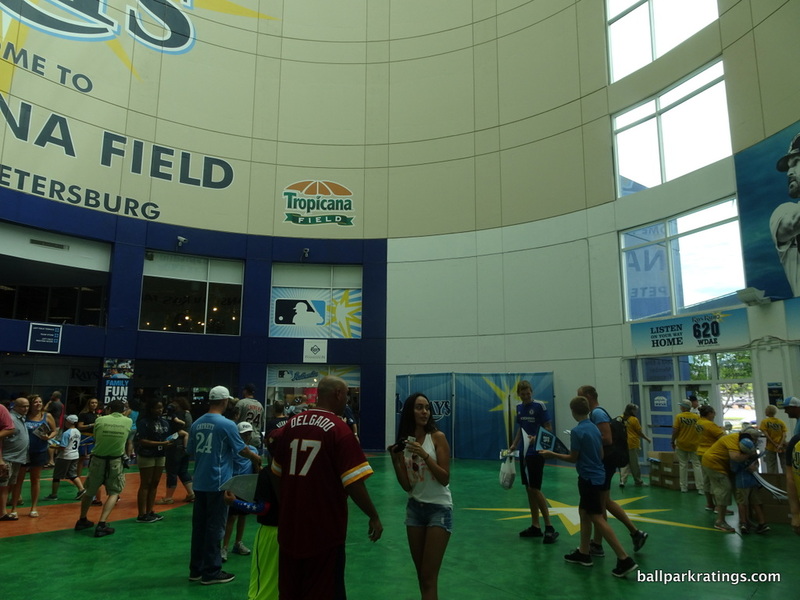 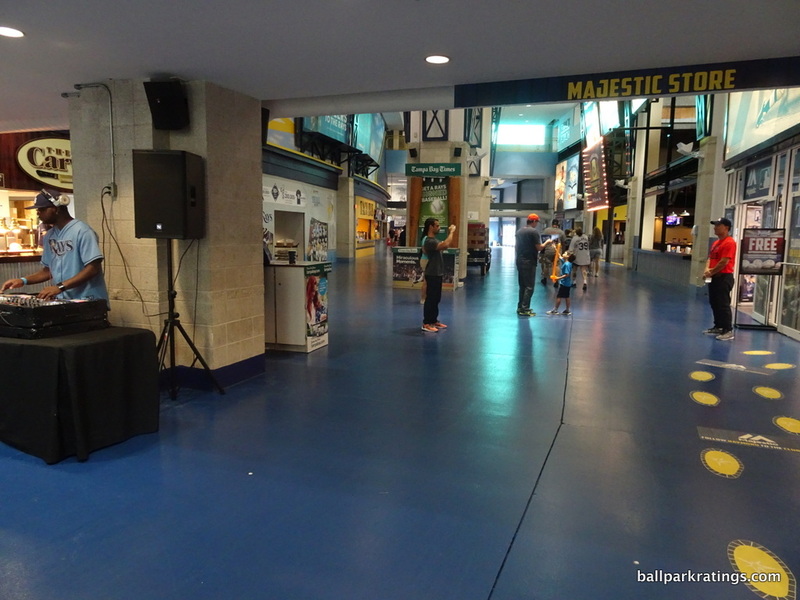 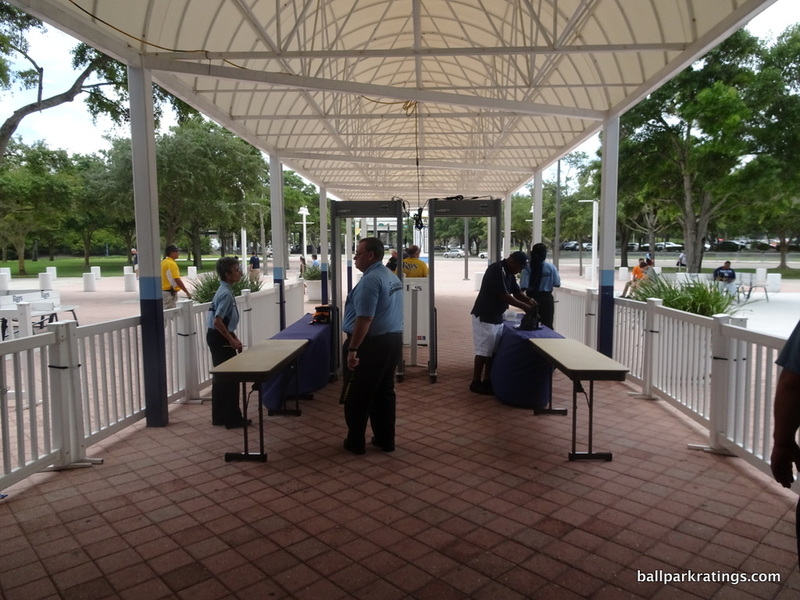 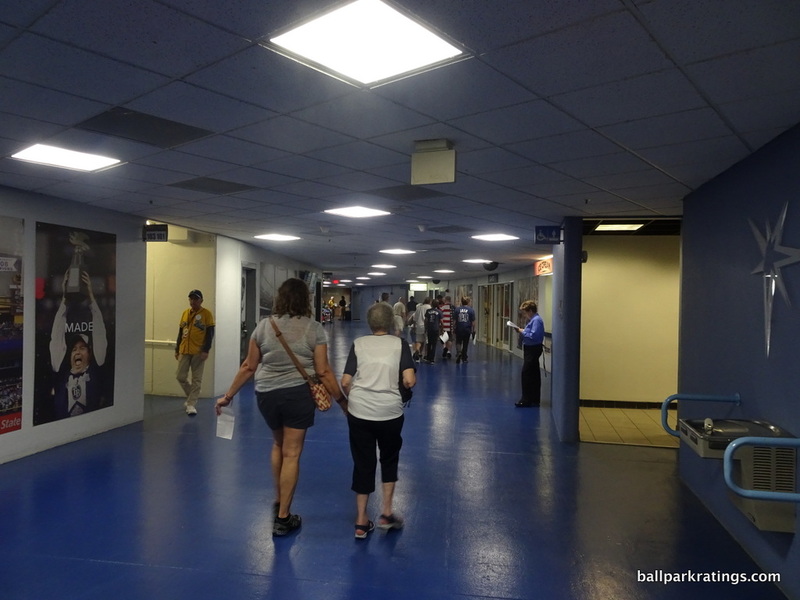 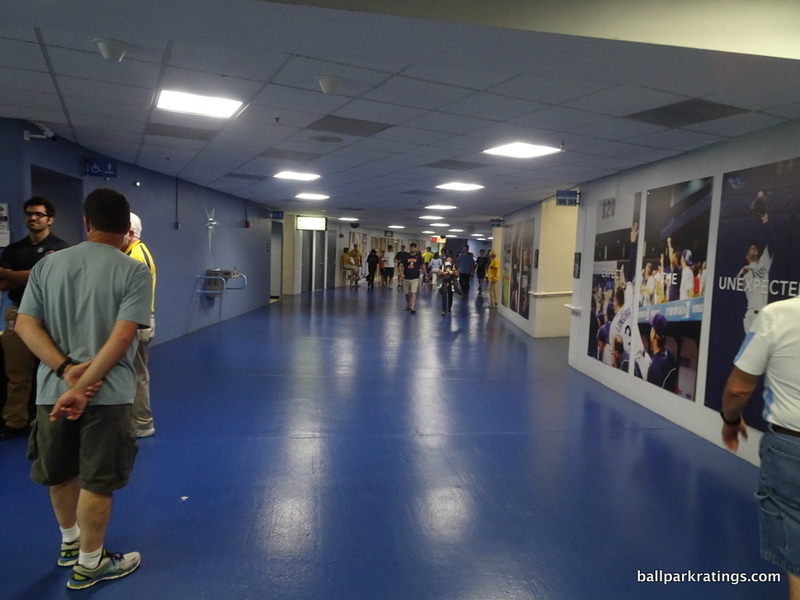 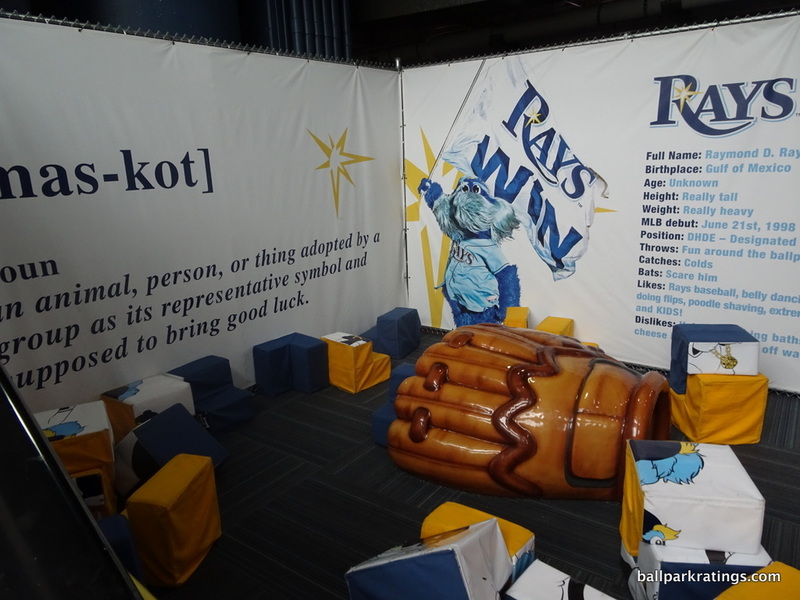 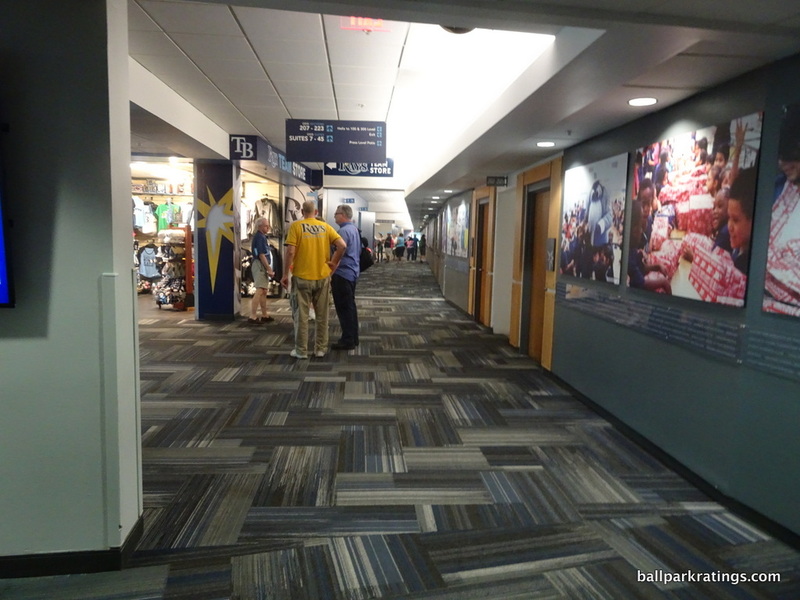 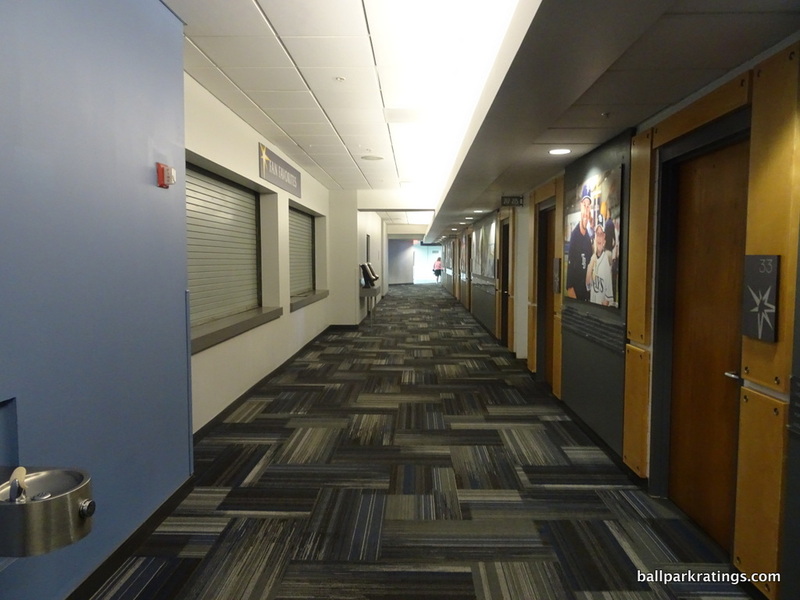 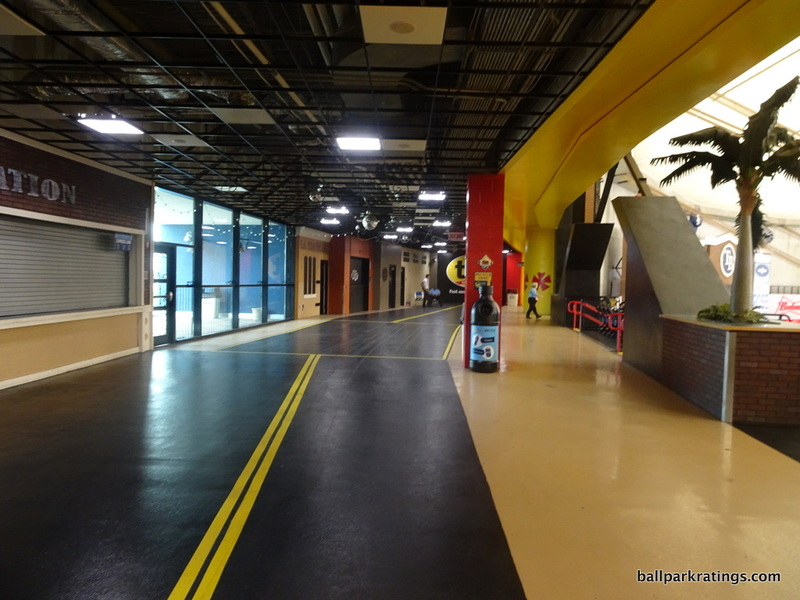 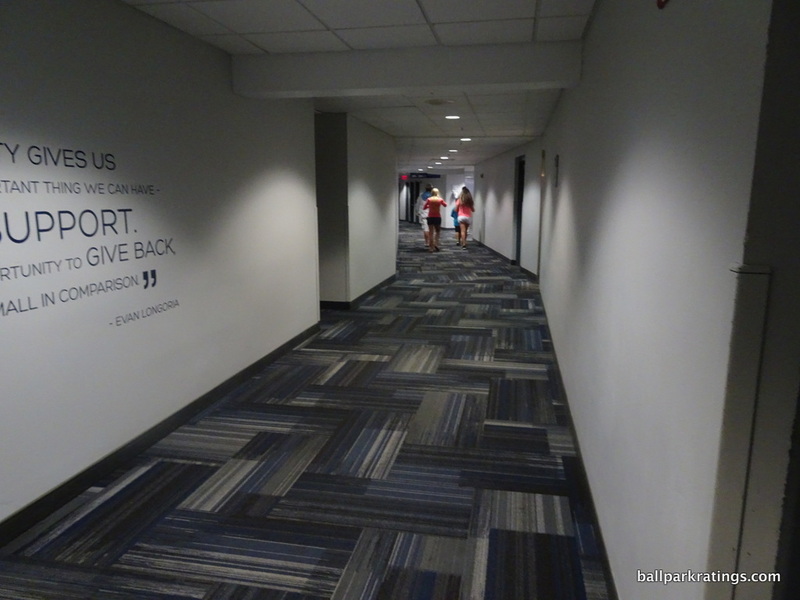 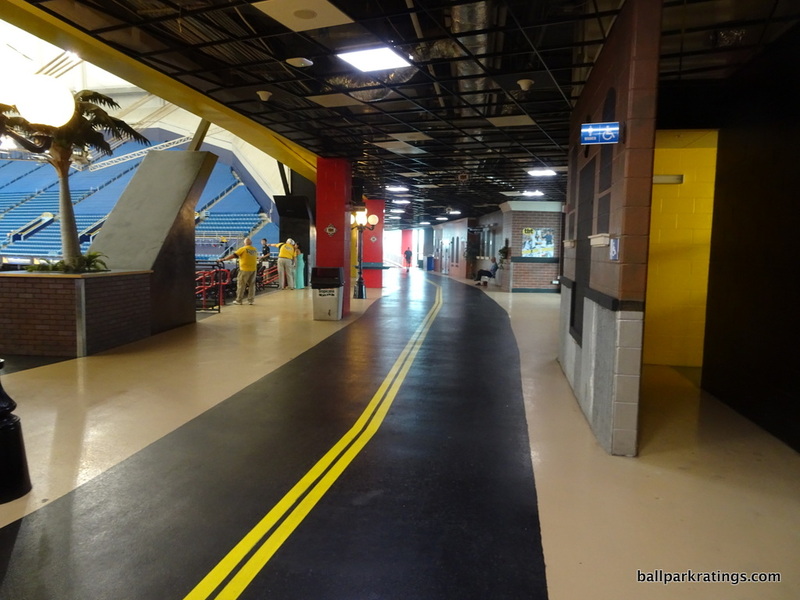 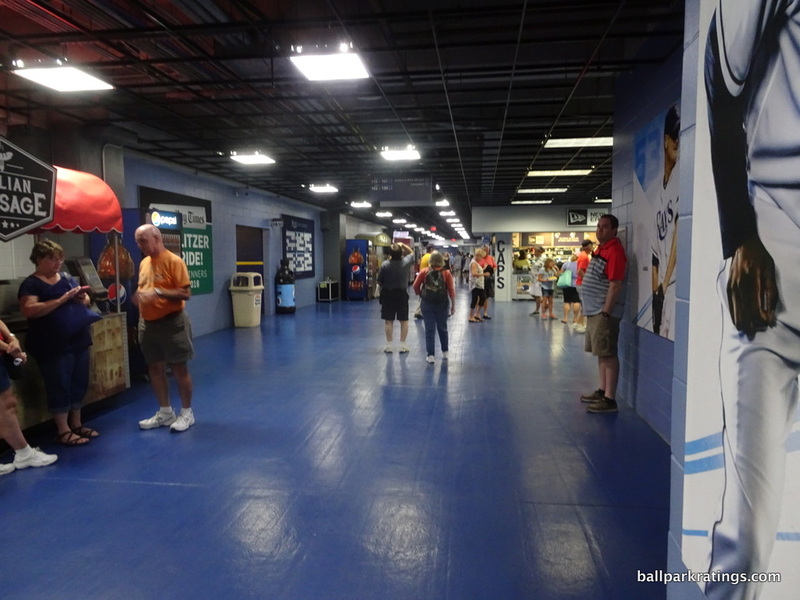 Enter the rotunda on the ground level in the right field corner and first take a scroll around the park. 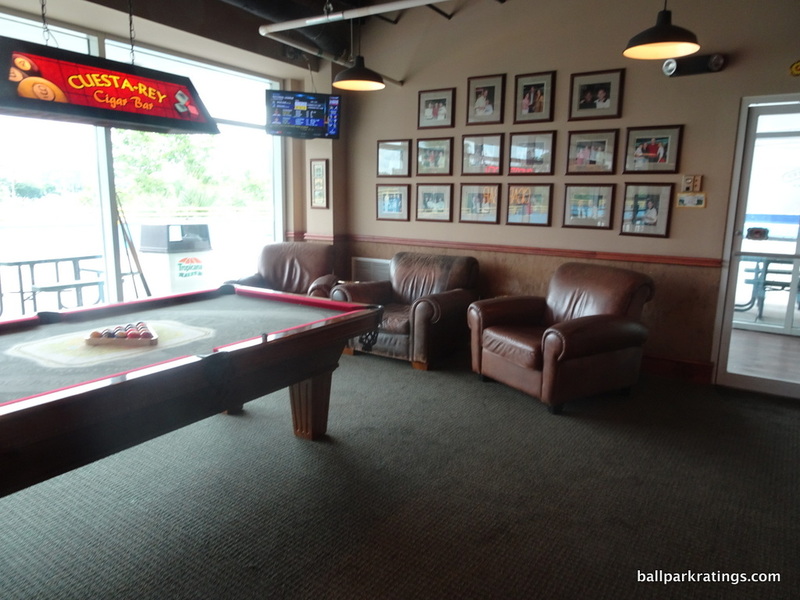 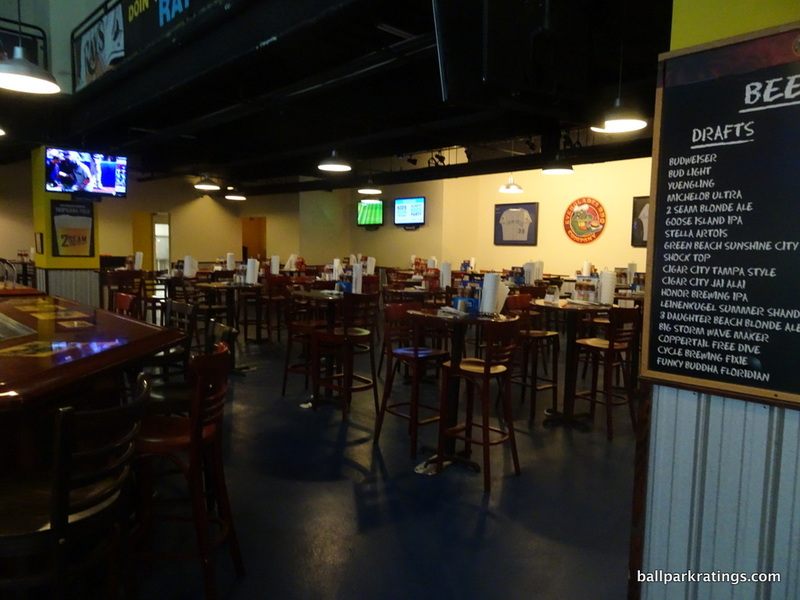 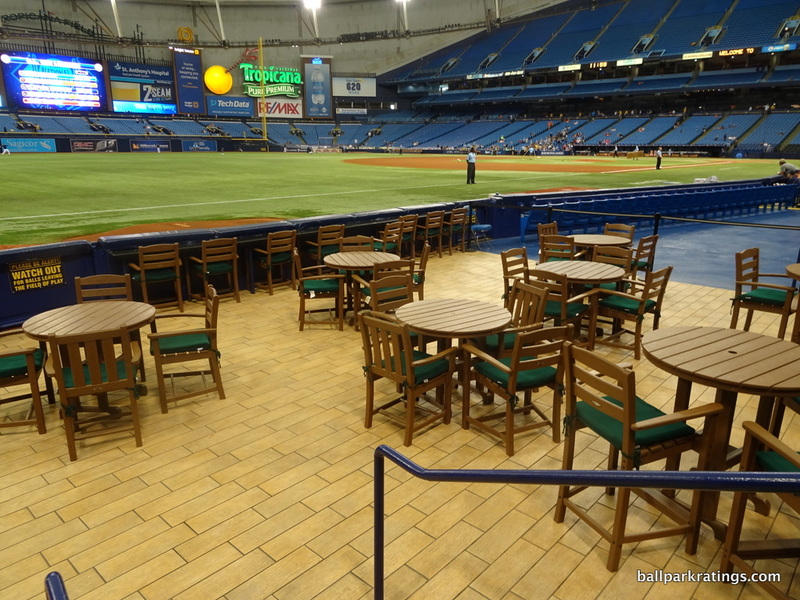 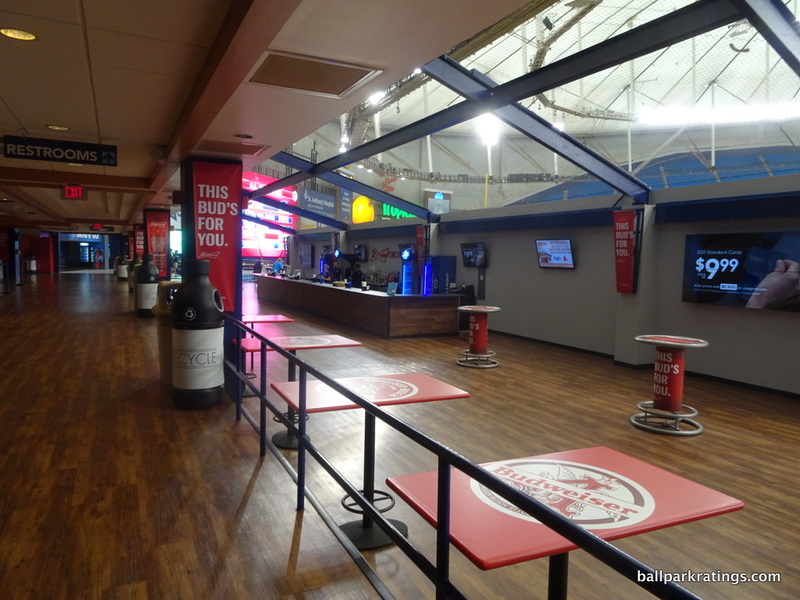 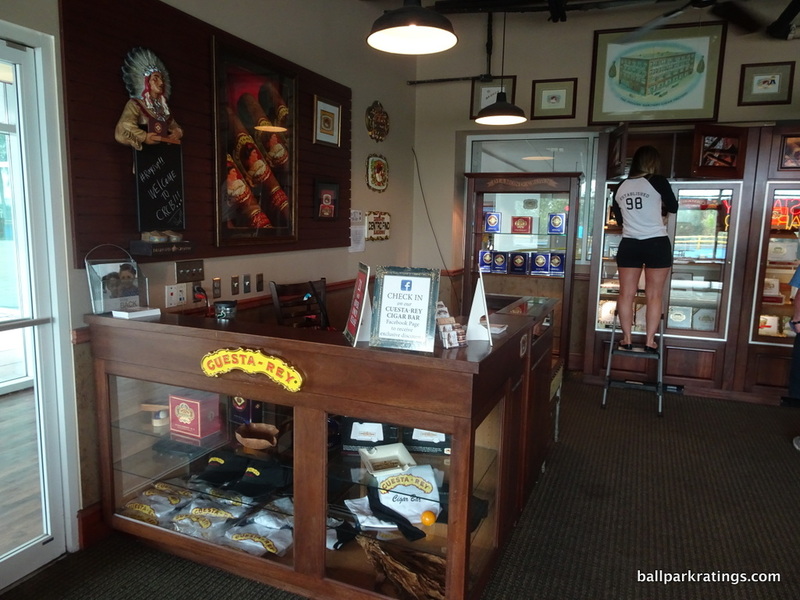 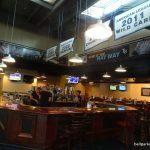 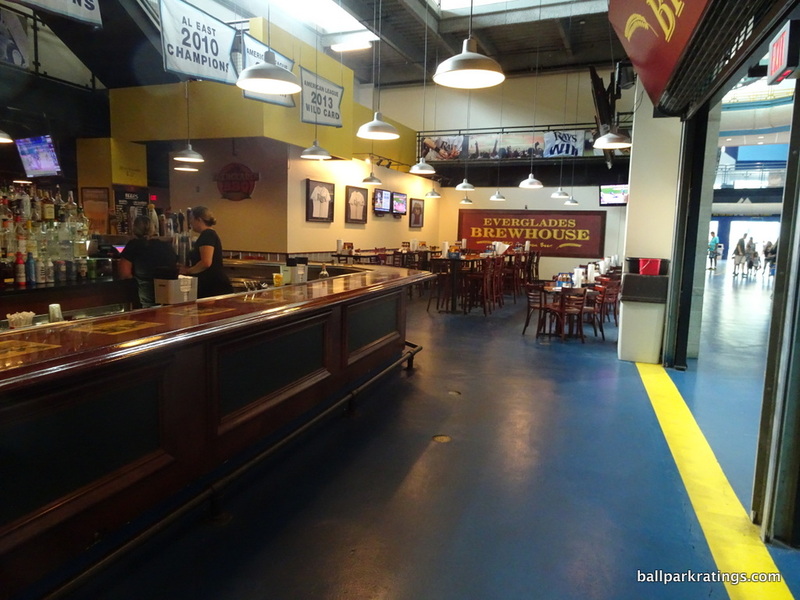 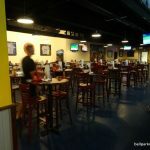 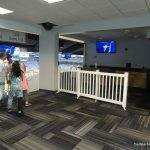 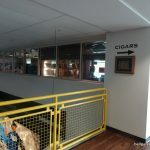 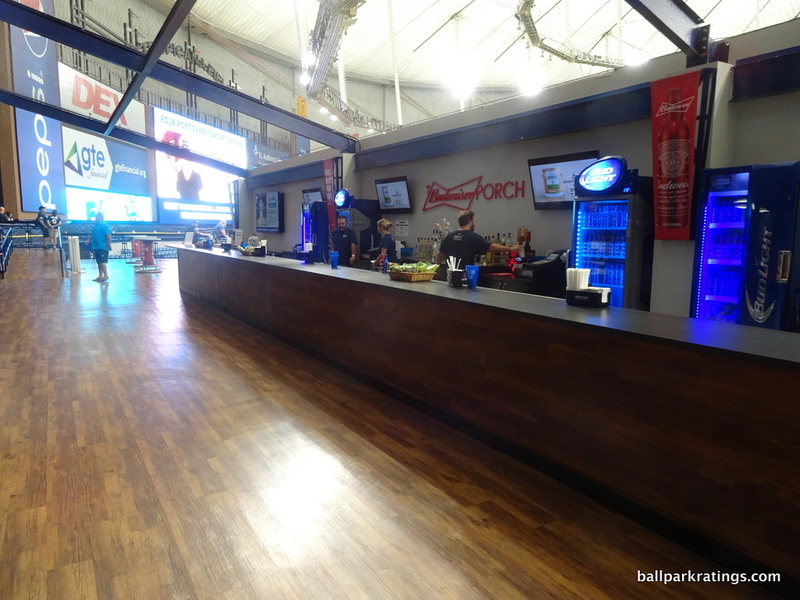 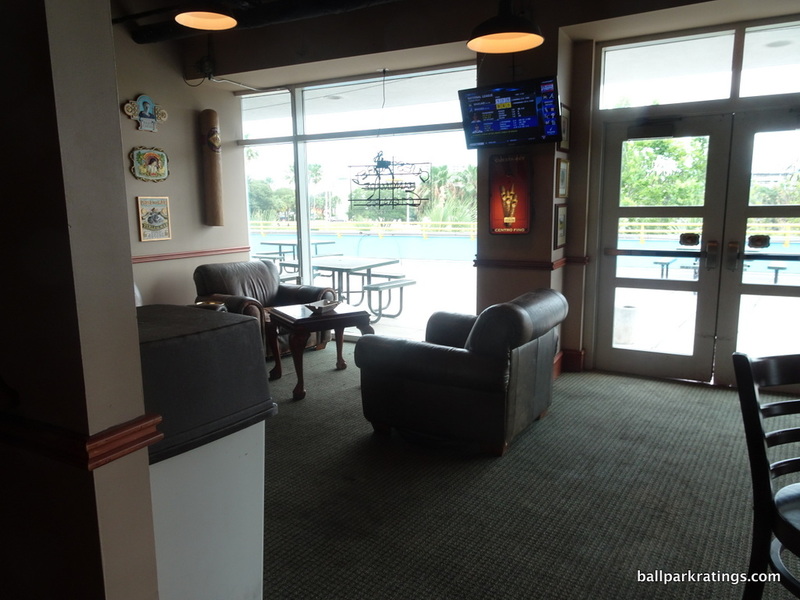 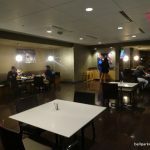 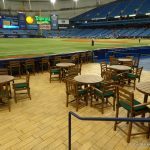 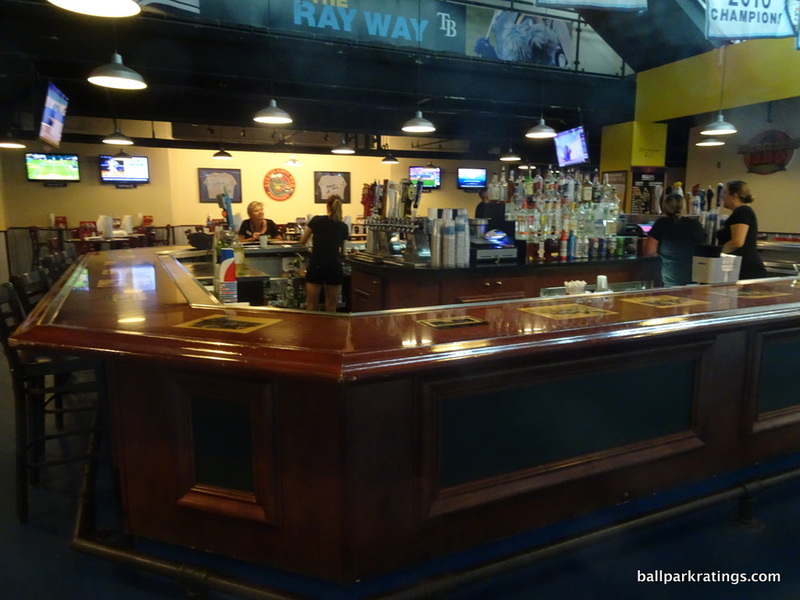 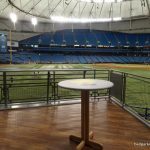 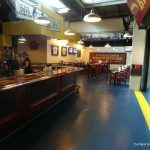 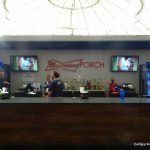 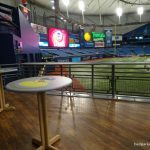 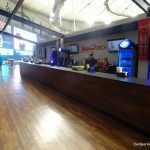 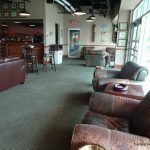 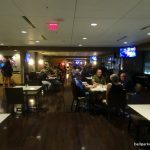 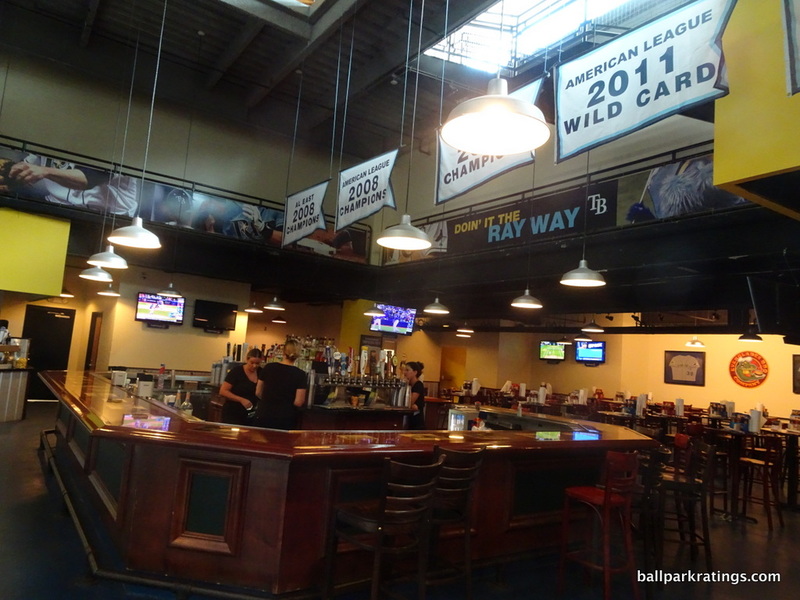 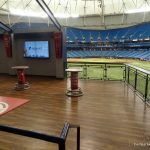 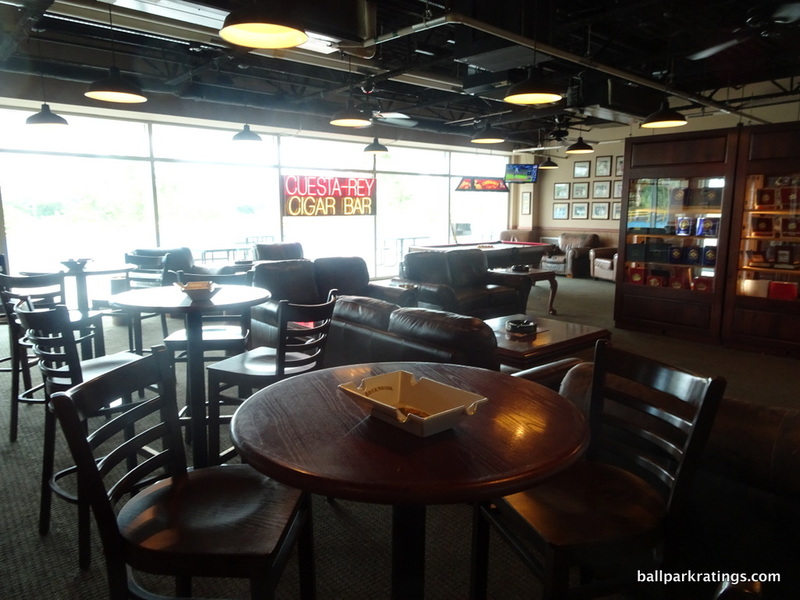 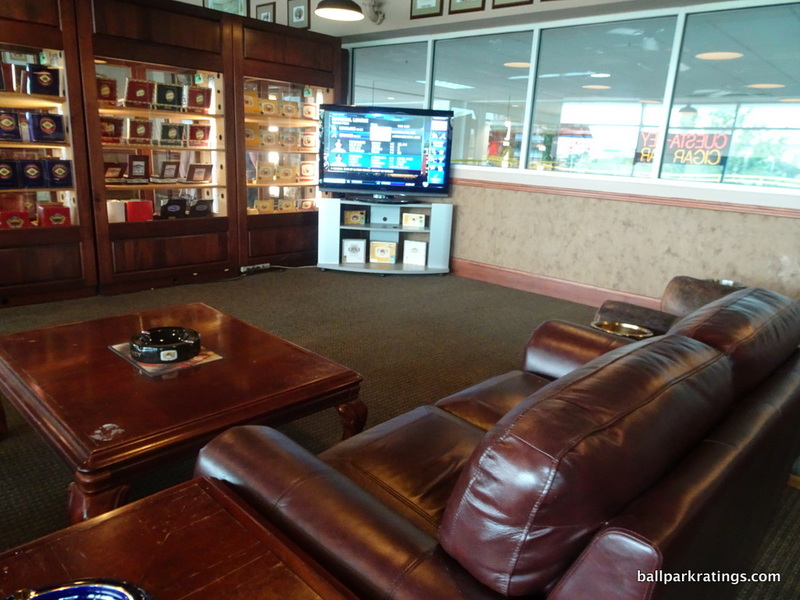 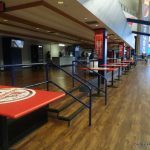 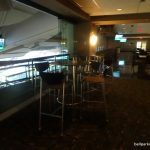 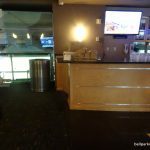 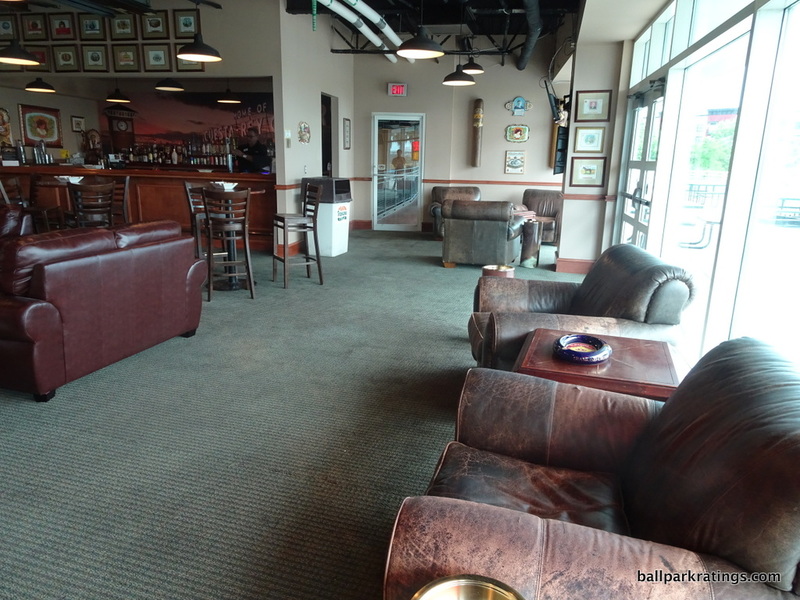 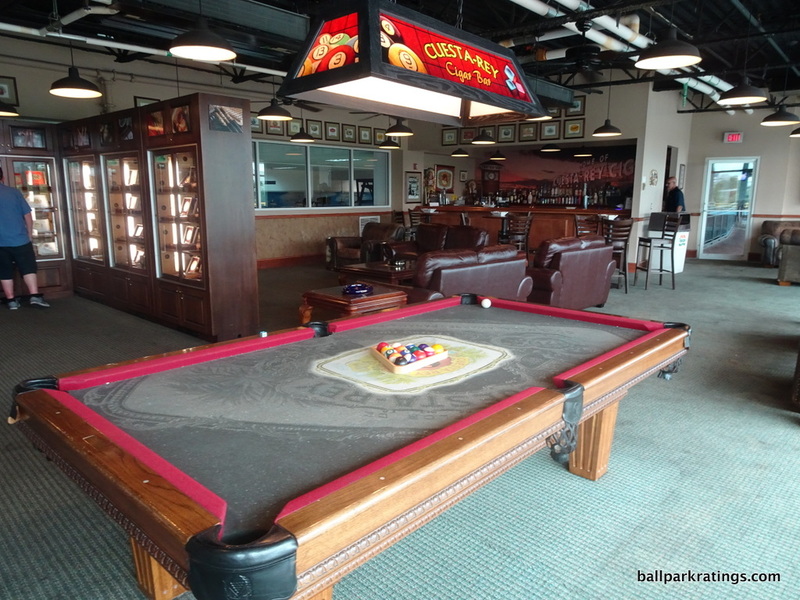 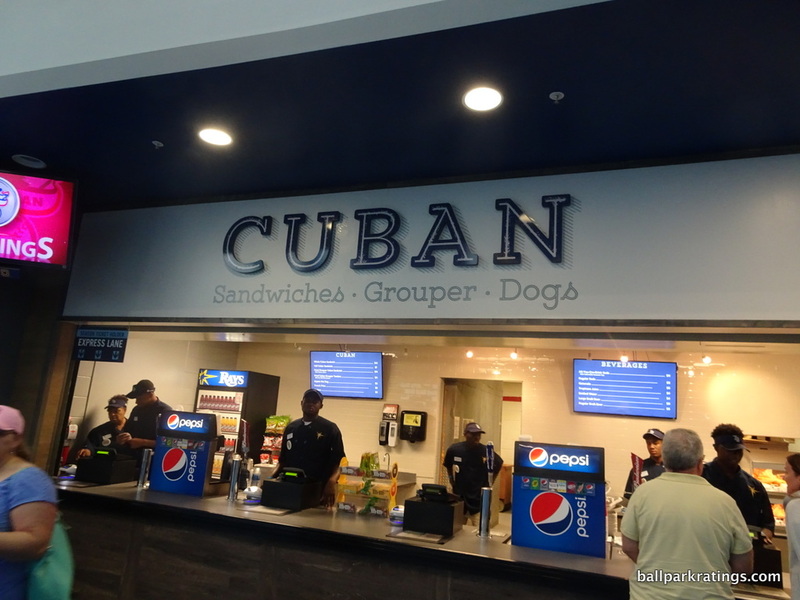 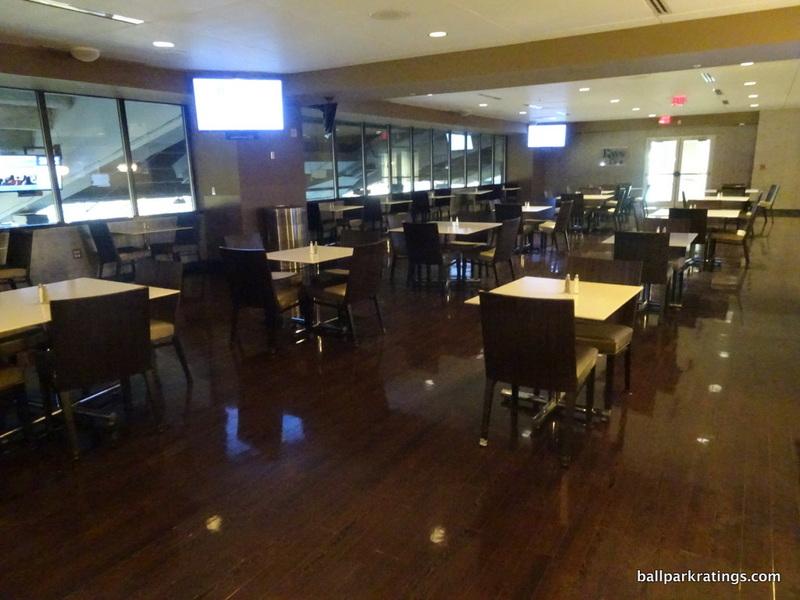 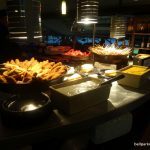 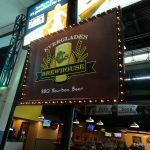 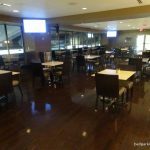 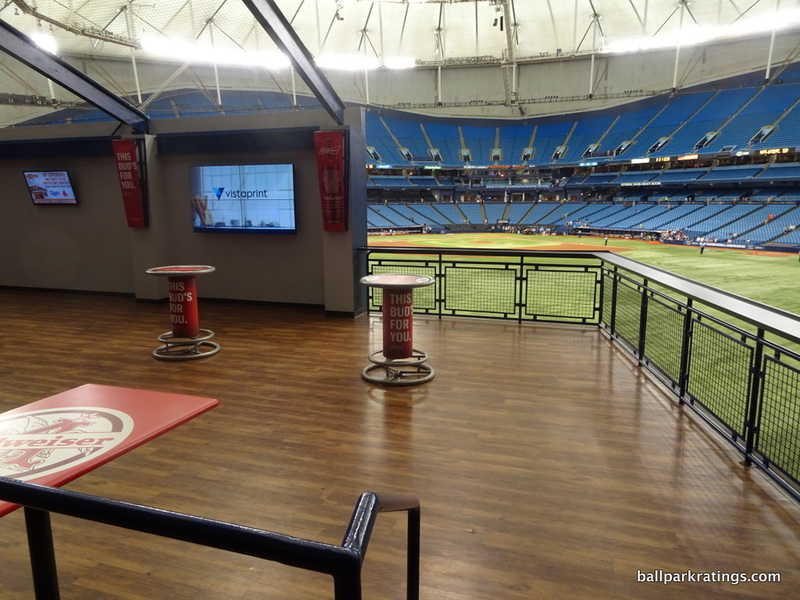 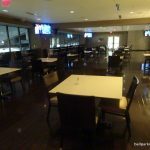 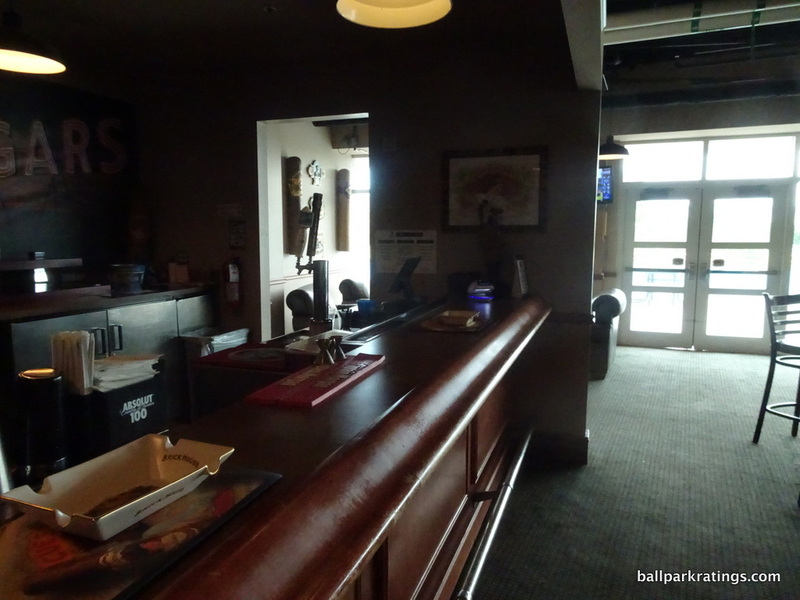 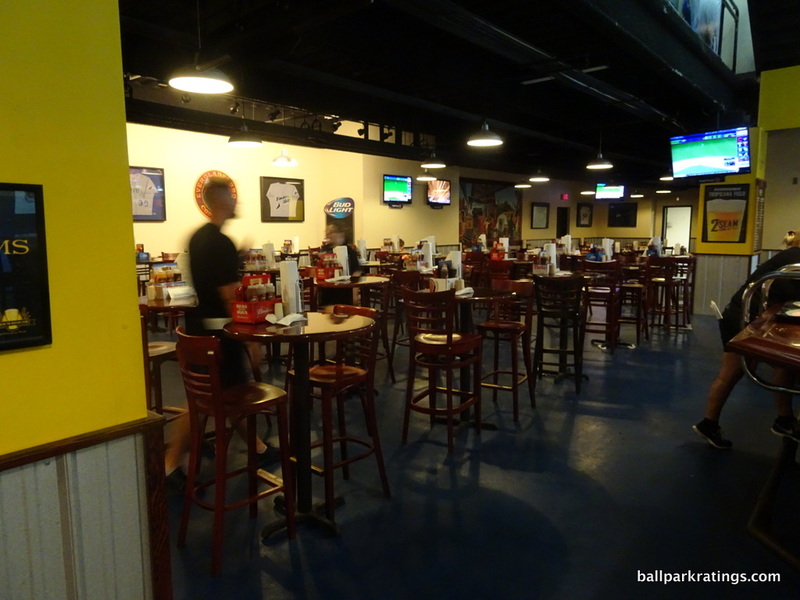 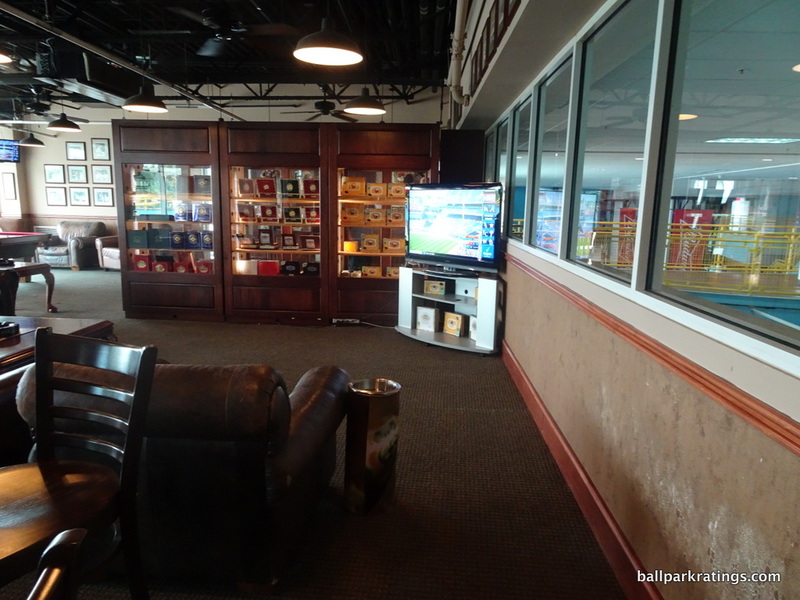 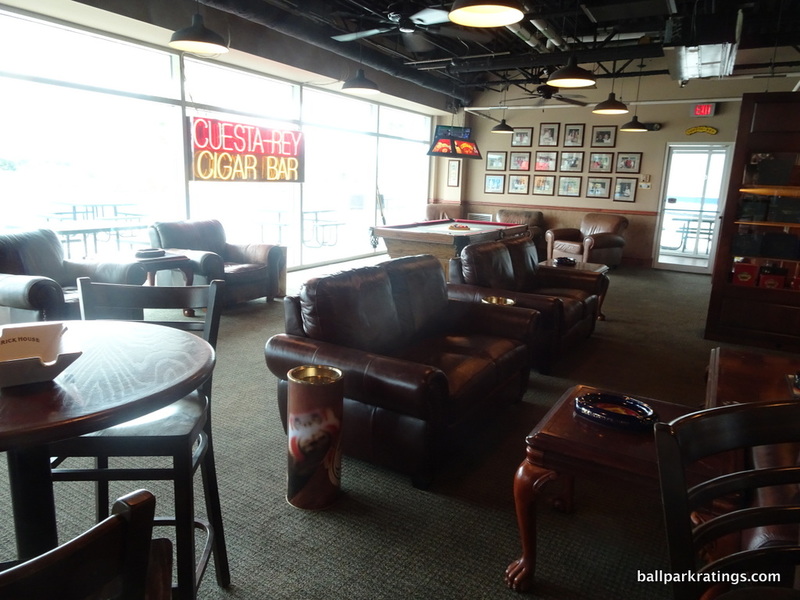 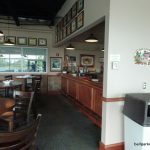 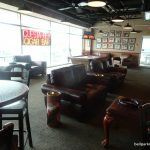 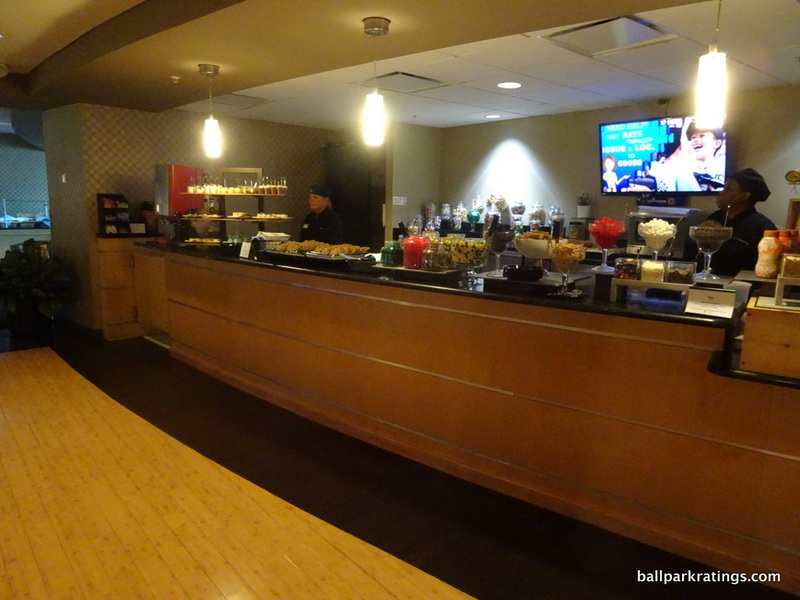 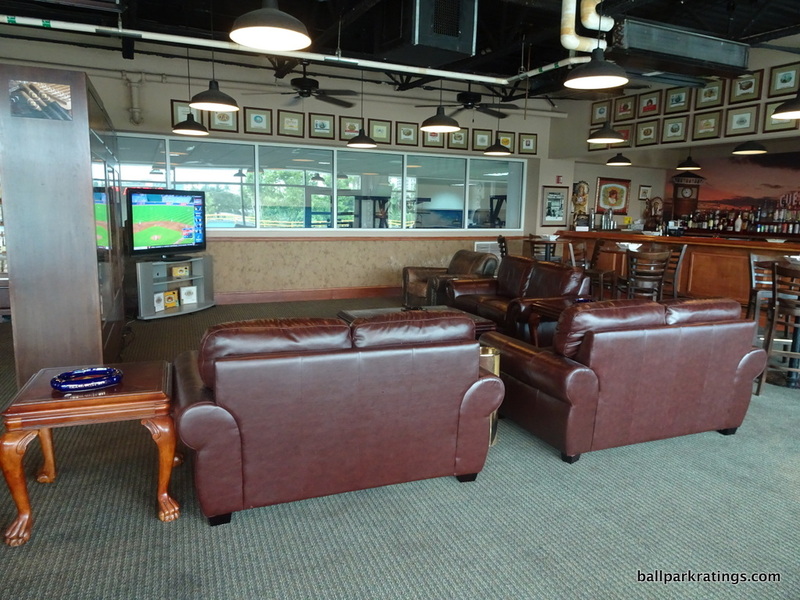 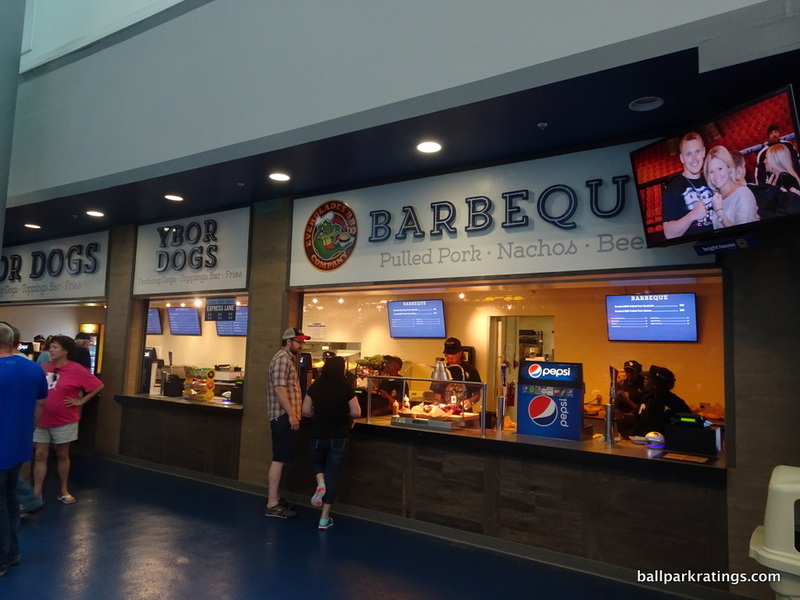 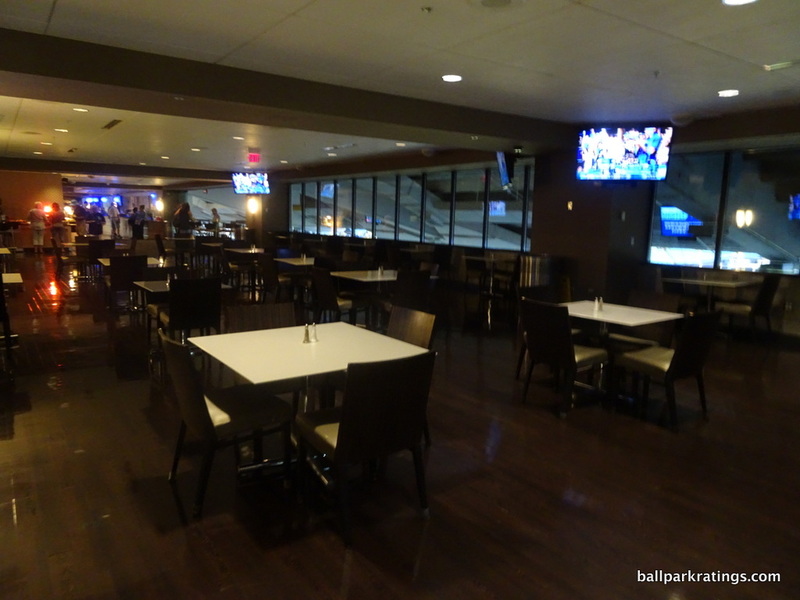 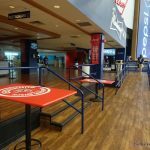 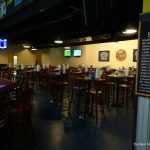 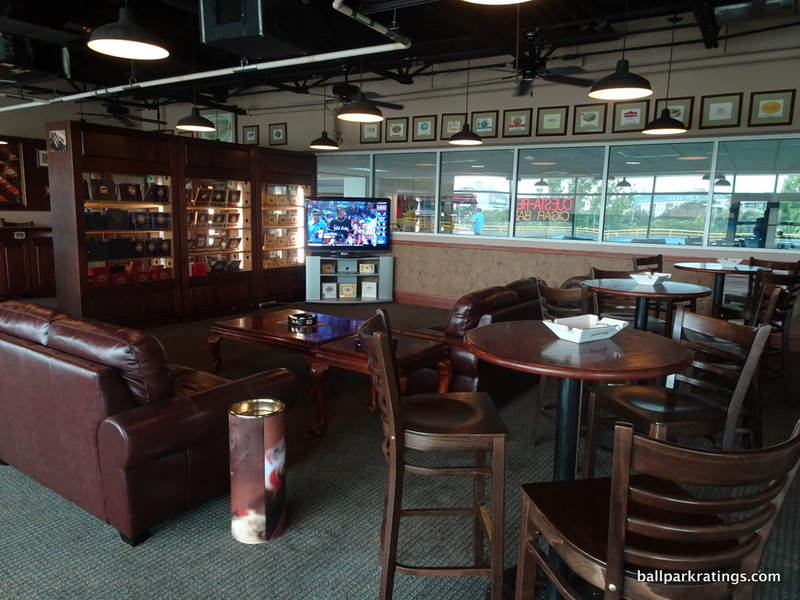 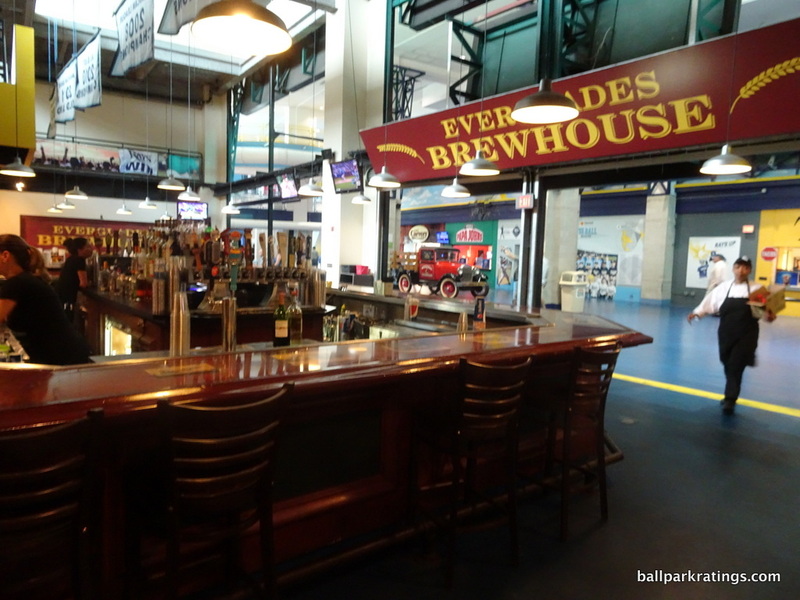 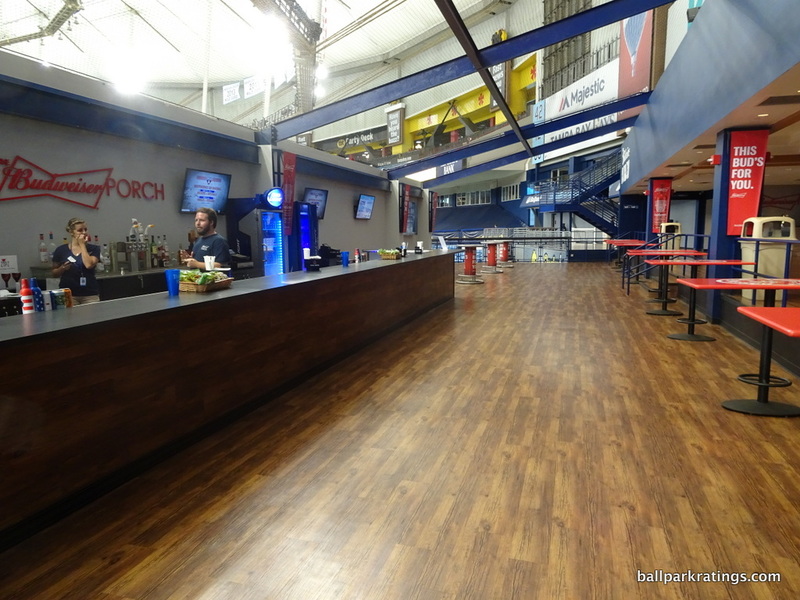 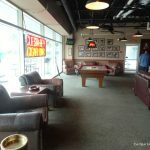 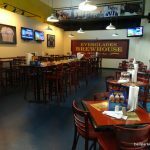 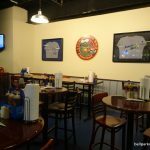 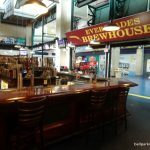 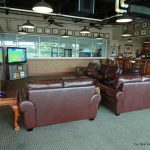 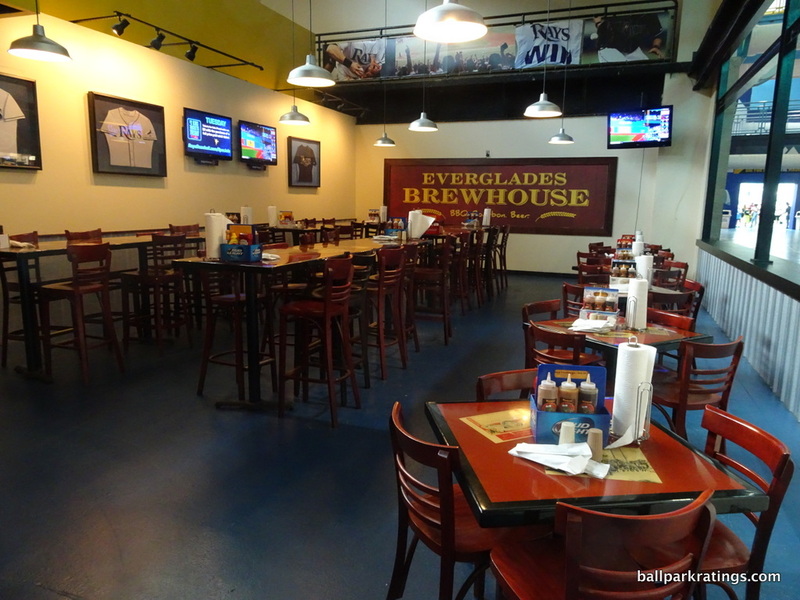 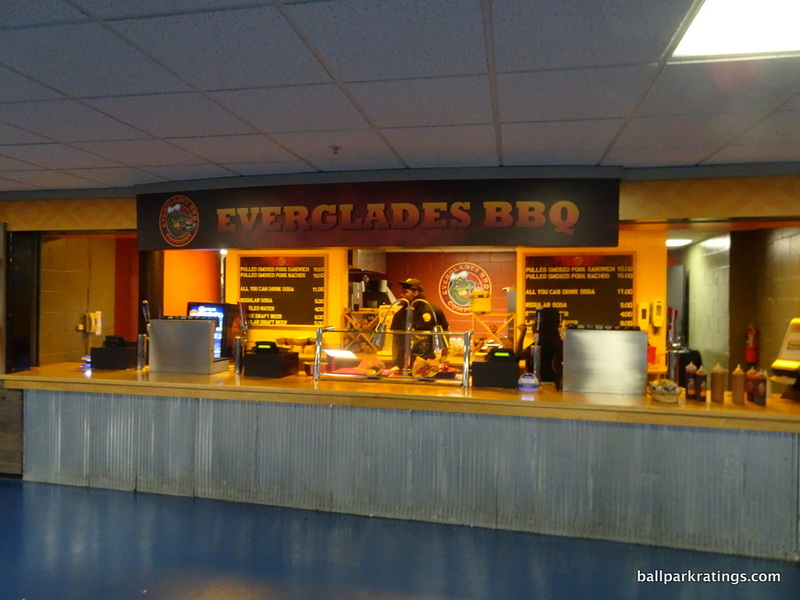 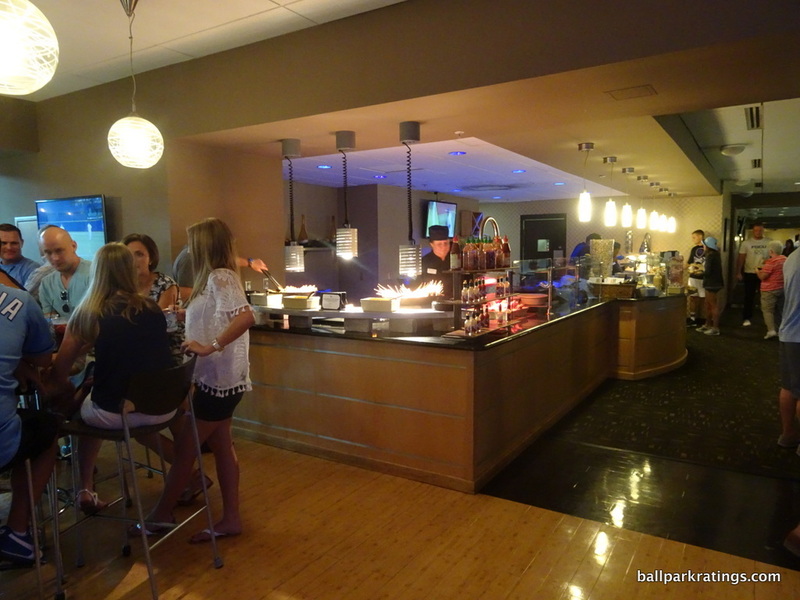 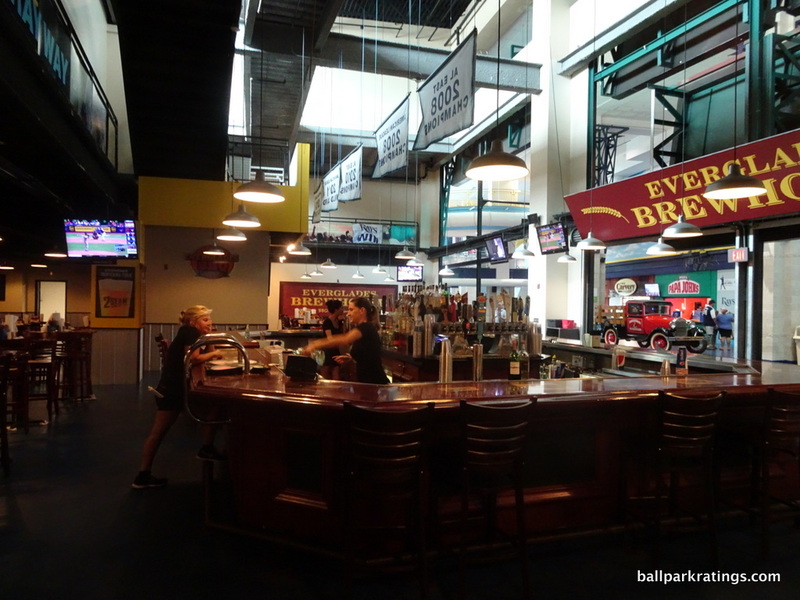 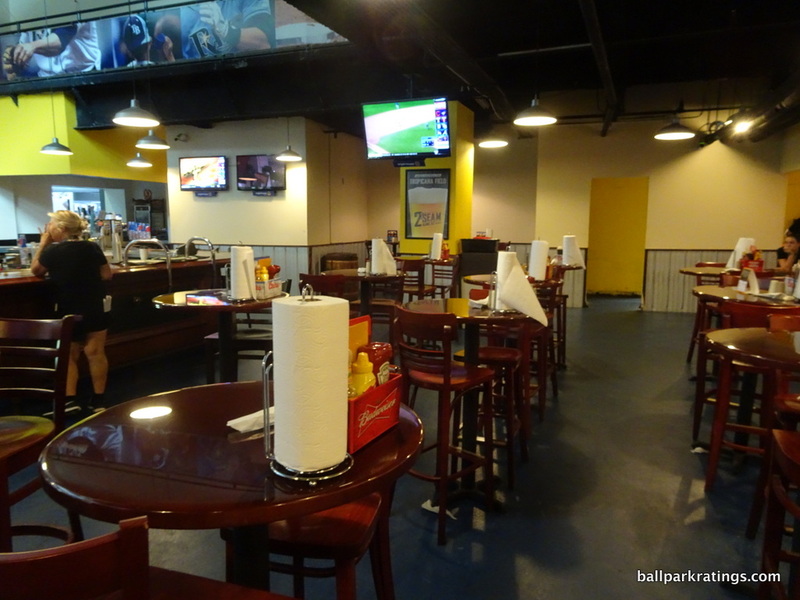 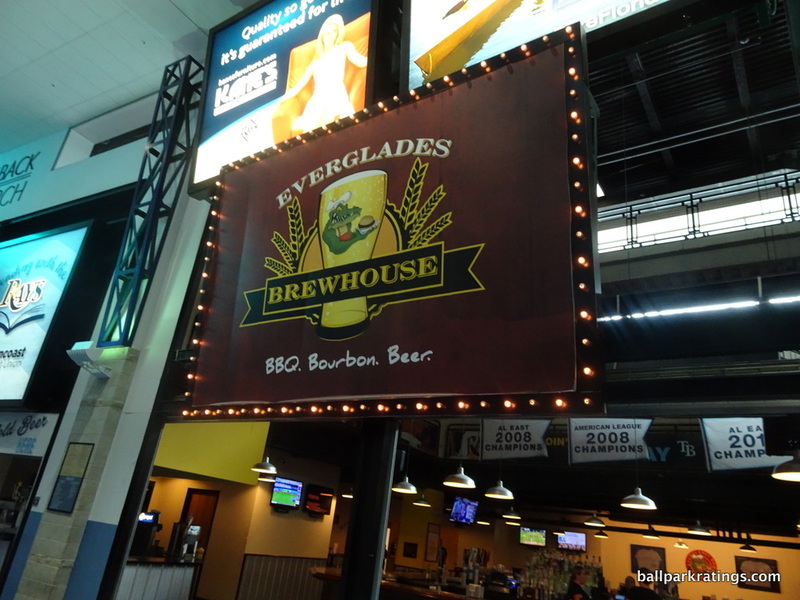 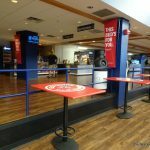 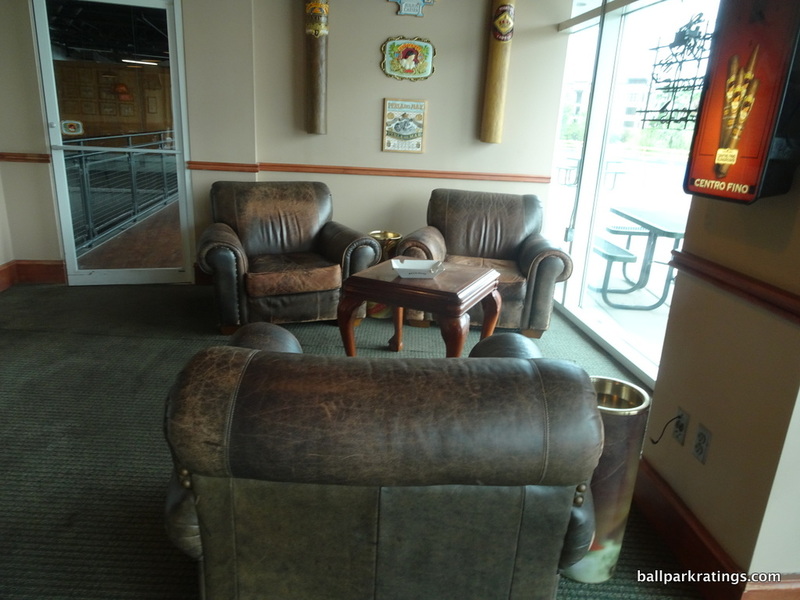 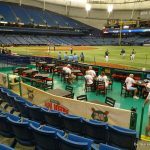 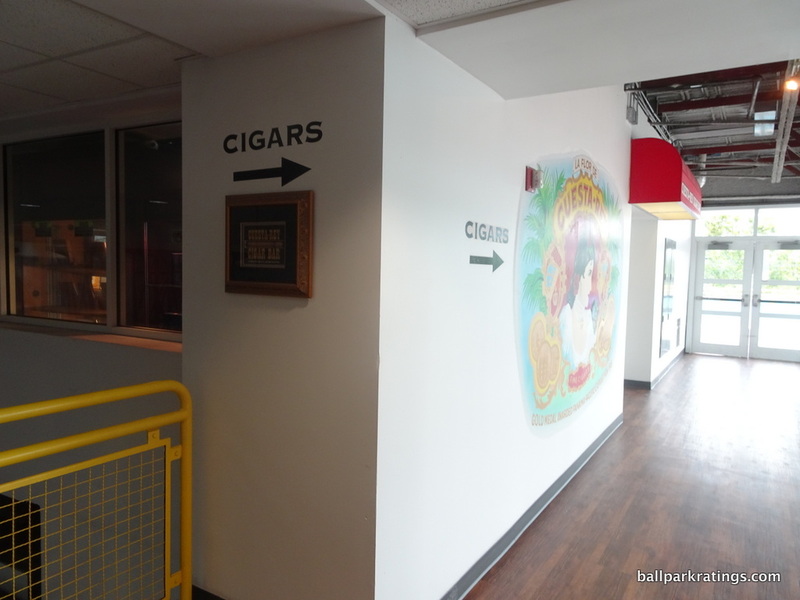 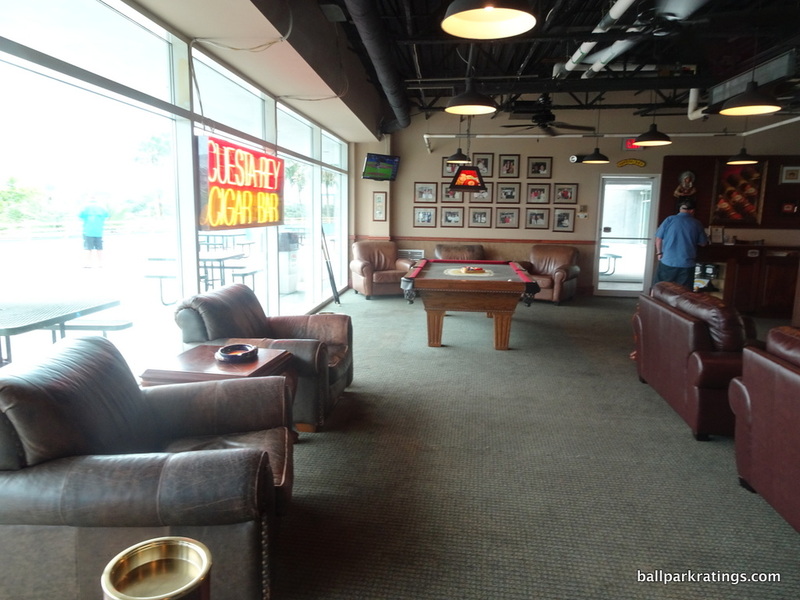 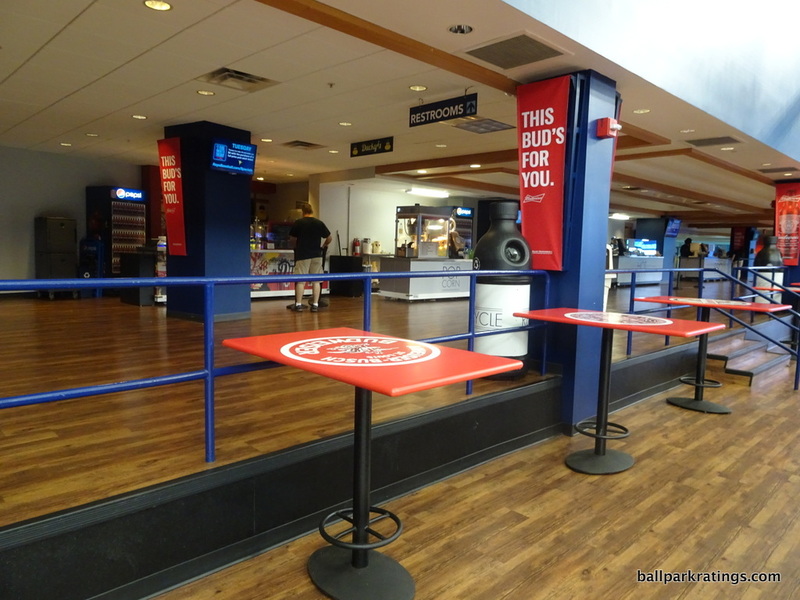 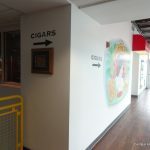 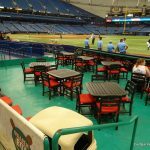 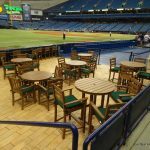 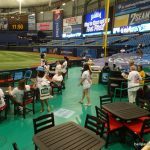 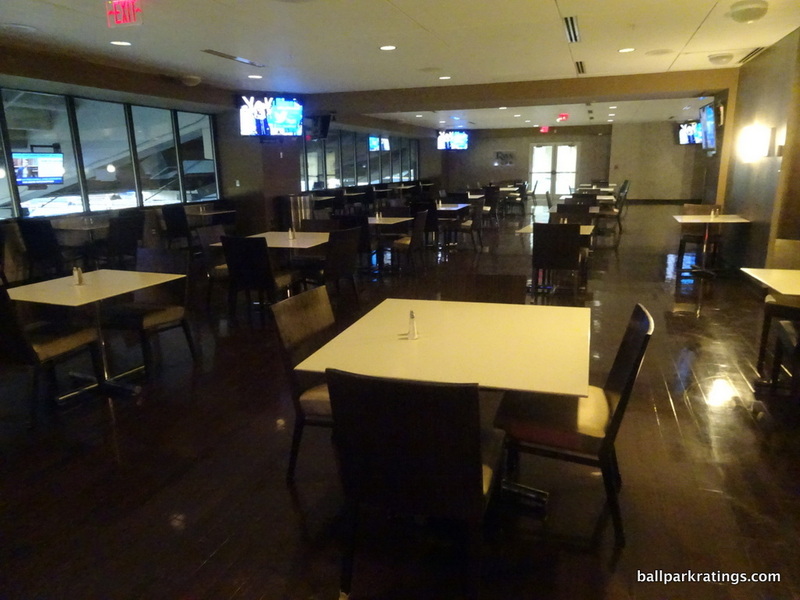 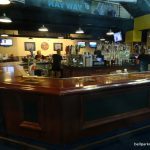 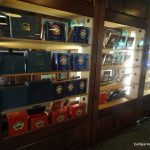 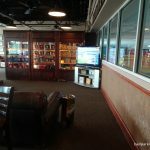 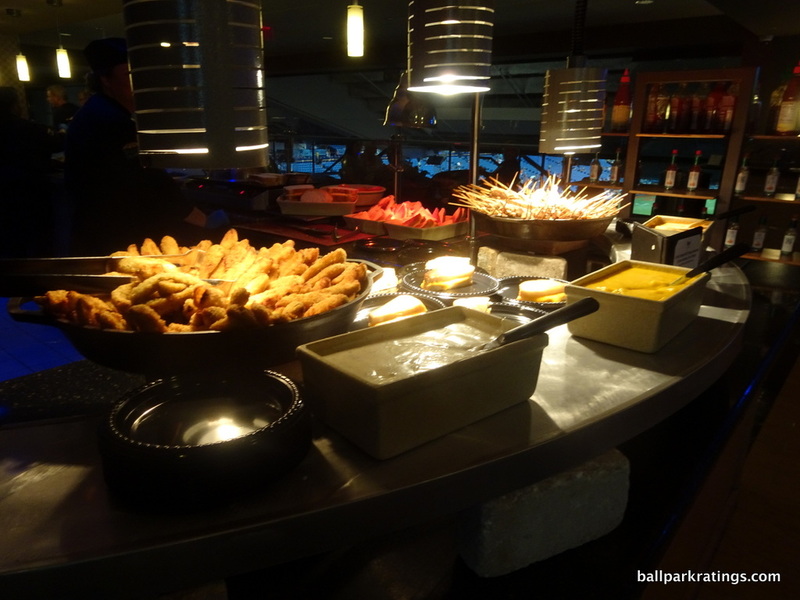 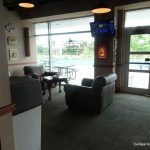 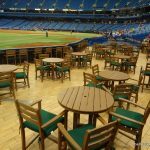 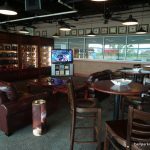 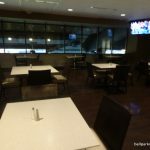 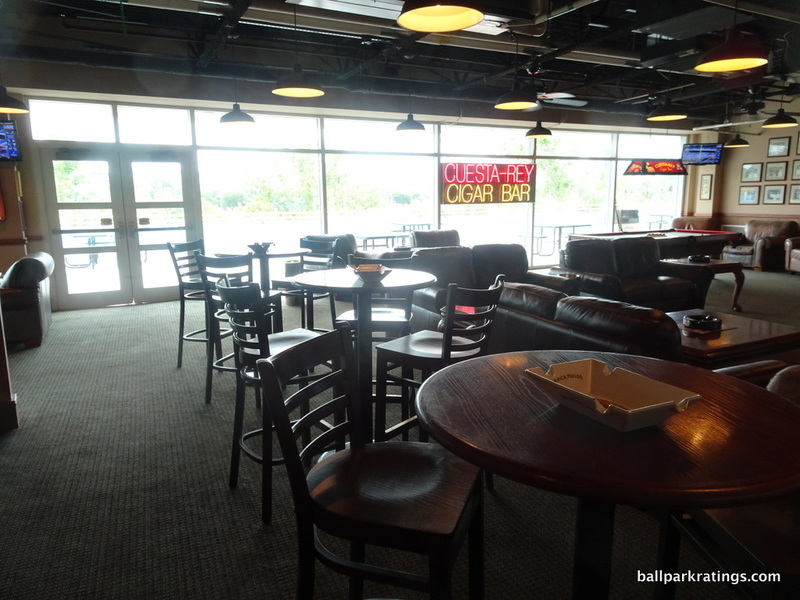 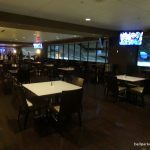 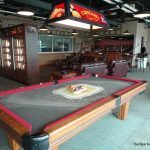 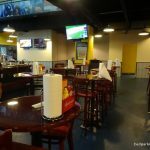 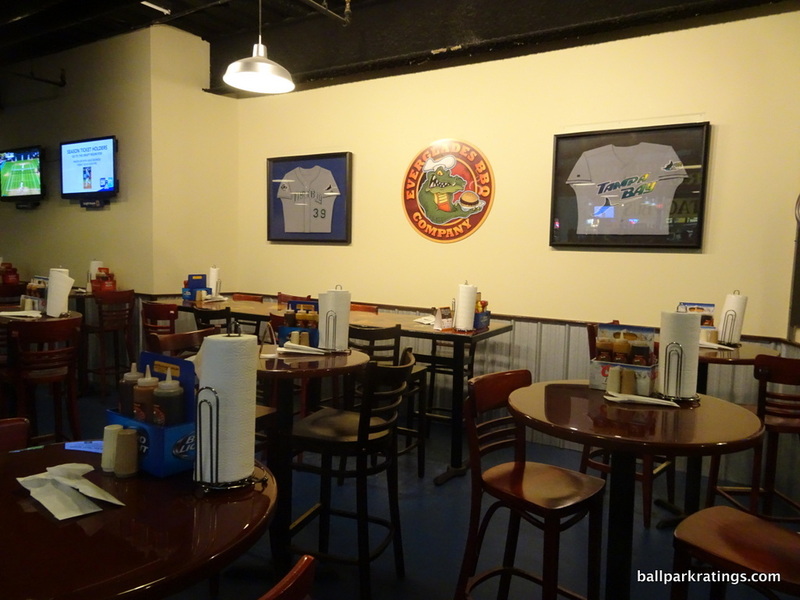 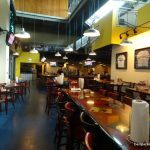 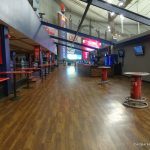 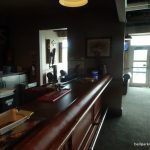 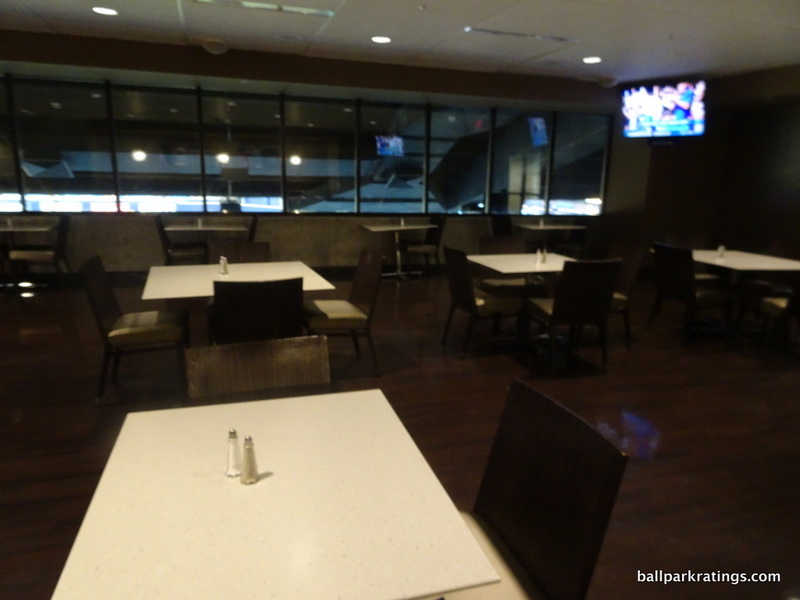 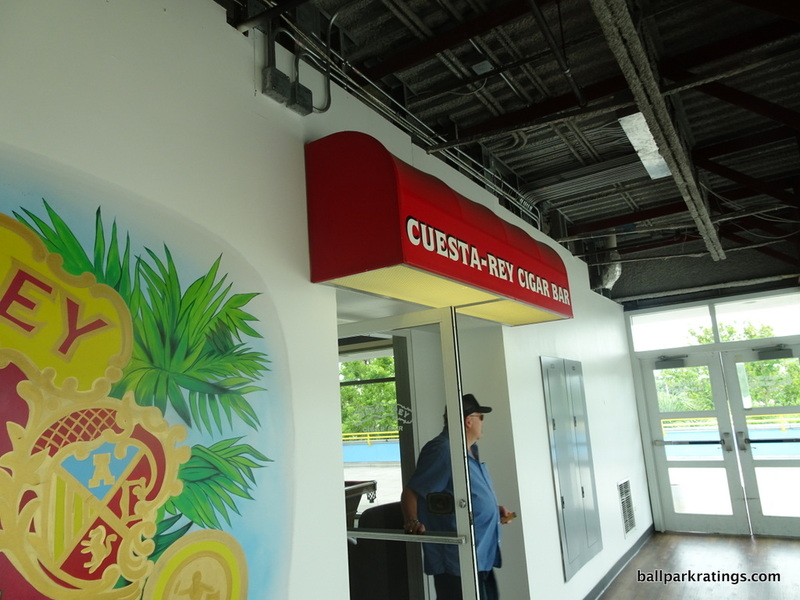 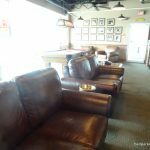 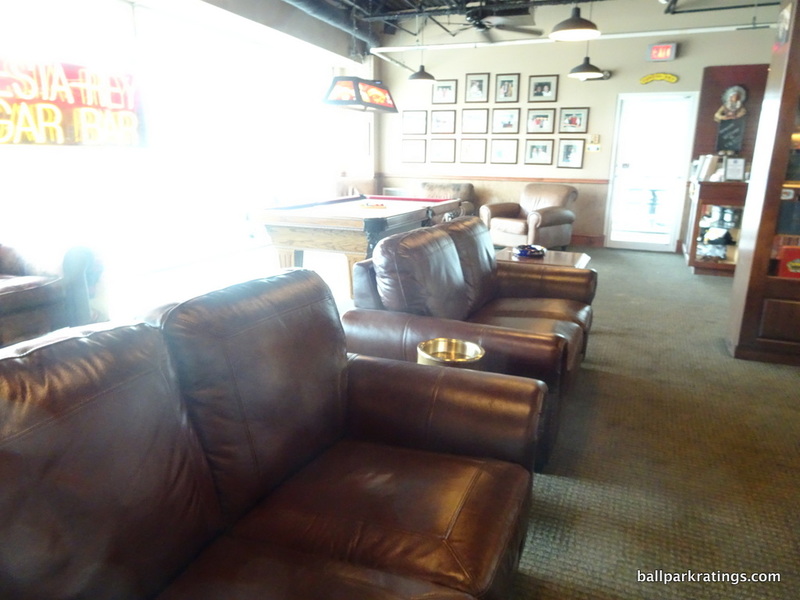 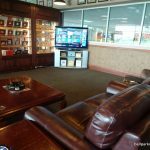 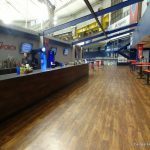 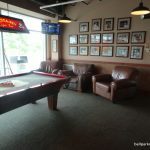 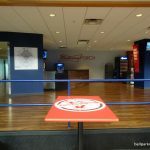 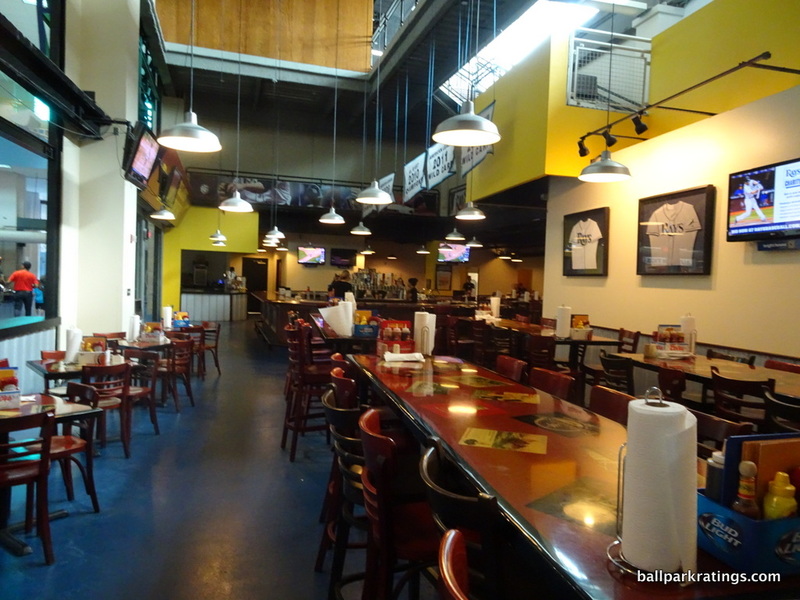 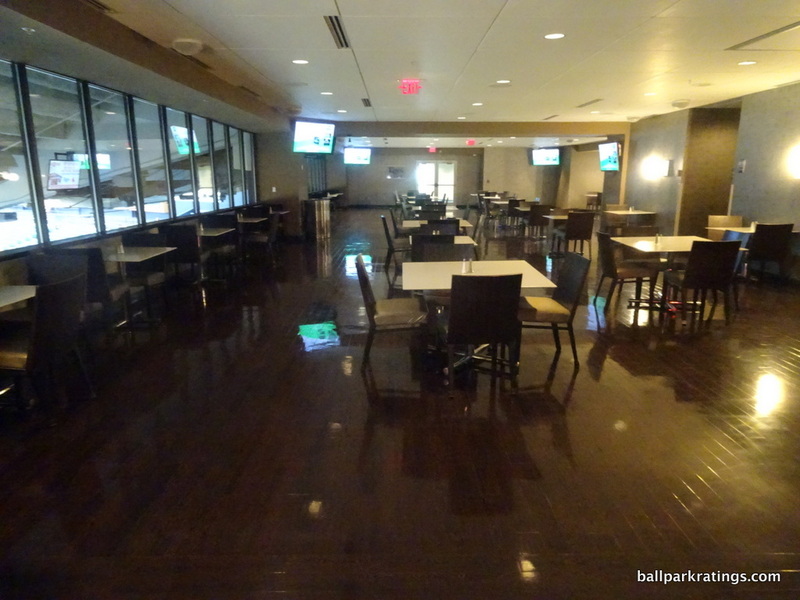 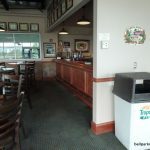 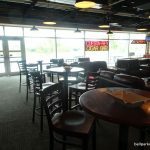 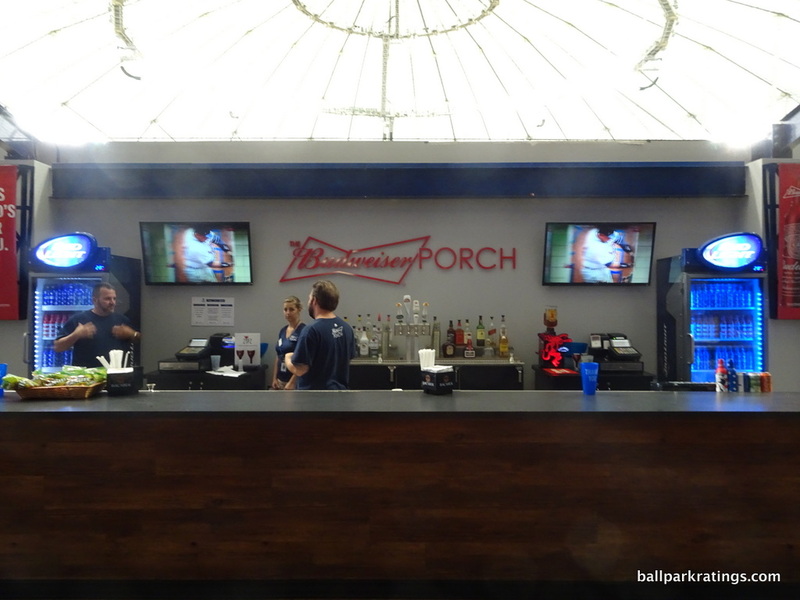 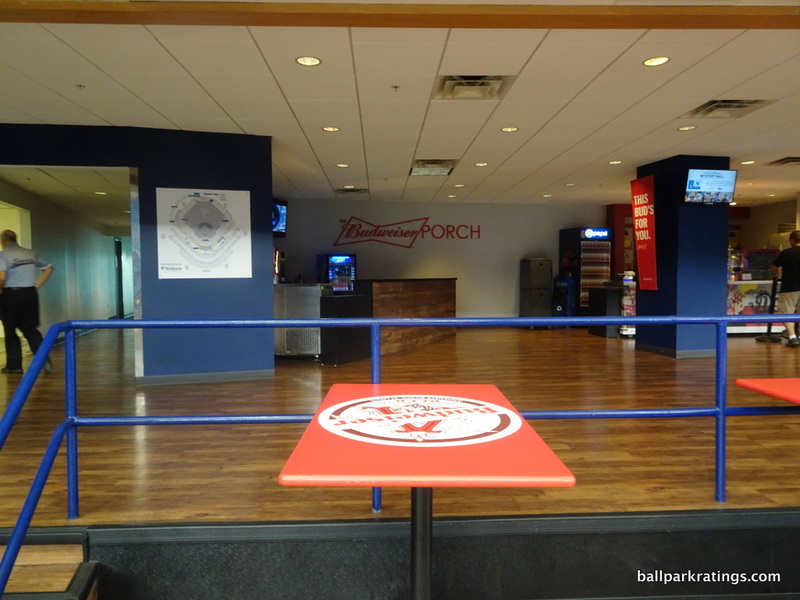 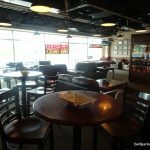 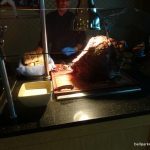 Enjoy a cocktail and catch a batting practice home ball at the new Budweiser Patio; grab a bite to eat at the Everglades Brewhouse; enjoy another cocktail and post-meal cigar at the Cigar Bar. 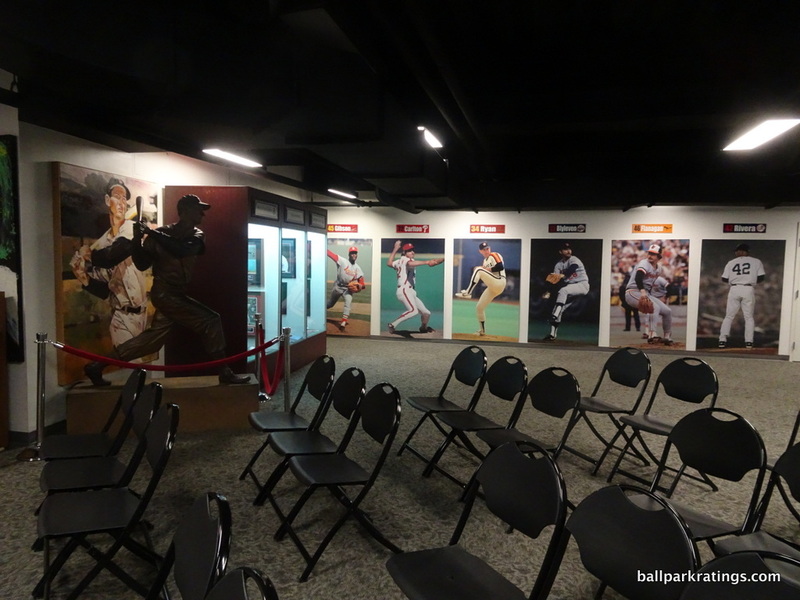 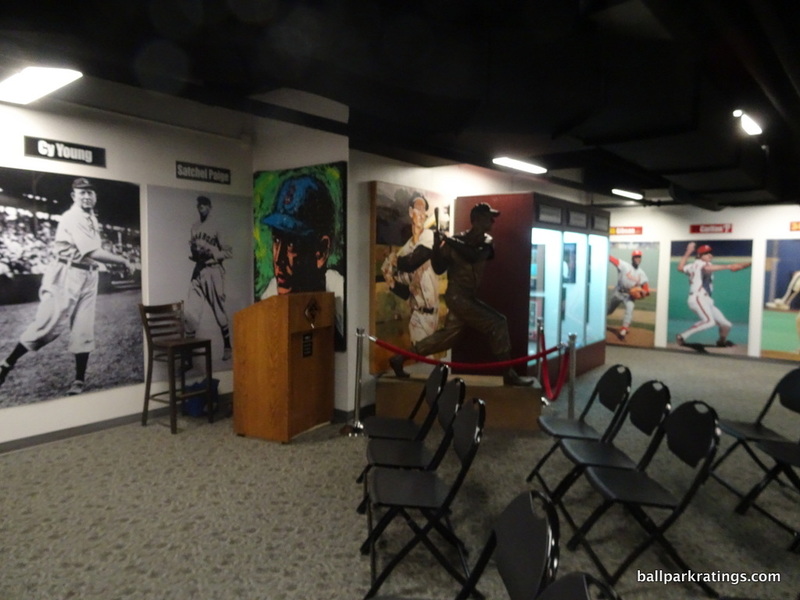 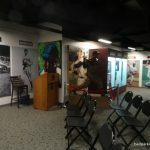 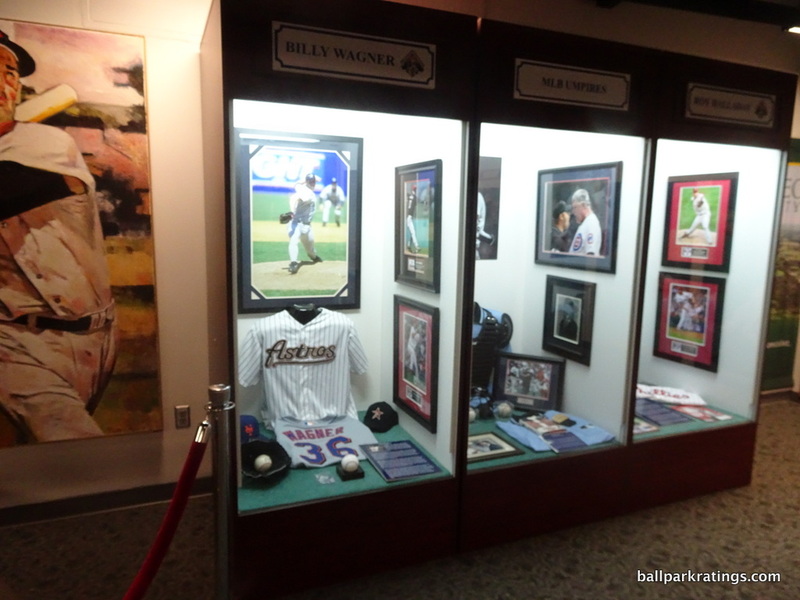 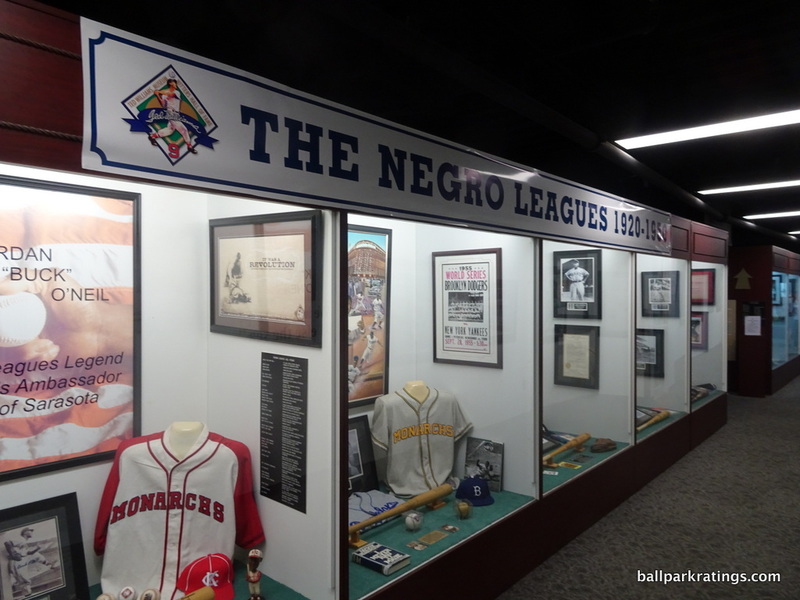 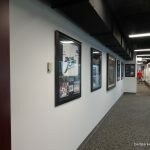 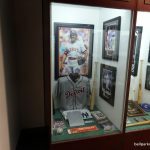 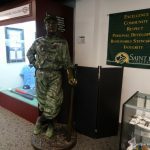 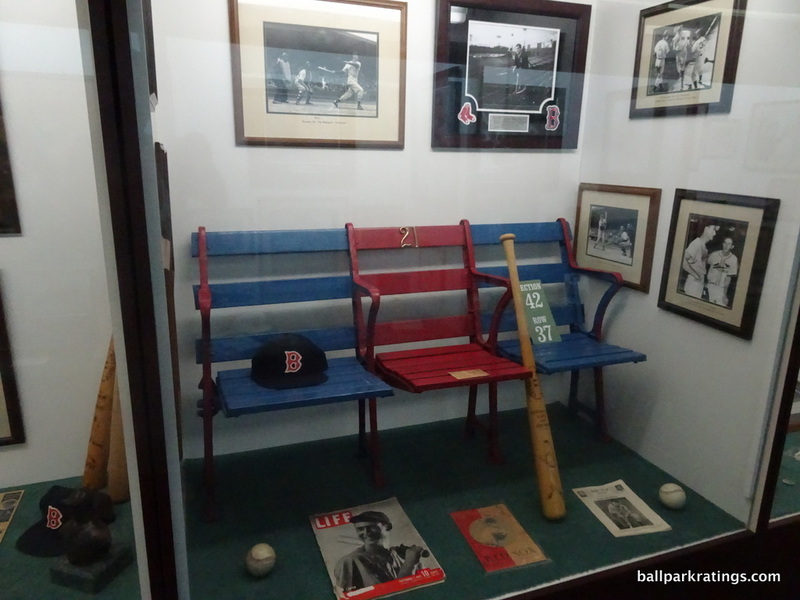 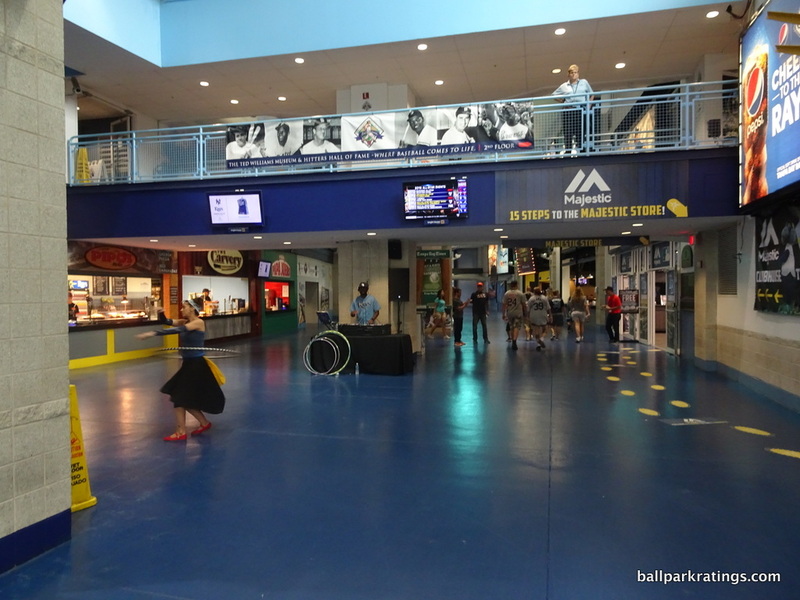 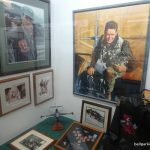 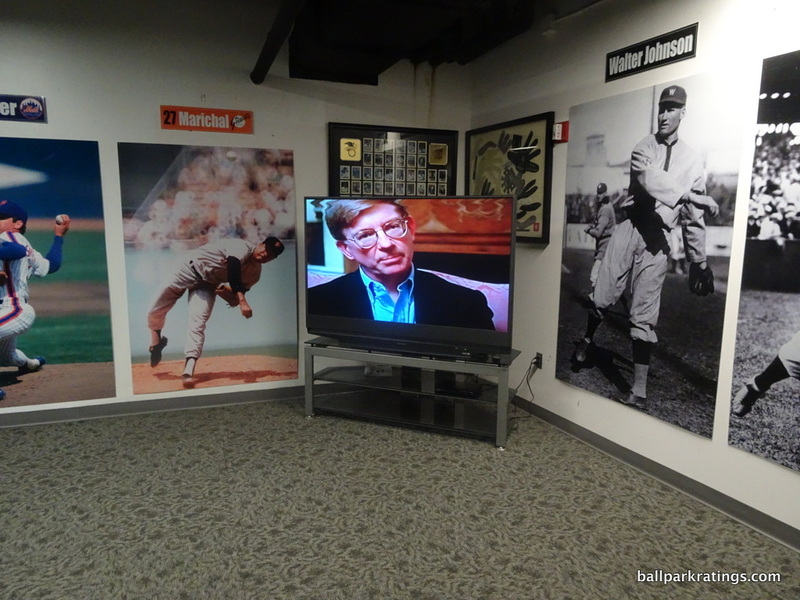 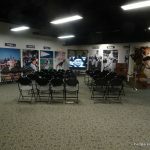 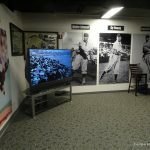 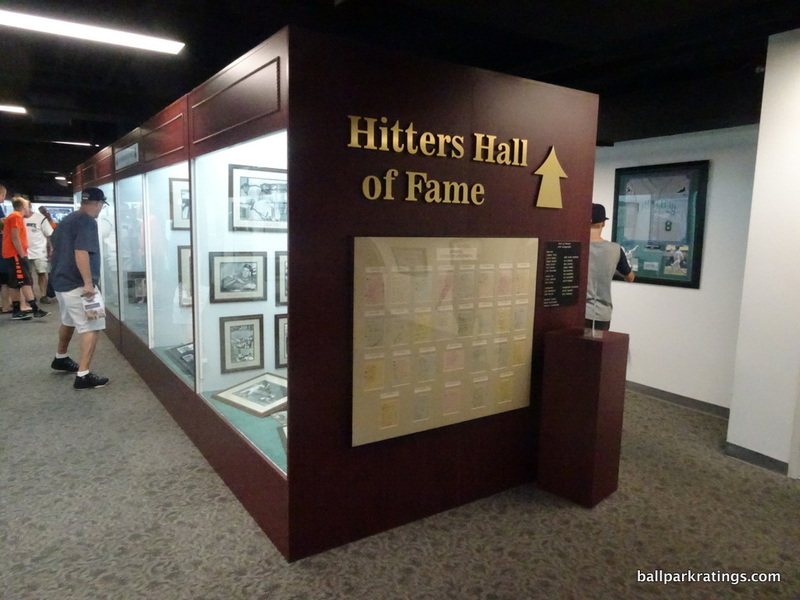 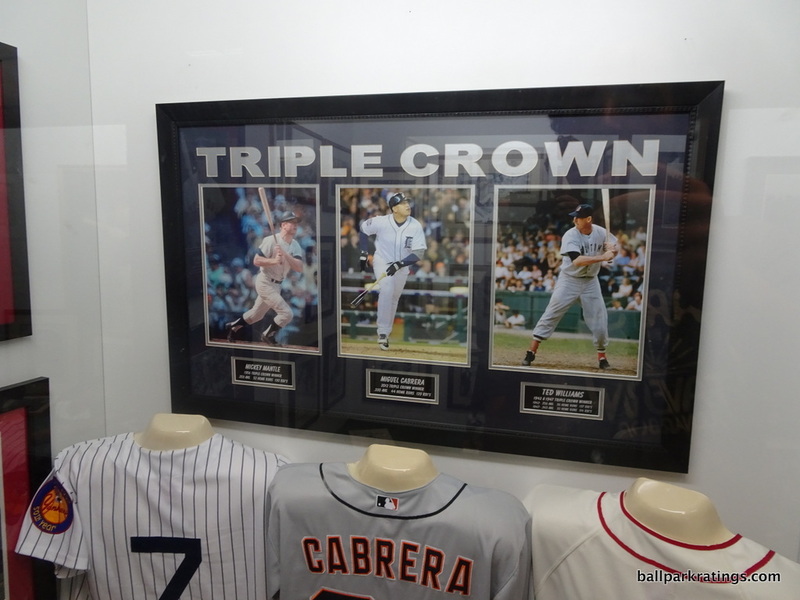 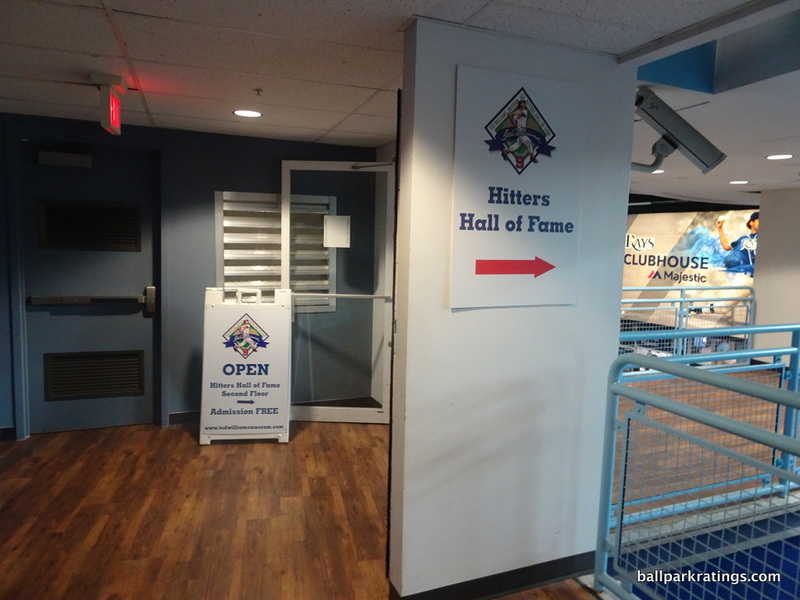 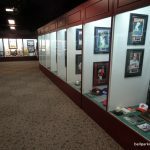 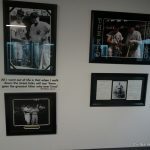 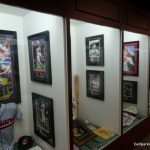 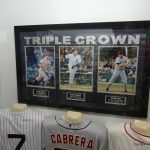 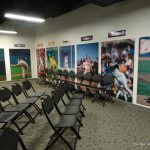 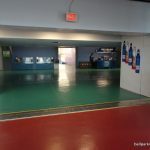 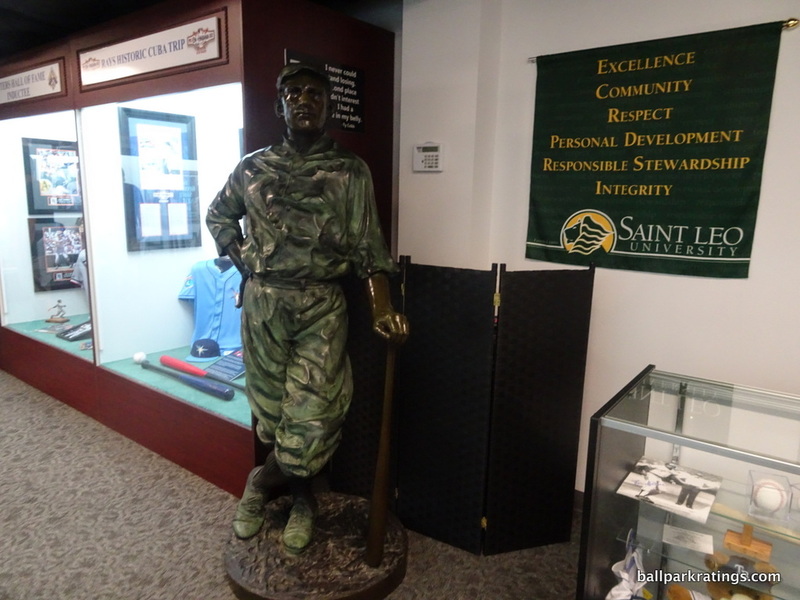 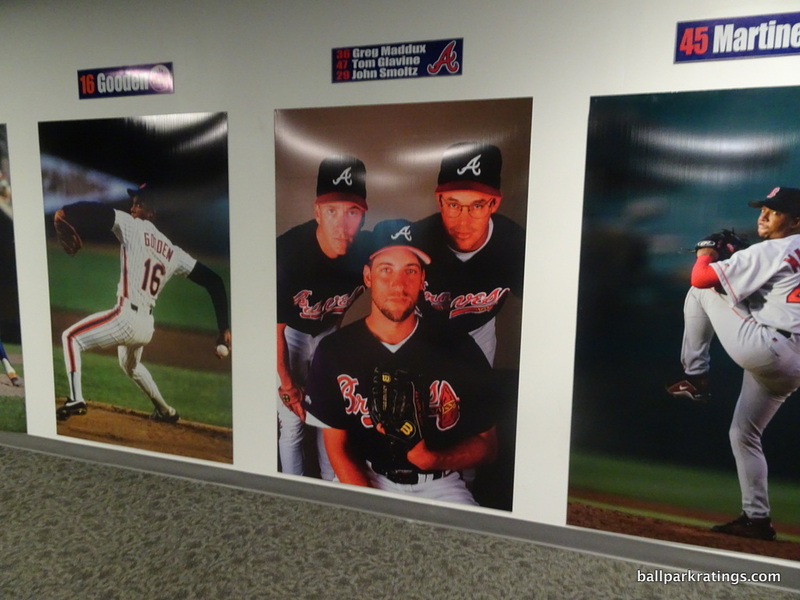 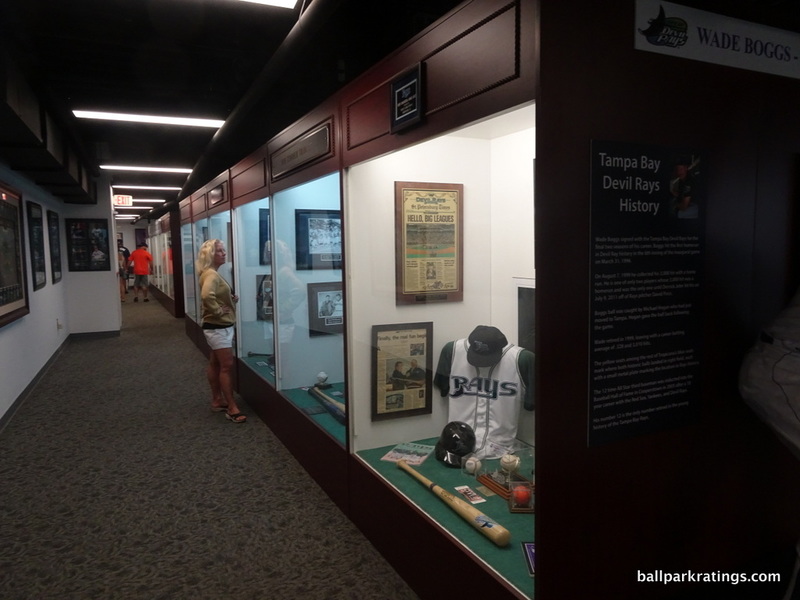 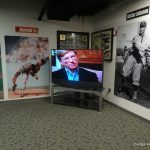 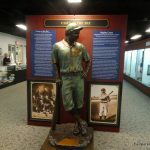 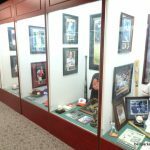 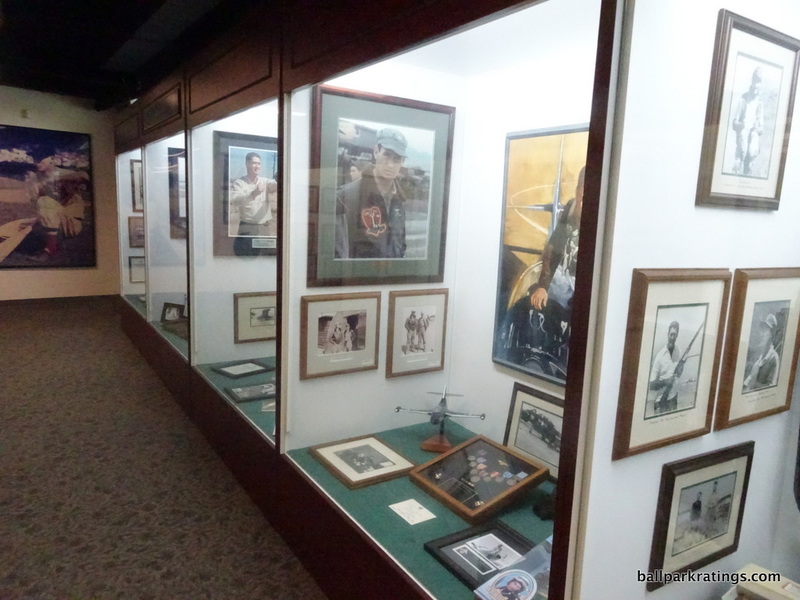 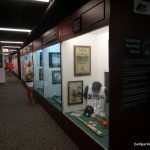 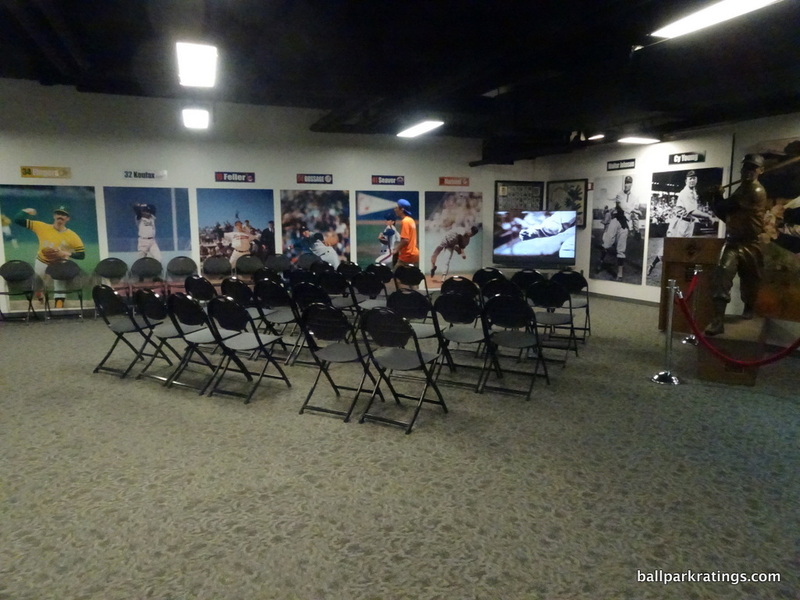 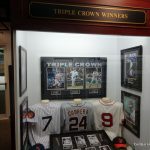 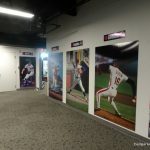 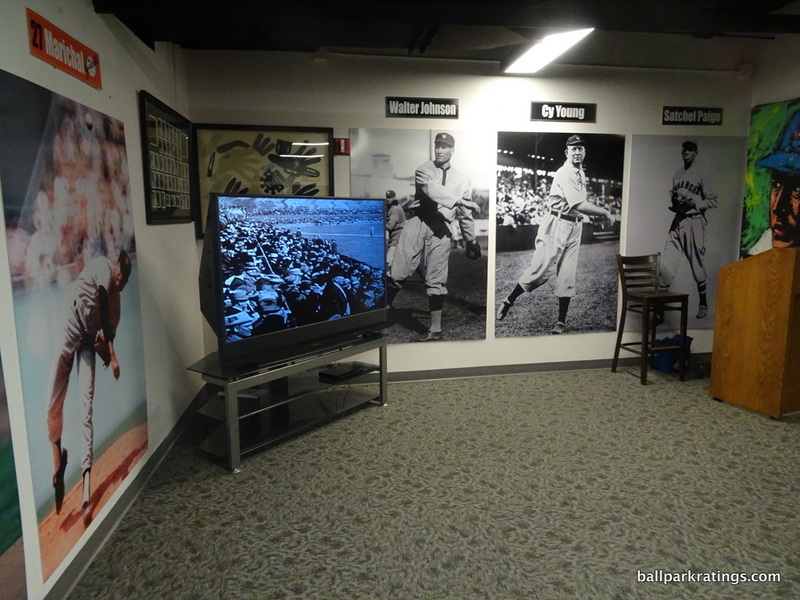 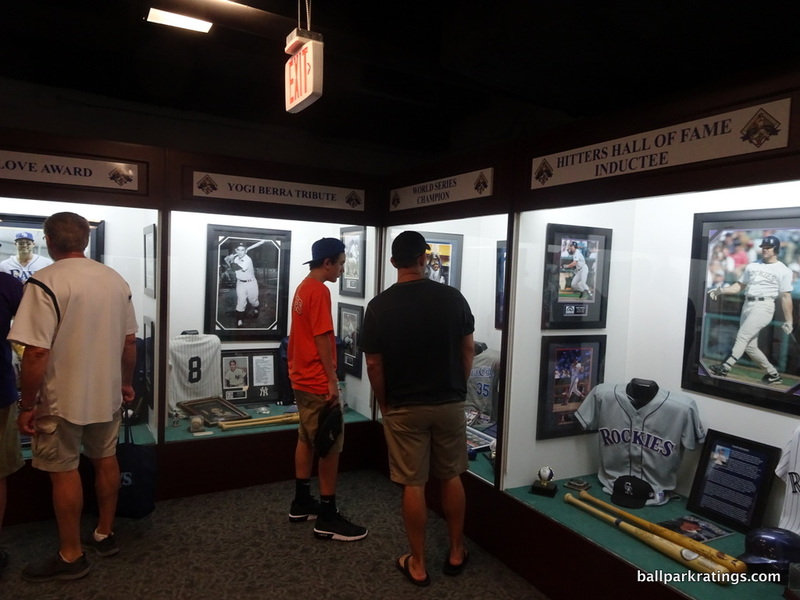 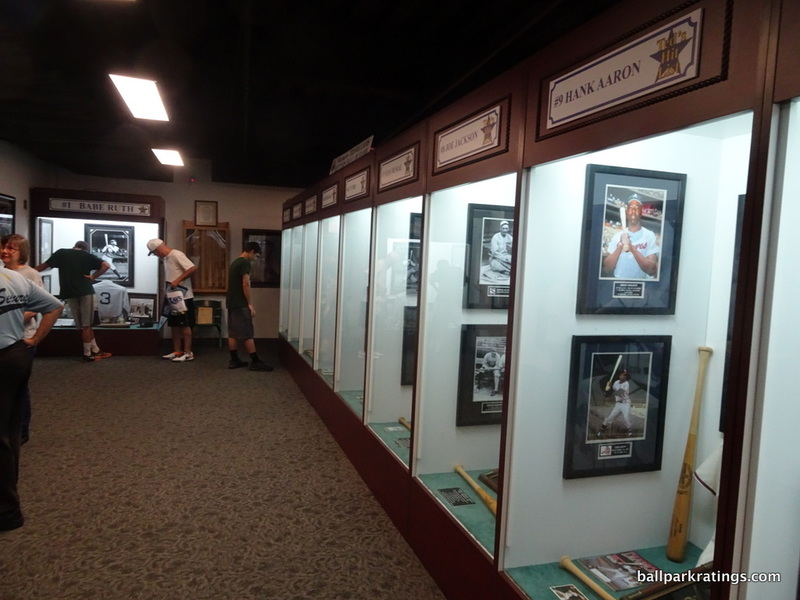 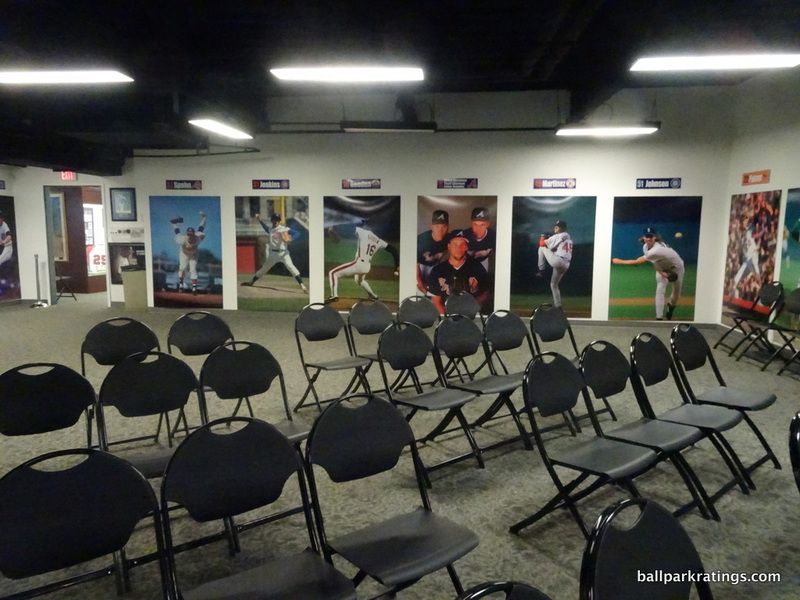 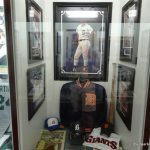 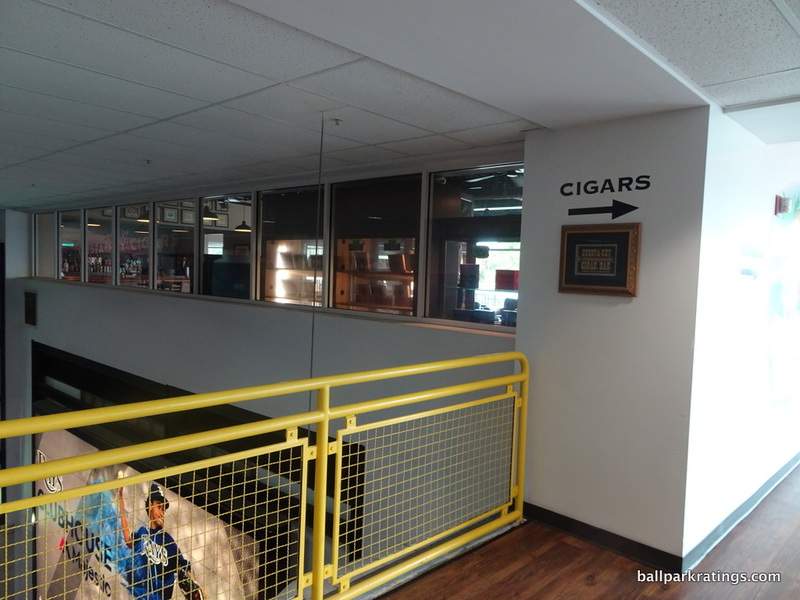 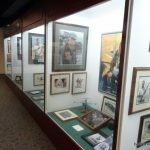 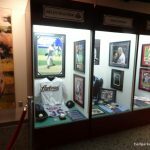 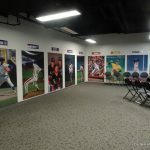 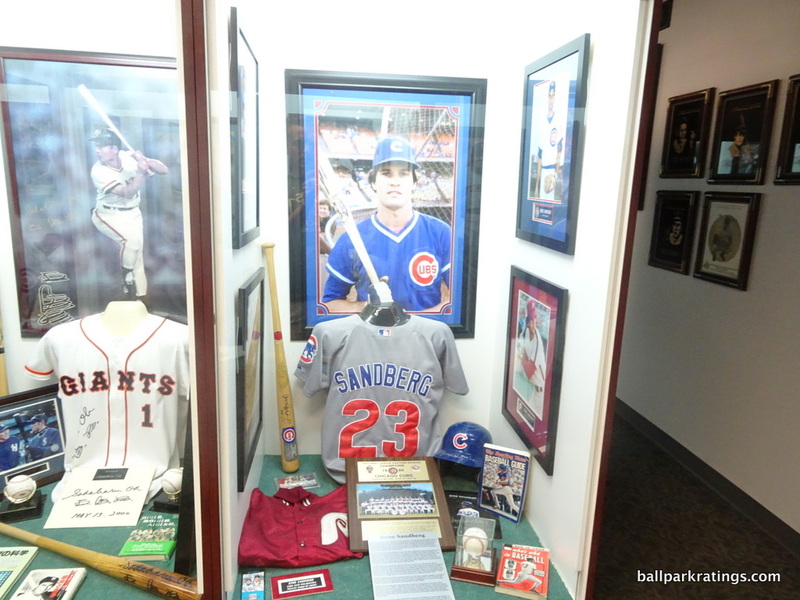 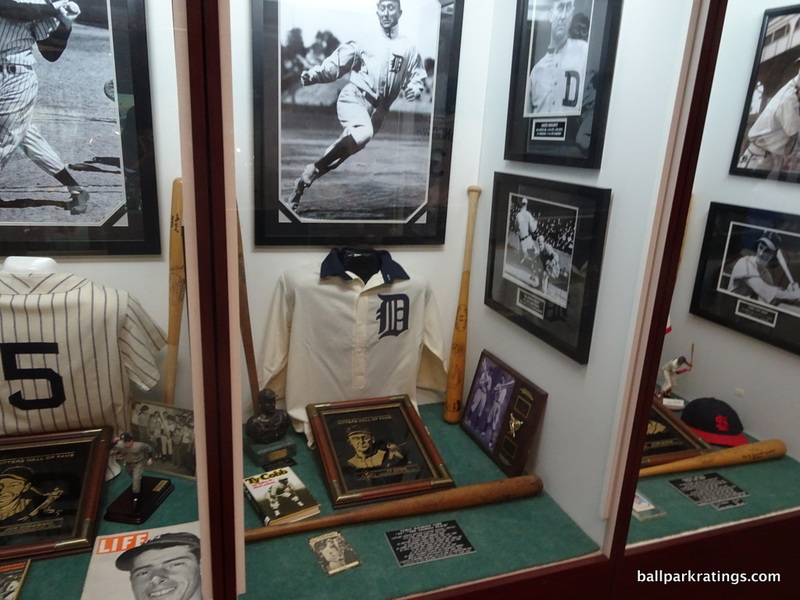 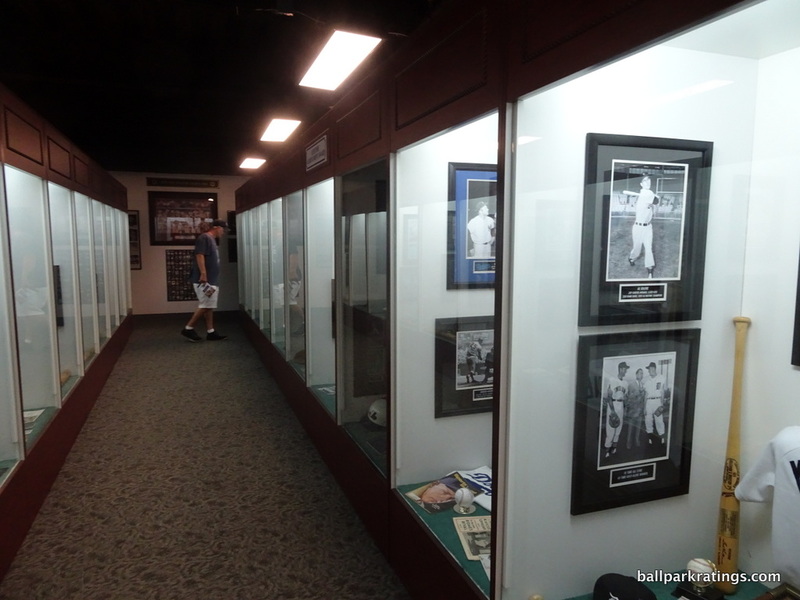 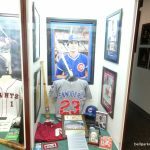 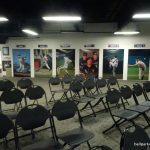 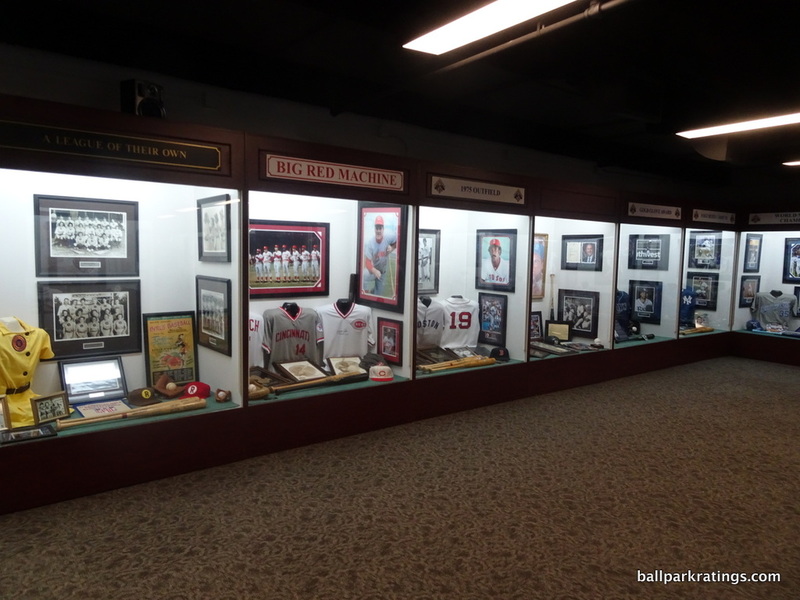 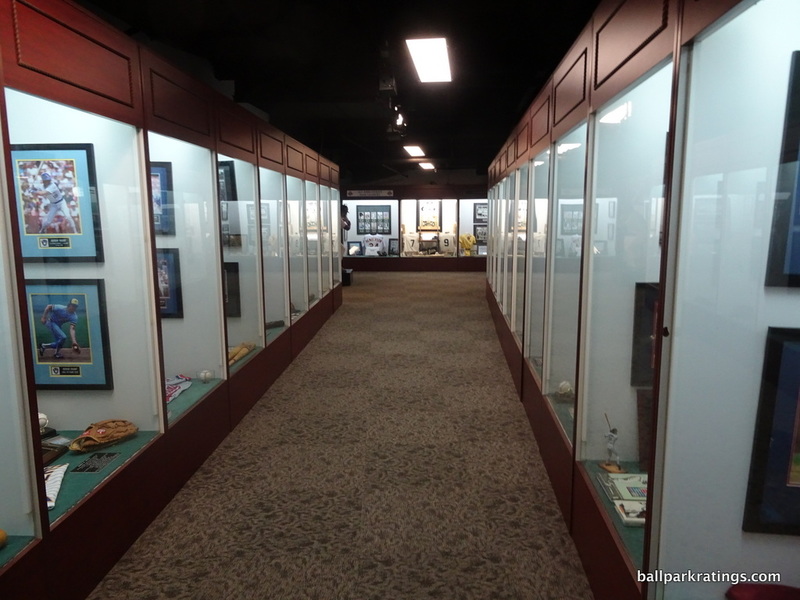 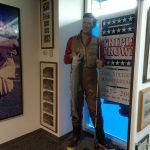 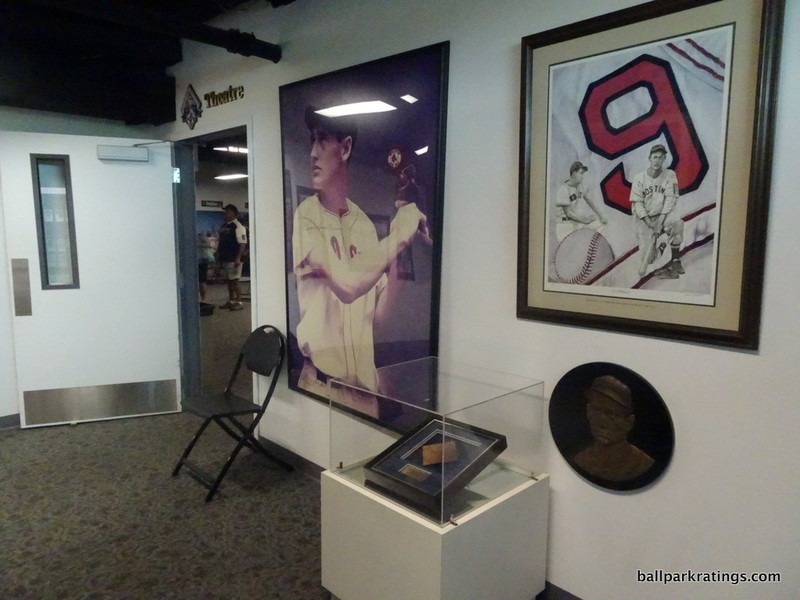 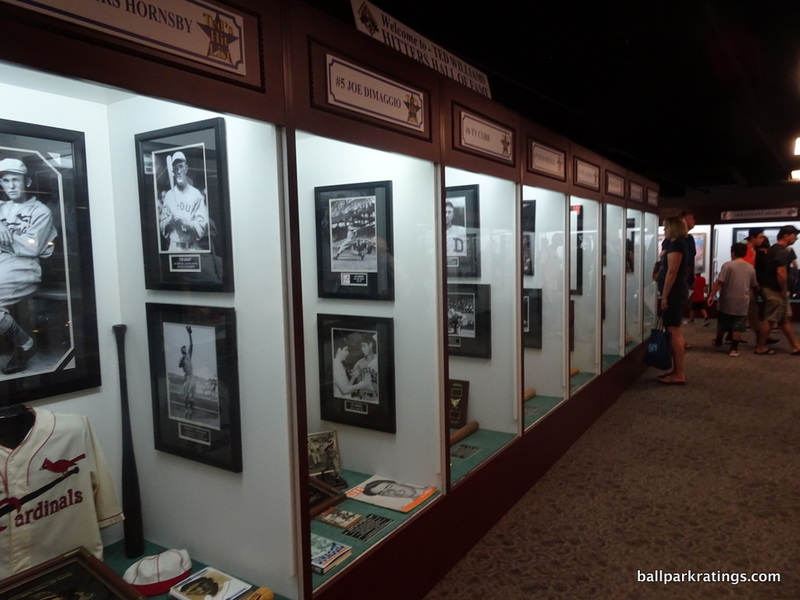 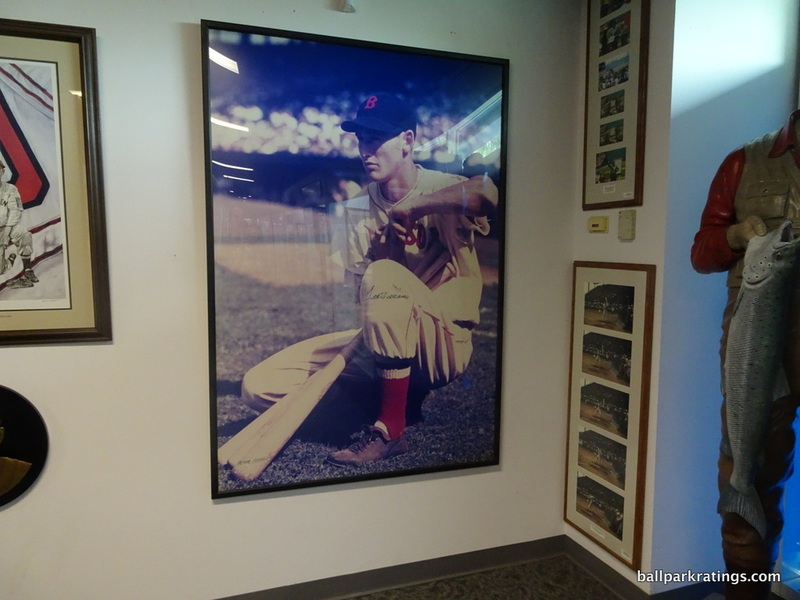 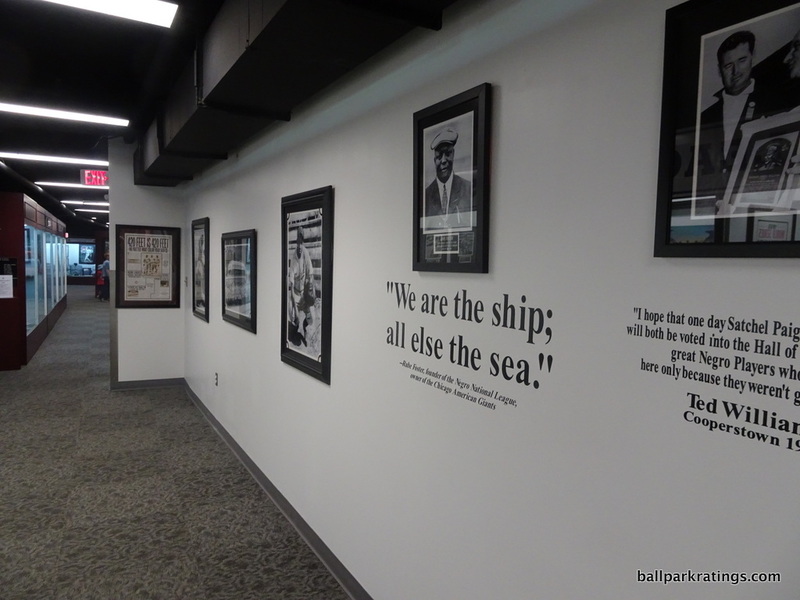 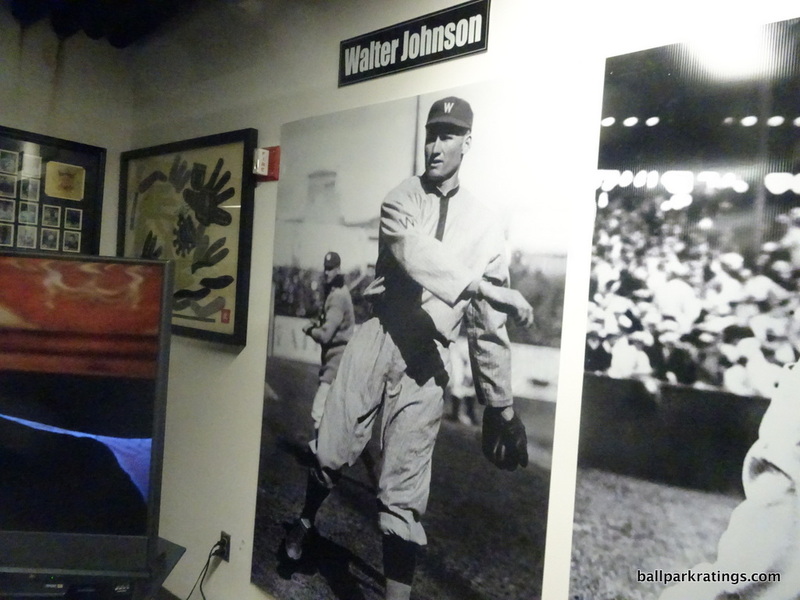 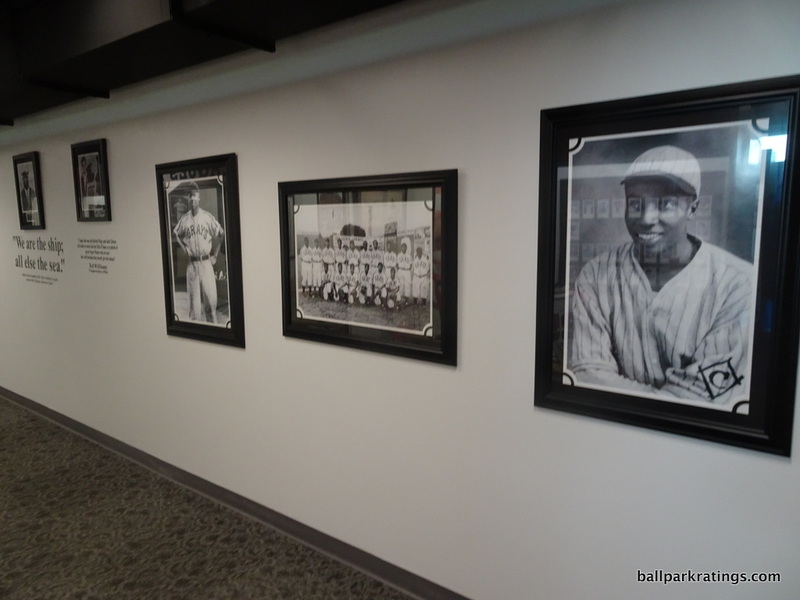 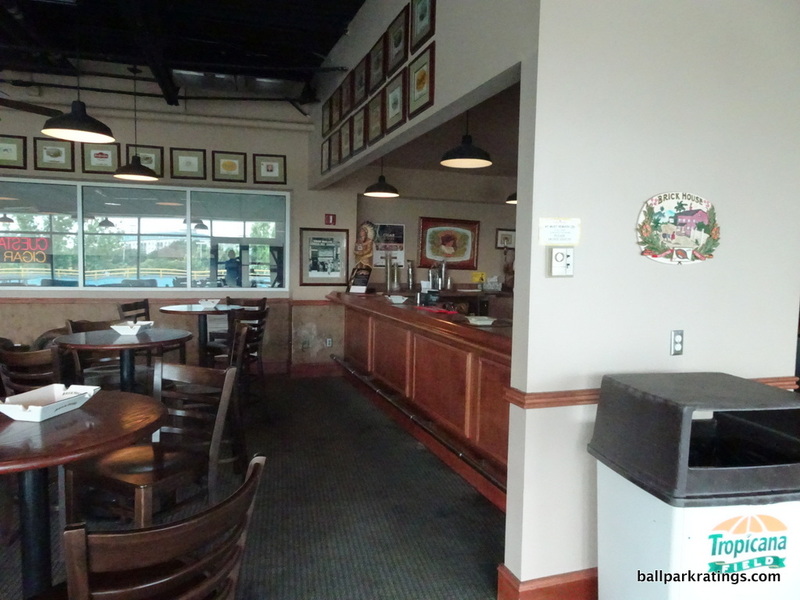 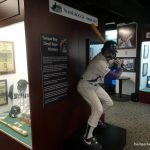 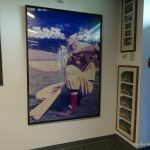 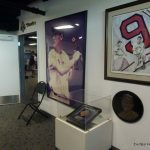 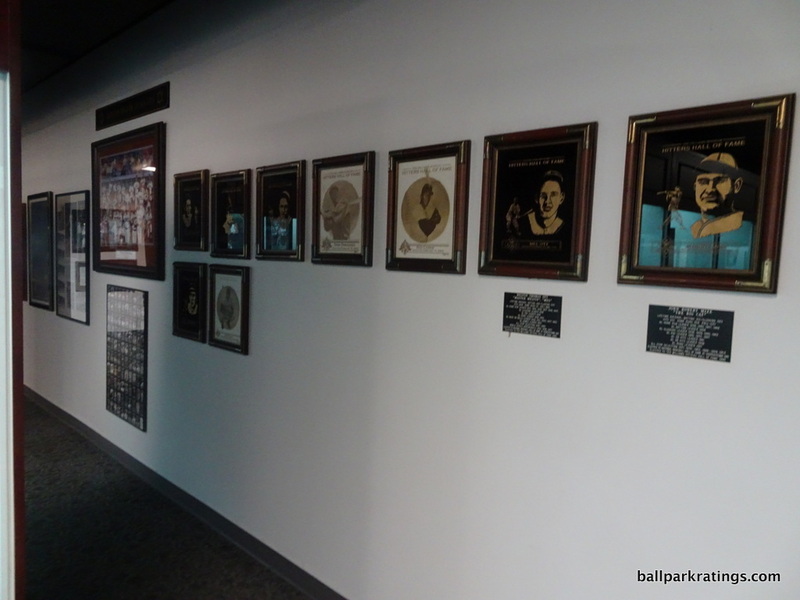 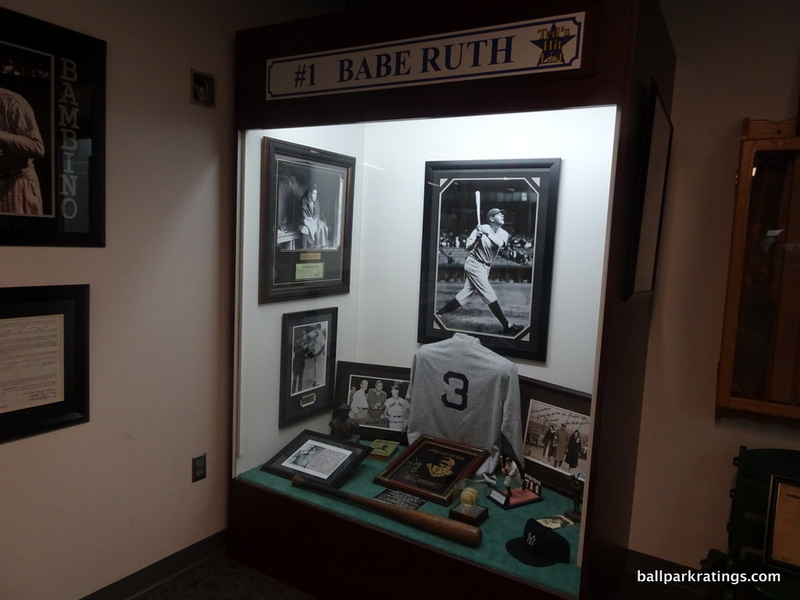 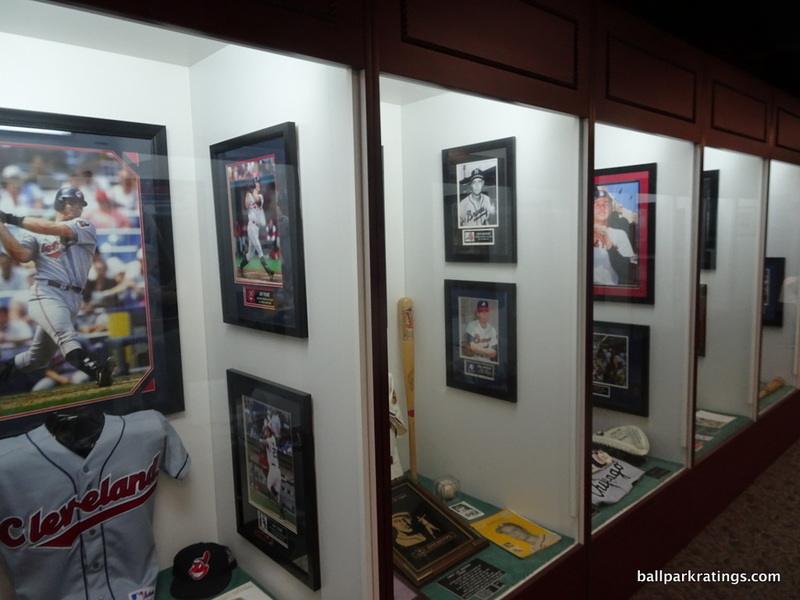 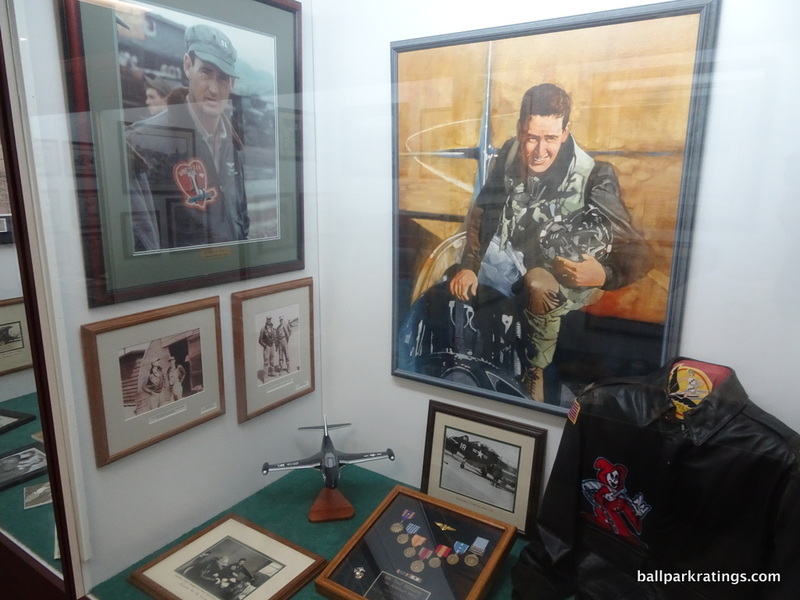 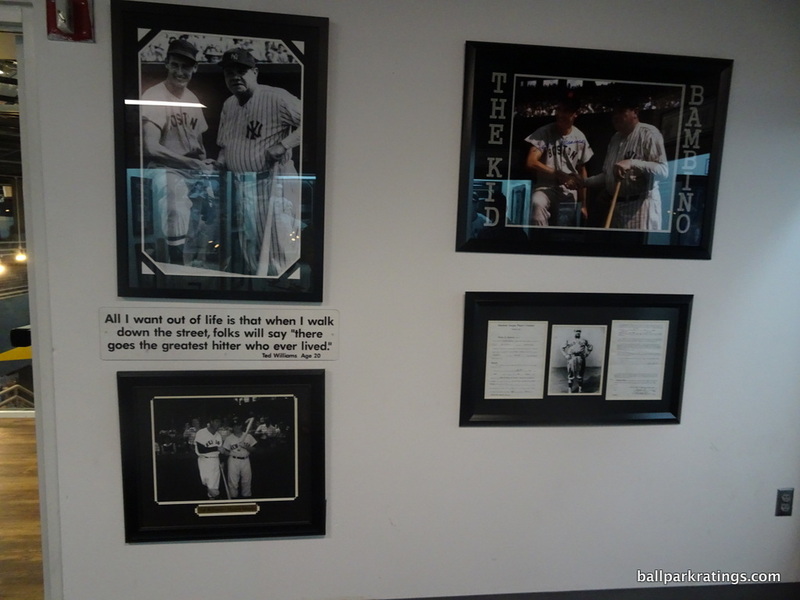 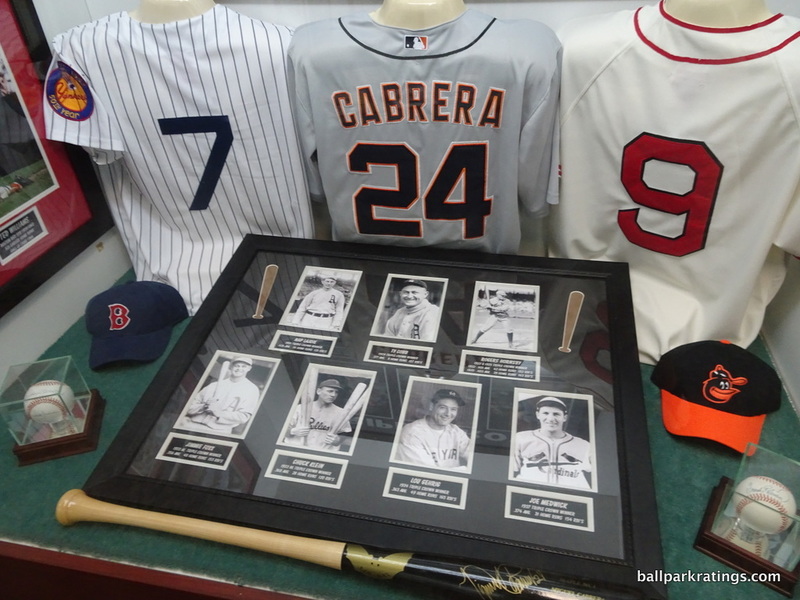 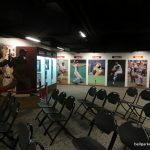 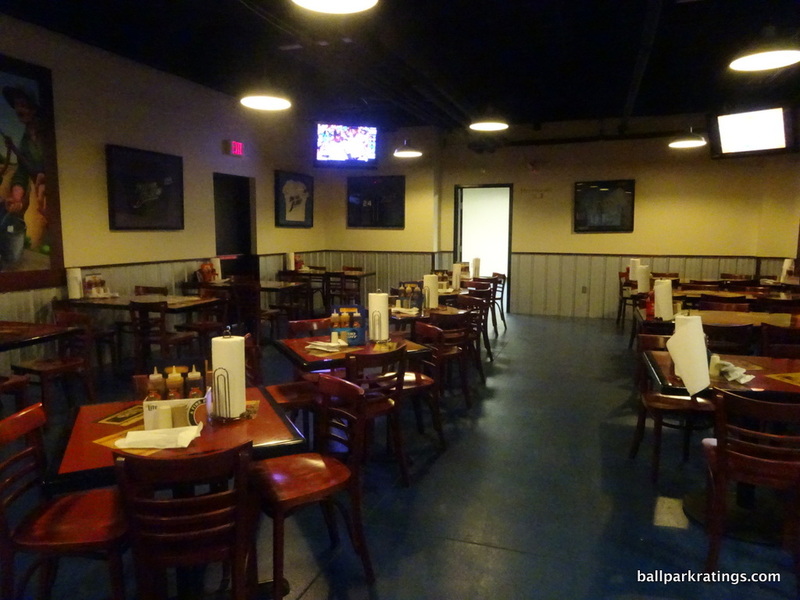 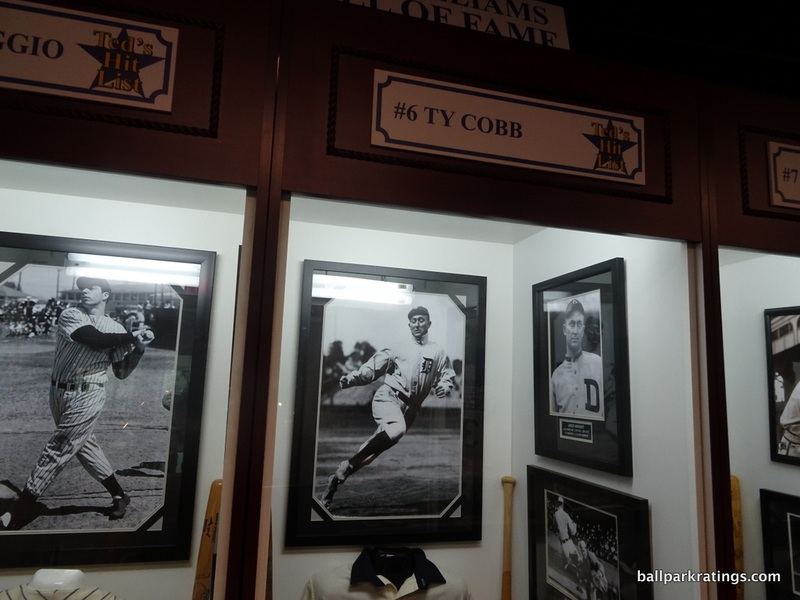 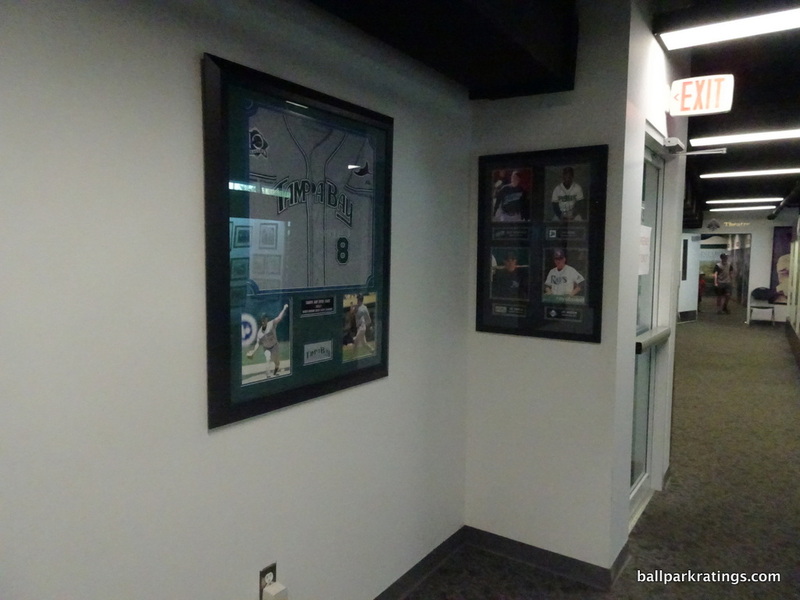 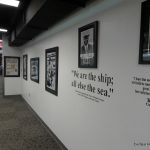 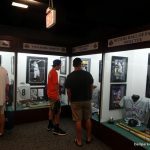 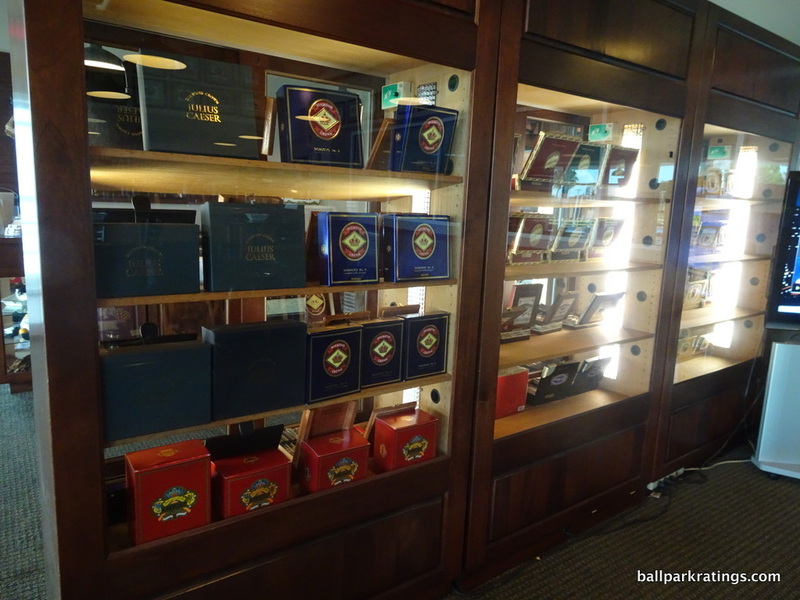 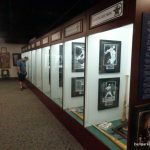 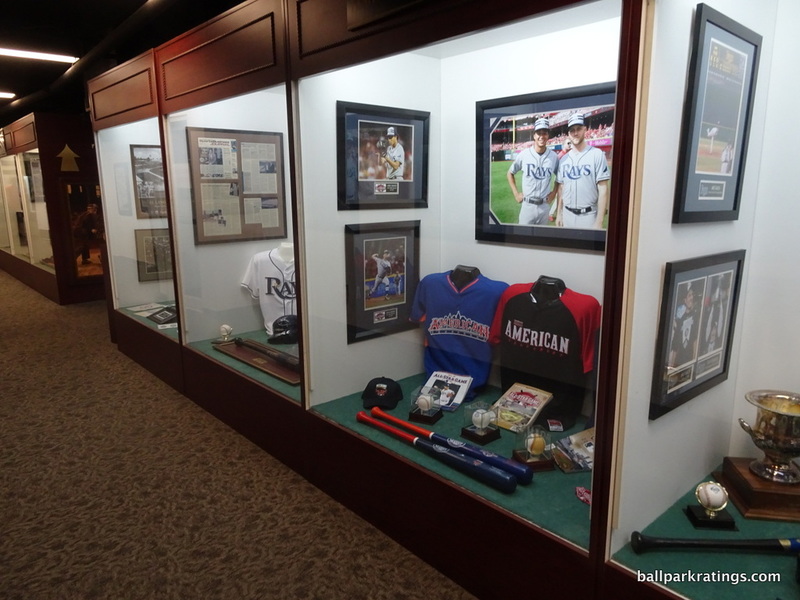 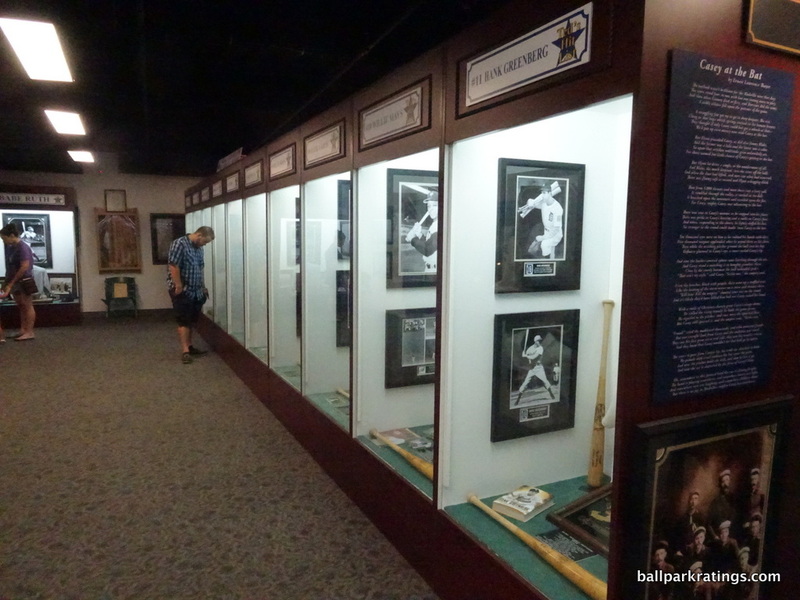 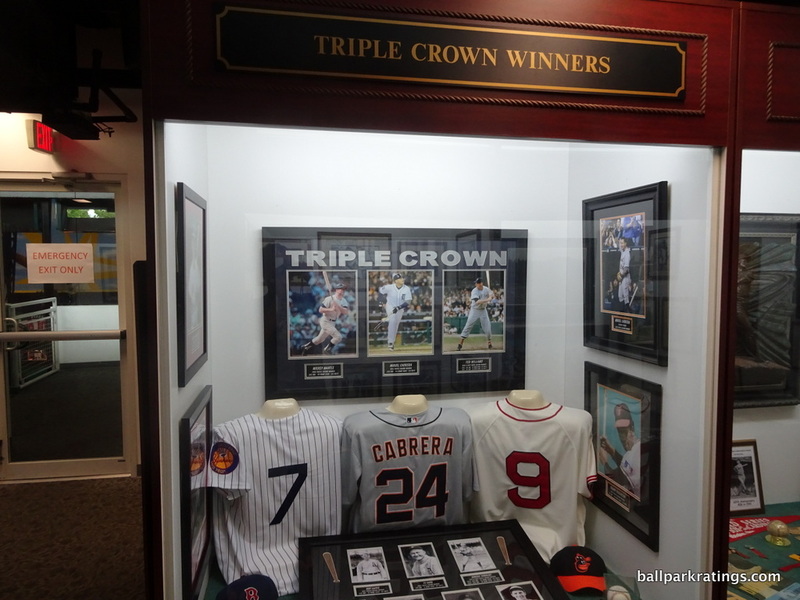 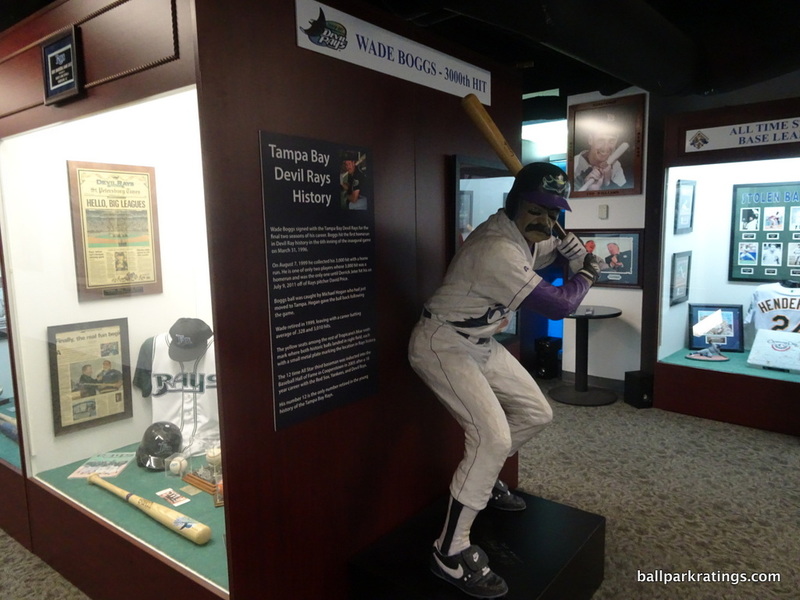 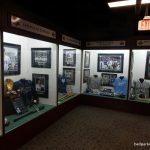 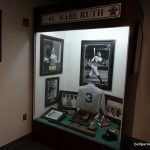 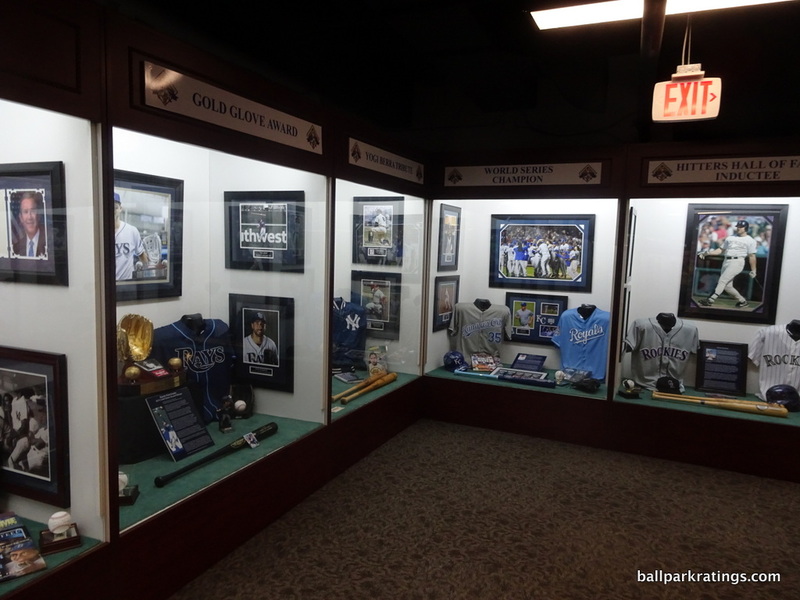 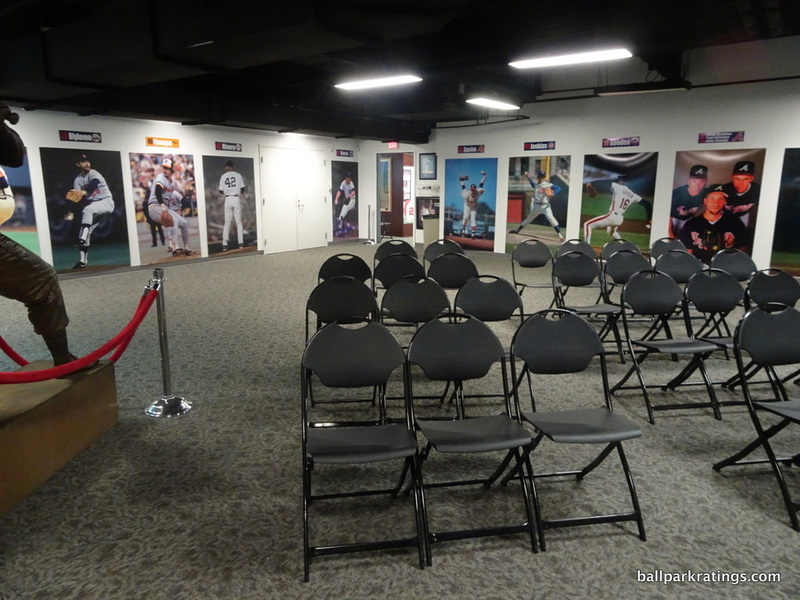 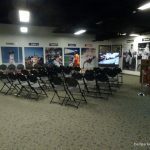 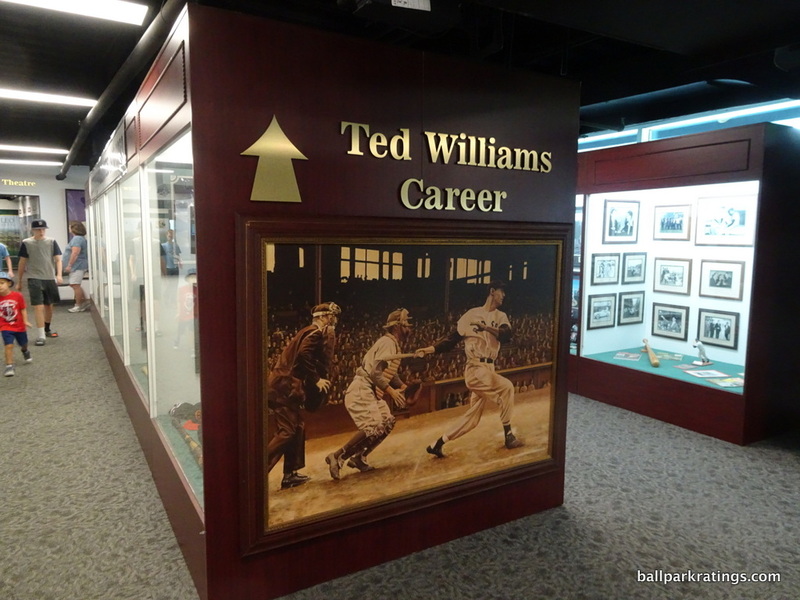 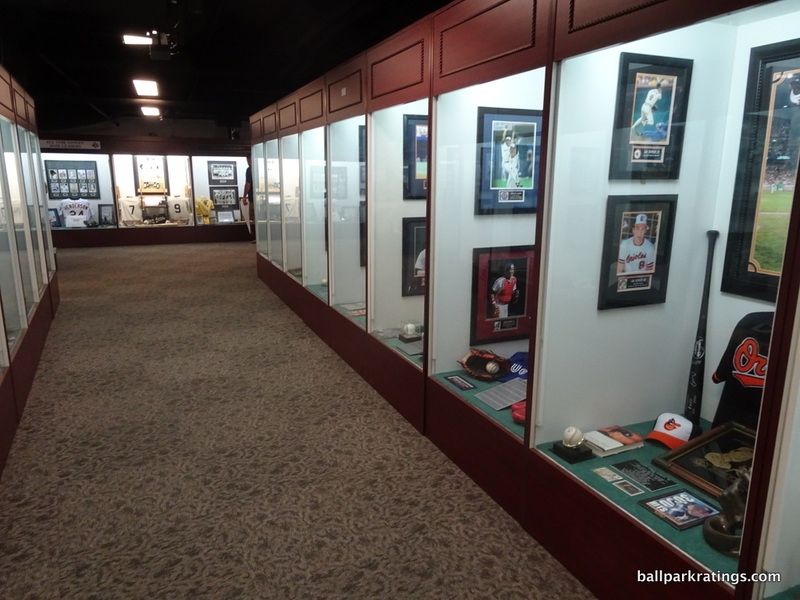 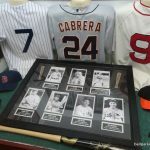 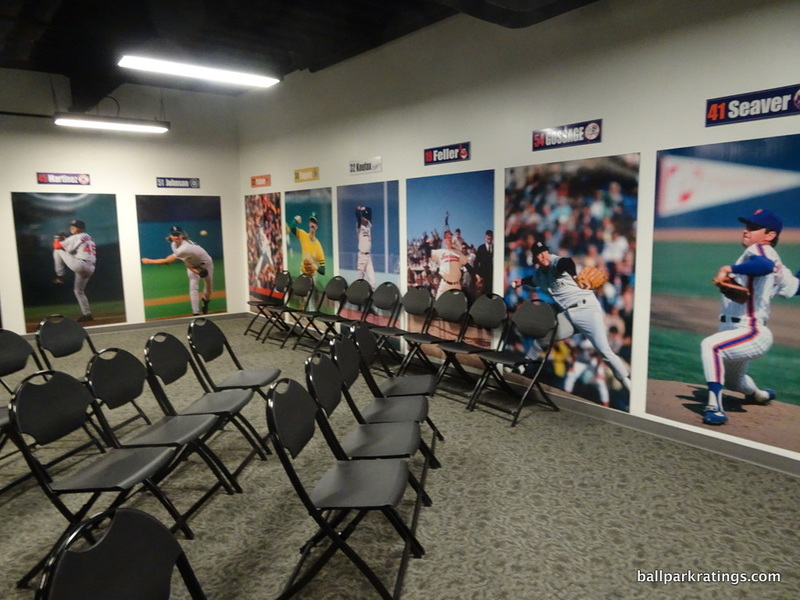 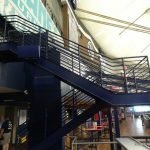 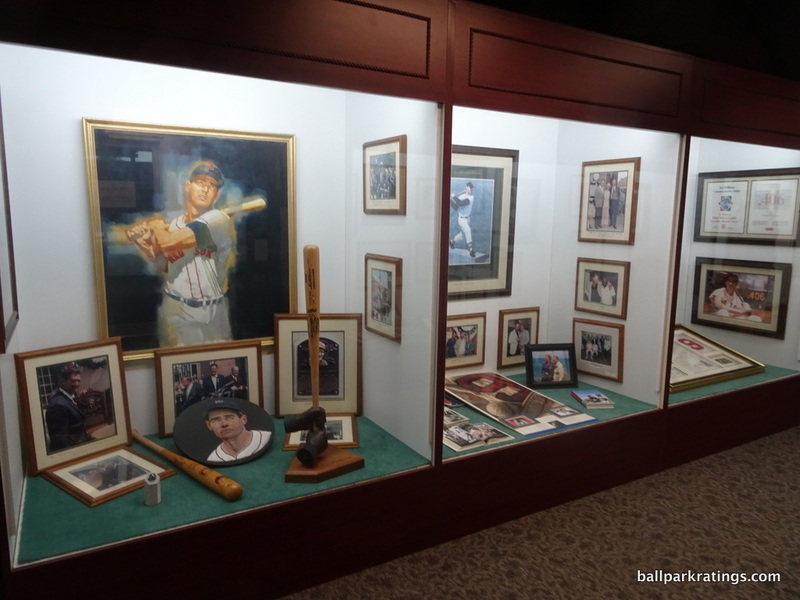 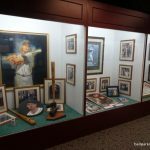 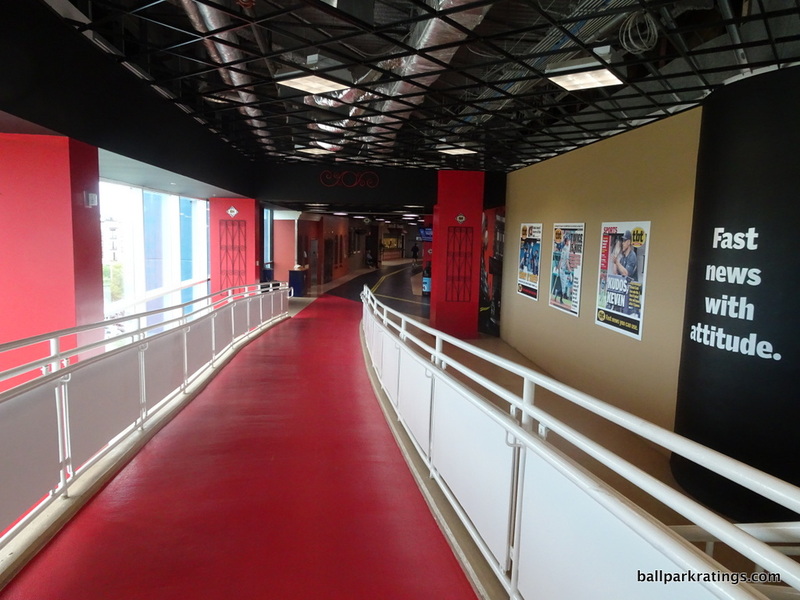 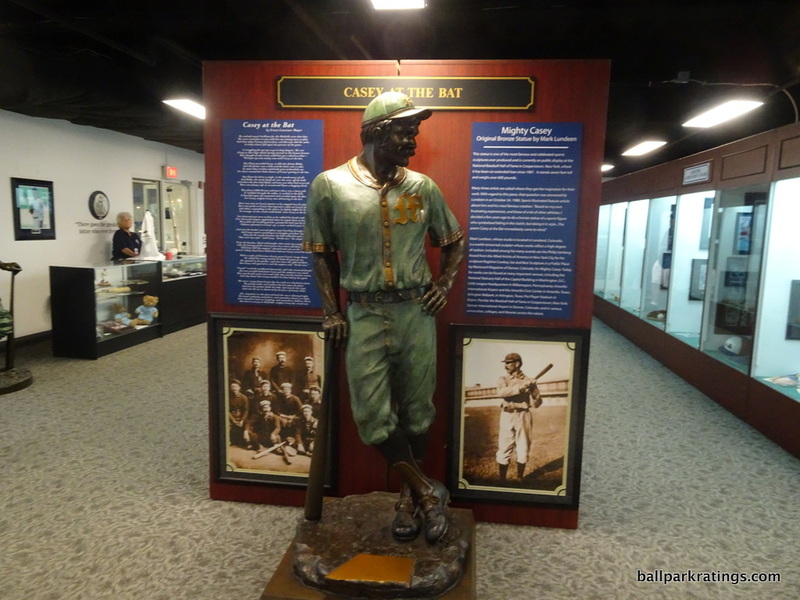 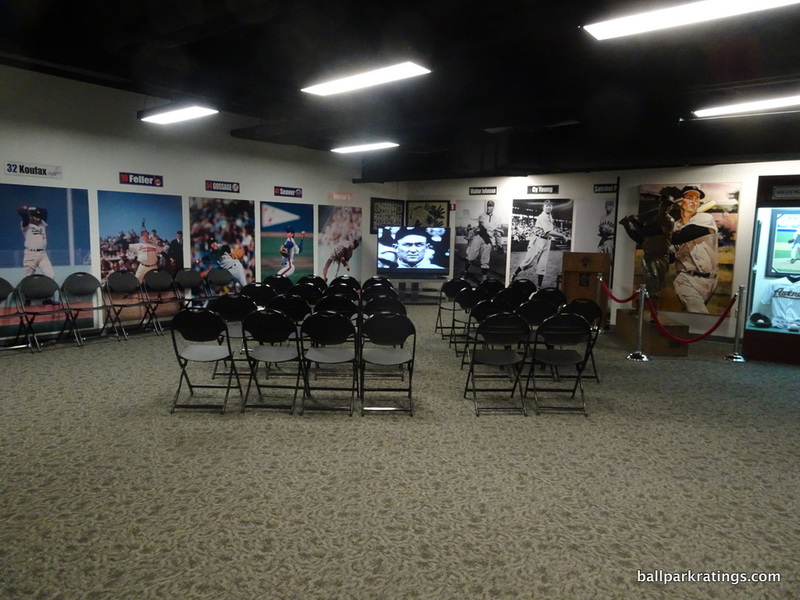 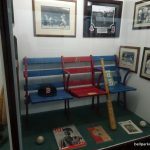 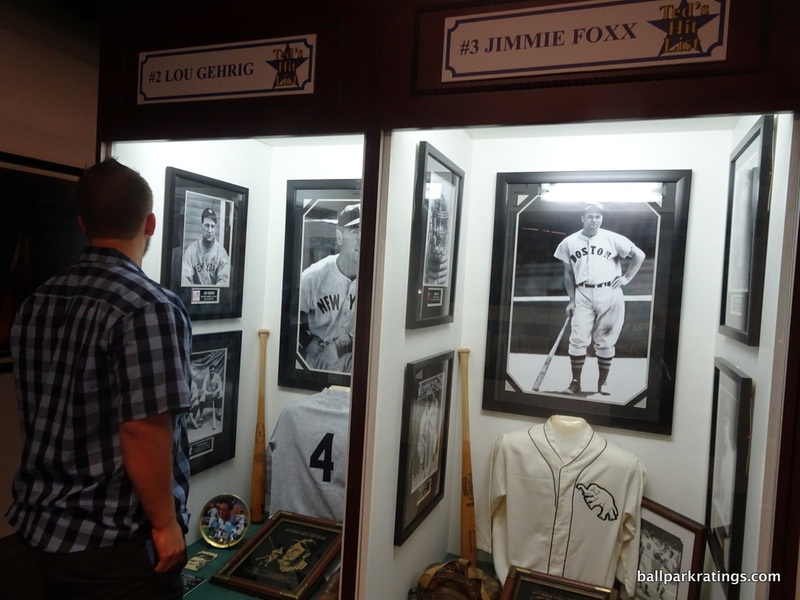 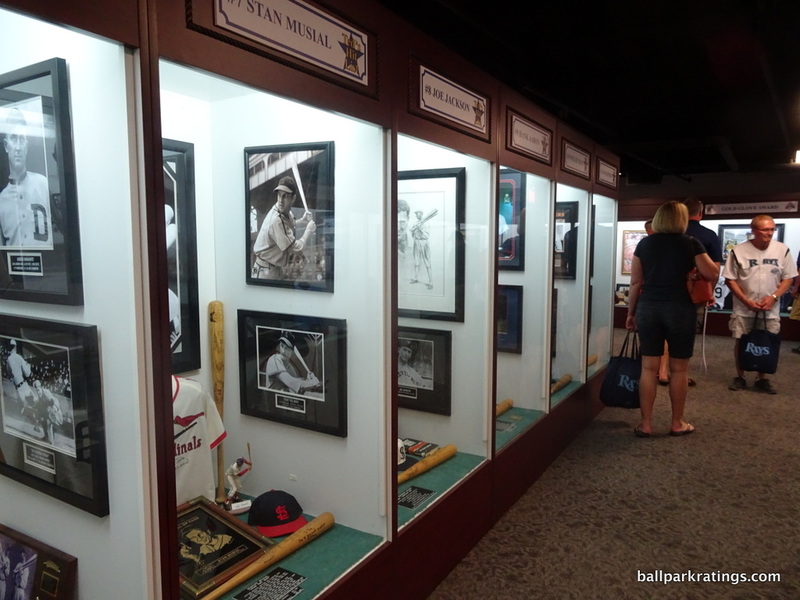 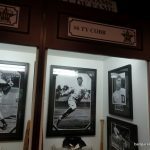 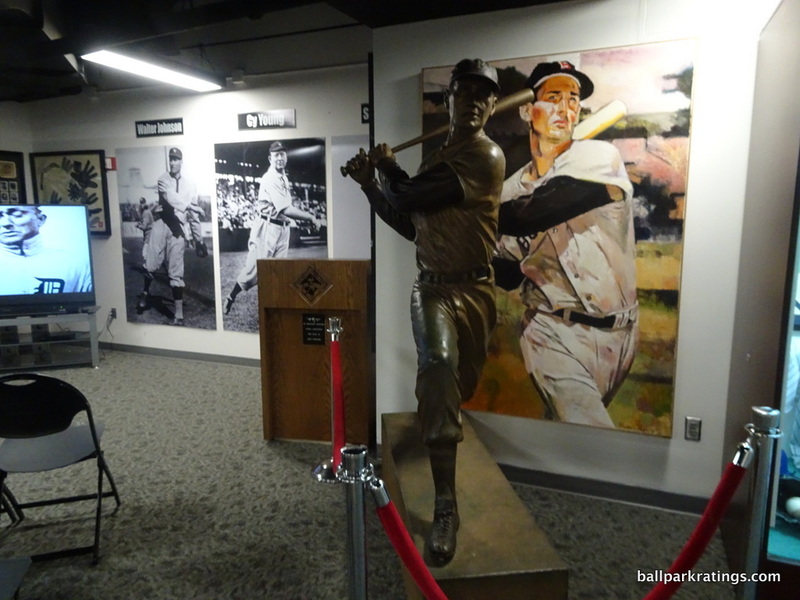 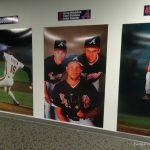 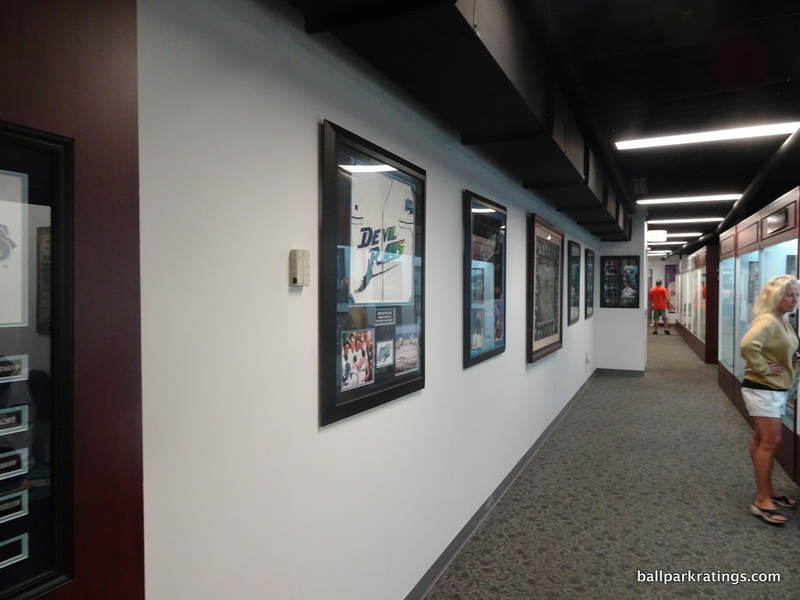 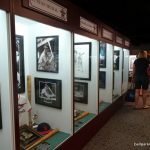 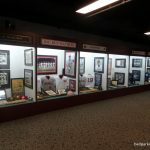 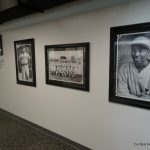 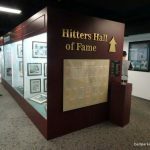 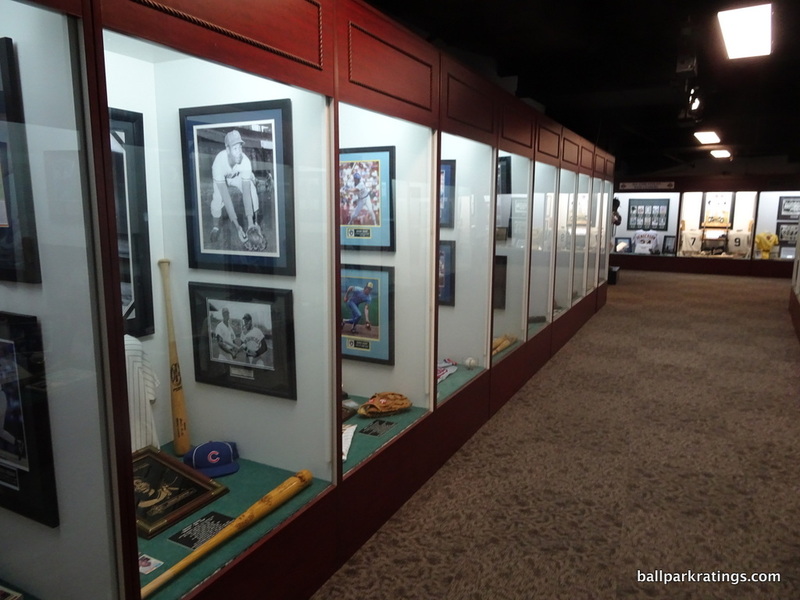 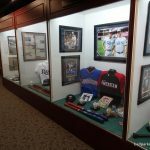 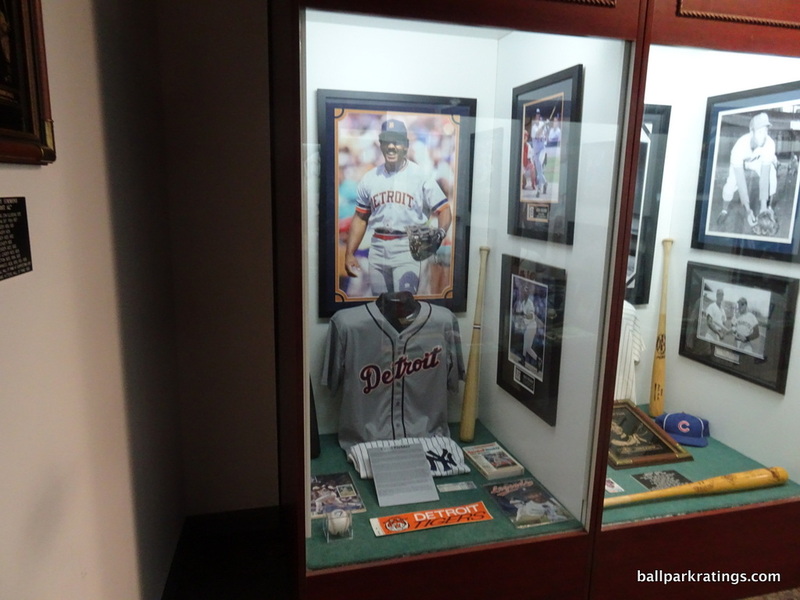 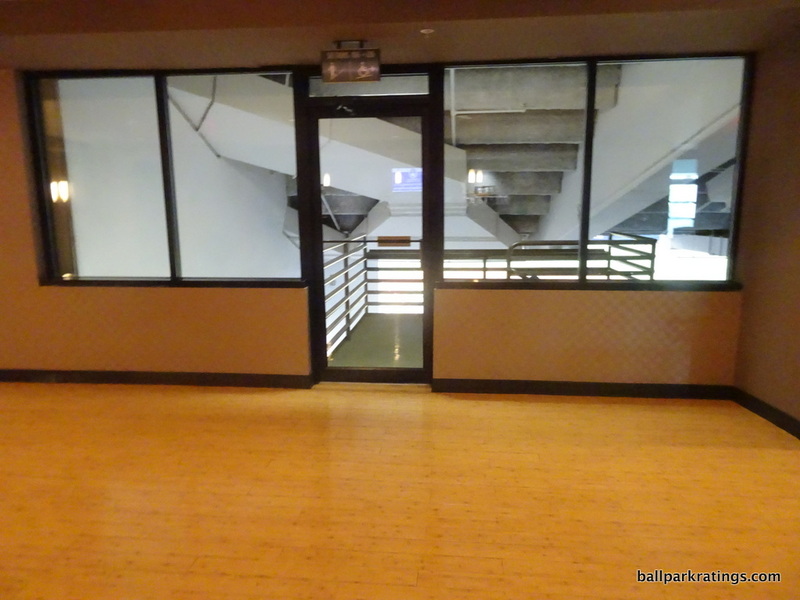 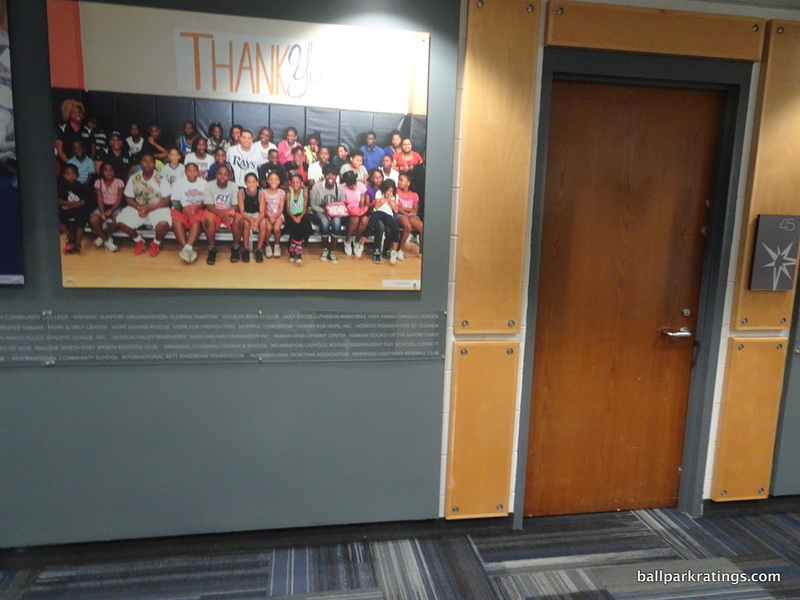 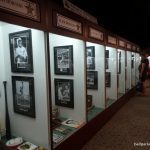 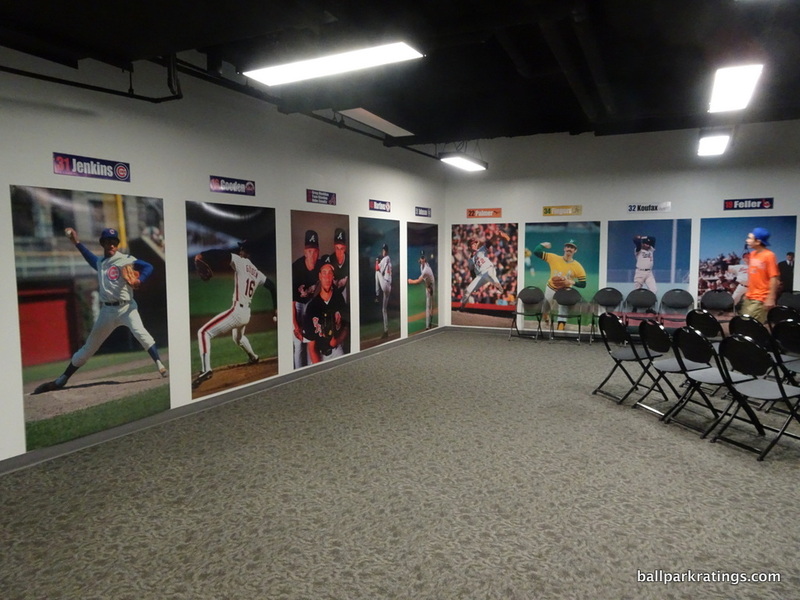 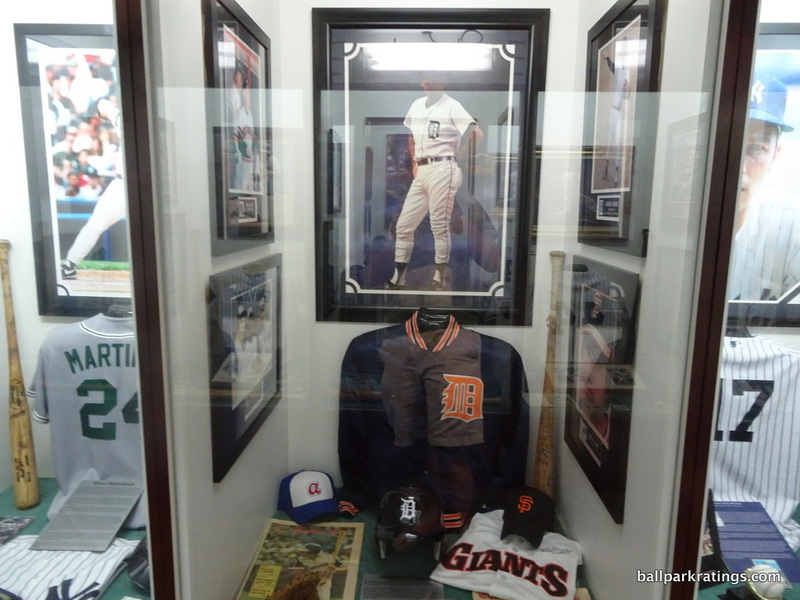 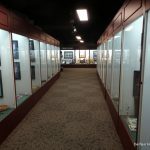 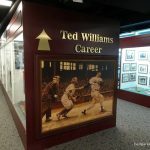 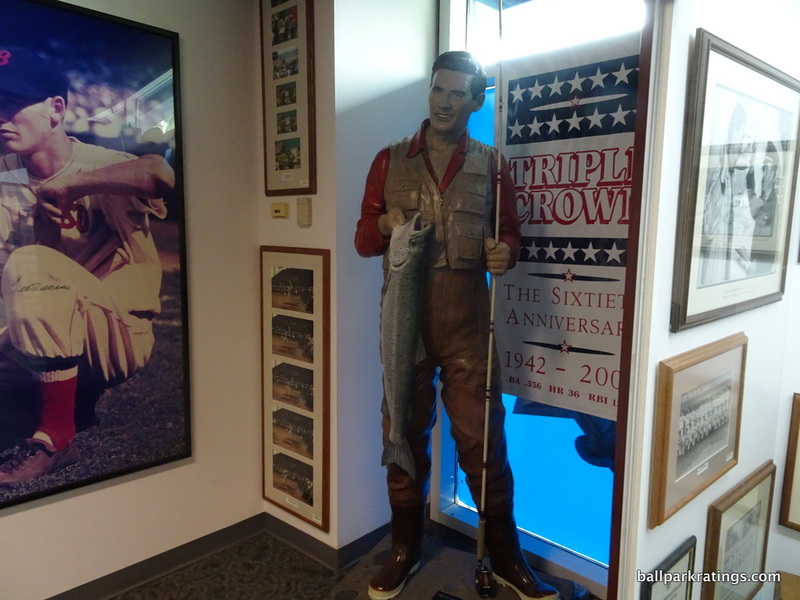 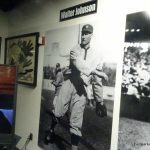 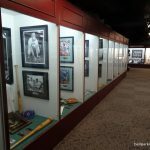 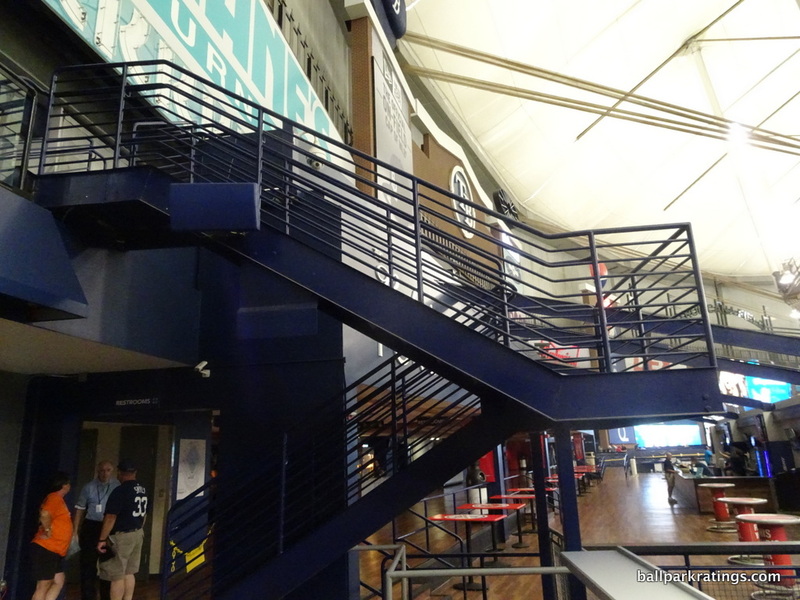 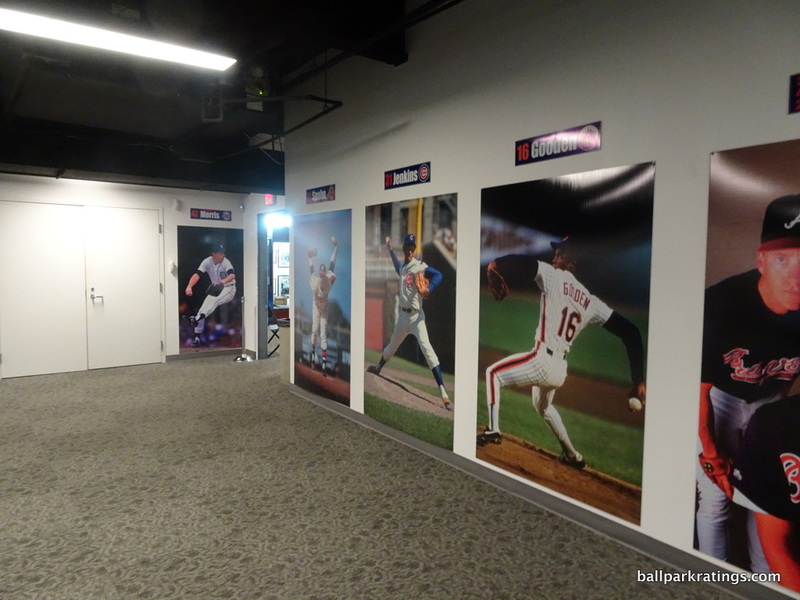 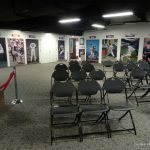 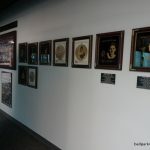 Then, take a short stroll over to the Ted Williams Museum and Hitters’ Hall of Fame. 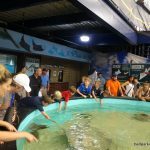 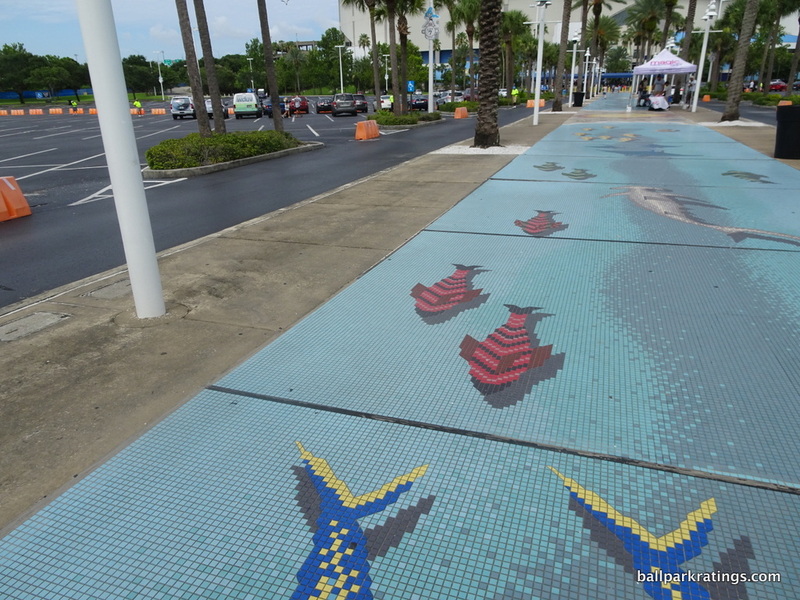 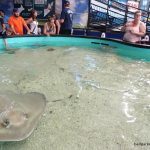 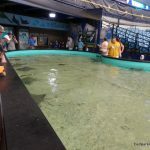 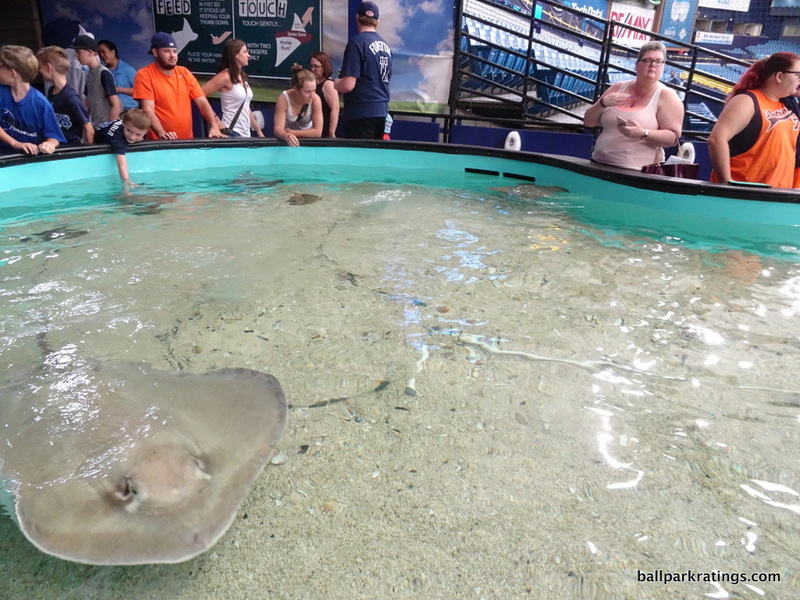 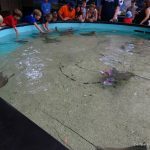 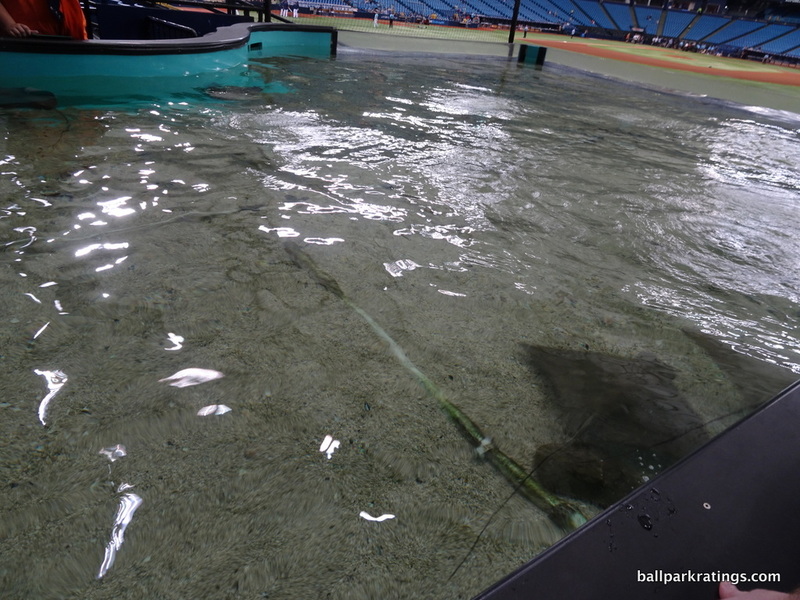 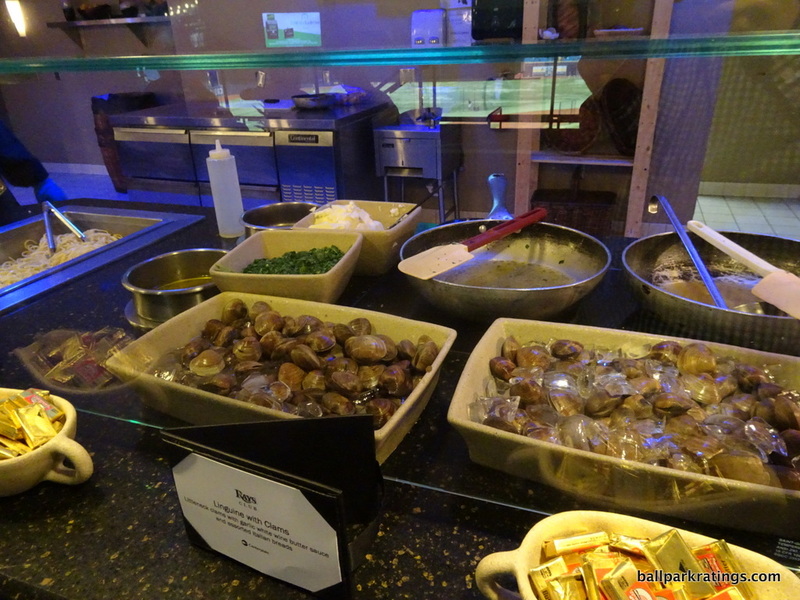 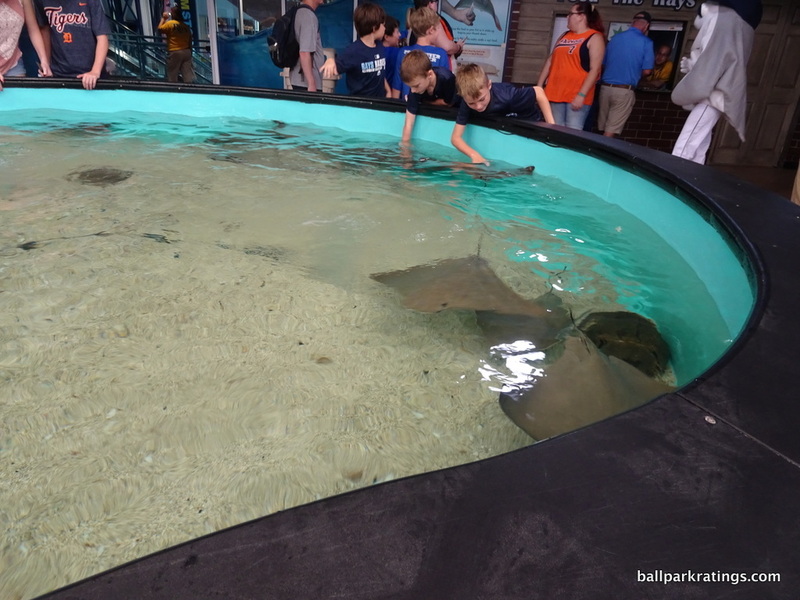 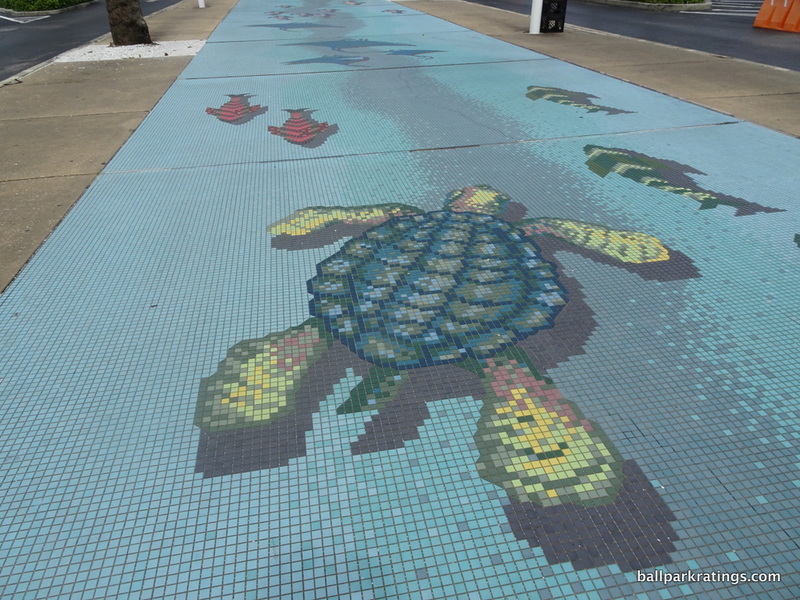 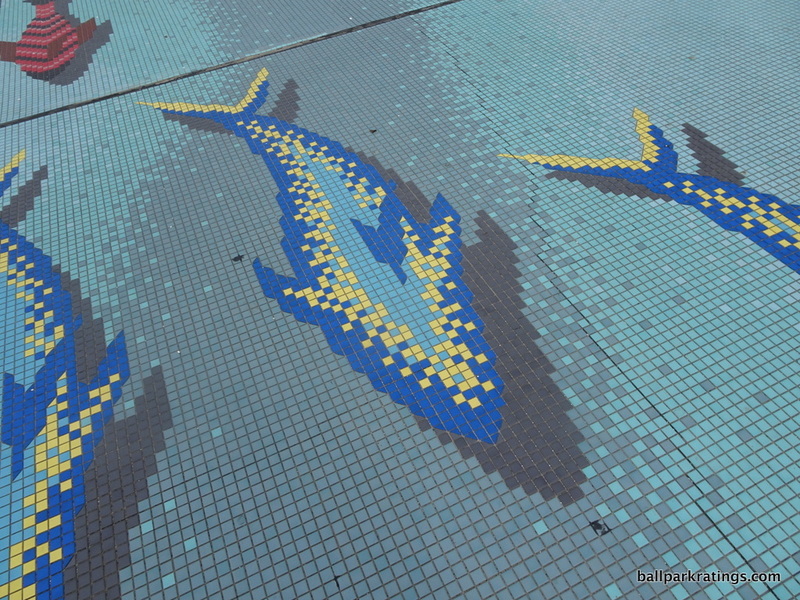 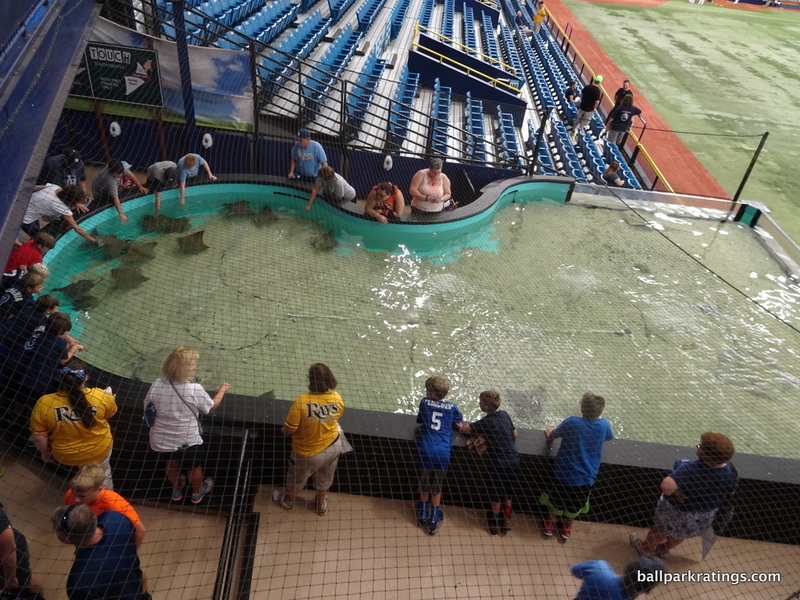 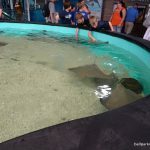 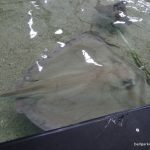 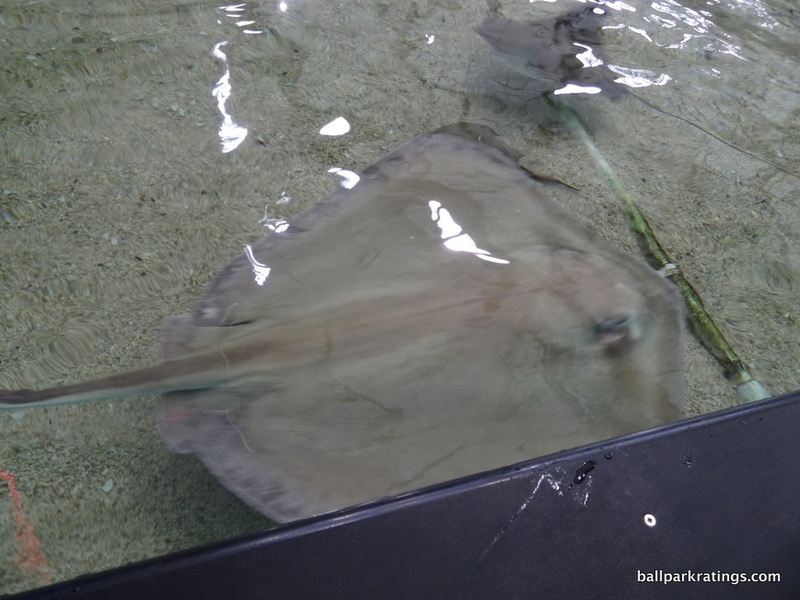 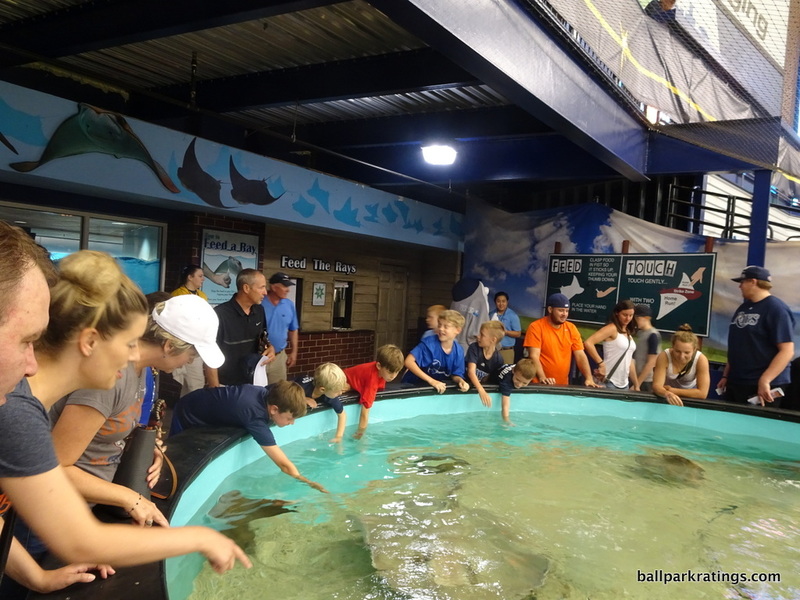 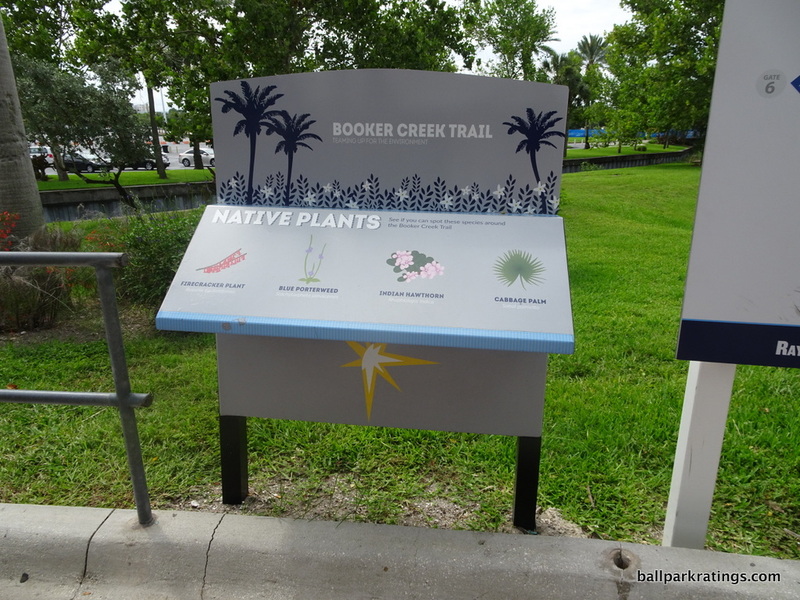 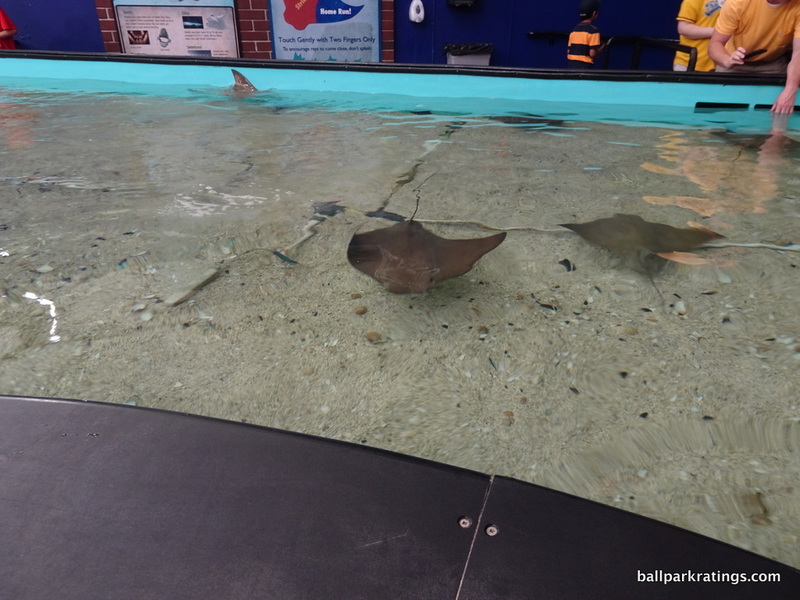 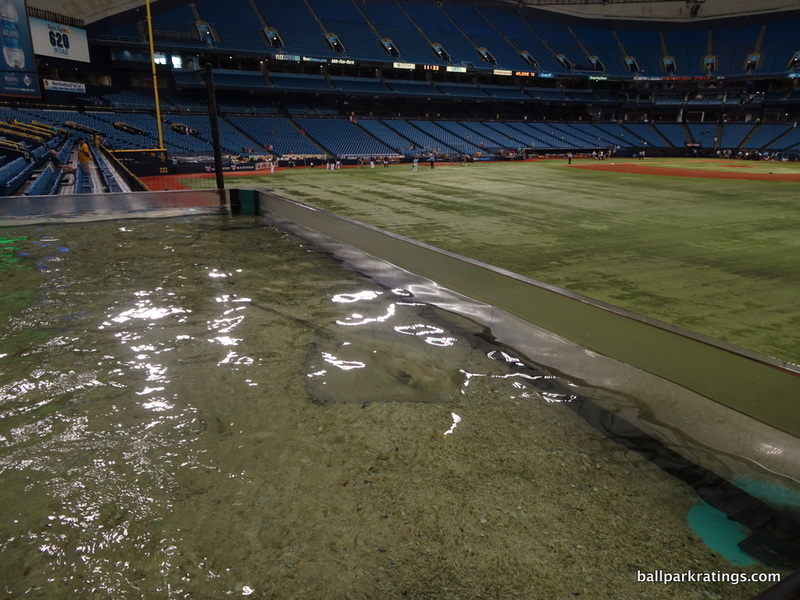 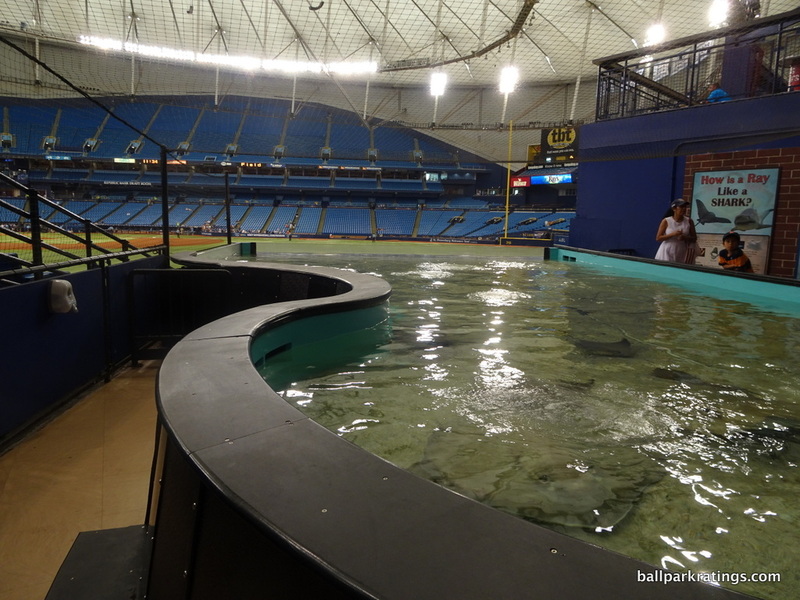 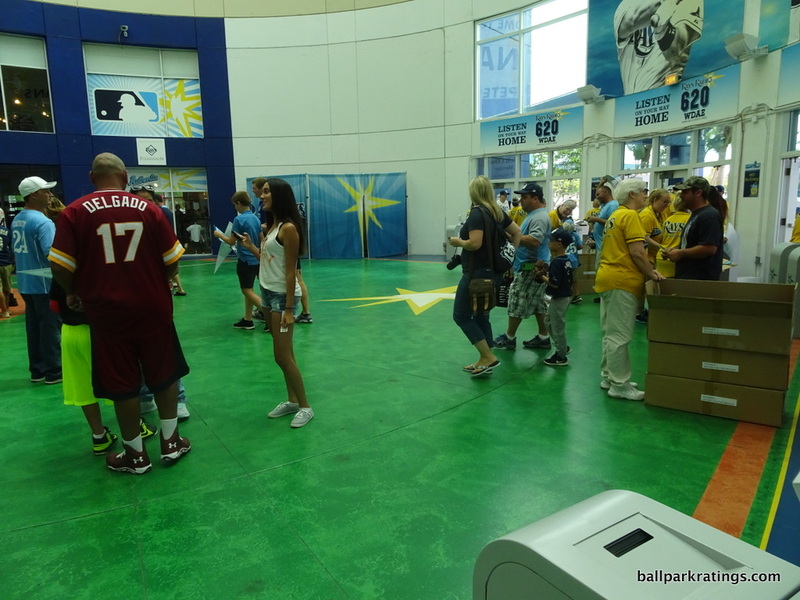 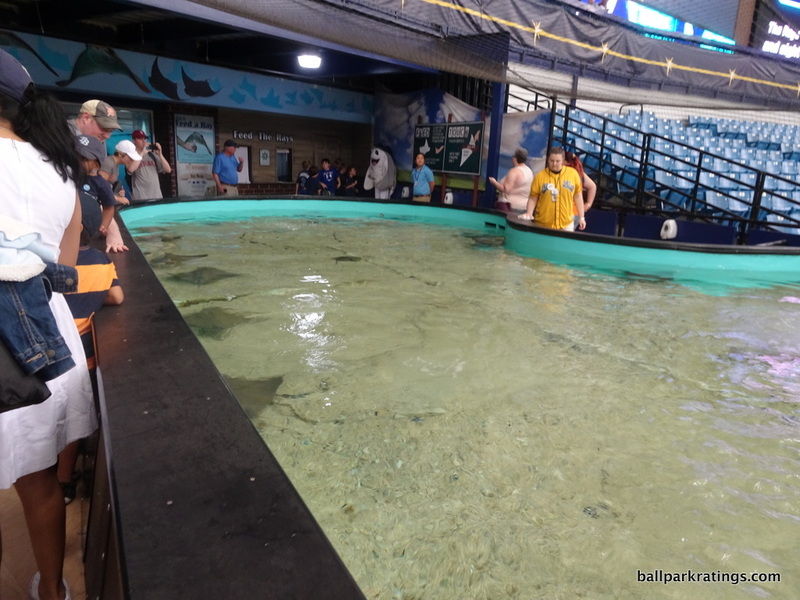 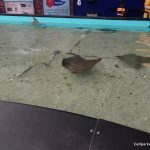 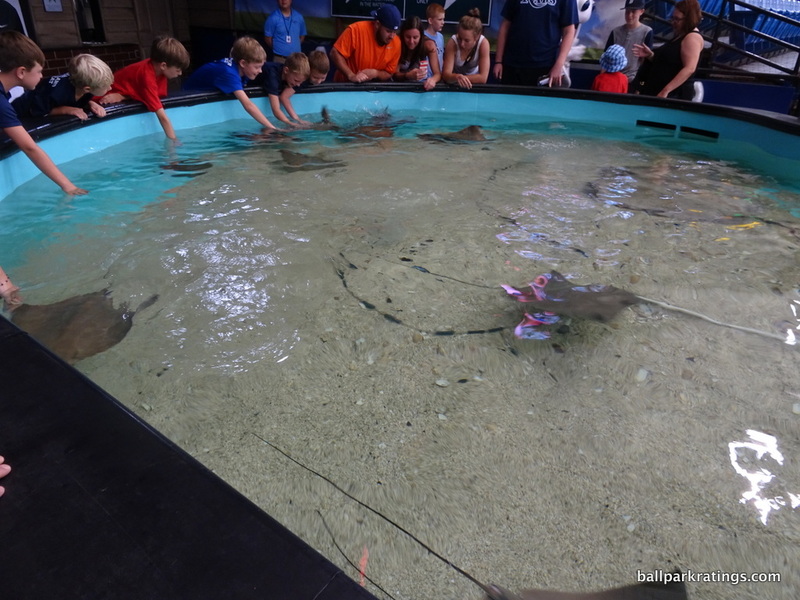 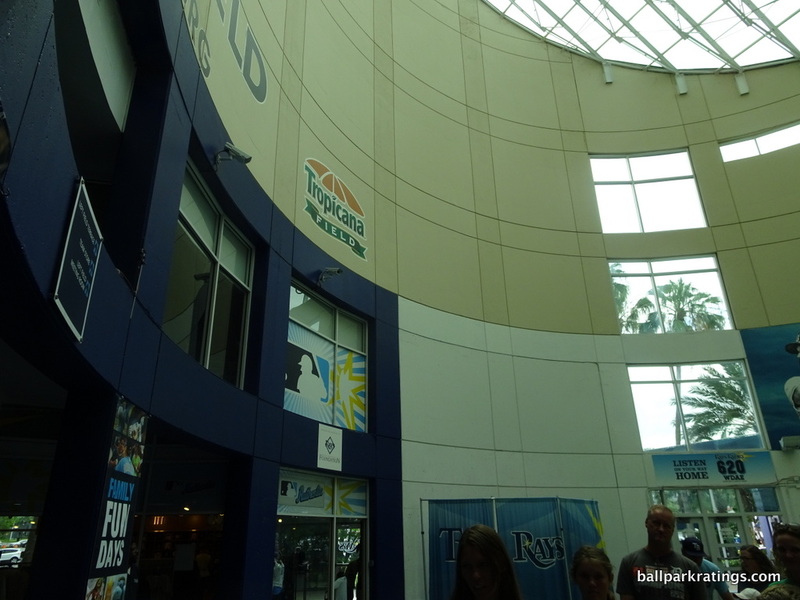 You can also head to the Rays Touch Tank if you’re so inclined. 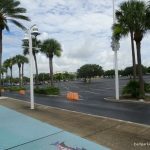 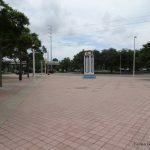 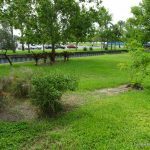 Sure, Tropicana probably doesn’t have the amenities of the better post-1991 parks, but it’s clearly in the same conversation. 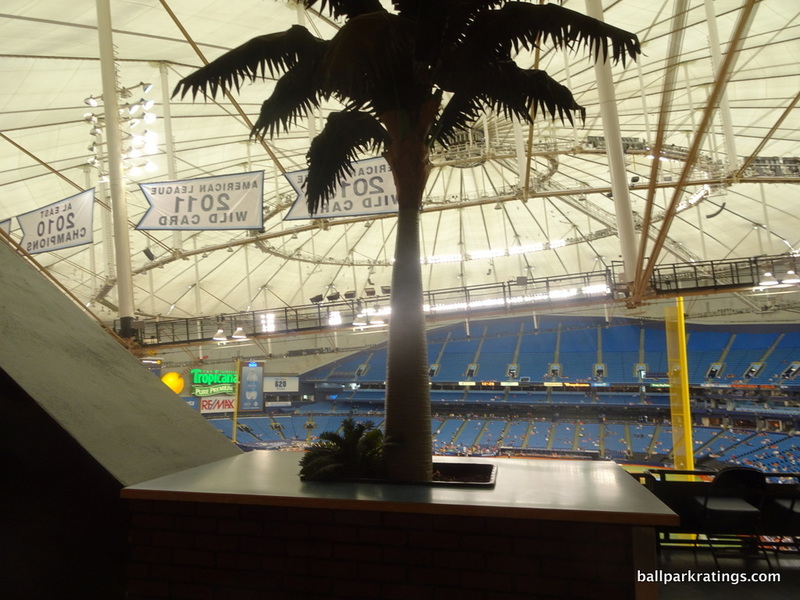 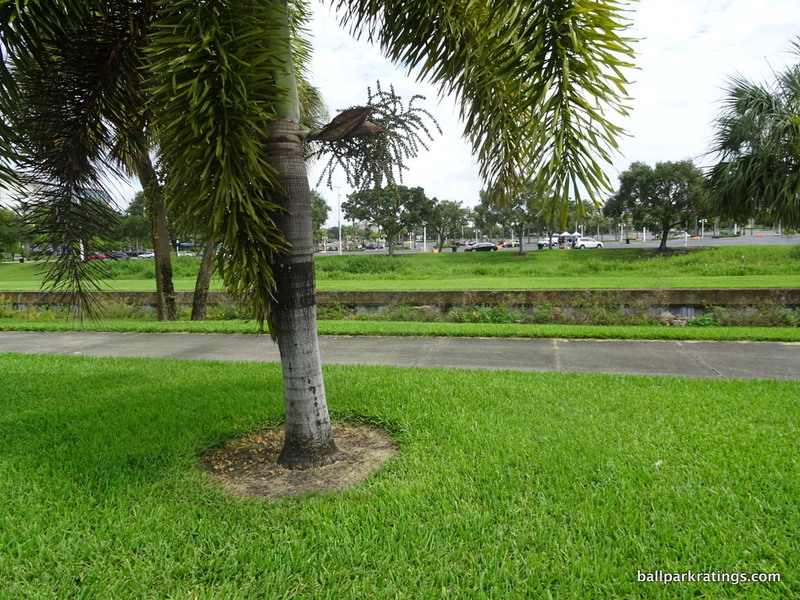 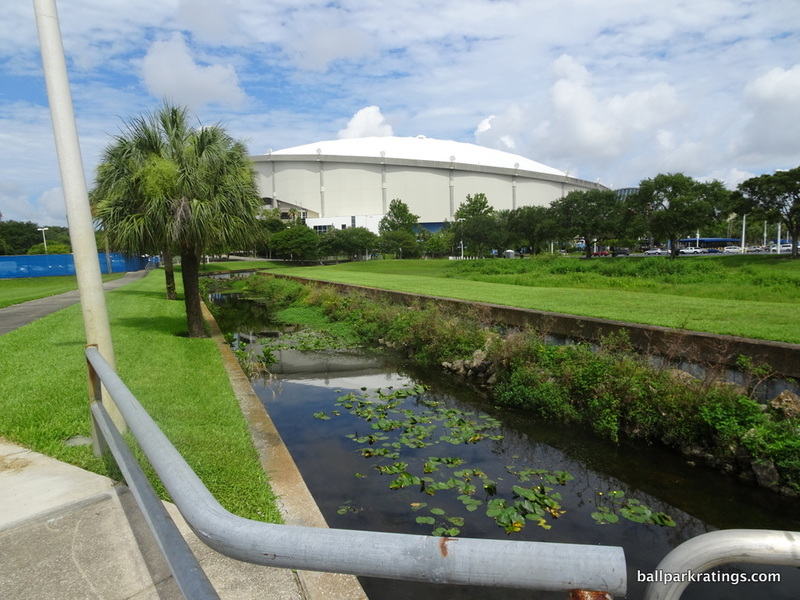 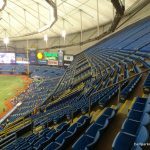 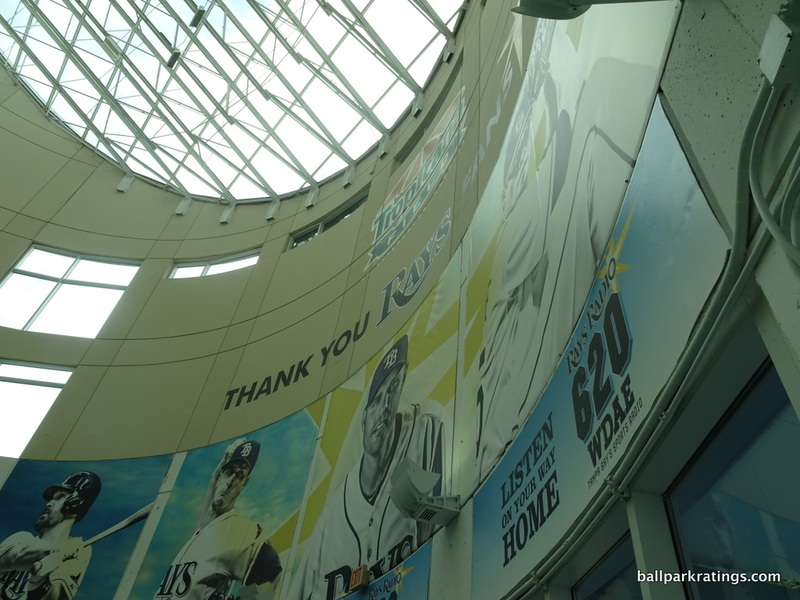 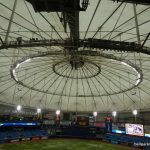 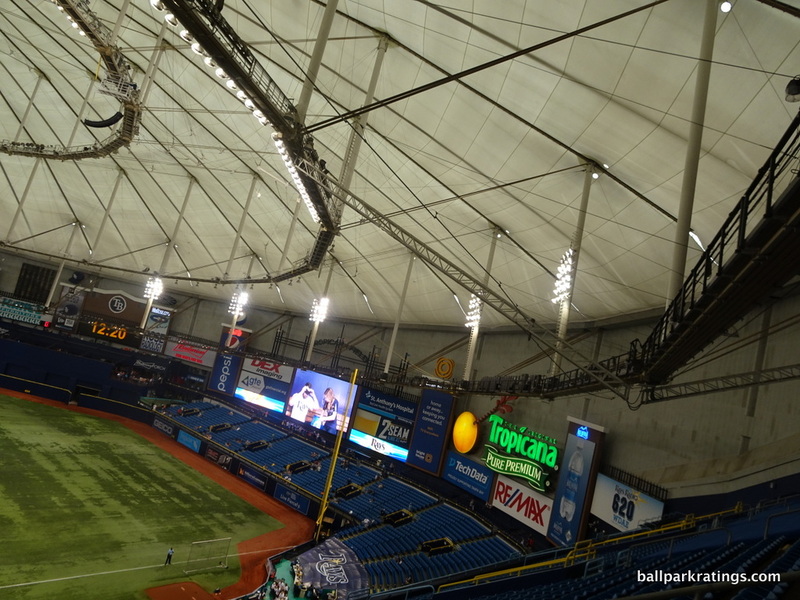 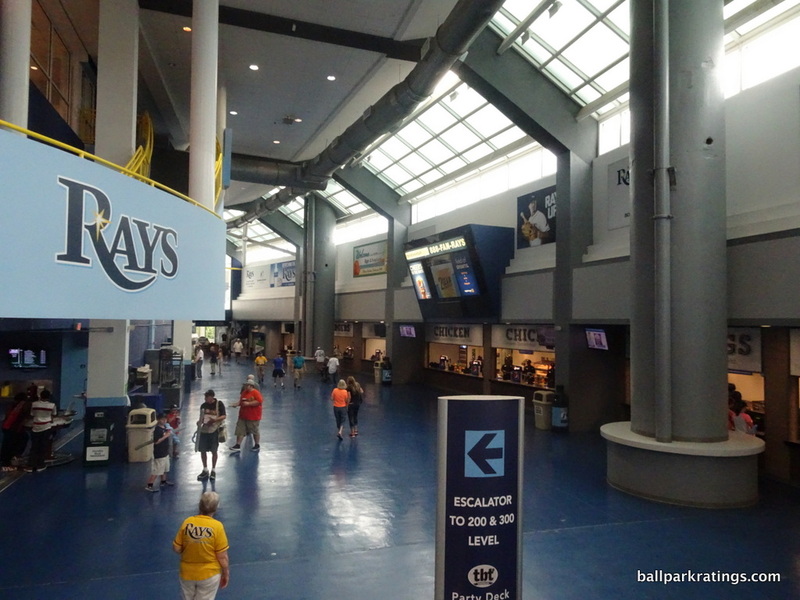 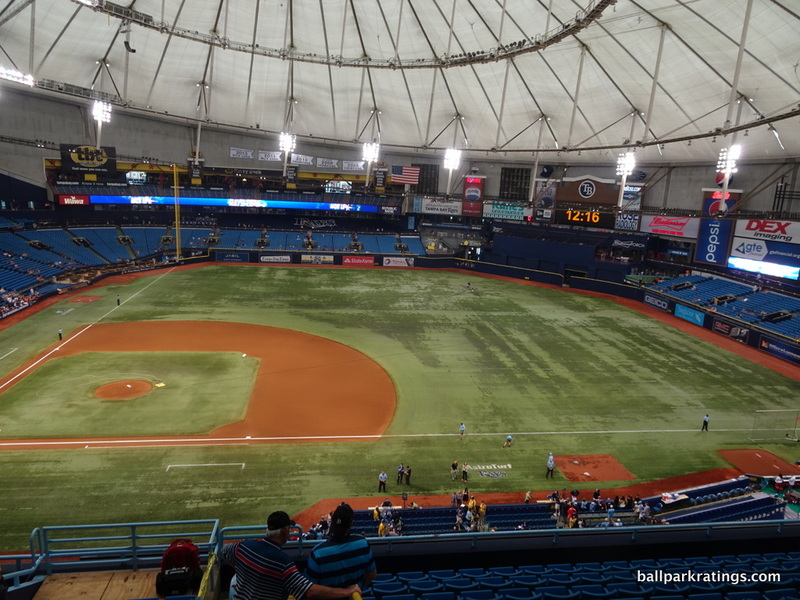 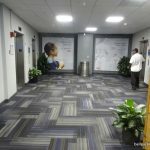 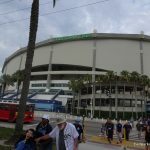 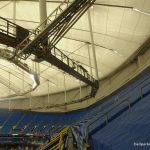 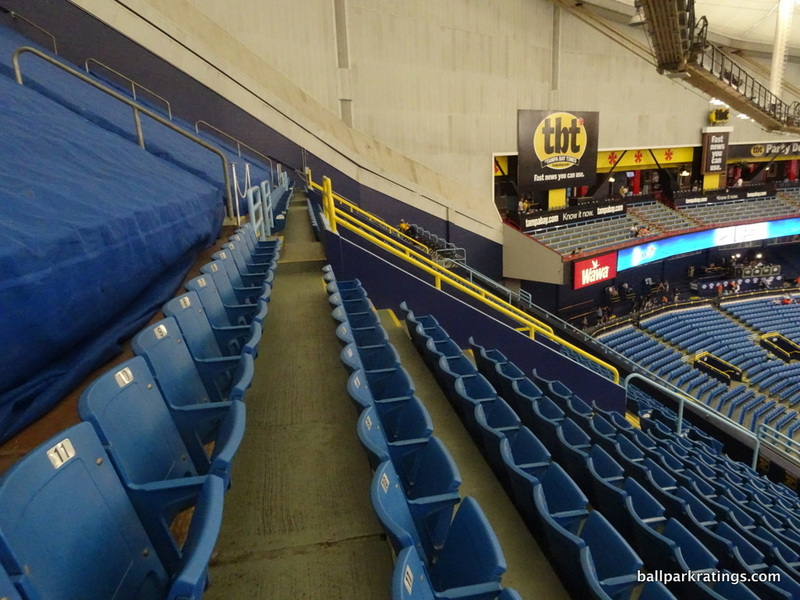 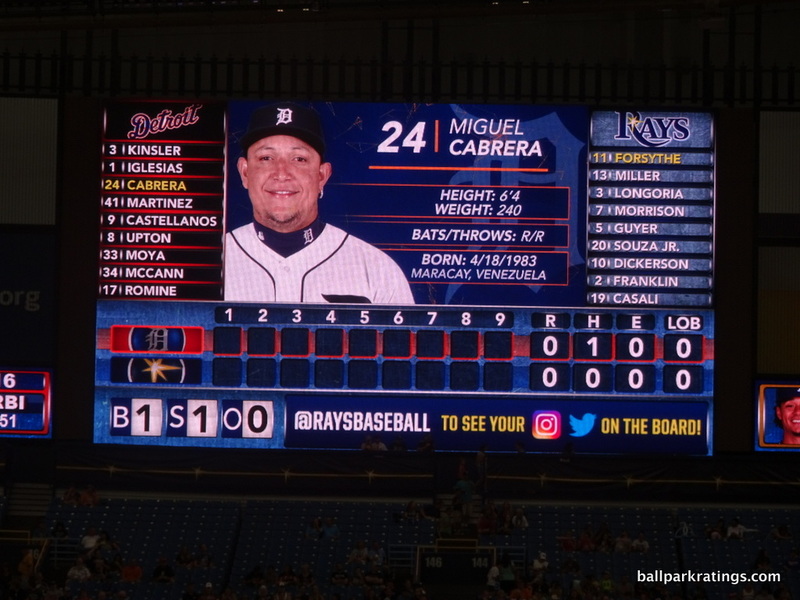 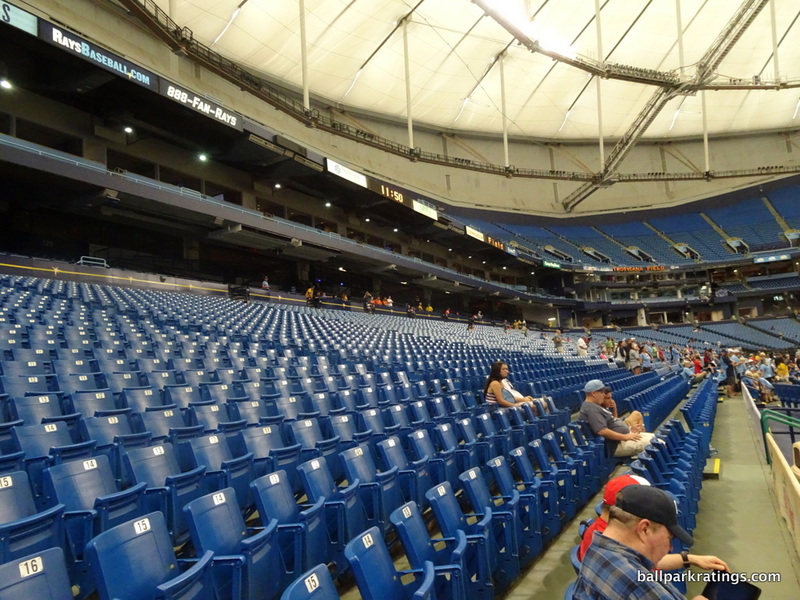 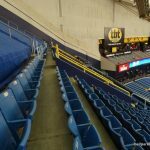 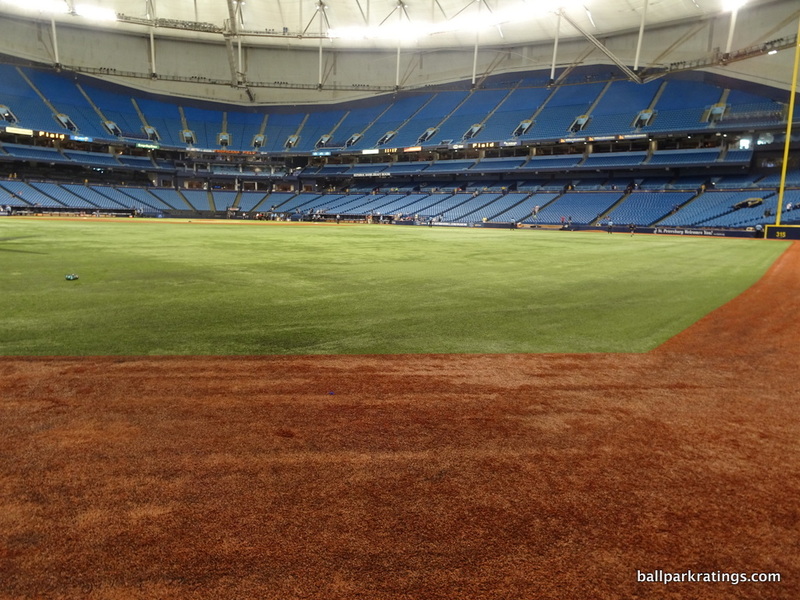 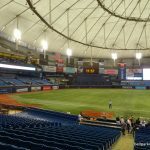 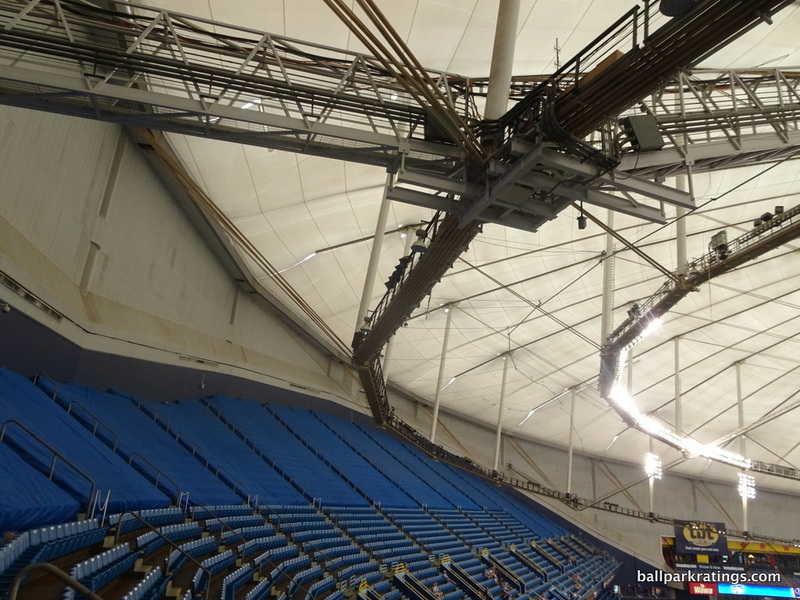 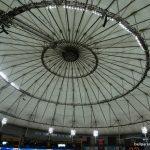 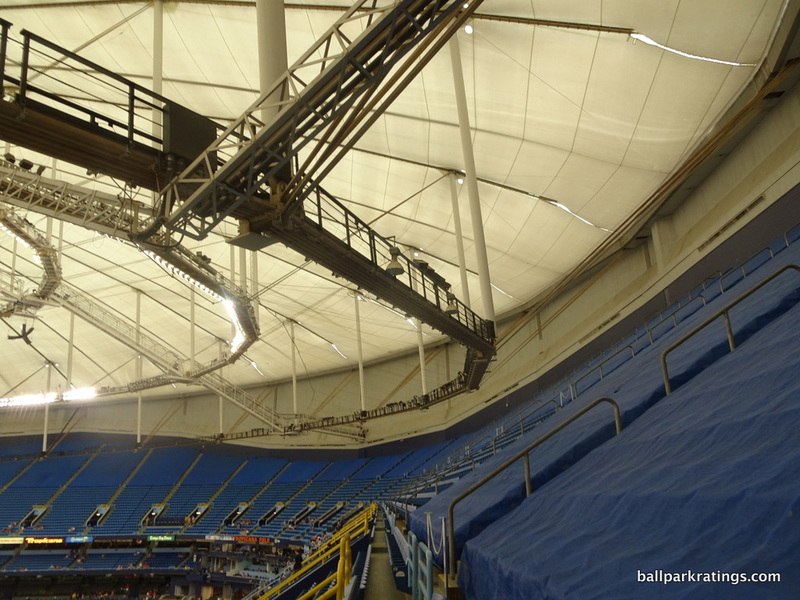 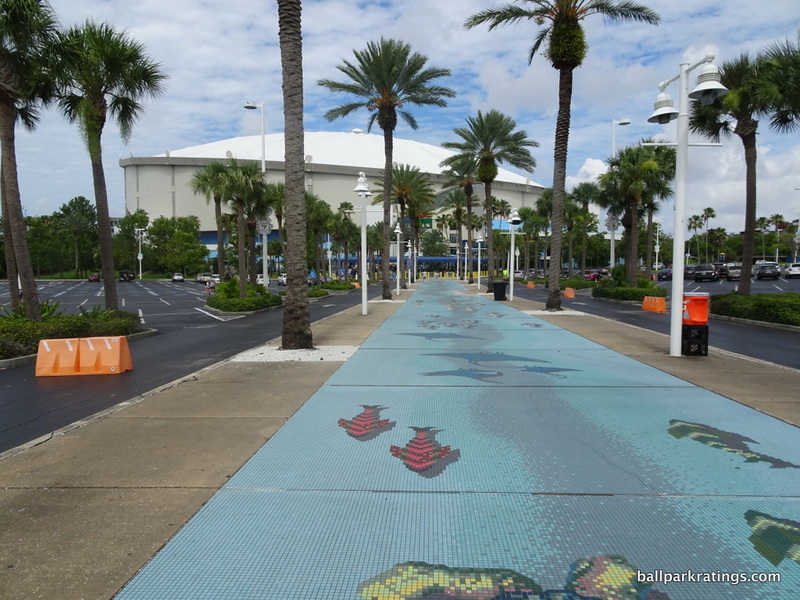 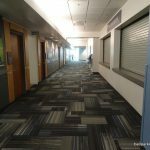 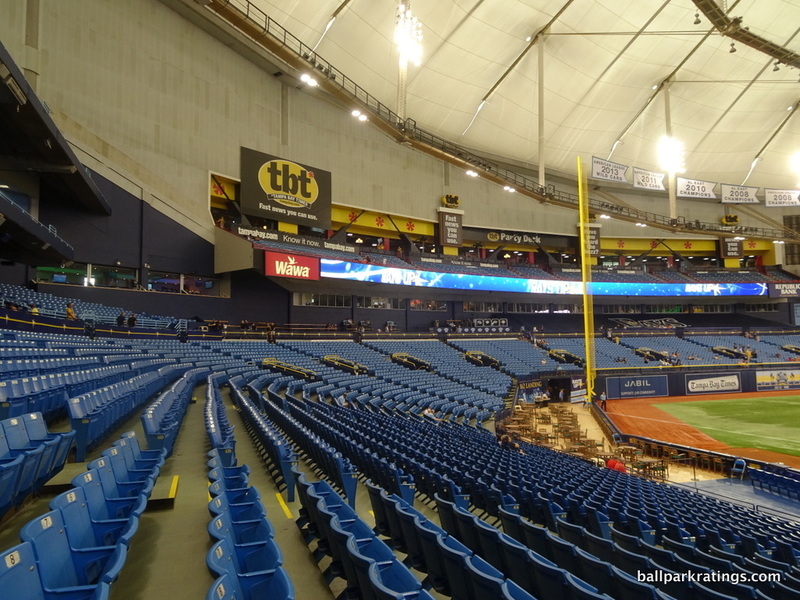 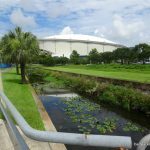 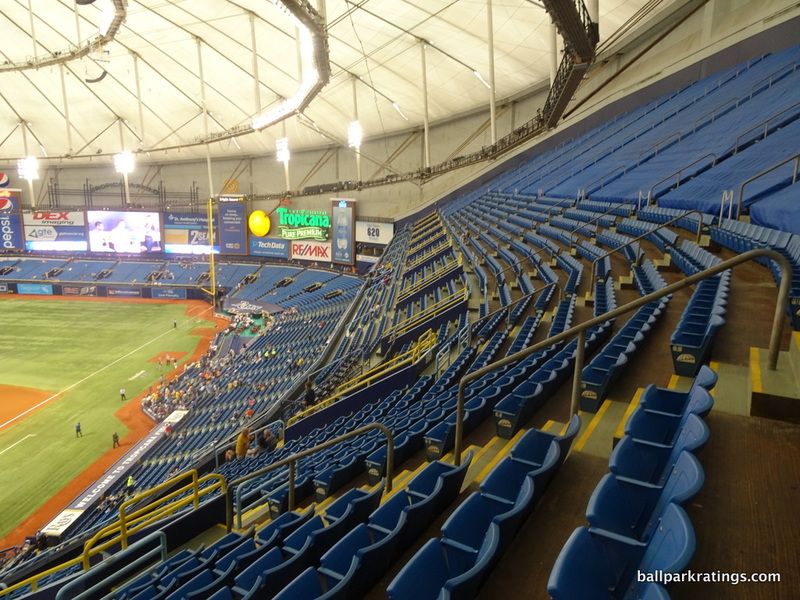 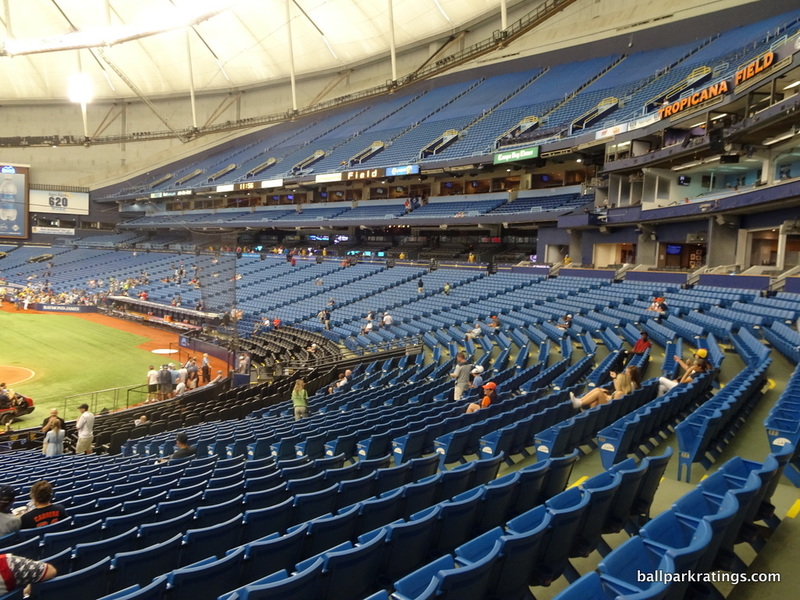 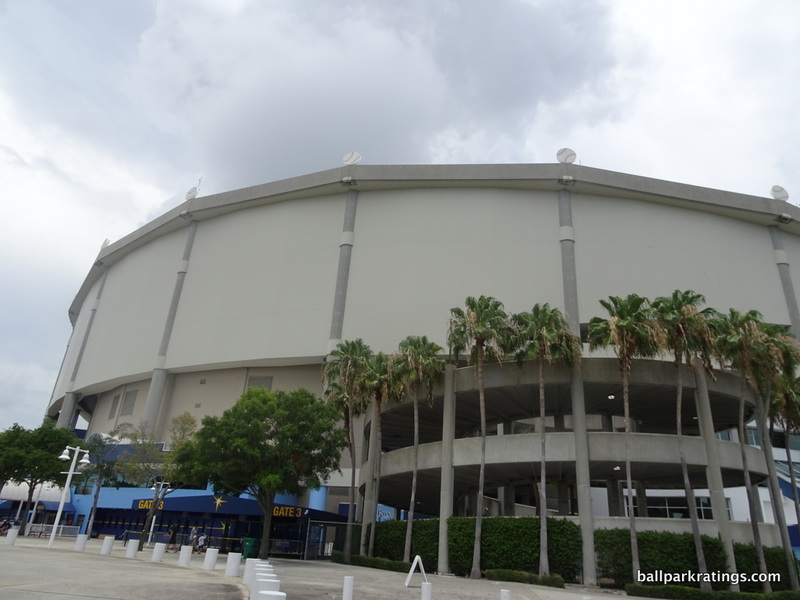 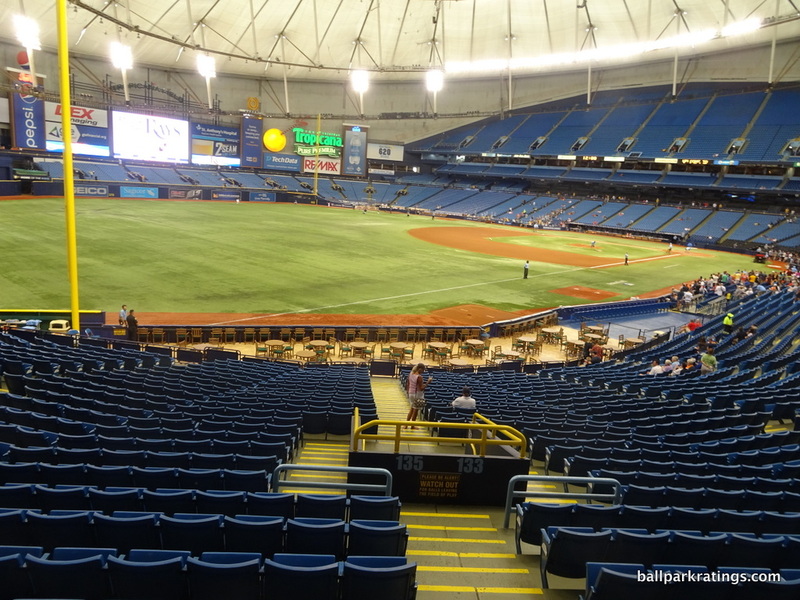 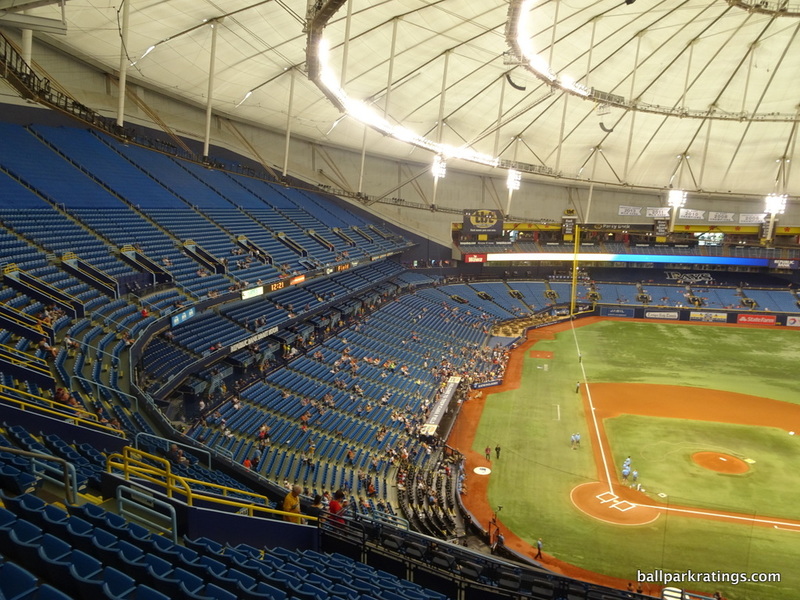 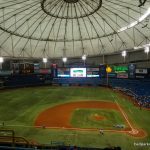 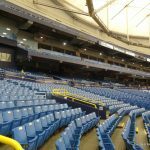 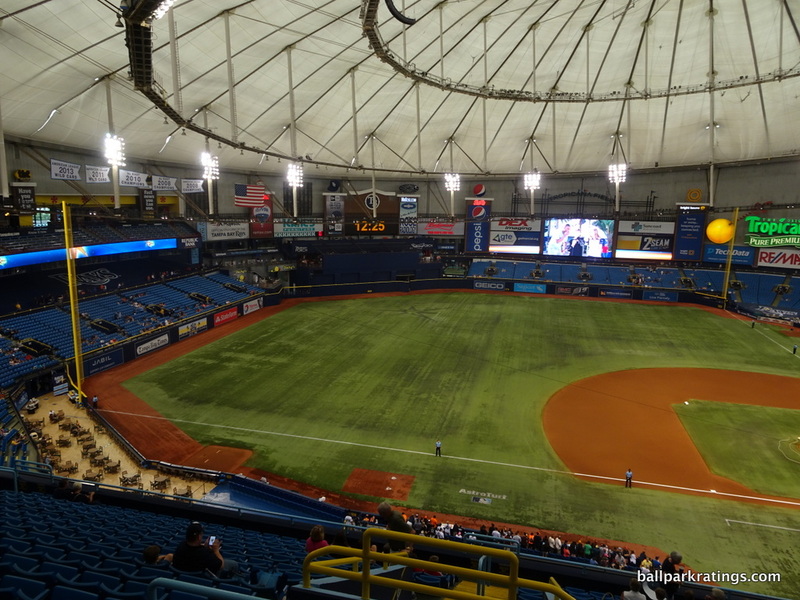 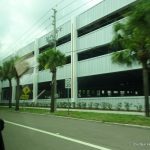 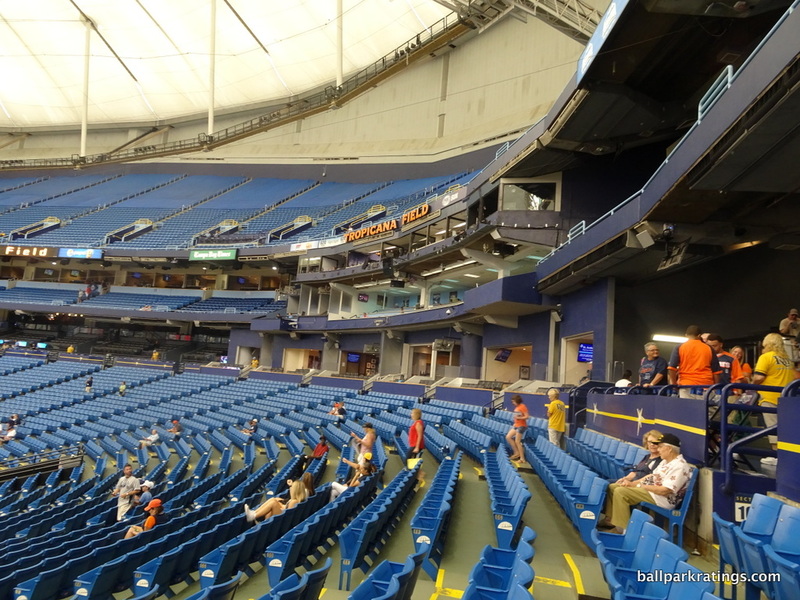 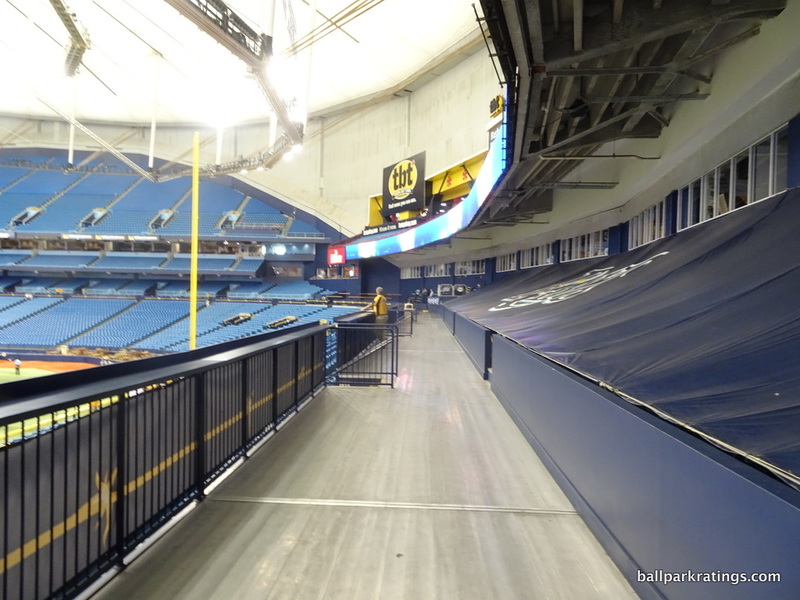 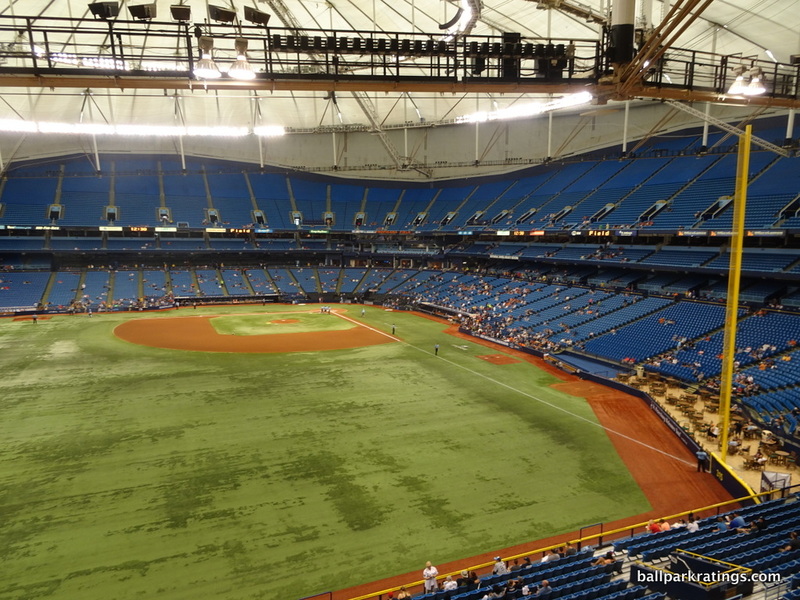 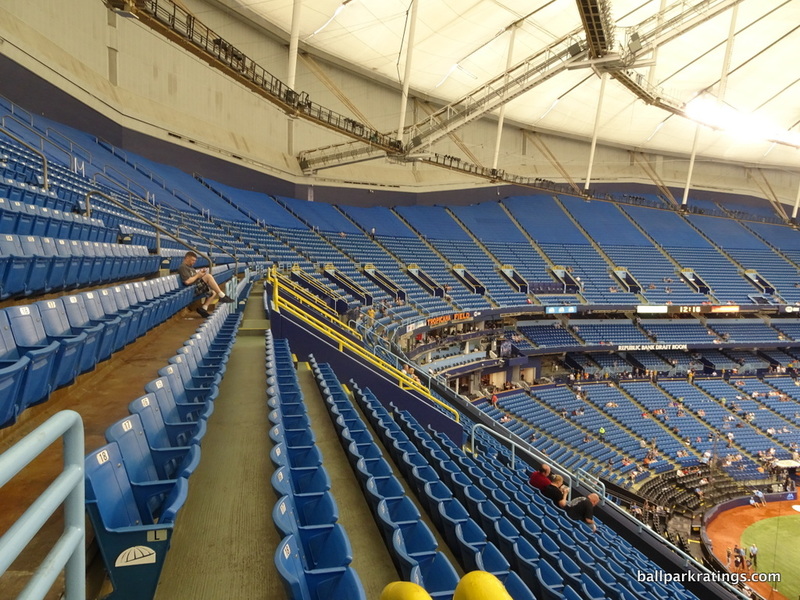 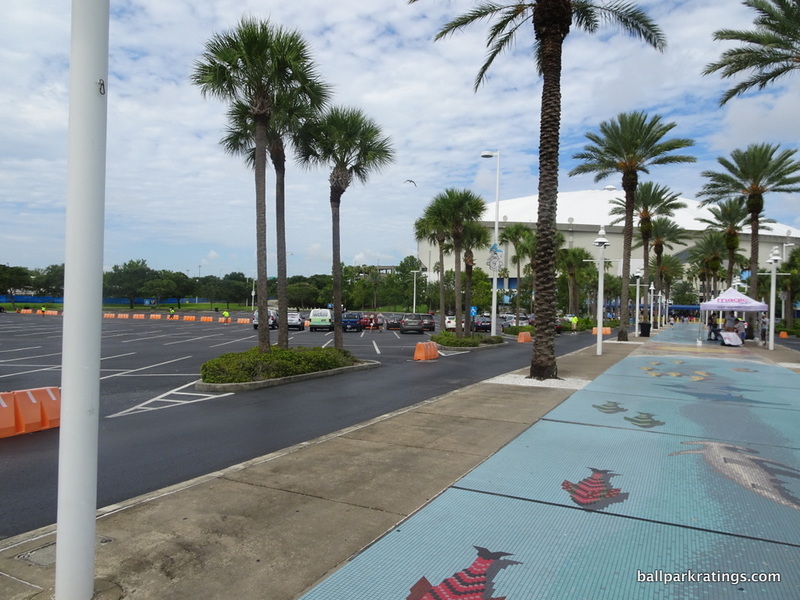 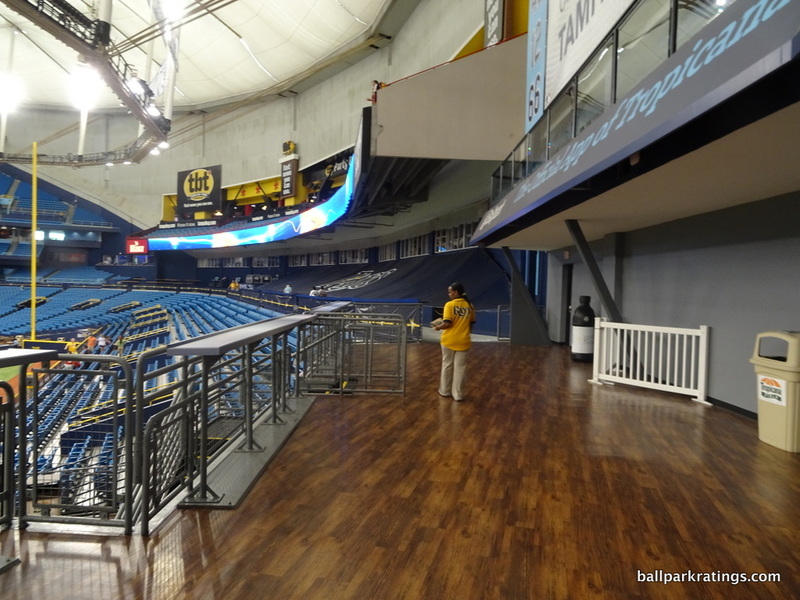 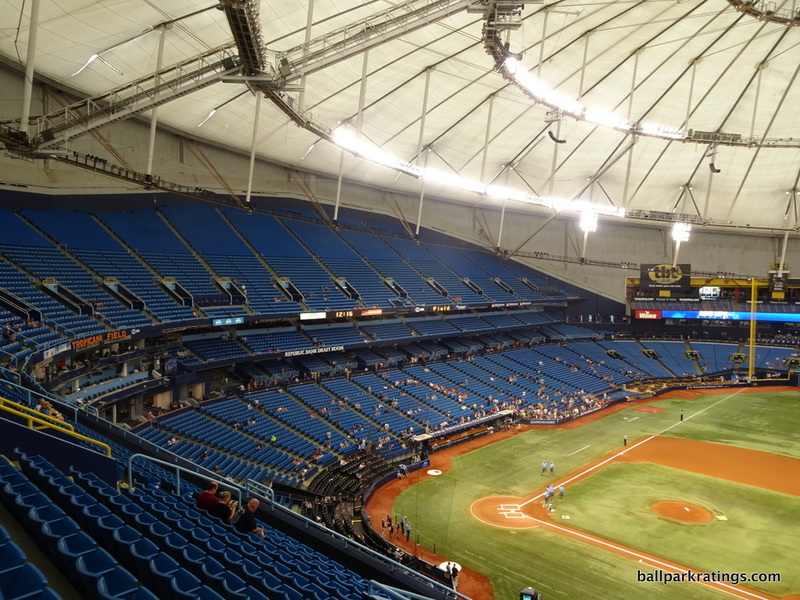 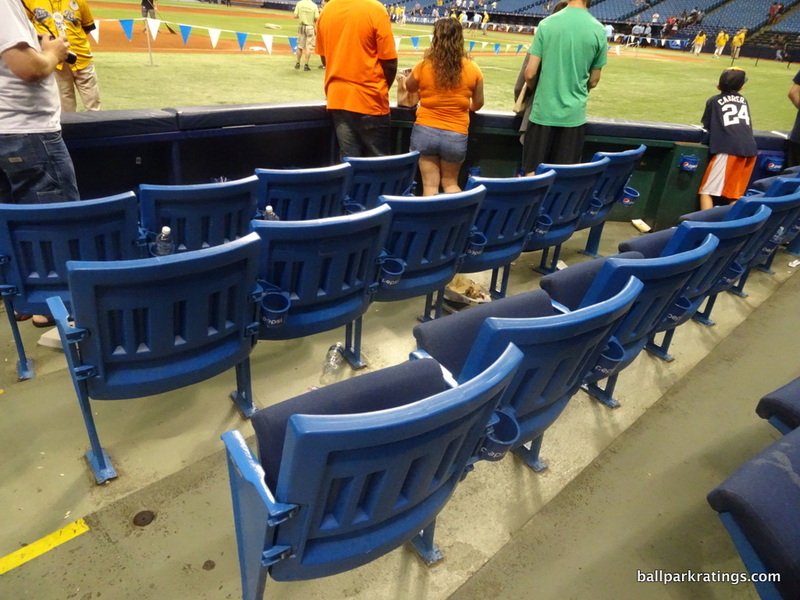 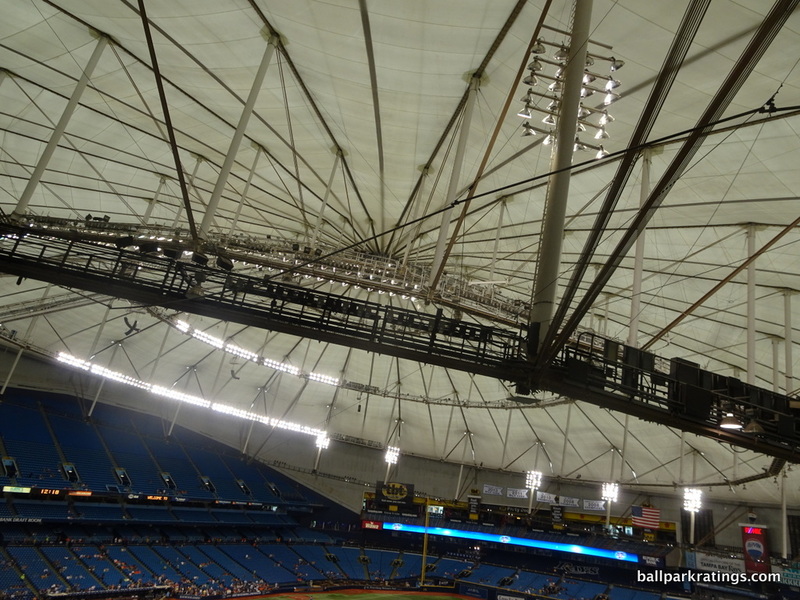 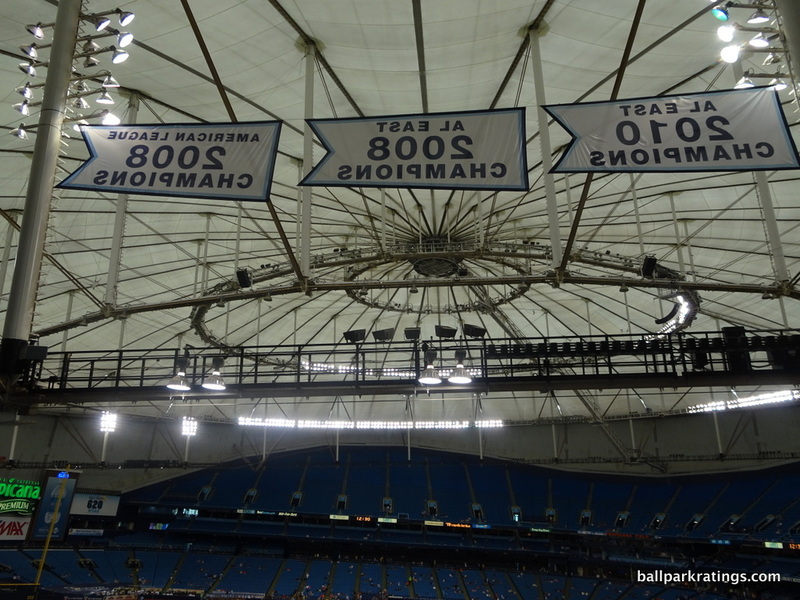 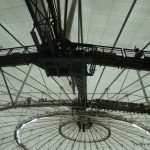 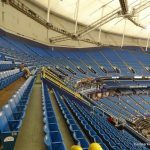 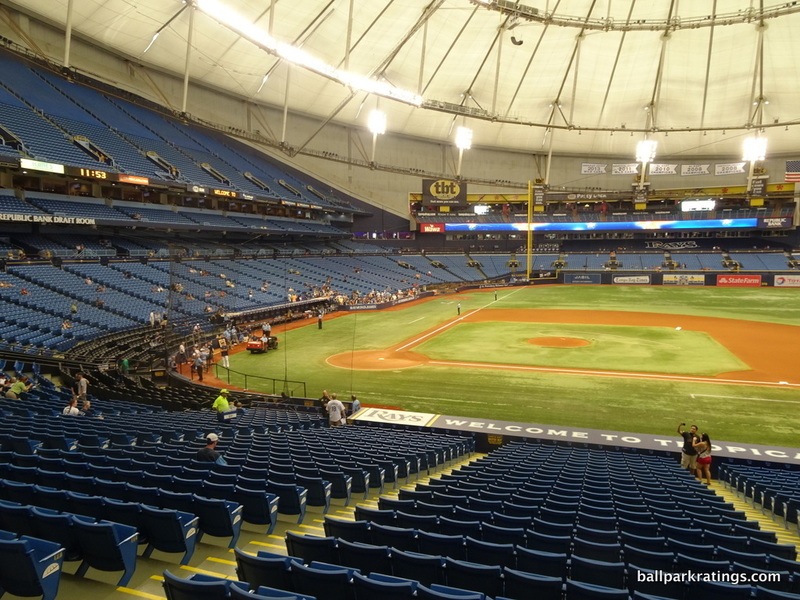 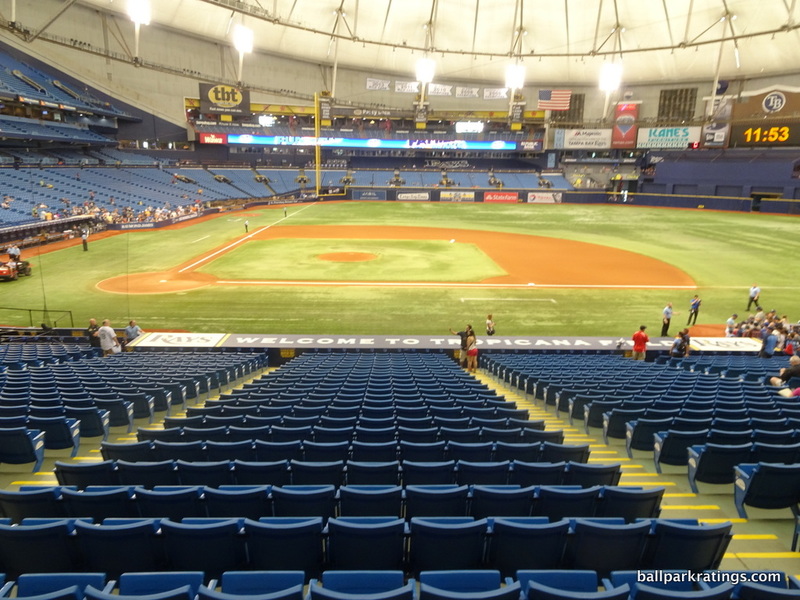 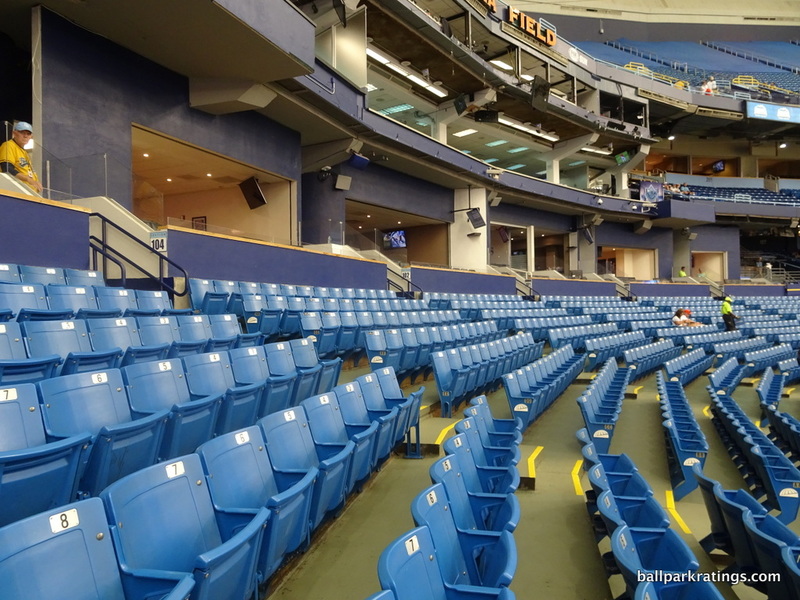 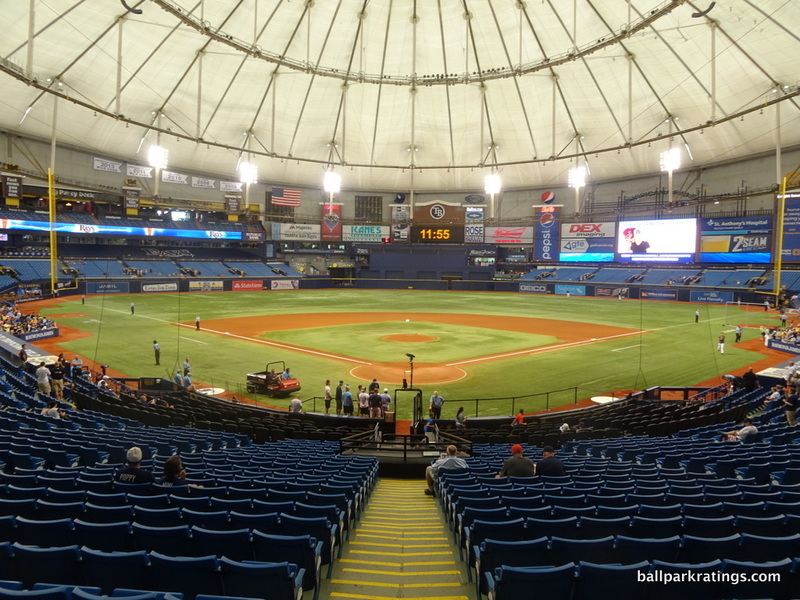 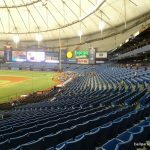 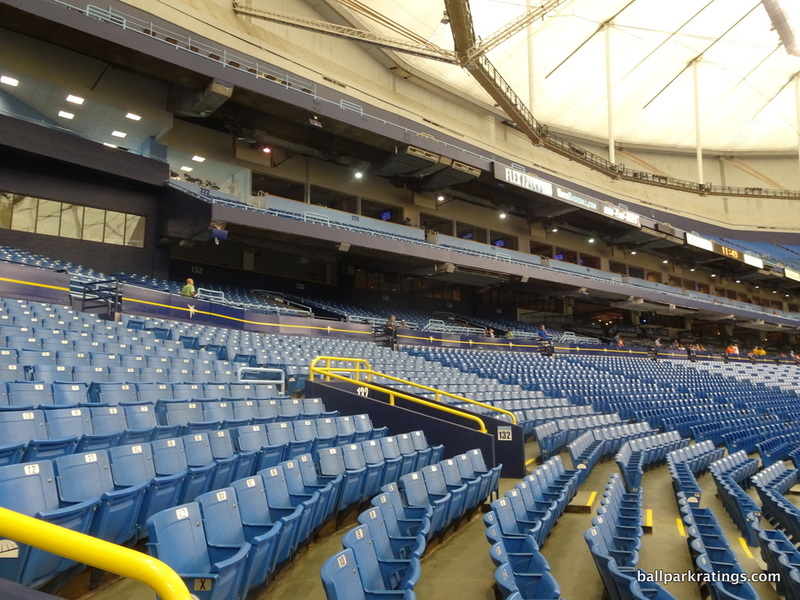 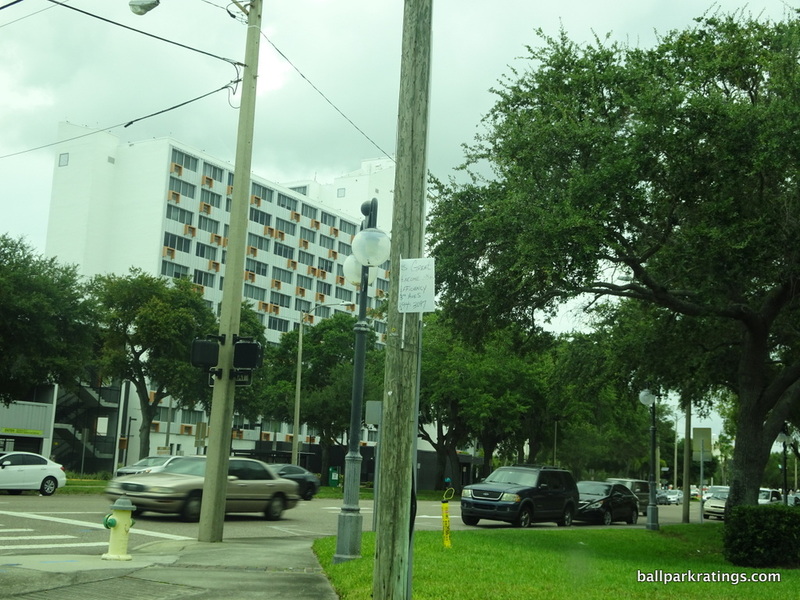 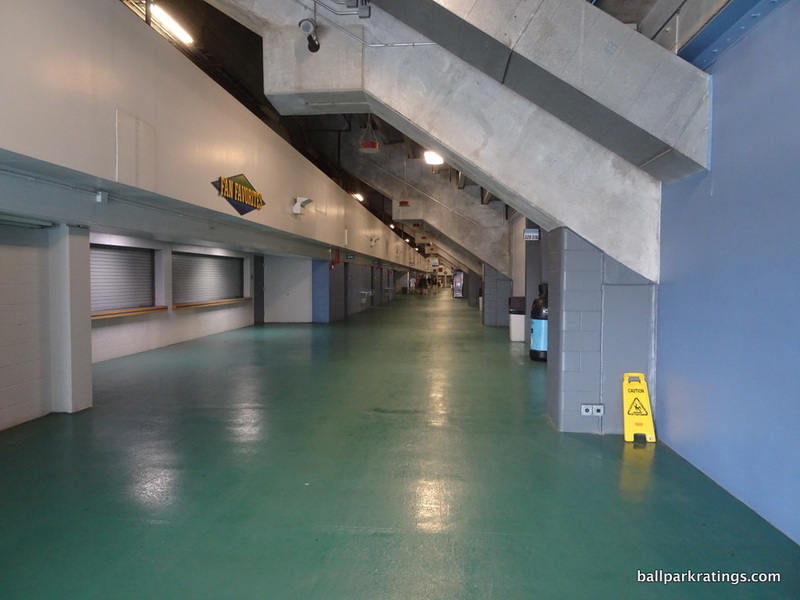 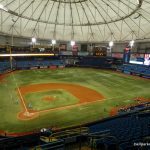 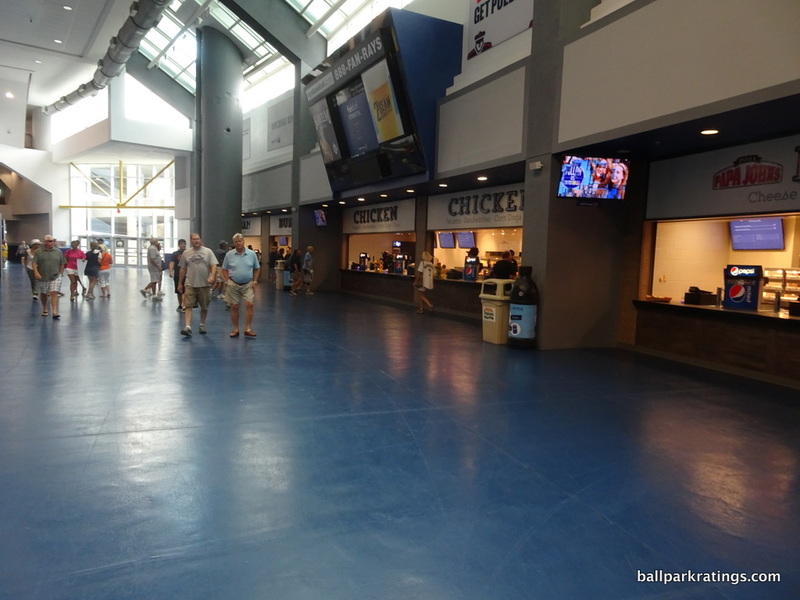 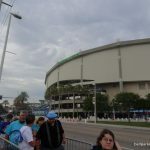 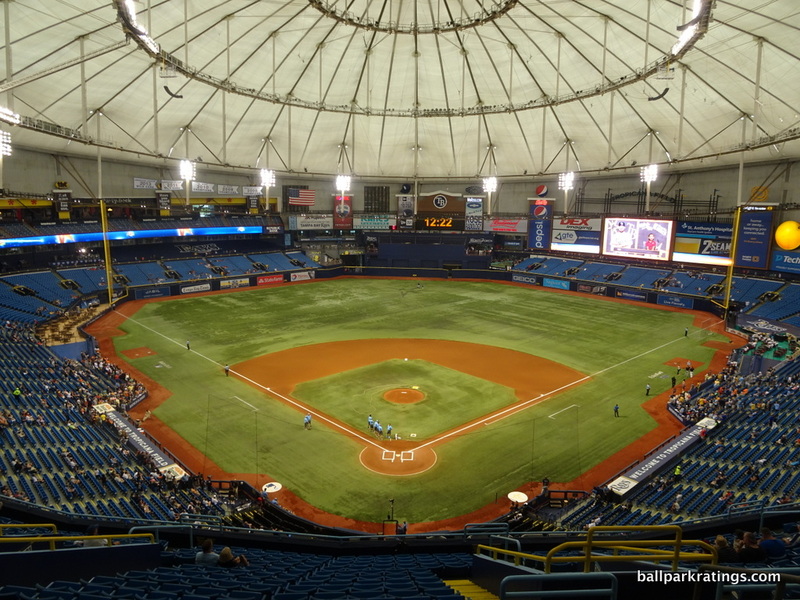 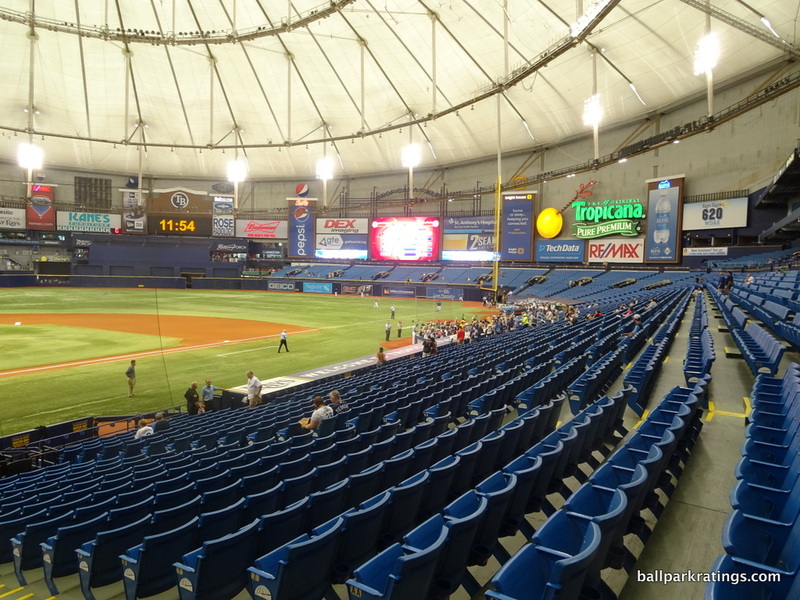 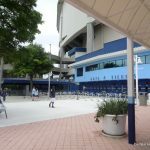 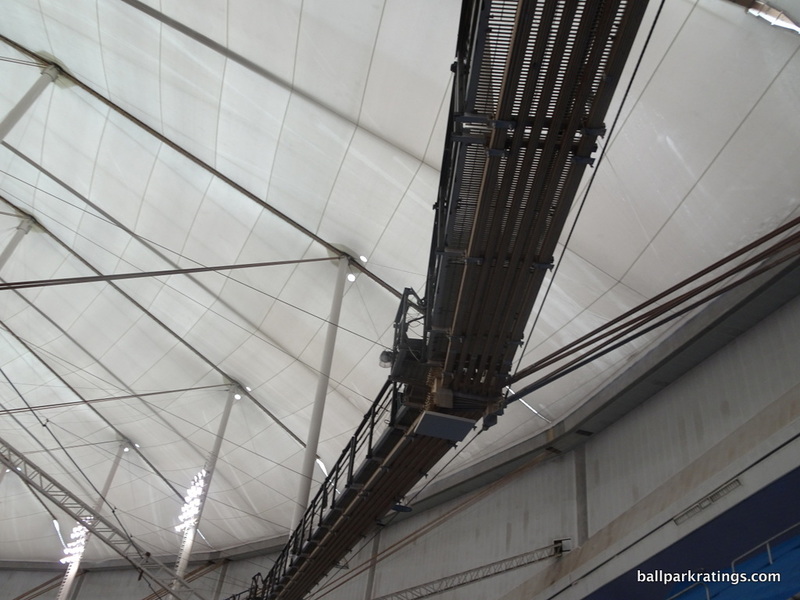 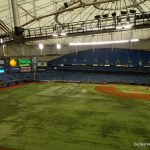 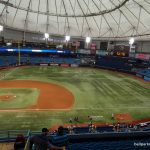 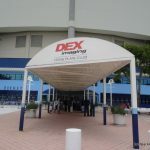 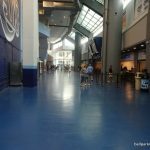 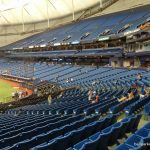 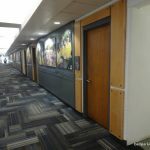 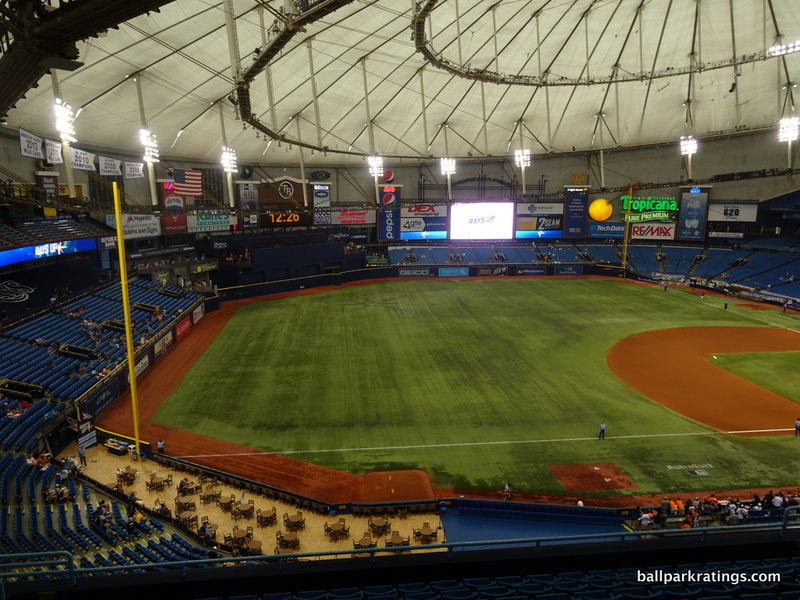 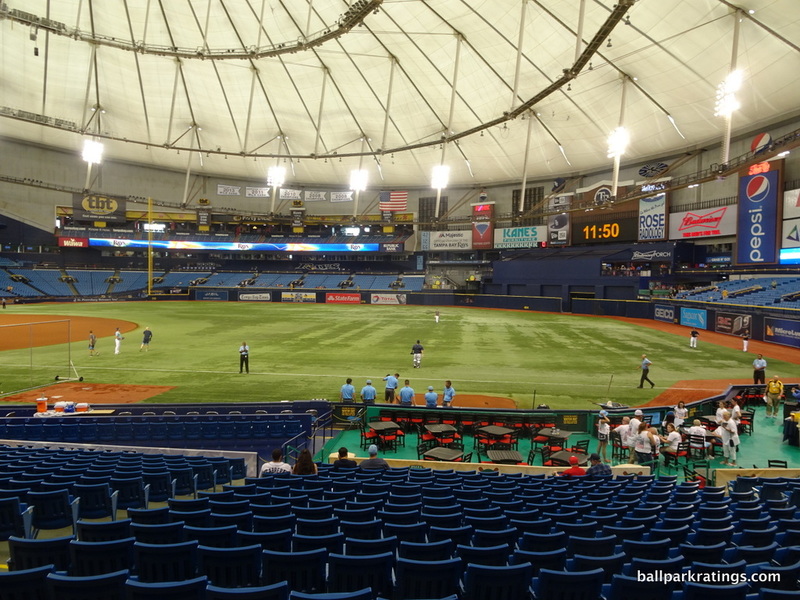 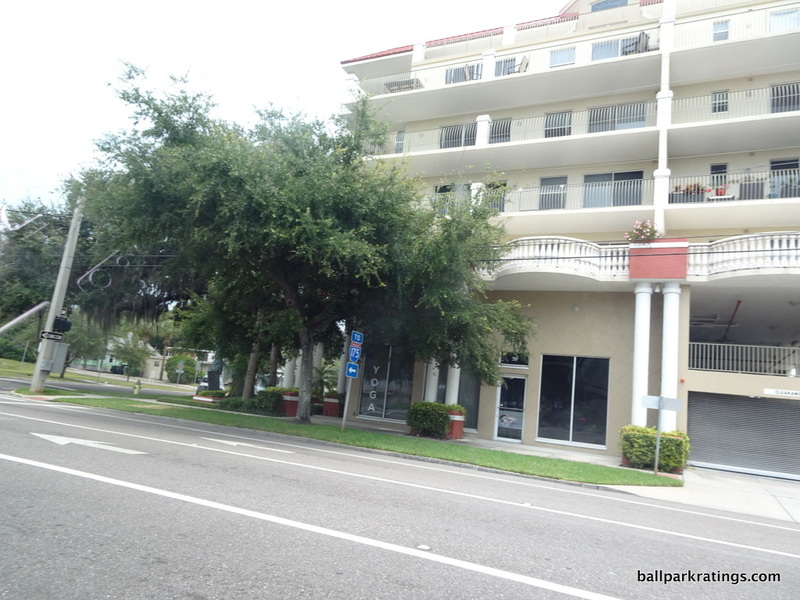 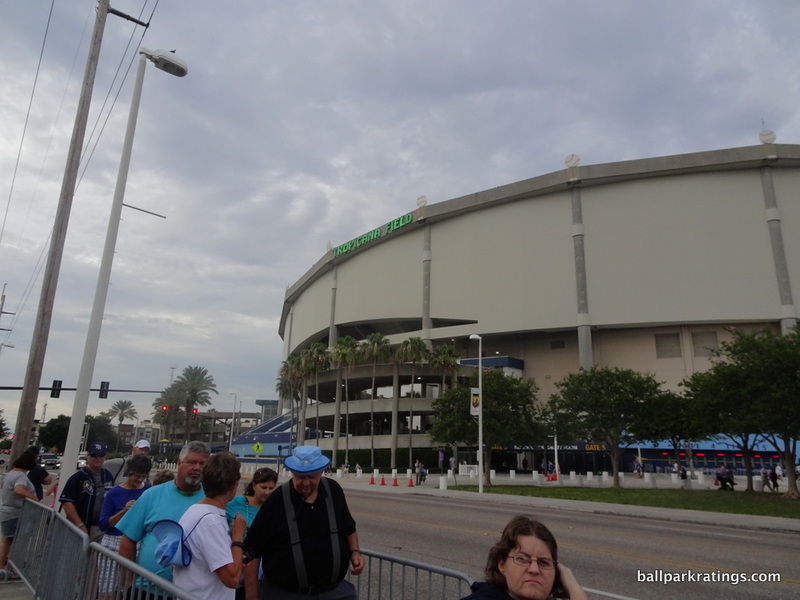 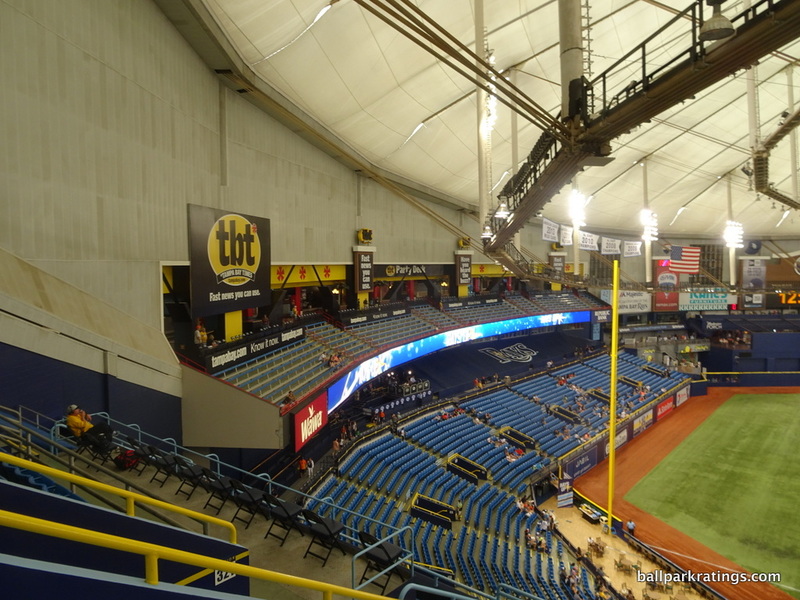 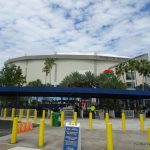 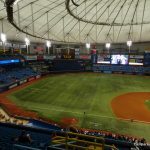 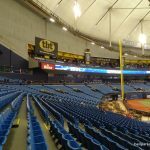 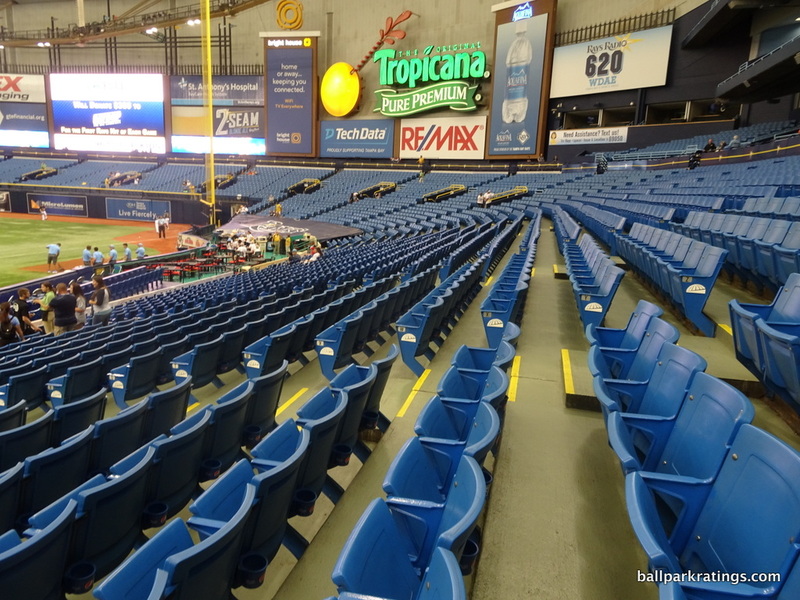 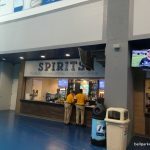 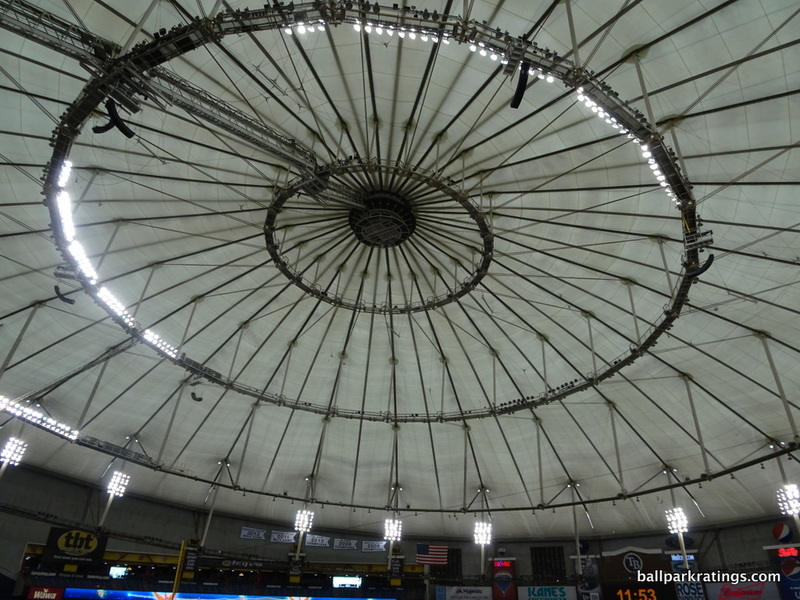 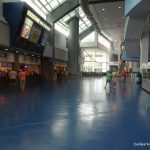 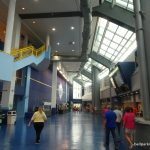 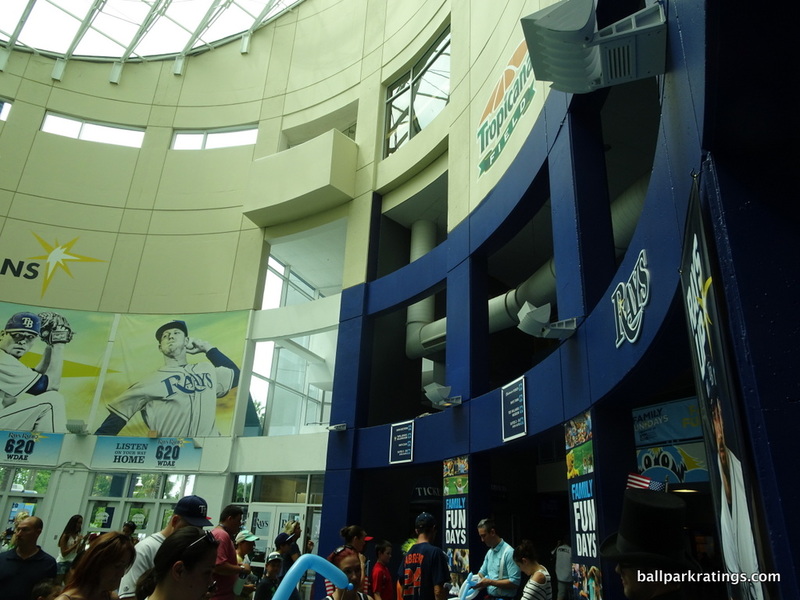 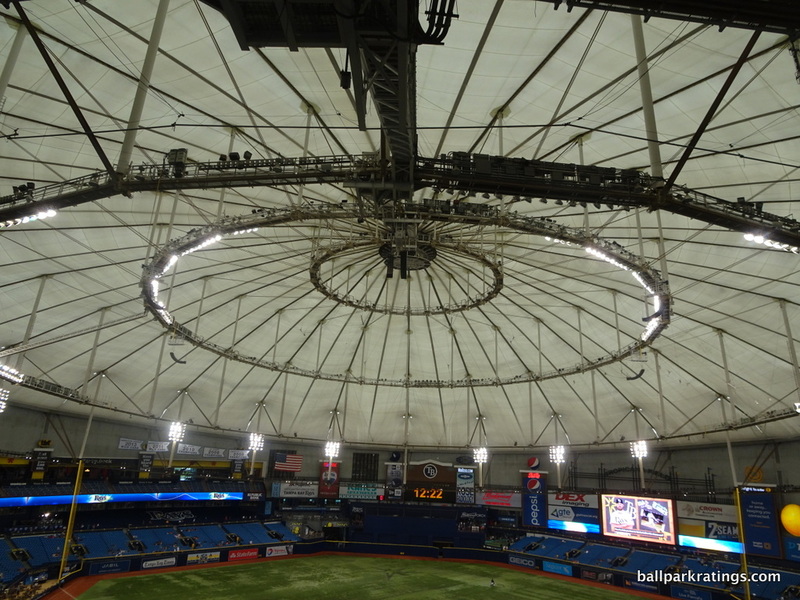 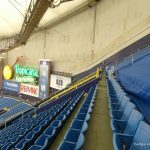 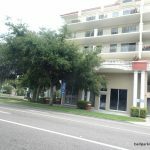 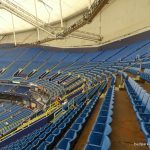 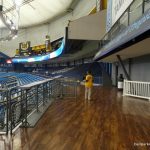 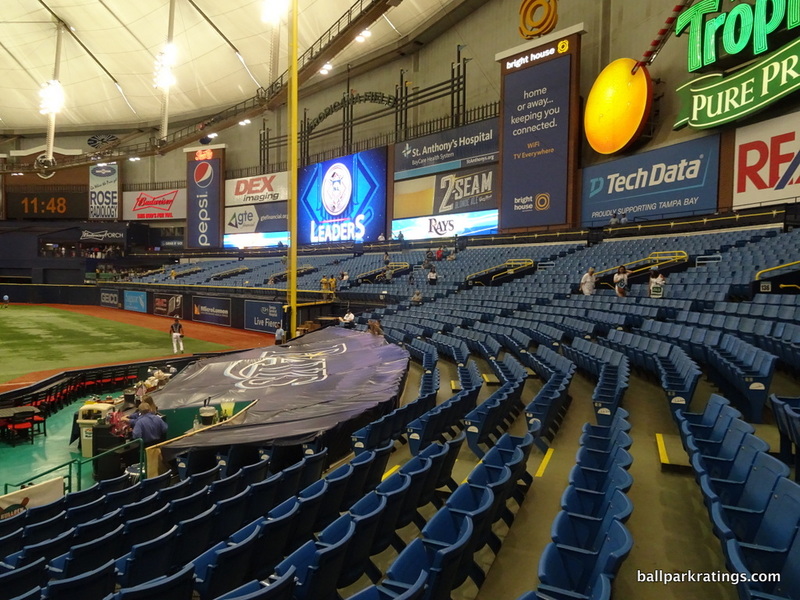 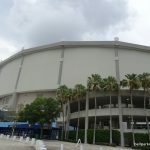 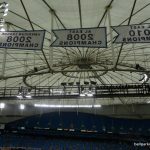 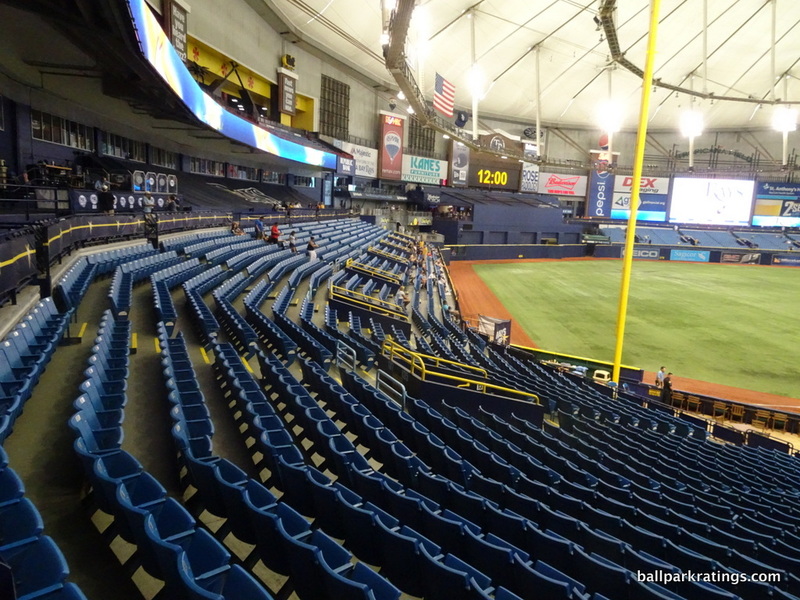 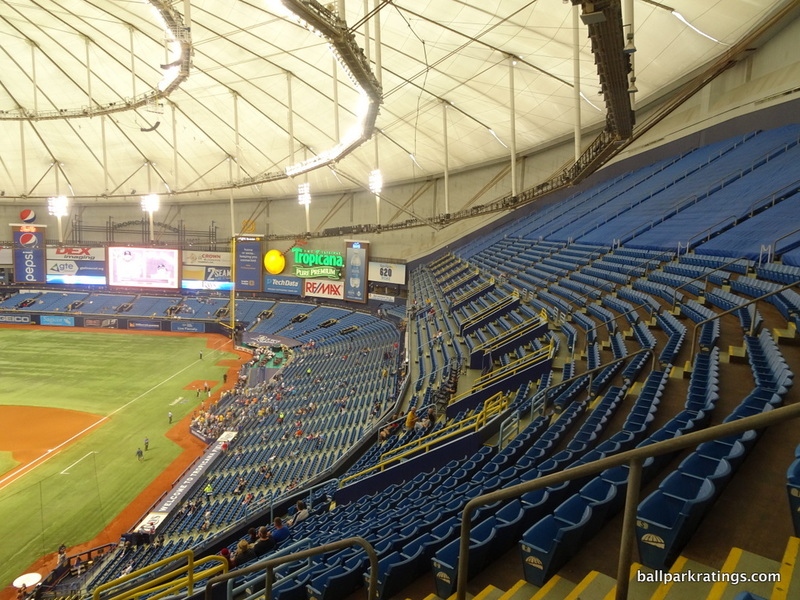 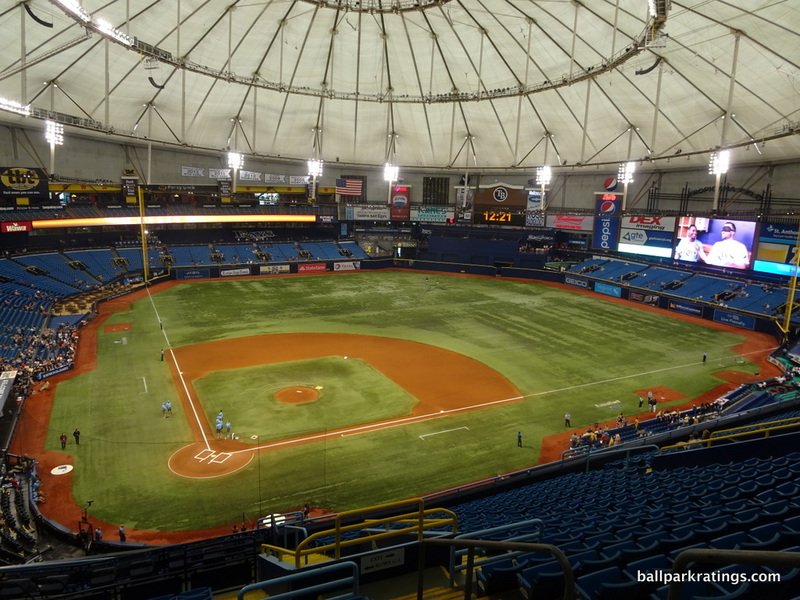 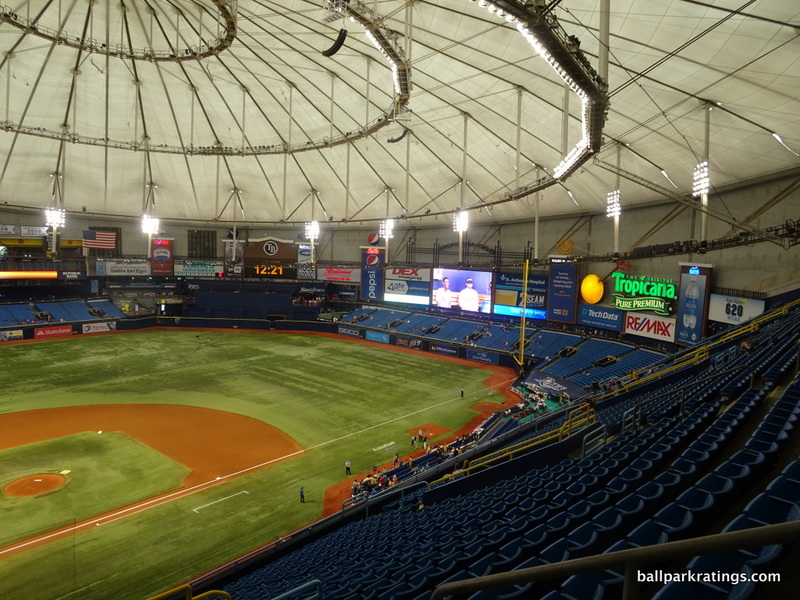 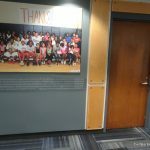 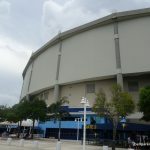 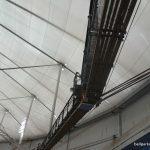 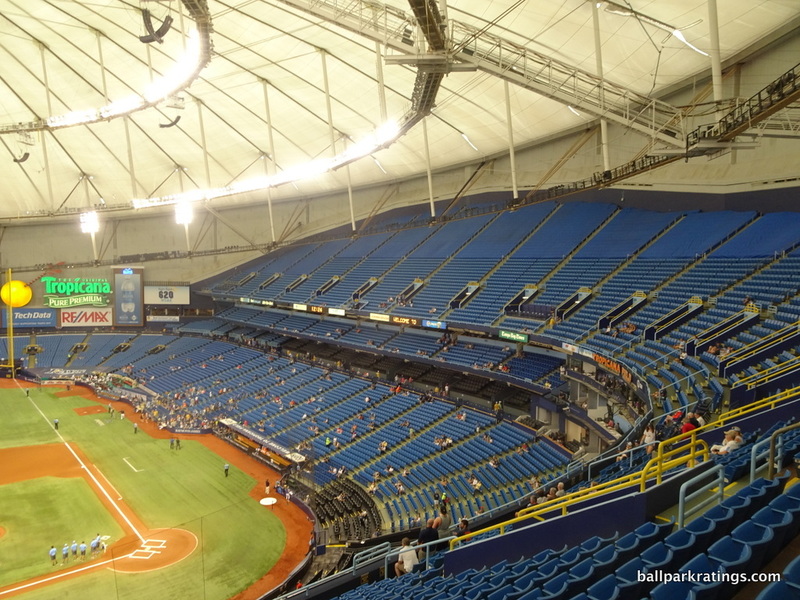 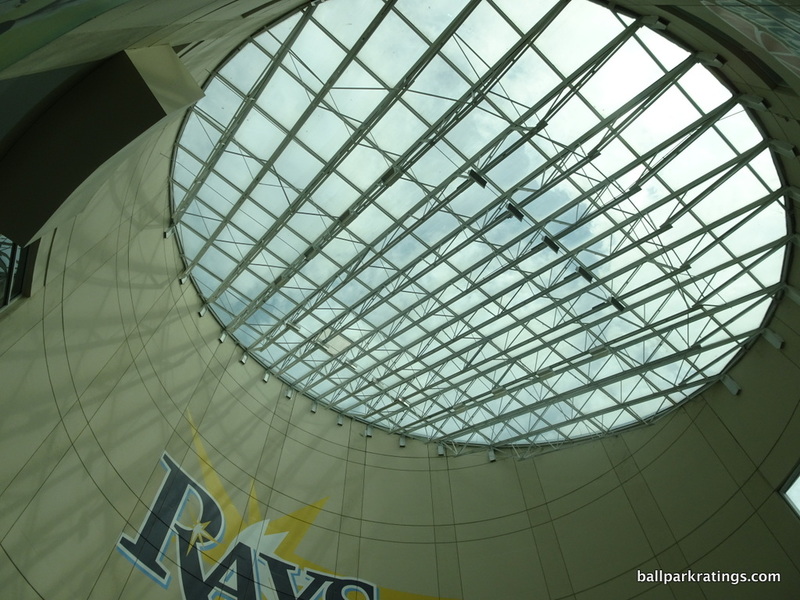 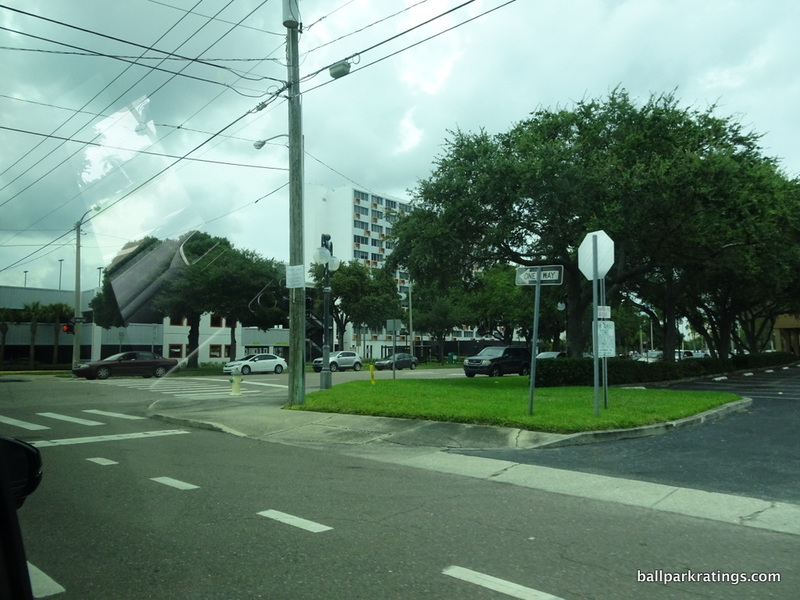 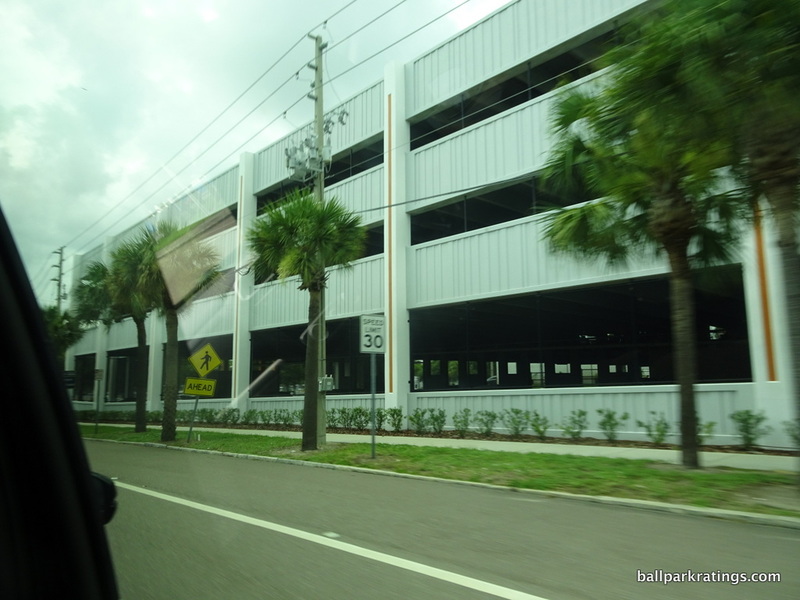 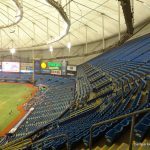 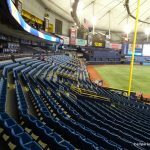 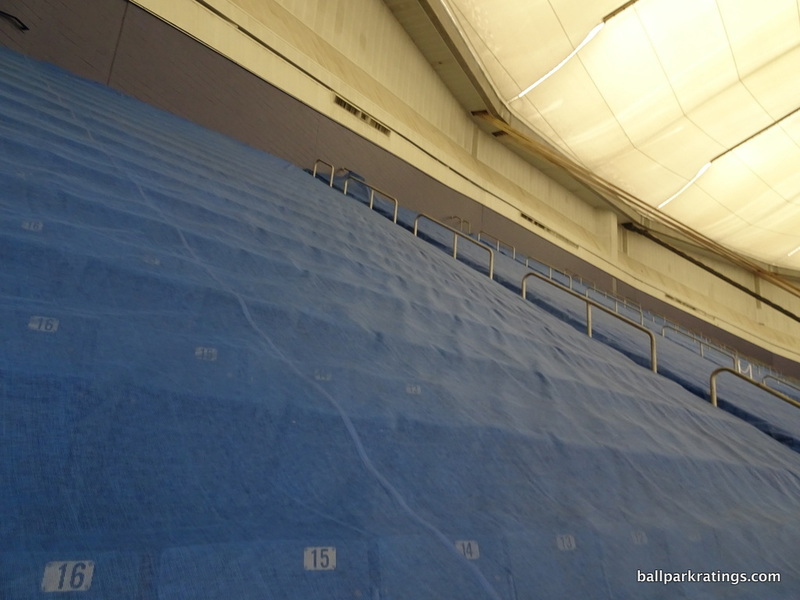 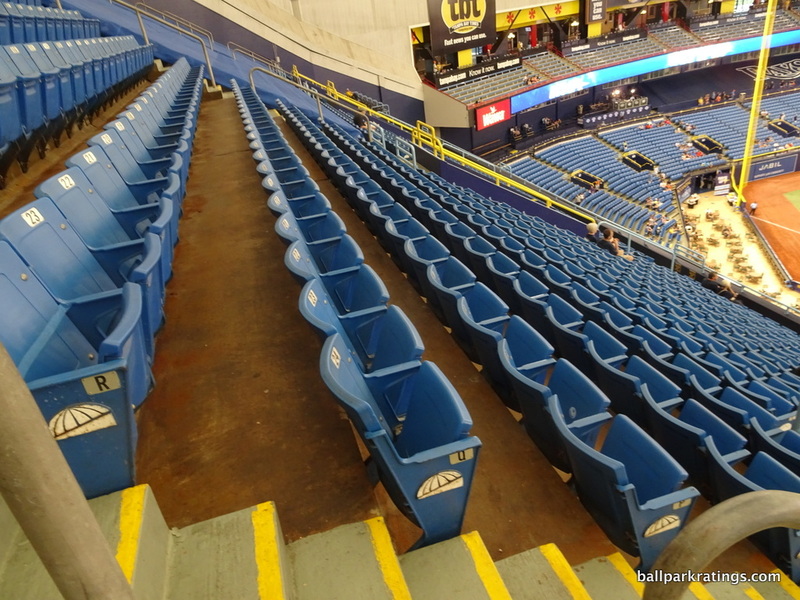 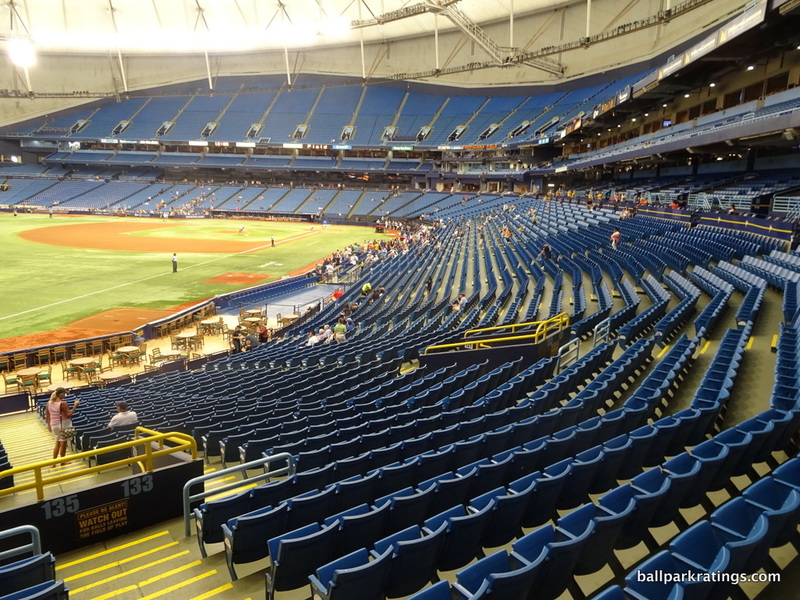 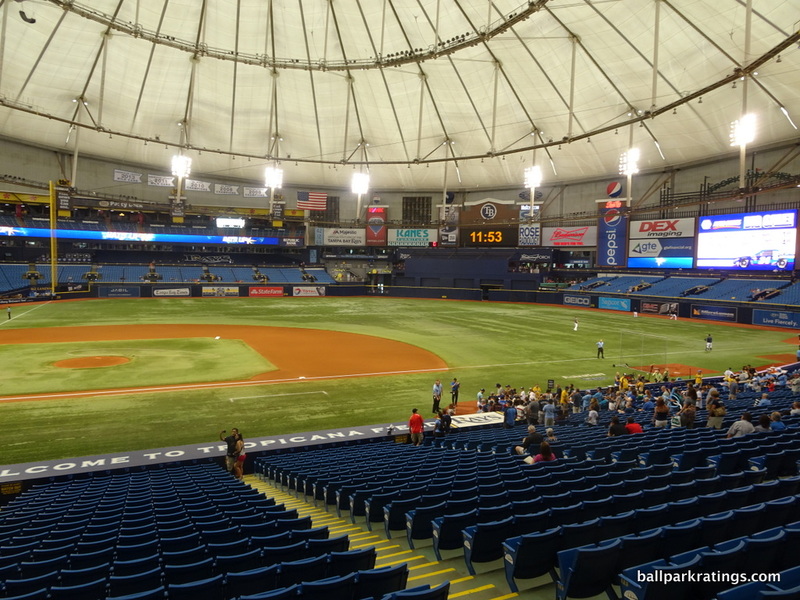 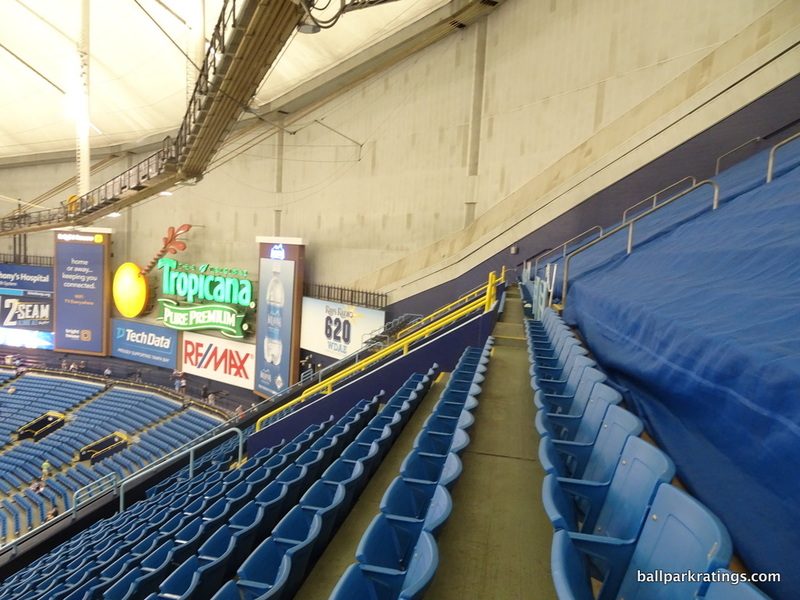 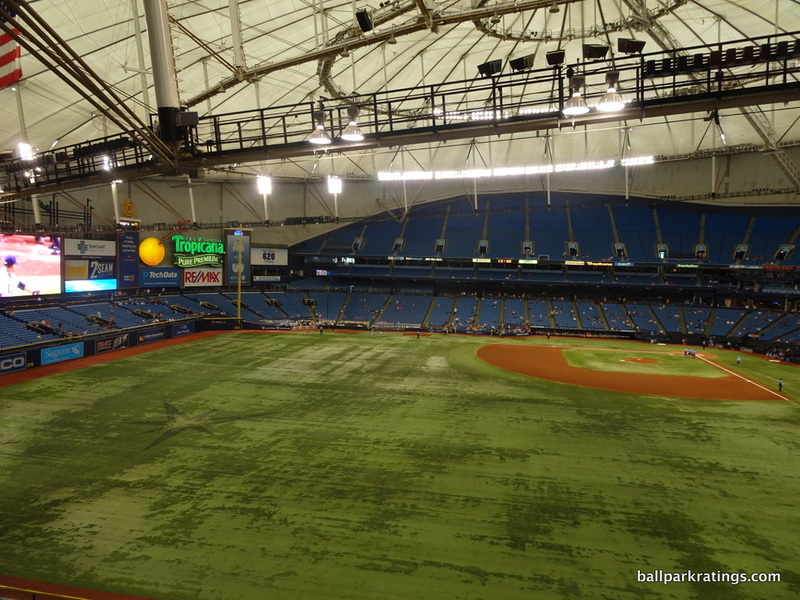 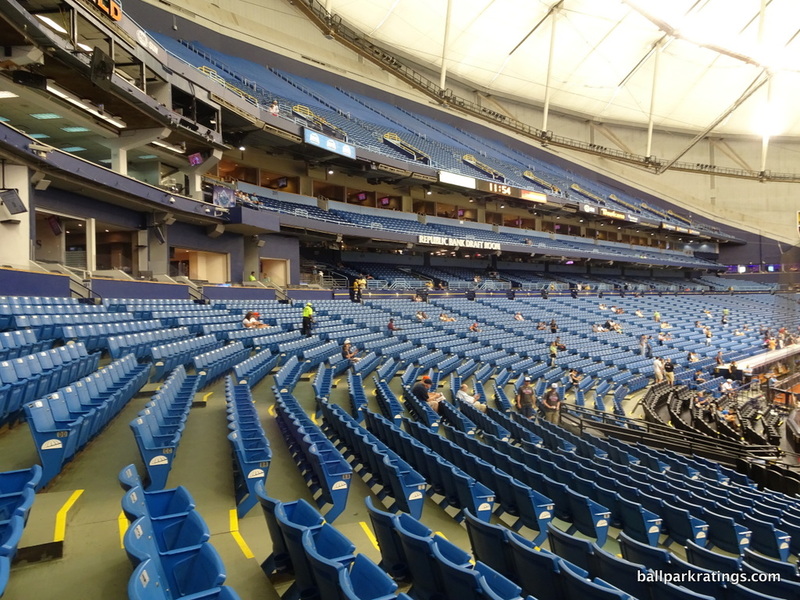 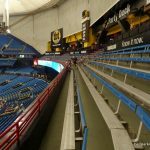 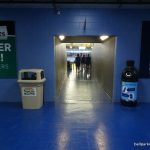 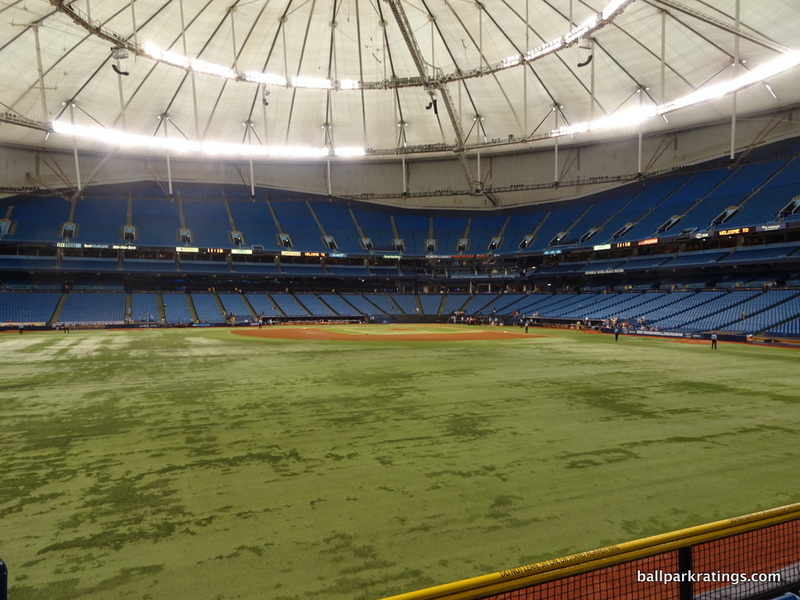 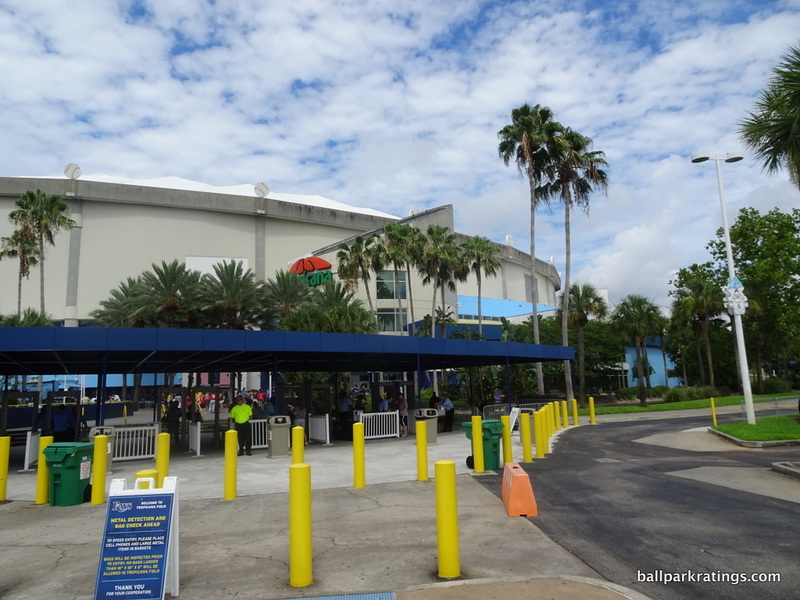 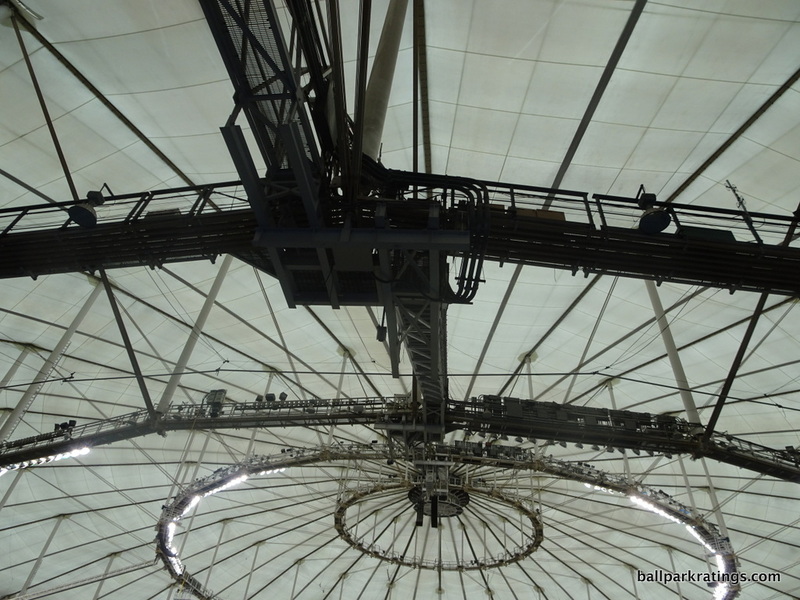 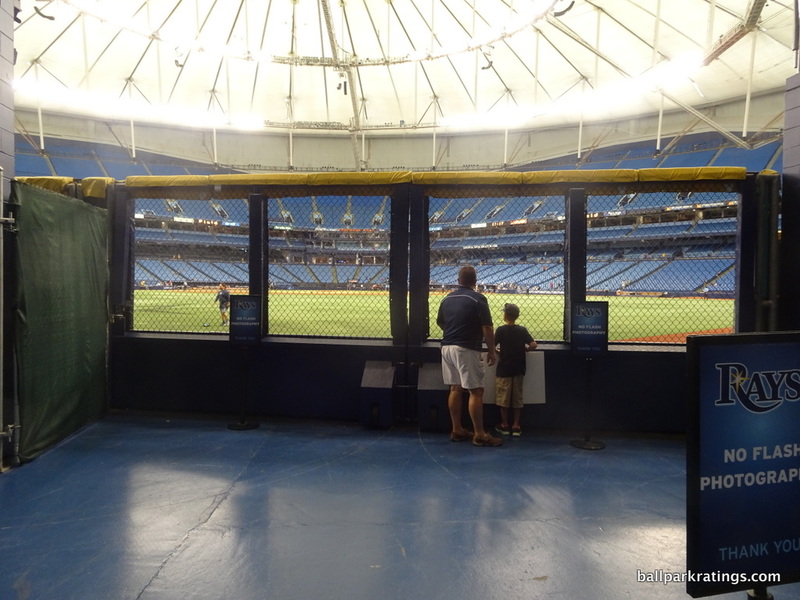 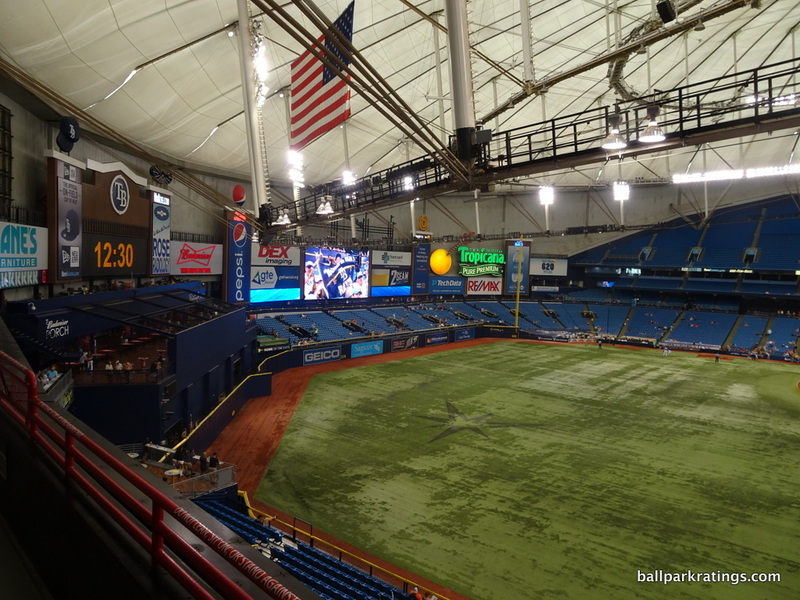 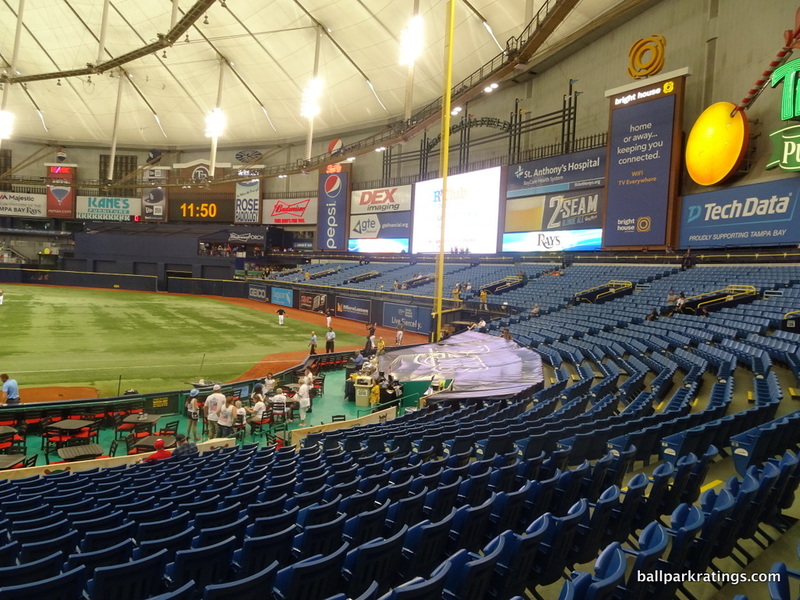 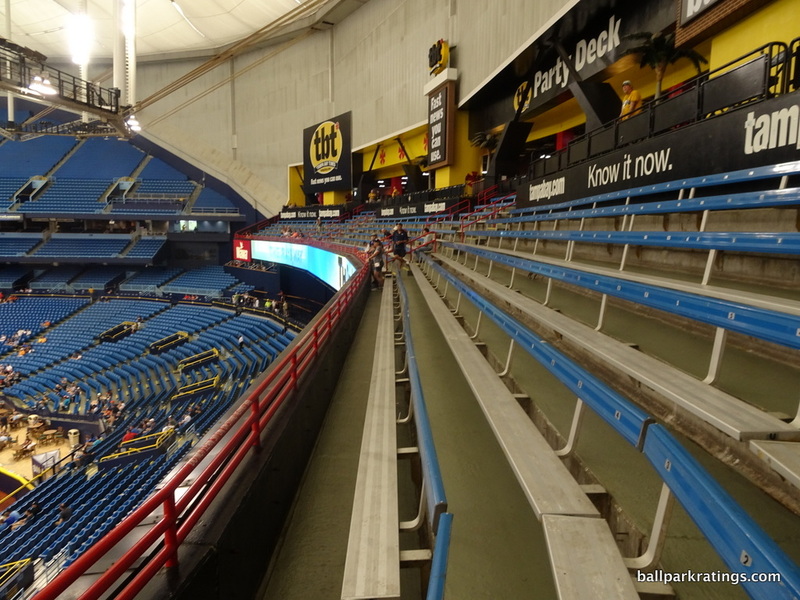 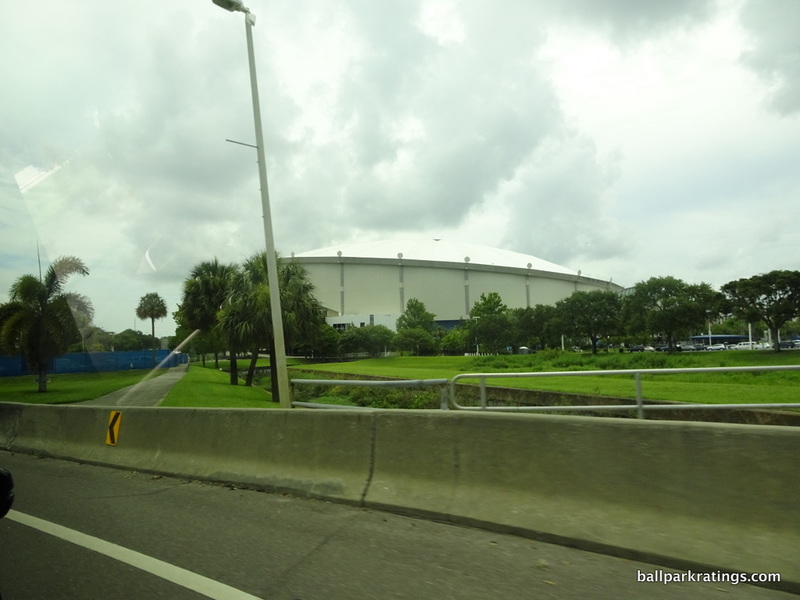 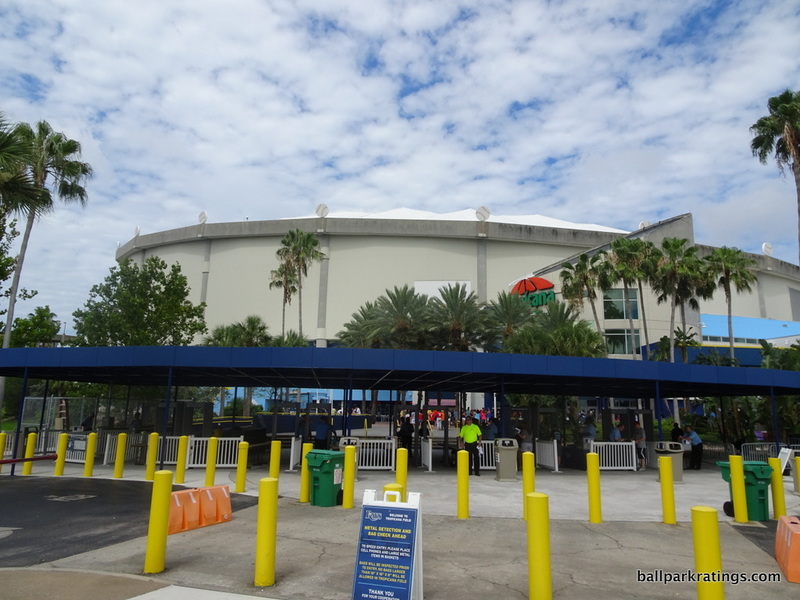 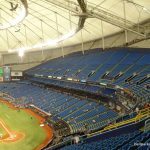 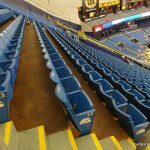 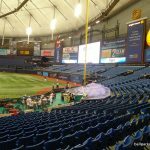 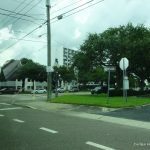 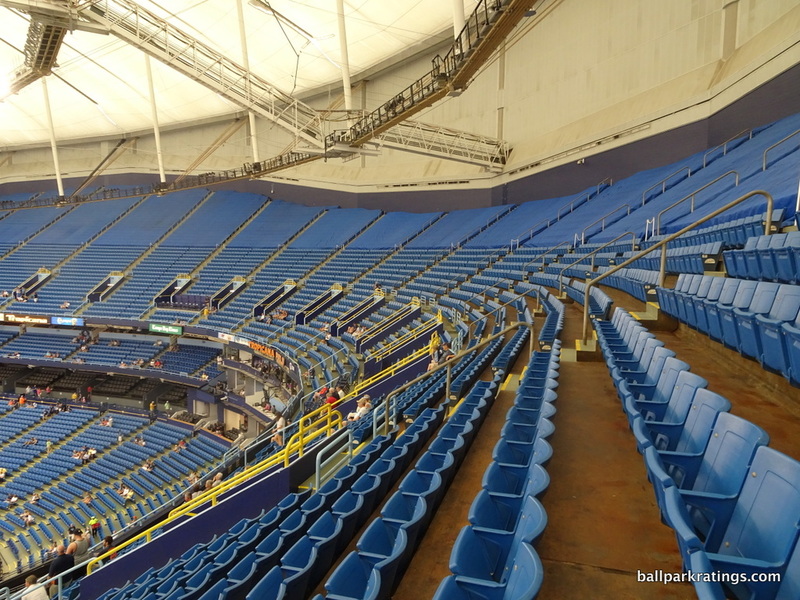 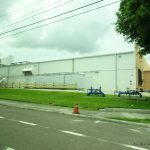 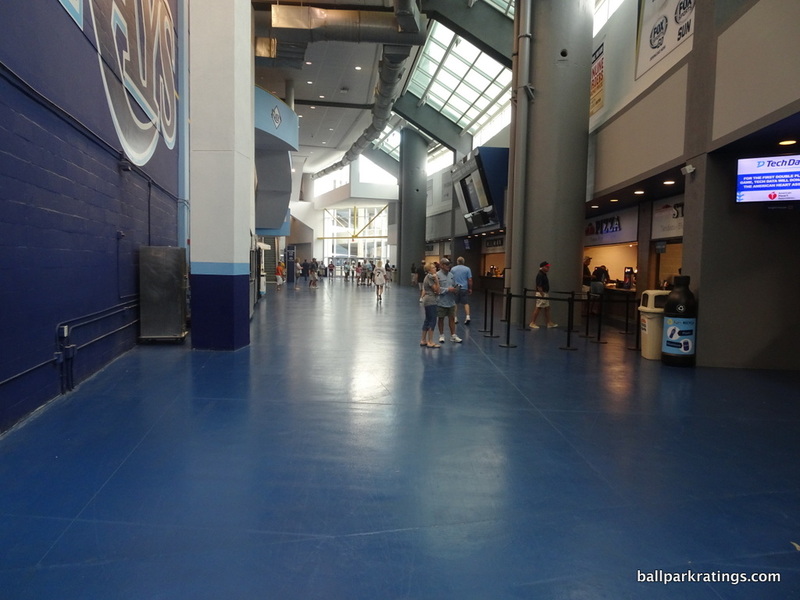 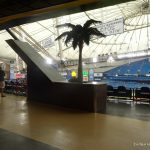 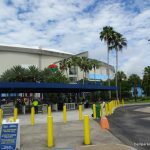 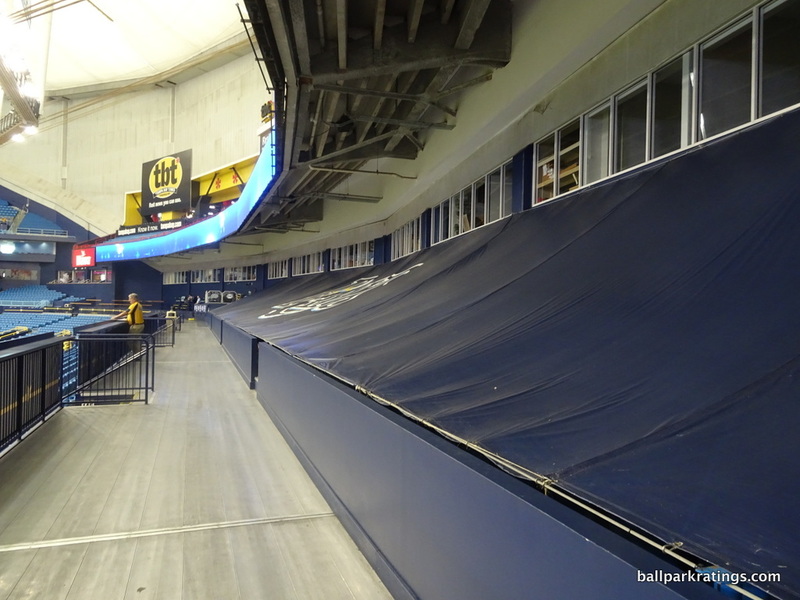 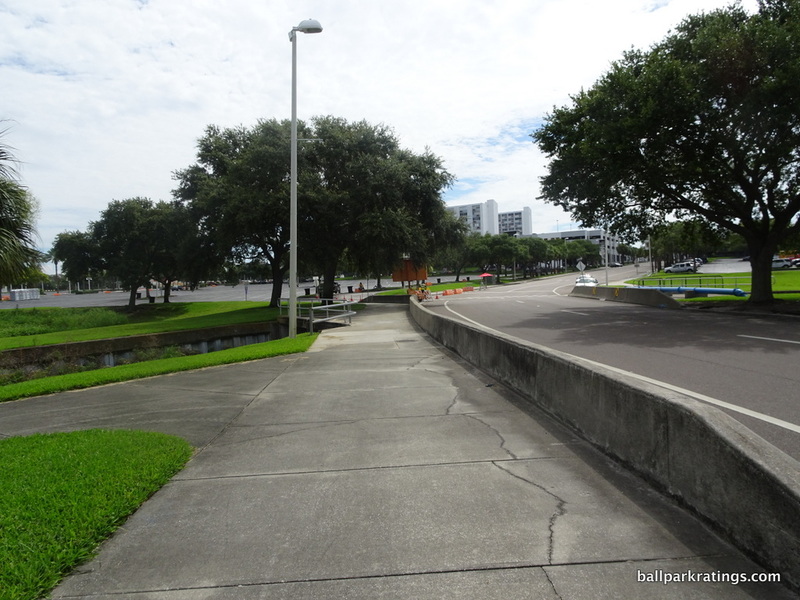 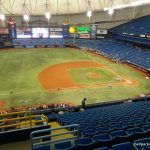 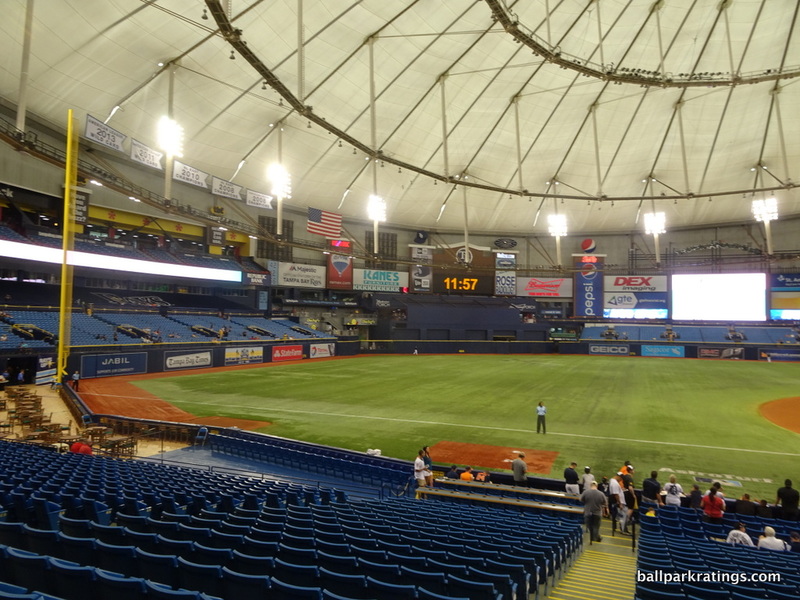 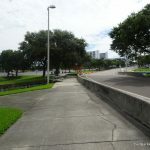 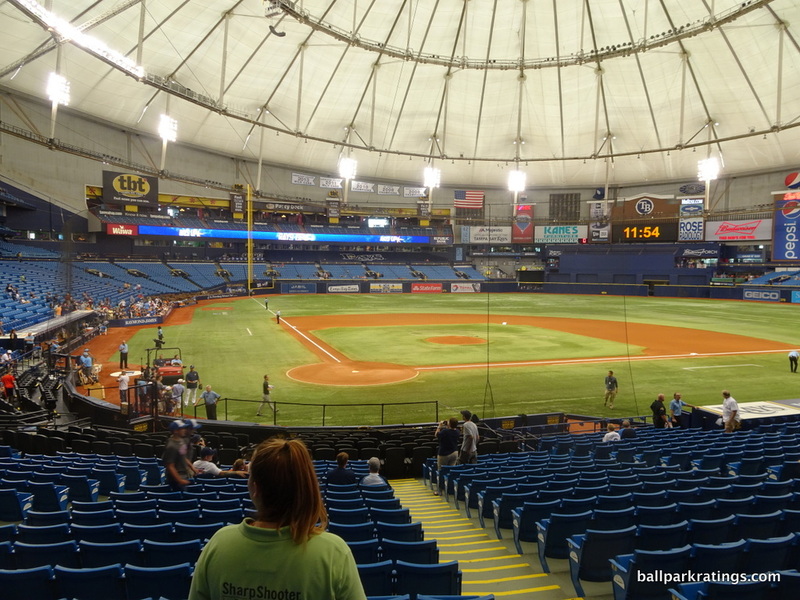 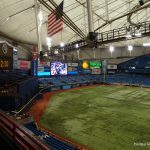 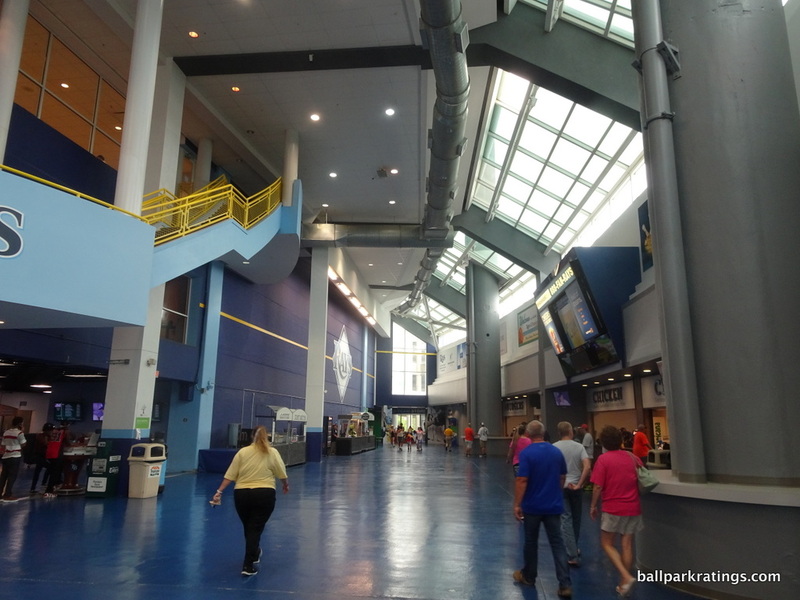 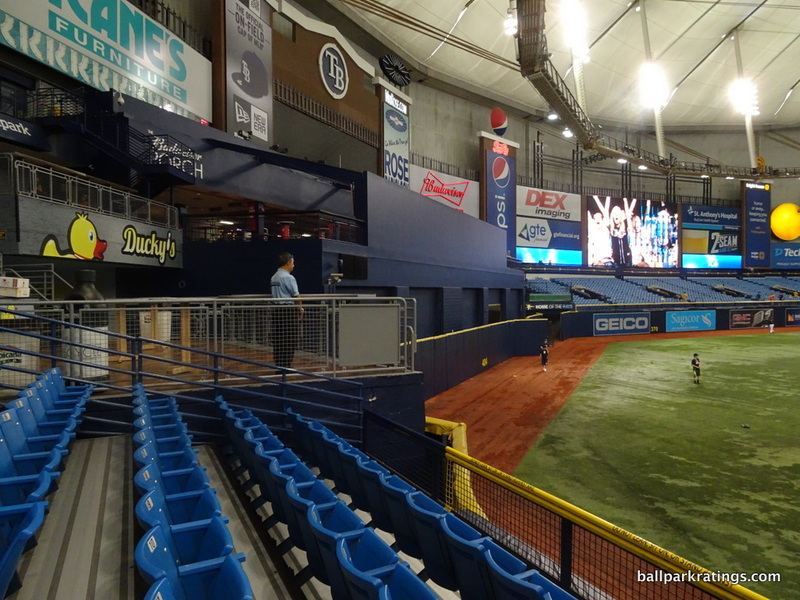 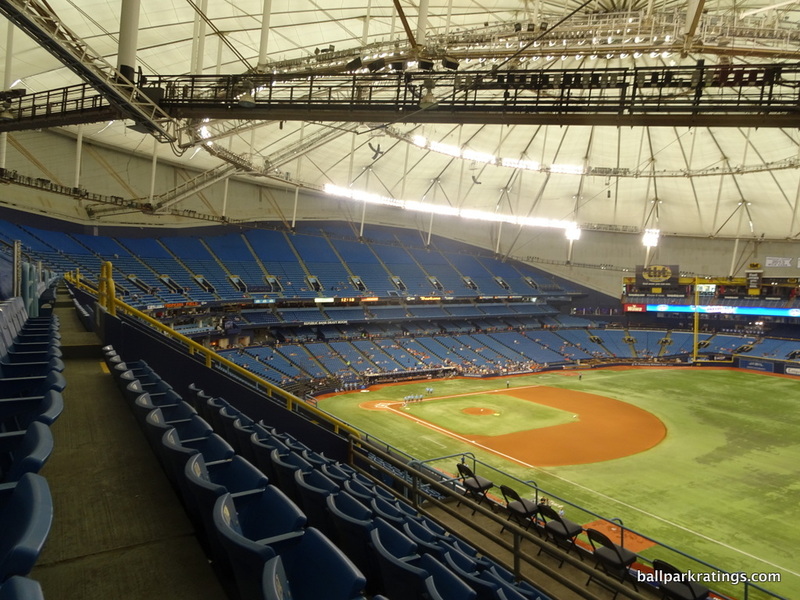 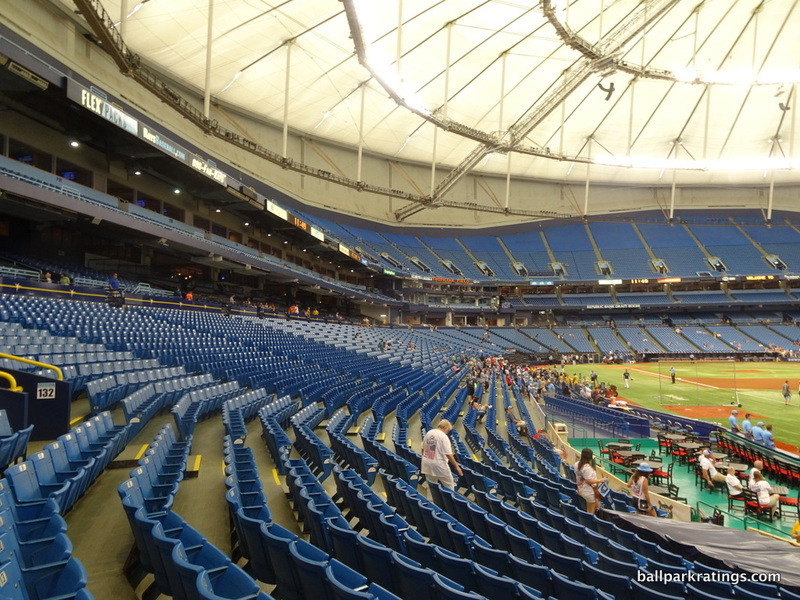 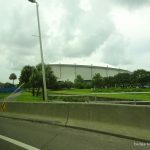 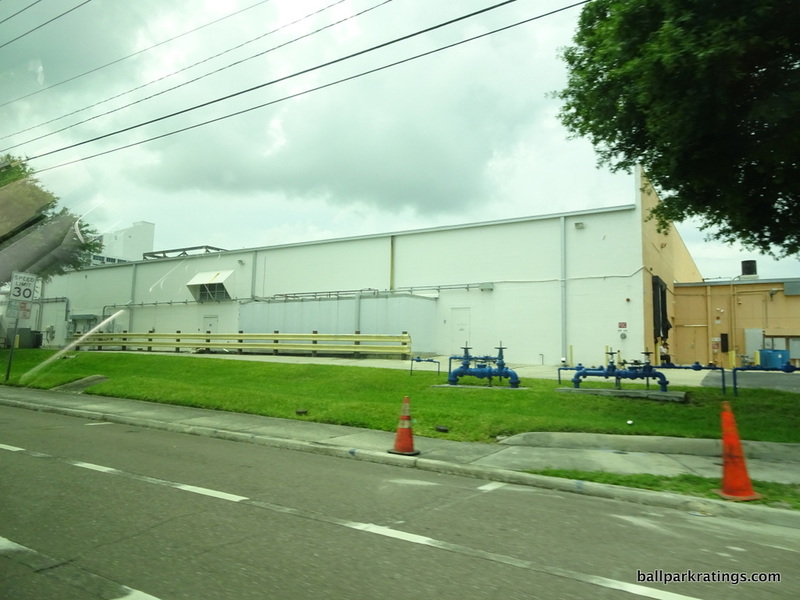 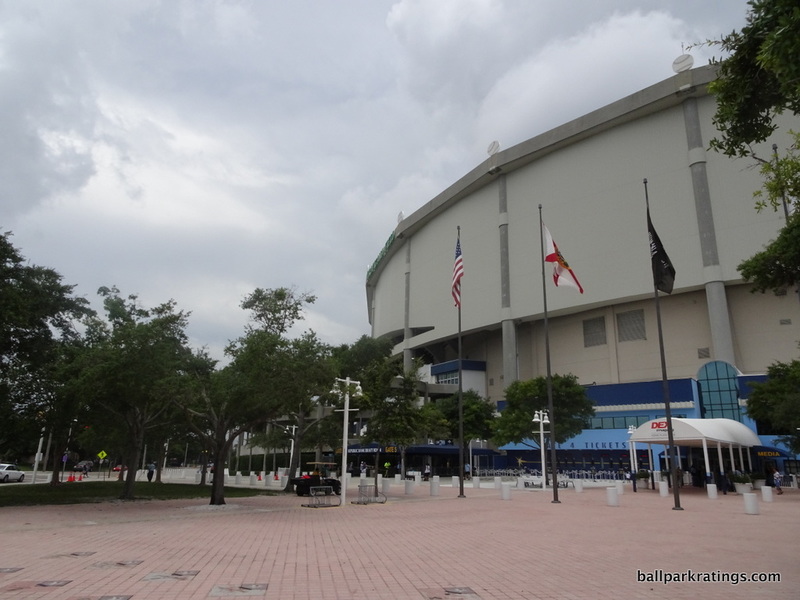 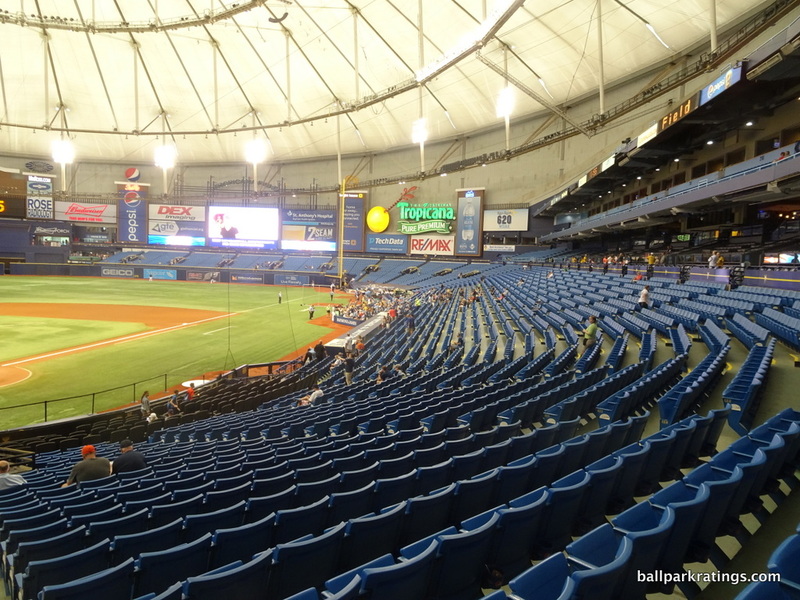 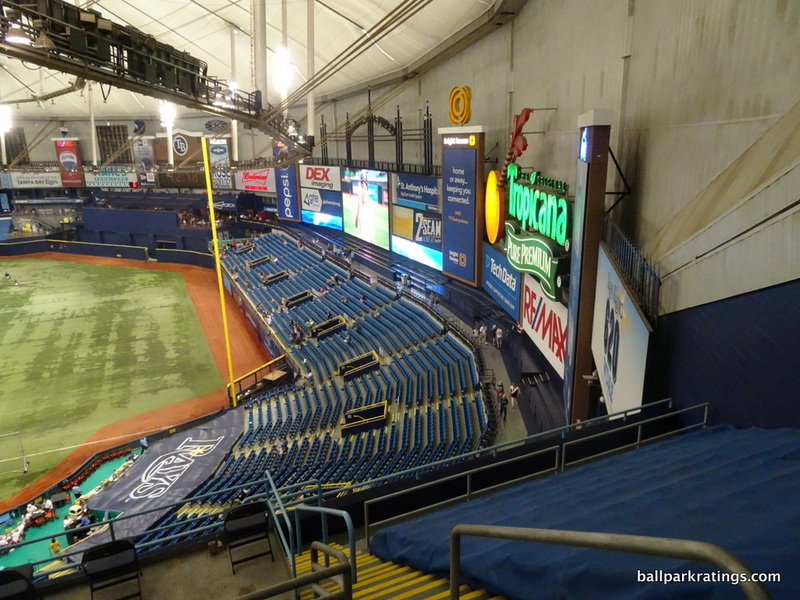 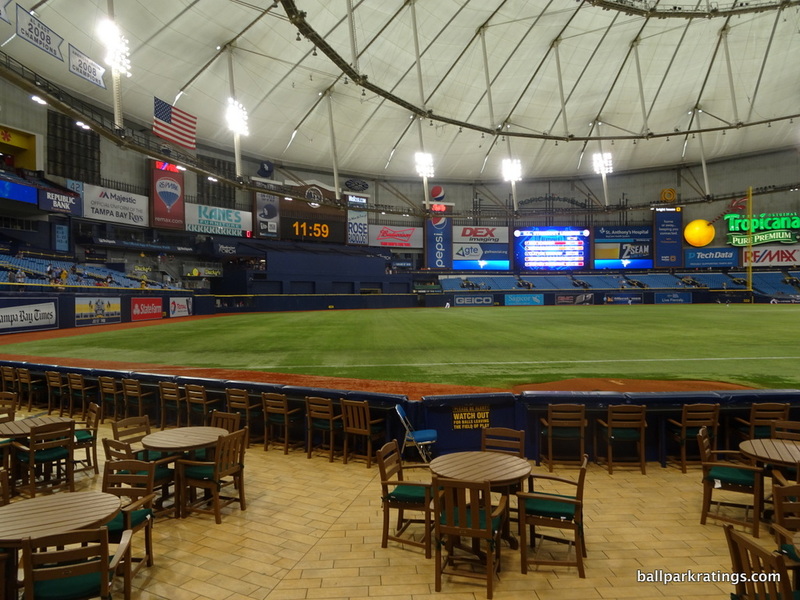 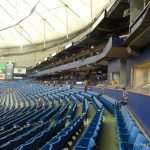 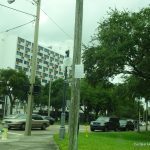 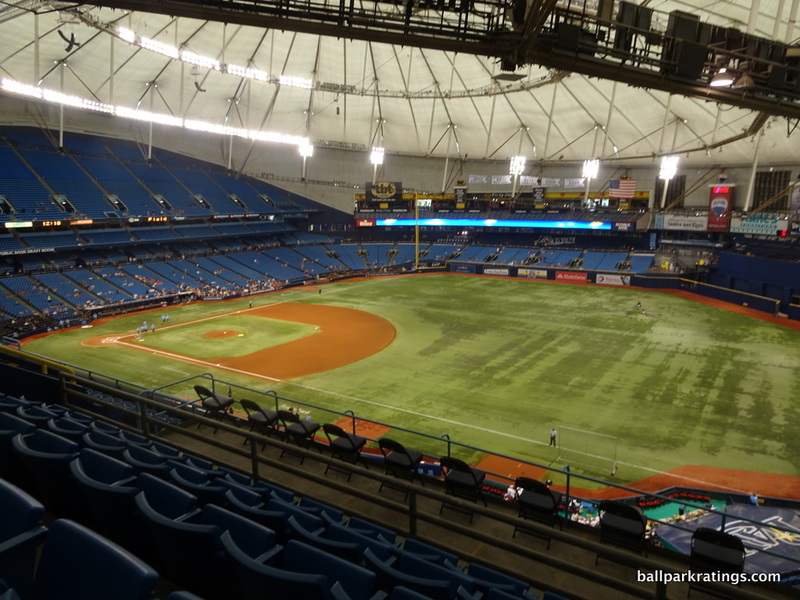 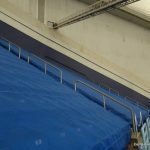 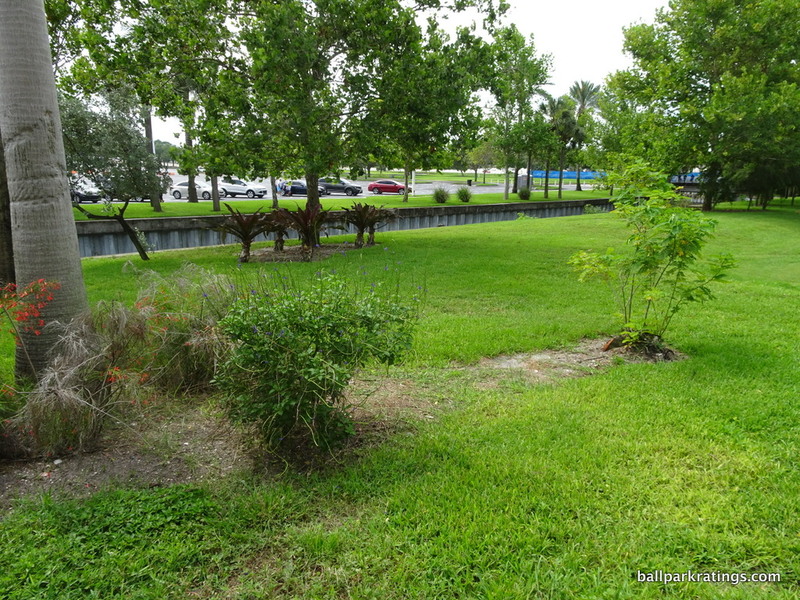 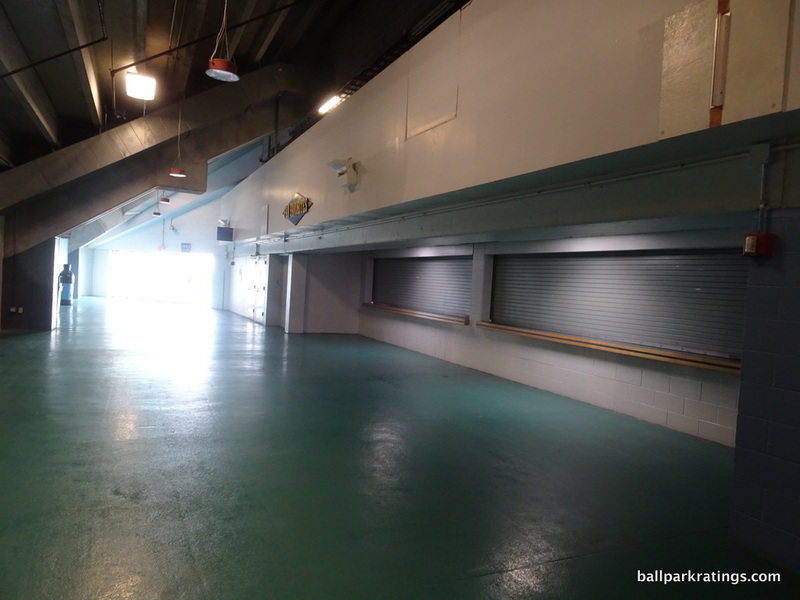 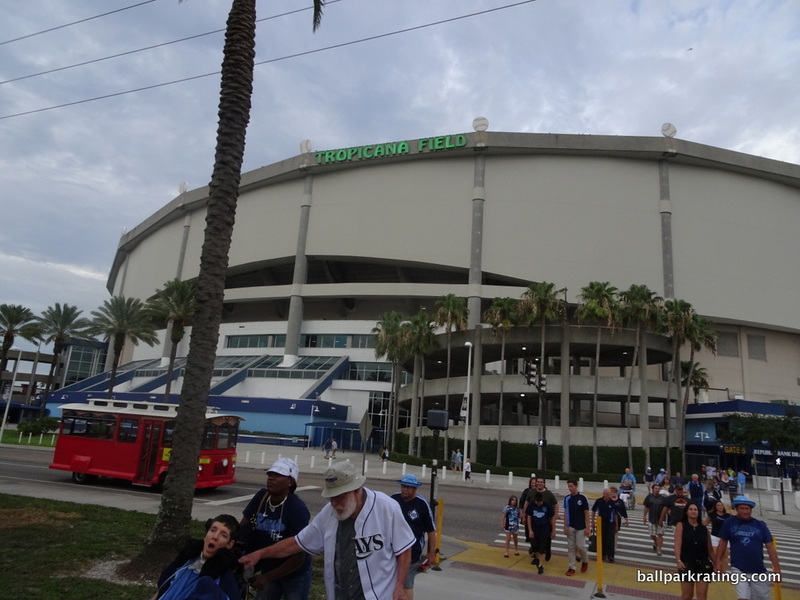 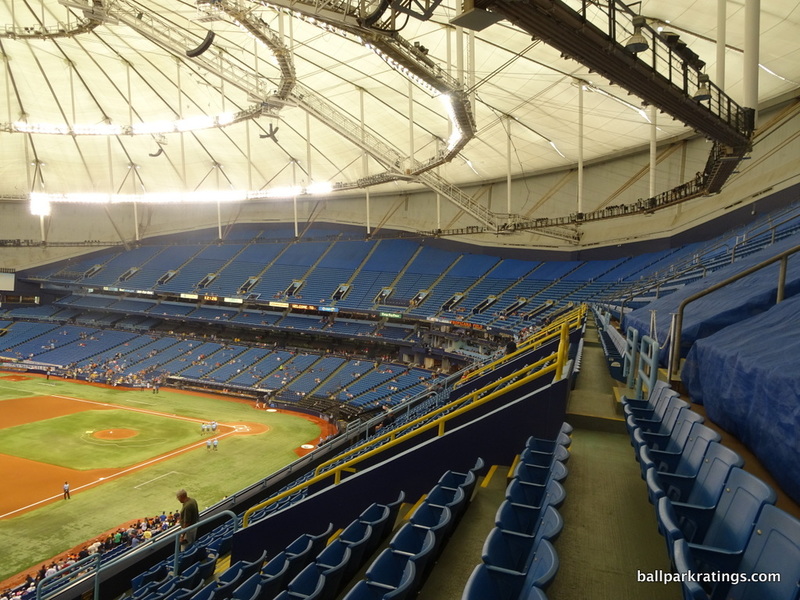 You’re not going to see any sort of comprehensive architectural analysis in this photo essay, because that isn’t what Tropicana Field is about. 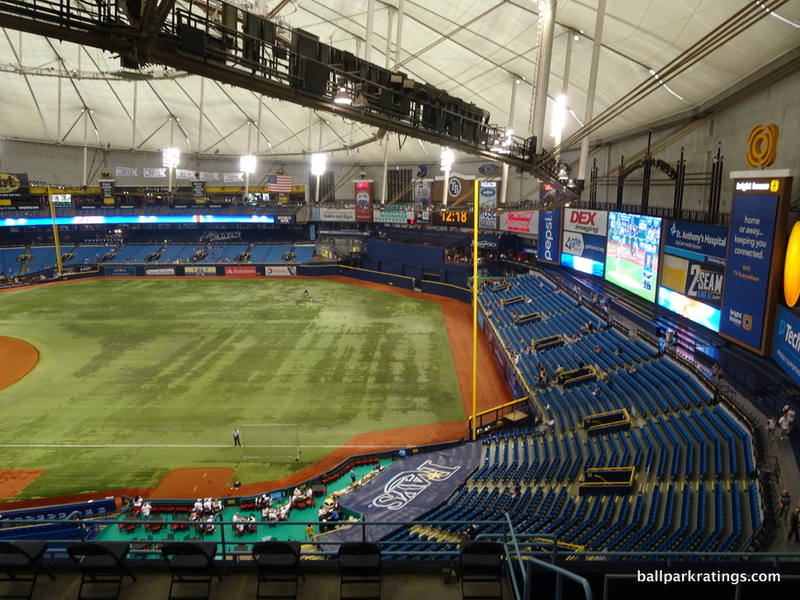 It’s obviously one of the least aesthetically endowed parks in the majors, to the point where it scores below even Rogers Centre, understandable after factoring in the setting. 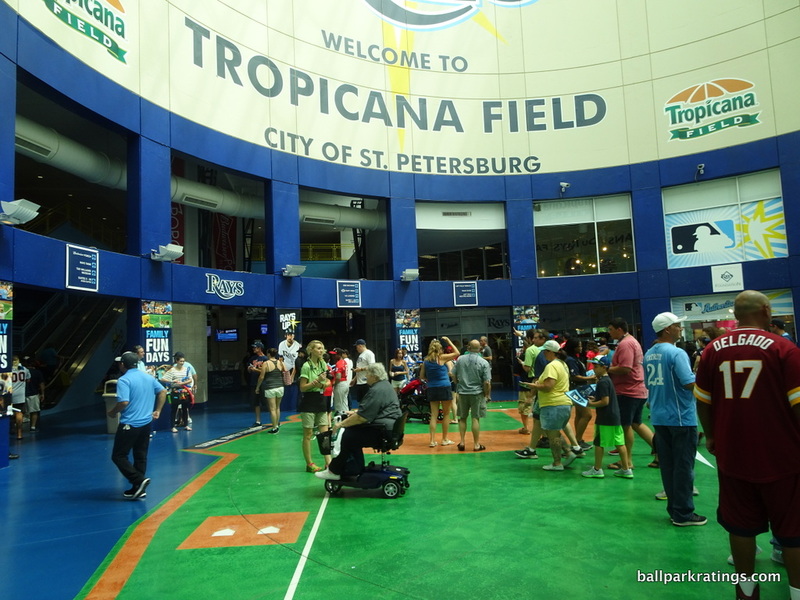 But Tropicana Field is tons of fun! 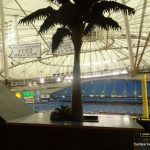 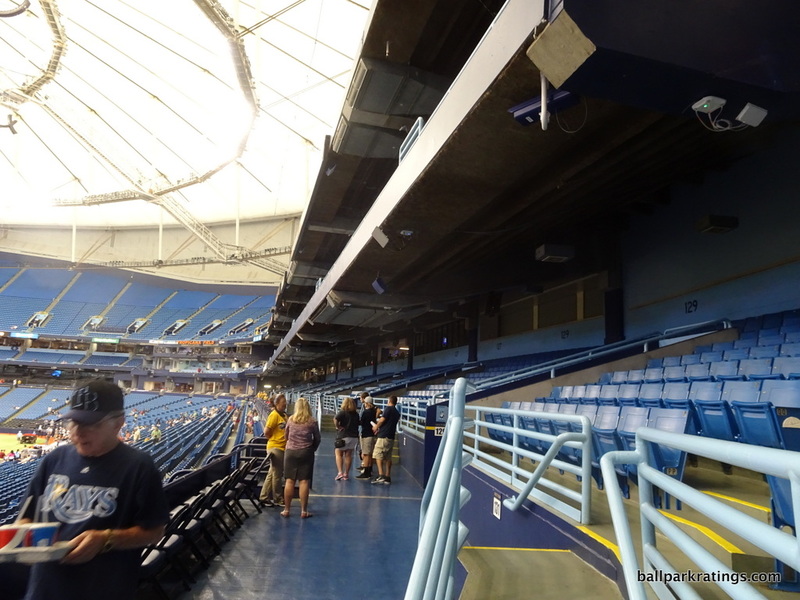 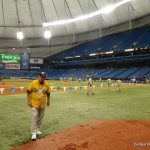 It’s hard to get excited about a stadium like the Oakland Coliseum, but I look forward to returning to Tropicana Field.